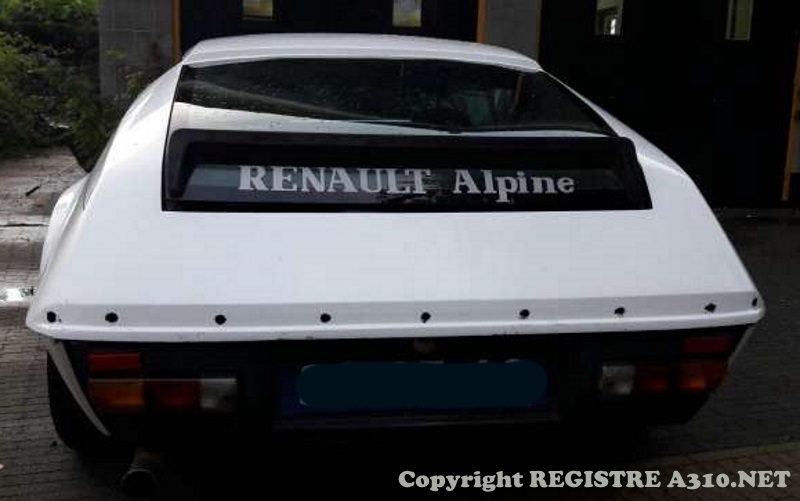 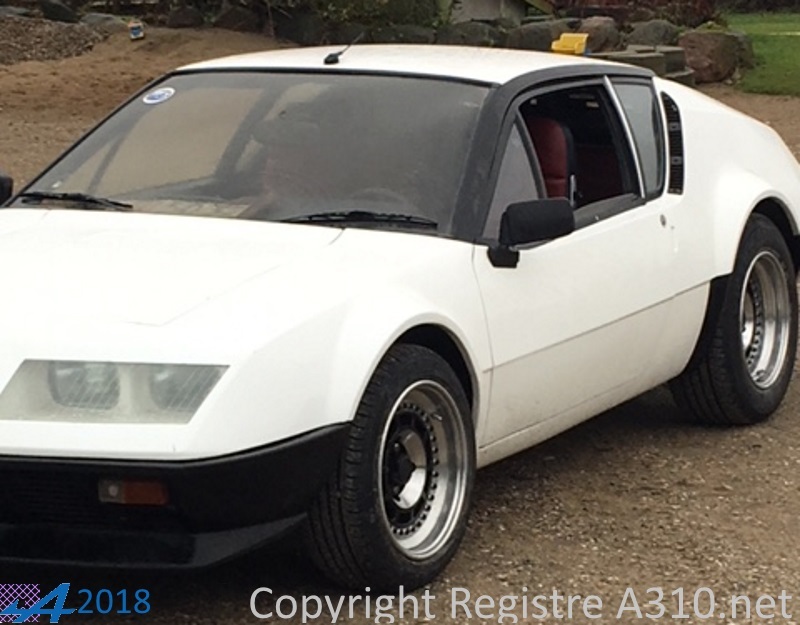 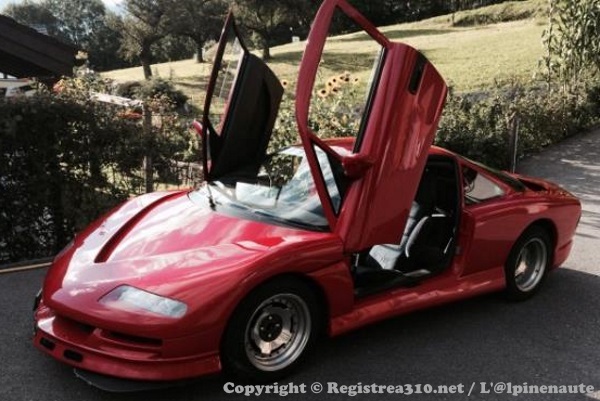 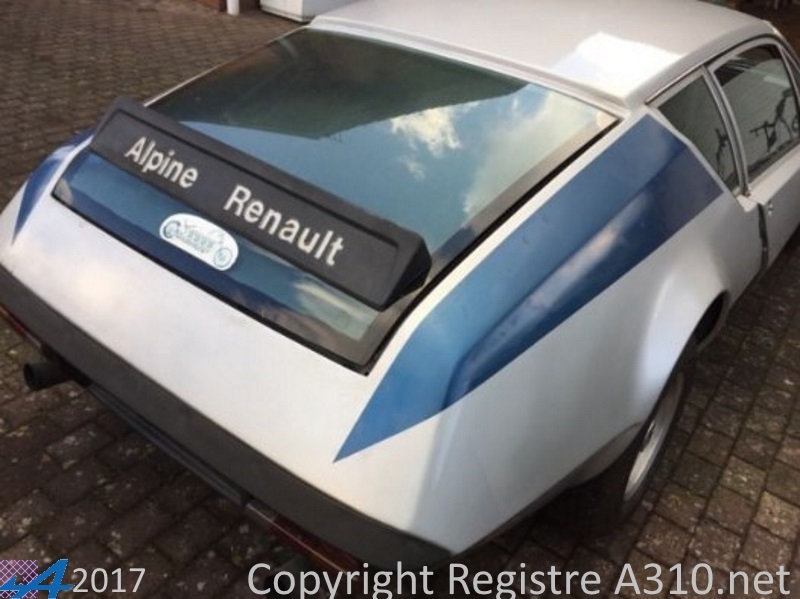 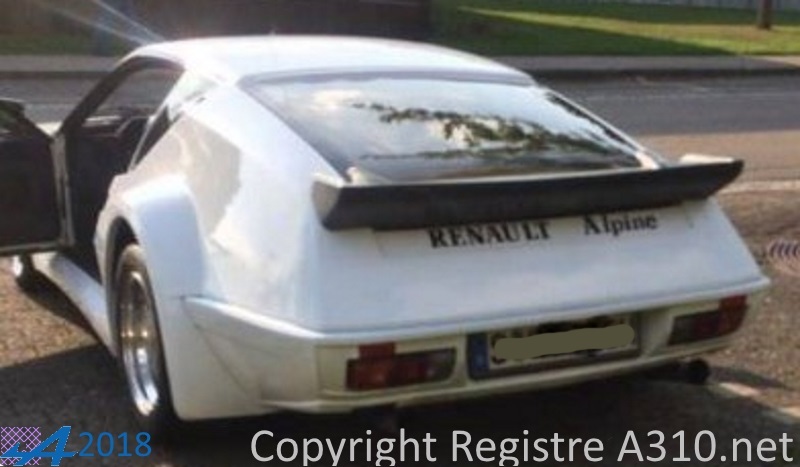 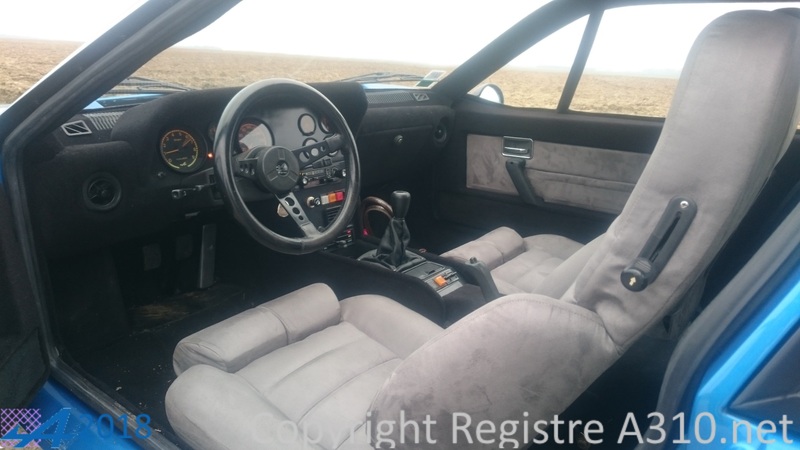 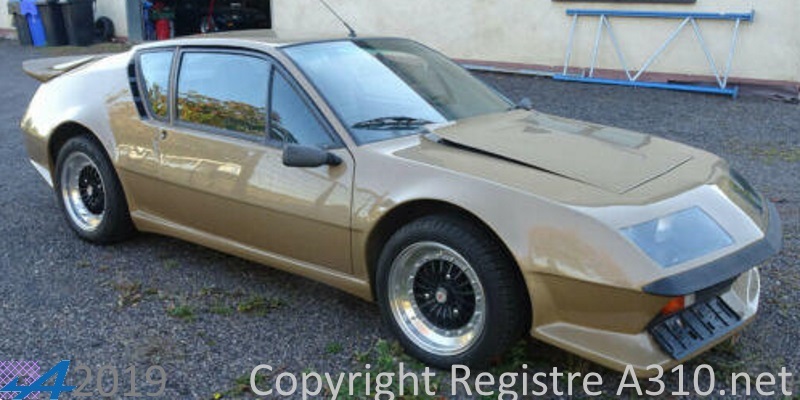 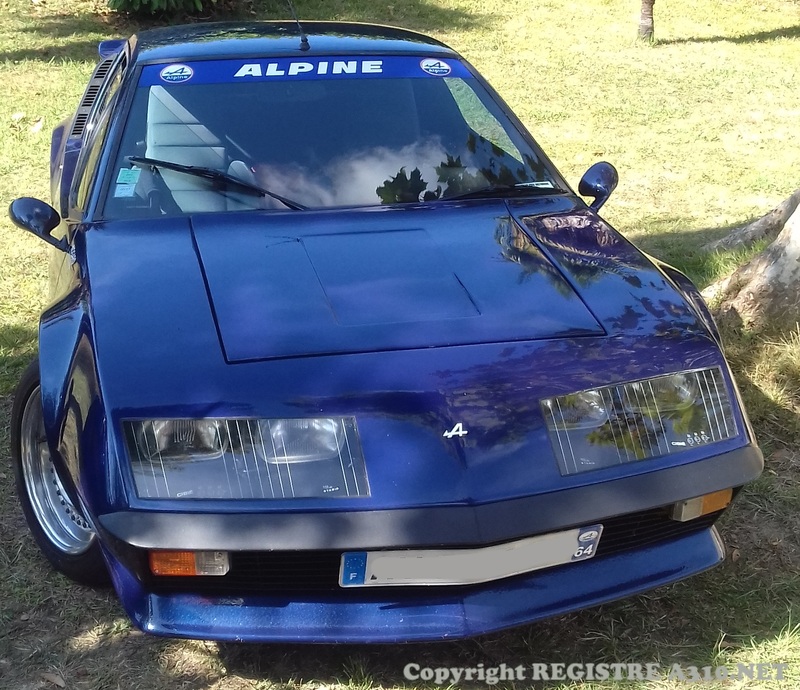 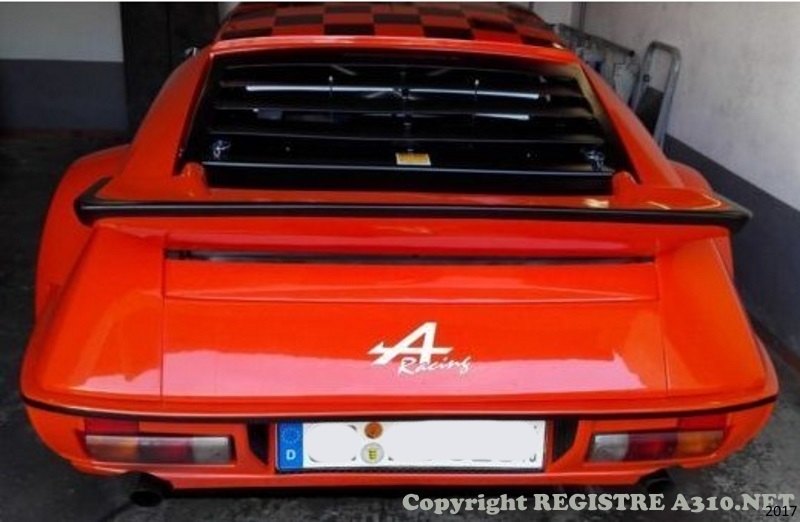 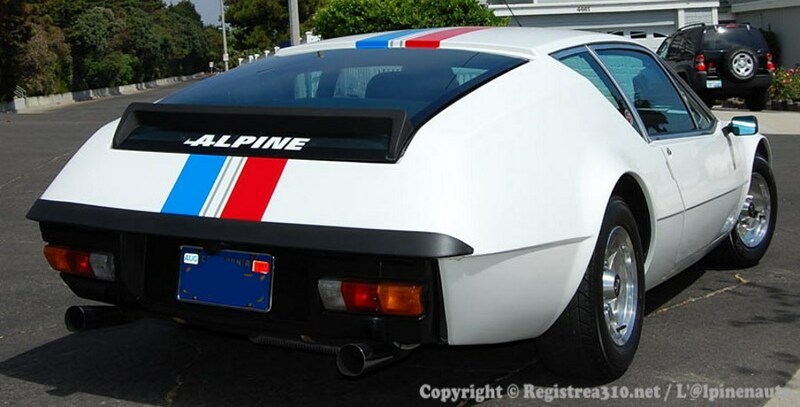 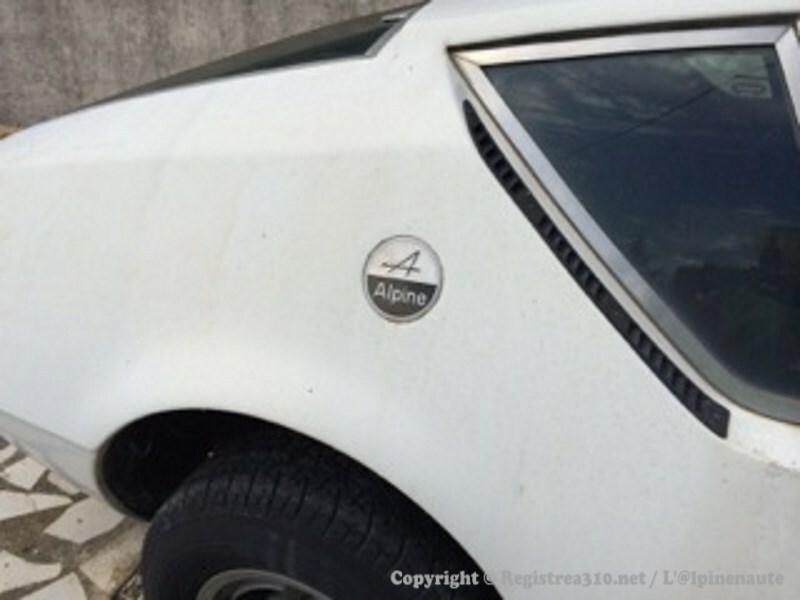 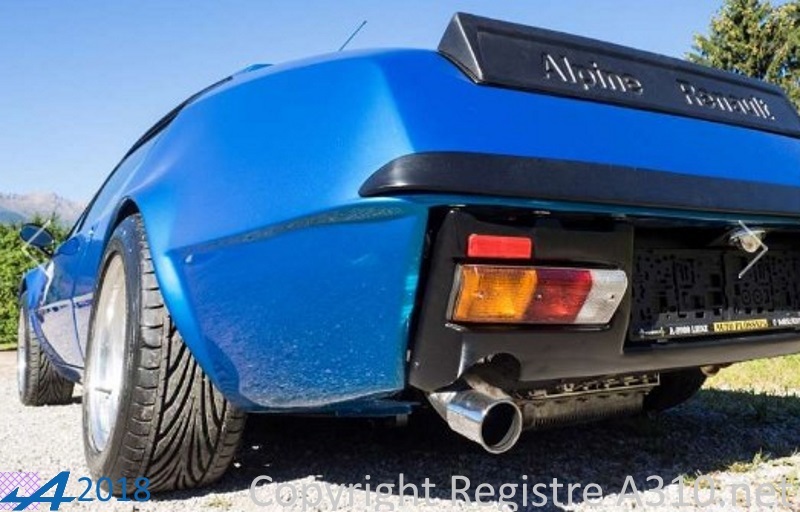 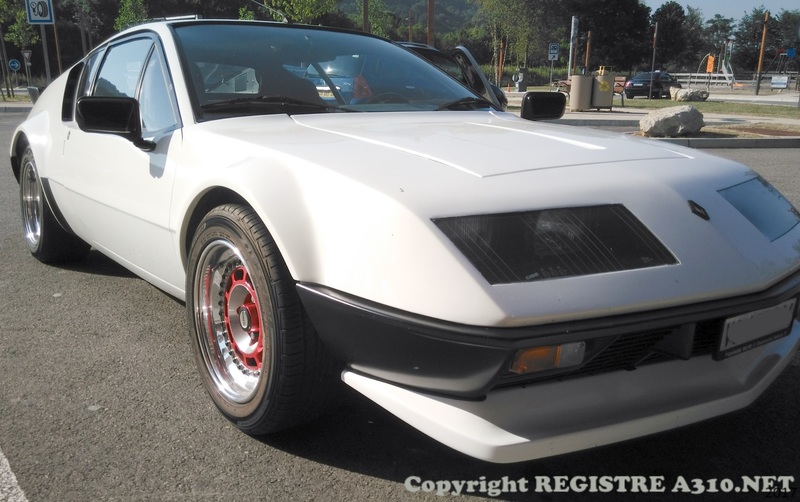 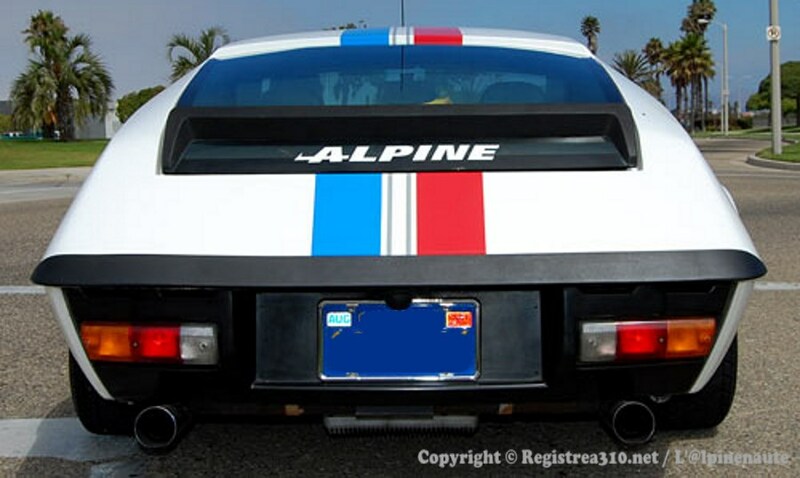 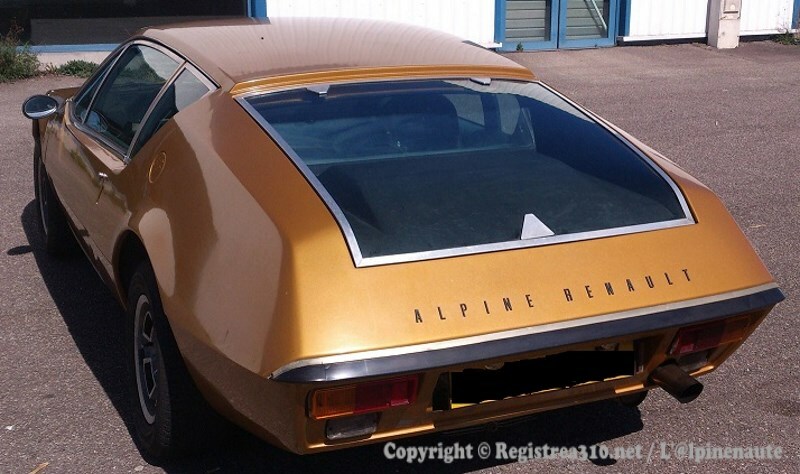 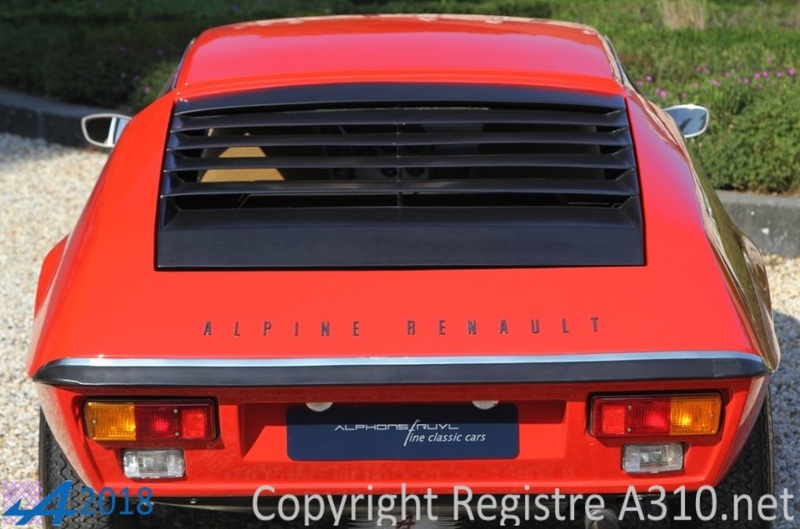 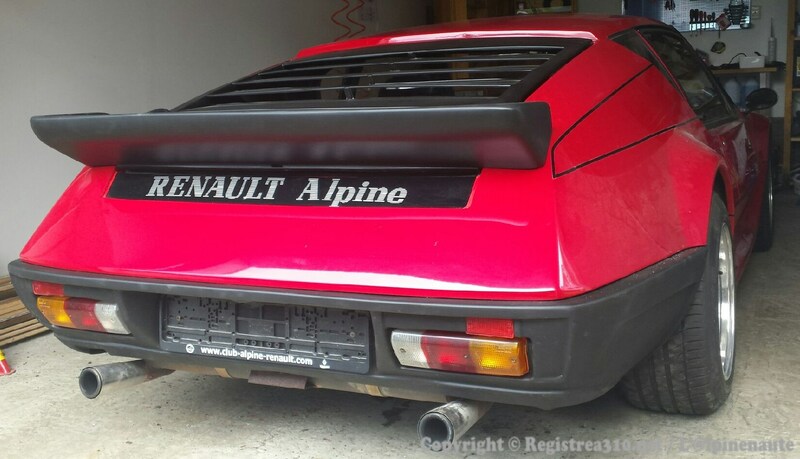 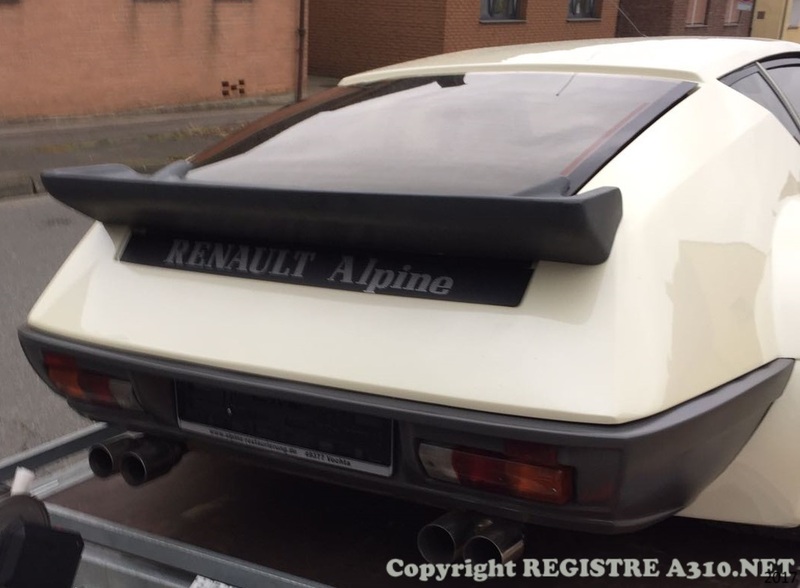 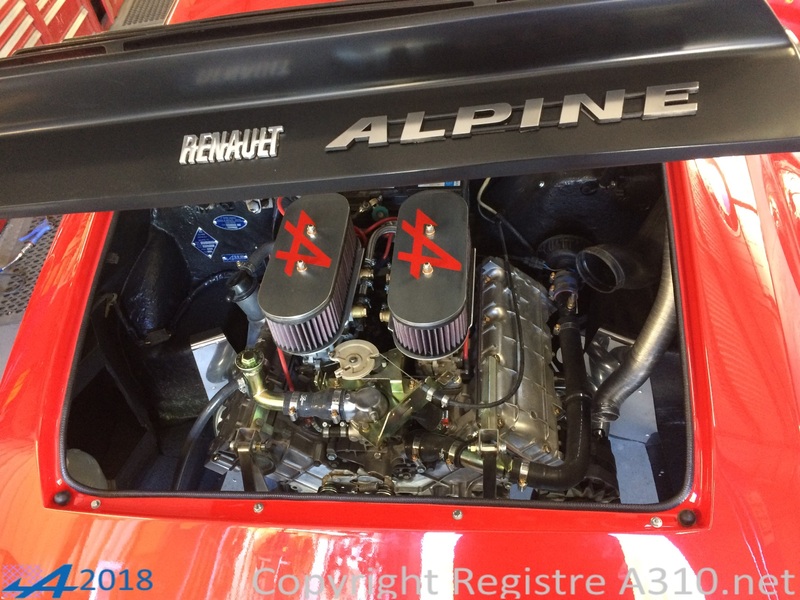 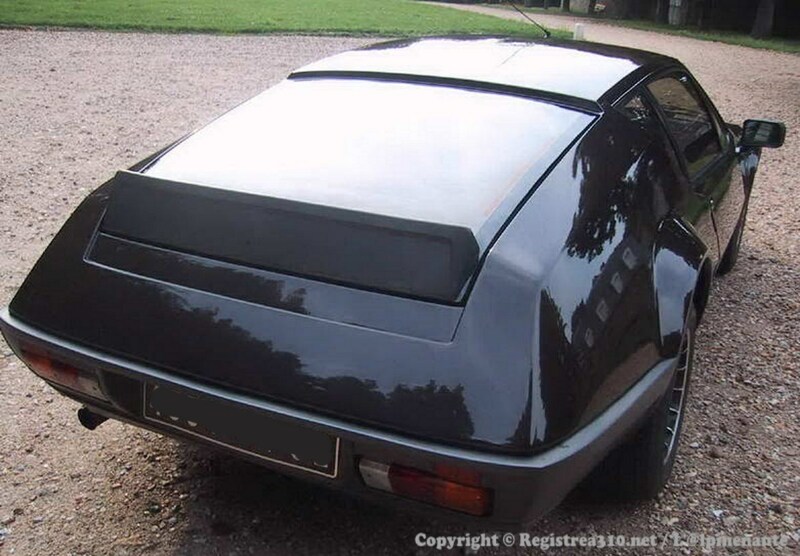 How to register my Alpine? 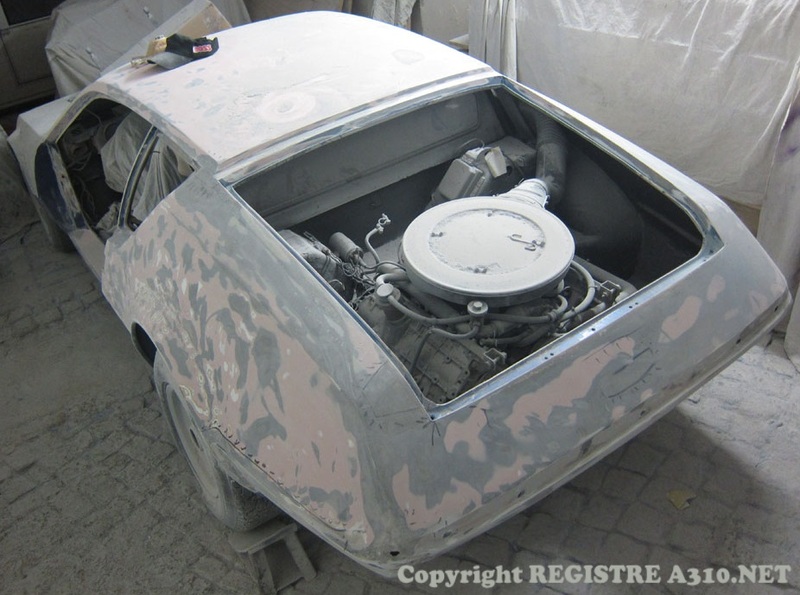 Owner since 1989, first restart 1994, currently being completely restored including paint. 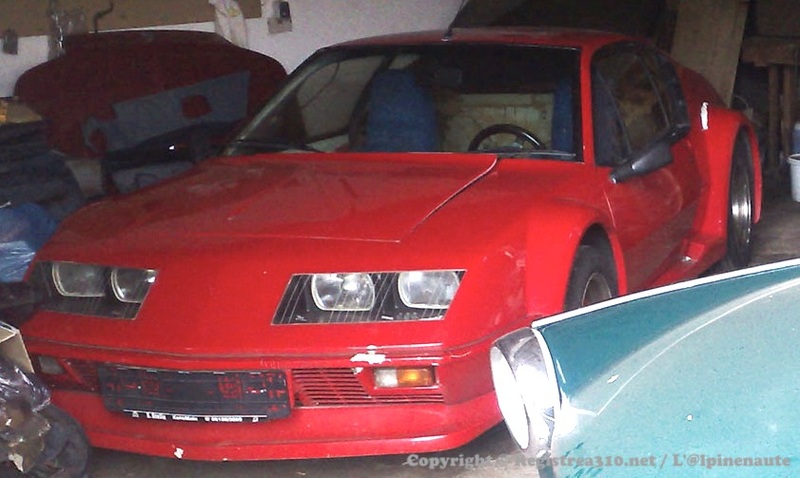 308 1600VE 01.01.1972 red Immobilized since 1990. 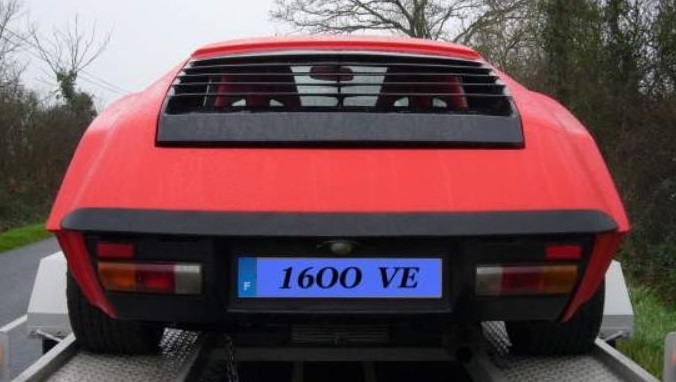 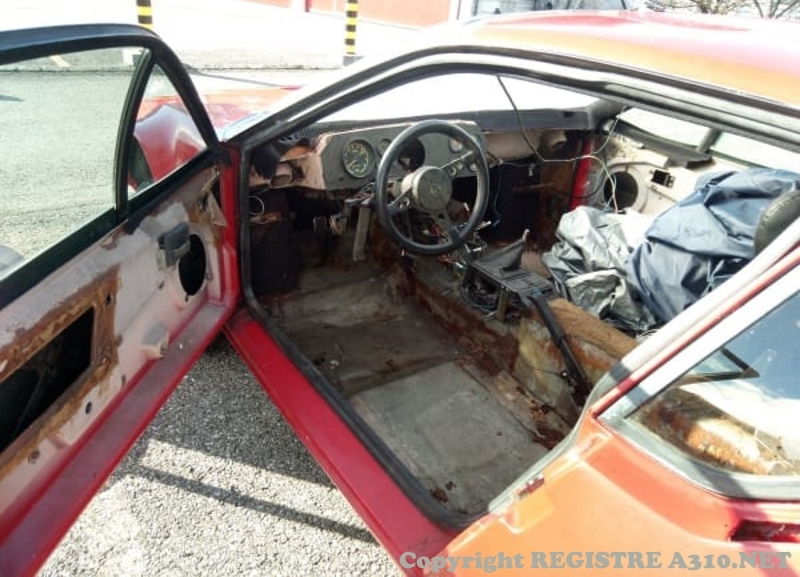 391 1600VE 29.09.1972 331 Red The vehicle was delivered to the German factory driver Dieter Kern in 1972. 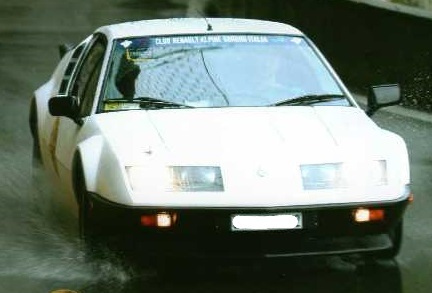 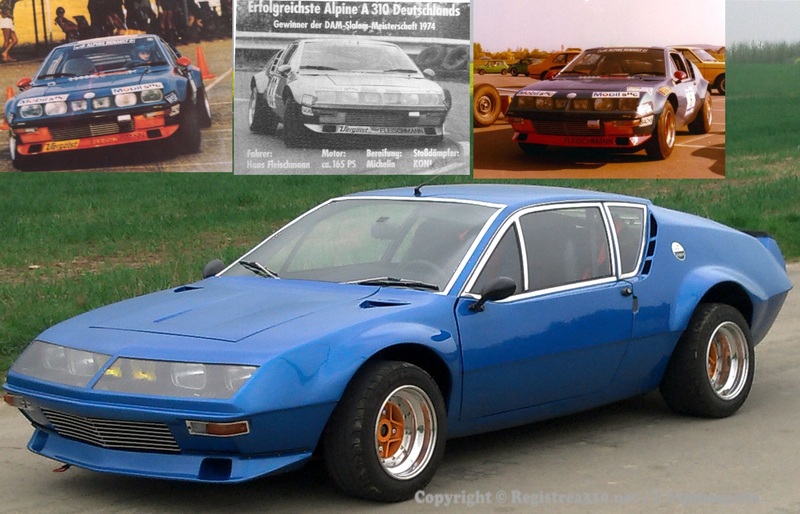 1974 and 1975 the vehicle was successfully Hans Fleischmann used in the slalom. 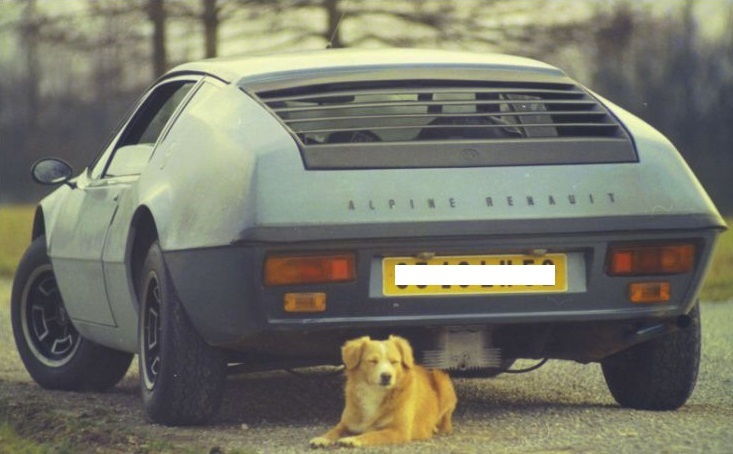 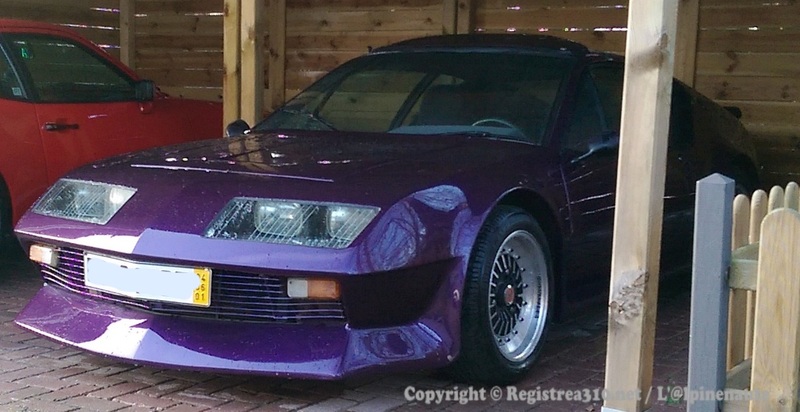 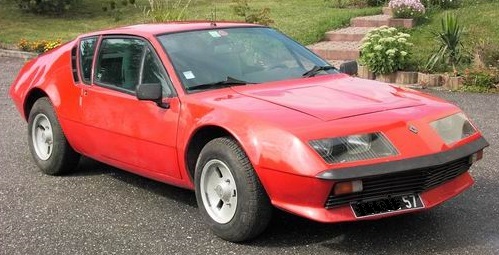 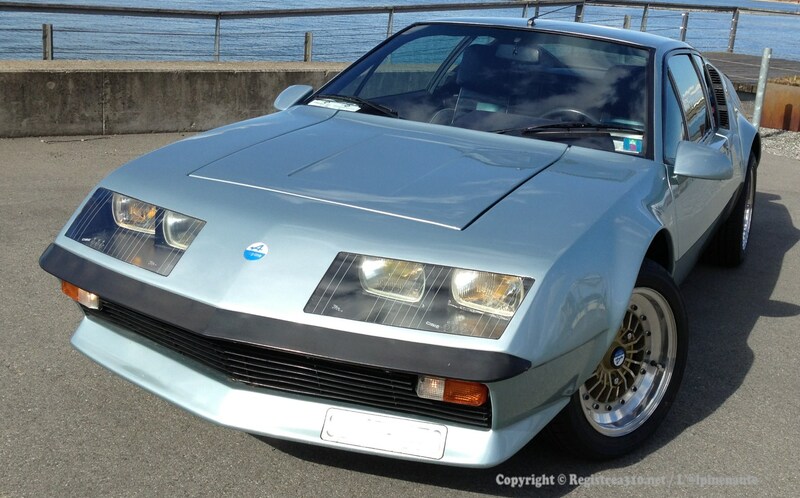 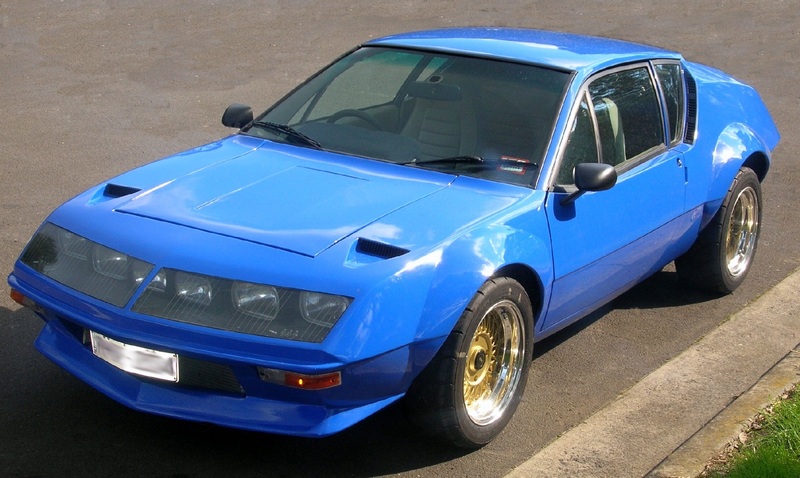 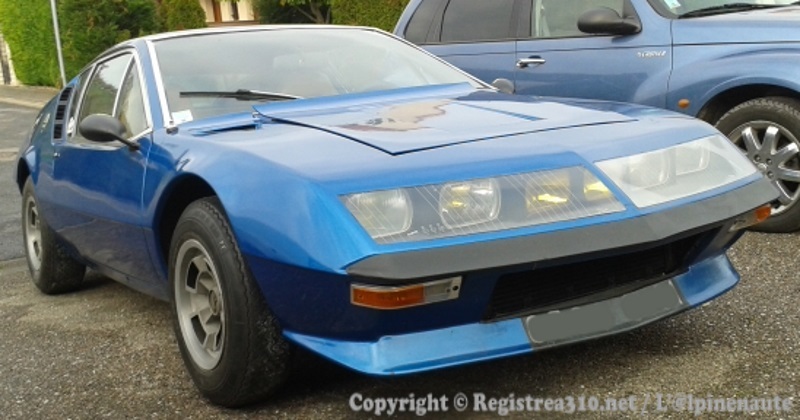 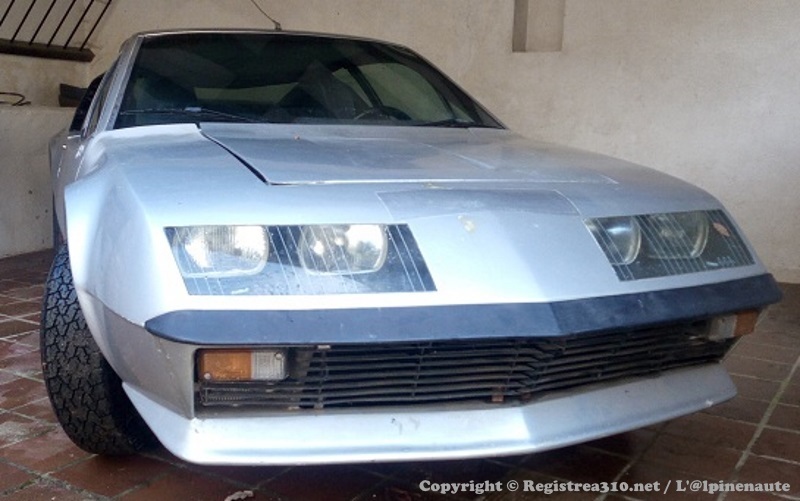 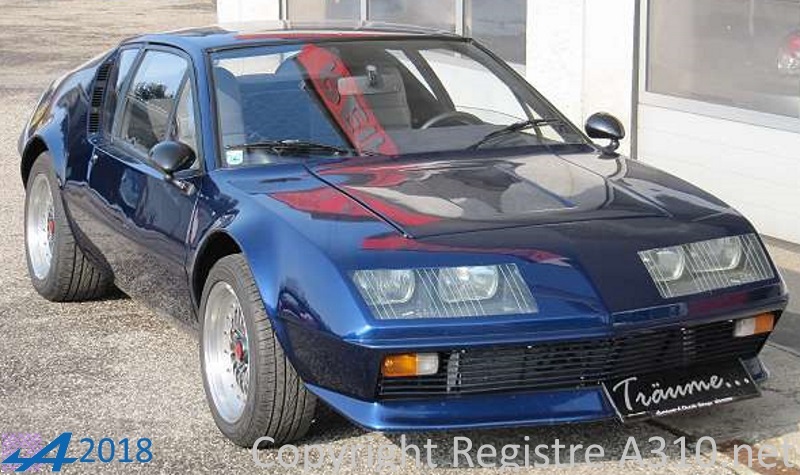 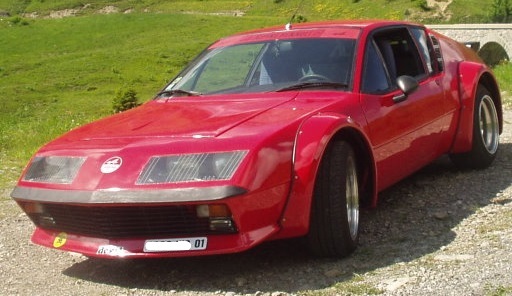 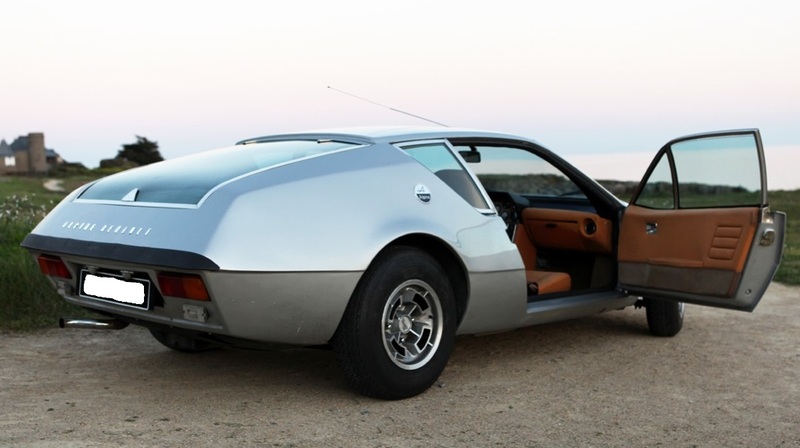 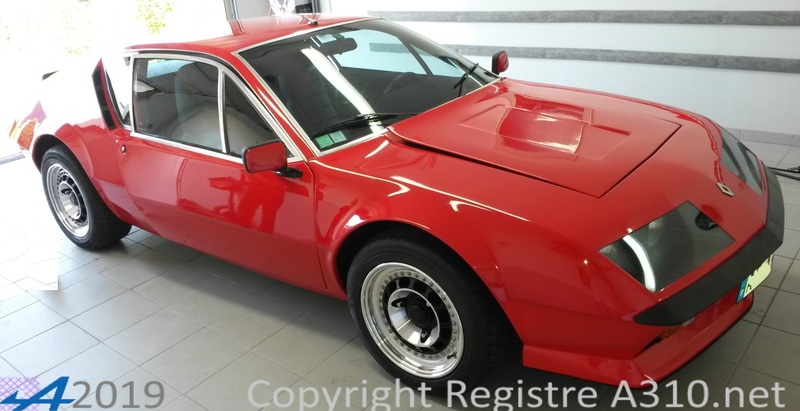 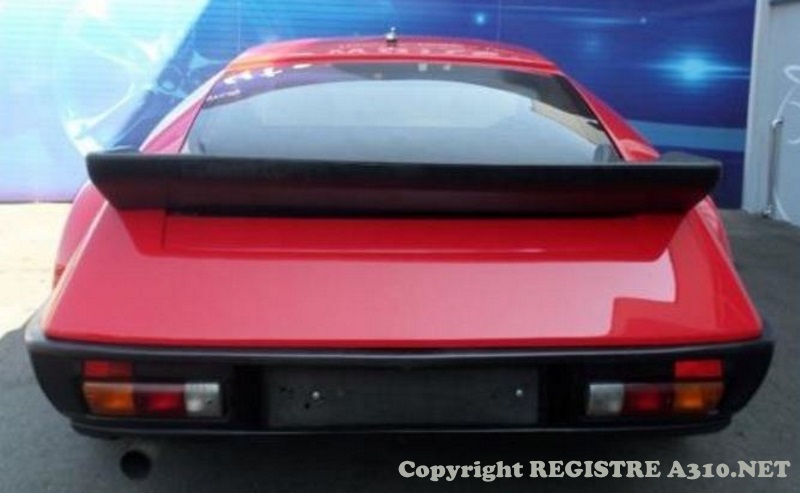 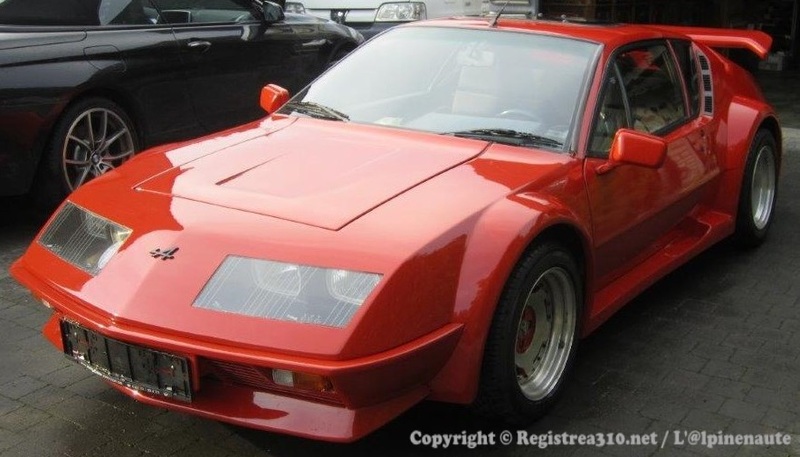 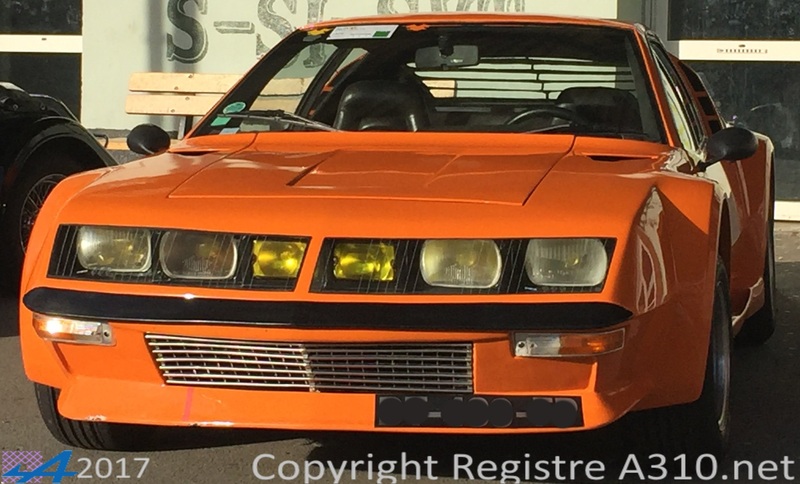 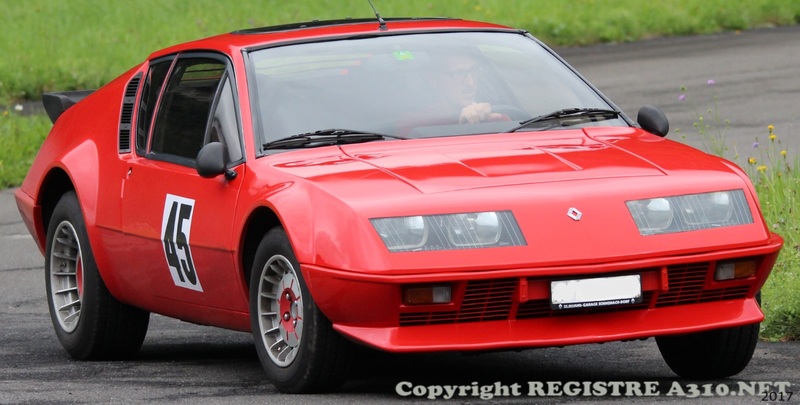 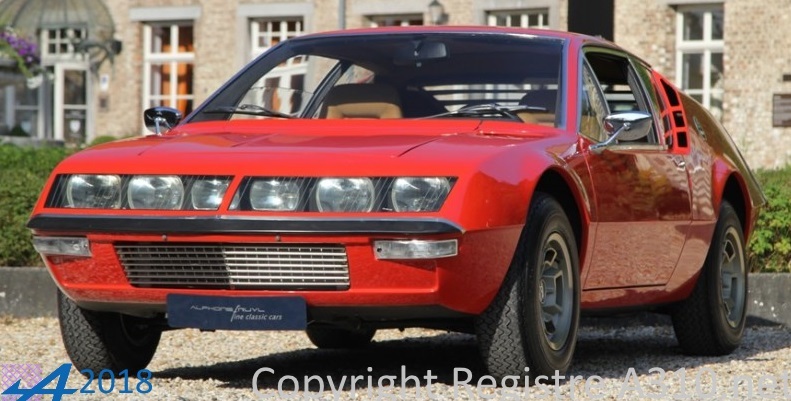 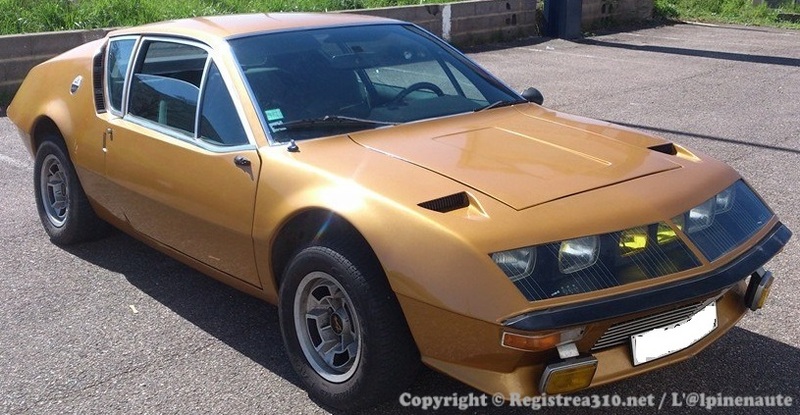 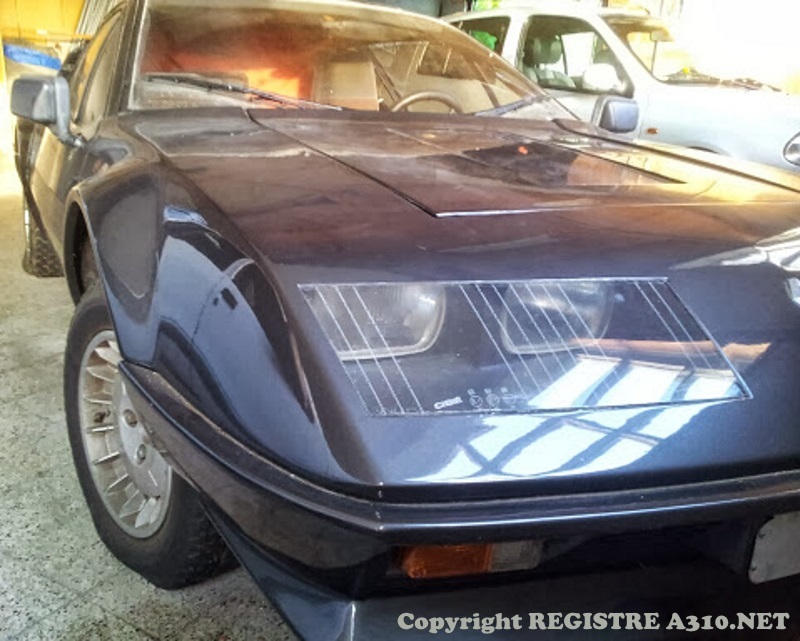 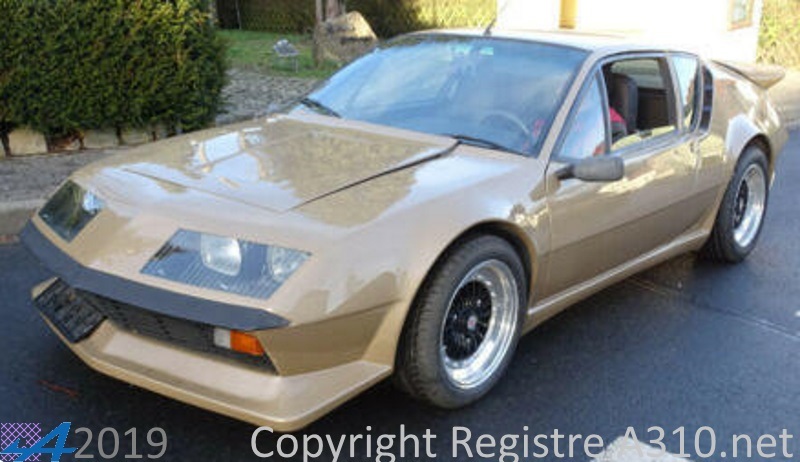 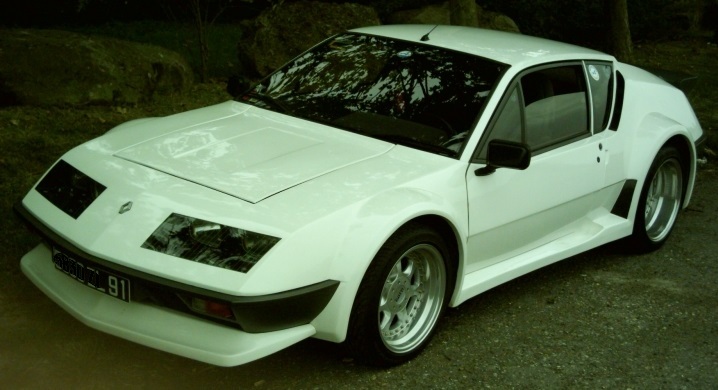 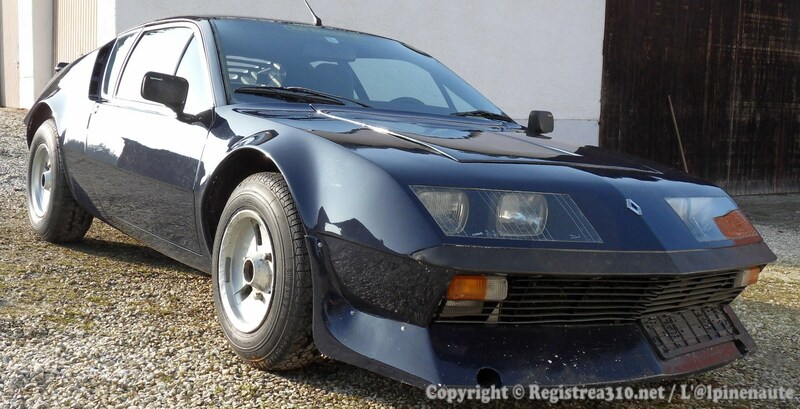 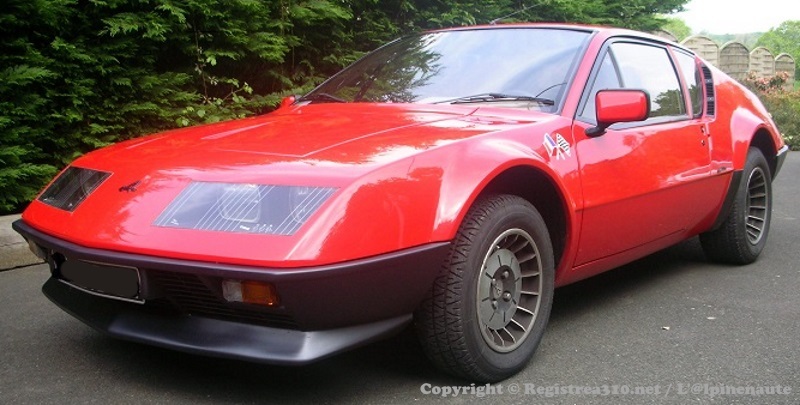 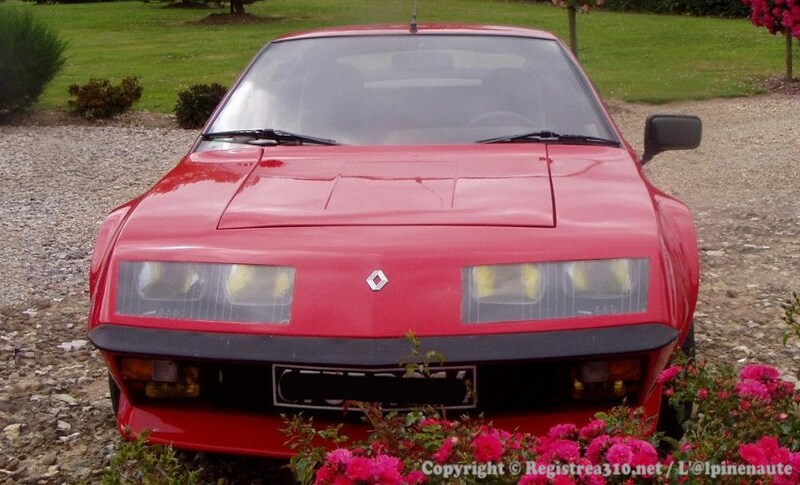 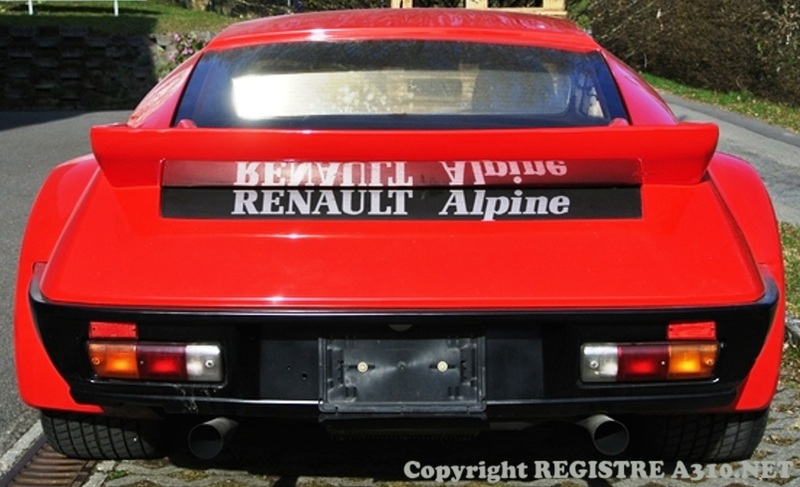 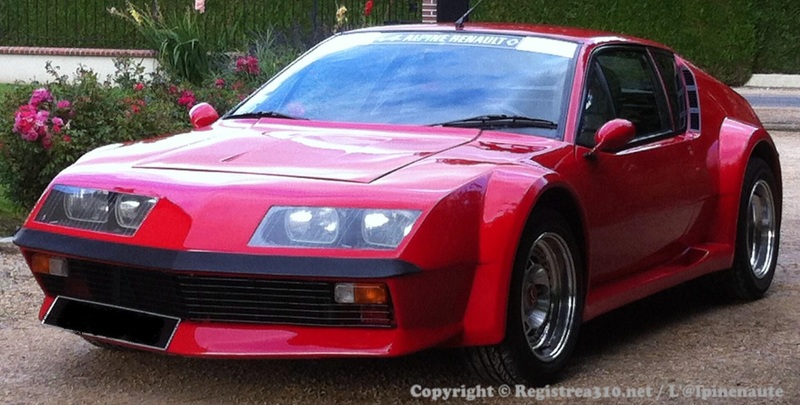 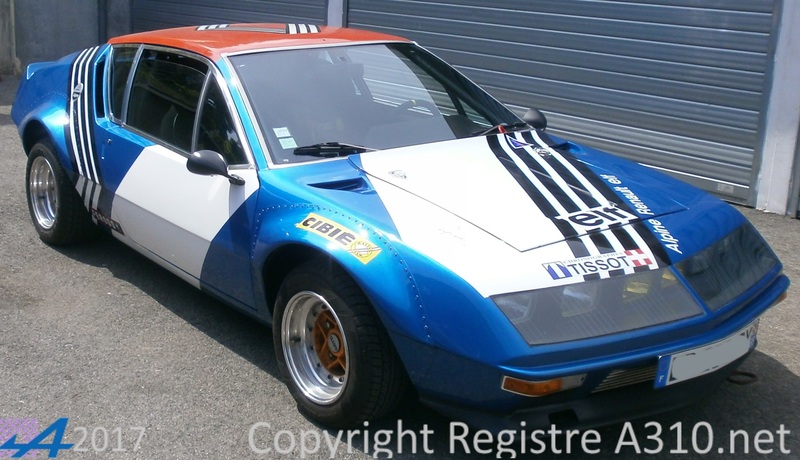 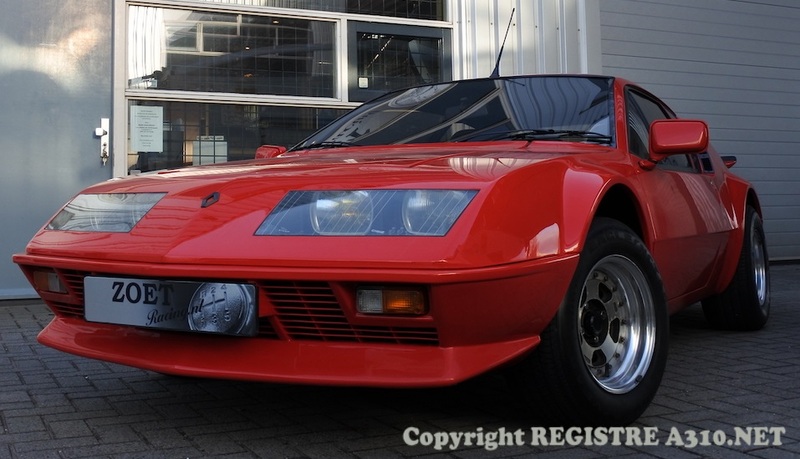 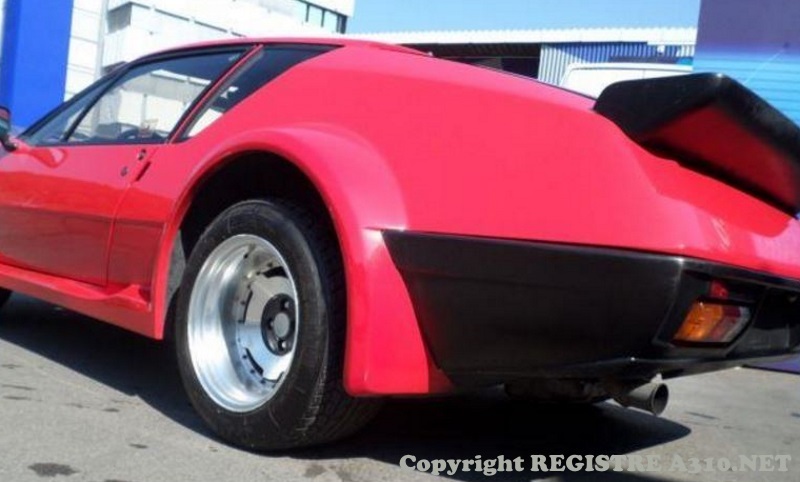 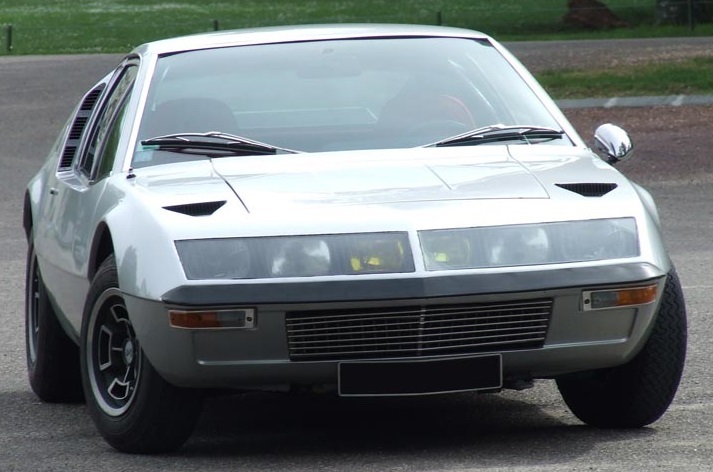 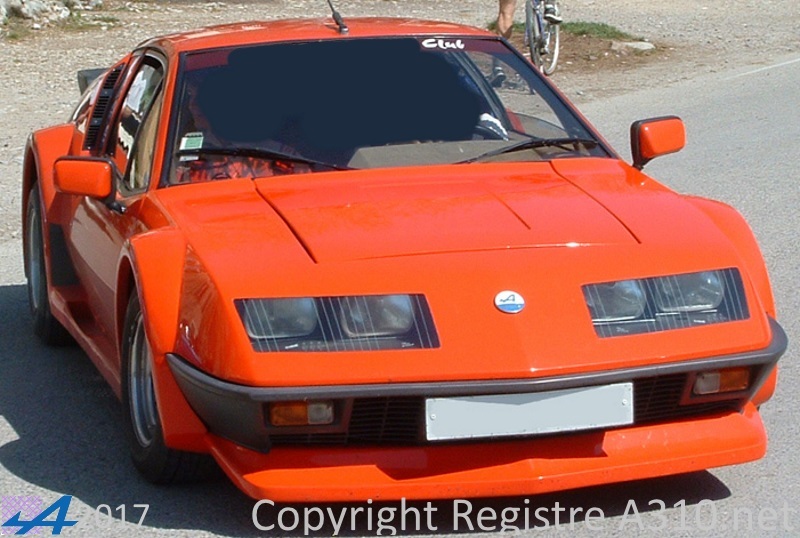 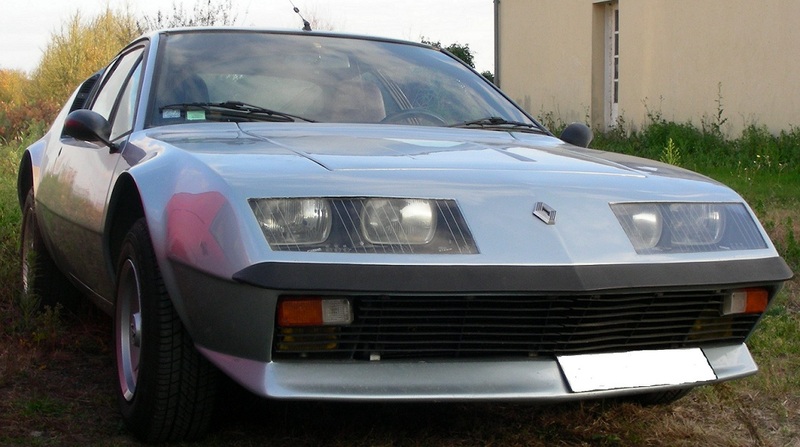 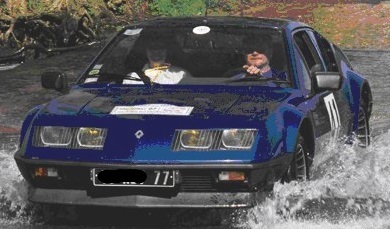 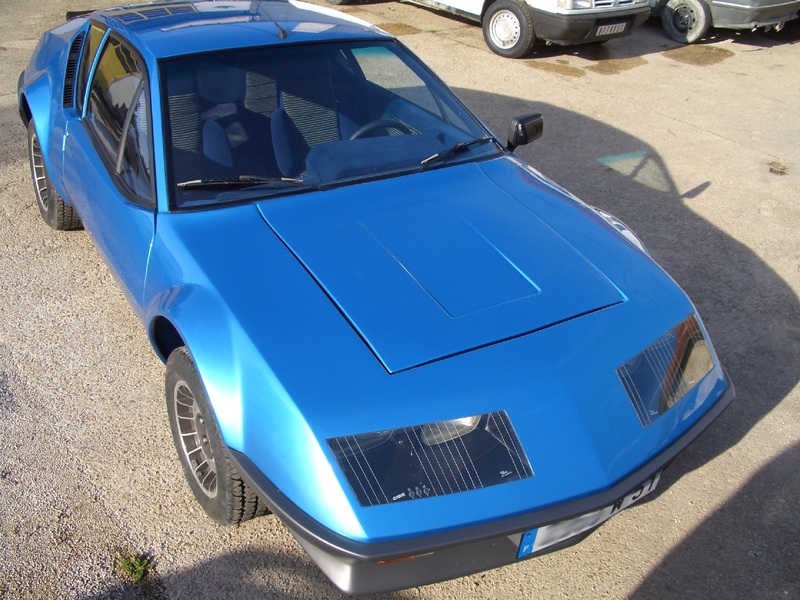 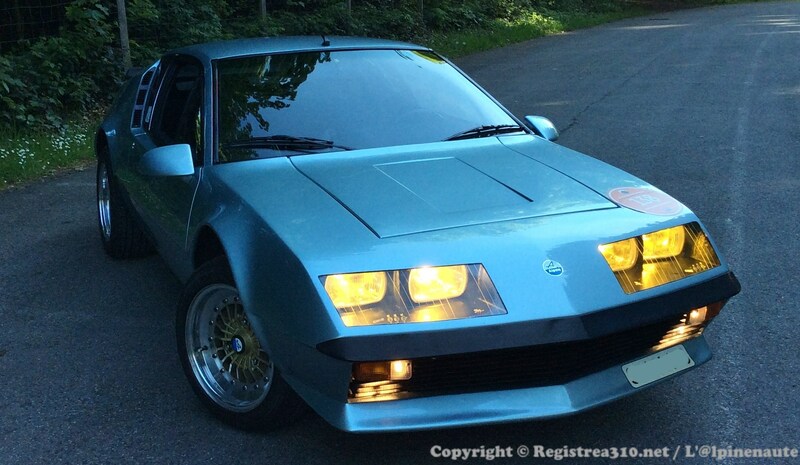 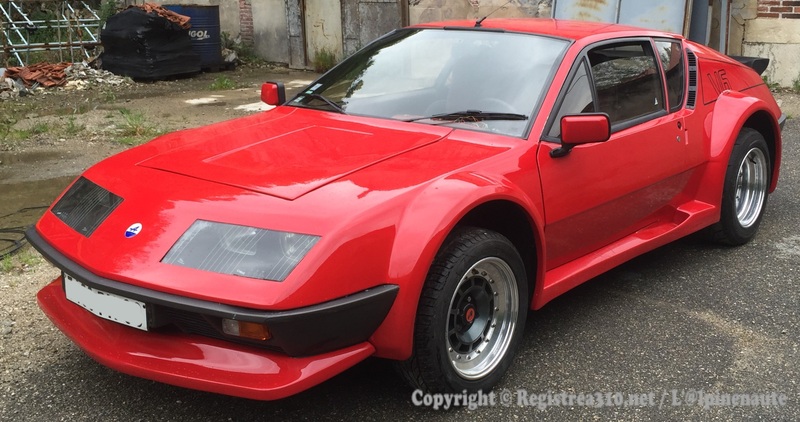 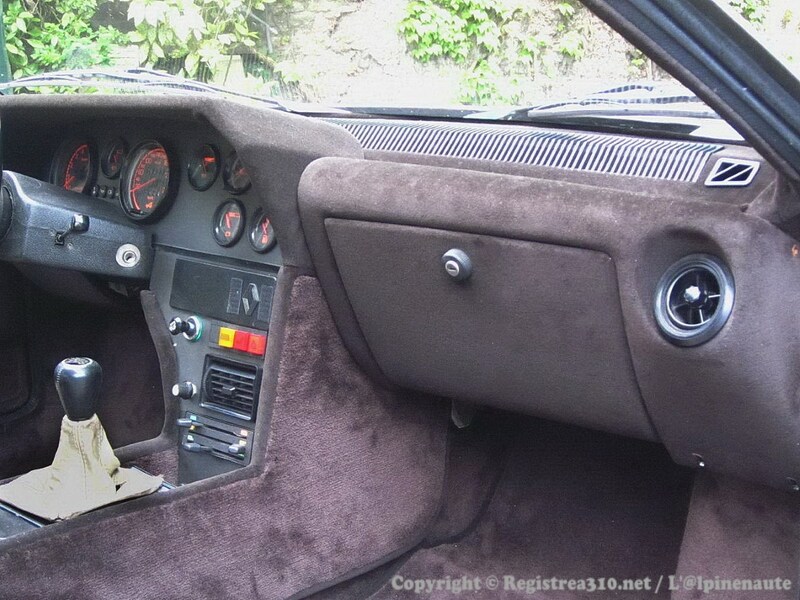 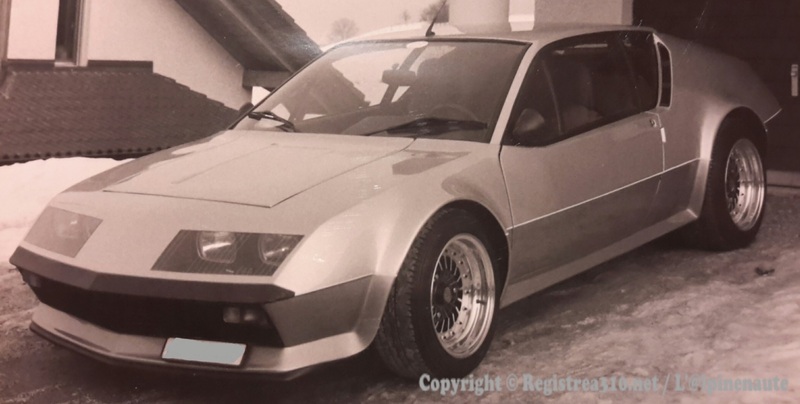 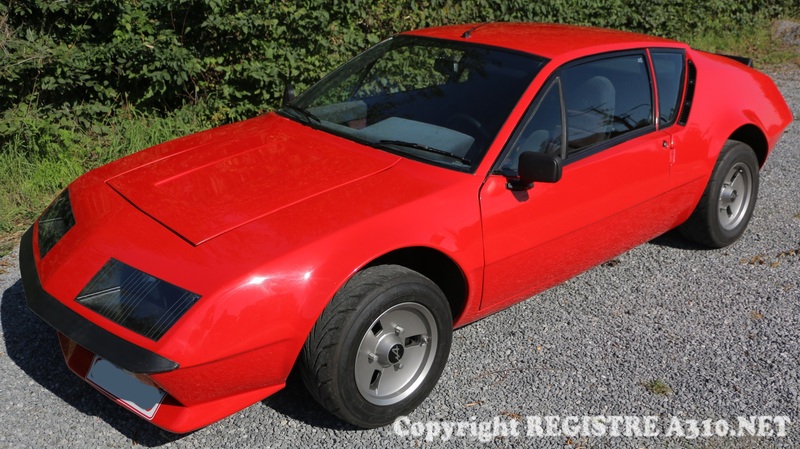 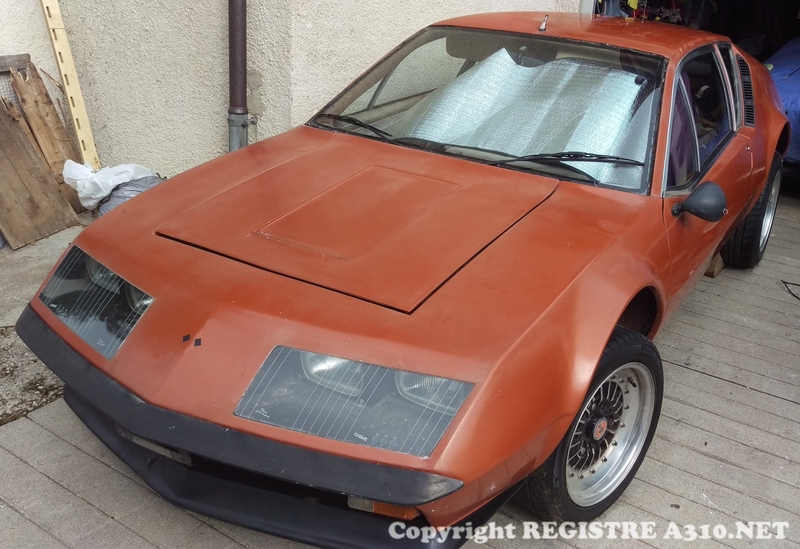 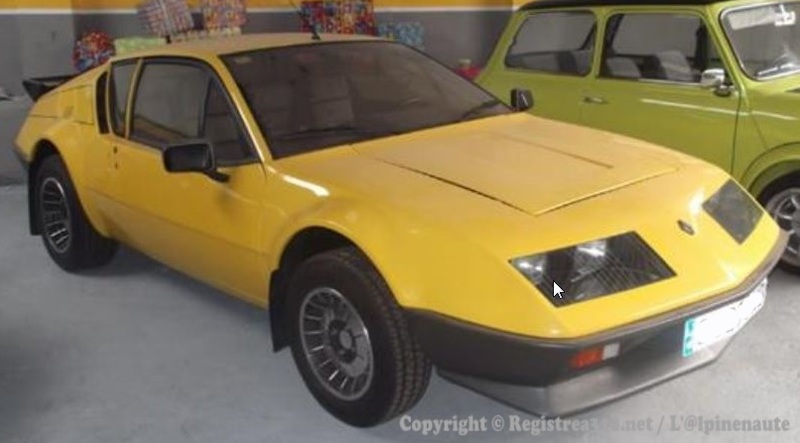 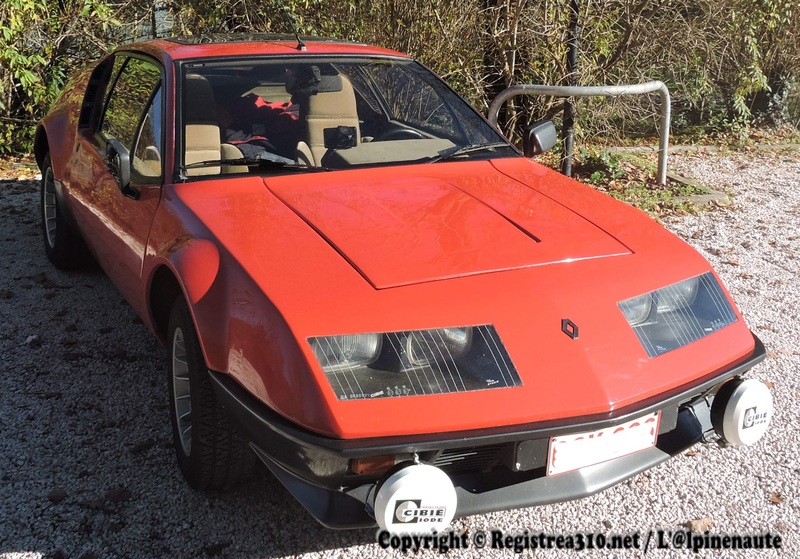 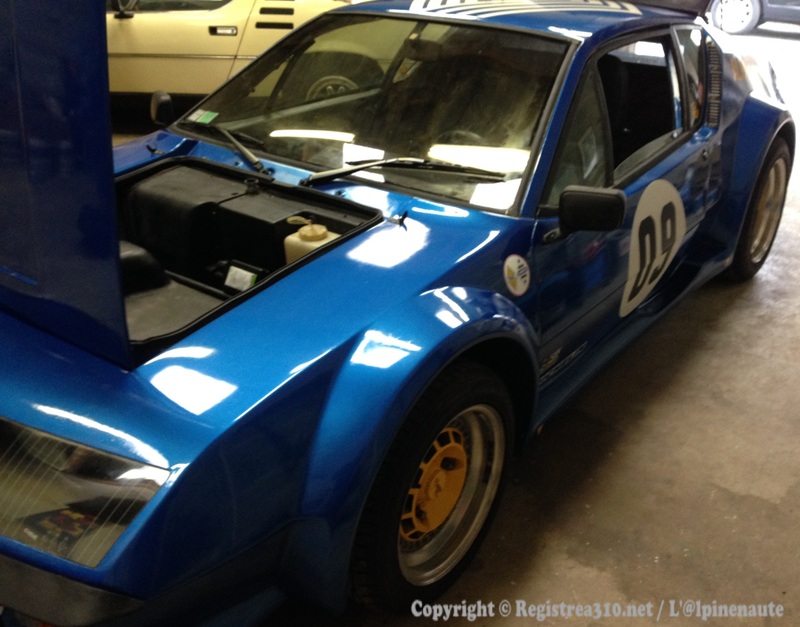 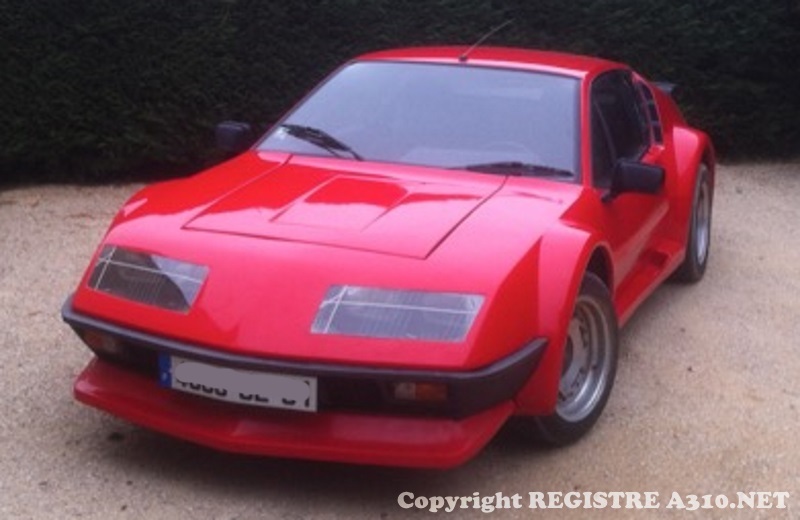 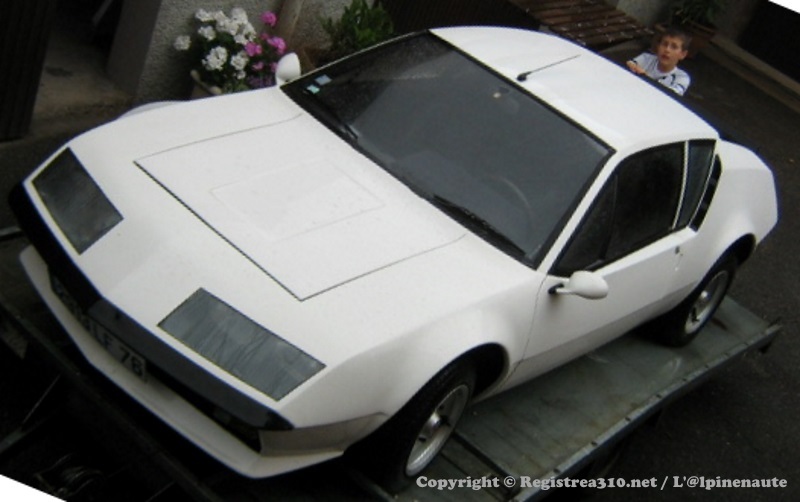 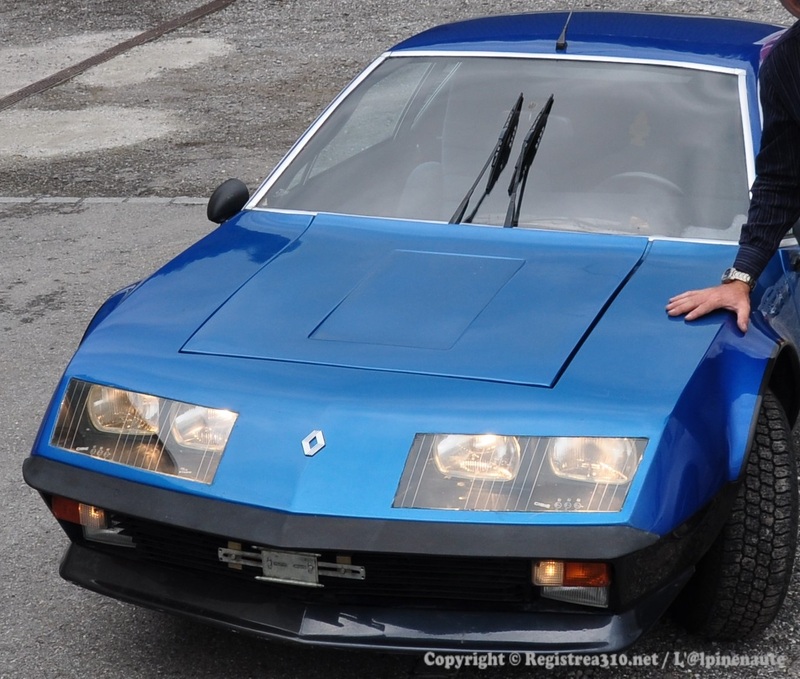 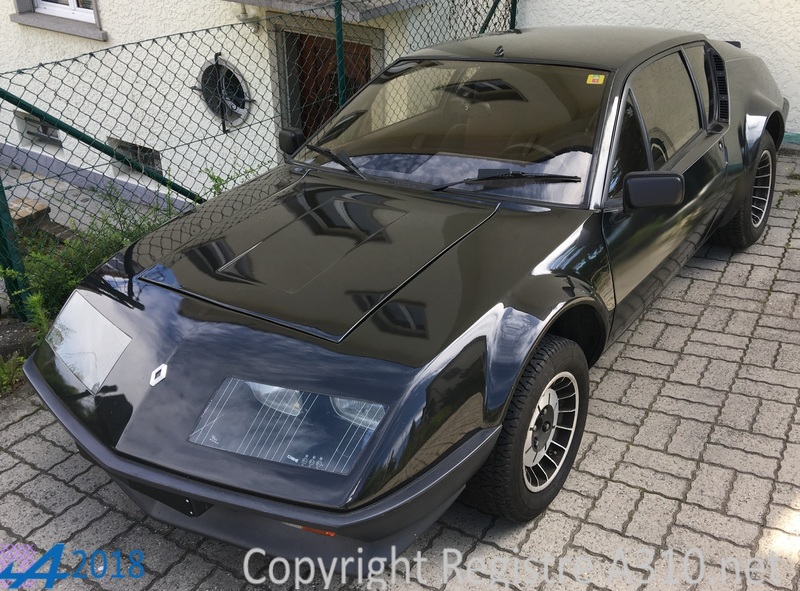 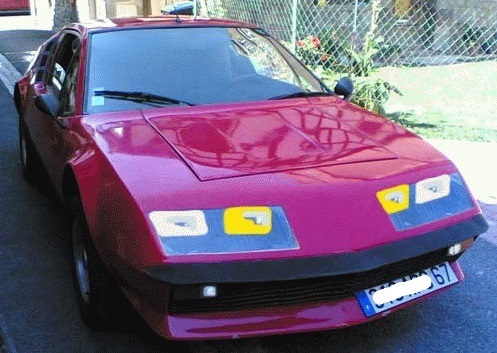 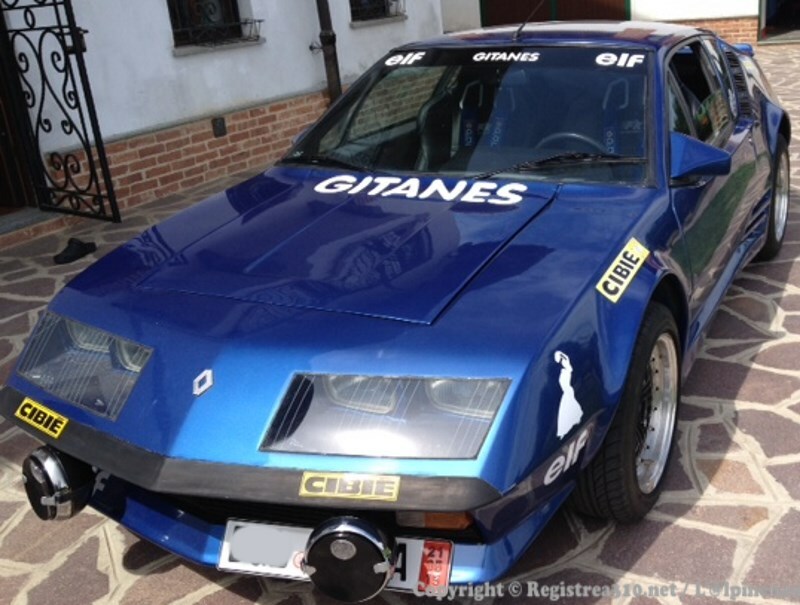 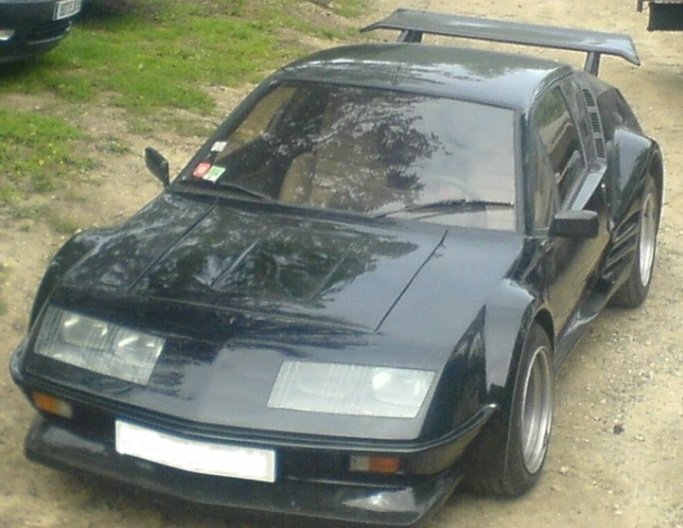 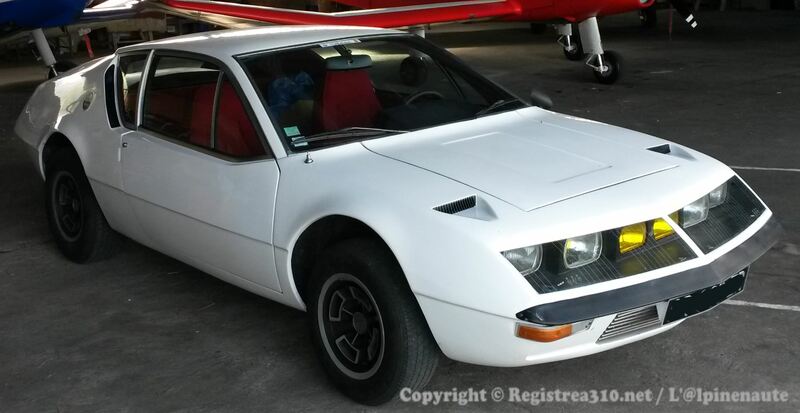 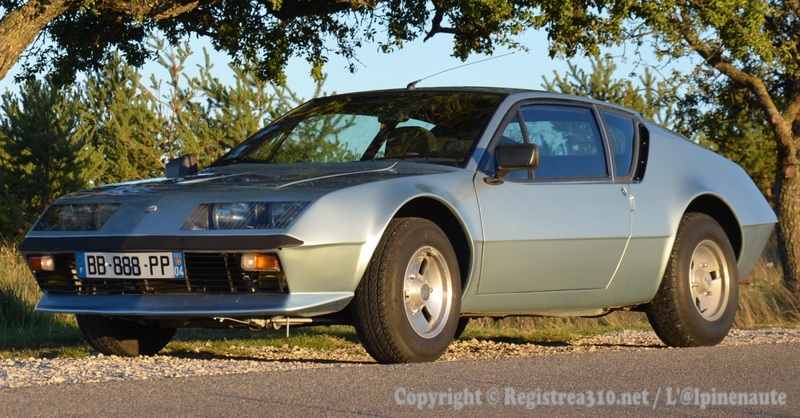 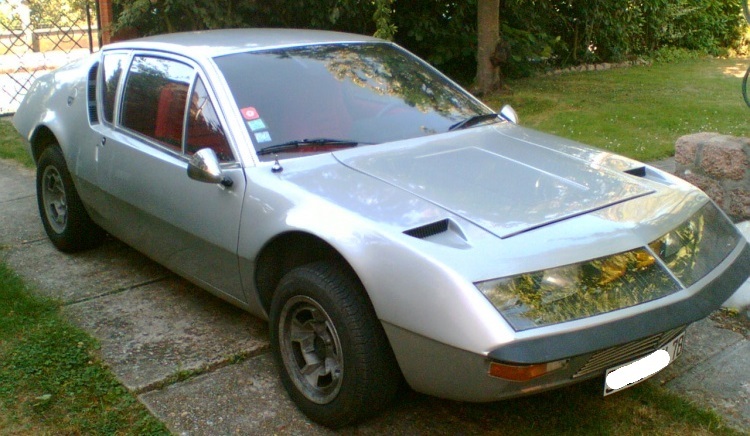 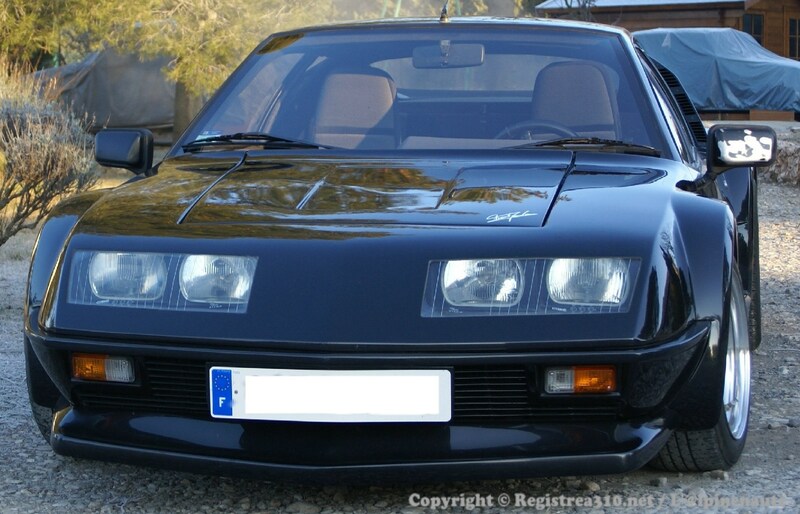 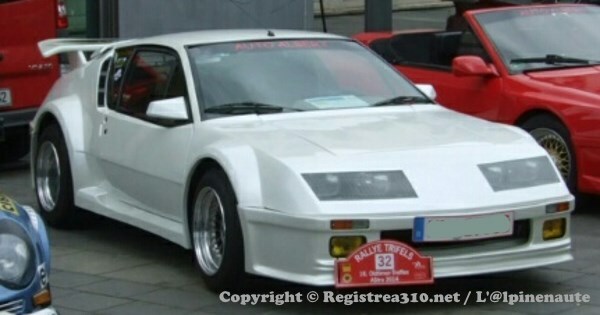 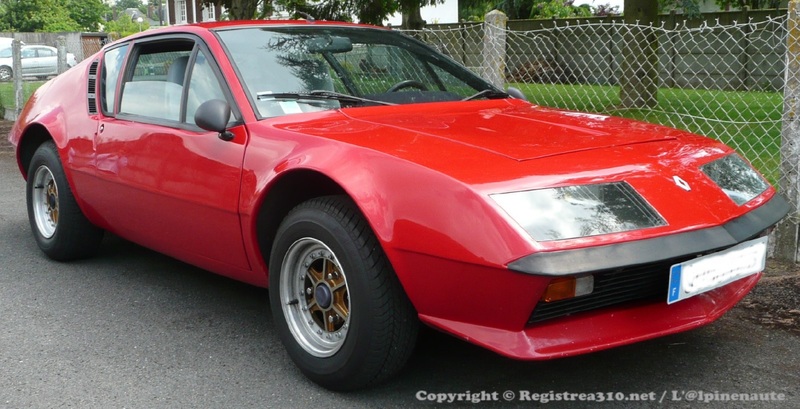 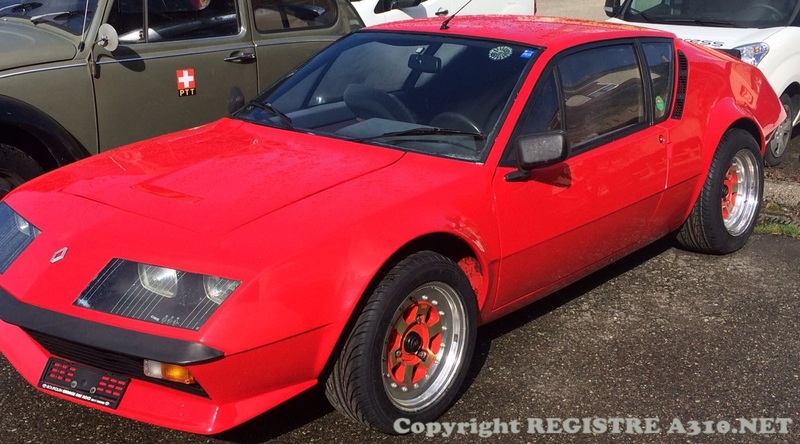 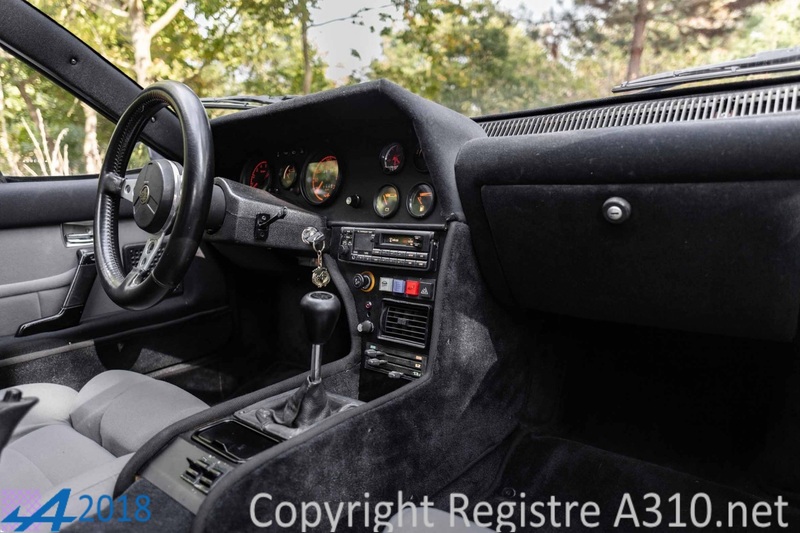 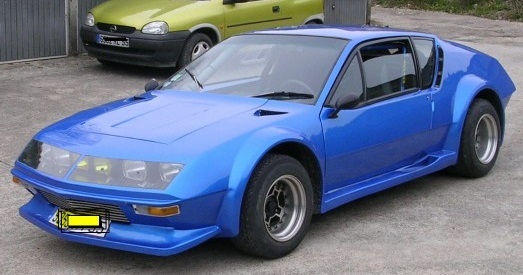 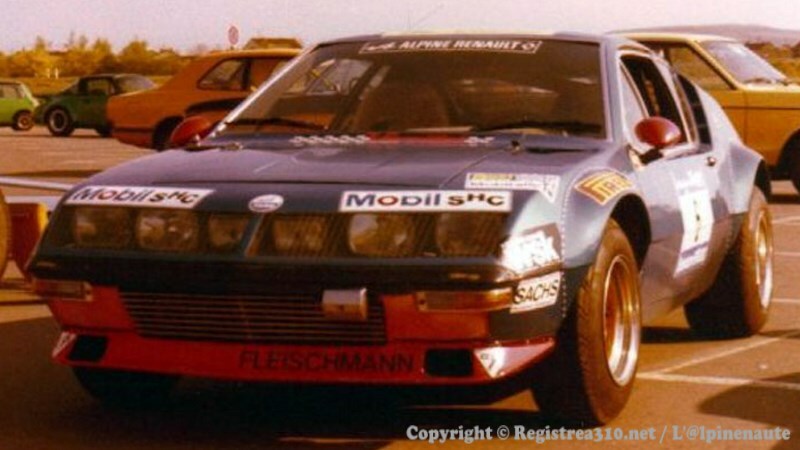 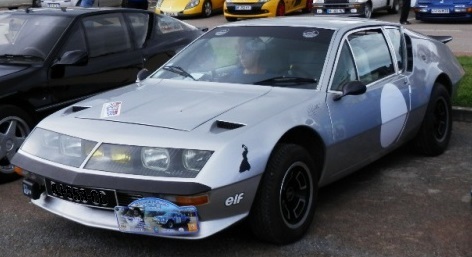 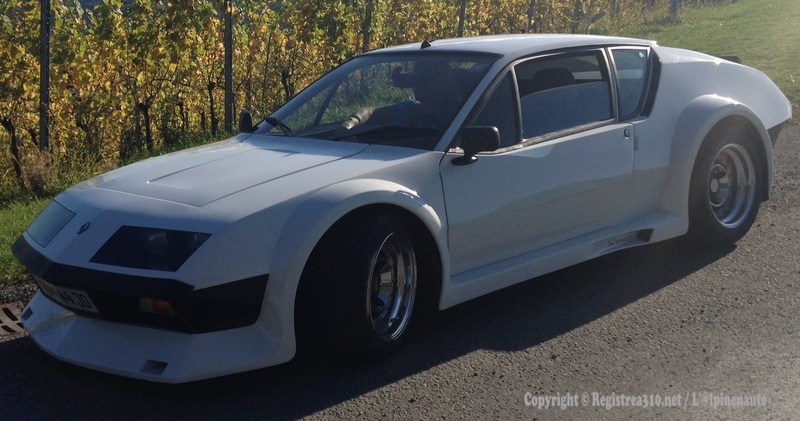 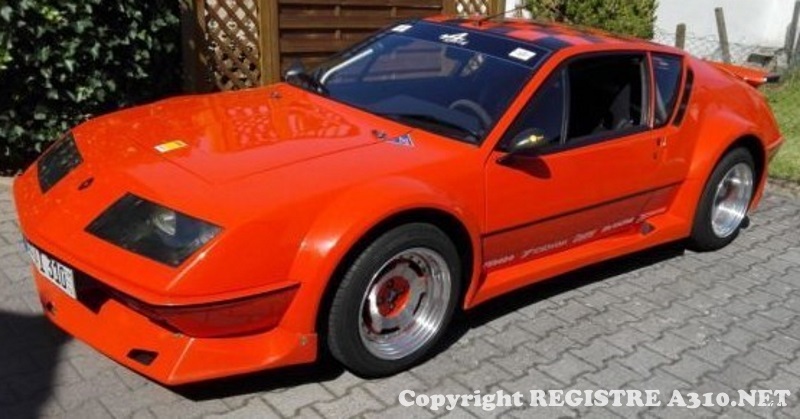 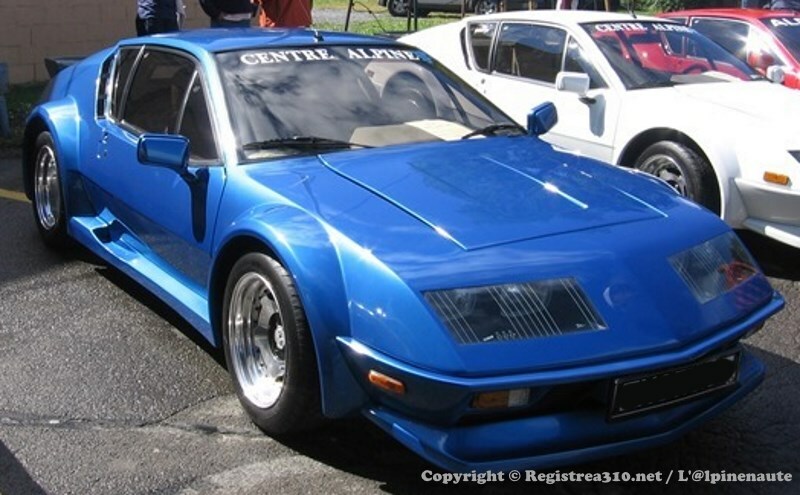 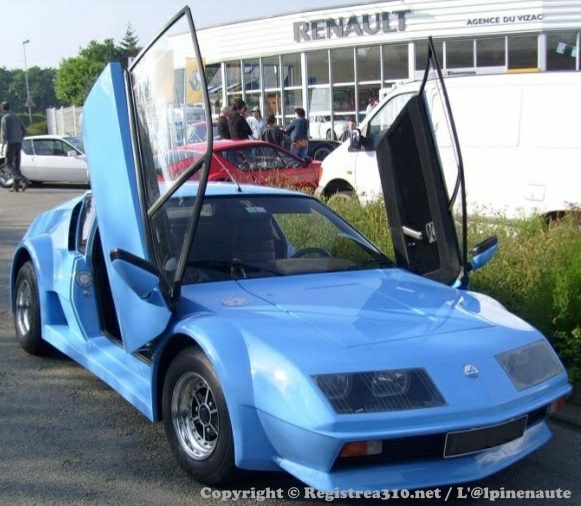 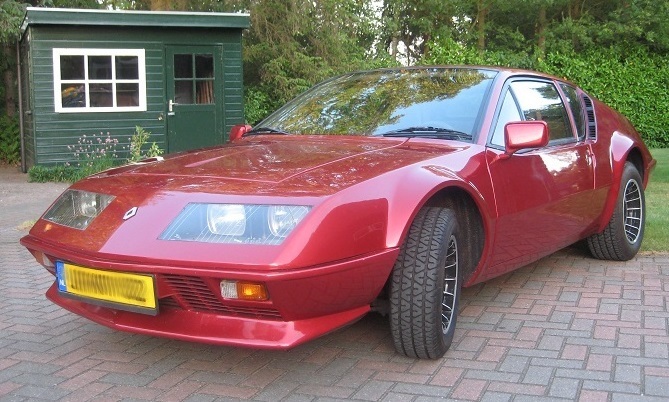 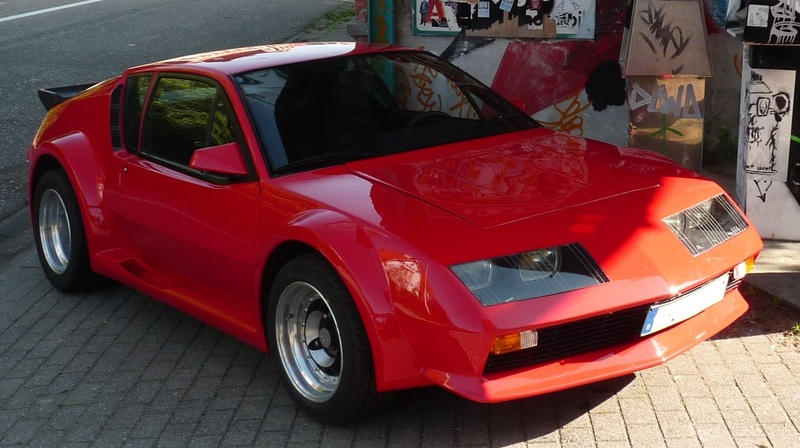 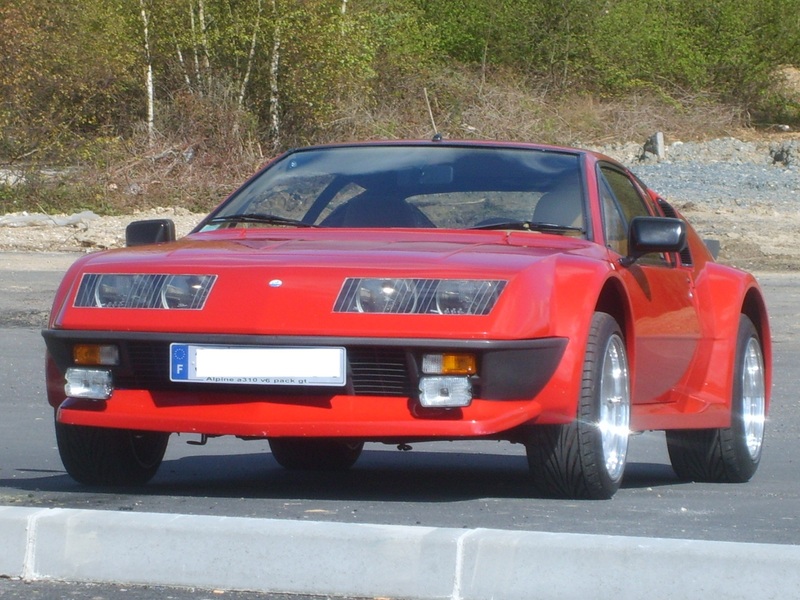 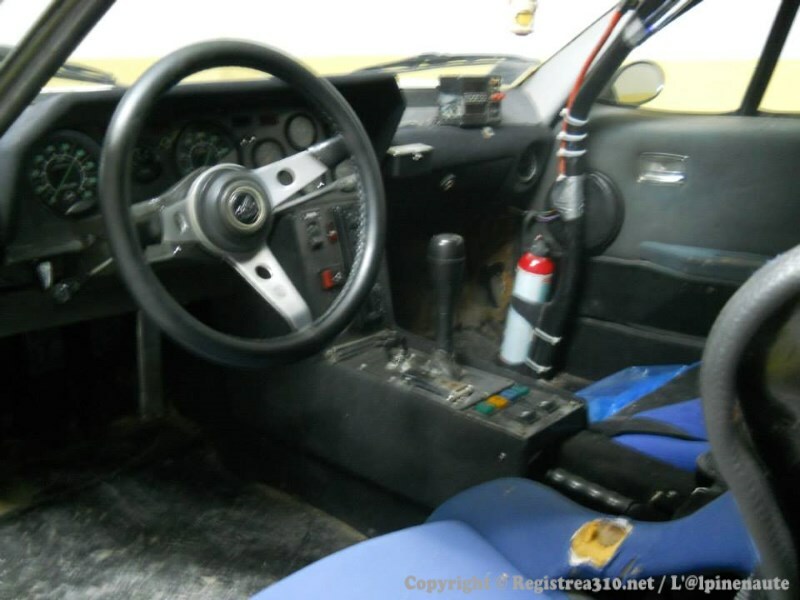 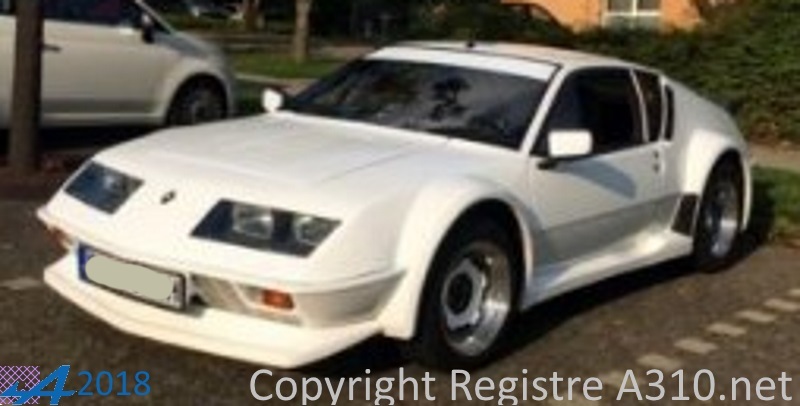 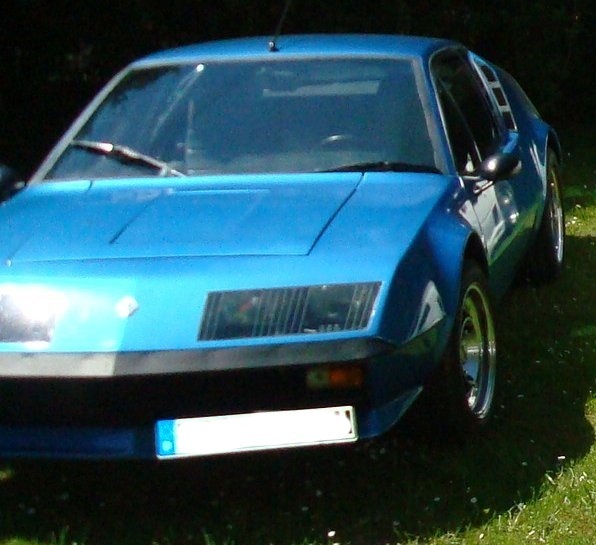 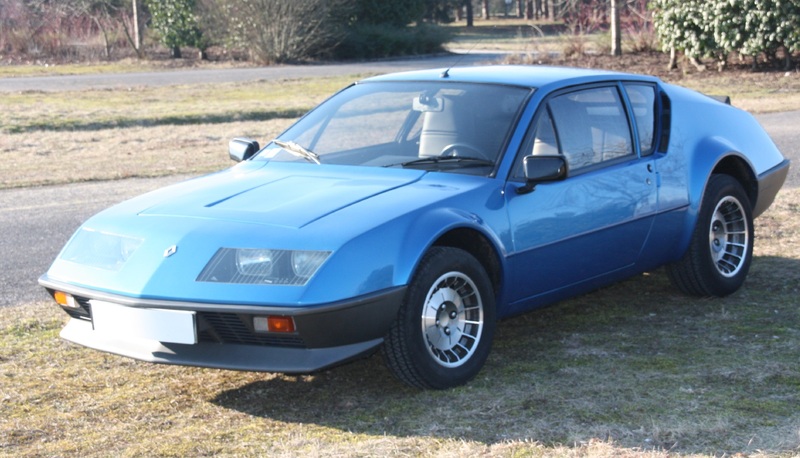 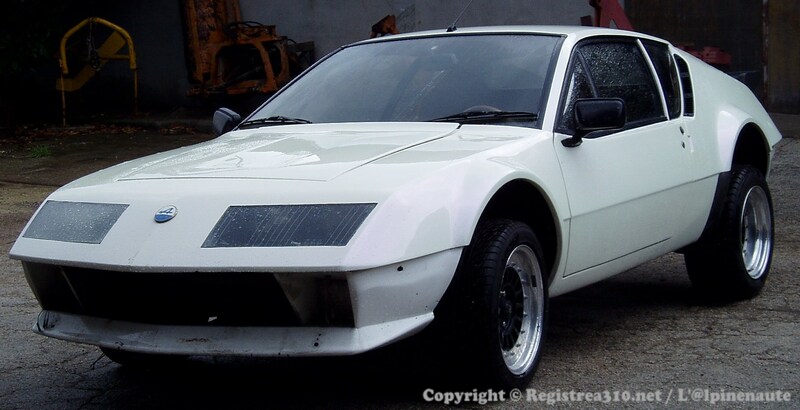 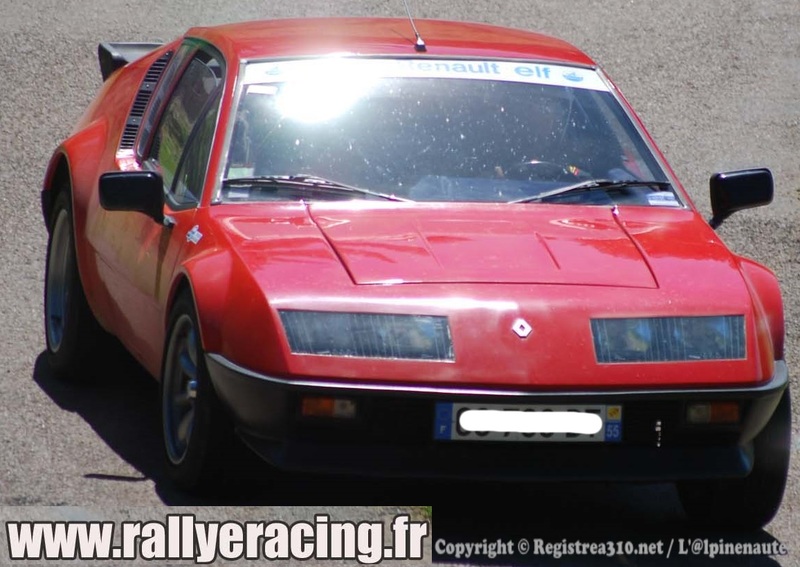 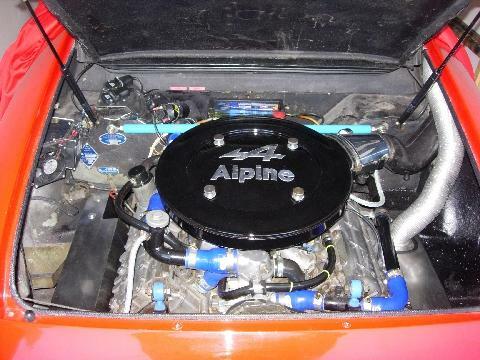 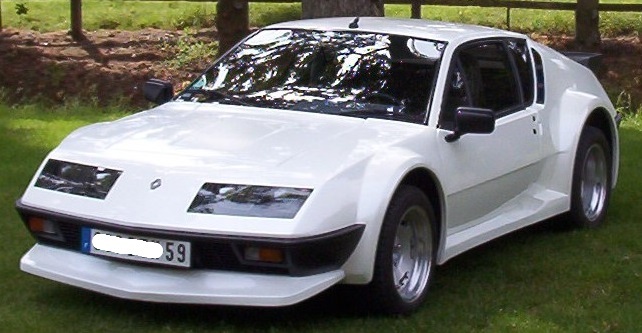 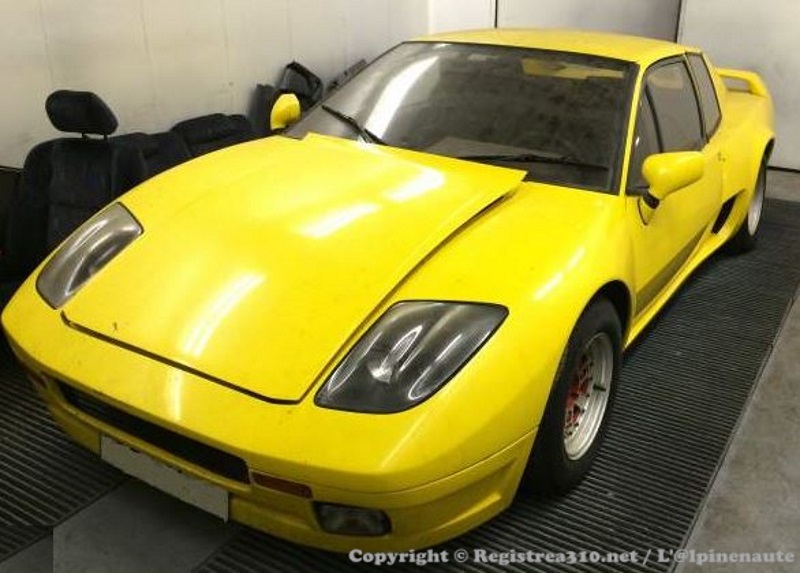 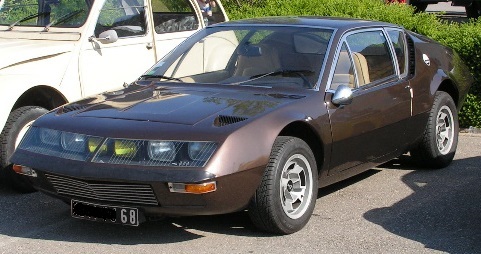 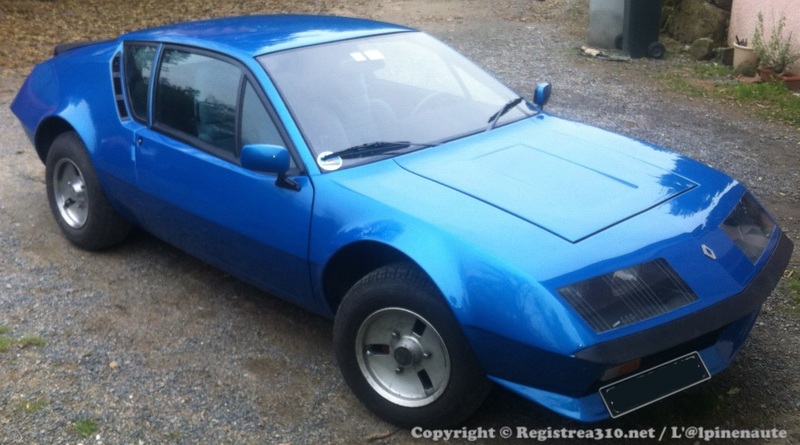 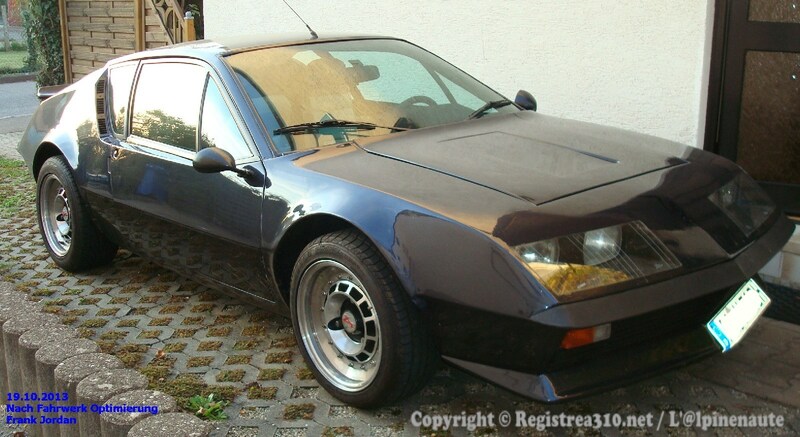 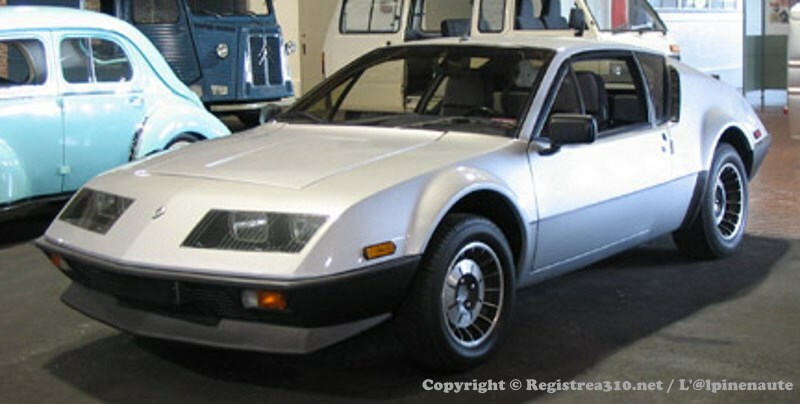 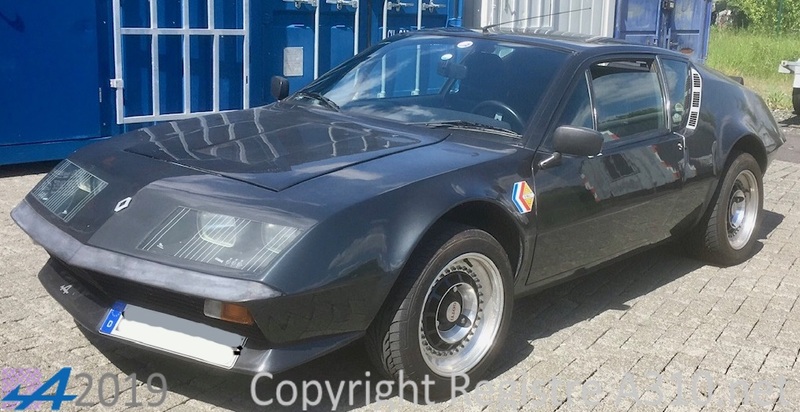 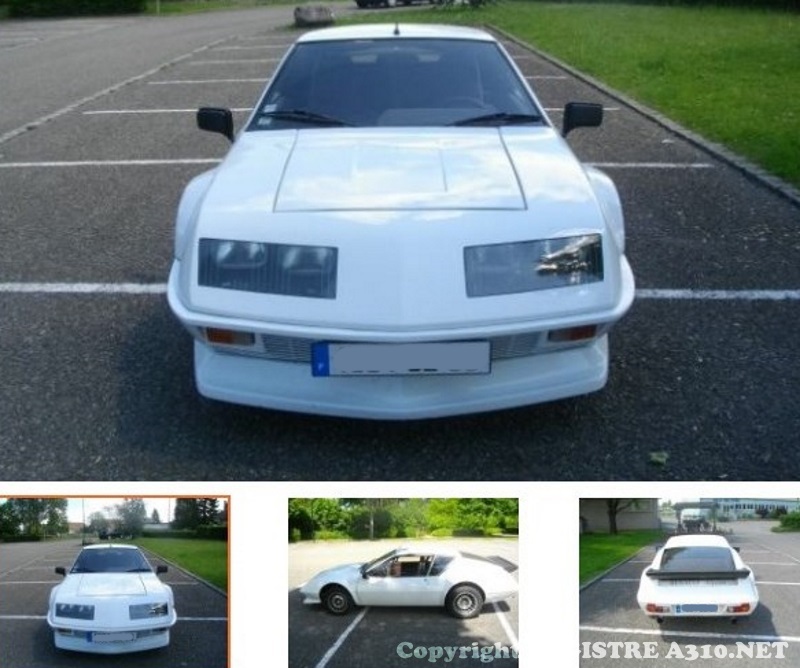 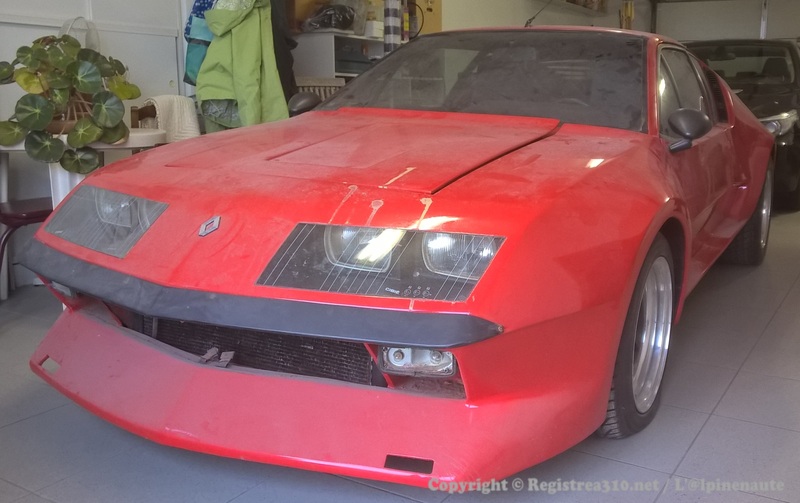 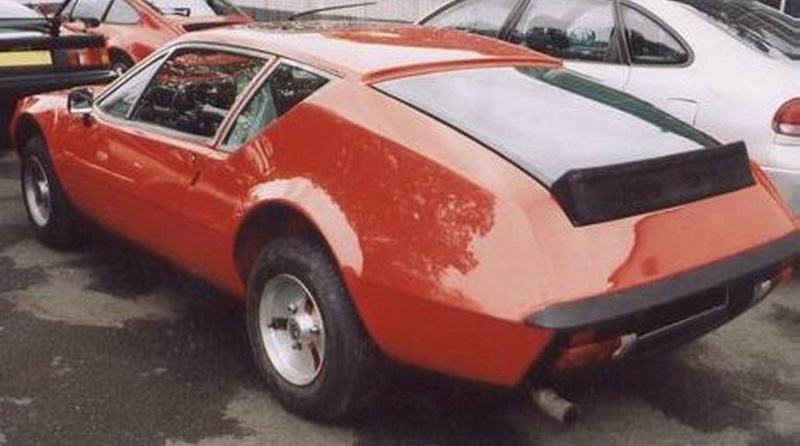 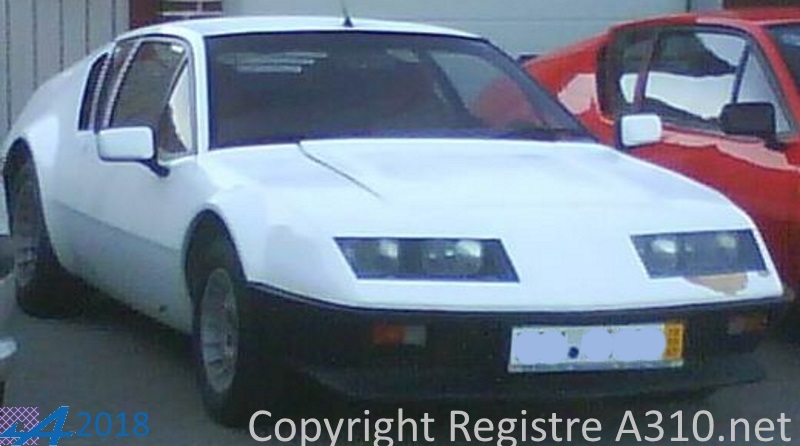 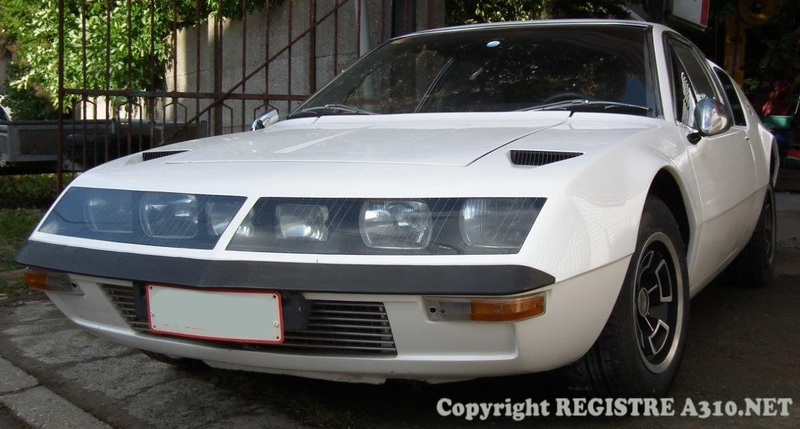 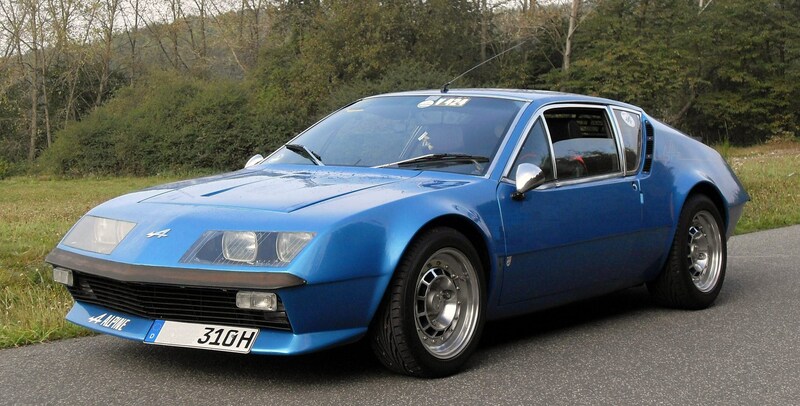 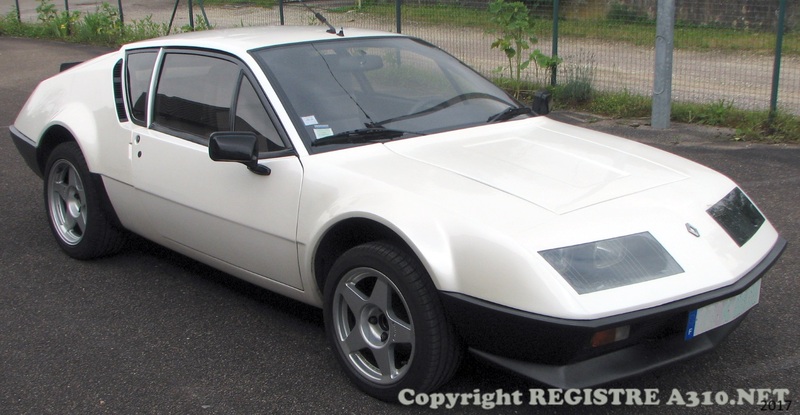 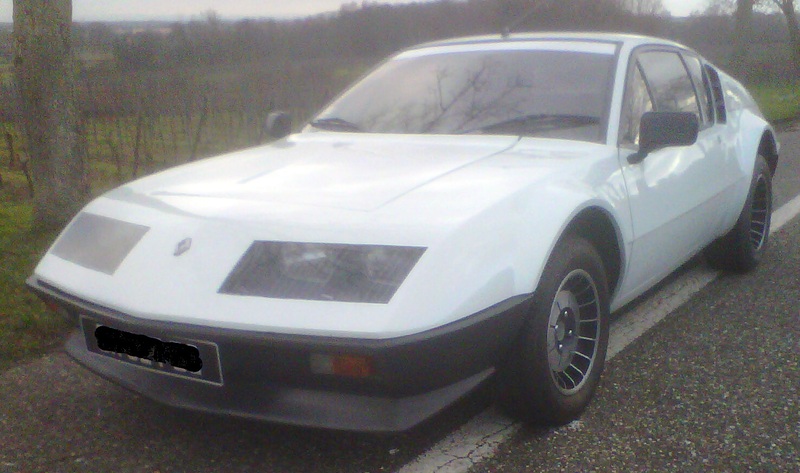 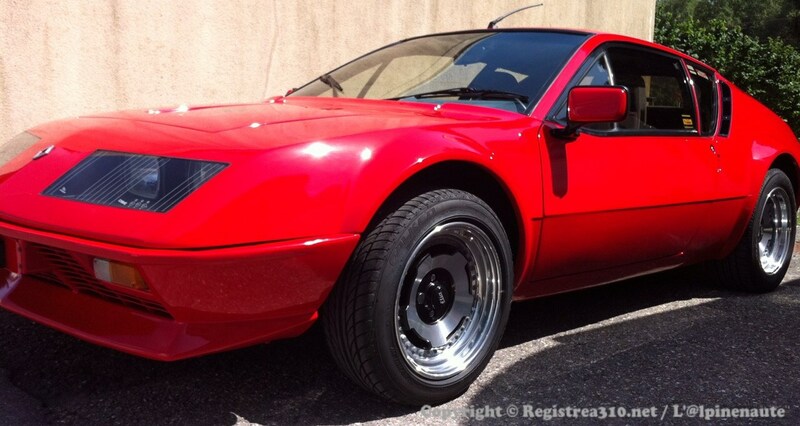 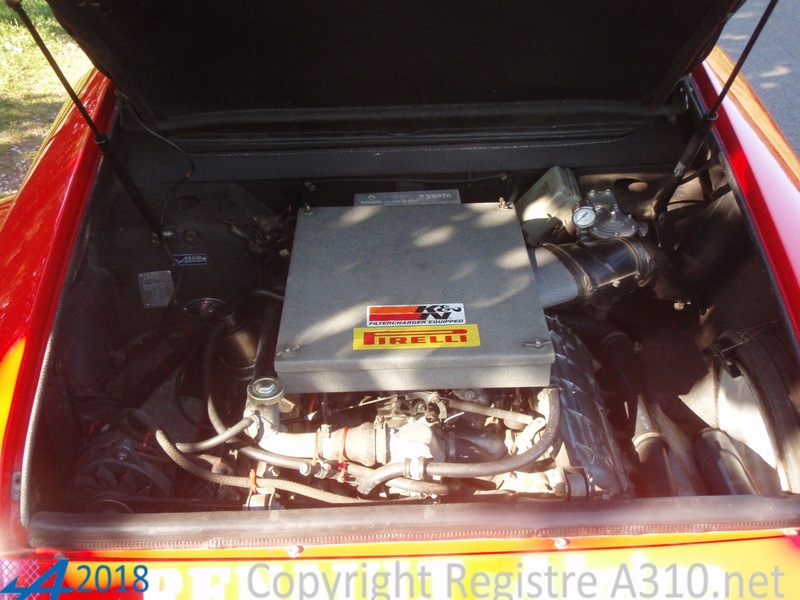 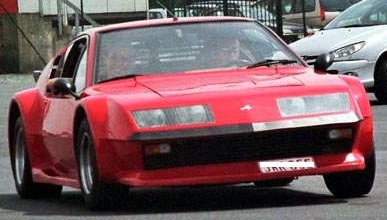 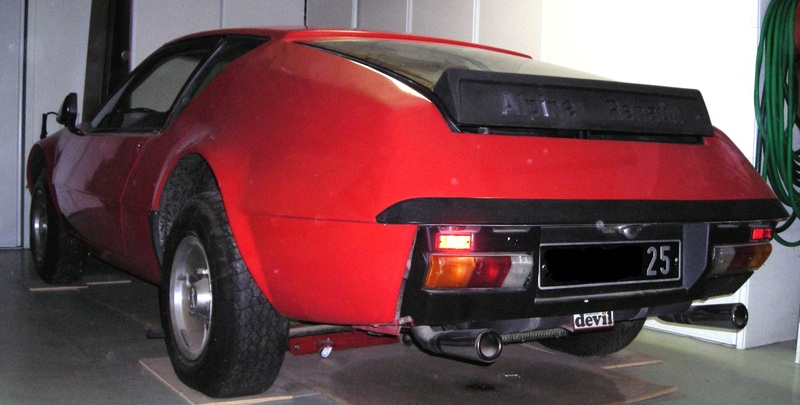 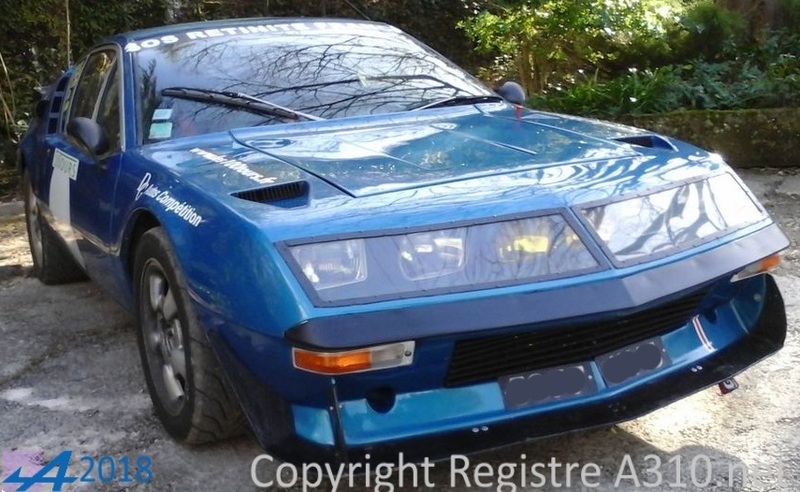 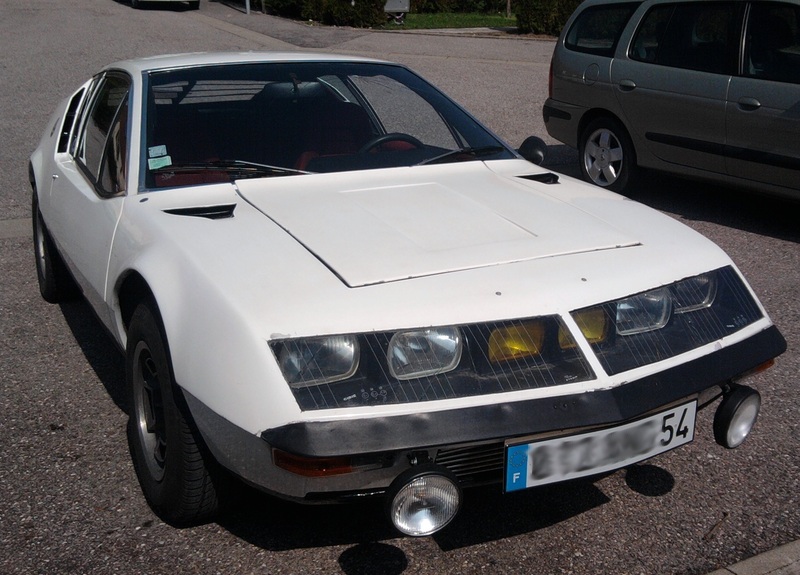 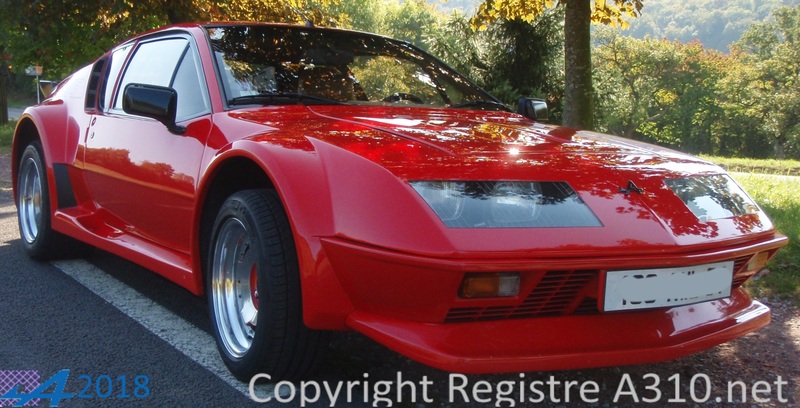 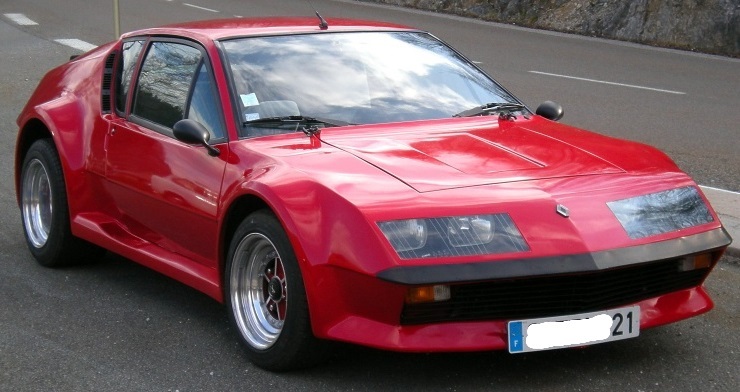 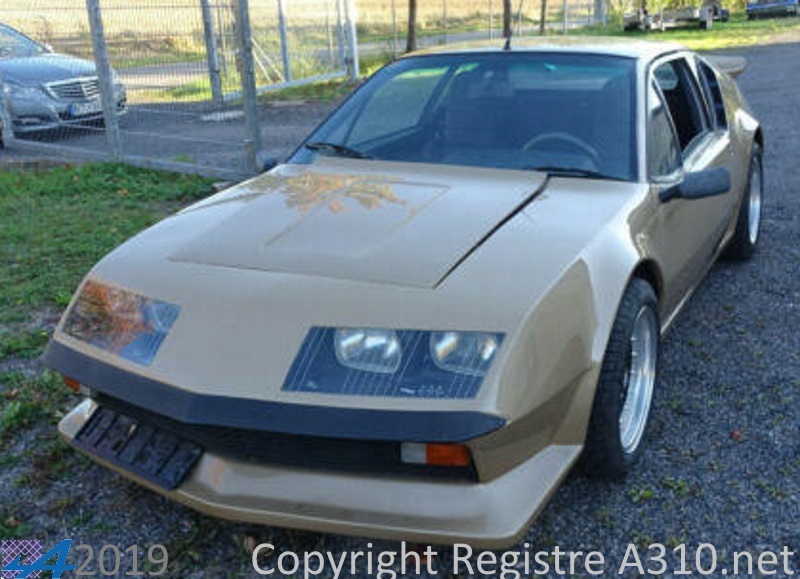 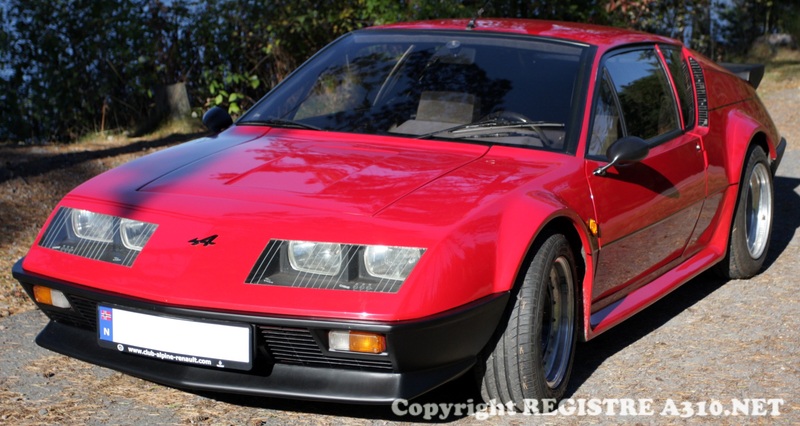 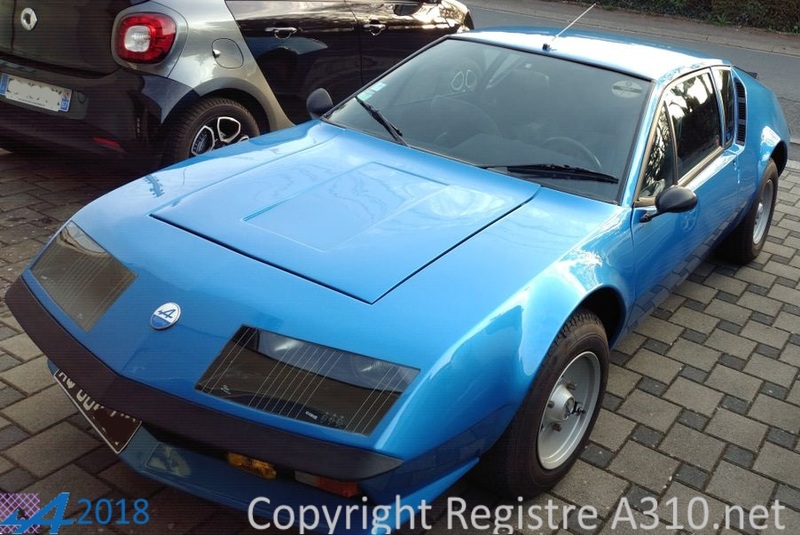 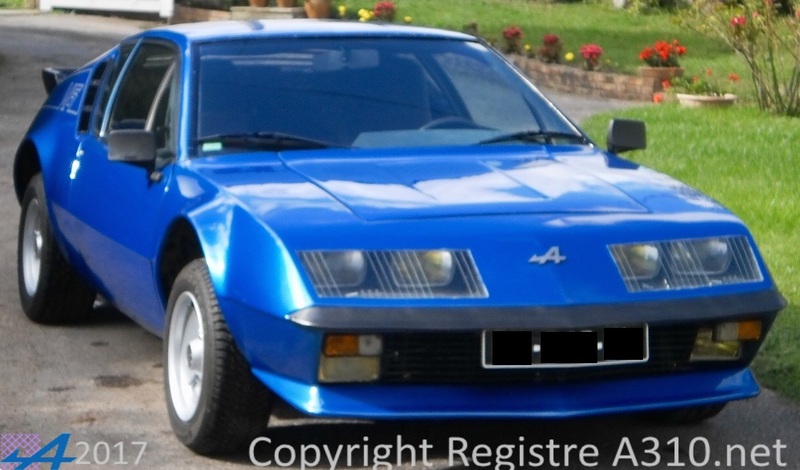 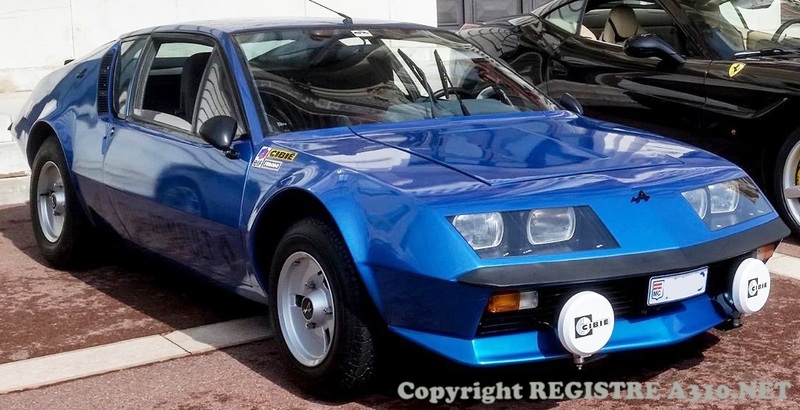 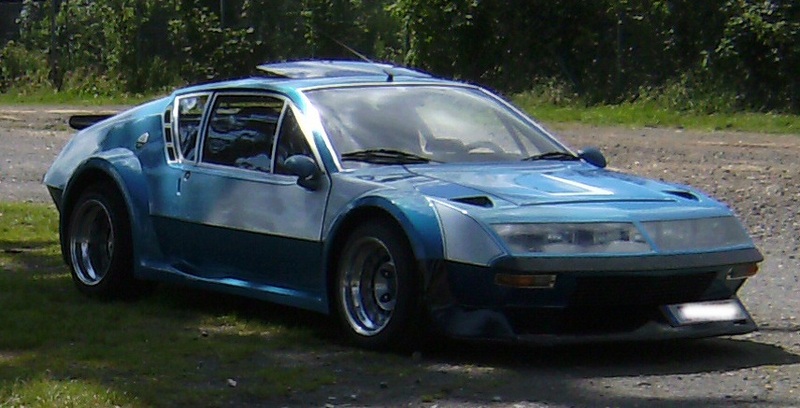 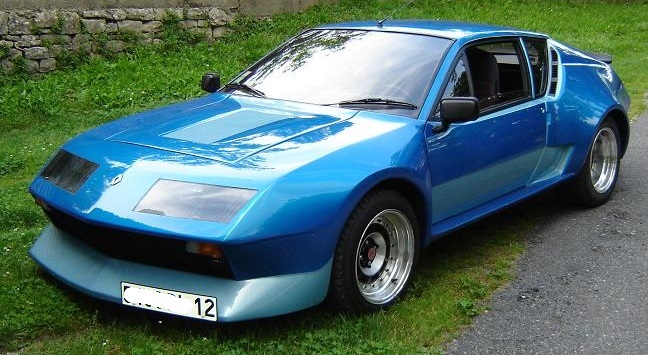 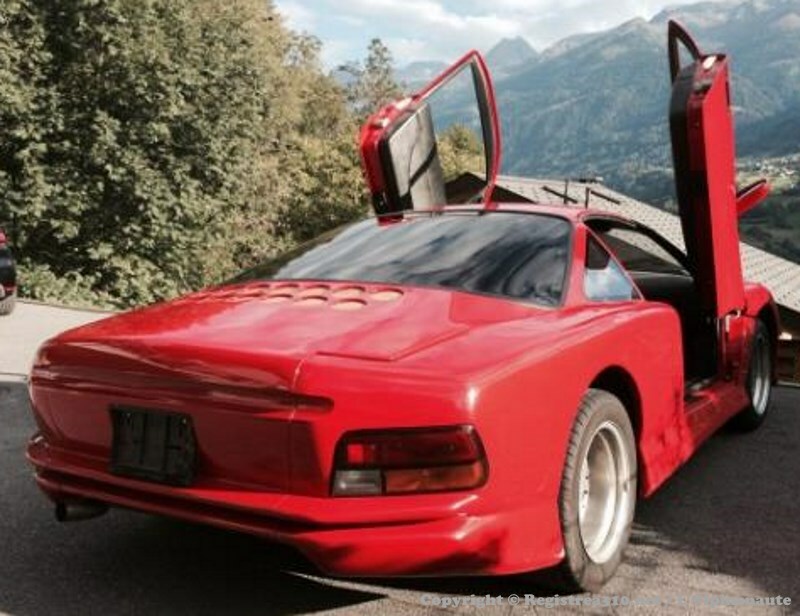 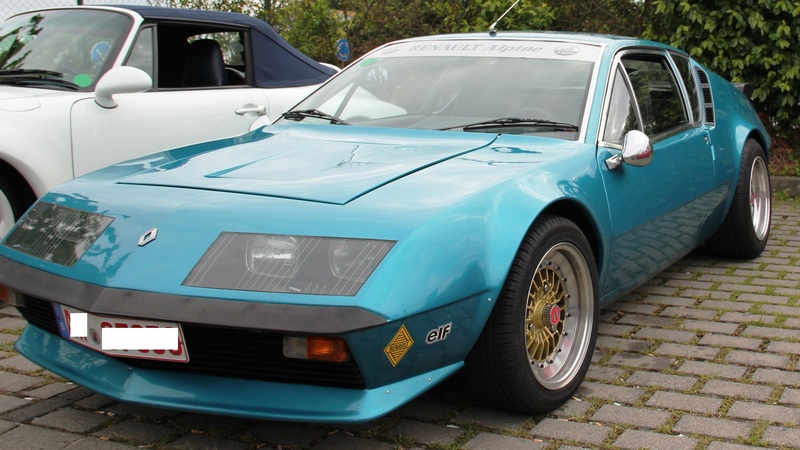 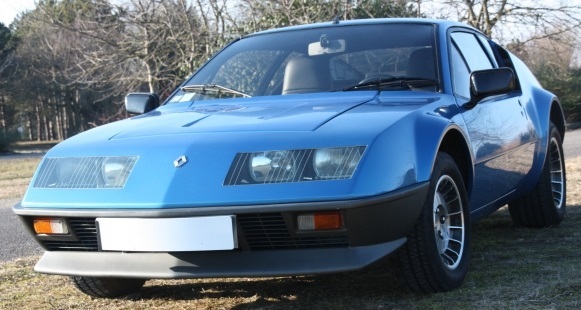 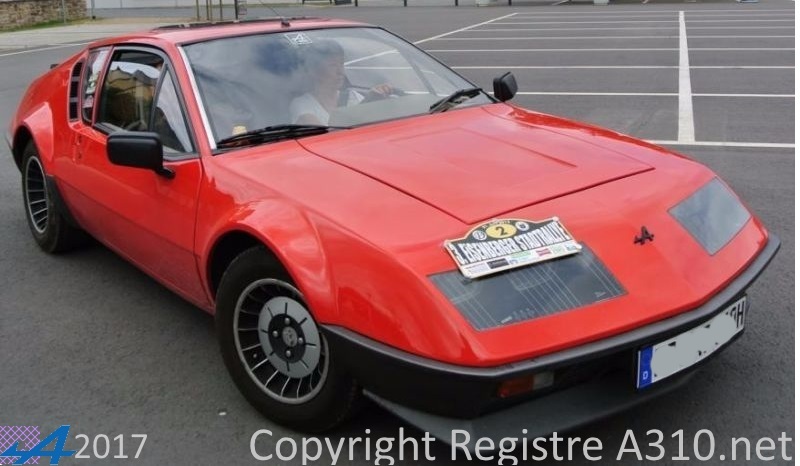 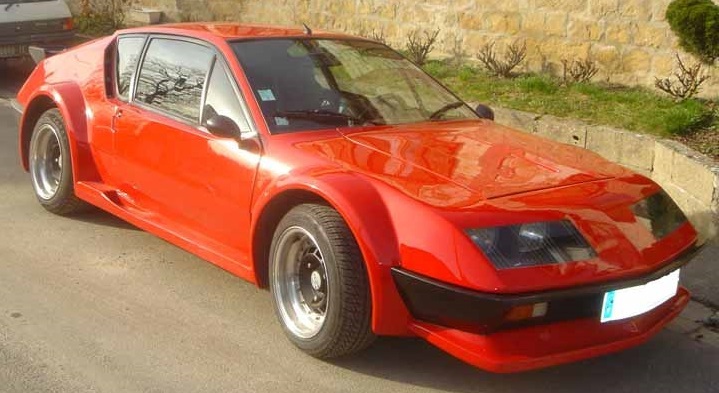 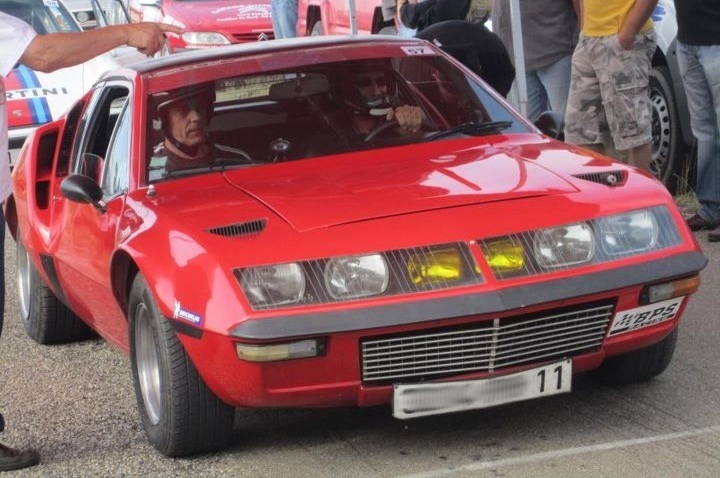 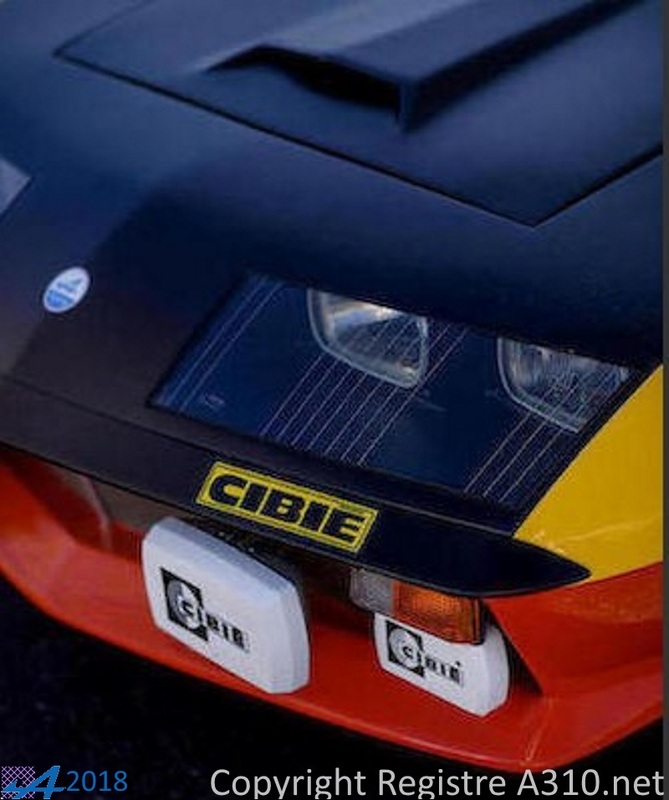 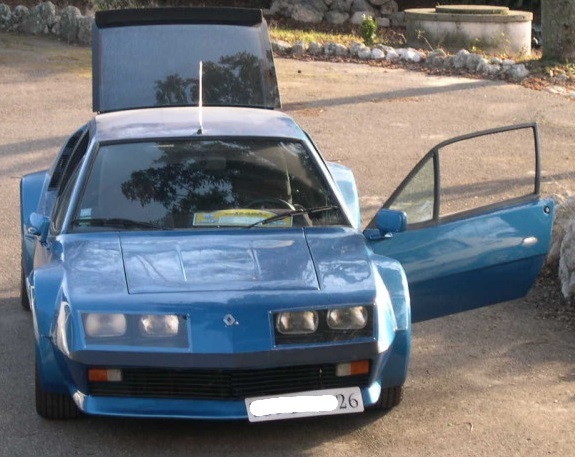 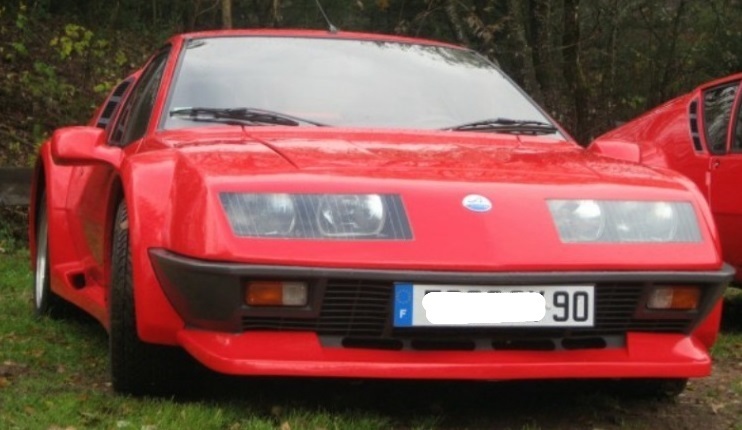 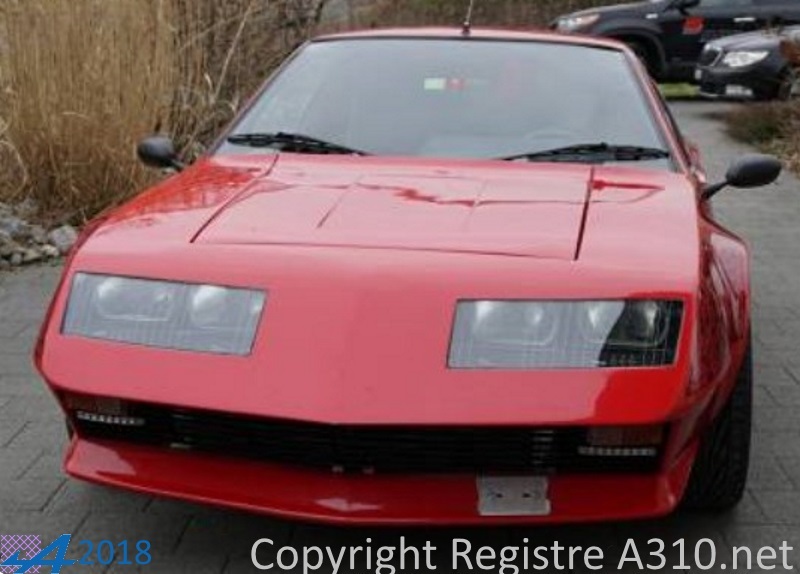 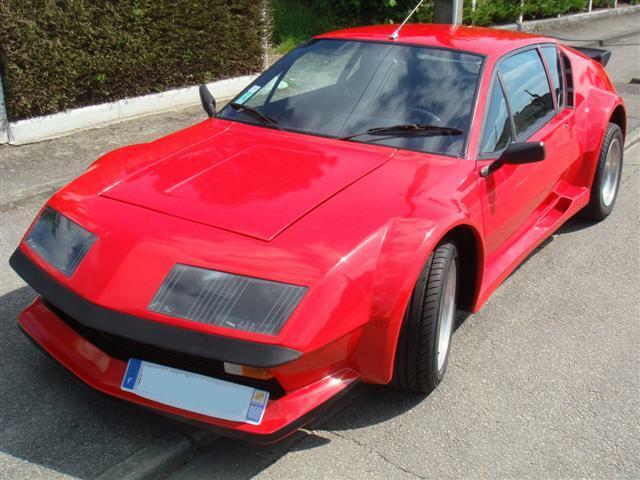 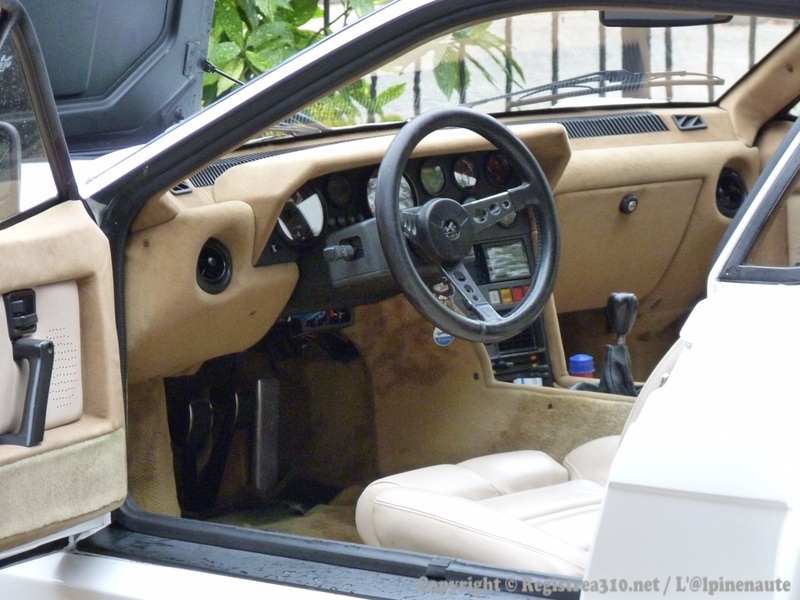 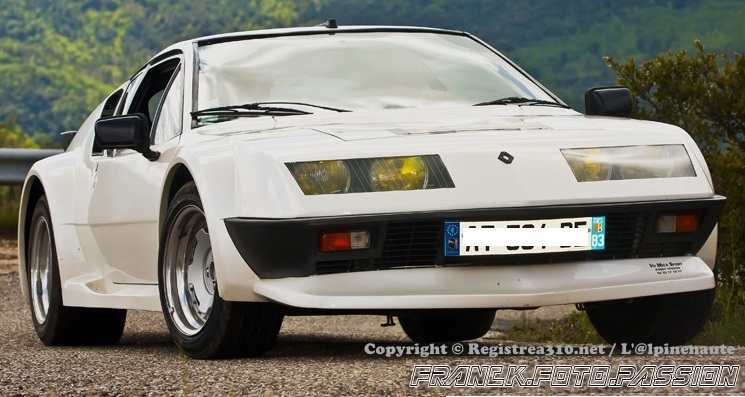 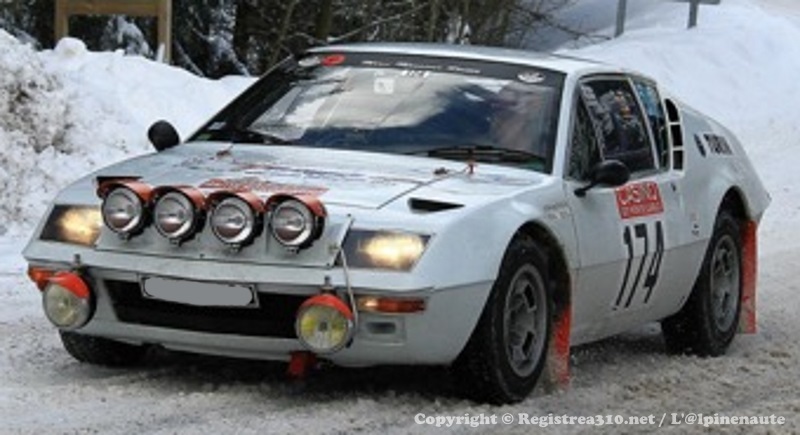 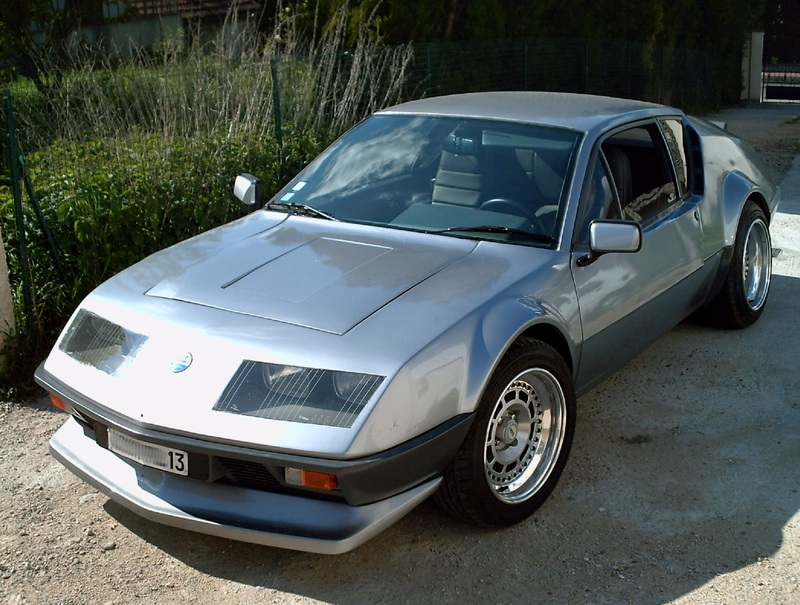 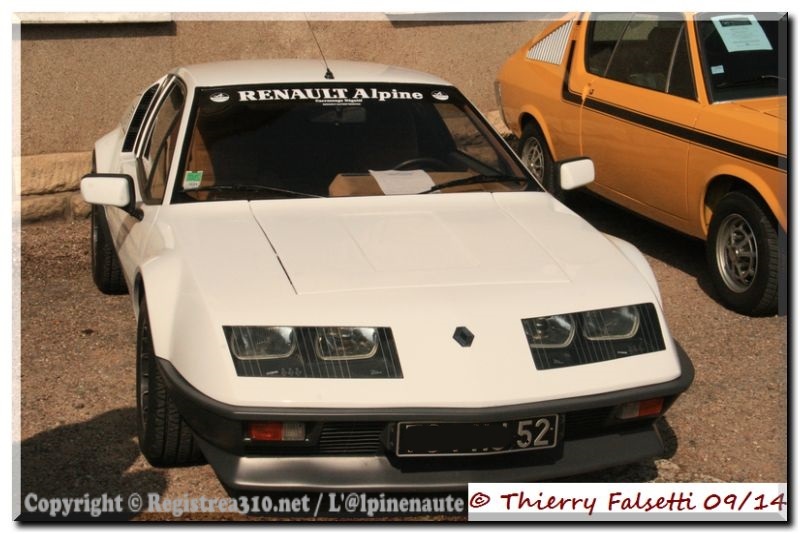 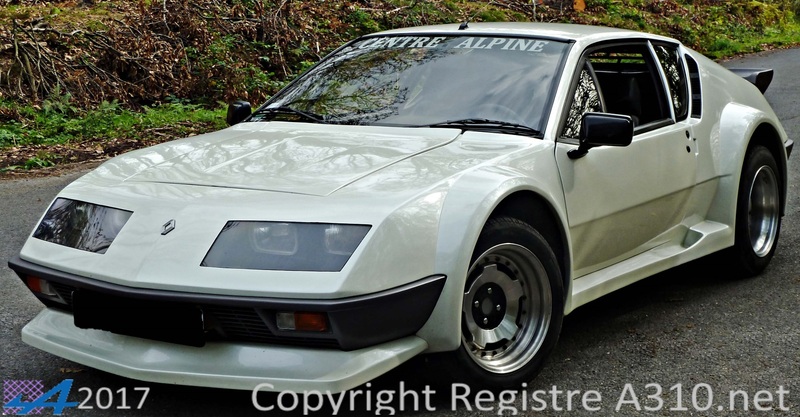 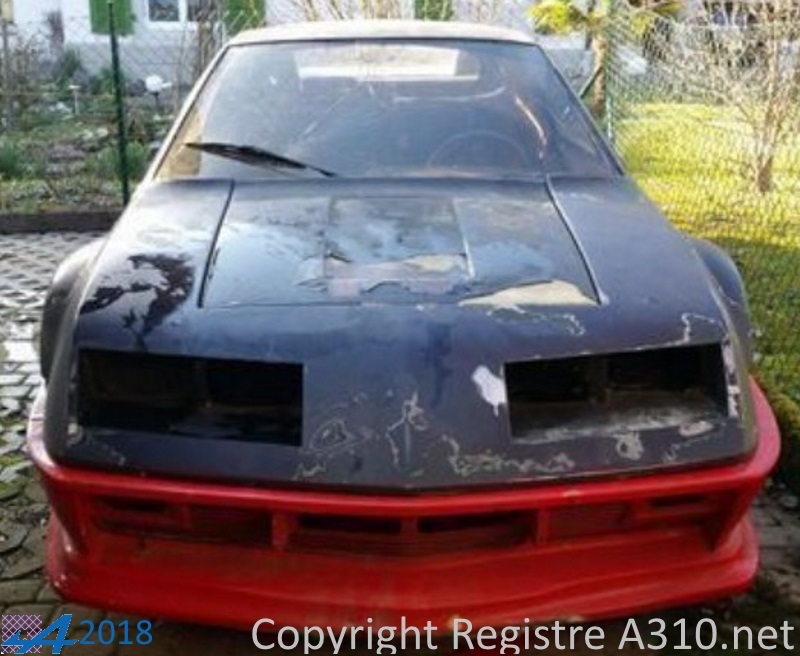 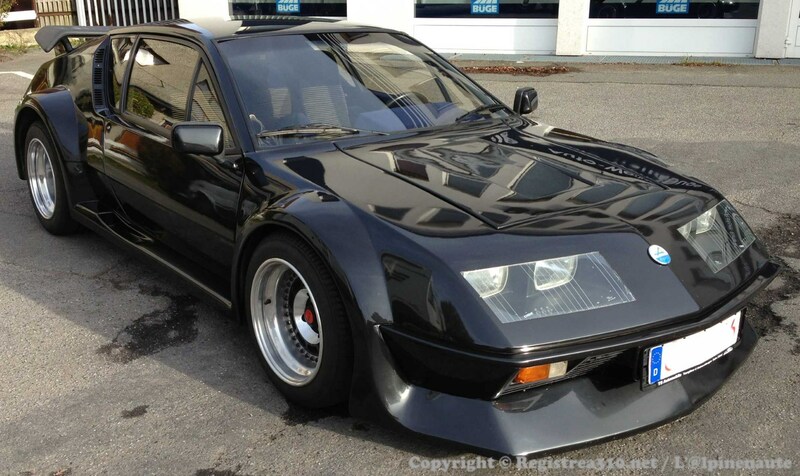 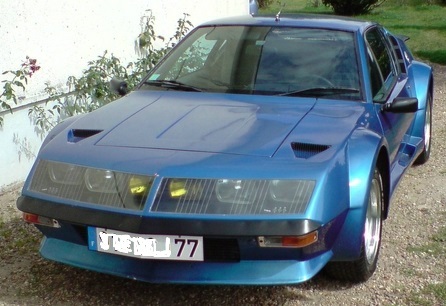 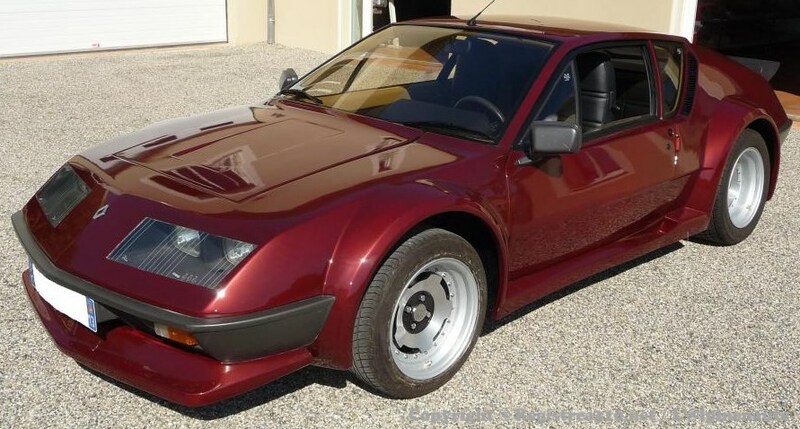 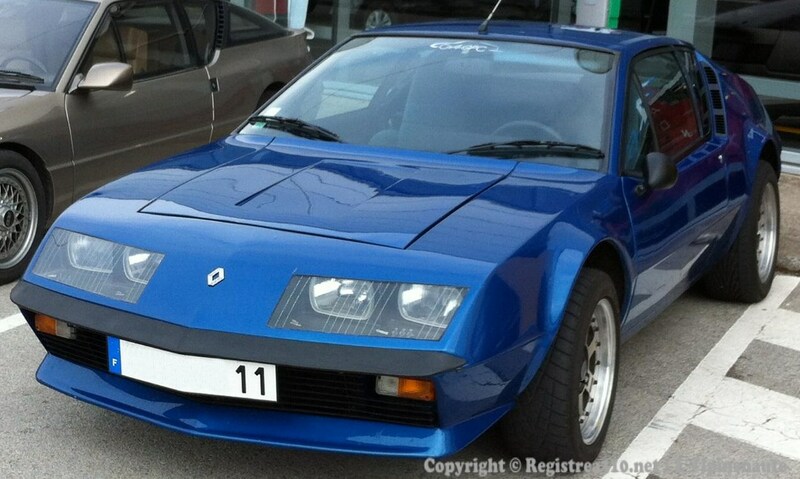 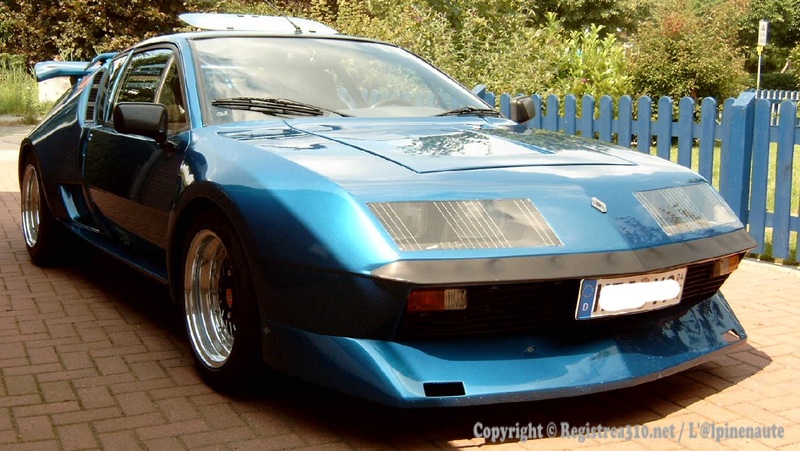 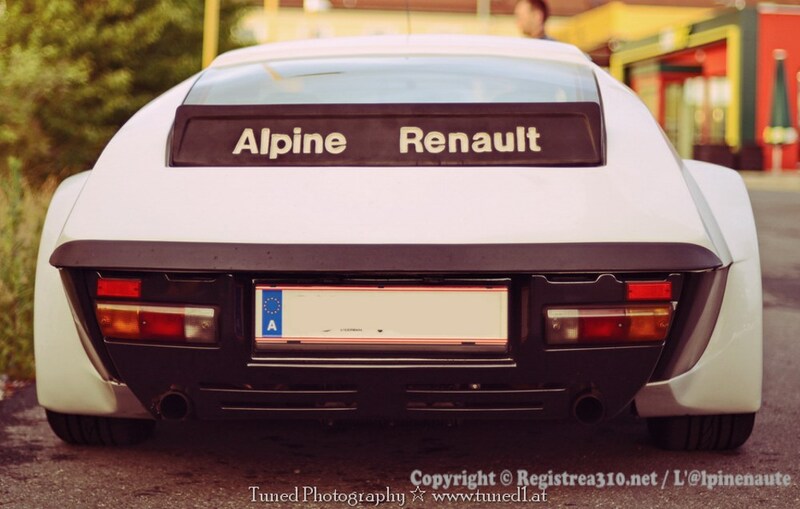 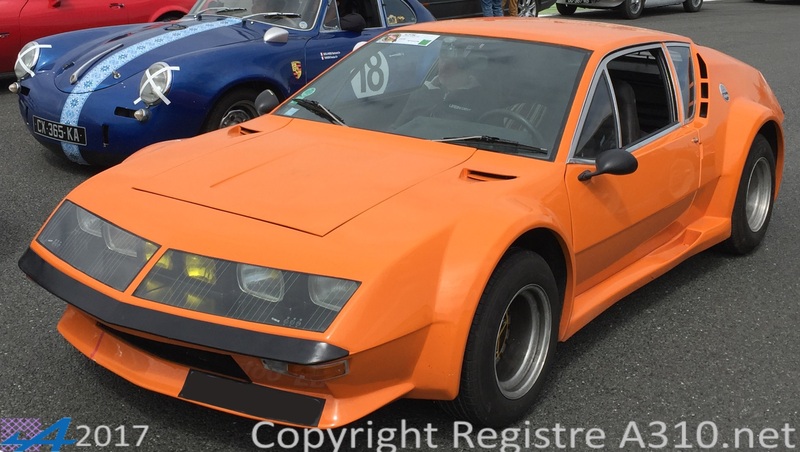 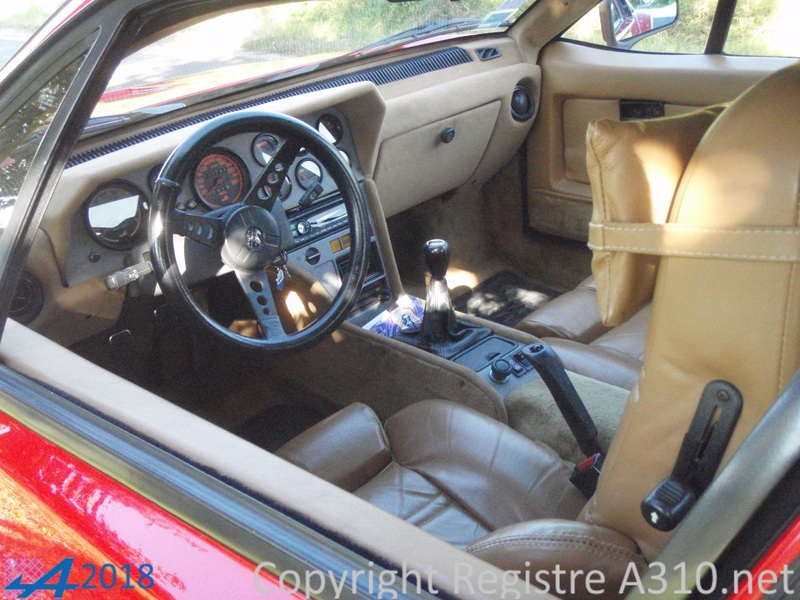 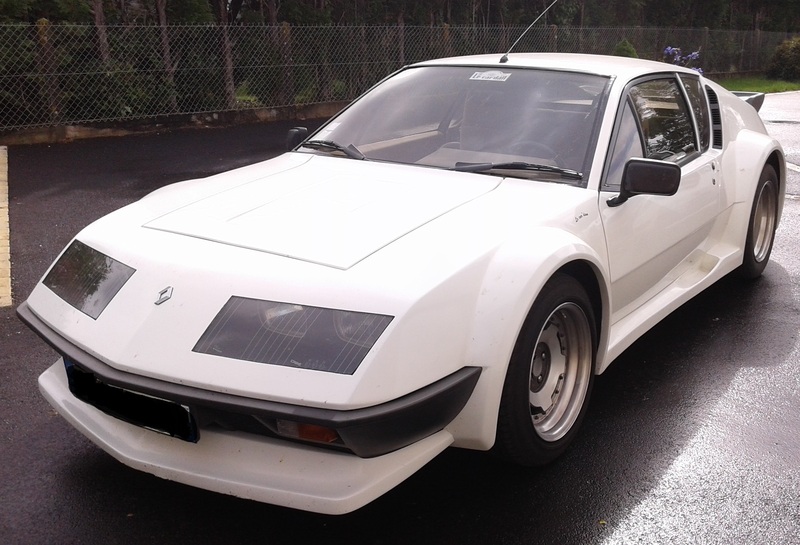 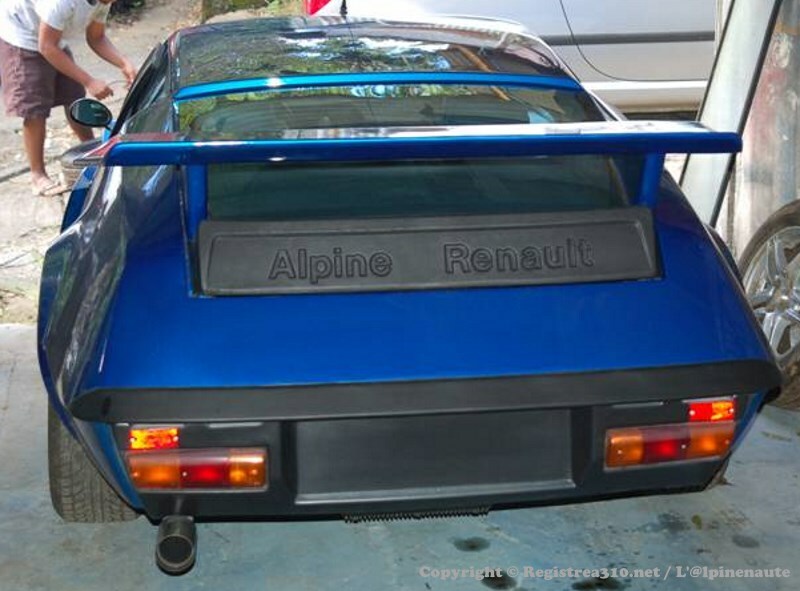 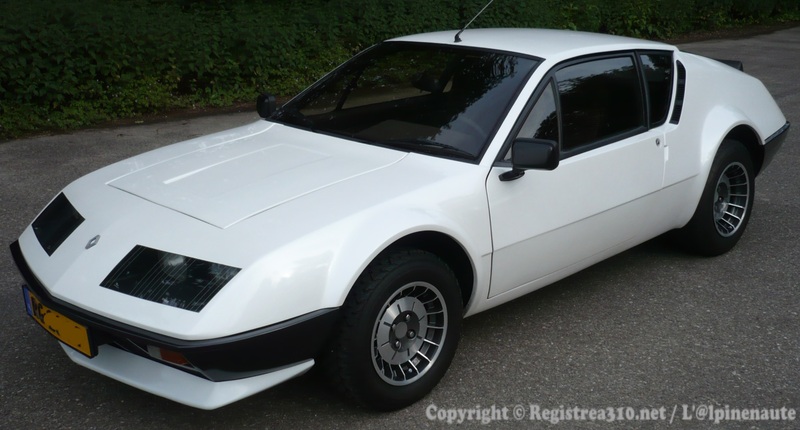 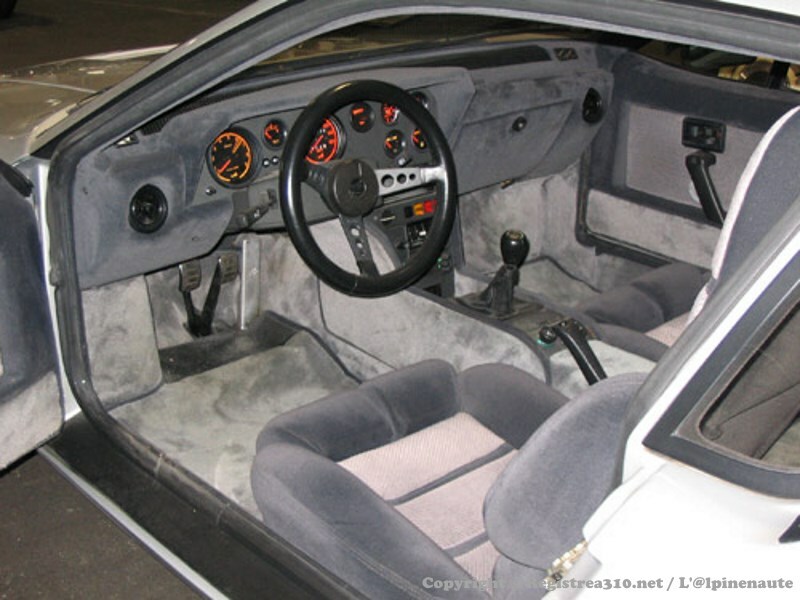 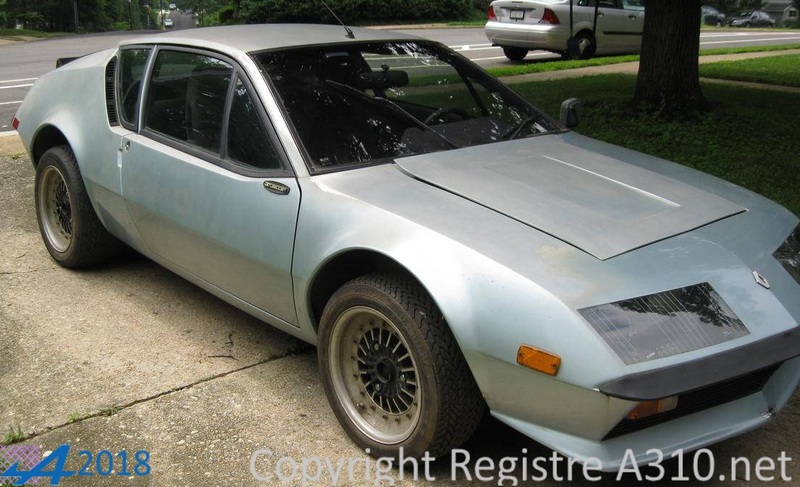 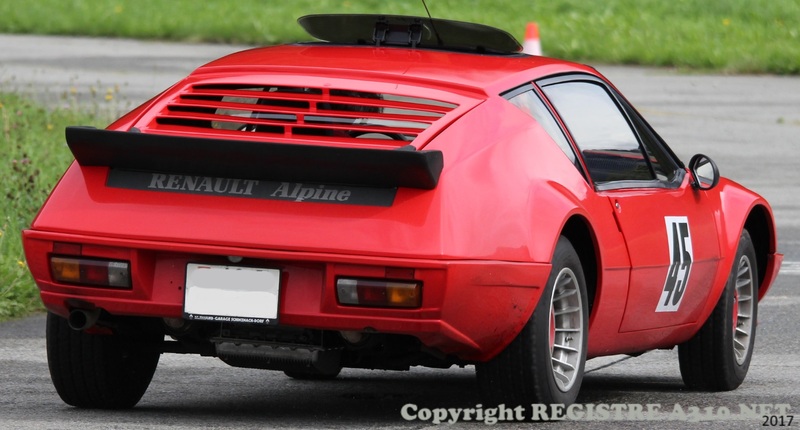 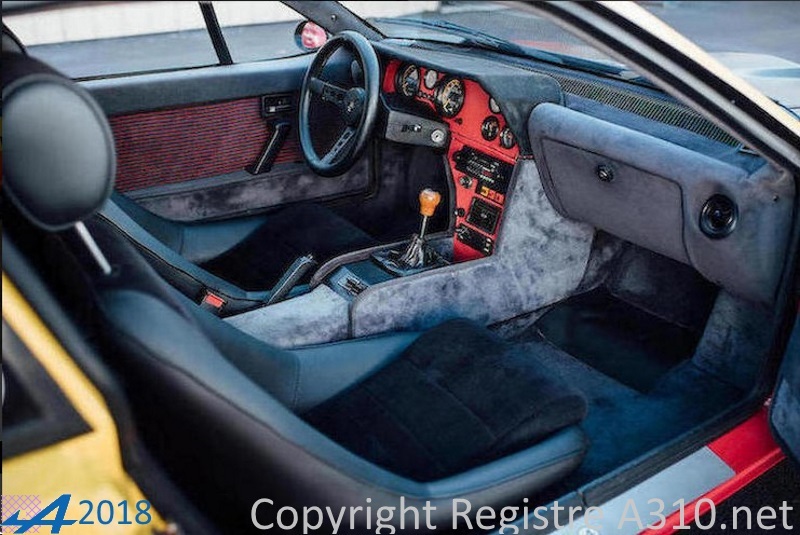 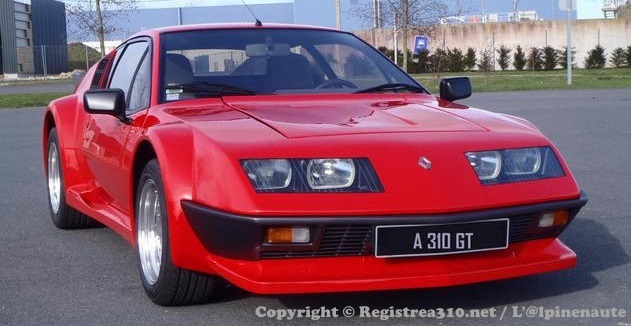 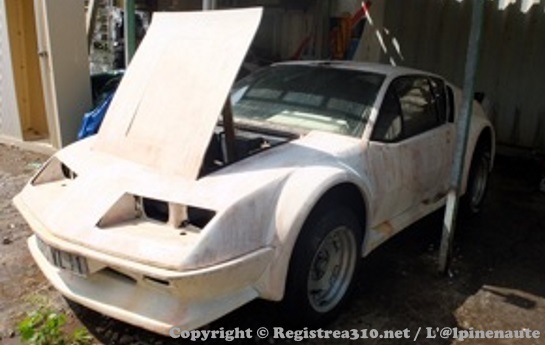 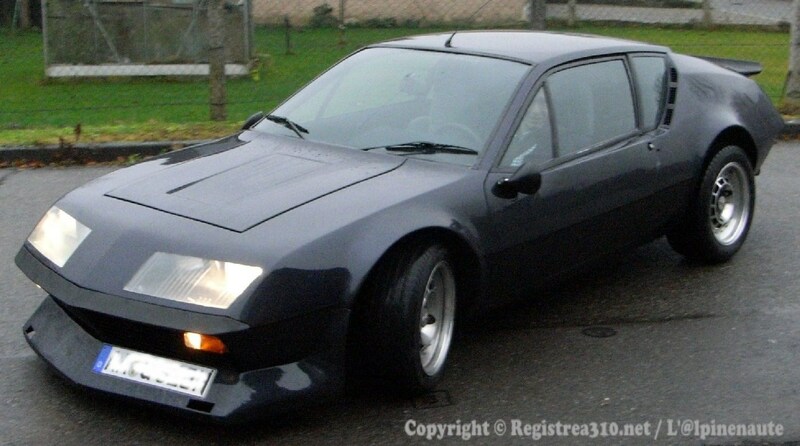 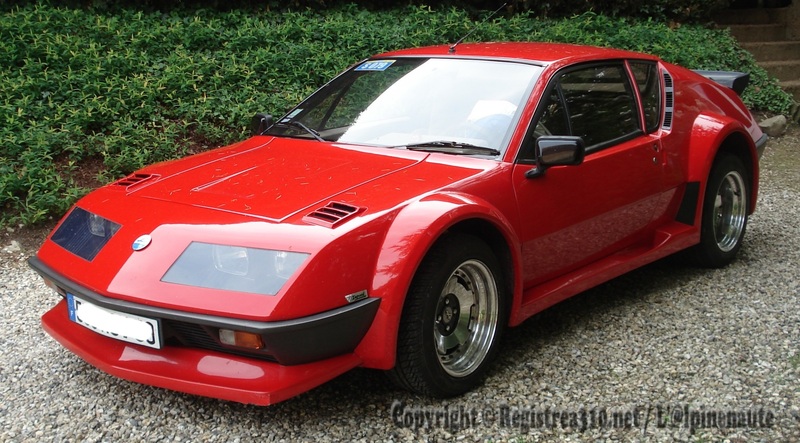 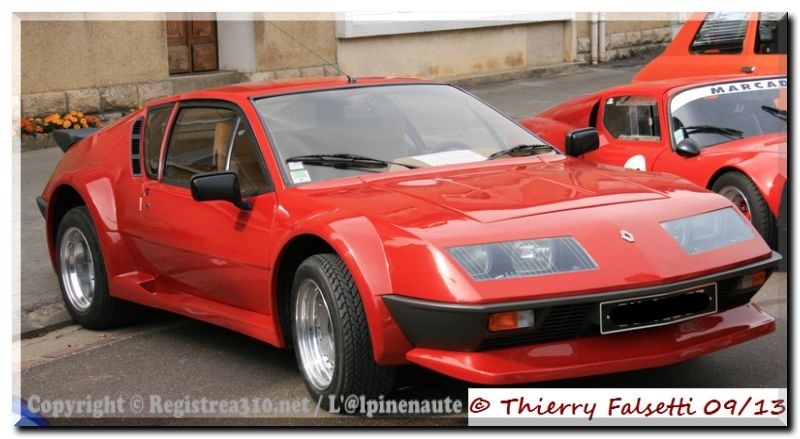 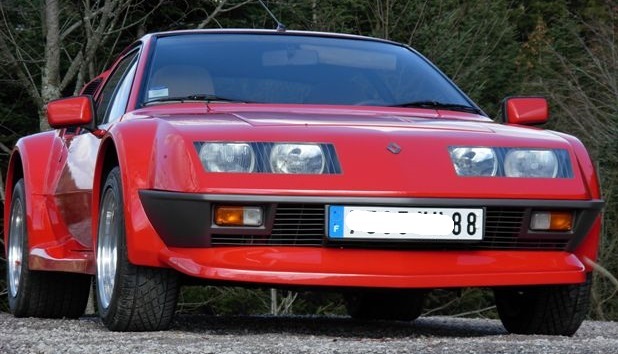 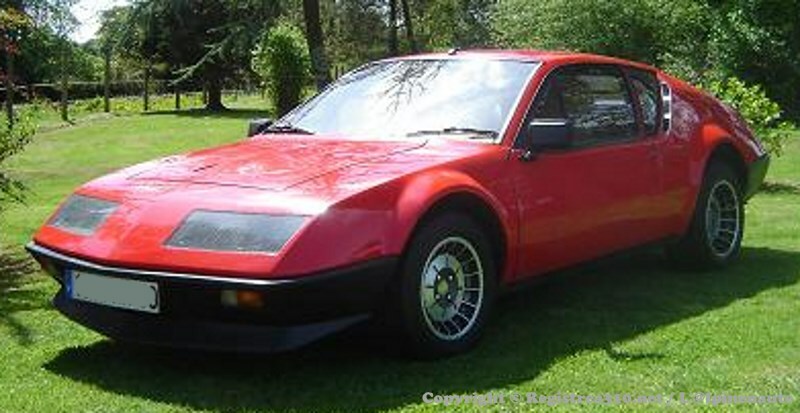 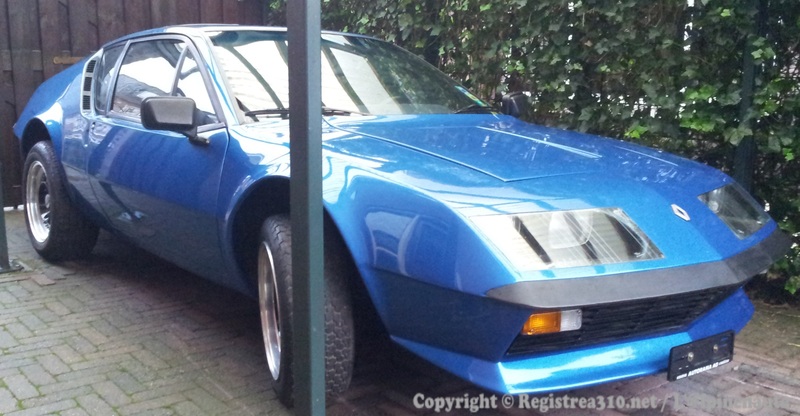 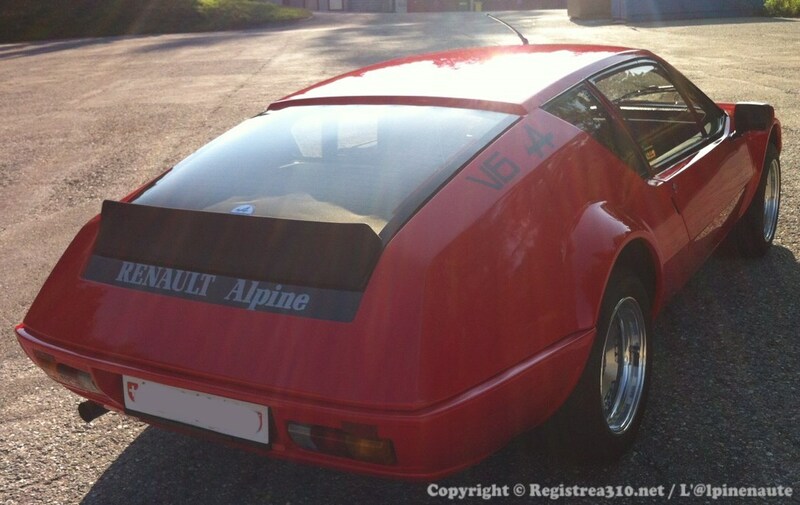 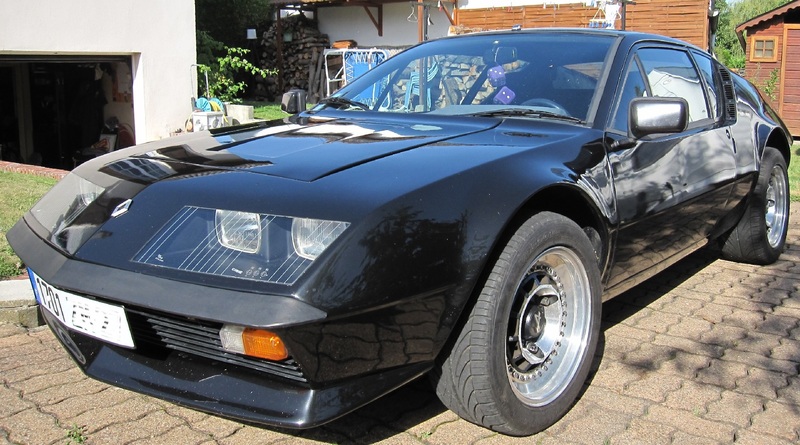 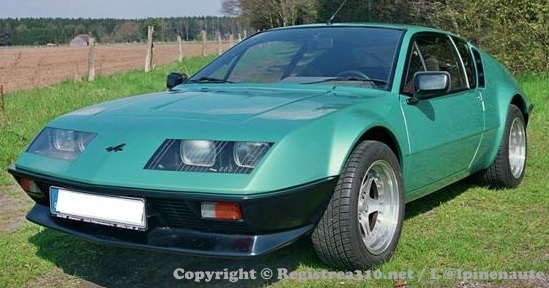 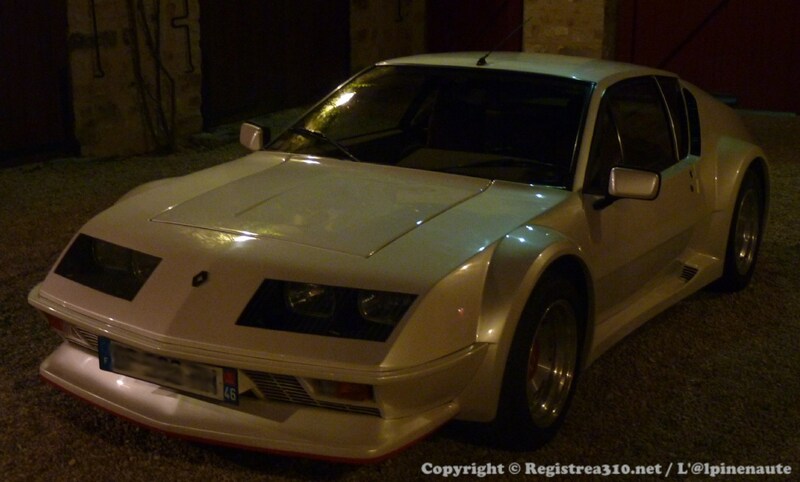 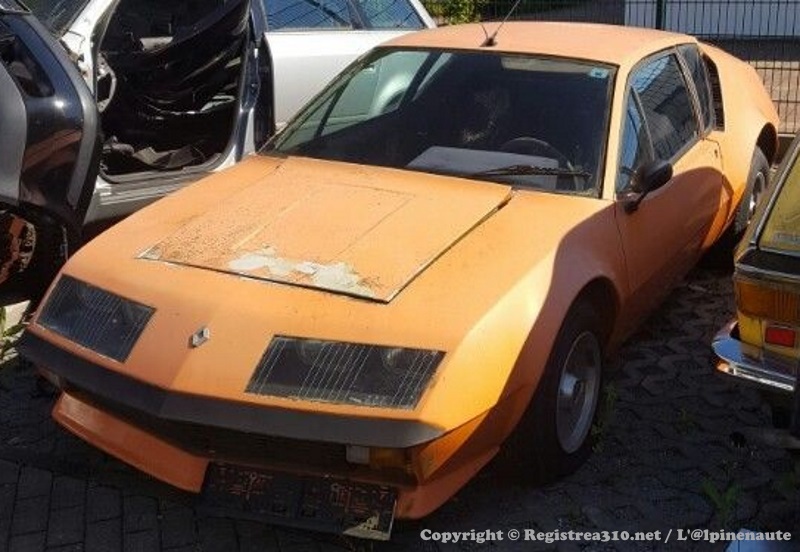 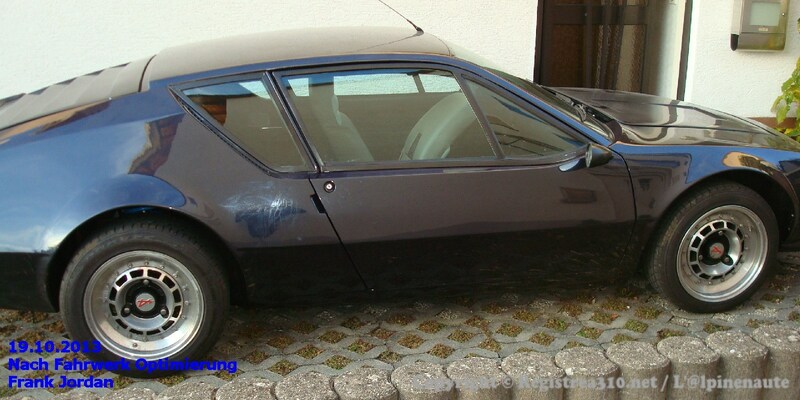 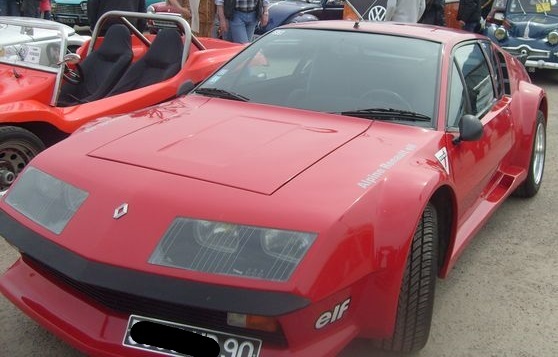 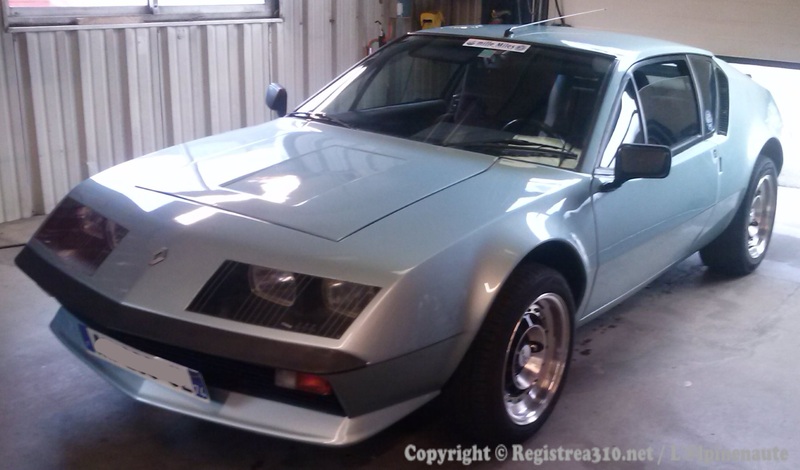 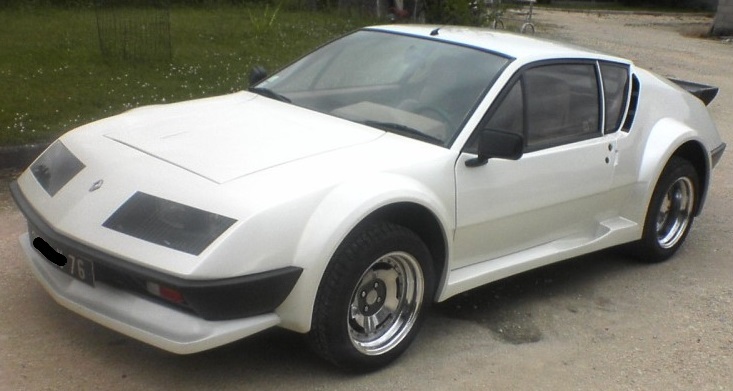 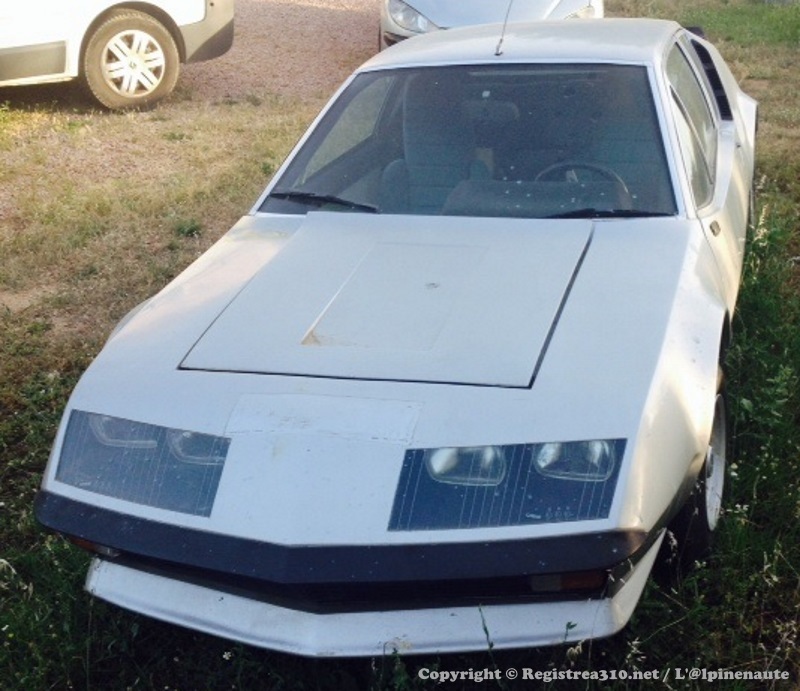 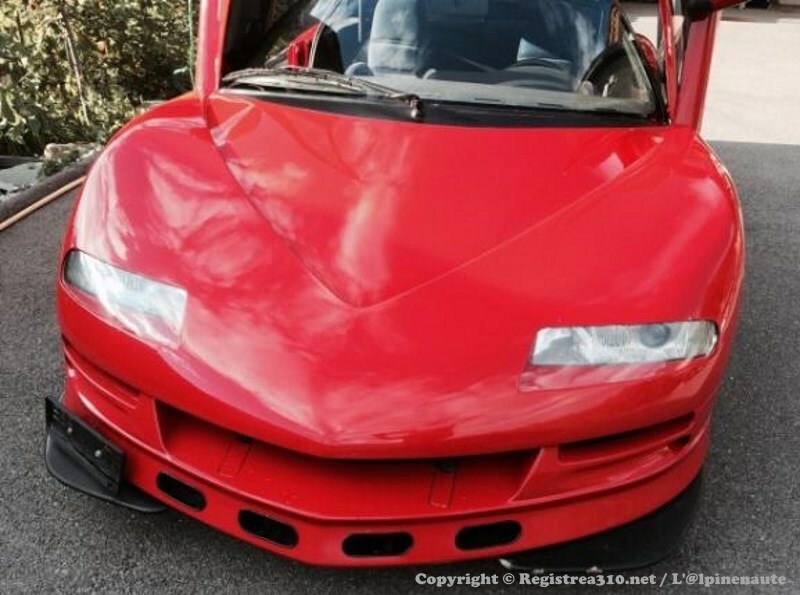 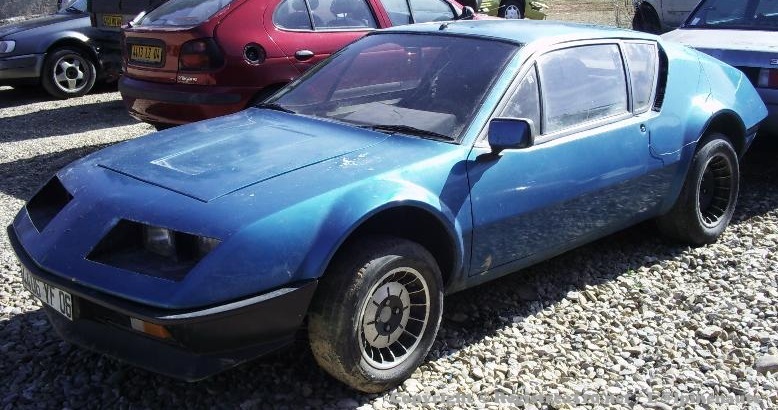 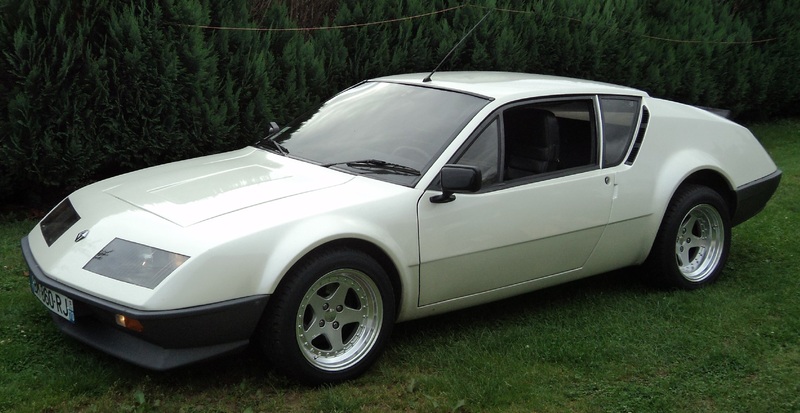 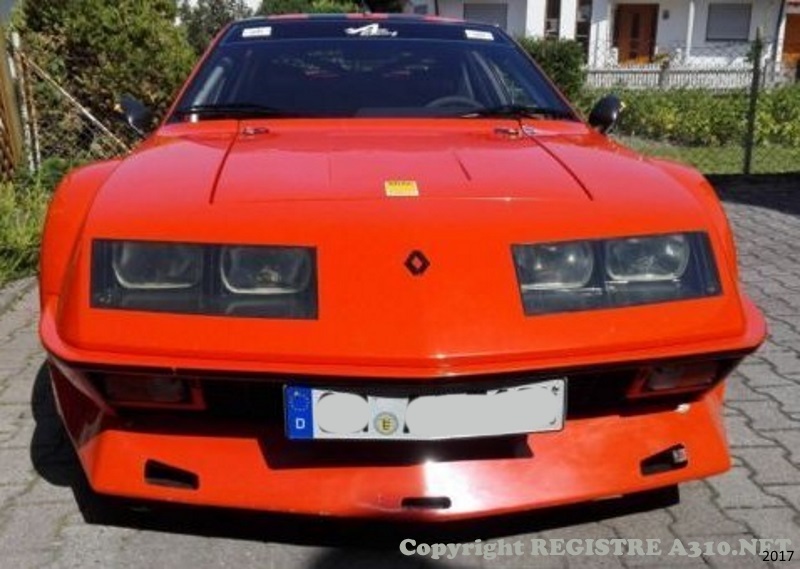 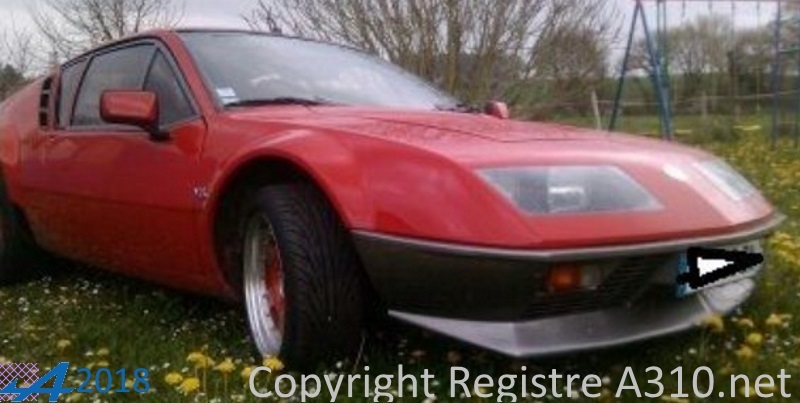 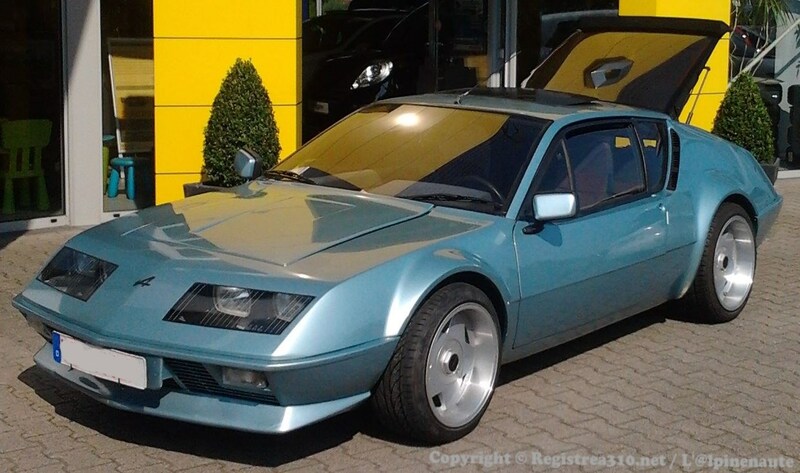 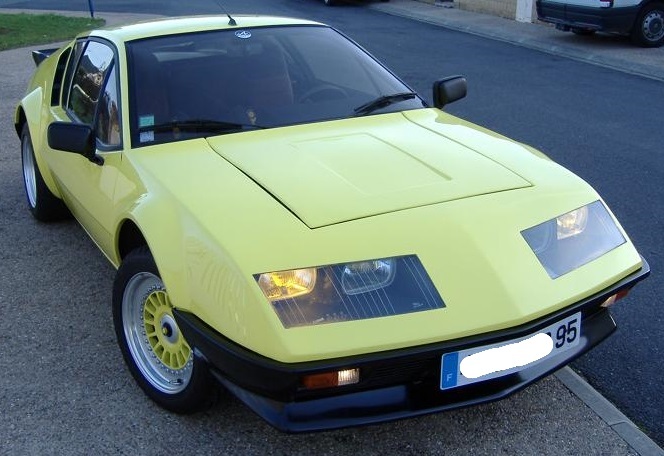 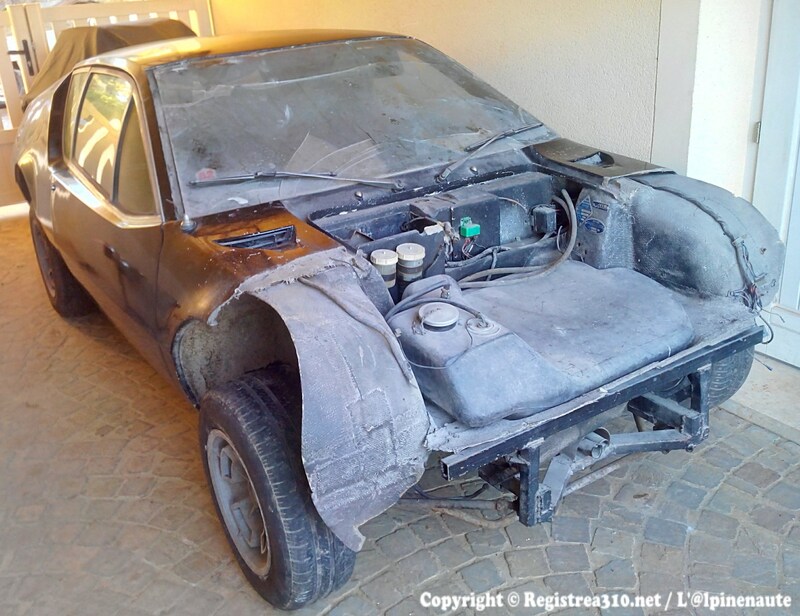 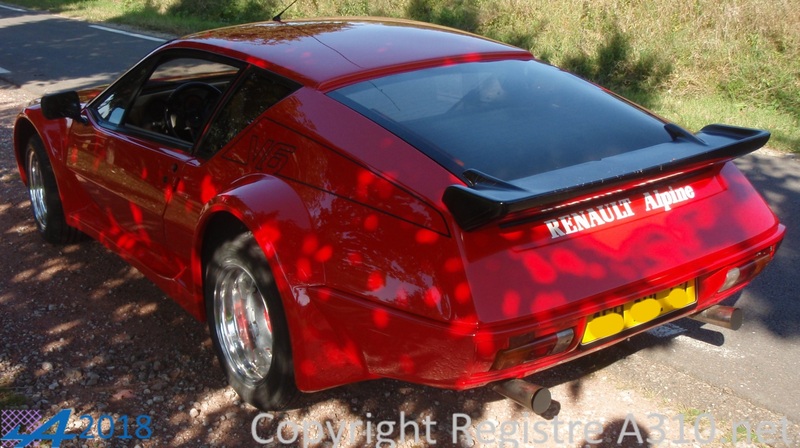 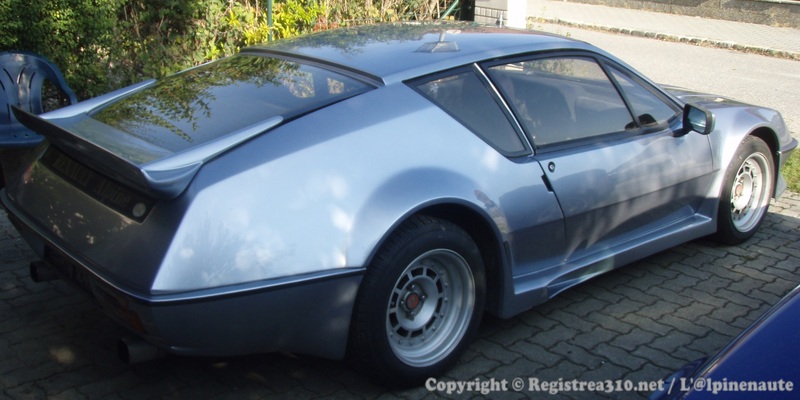 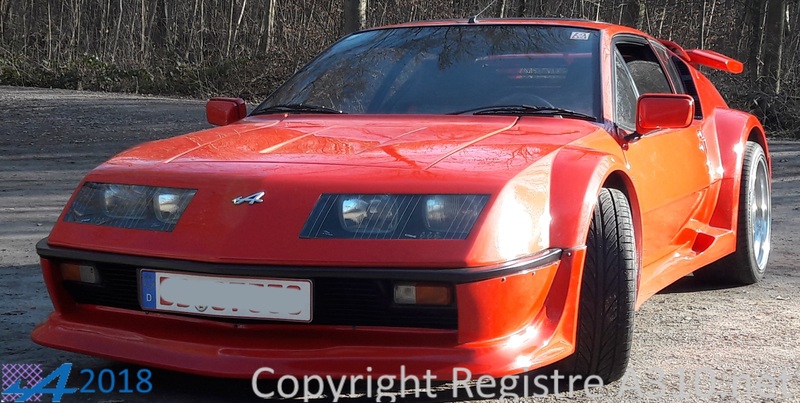 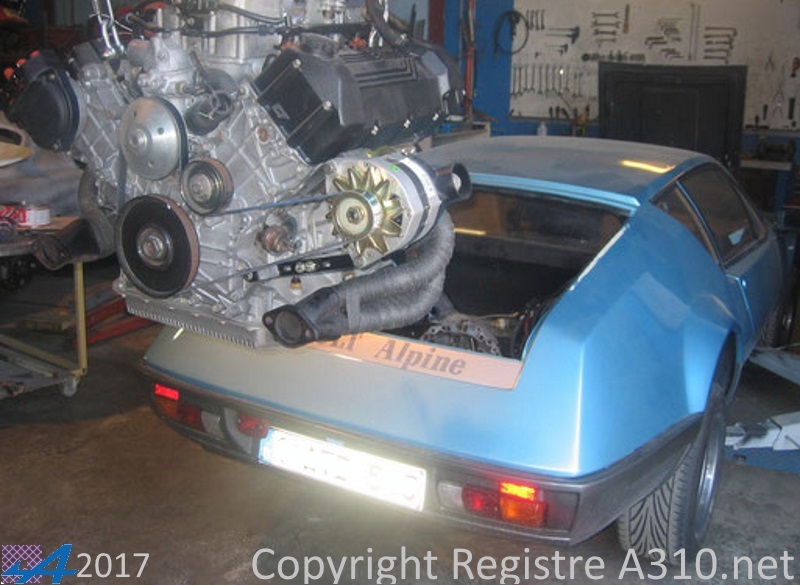 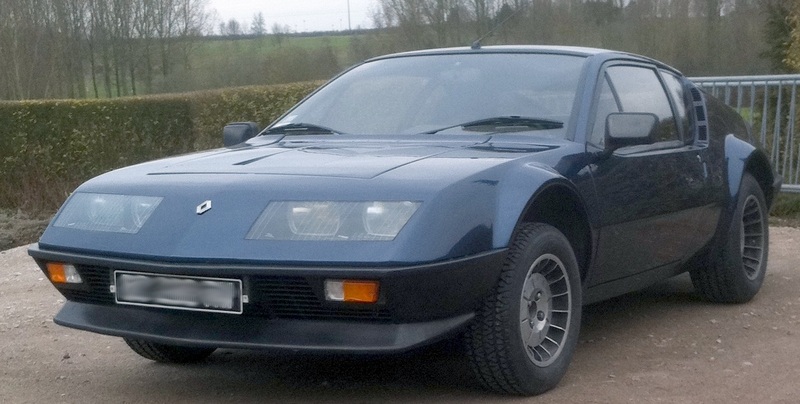 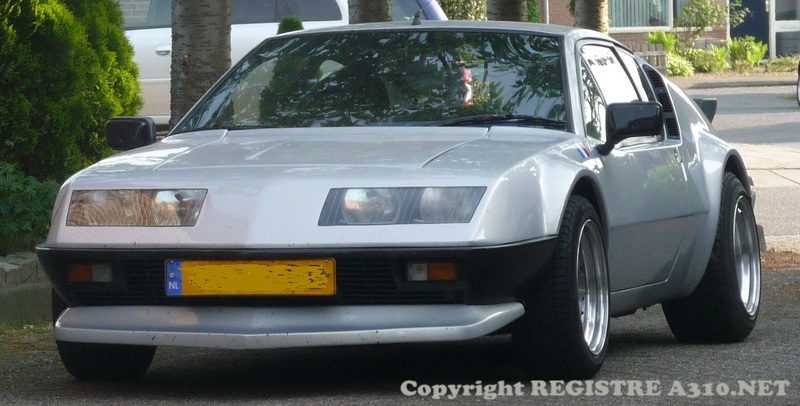 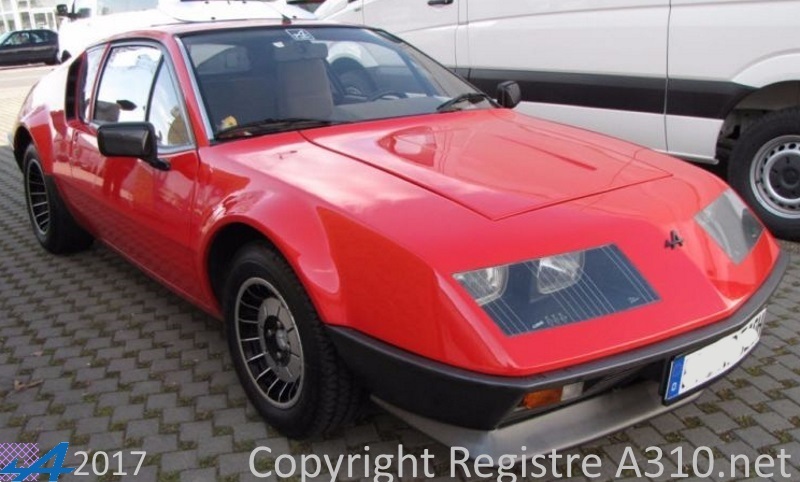 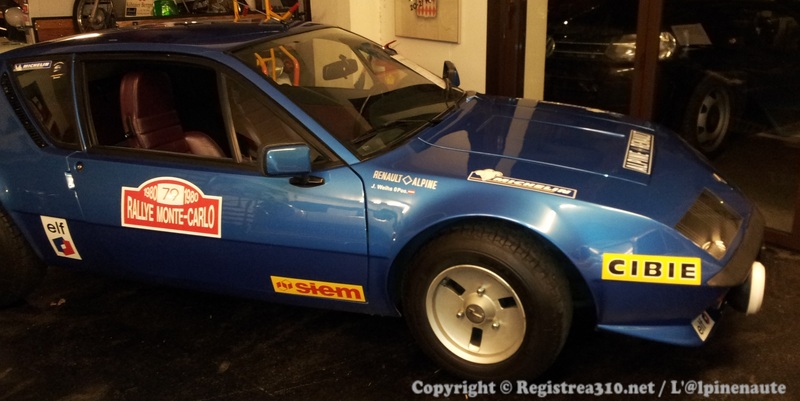 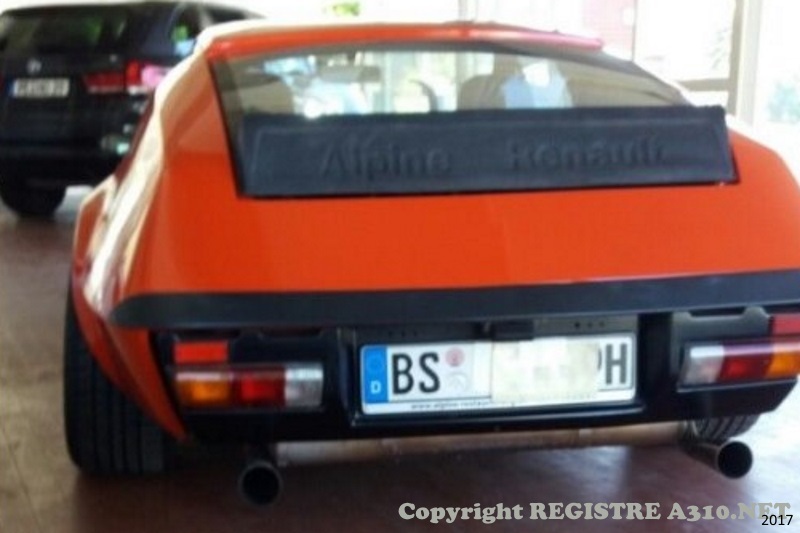 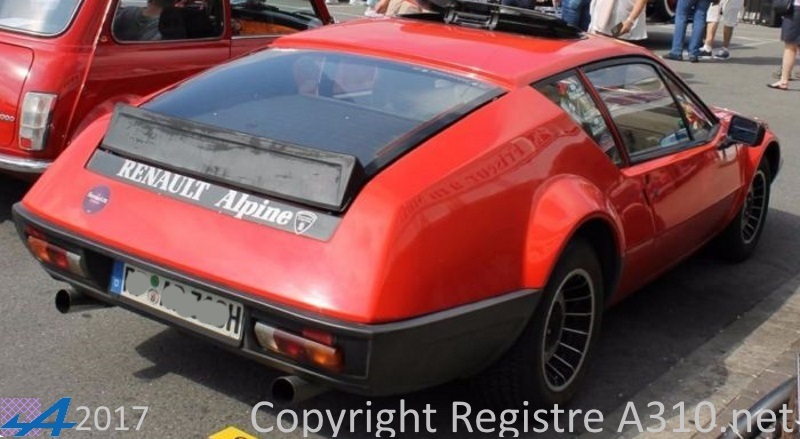 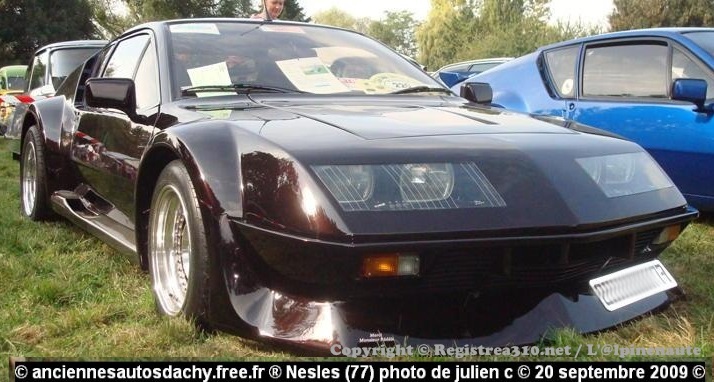 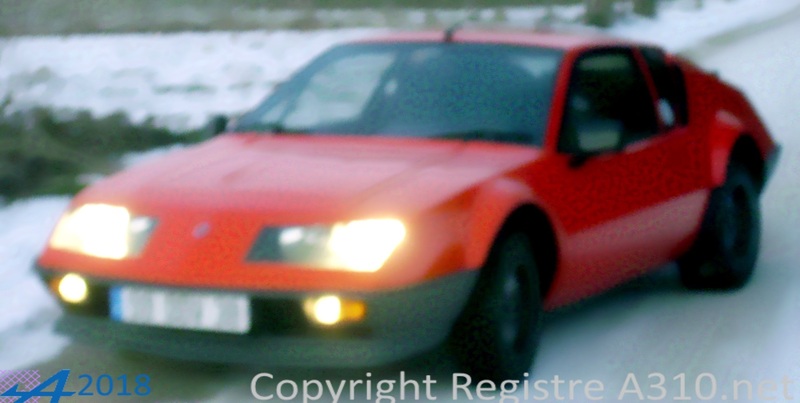 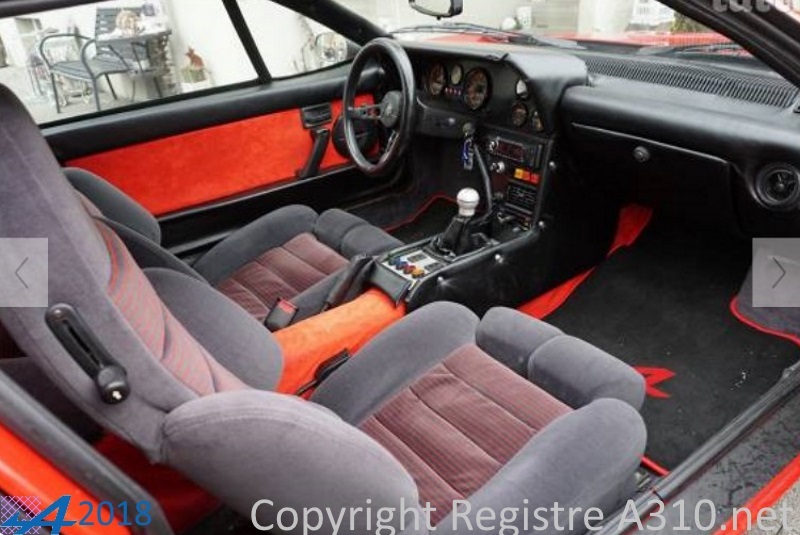 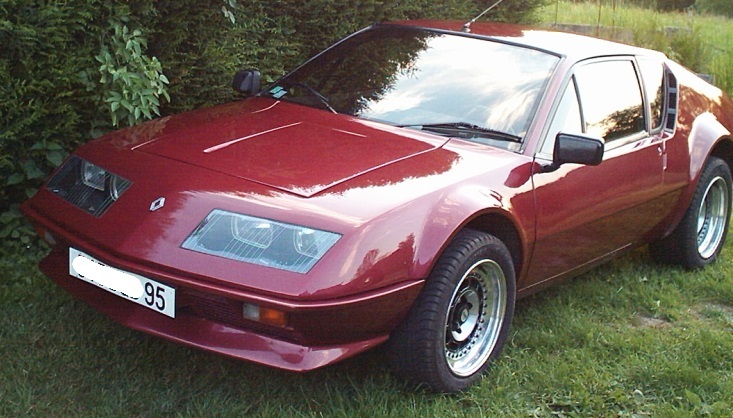 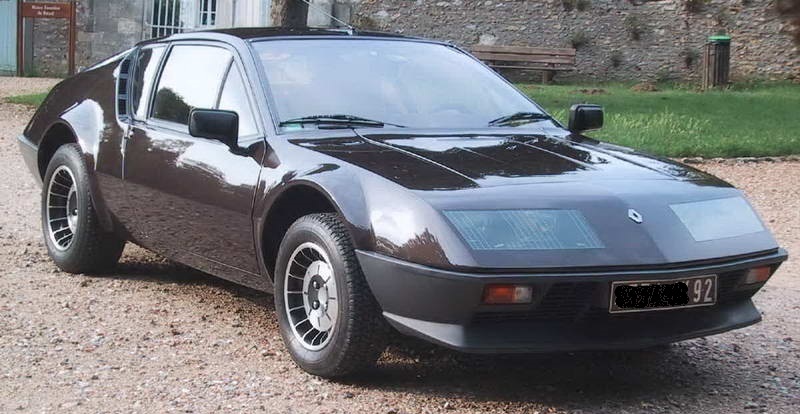 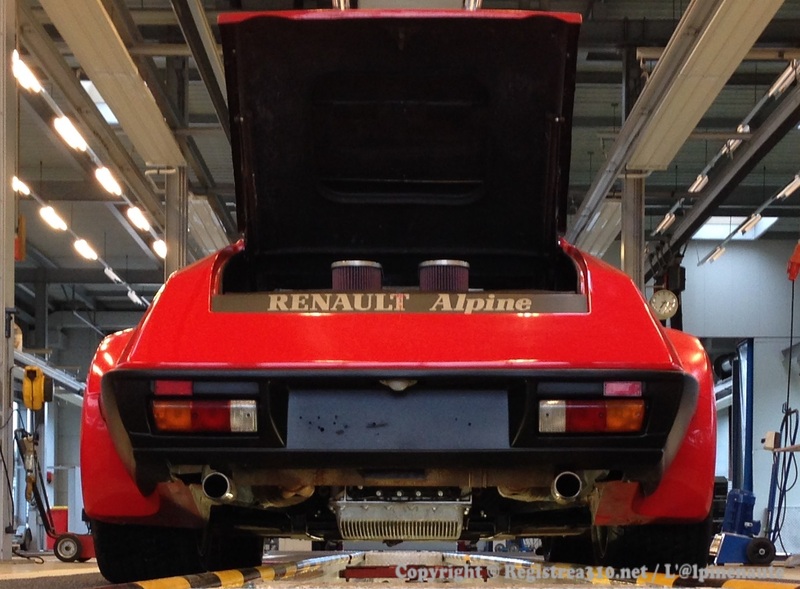 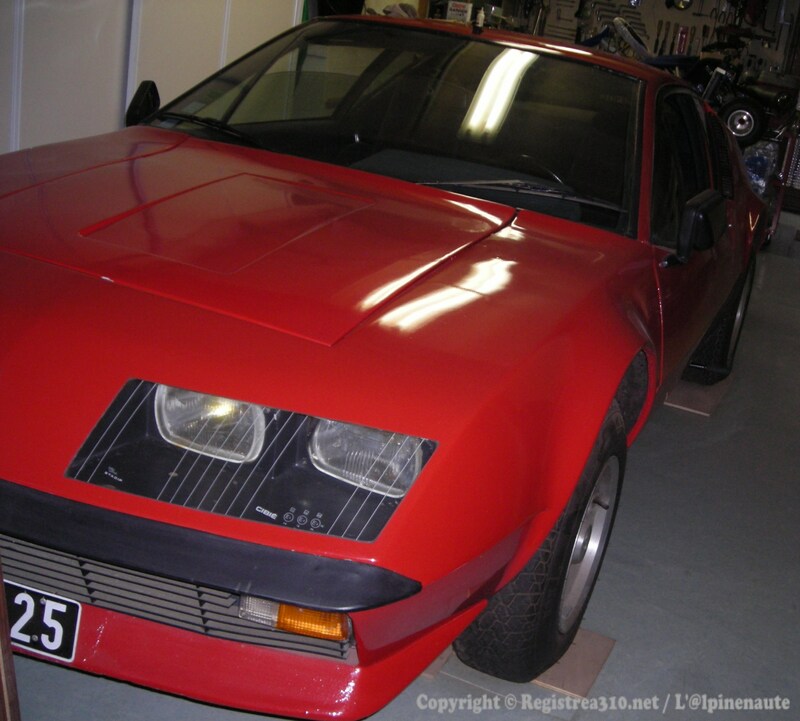 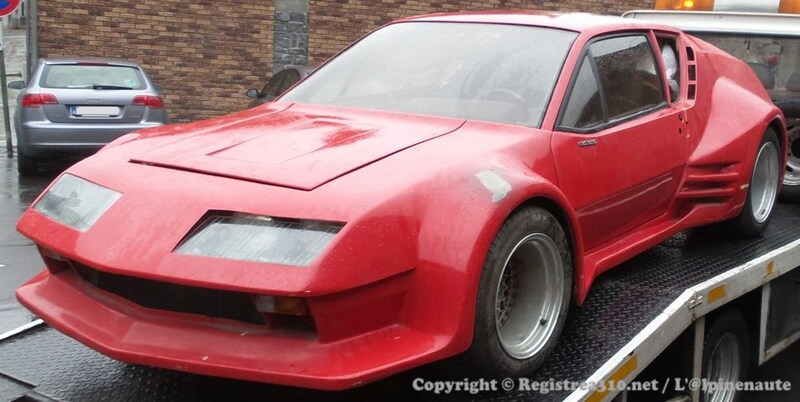 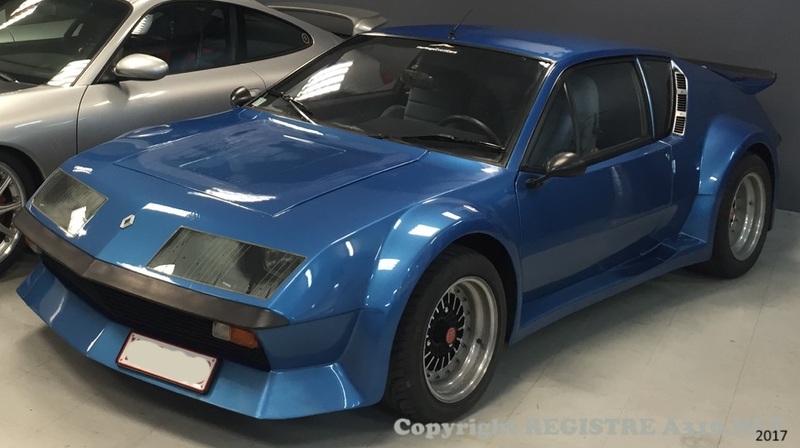 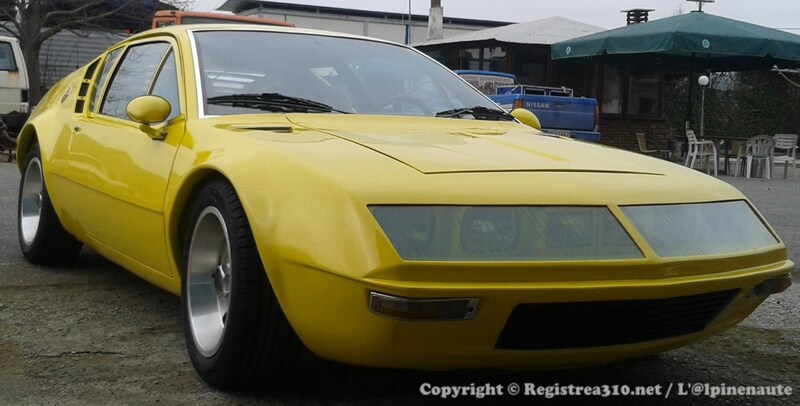 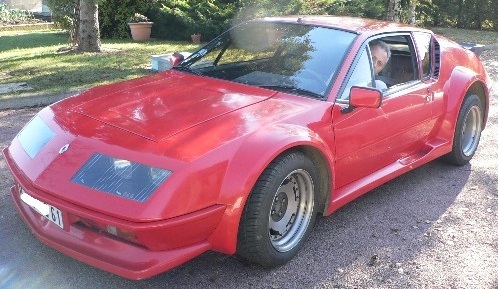 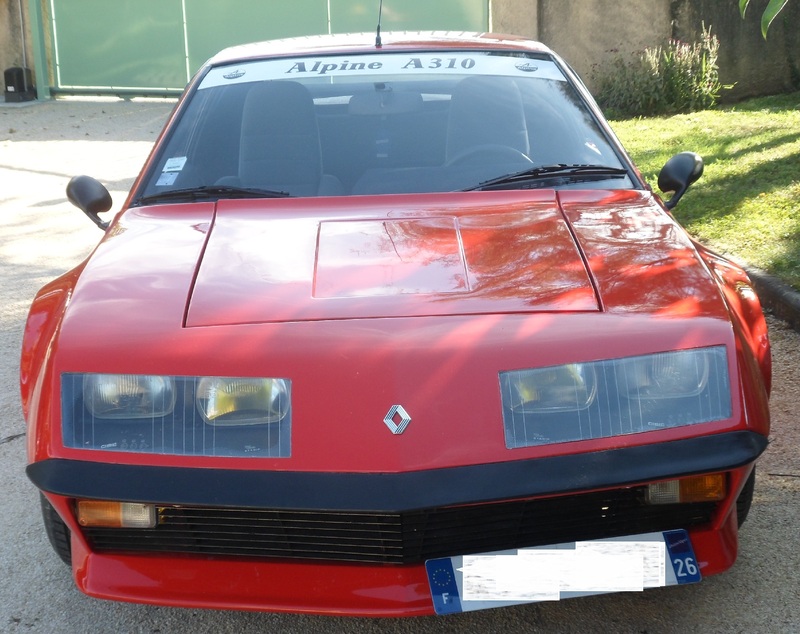 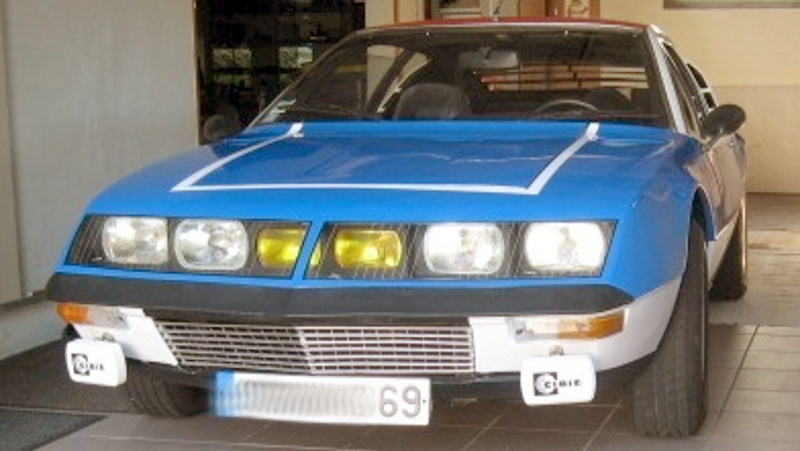 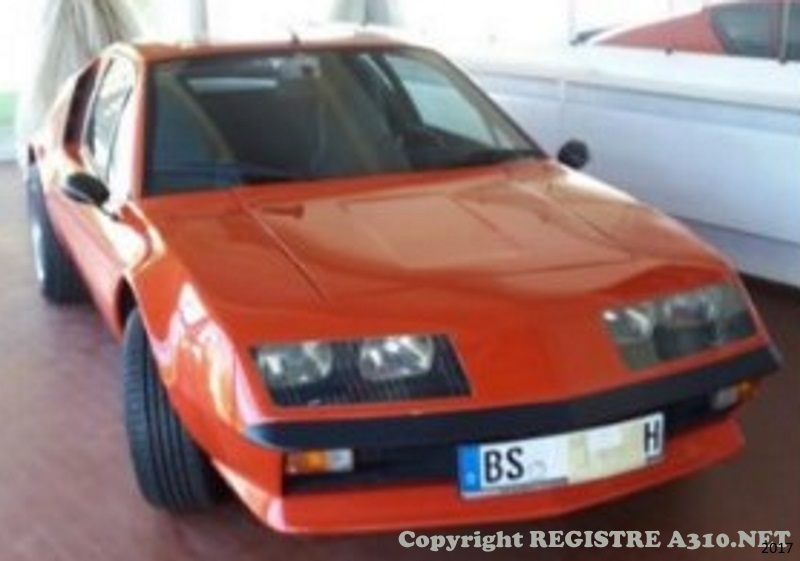 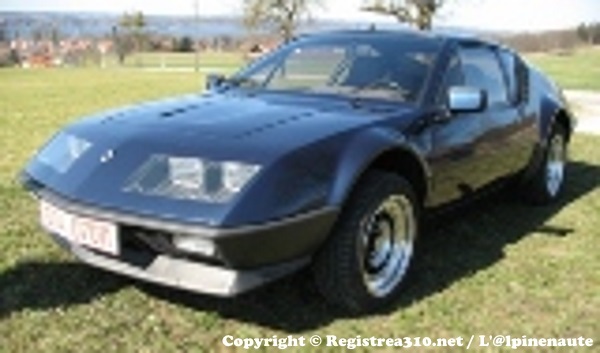 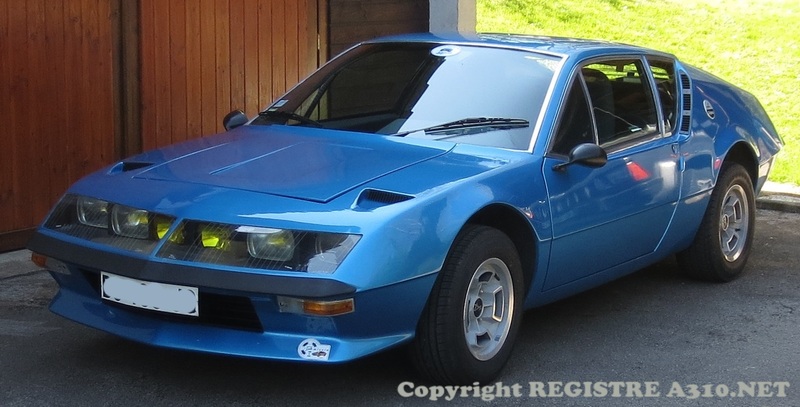 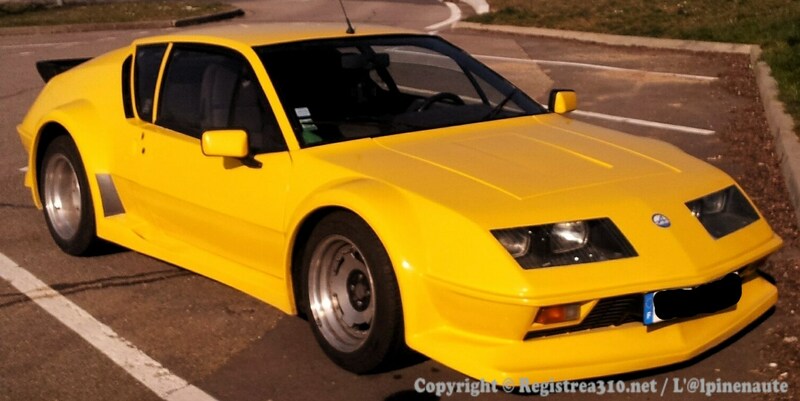 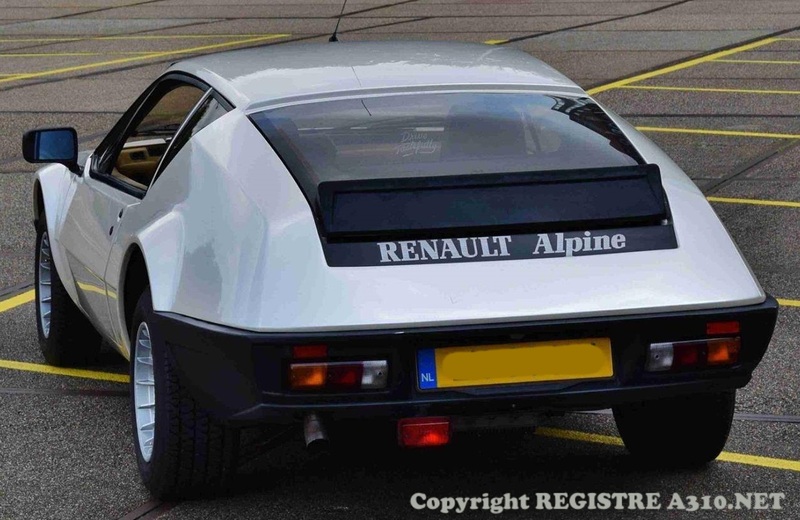 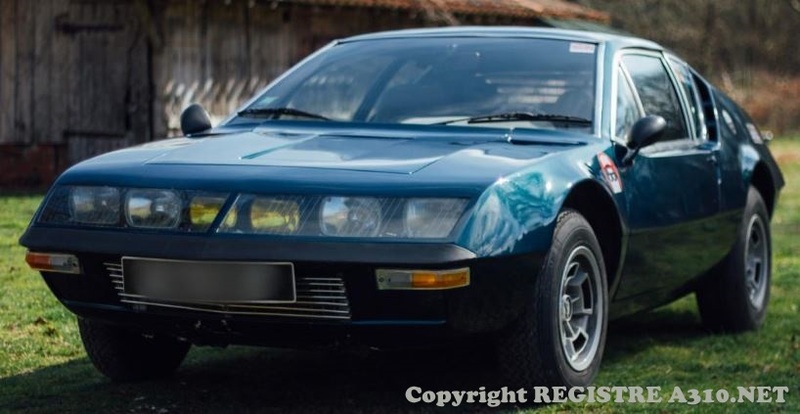 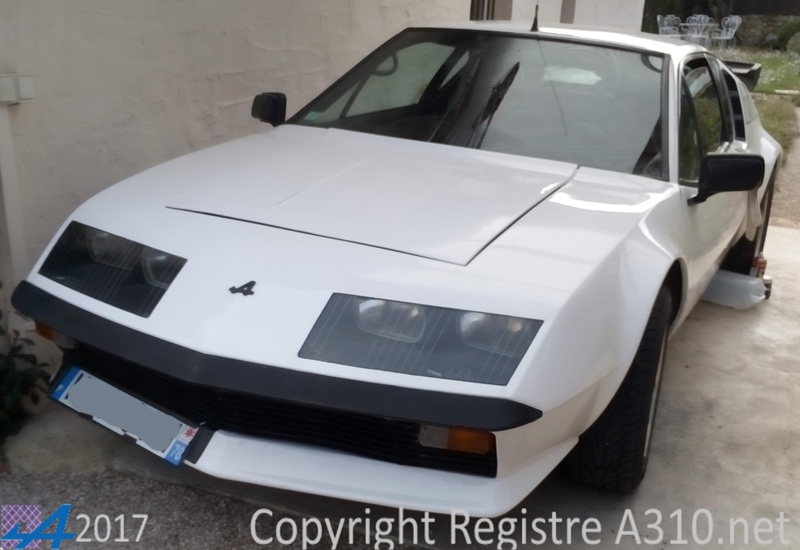 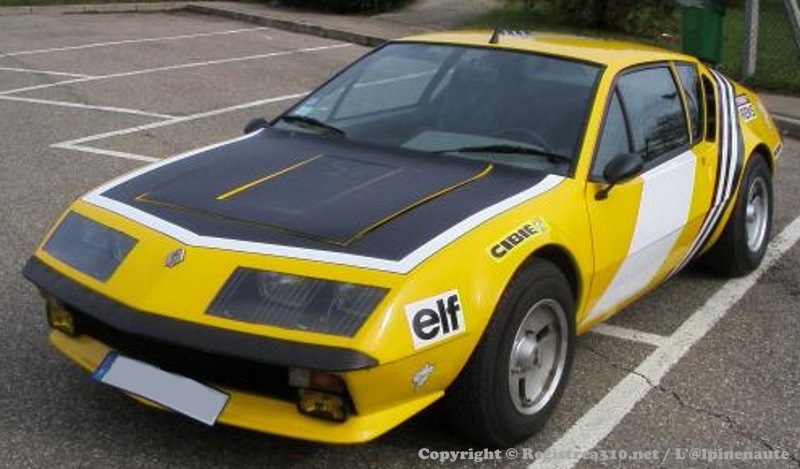 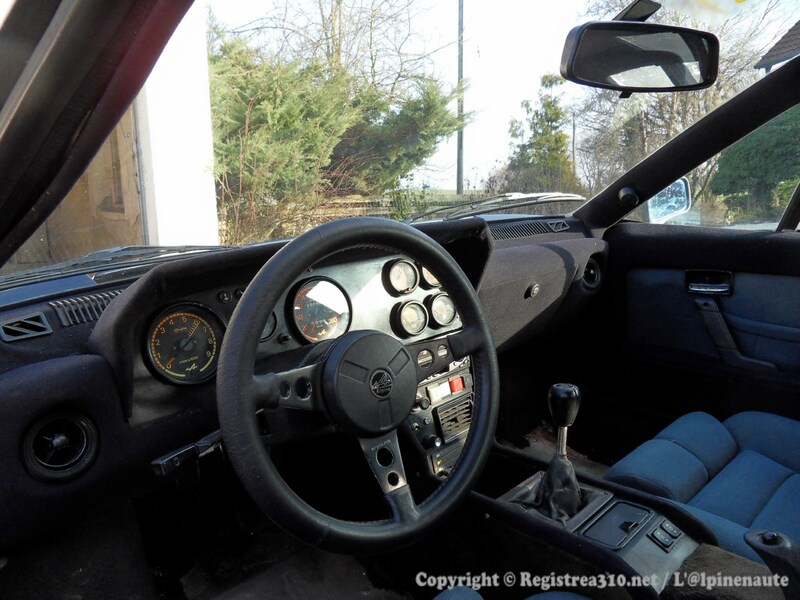 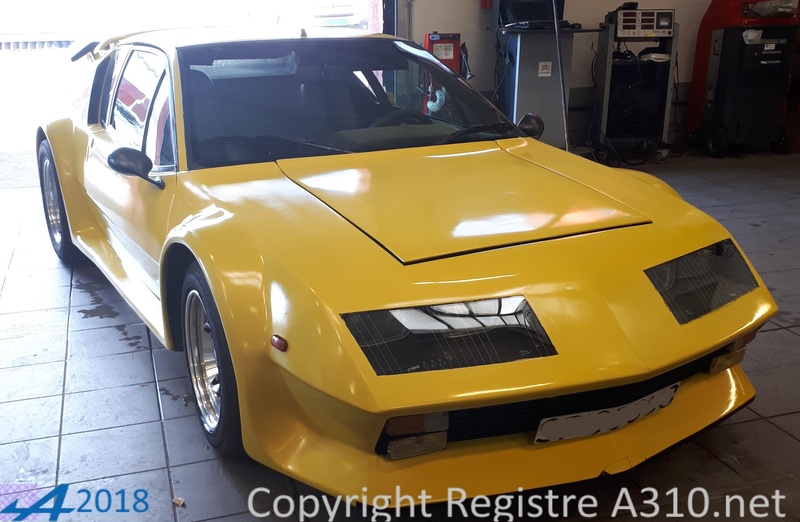 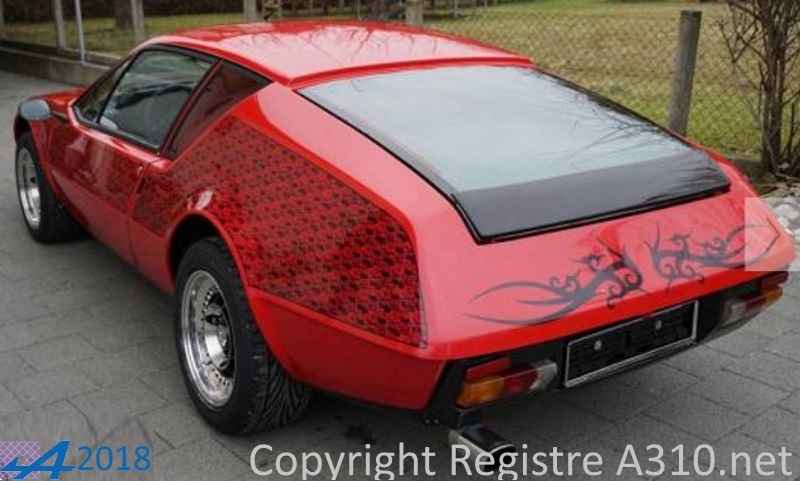 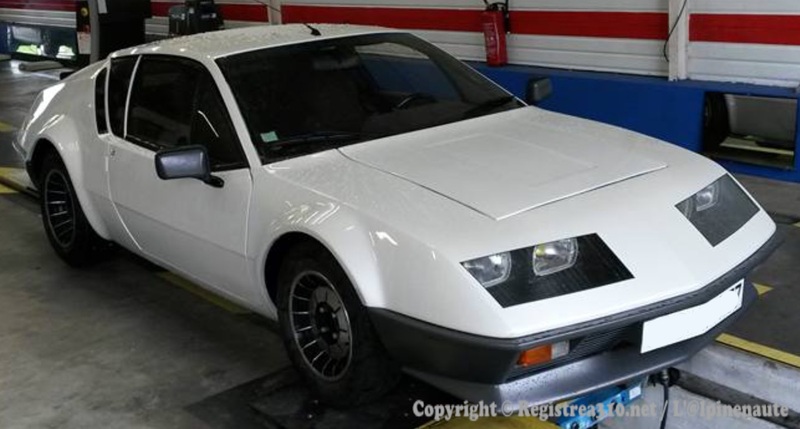 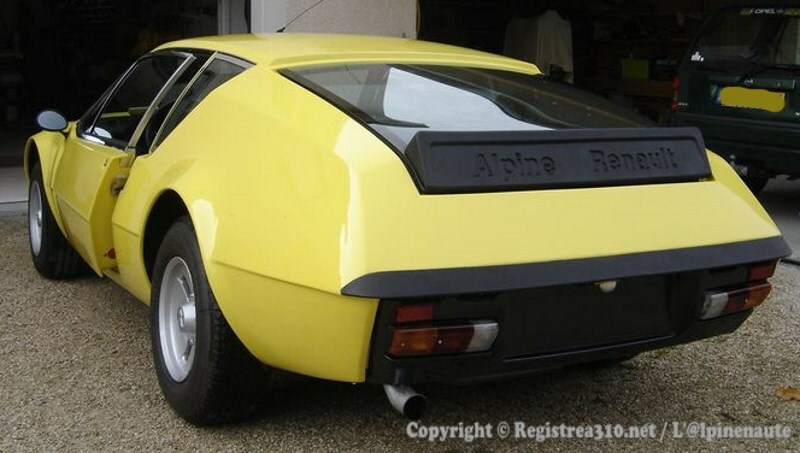 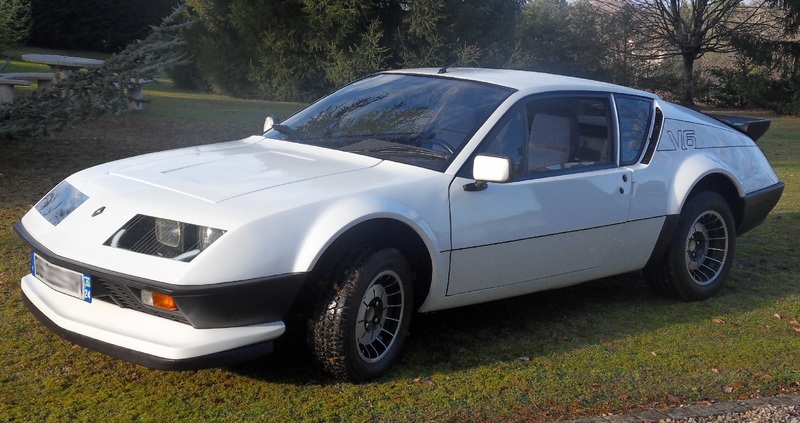 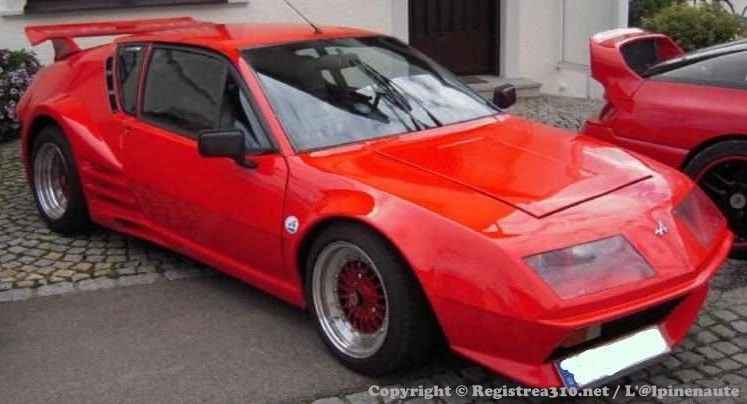 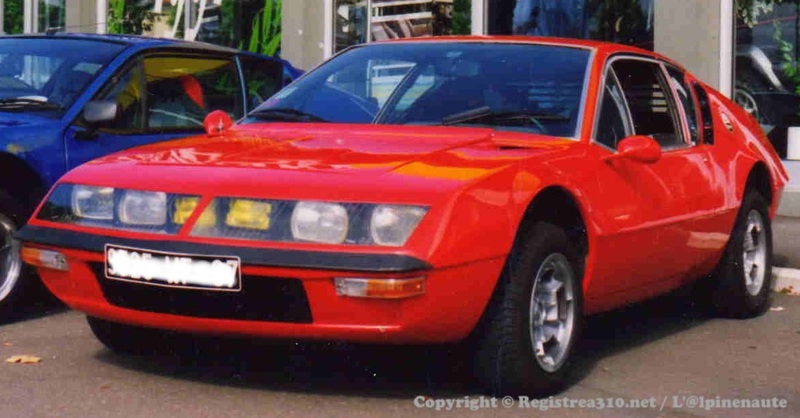 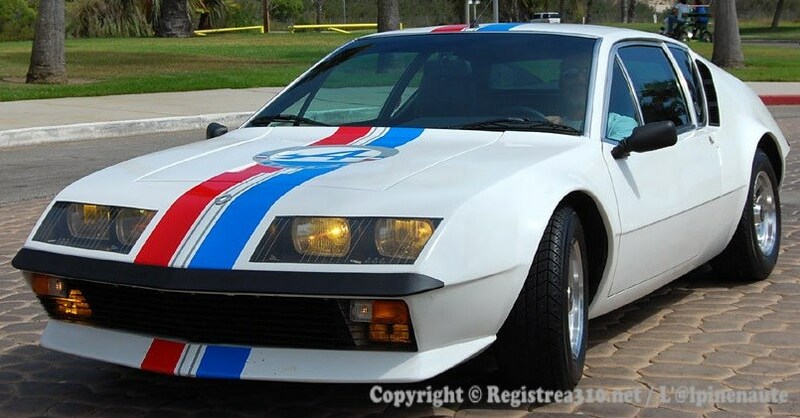 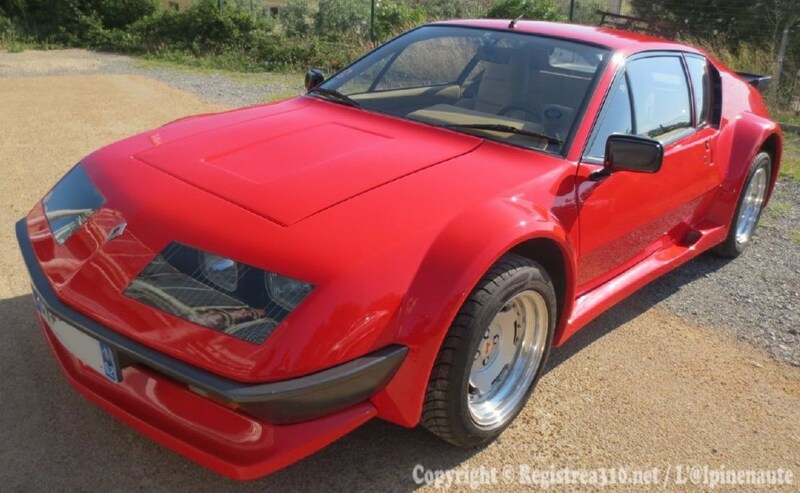 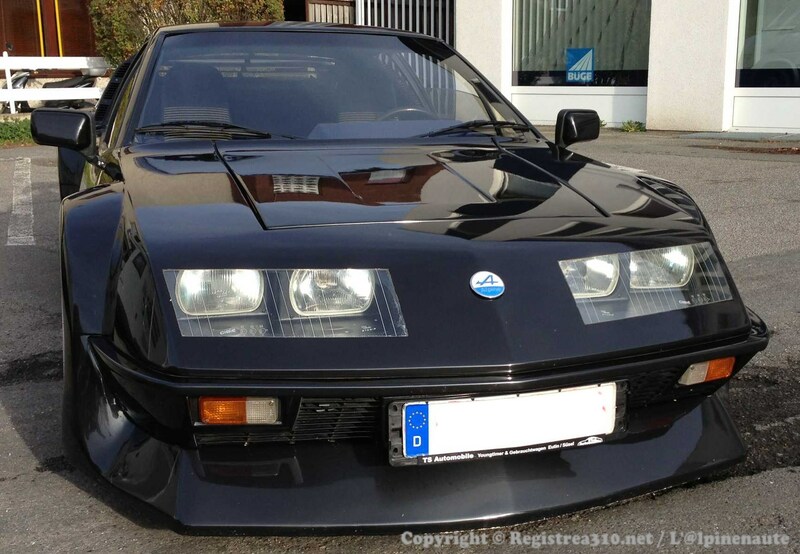 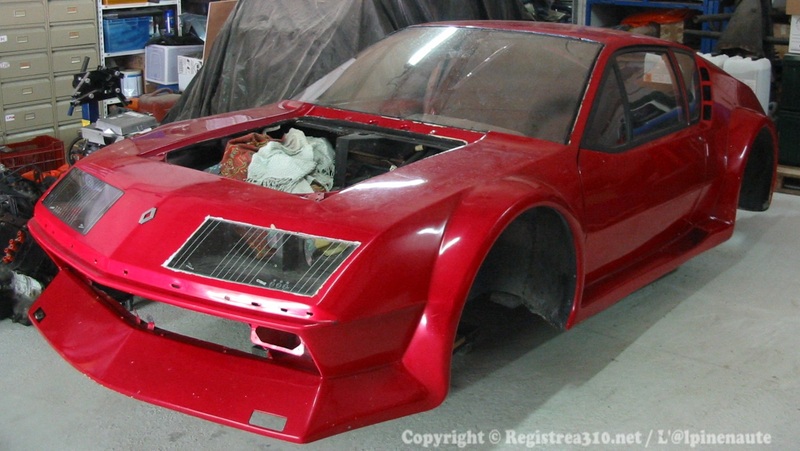 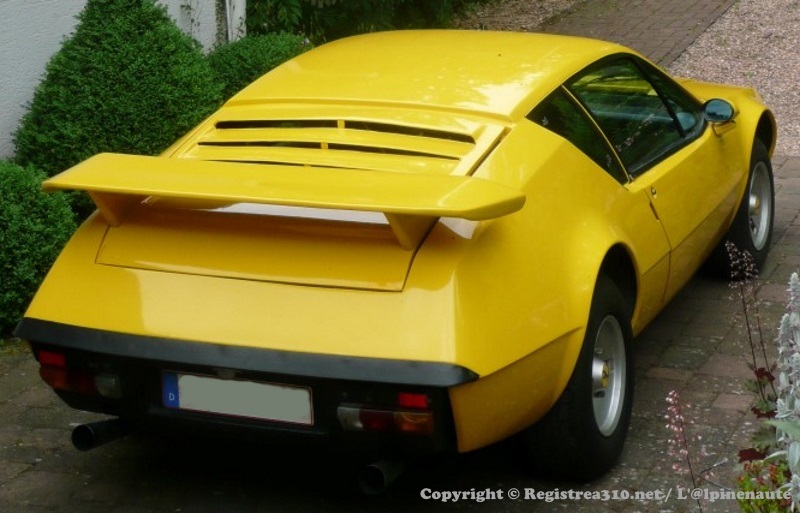 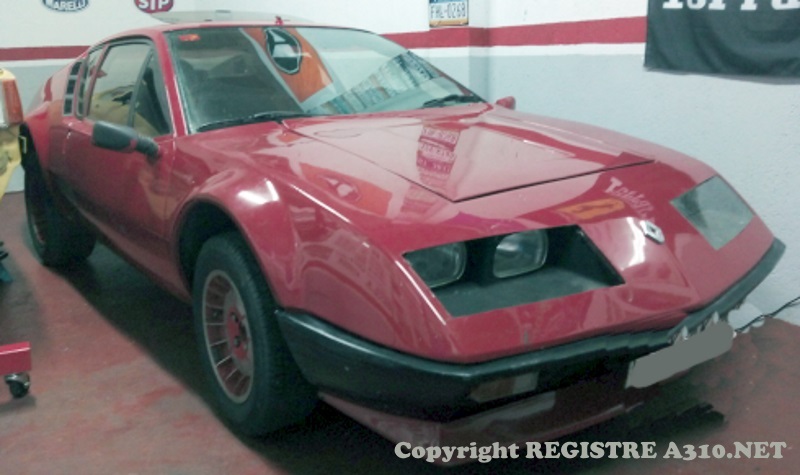 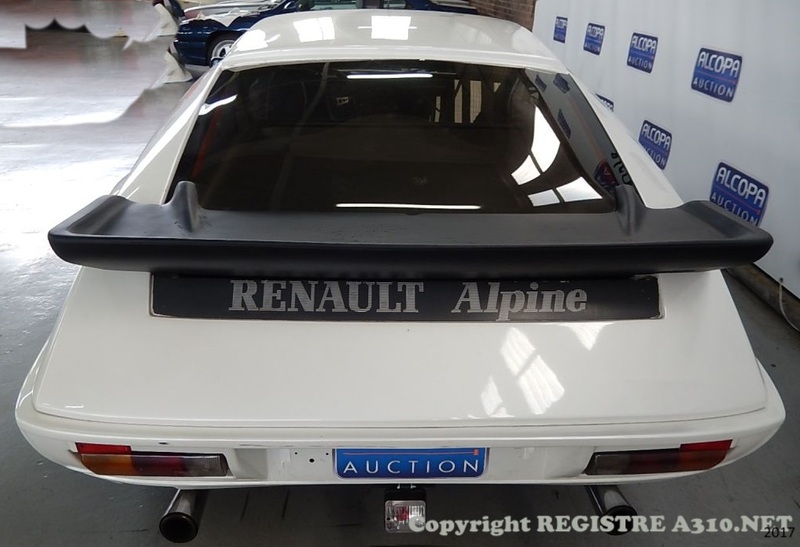 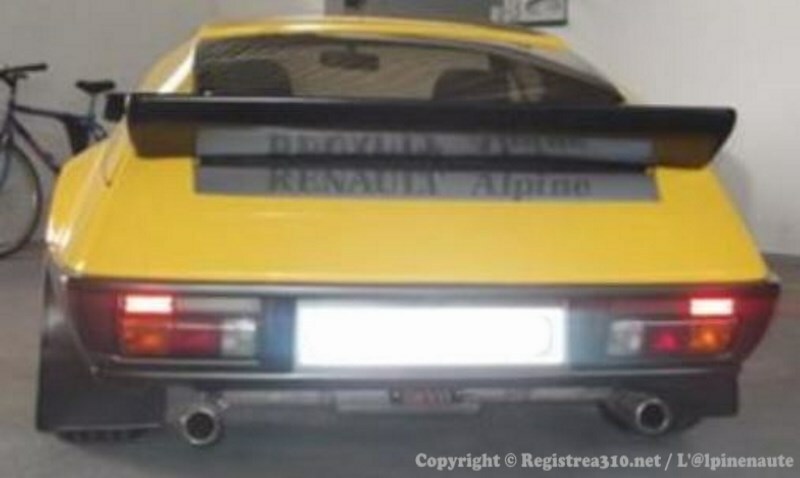 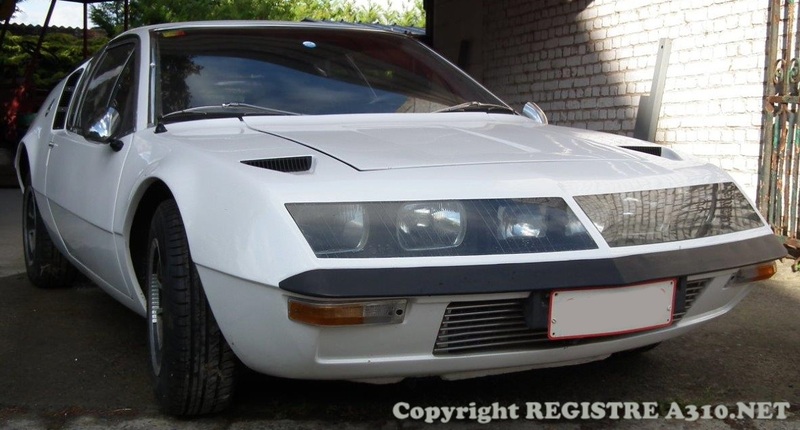 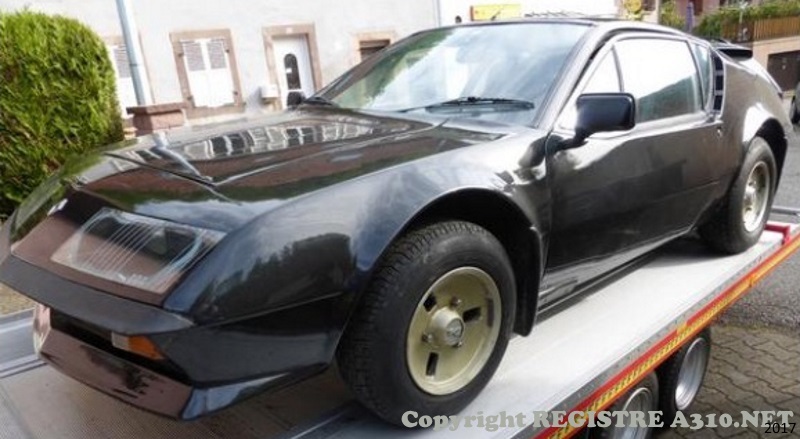 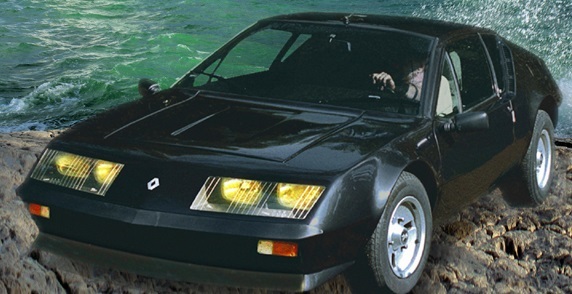 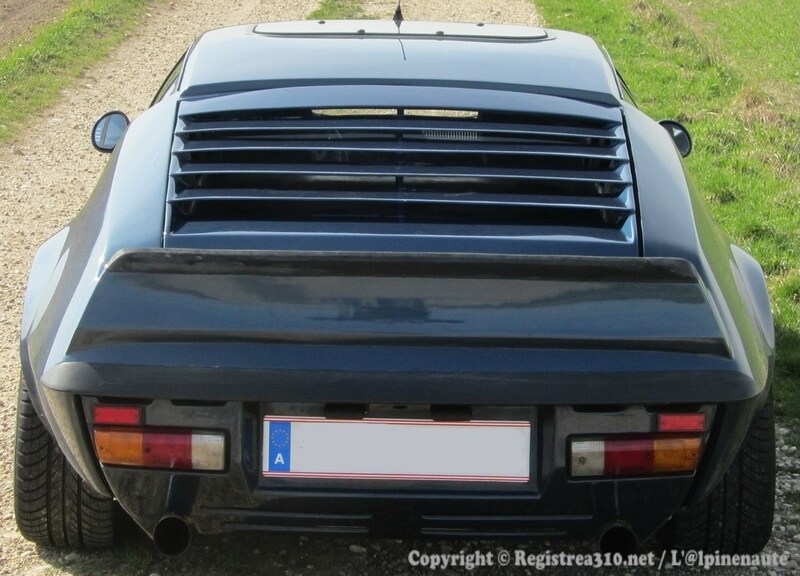 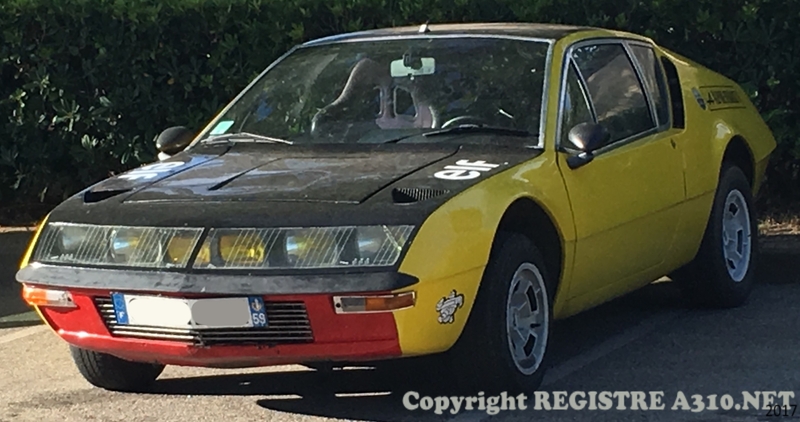 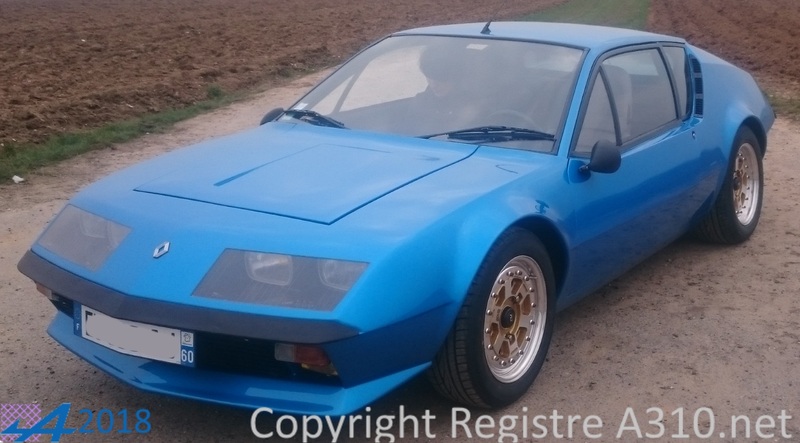 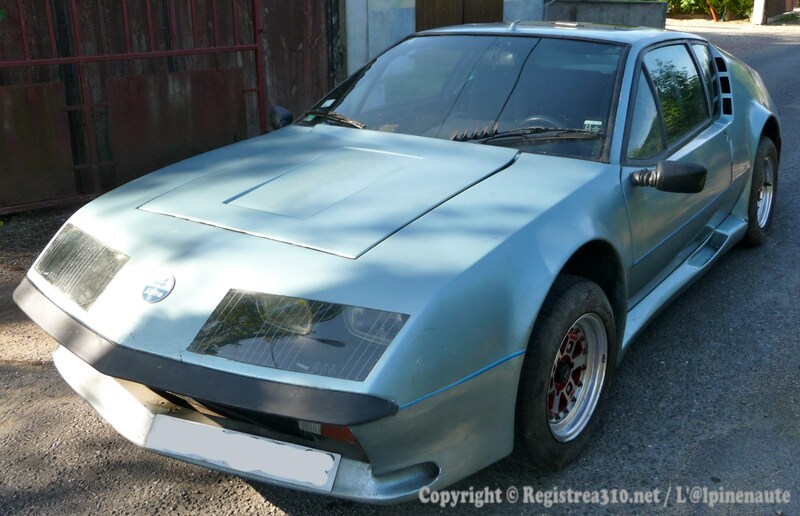 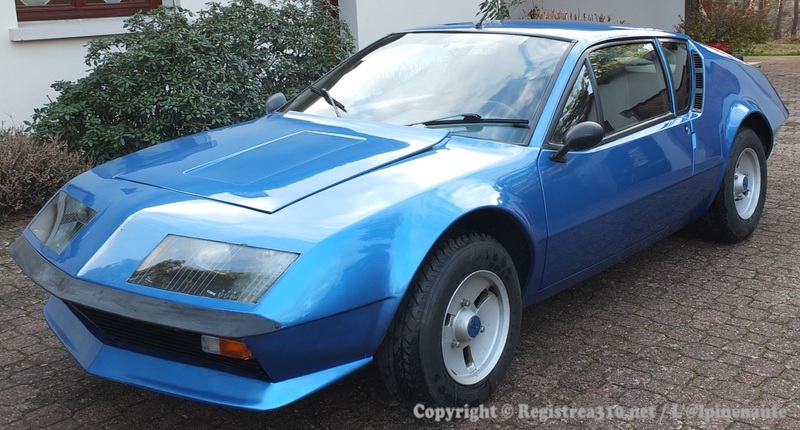 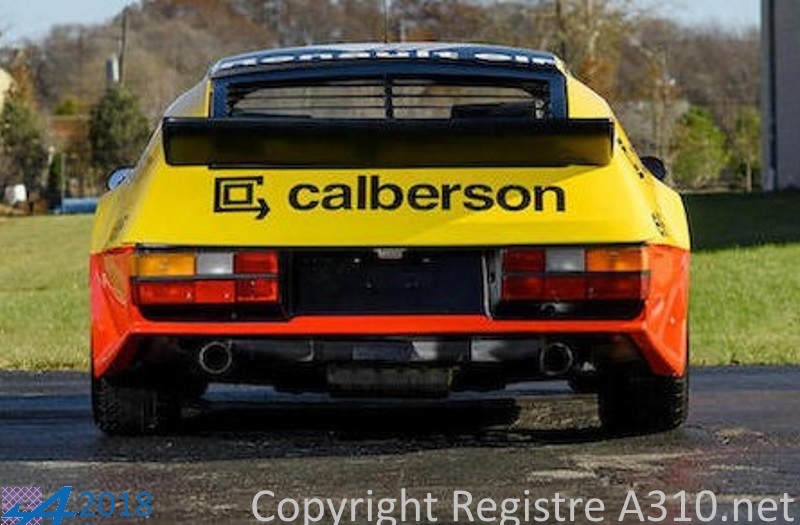 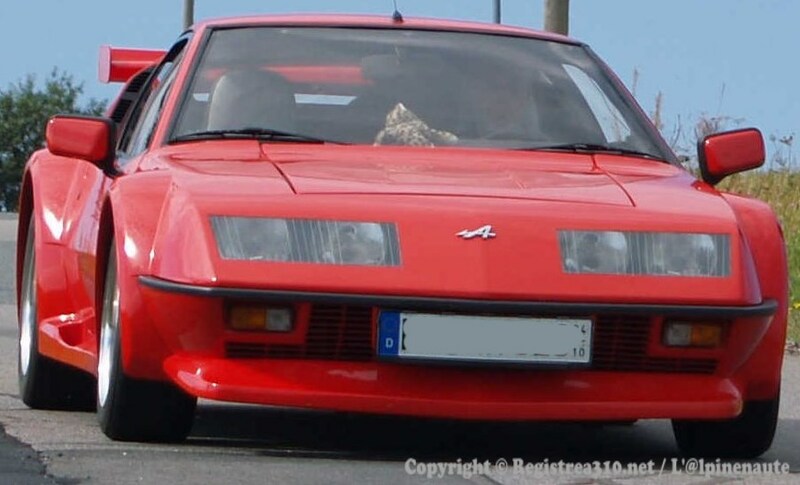 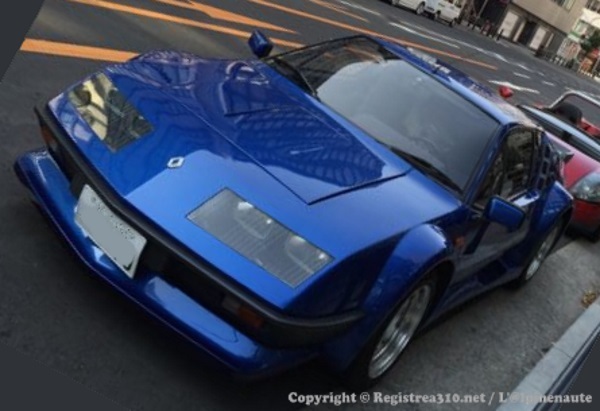 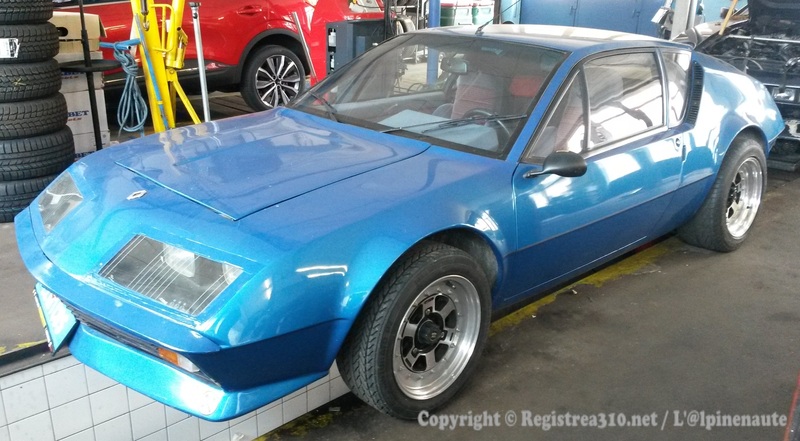 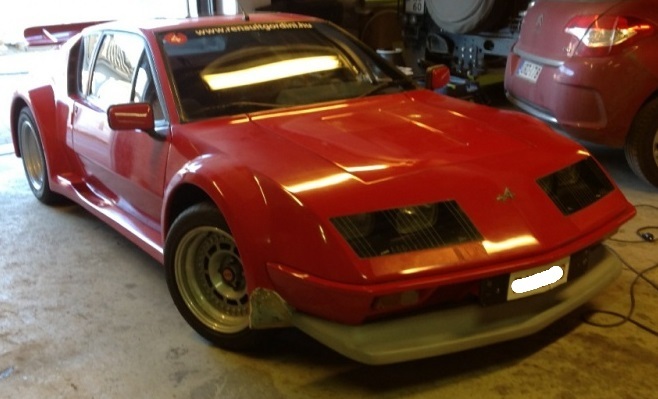 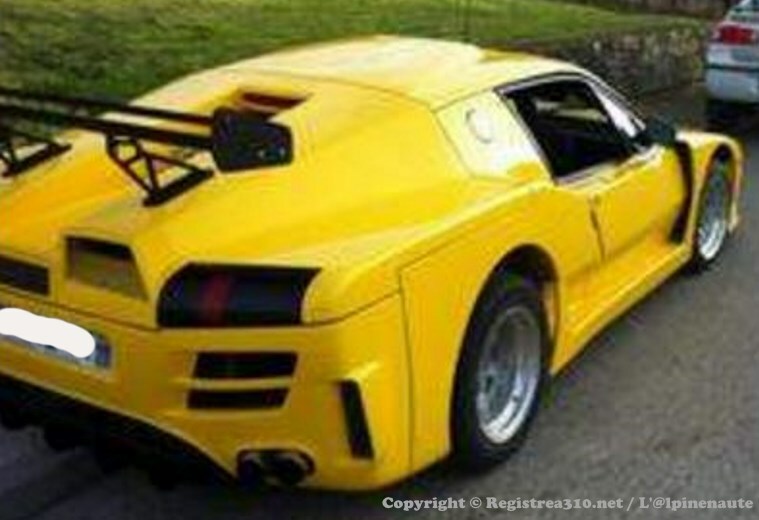 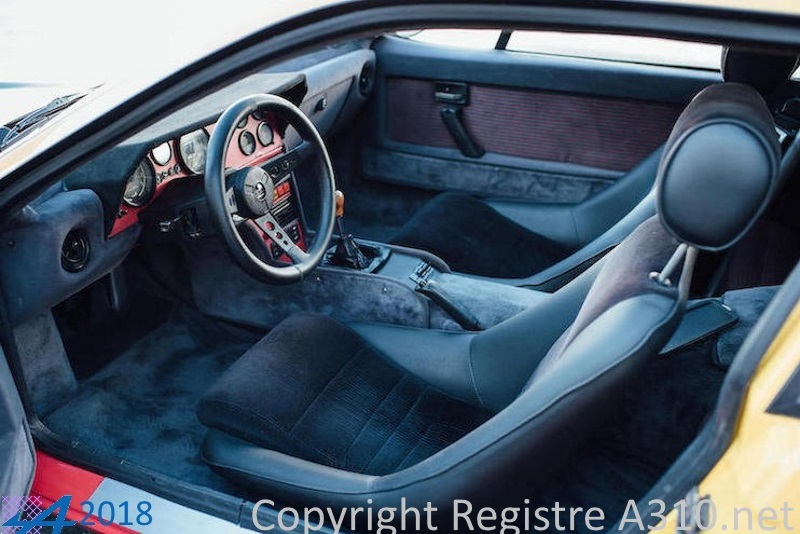 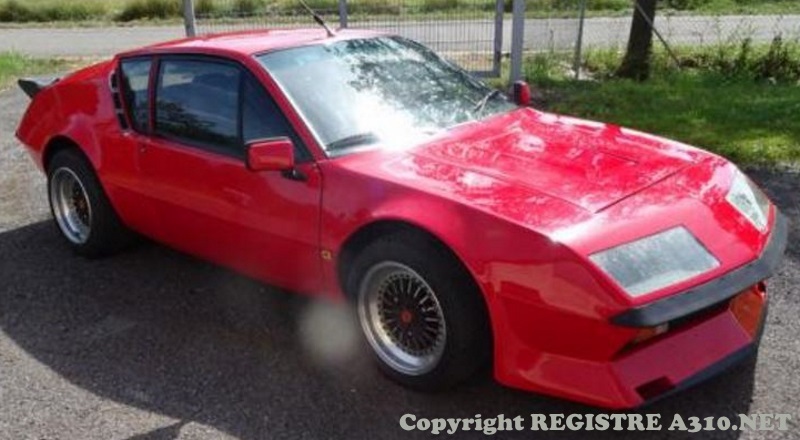 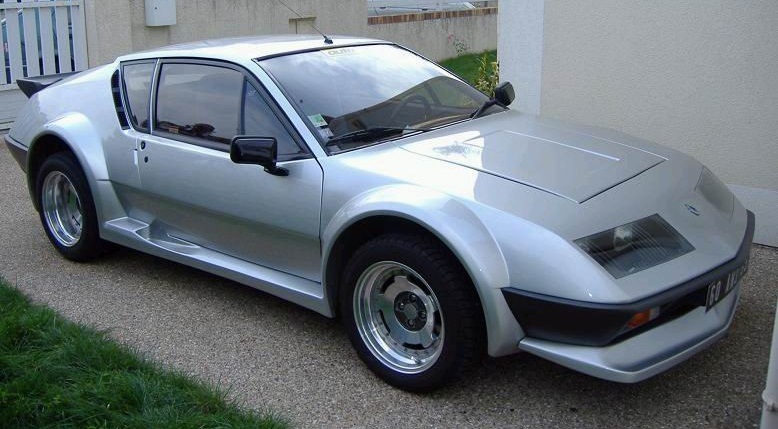 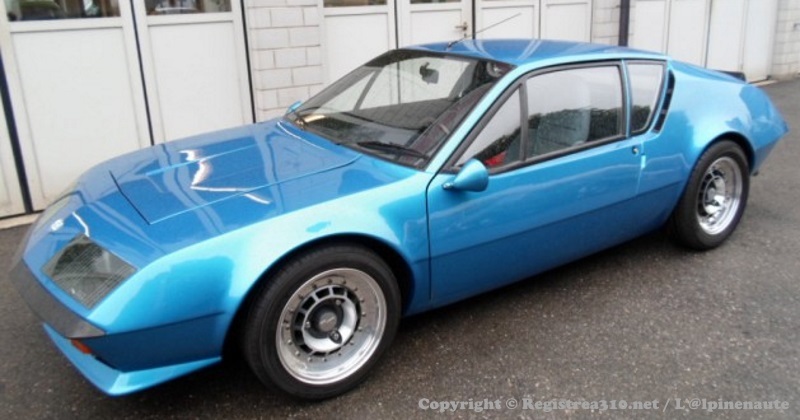 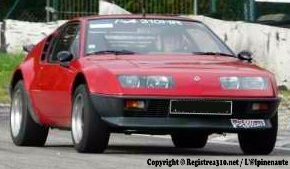 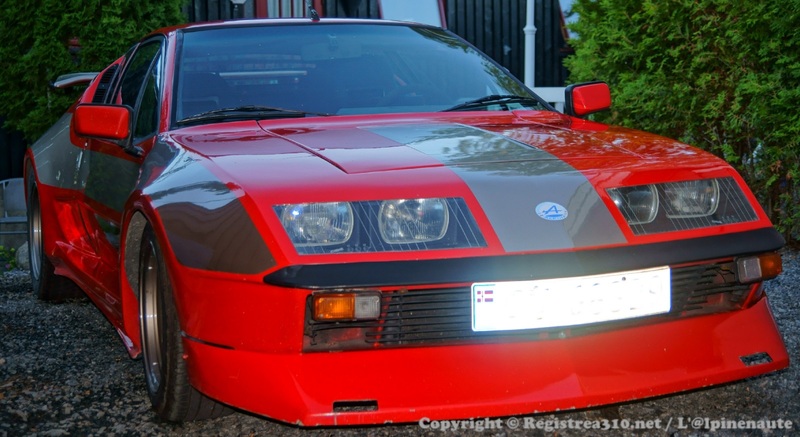 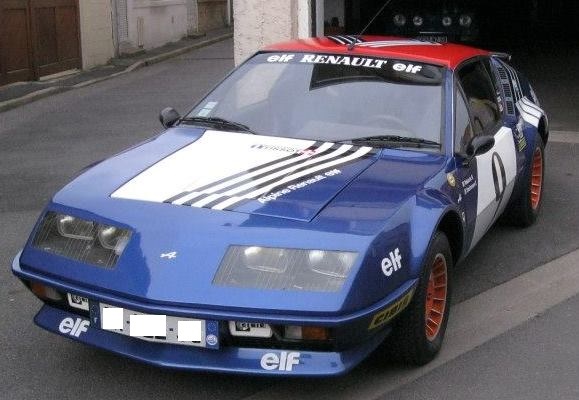 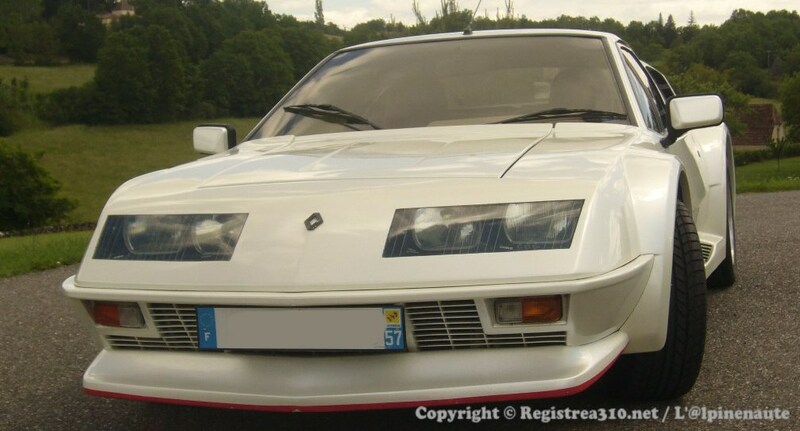 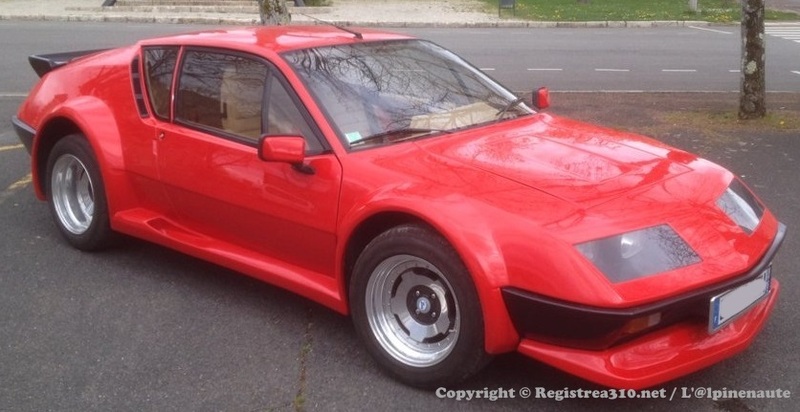 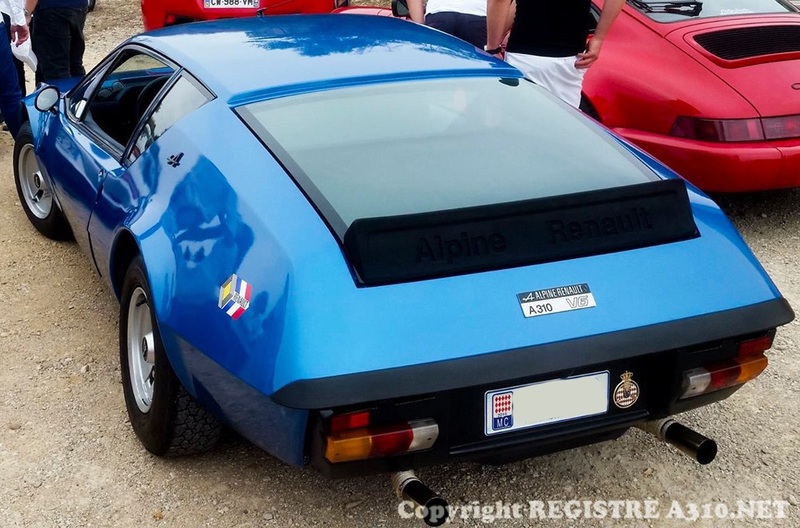 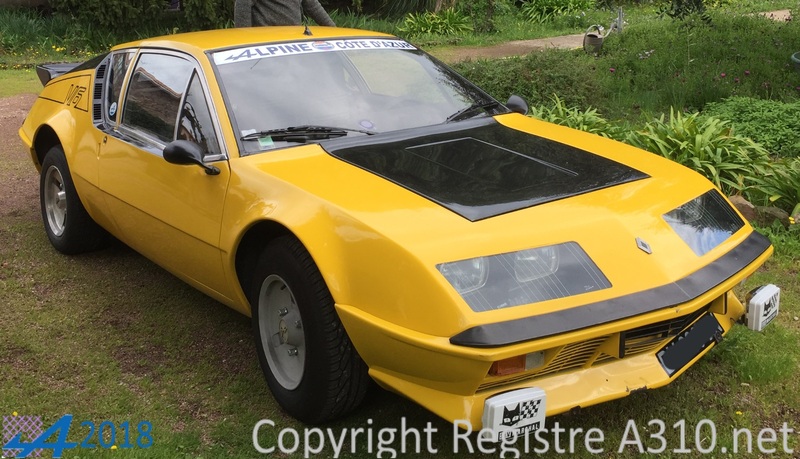 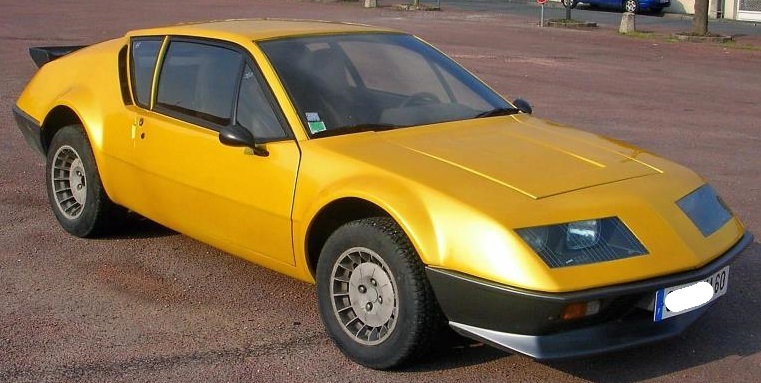 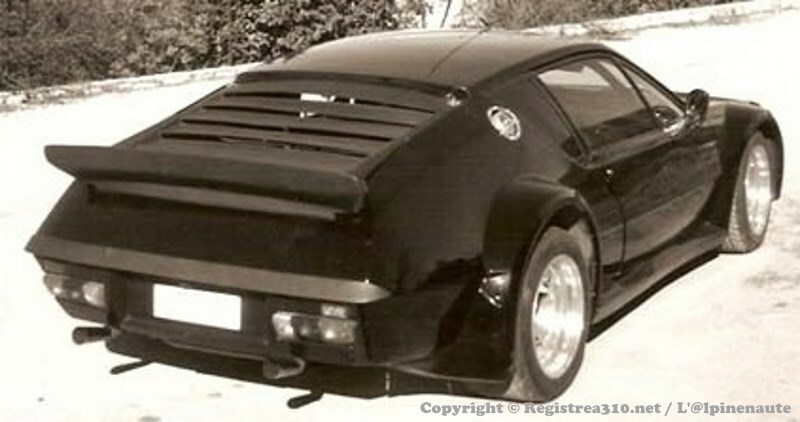 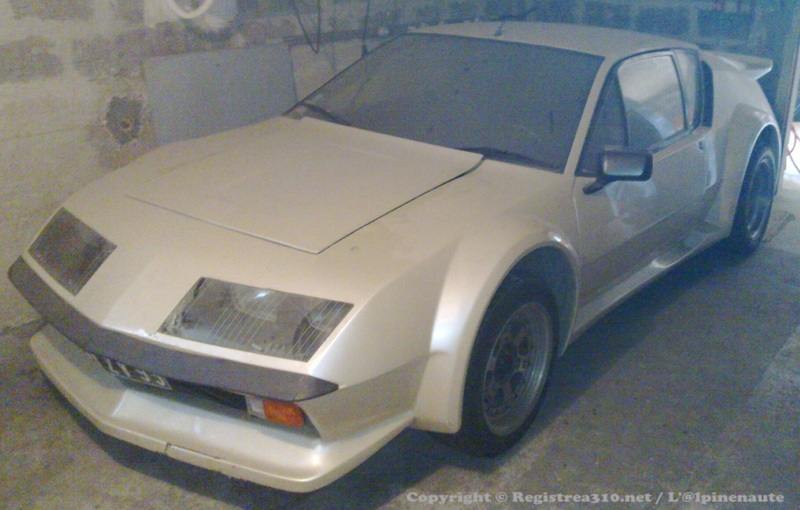 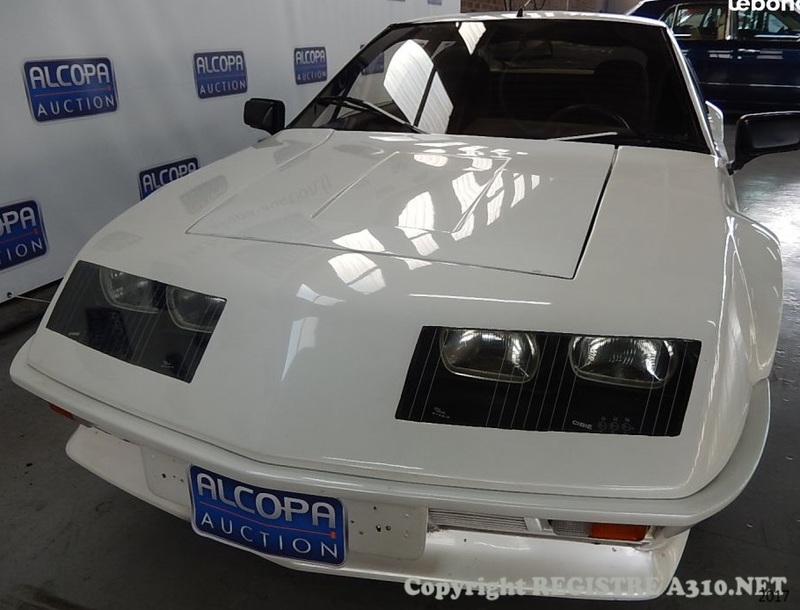 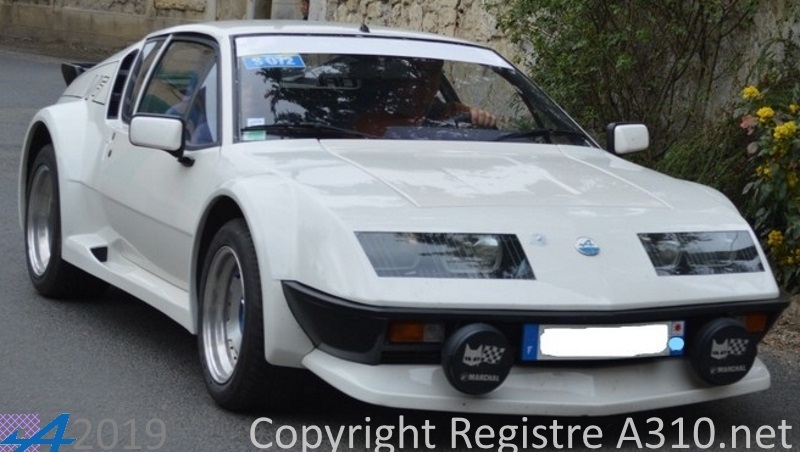 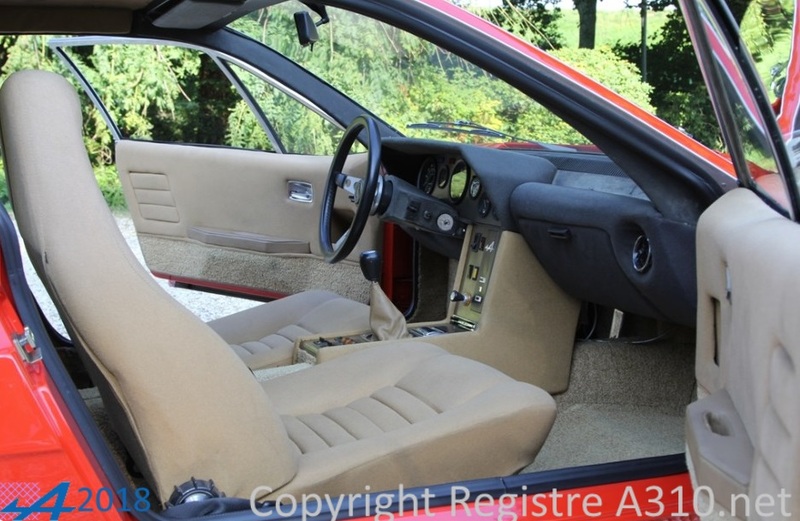 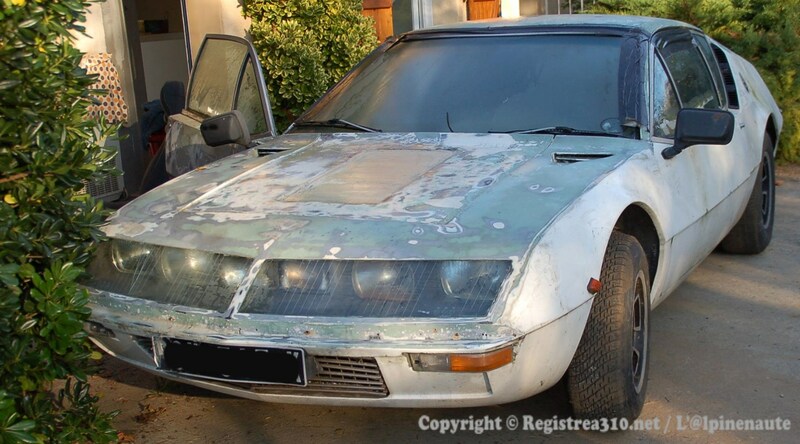 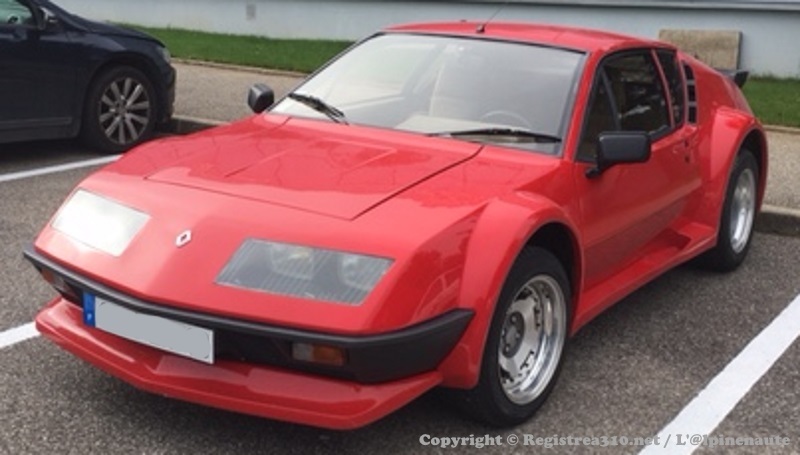 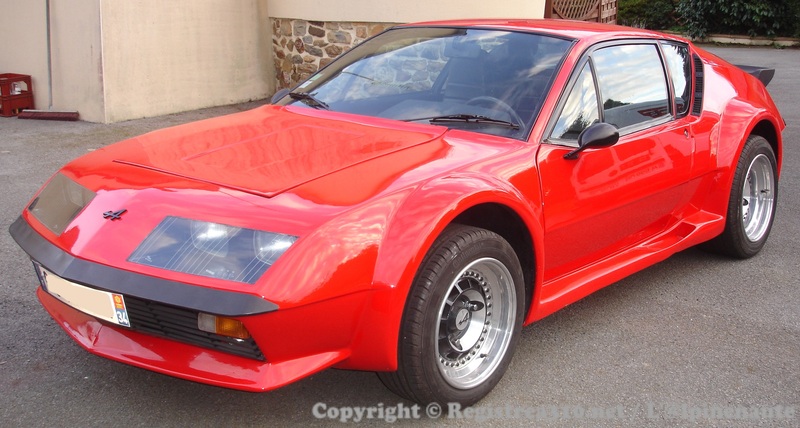 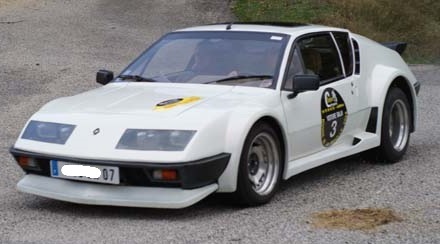 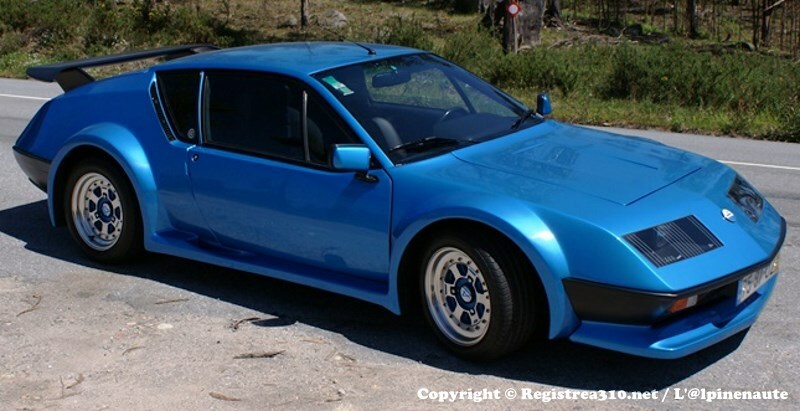 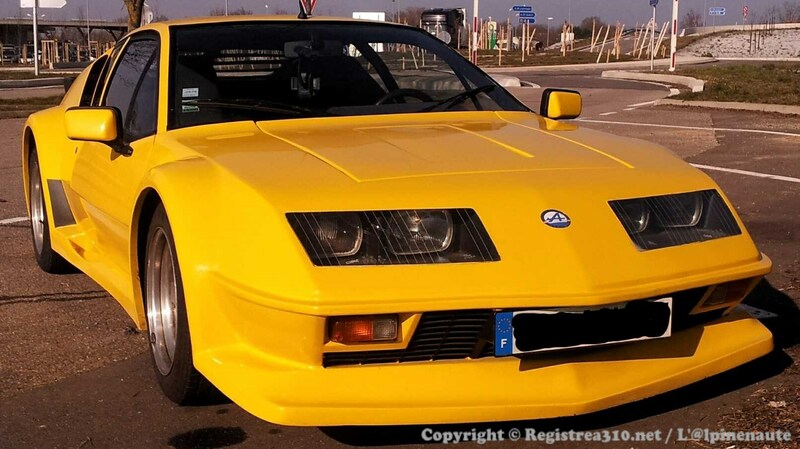 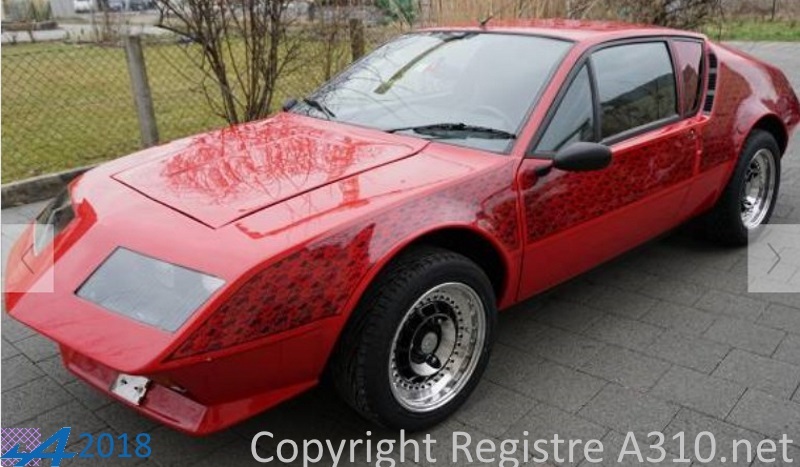 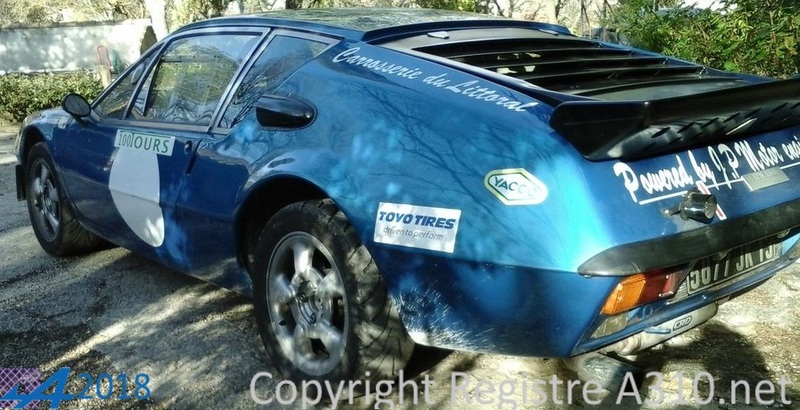 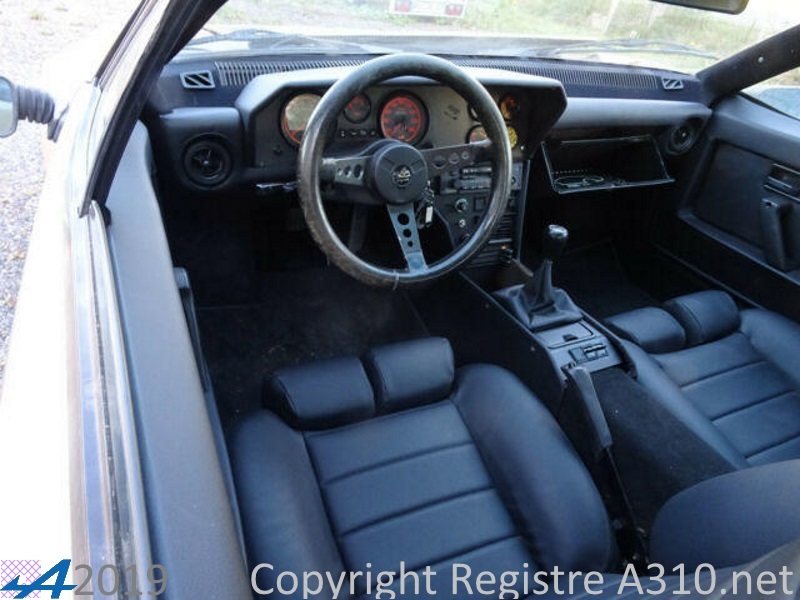 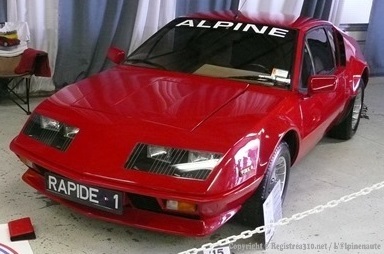 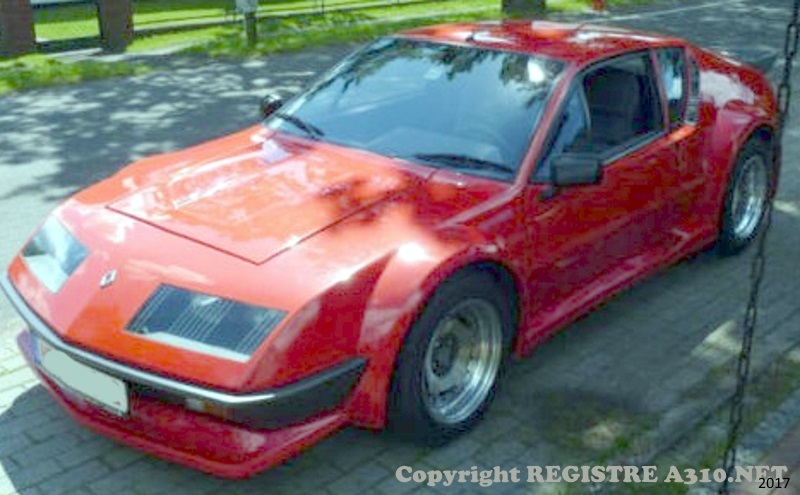 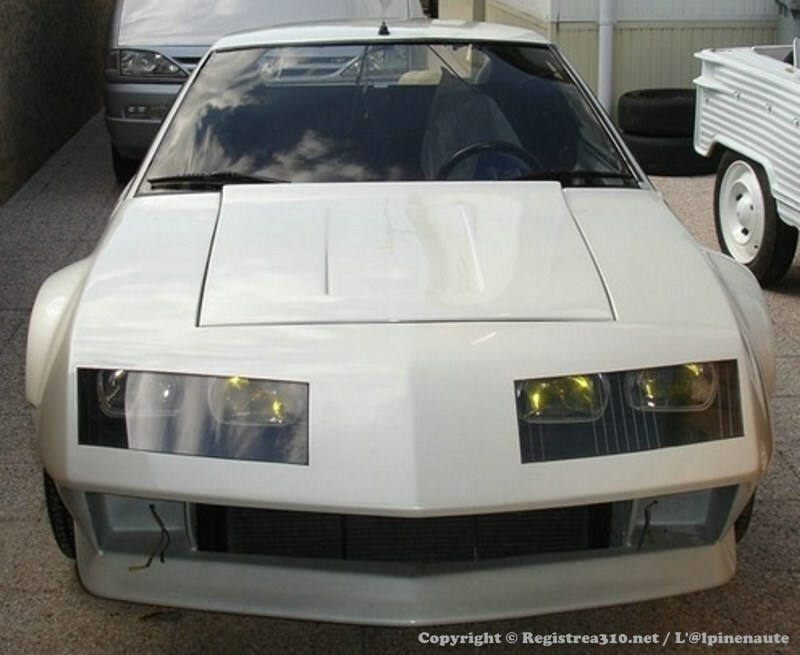 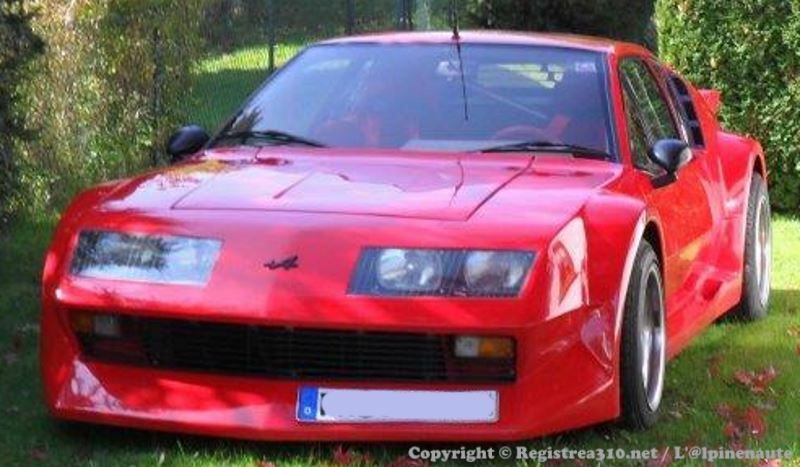 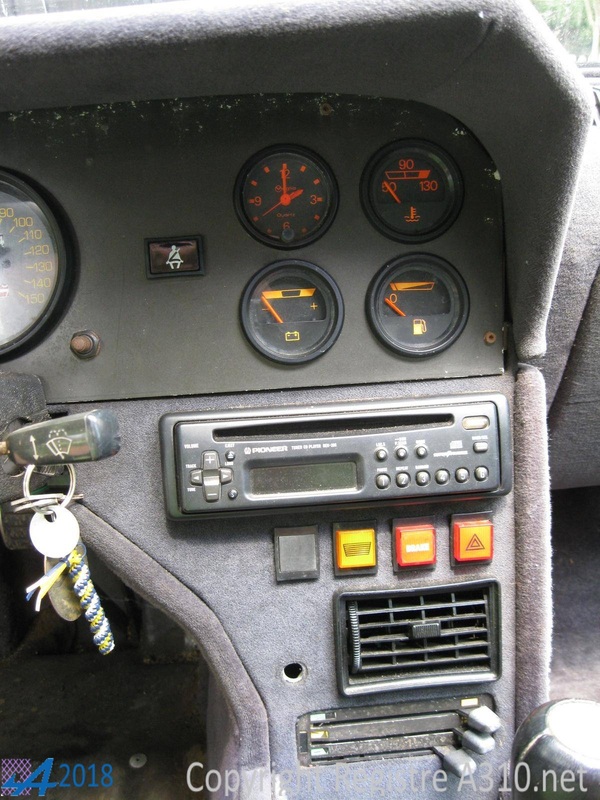 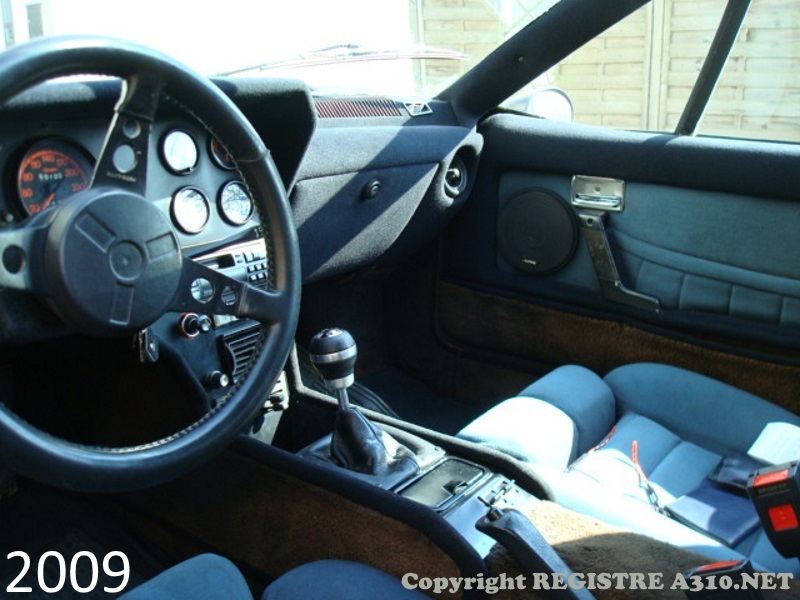 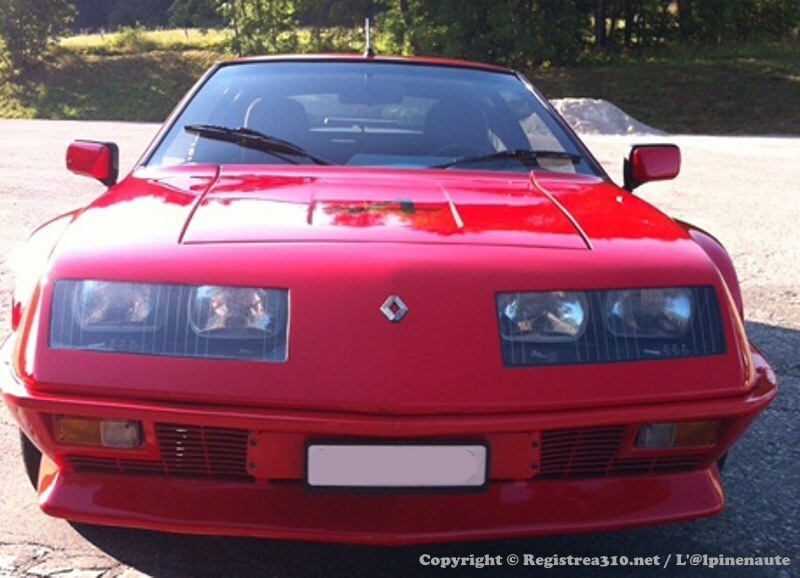 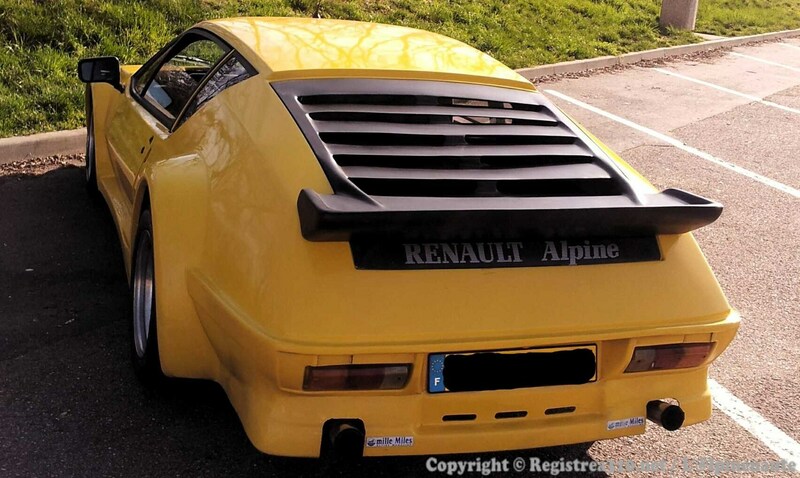 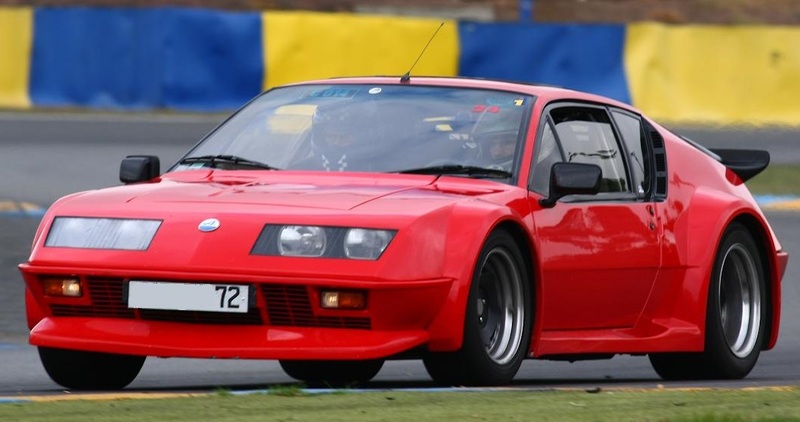 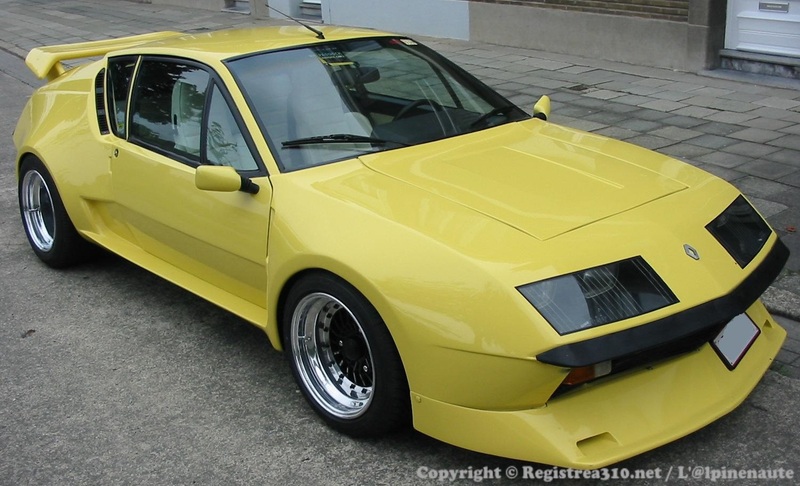 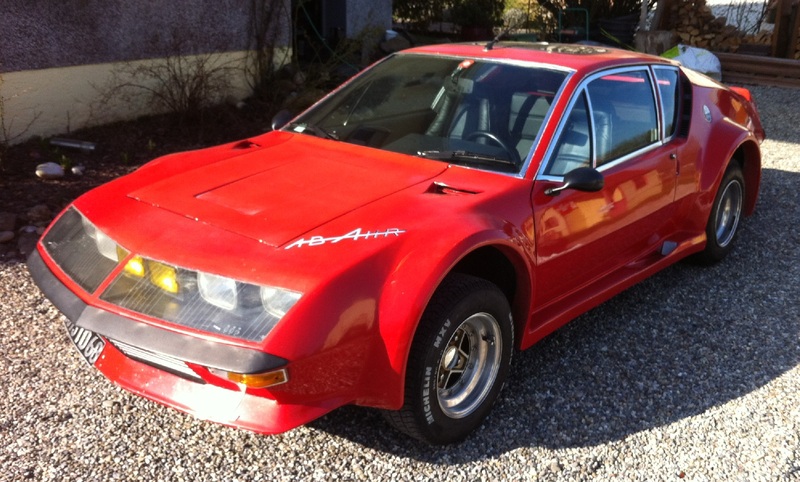 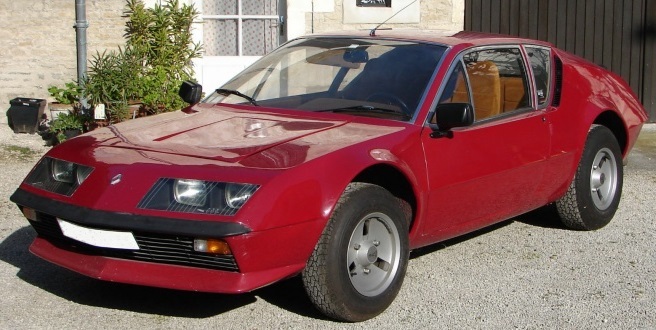 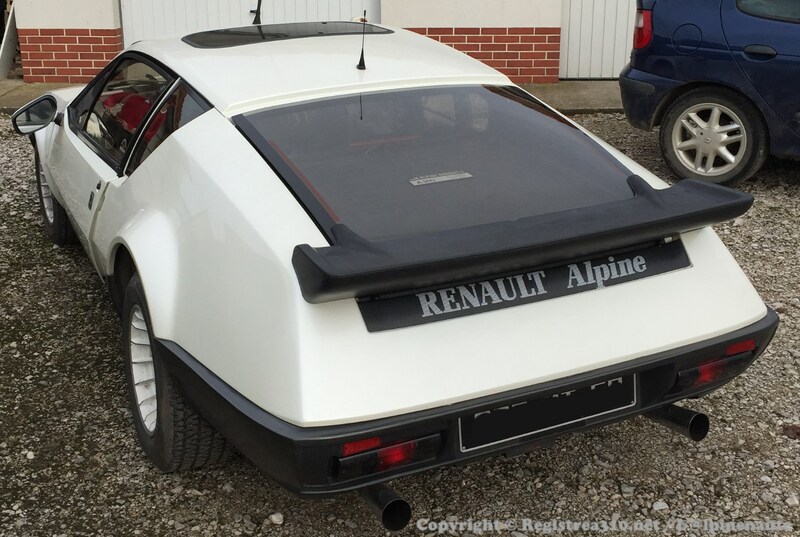 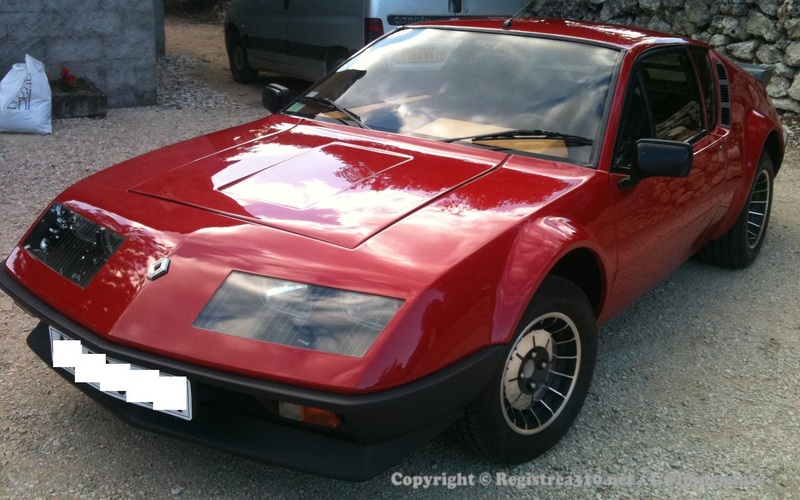 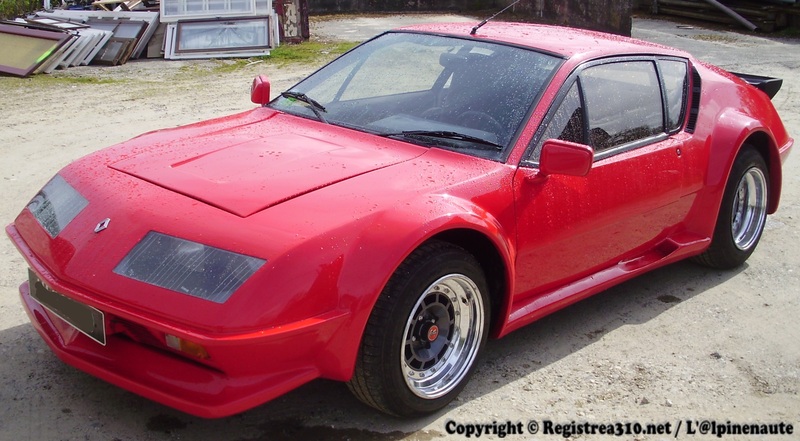 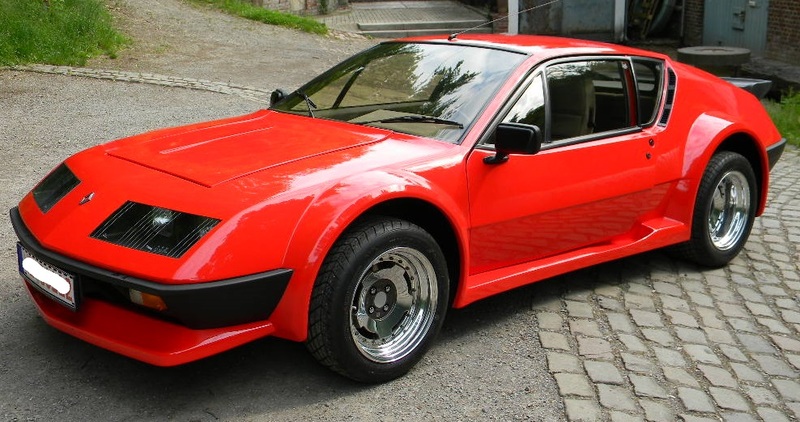 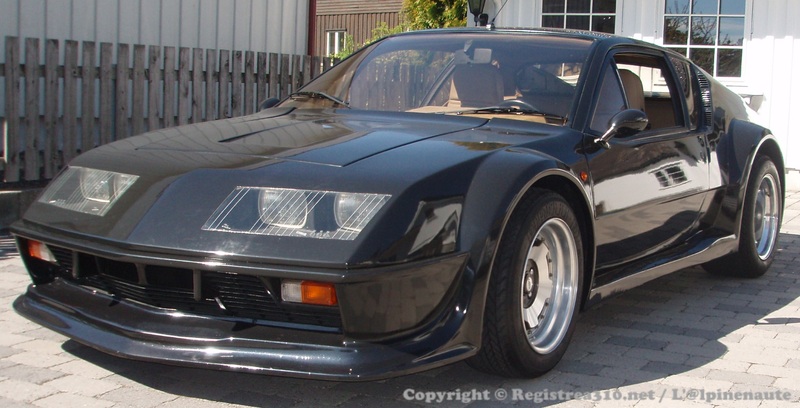 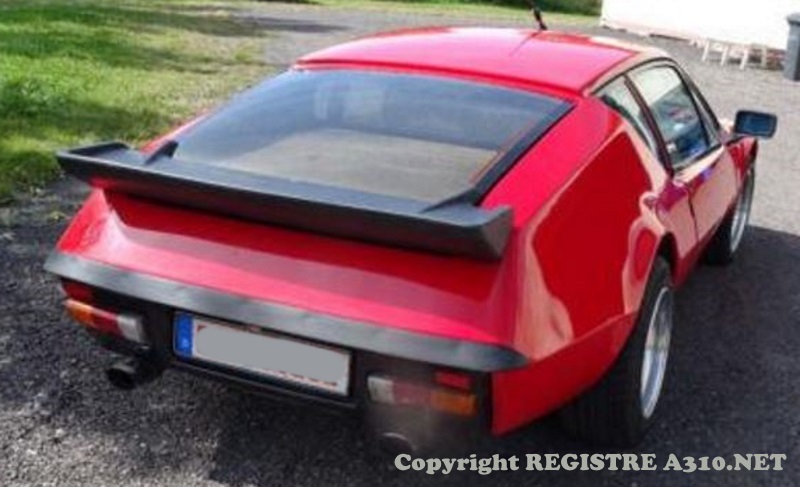 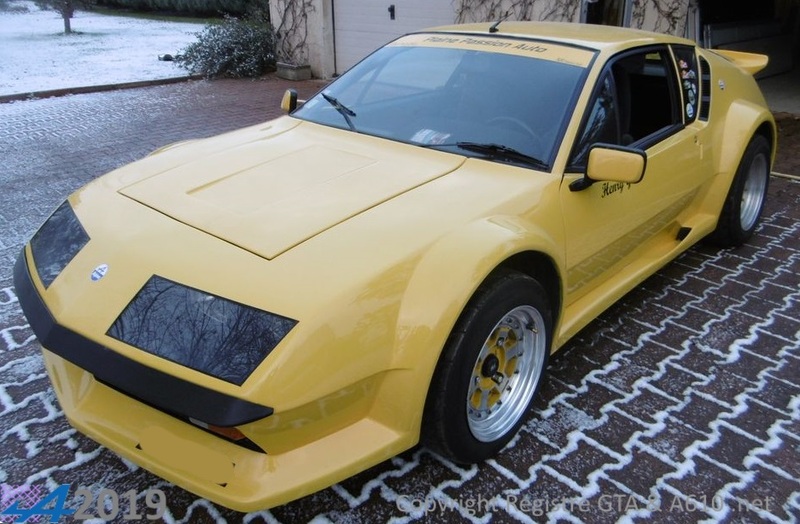 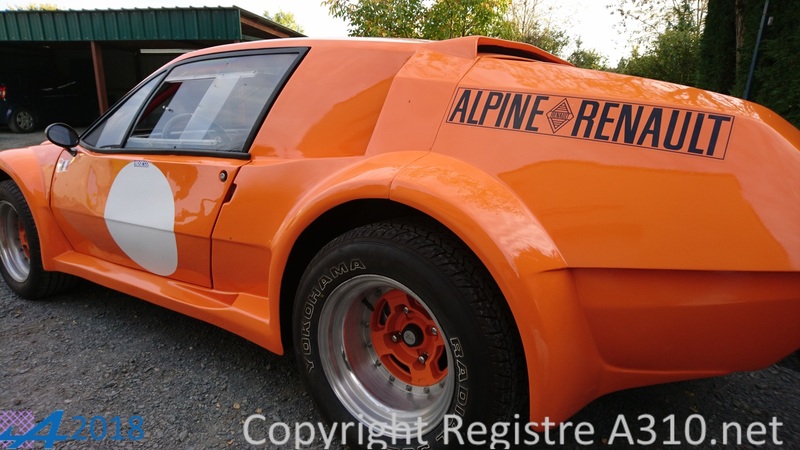 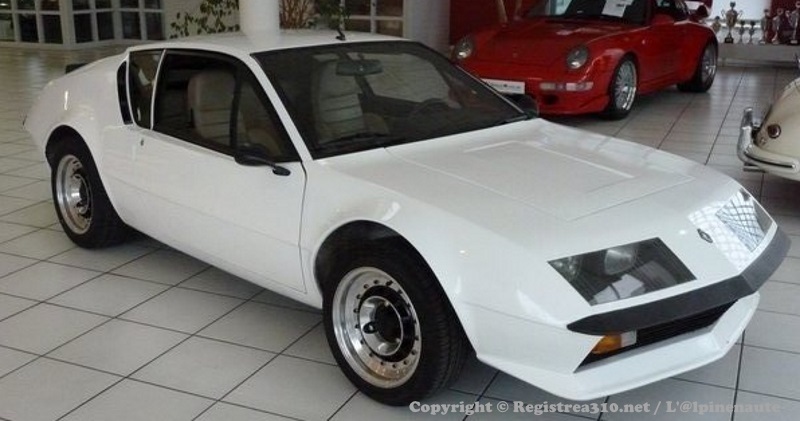 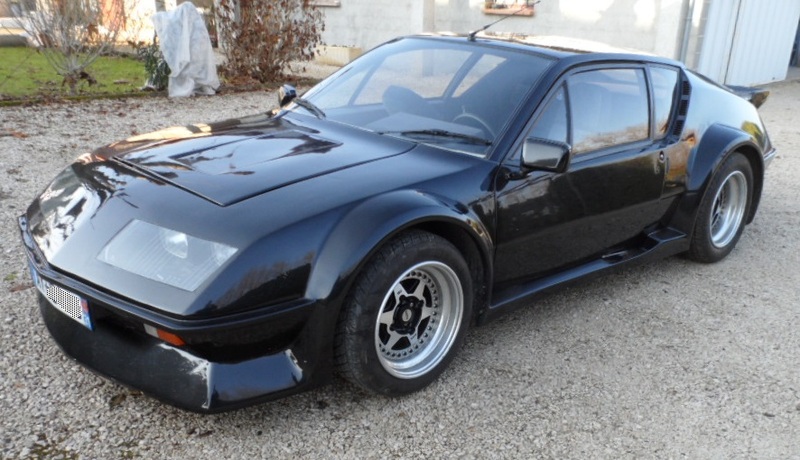 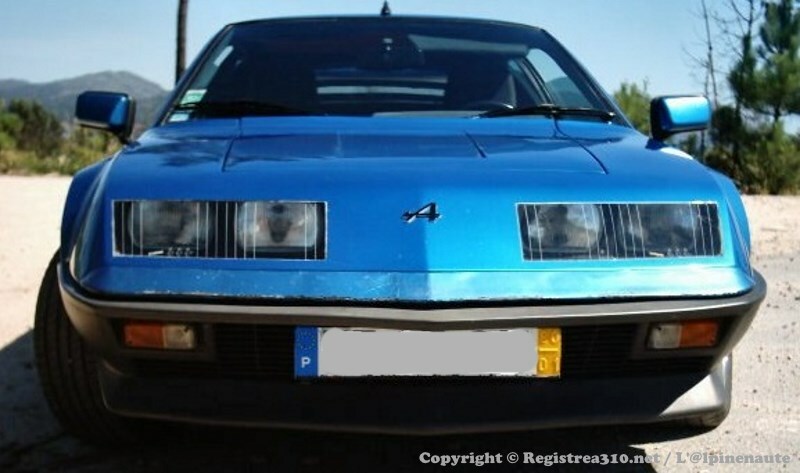 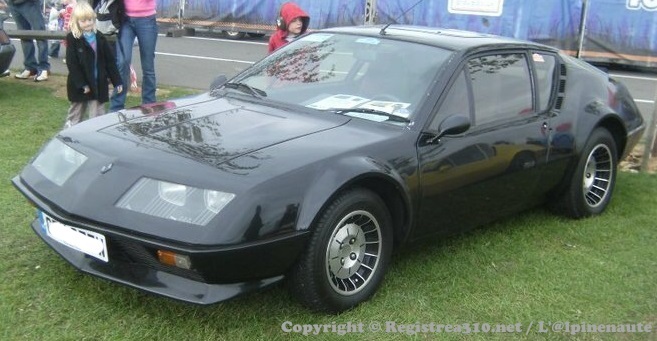 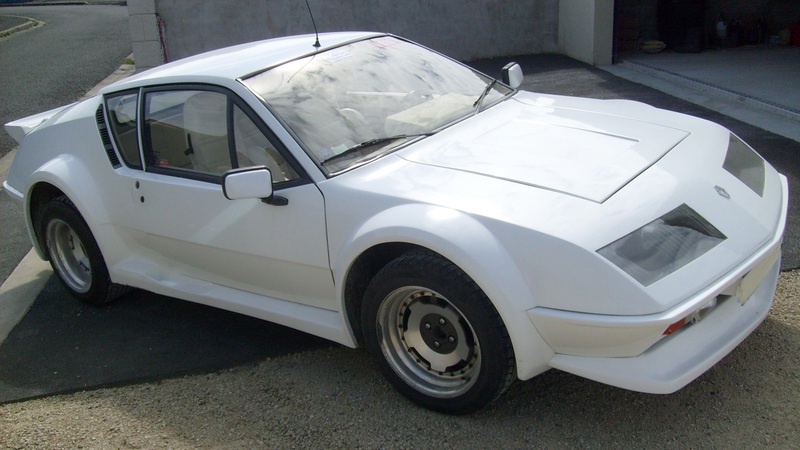 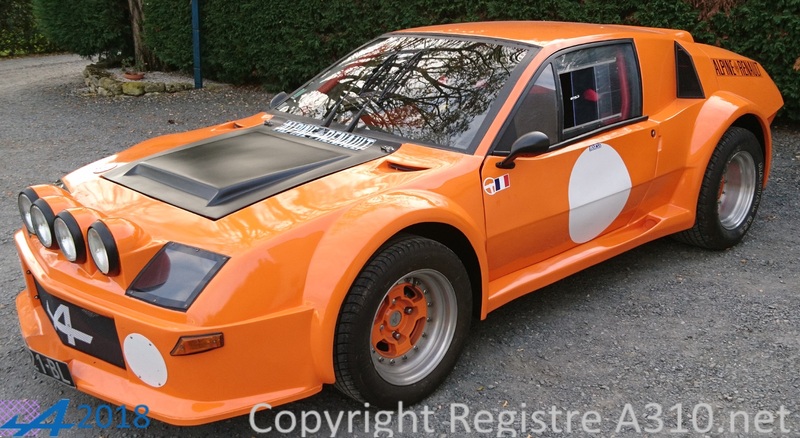 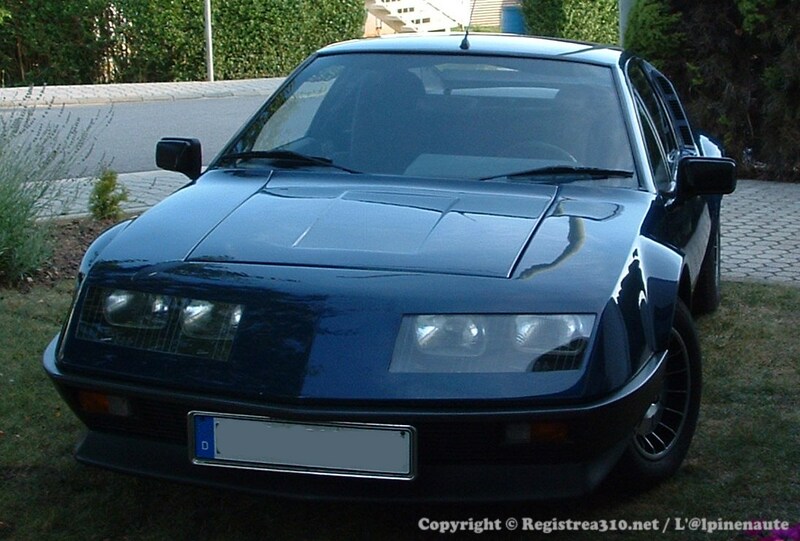 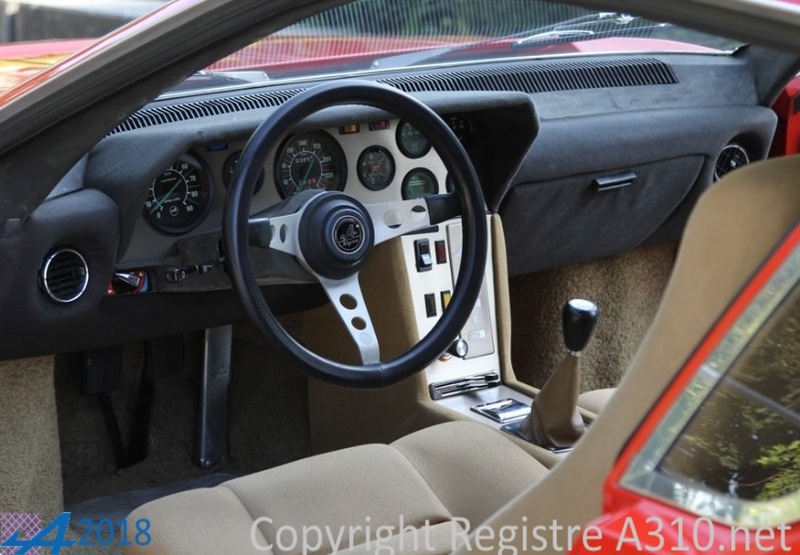 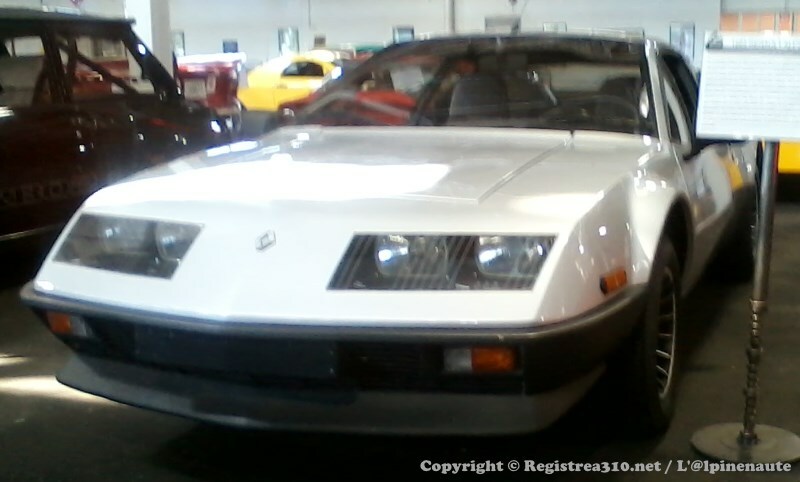 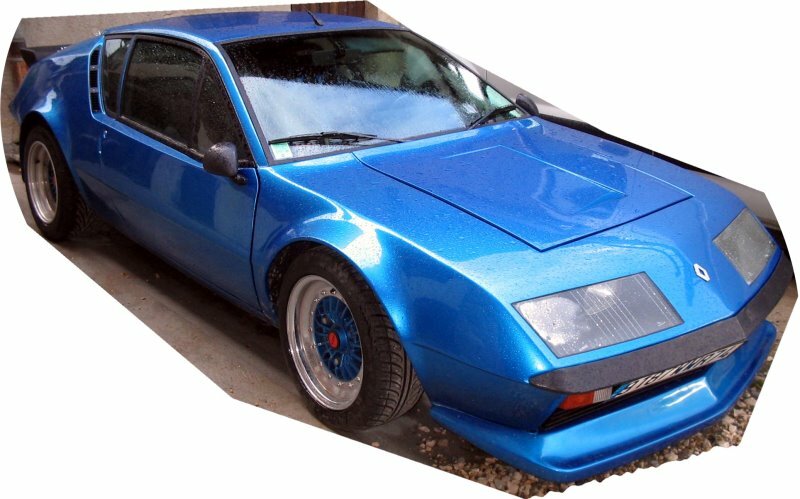 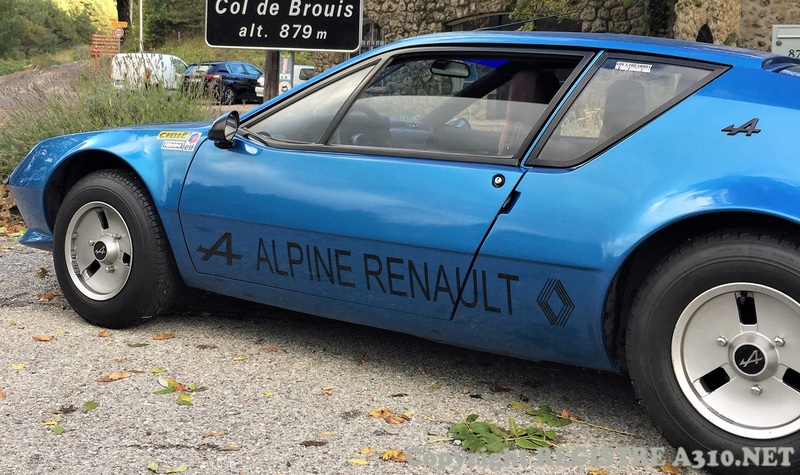 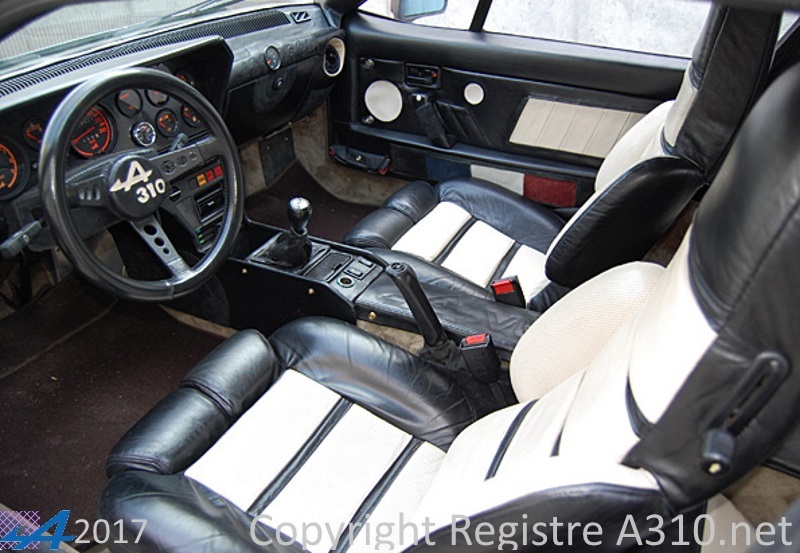 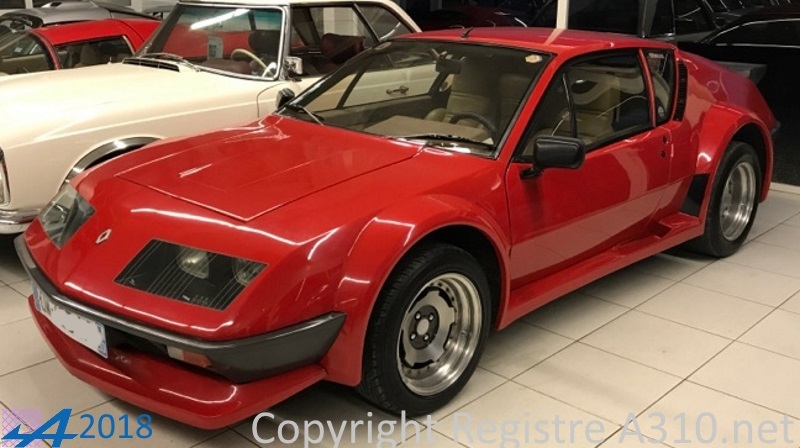 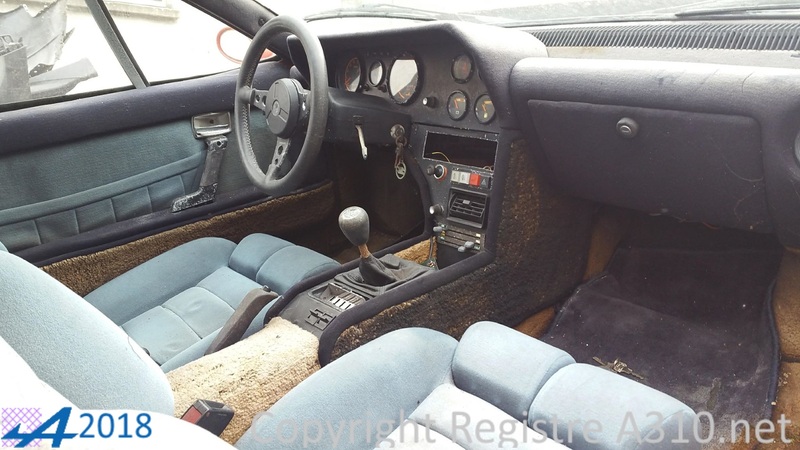 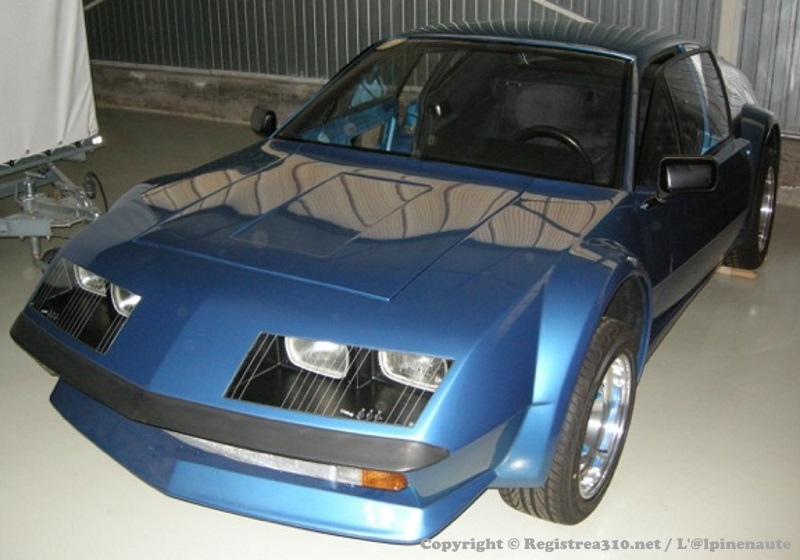 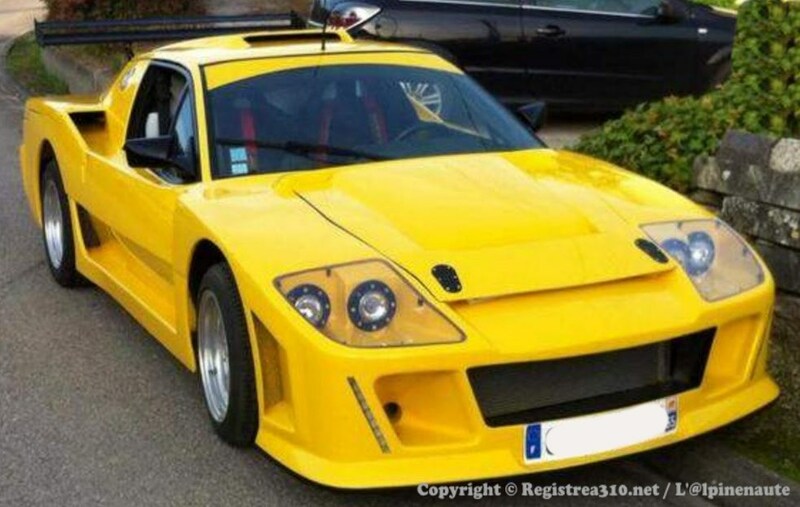 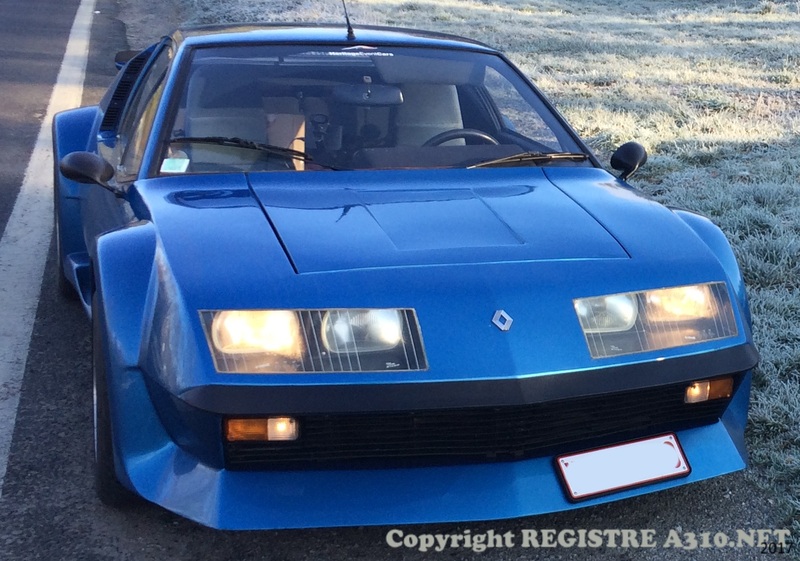 It is the most successful Alpine A310 in Germany. 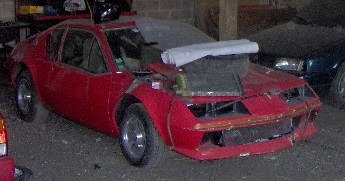 The car was restored in 2009-2013. 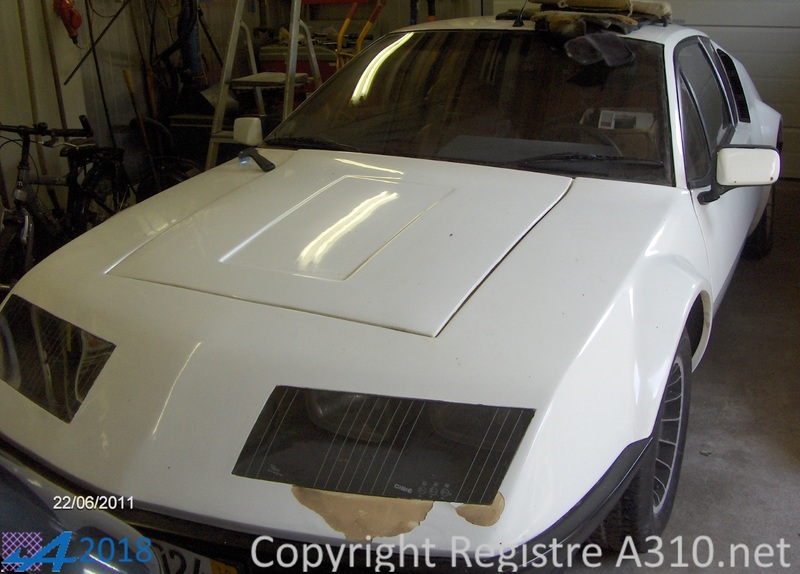 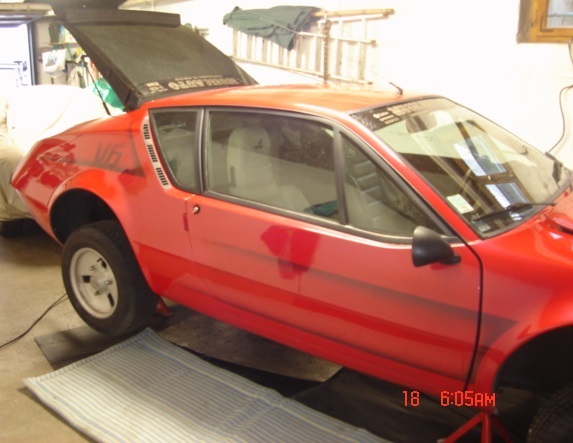 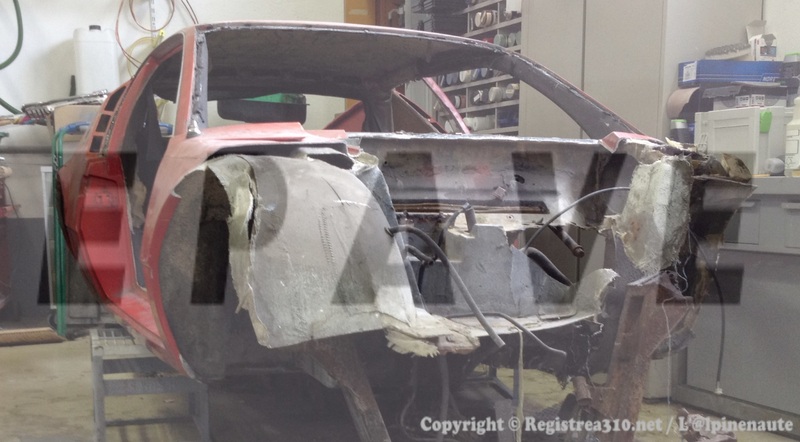 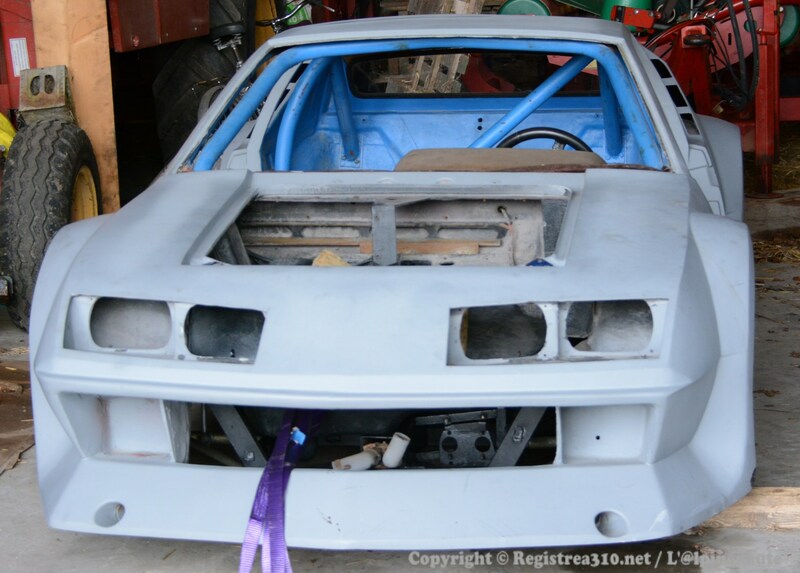 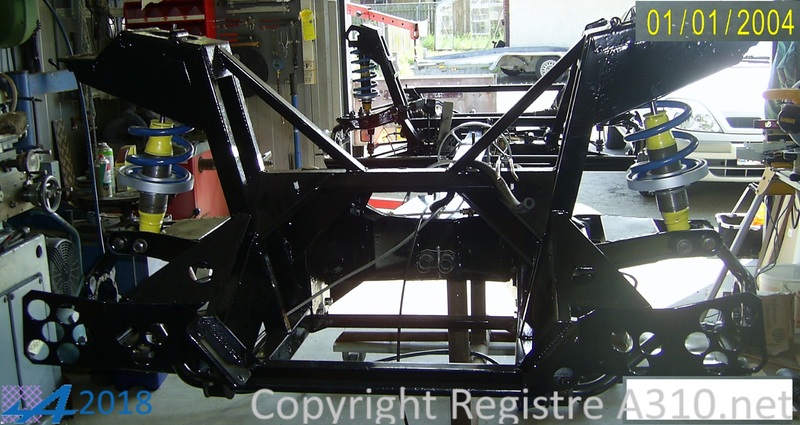 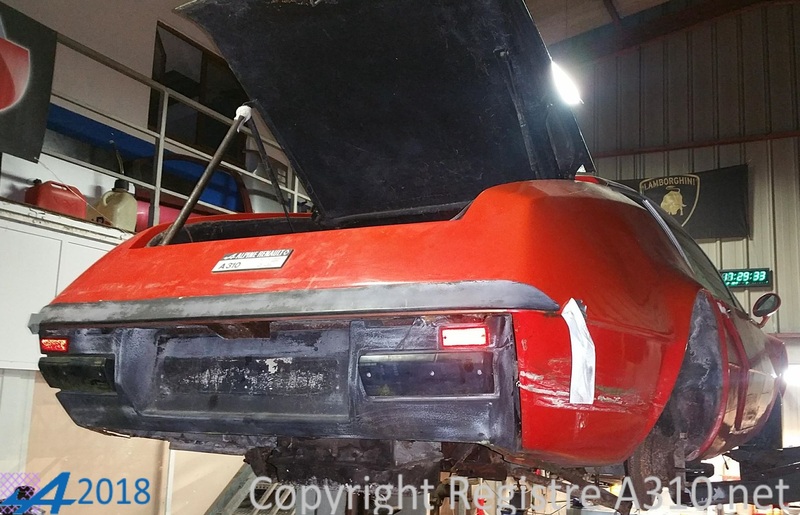 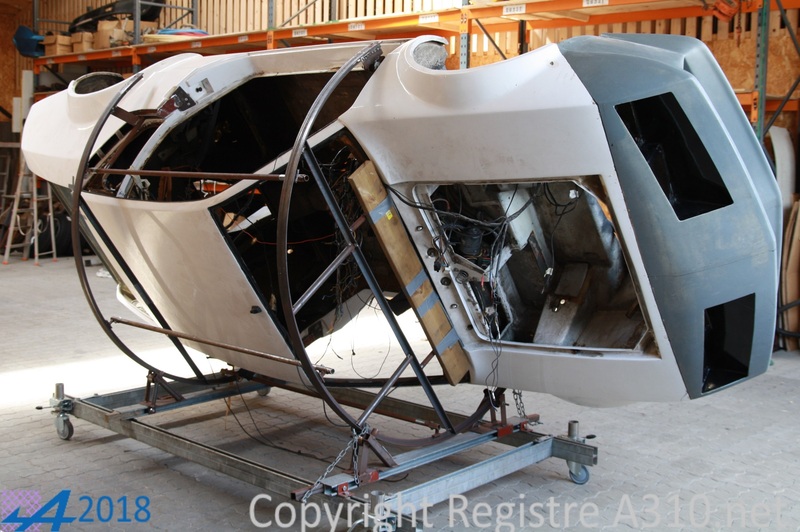 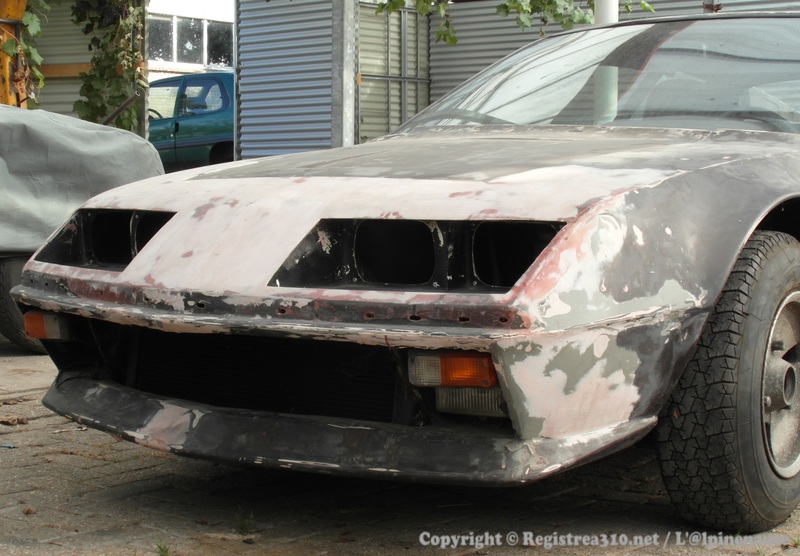 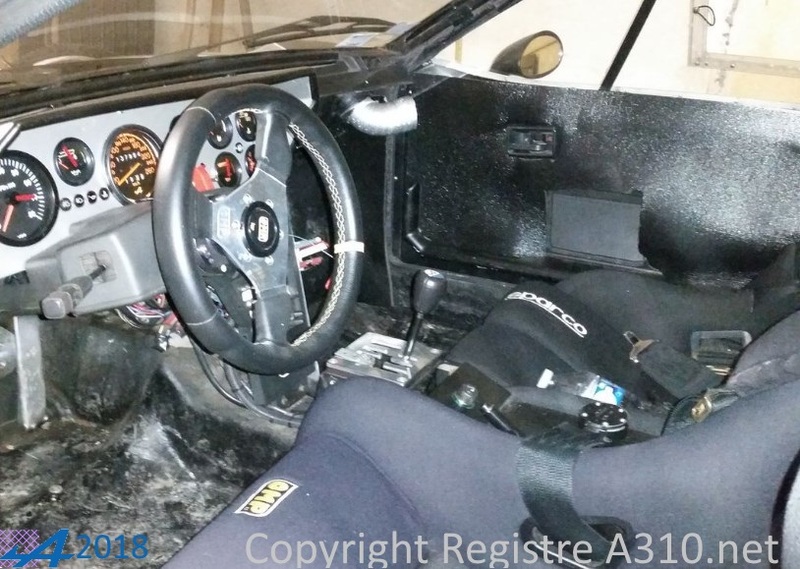 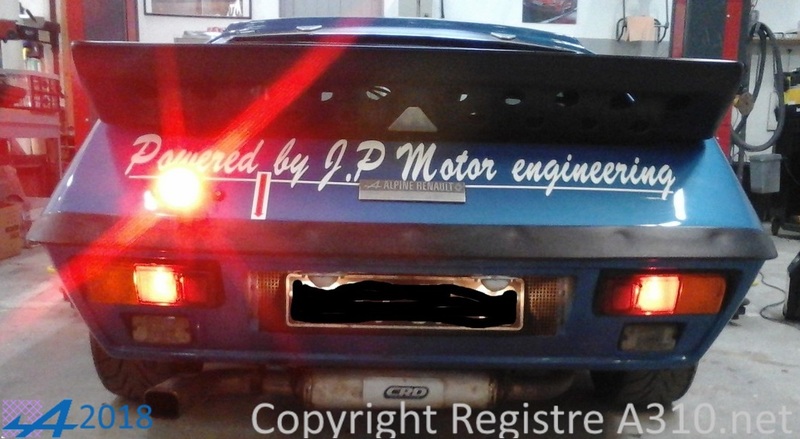 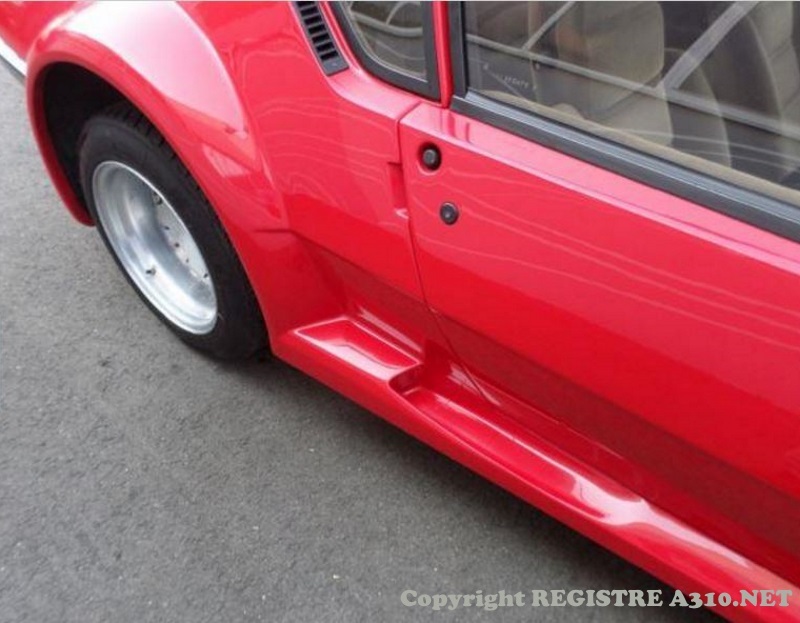 Group 4 Widening (riveted), front spoiler, emergency stop switch and roll bar were installed at the factory. 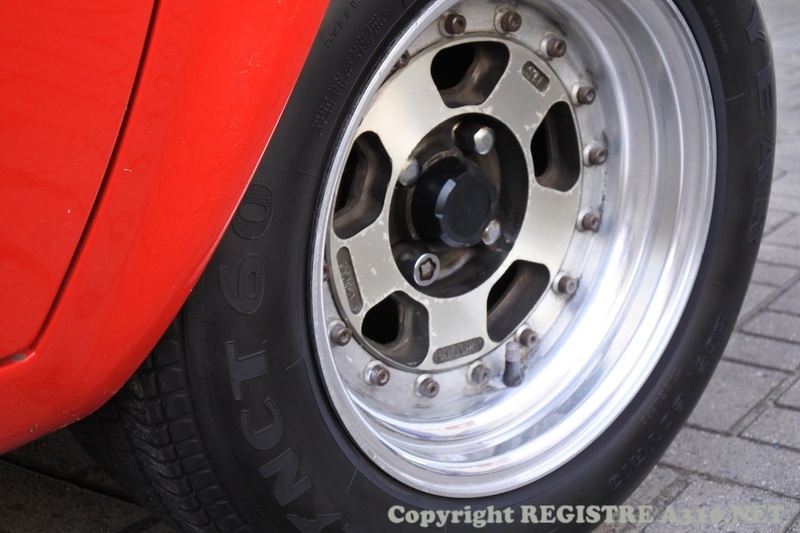 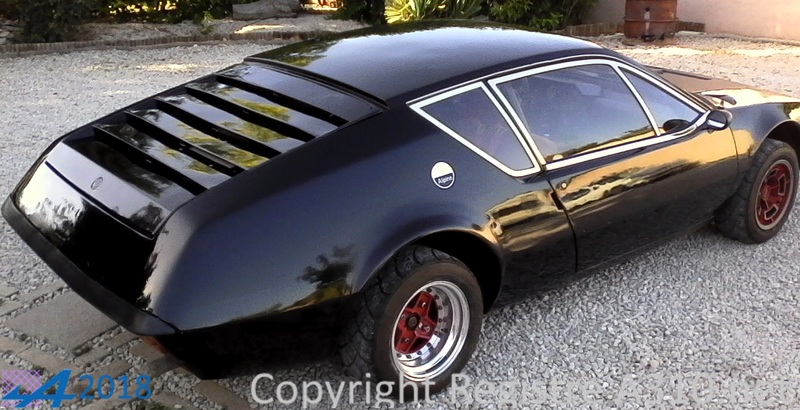 The car was with 8 "Gotti wheels in front and 9" Gotti wheels shipped back. 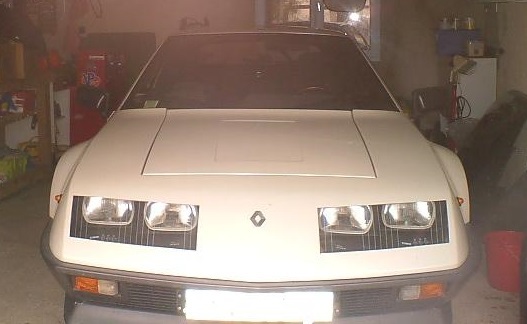 405 1600VE ??.? 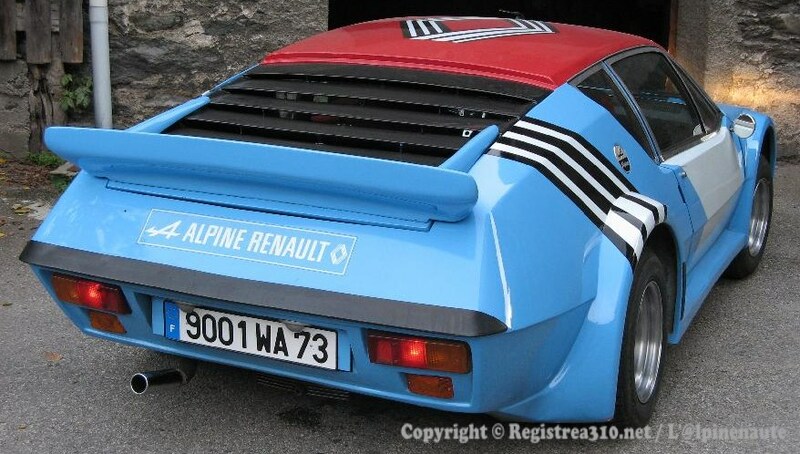 ?.1972 Blue Source: @lpinenaute. 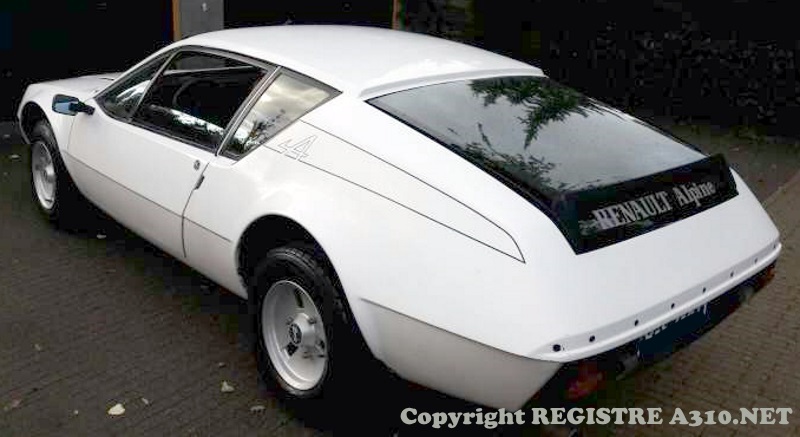 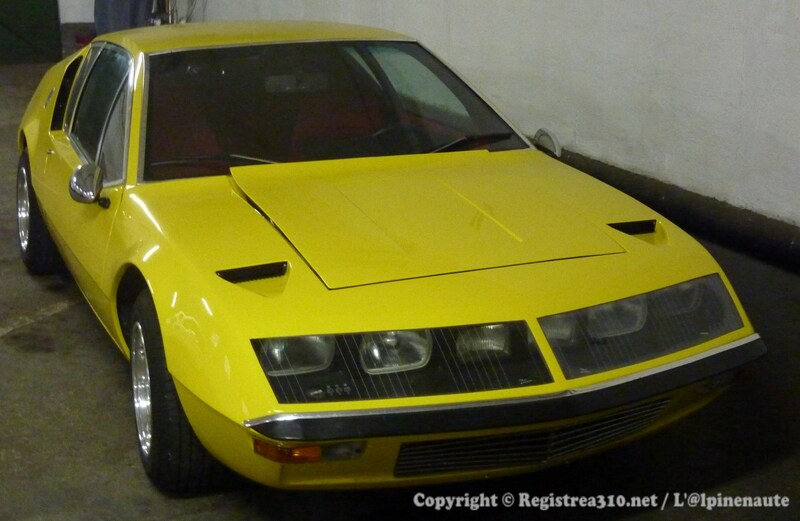 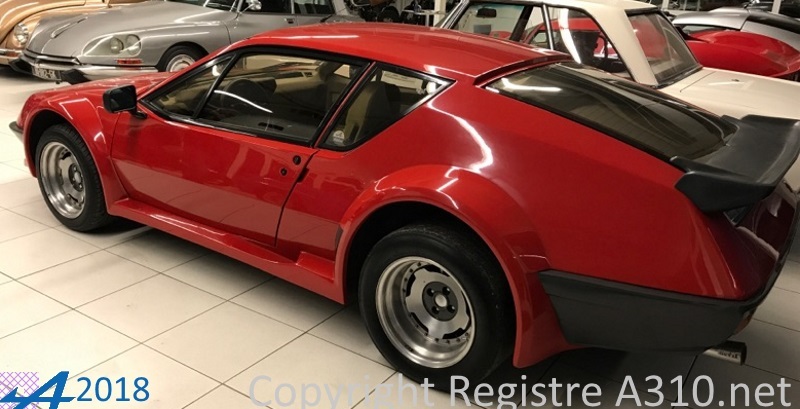 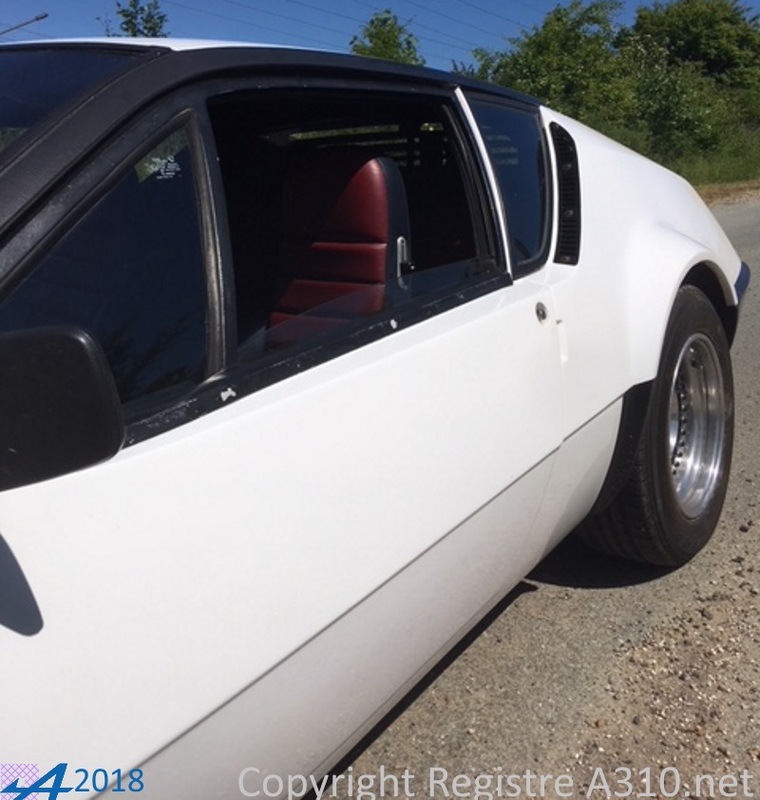 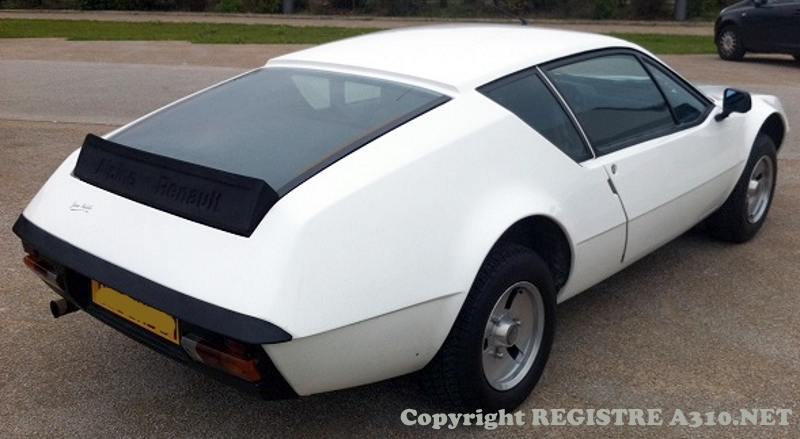 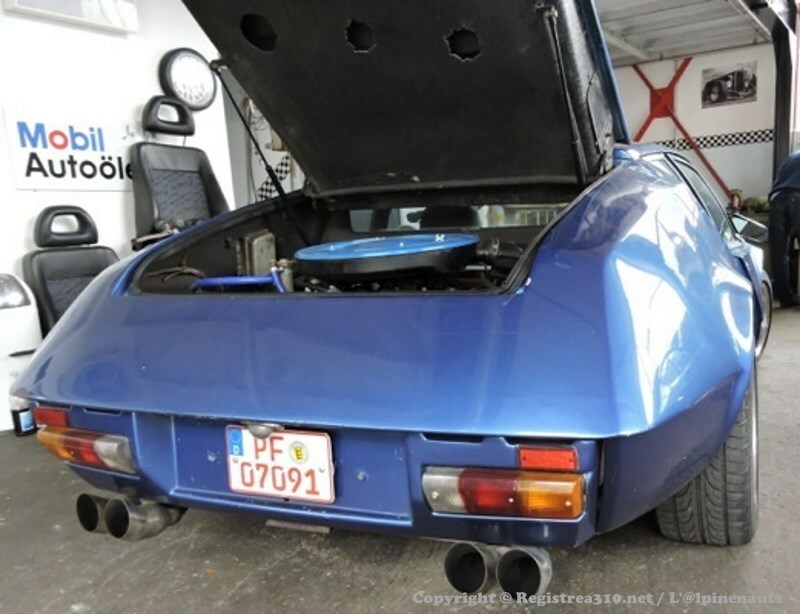 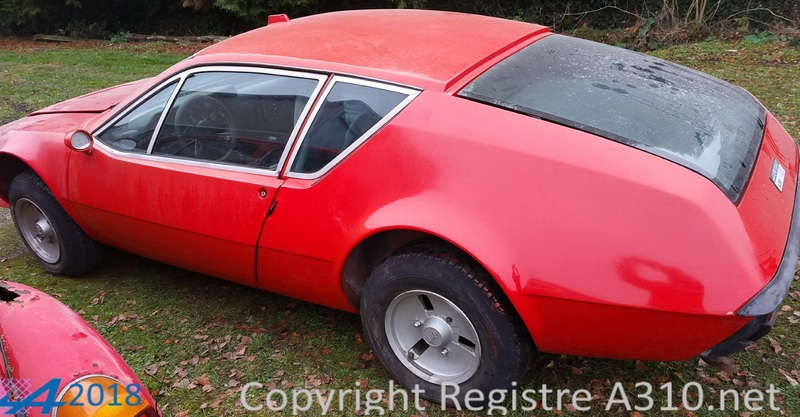 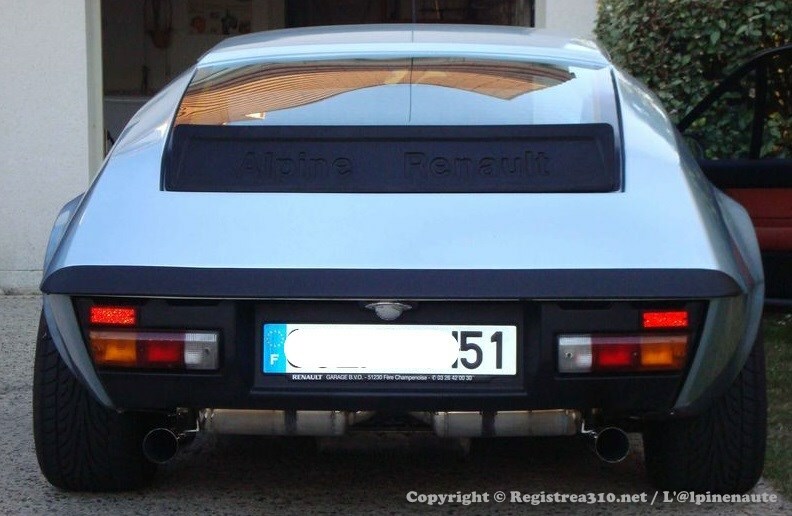 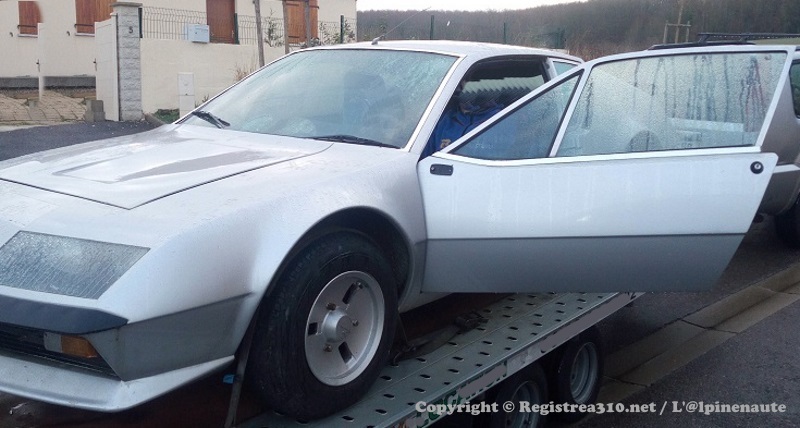 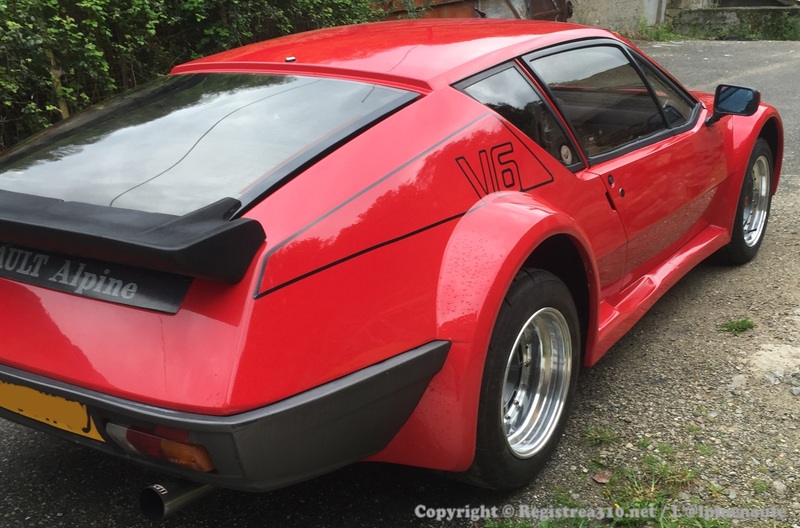 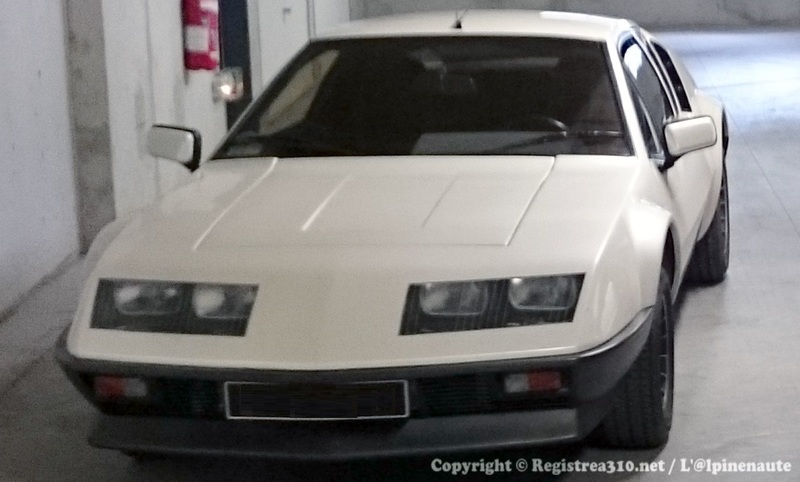 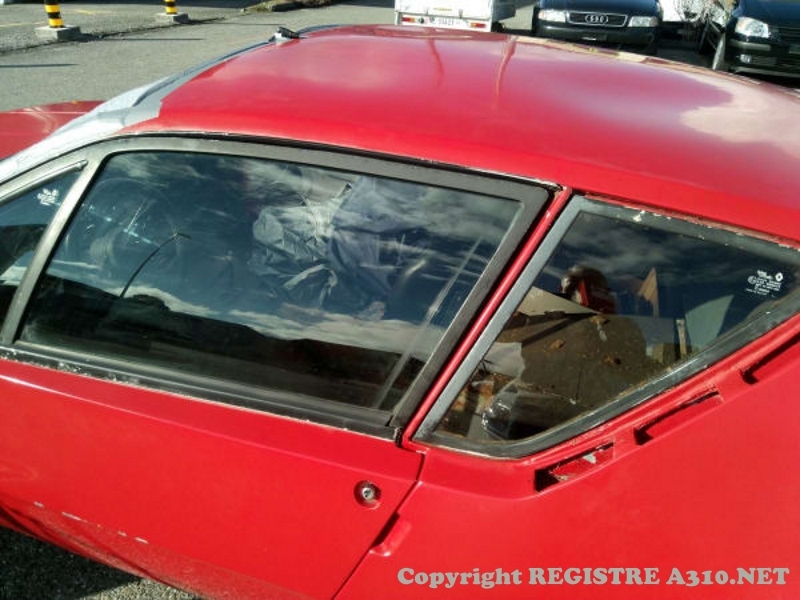 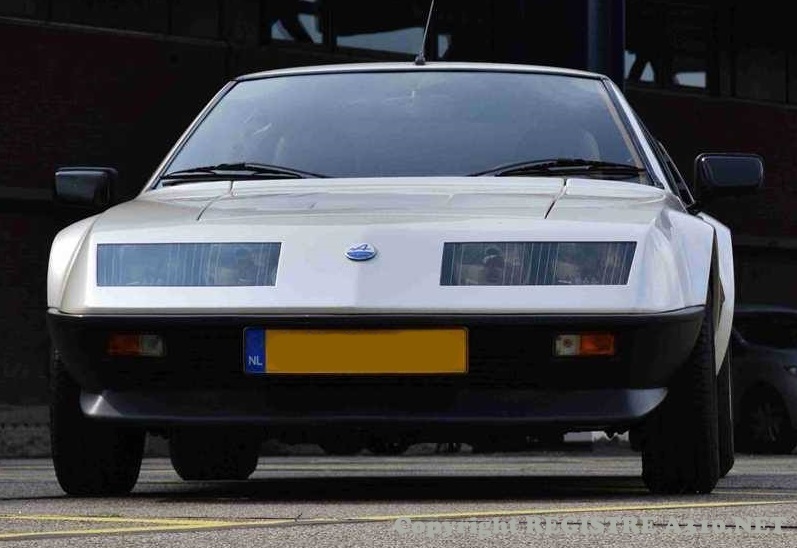 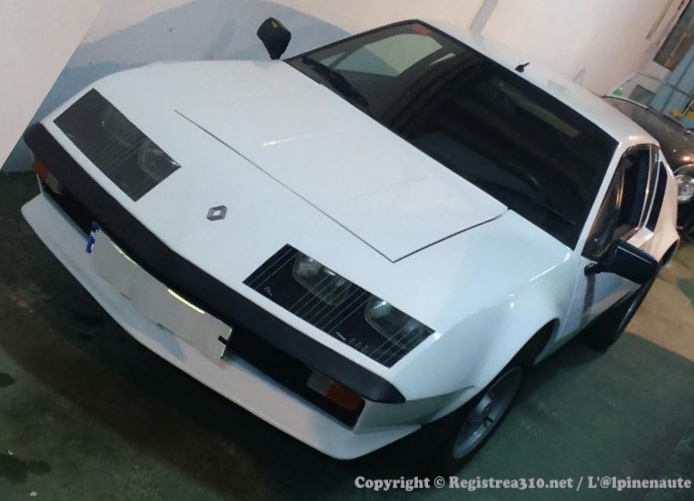 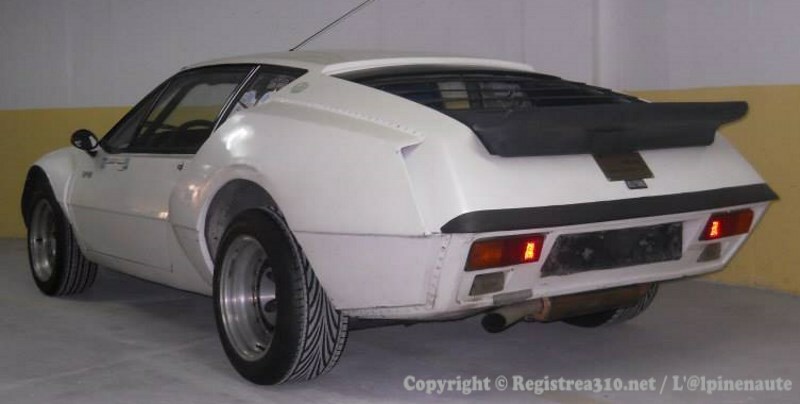 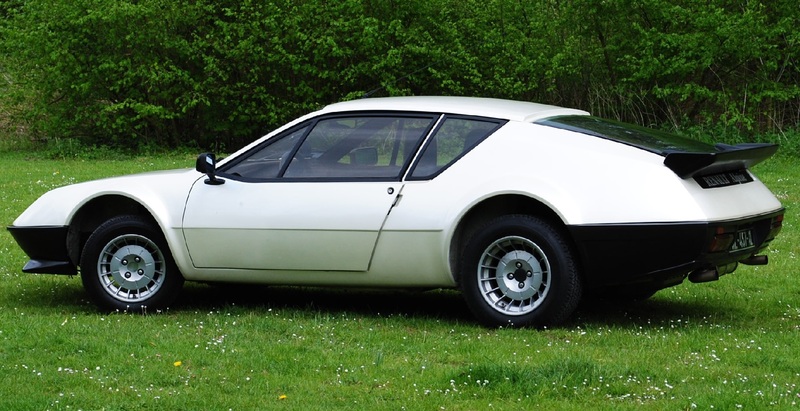 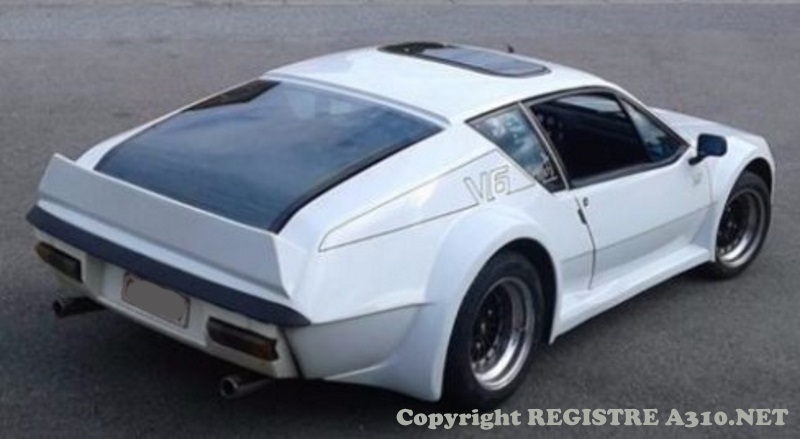 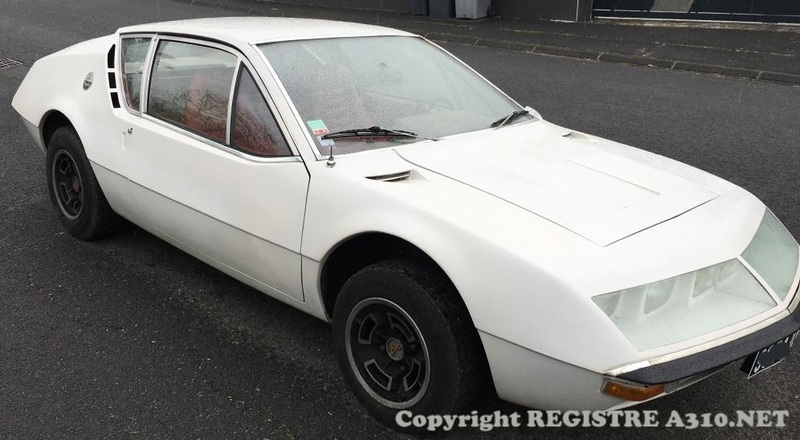 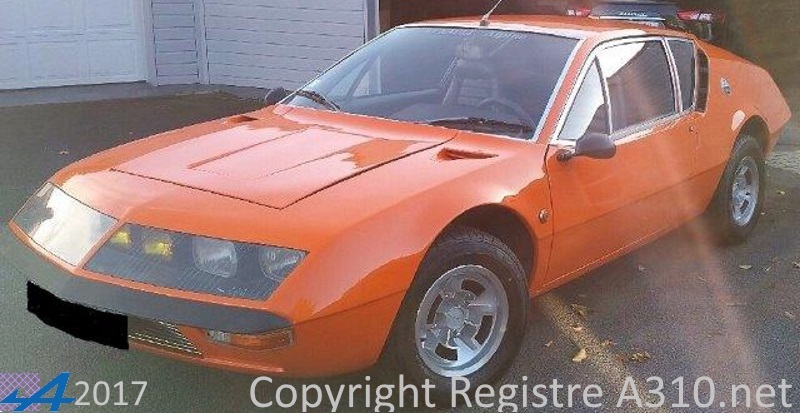 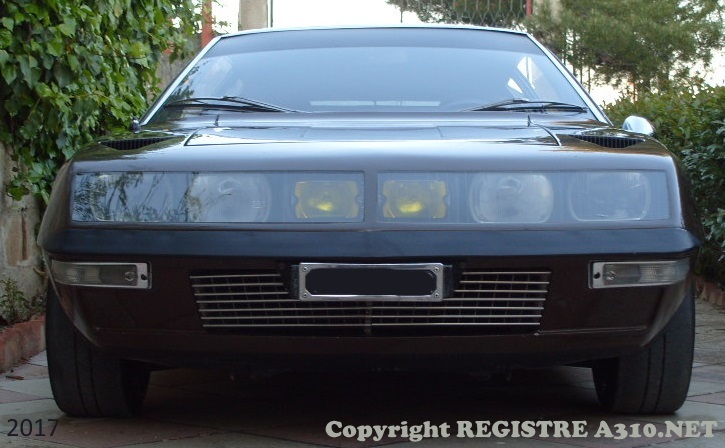 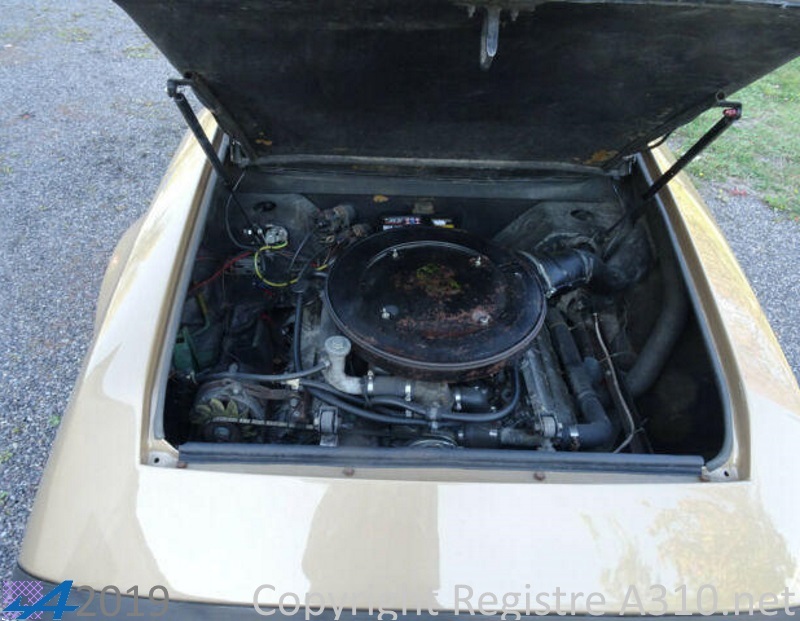 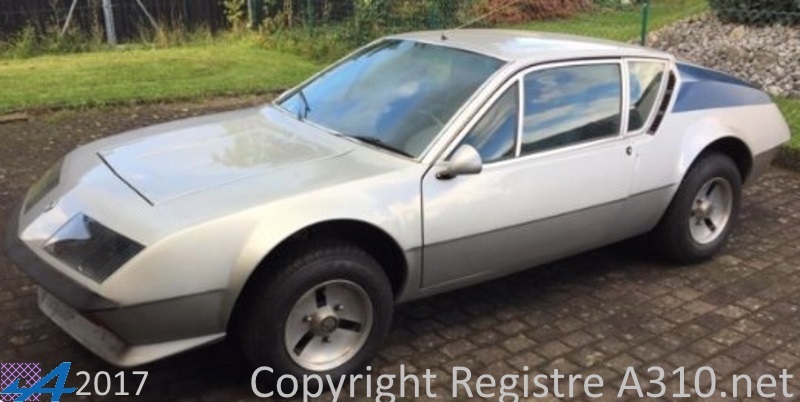 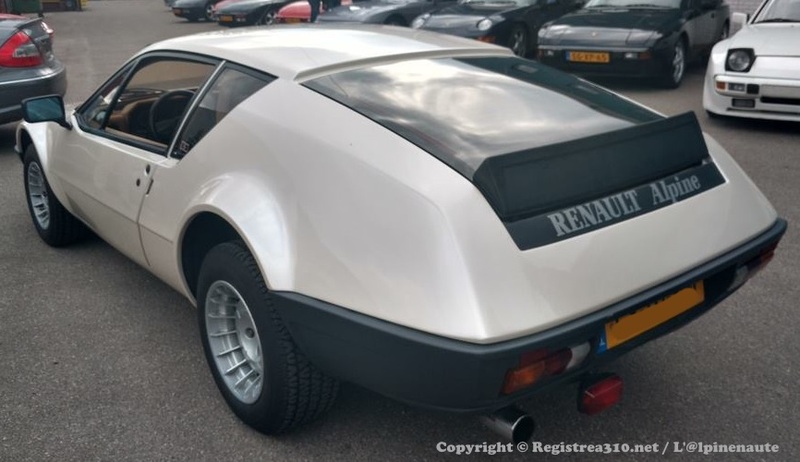 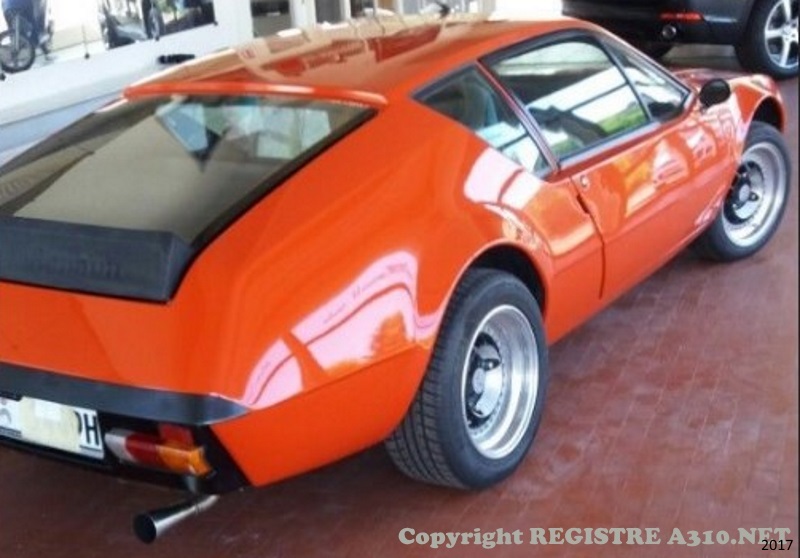 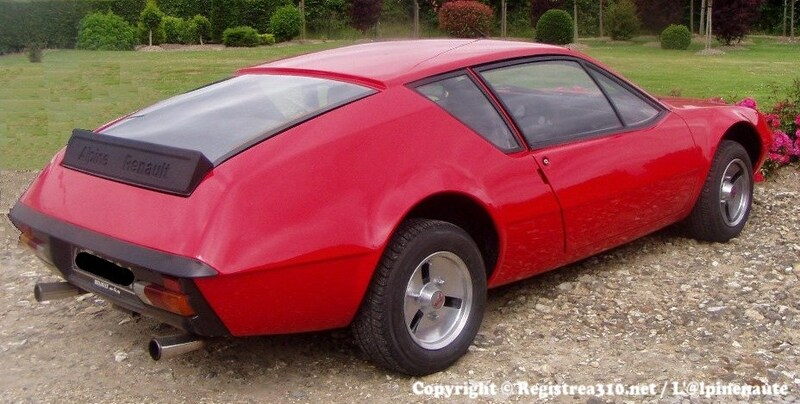 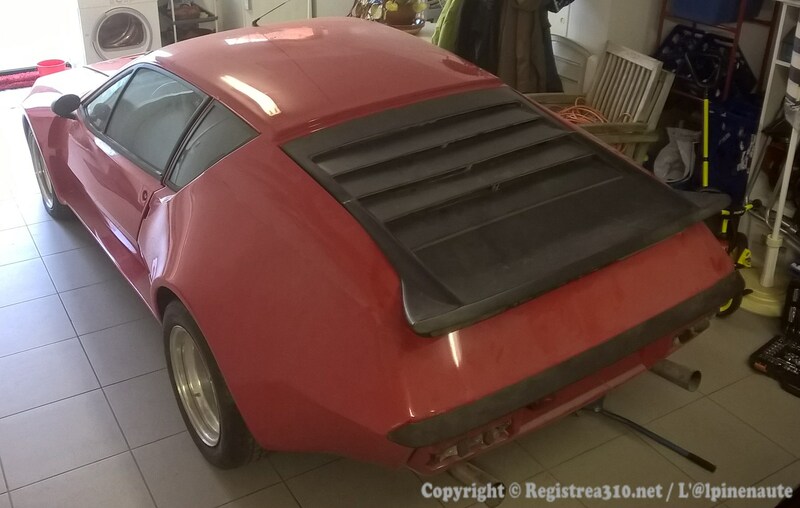 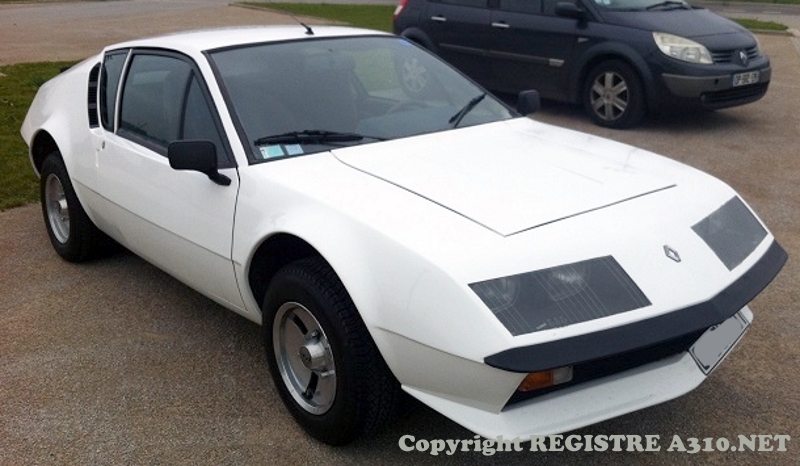 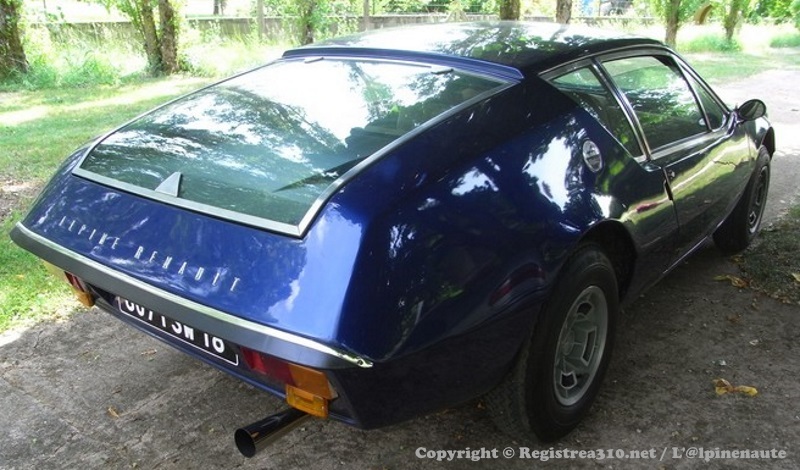 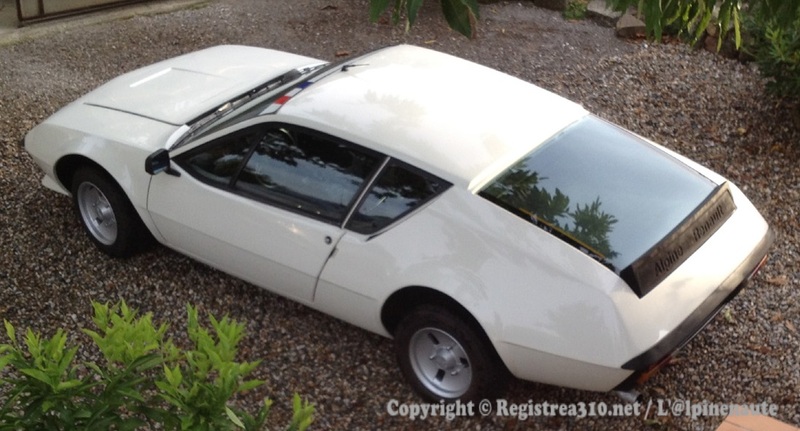 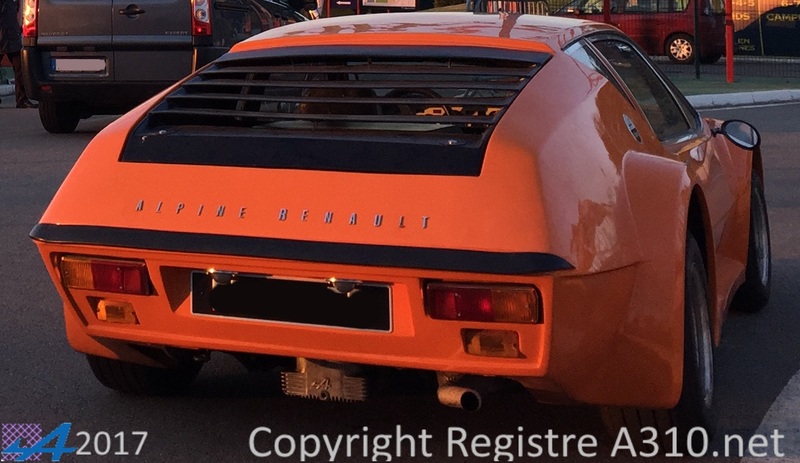 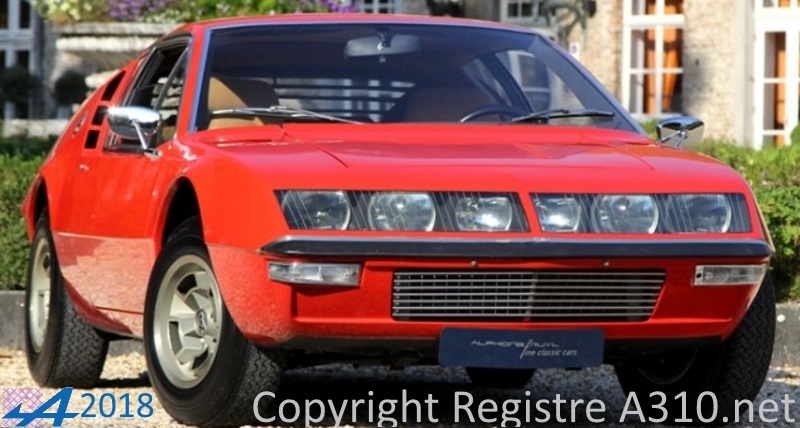 728 1600VE 21.12.1972 6 White gardénia Old registrations: 8403HN33, 9883QT66. 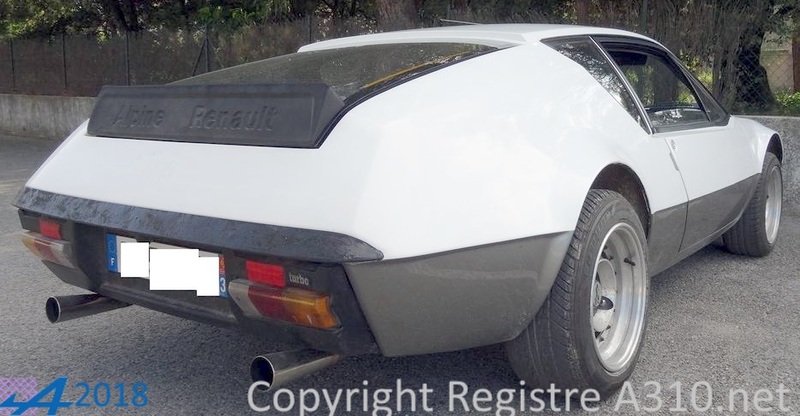 729 1600VE 18.12.1972 6 White gardénia Source: @lpinenaute. 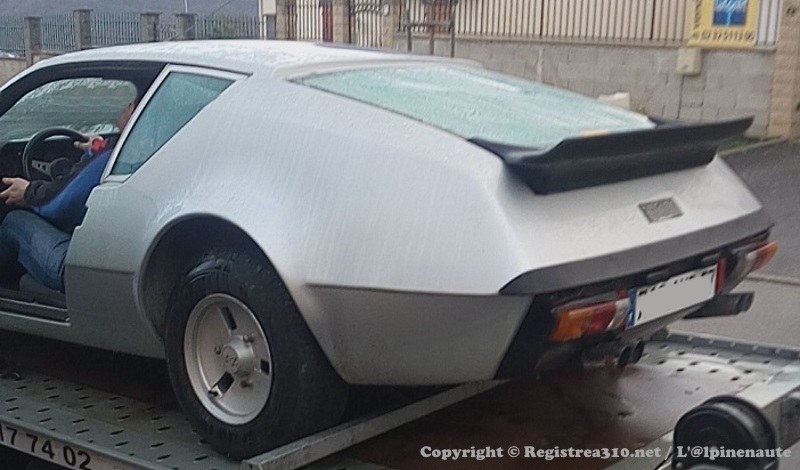 887 1600VE 02.04.1973 White Source: @lpinenaute. 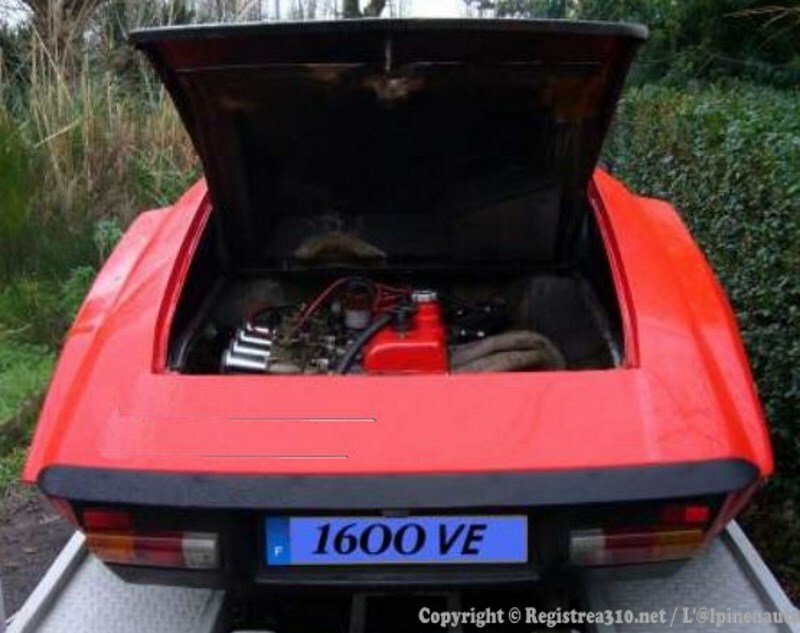 1010 1600VE ? 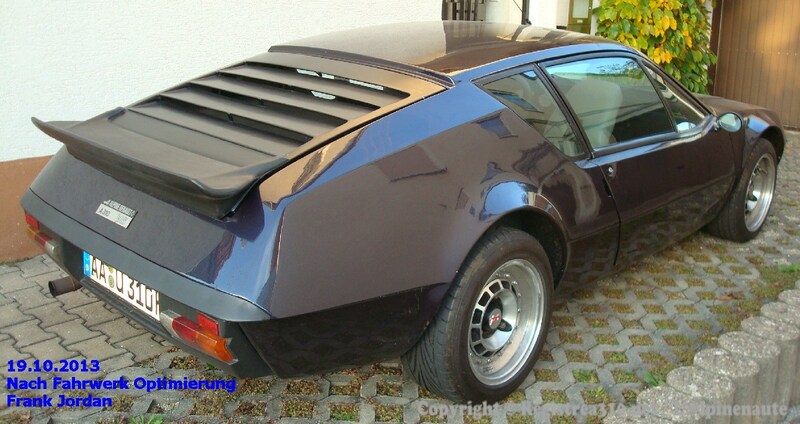 ?.06.1973 -- Restored, entirely renovated. 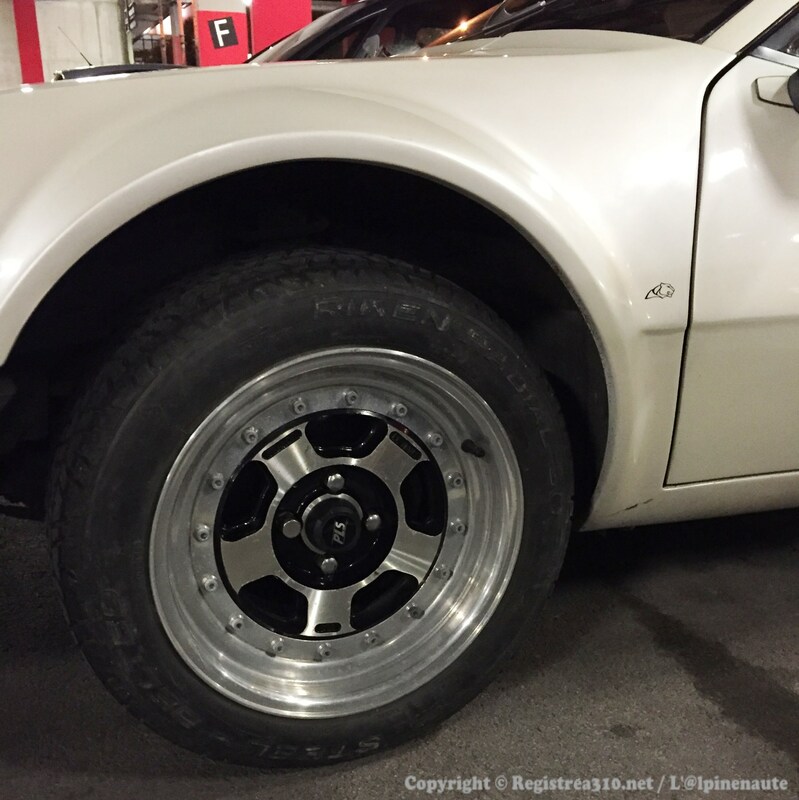 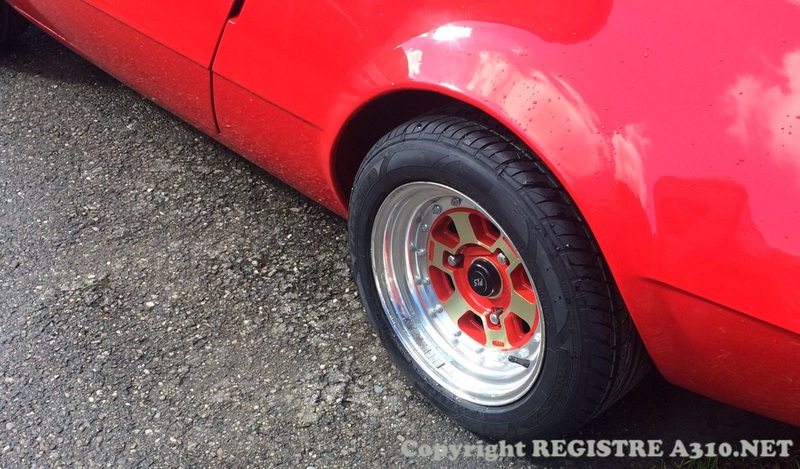 Original rims with MICHELIN XAS FF tires. 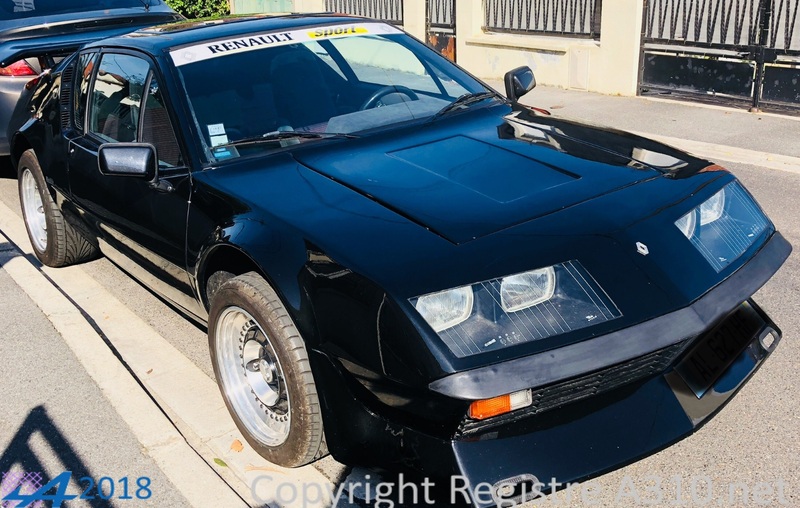 FOR SALE on Le Bon Coin (FEB 2017). 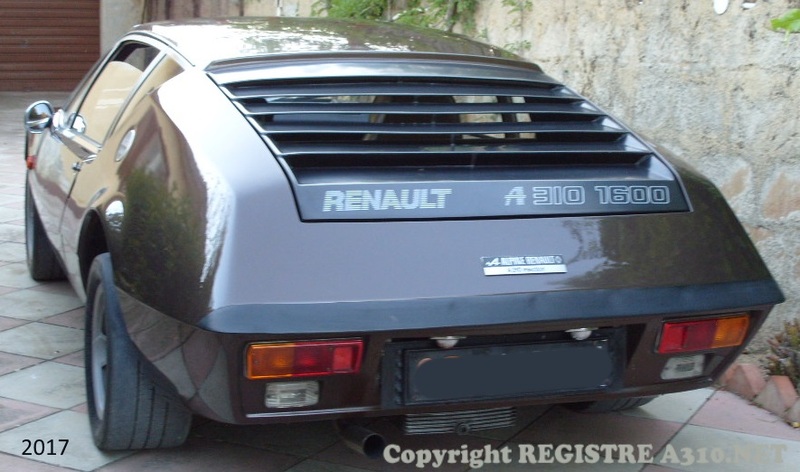 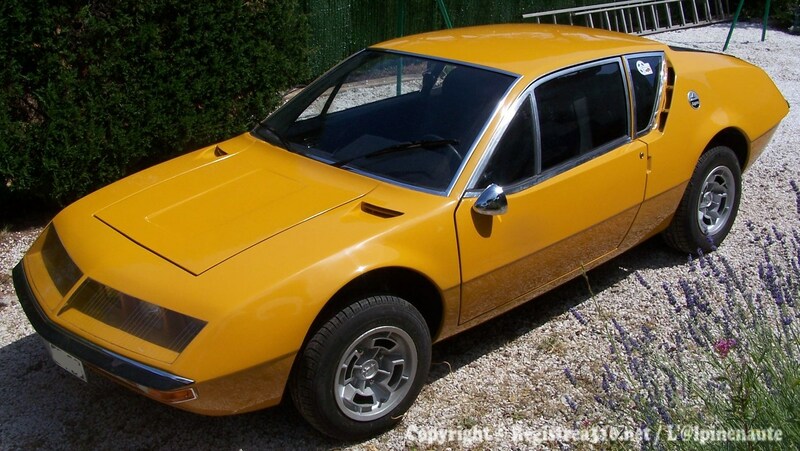 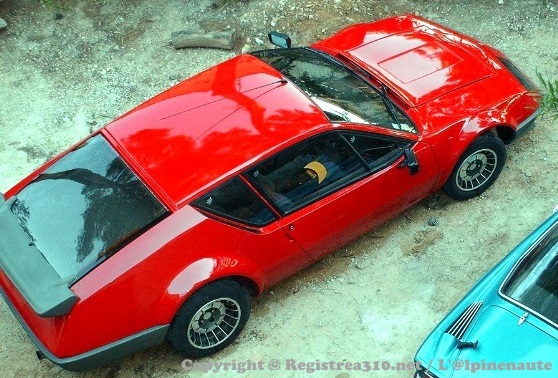 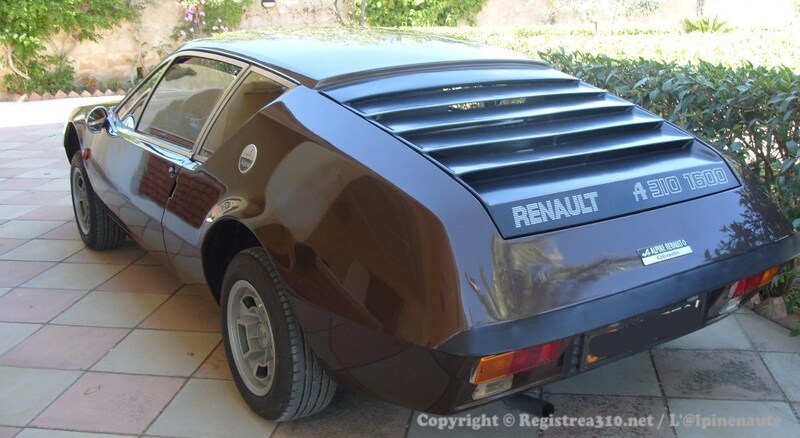 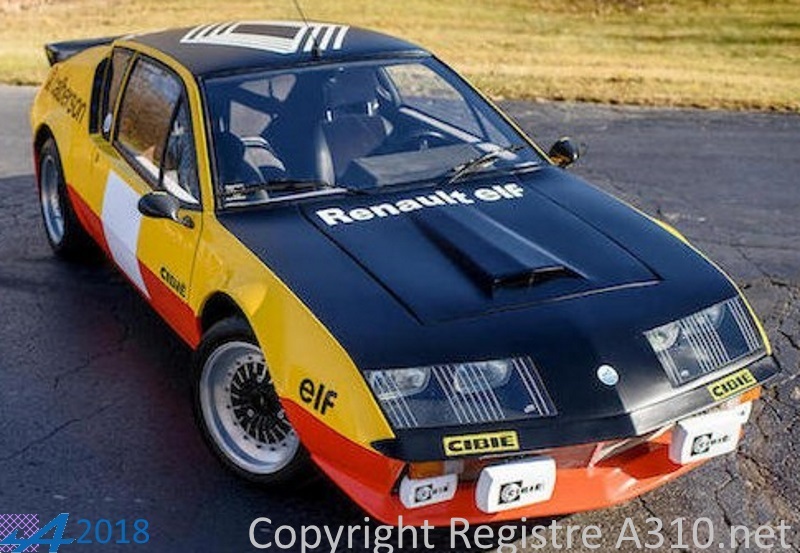 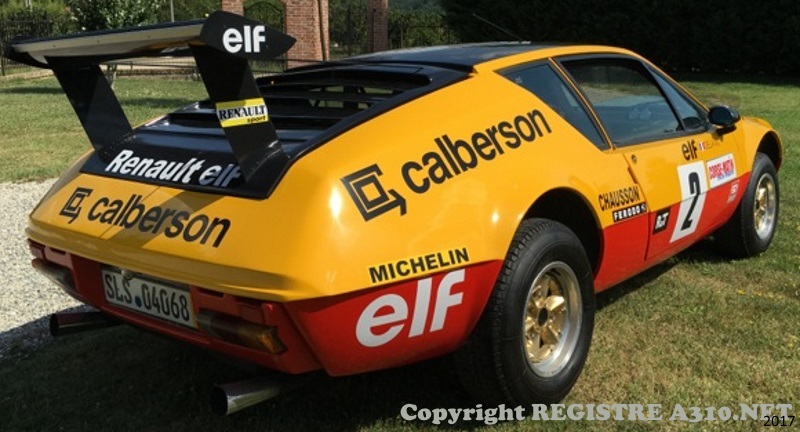 21216 1600VF 31.12.1974 Marron Metal Source: @lpinenaute. 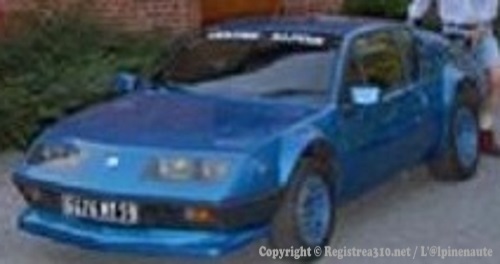 21552 1600VF ? 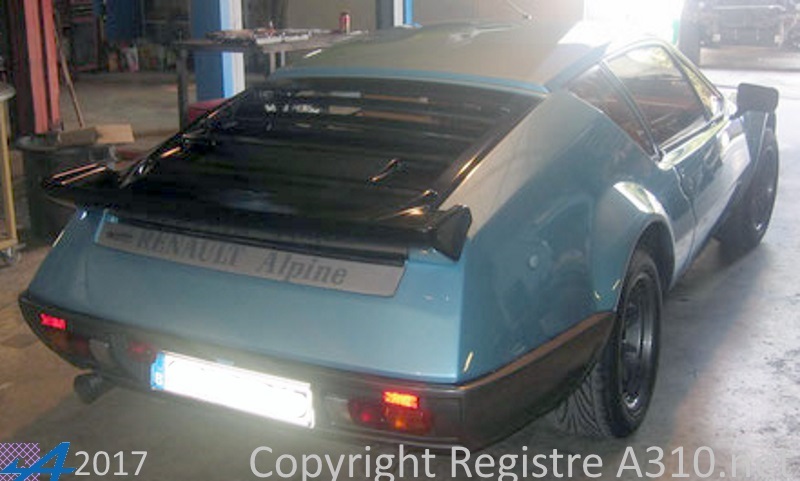 ?.05.1974 26 Champagne métallisé (or) Factory outgoing 27/02/7. 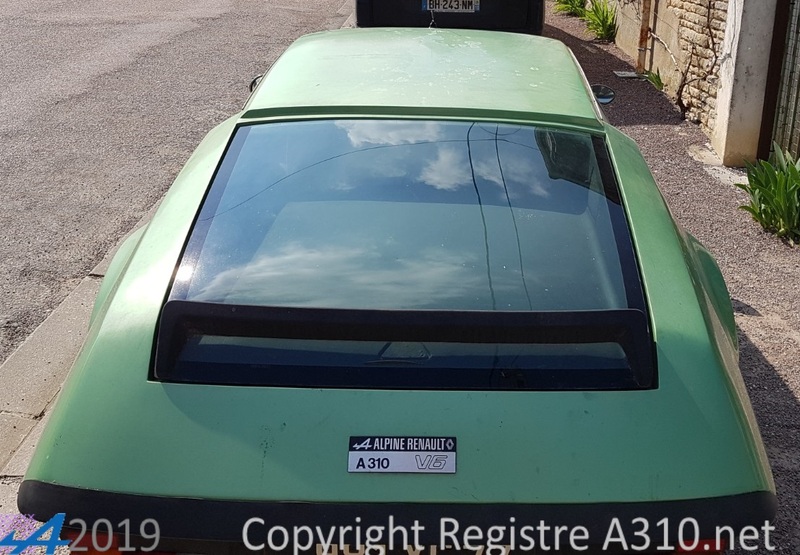 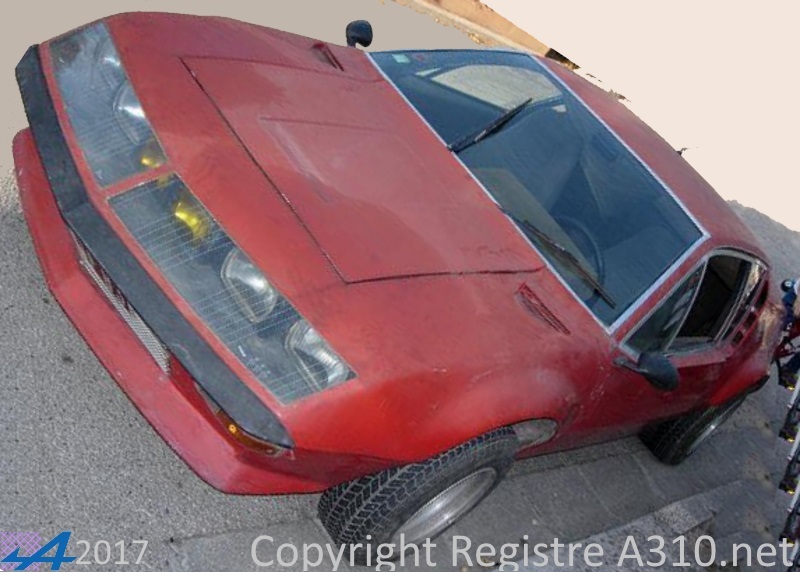 Search for historical owners between 05/1974 and November 1983 in Isere It was probably registered in Bouche du Rhone (8826 LH 13) in late 1983. 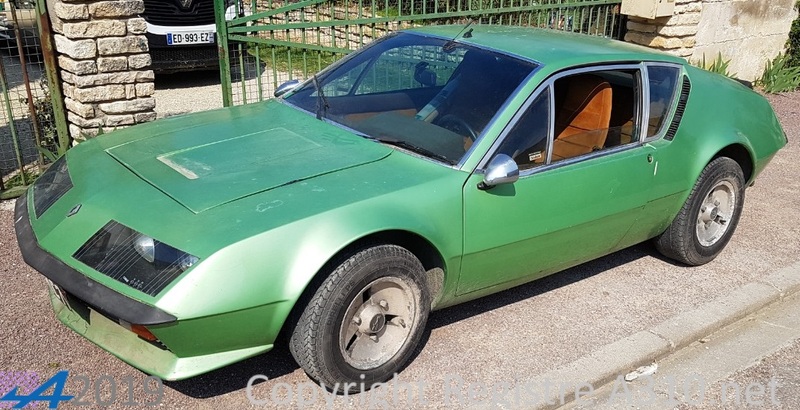 21588 1600VF 17.05.1974 26 Champagne métallisé (or) Interior Green Velvet, reboot by 2015 had not turned for 6 years, owner since 1992. 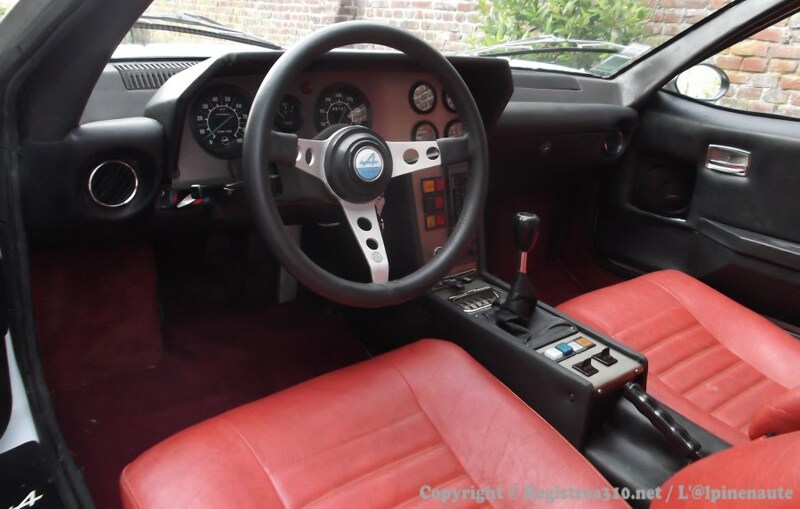 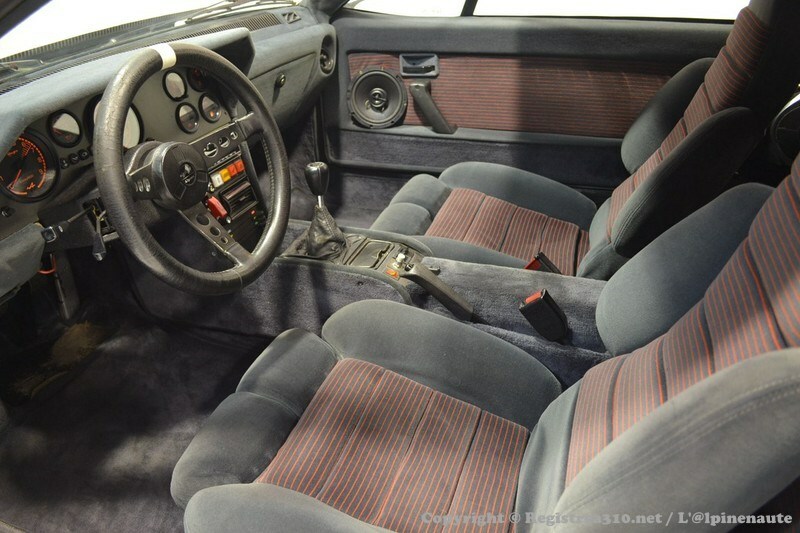 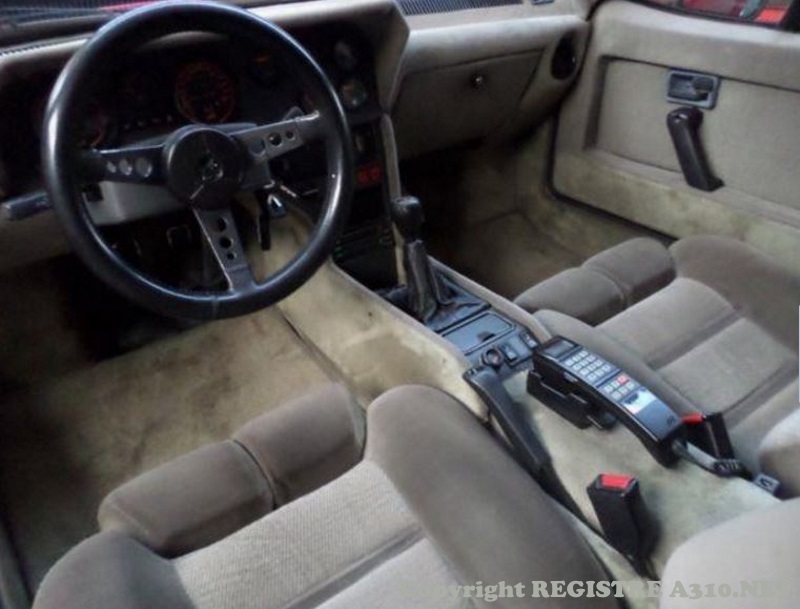 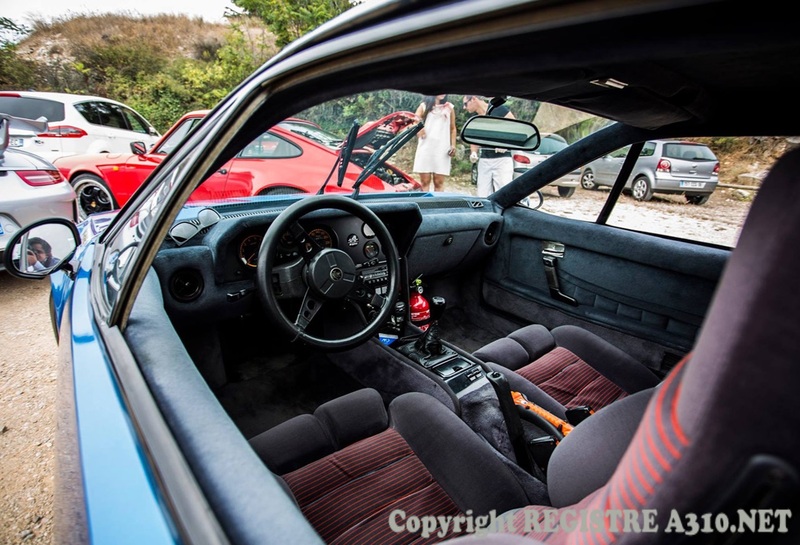 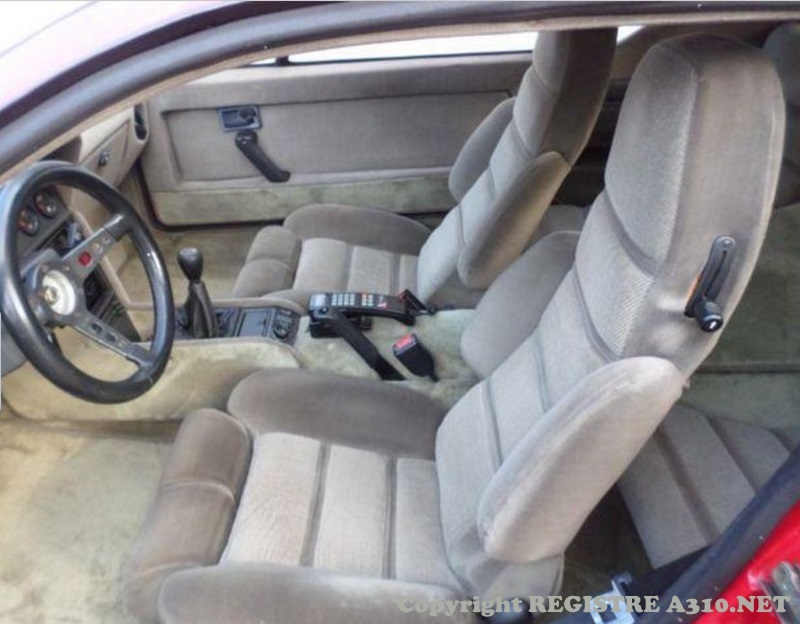 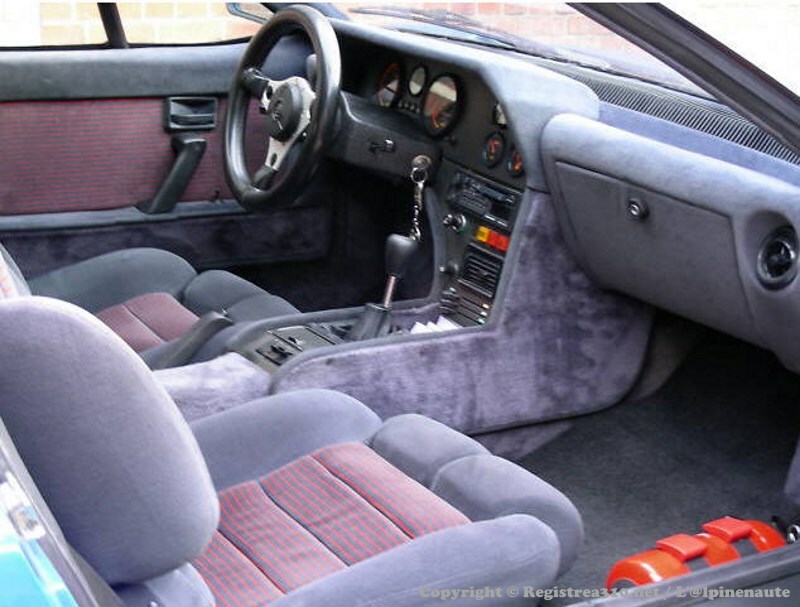 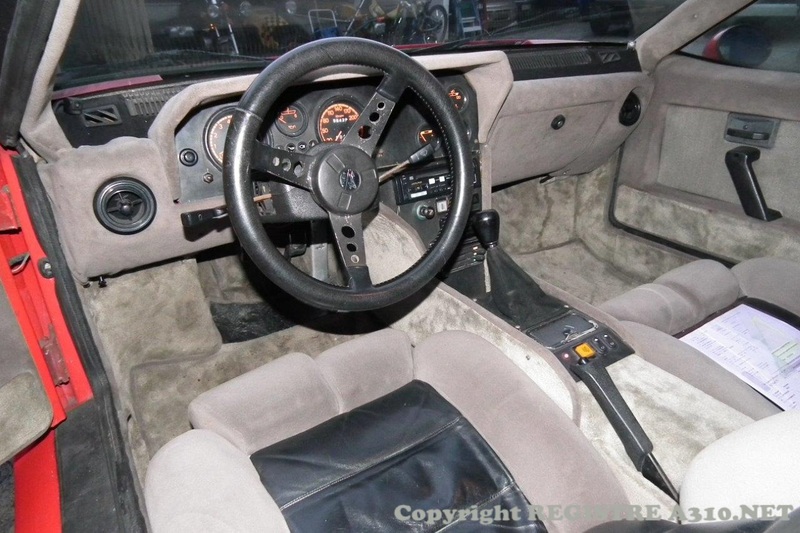 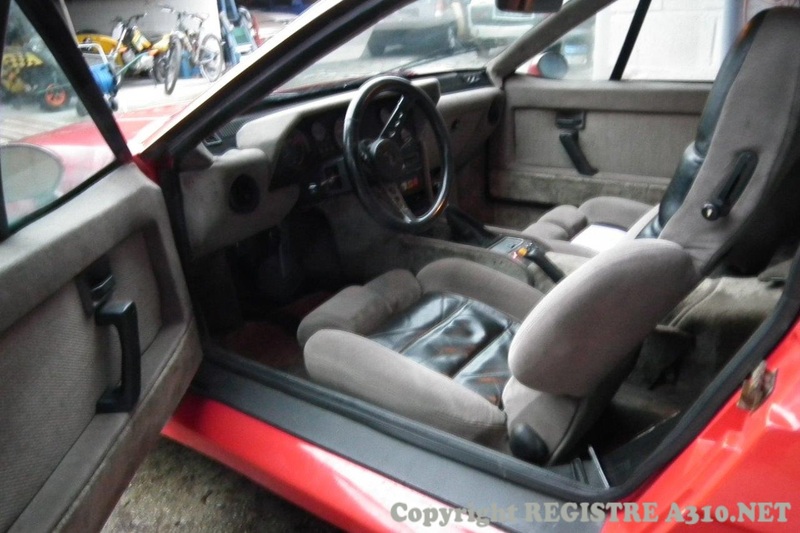 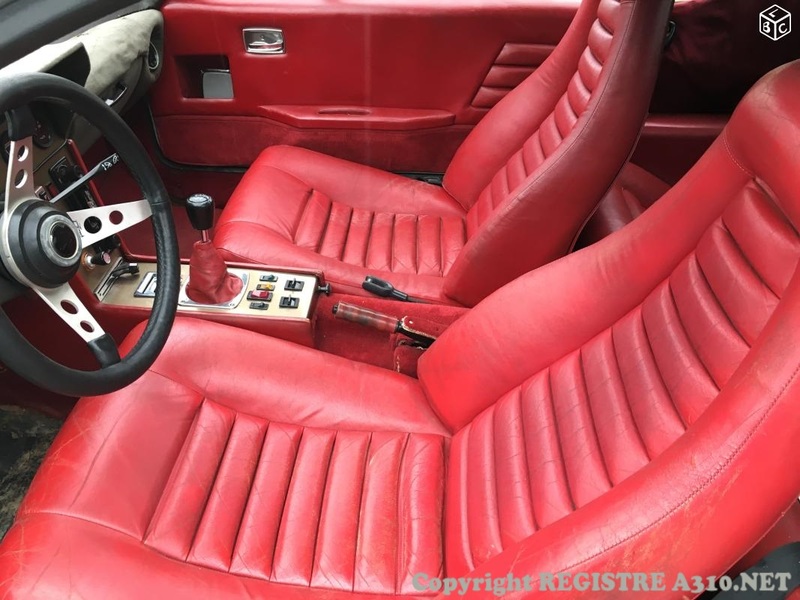 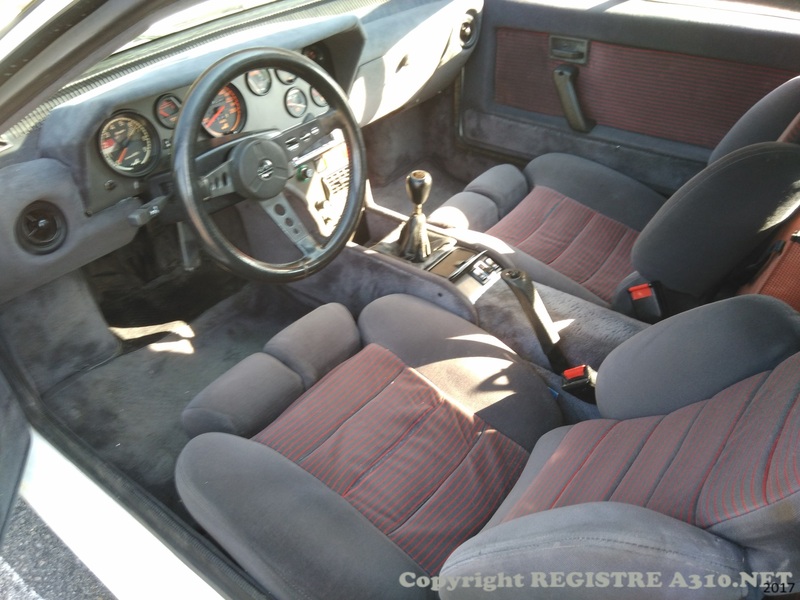 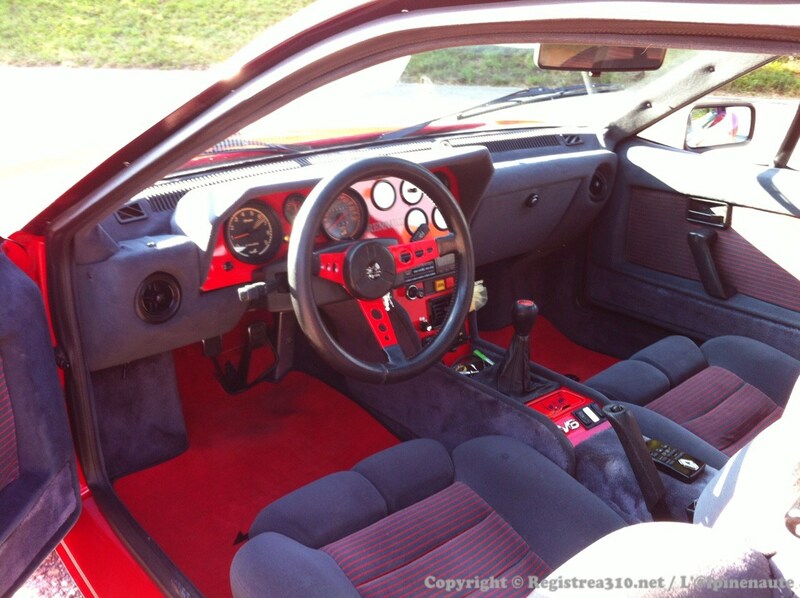 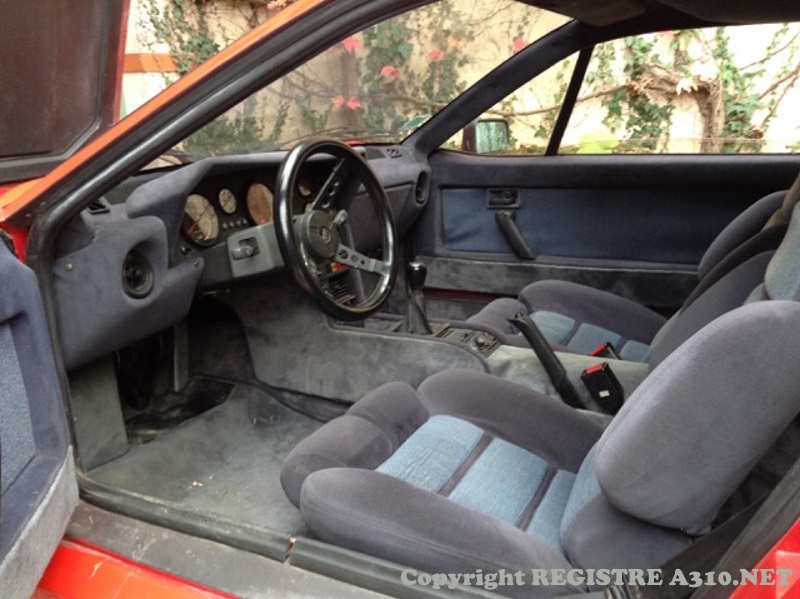 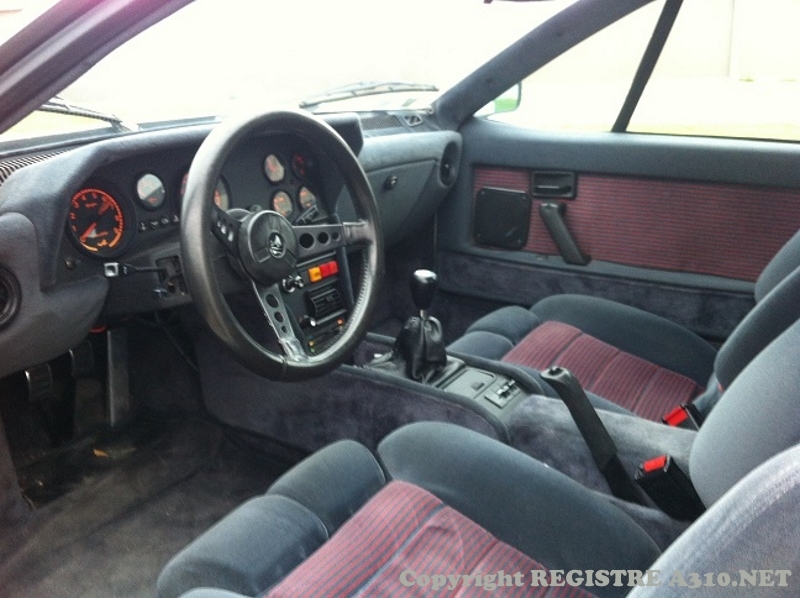 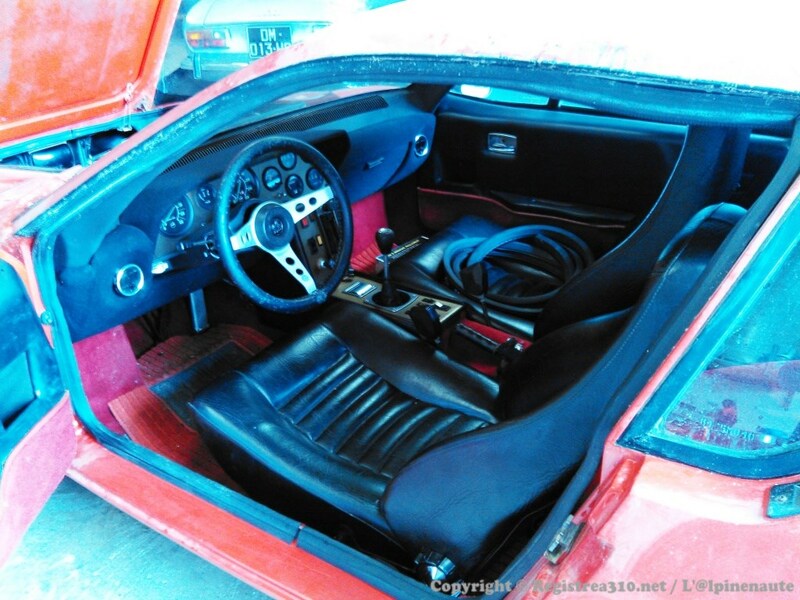 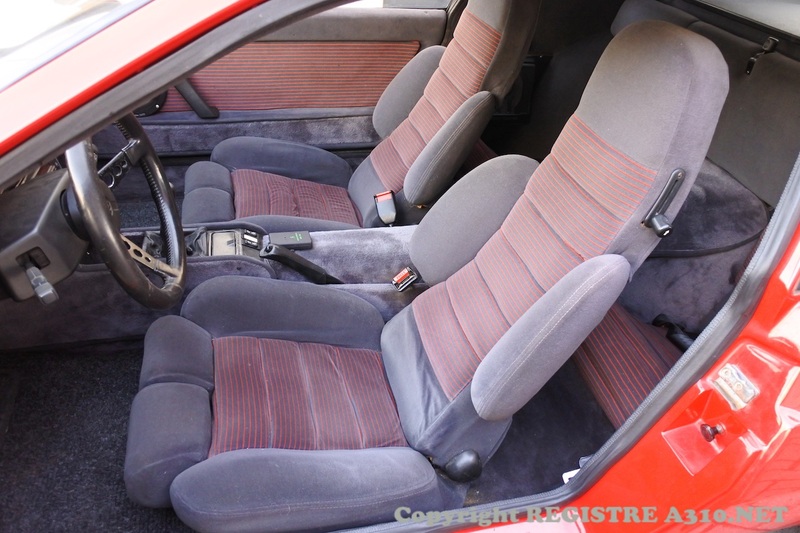 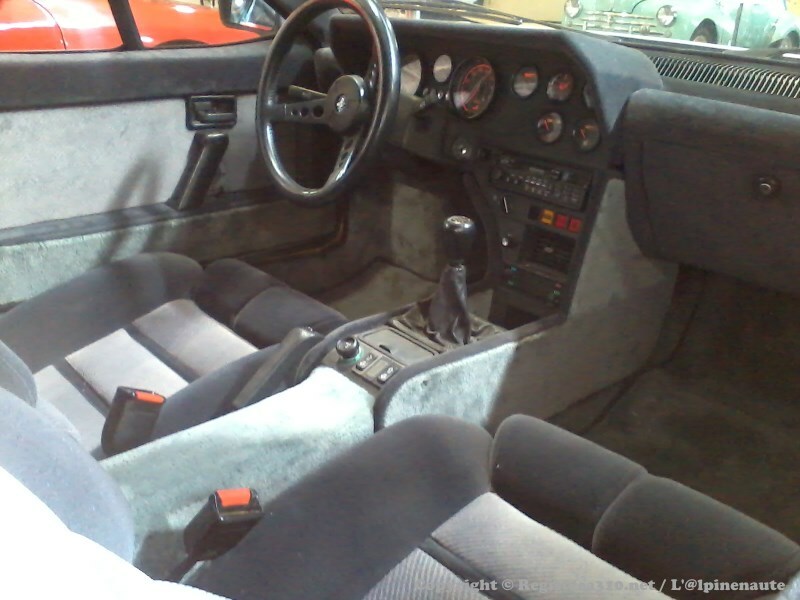 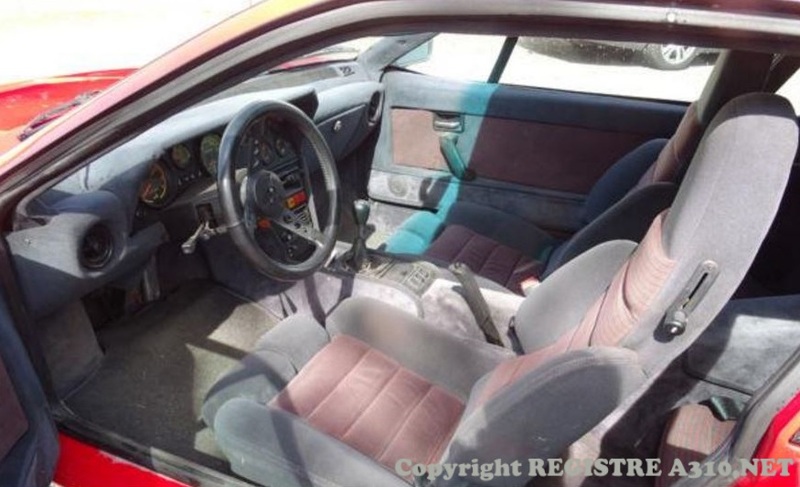 Interior: red Increase in group version 5. 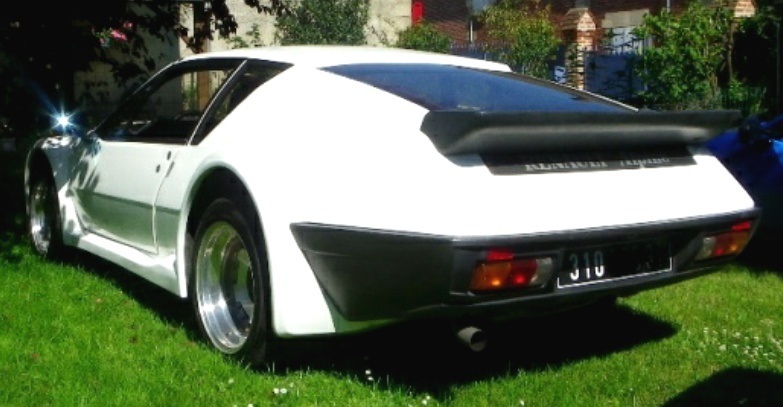 22022 1600VF 07.04.1977 White Gardenia Built in 1975, model 1976 first registration in 1977. 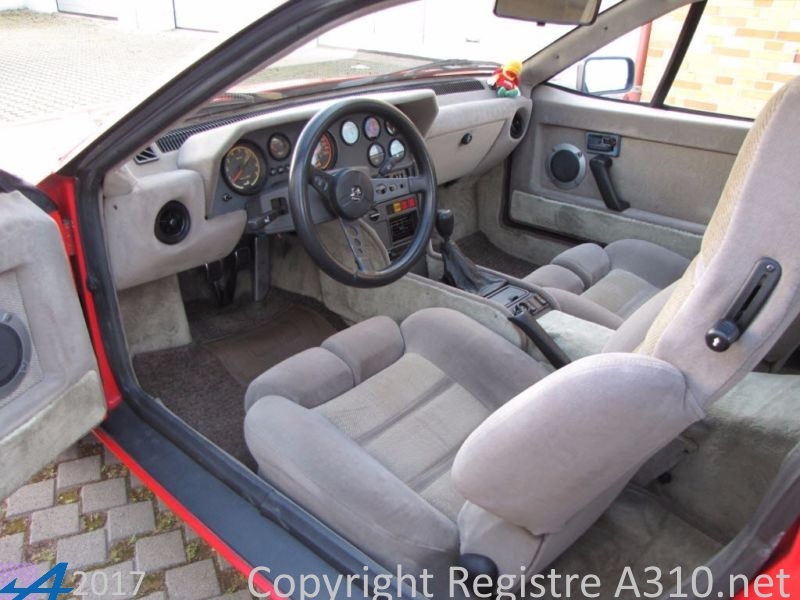 23144 1800VC ? 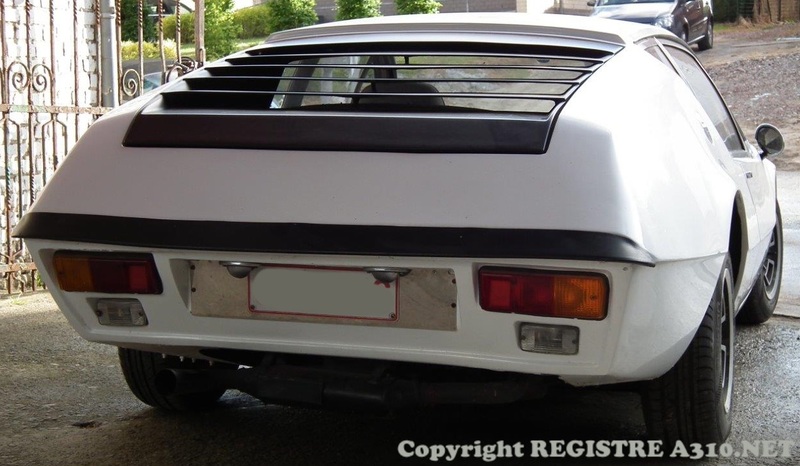 ?.03.1976 White Owner since 1996. 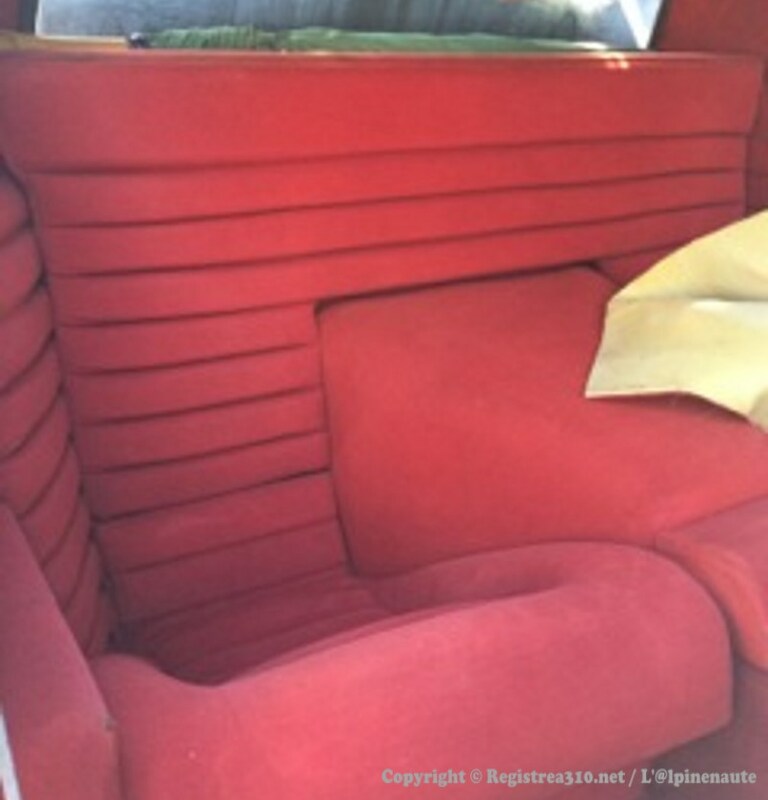 40289 1600VG 21.05.1976 White gardenia Interior red velvet. 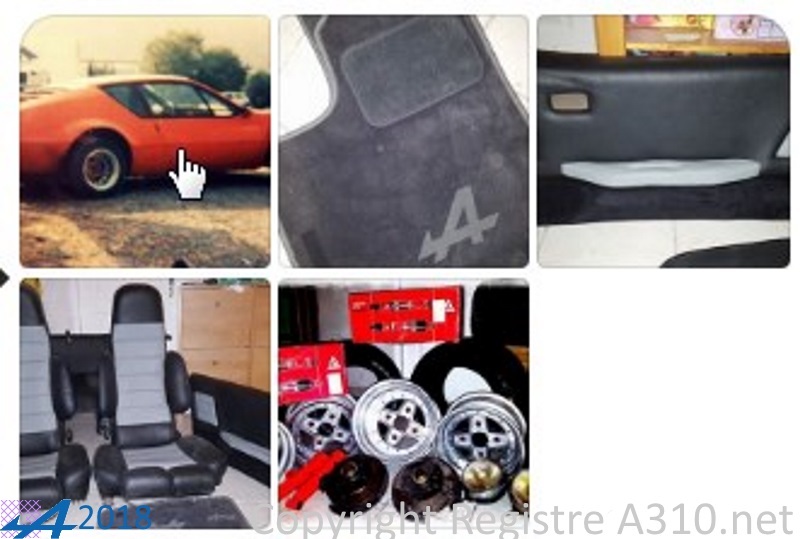 43783 2700VA ??.? 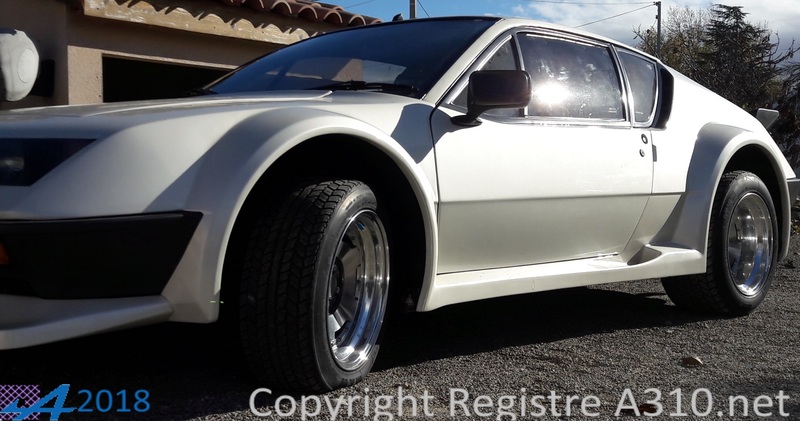 ?.1977 White Gardenia Fleischmann conversion 80's. 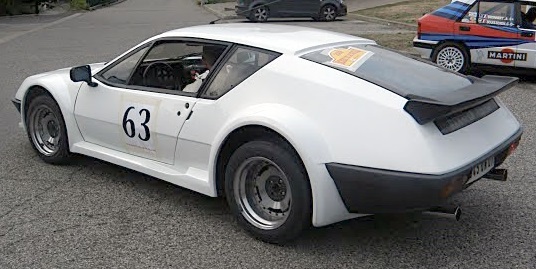 Used for competition. 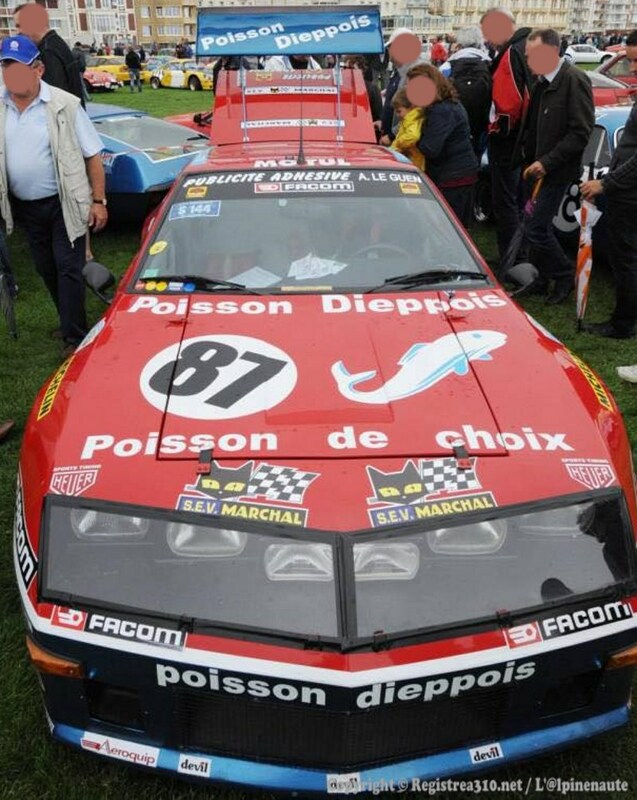 Converted in replica of Poisson Dieppois A310. 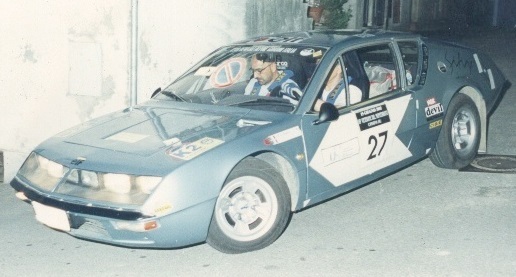 The car is endorsed by Bernard Decure. 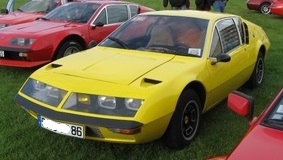 The car has won awards and was 'Best in Show' at Brustem 2008. 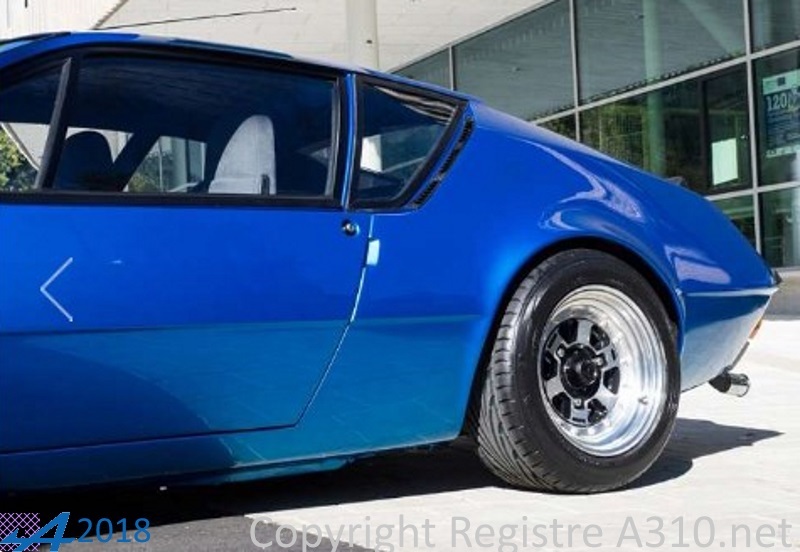 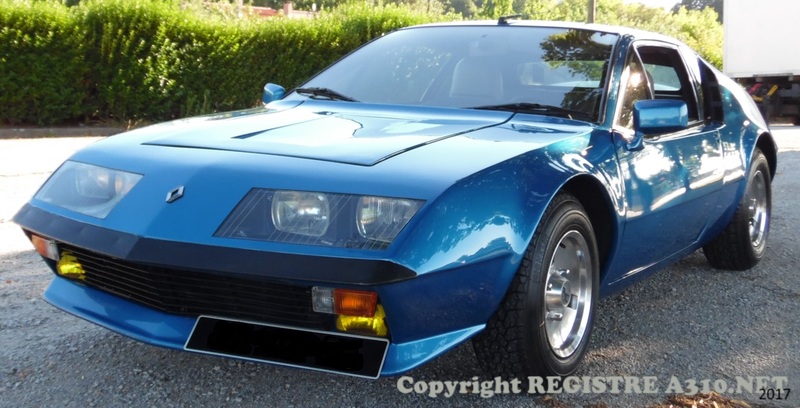 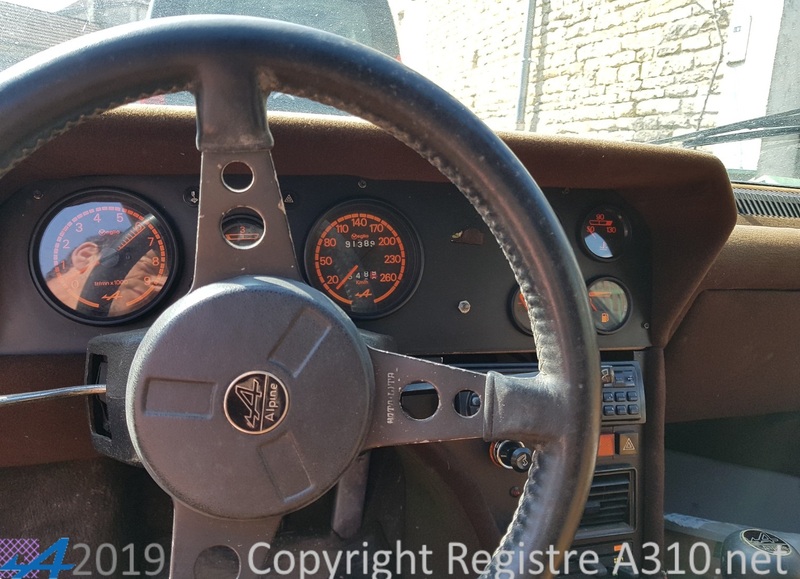 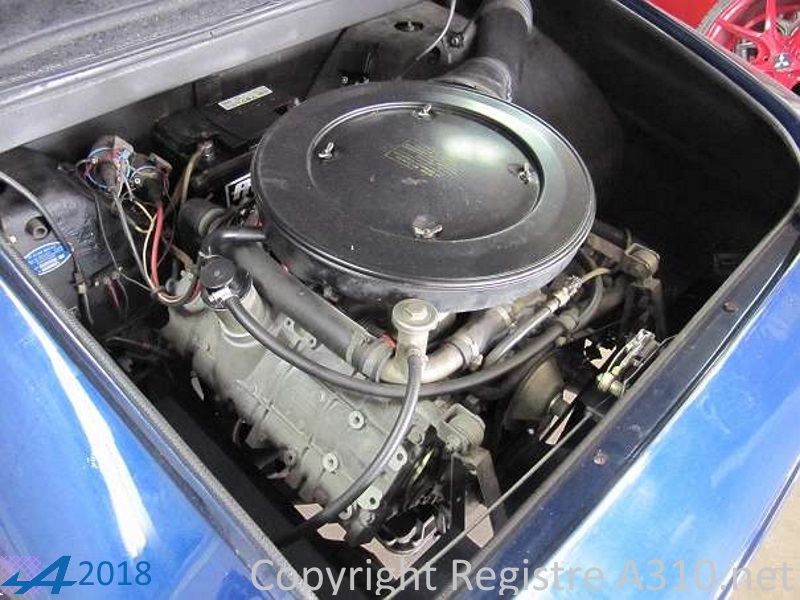 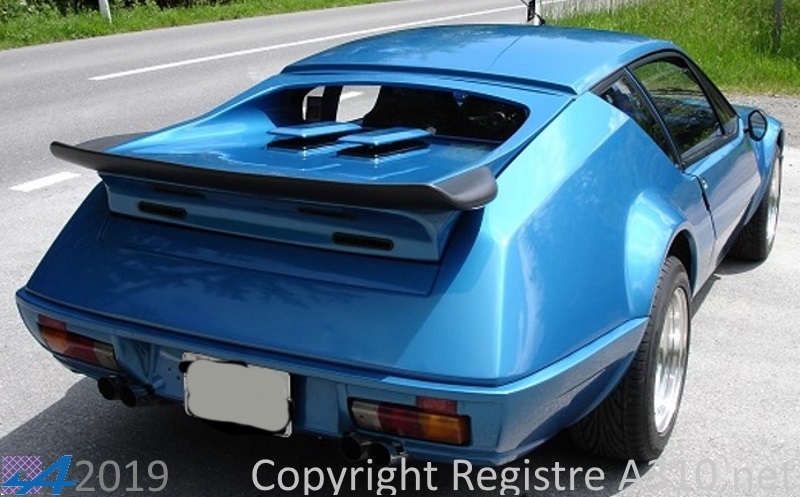 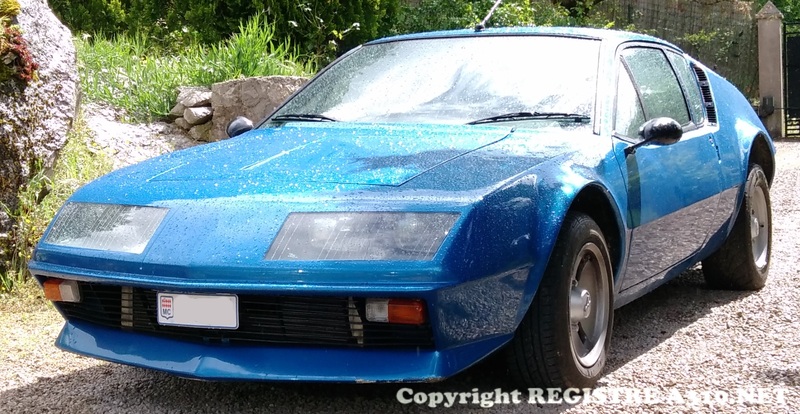 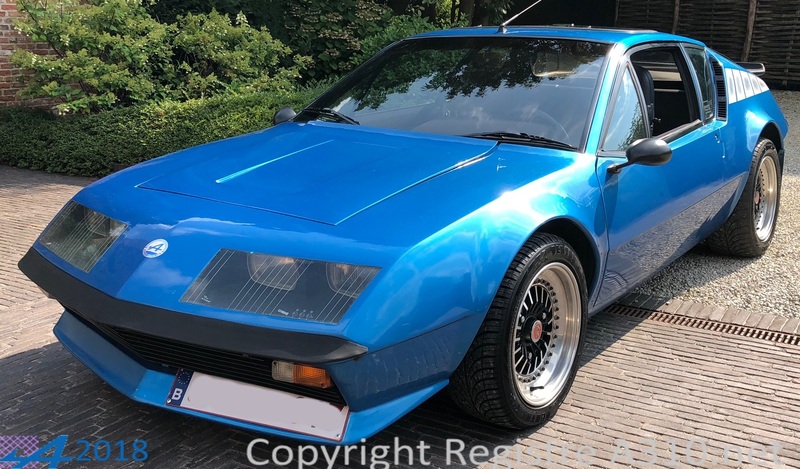 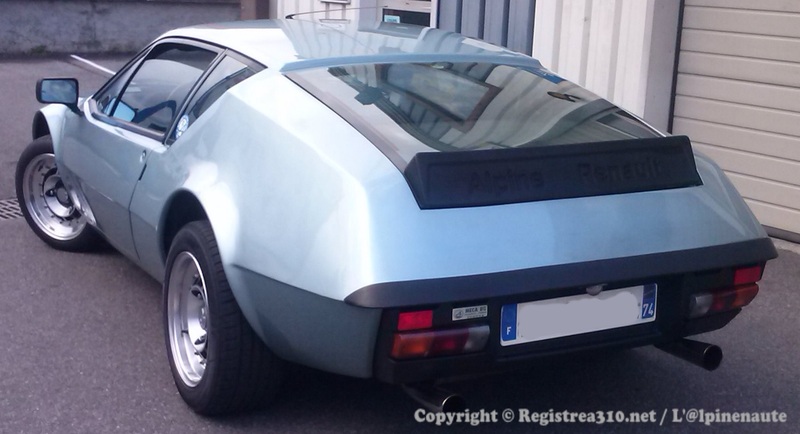 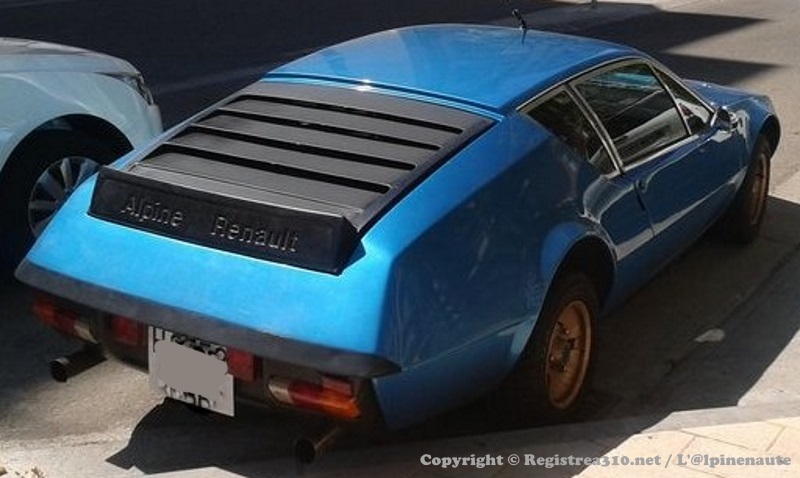 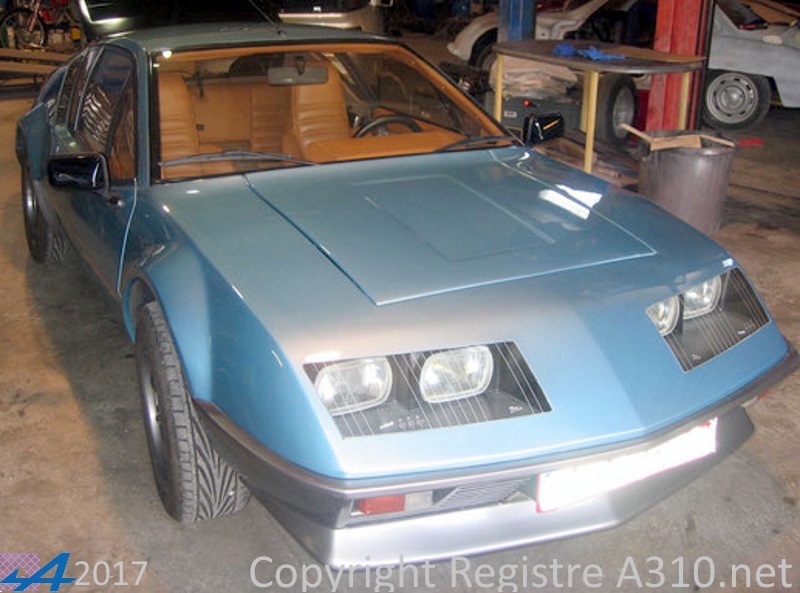 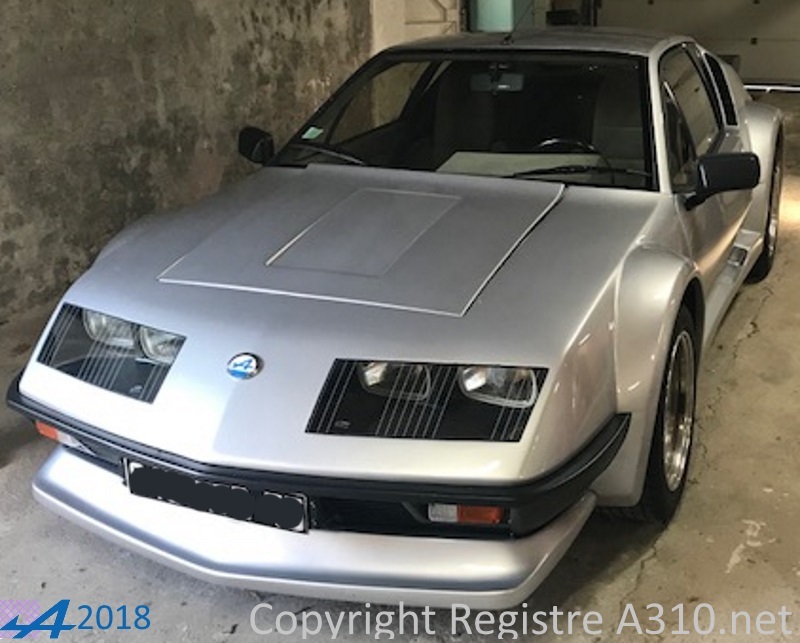 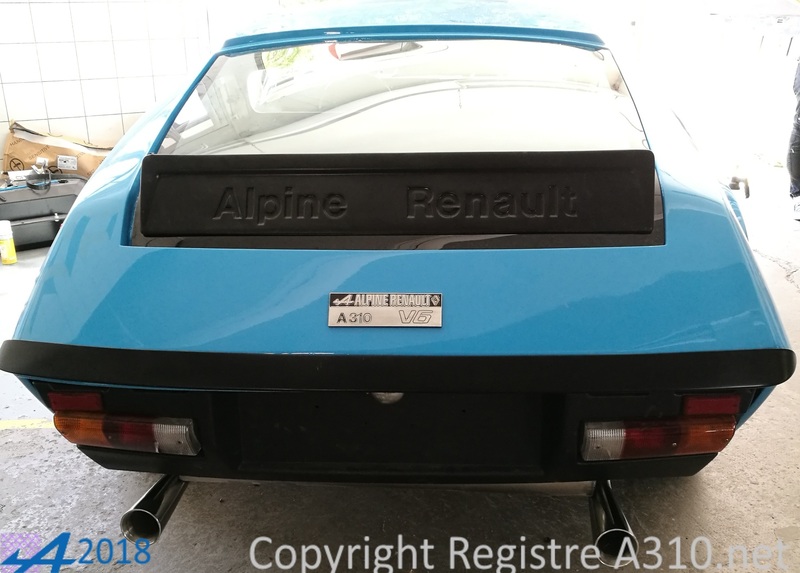 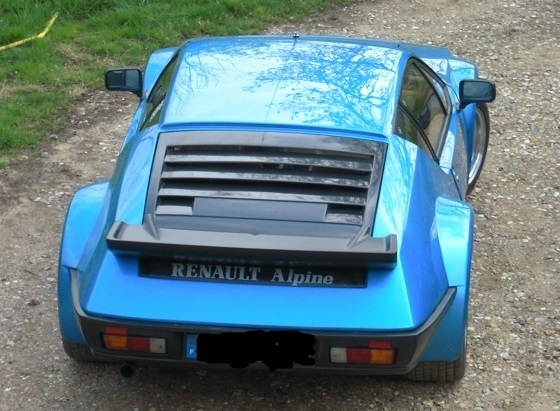 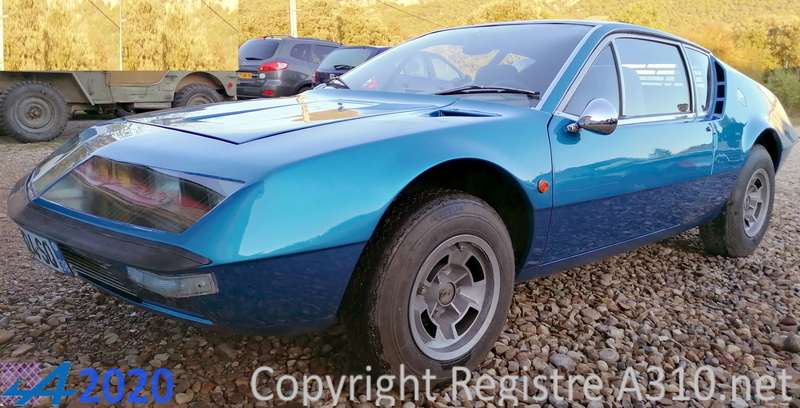 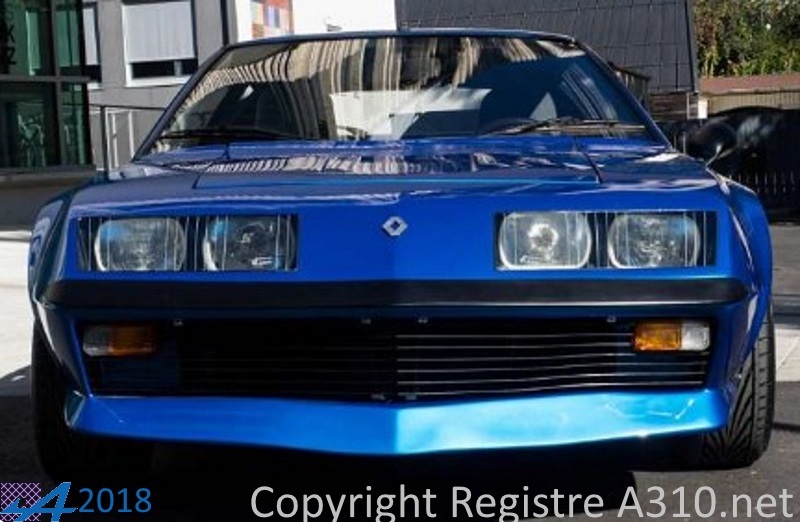 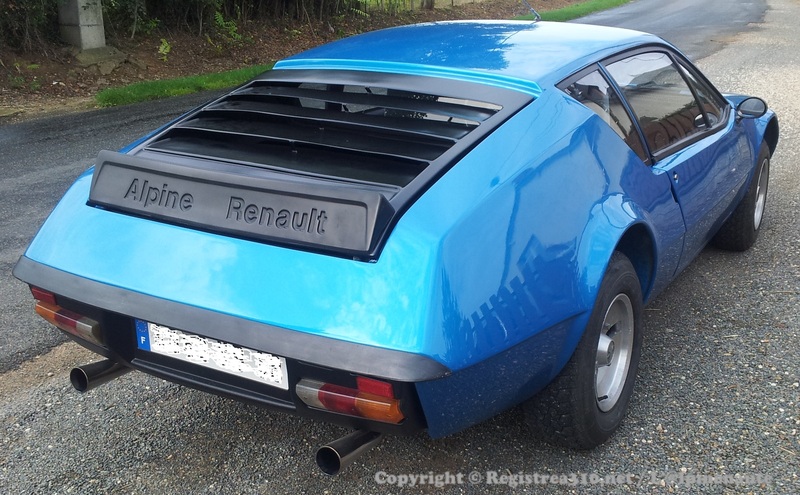 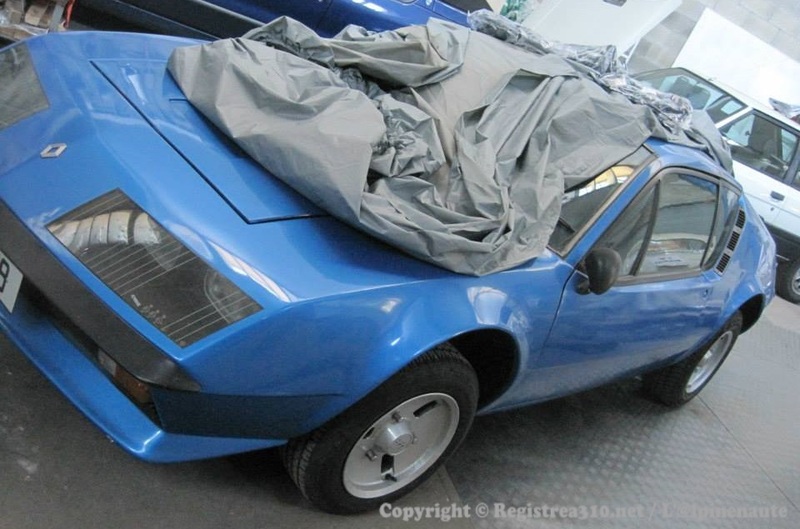 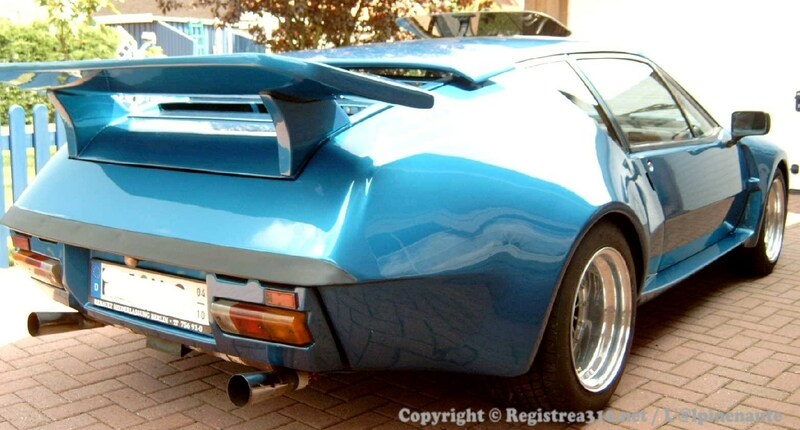 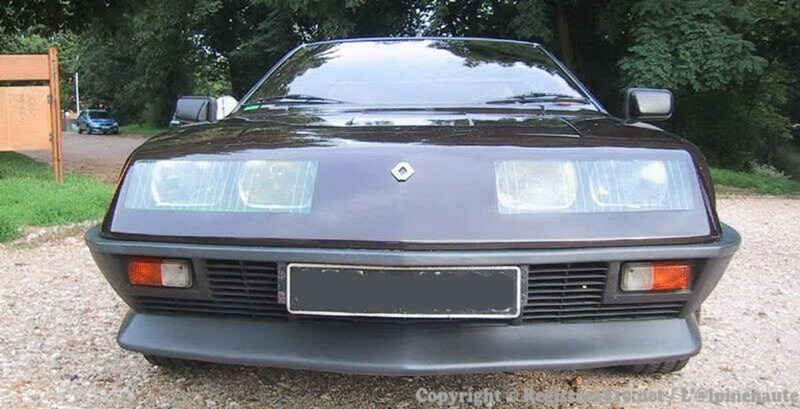 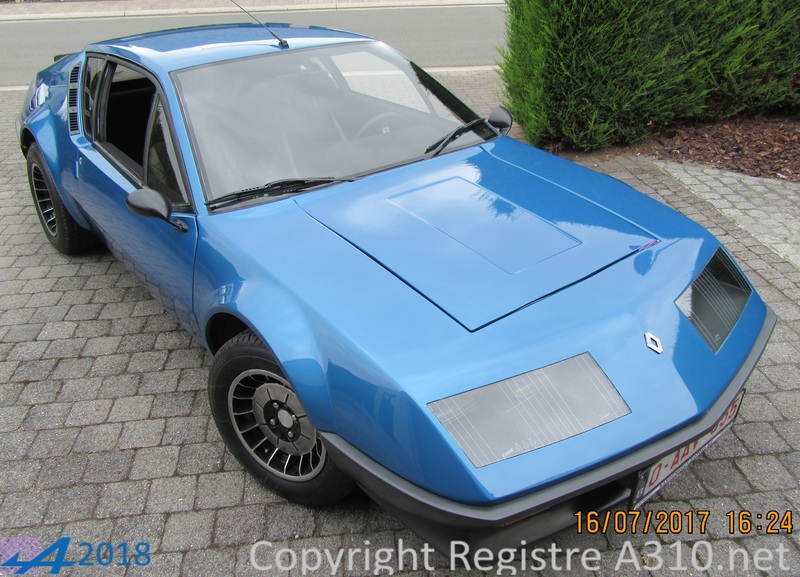 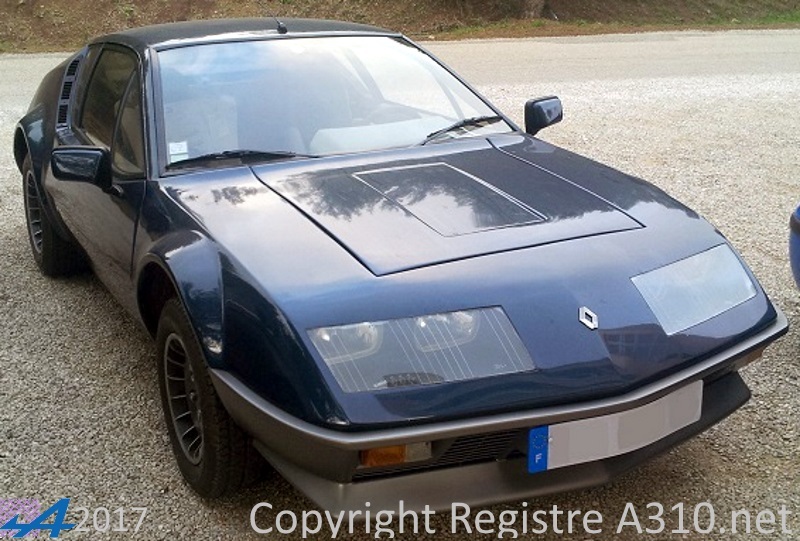 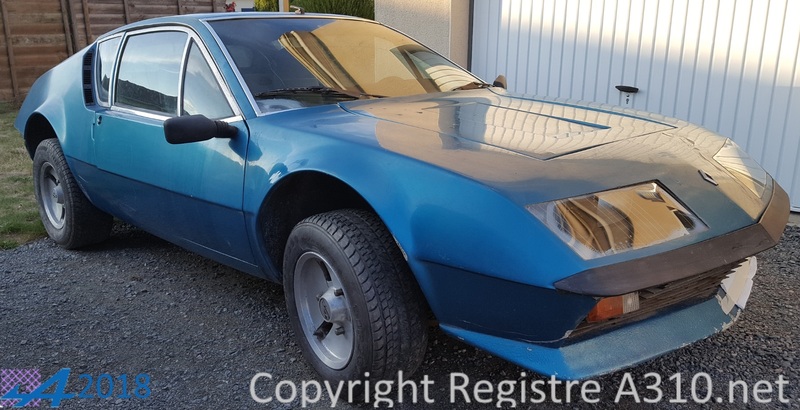 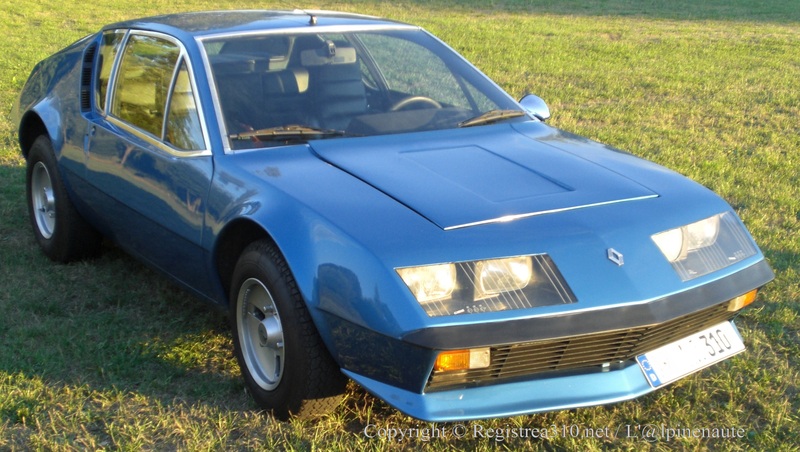 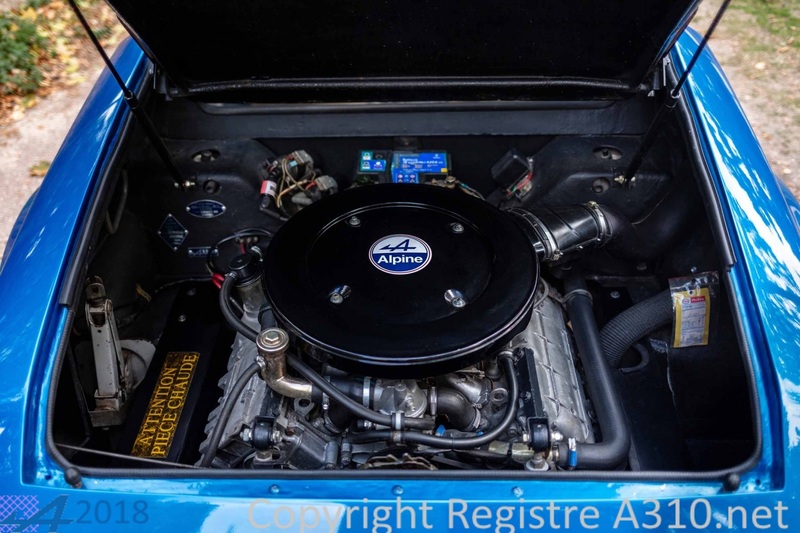 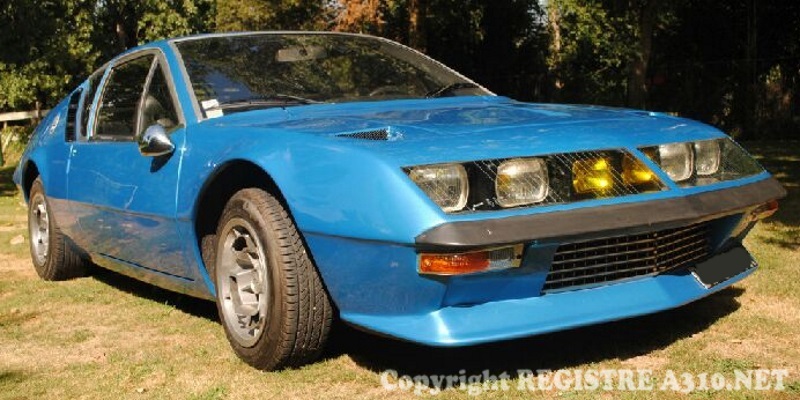 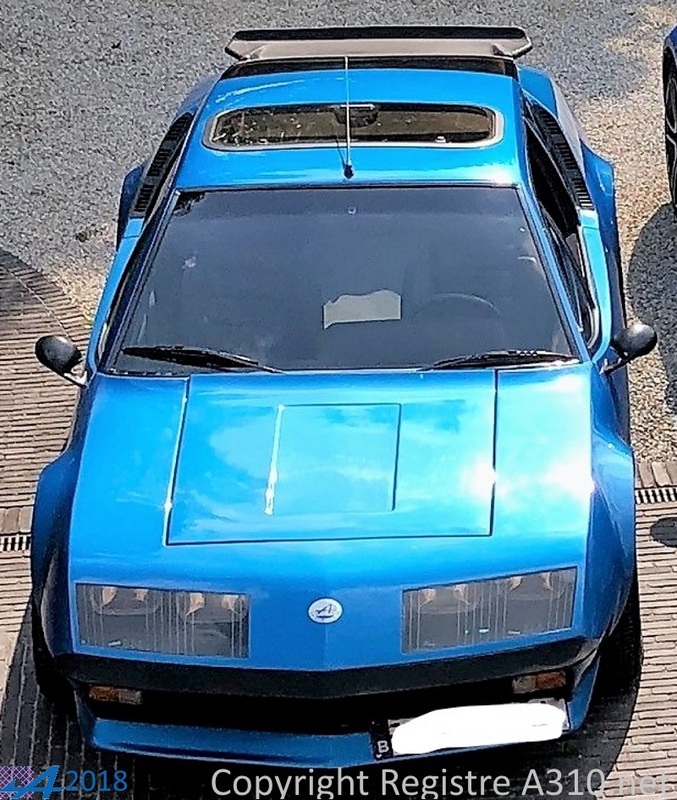 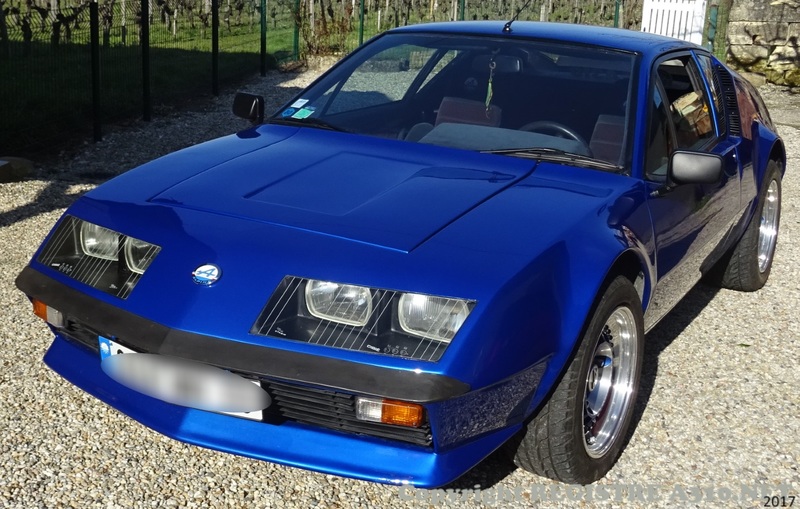 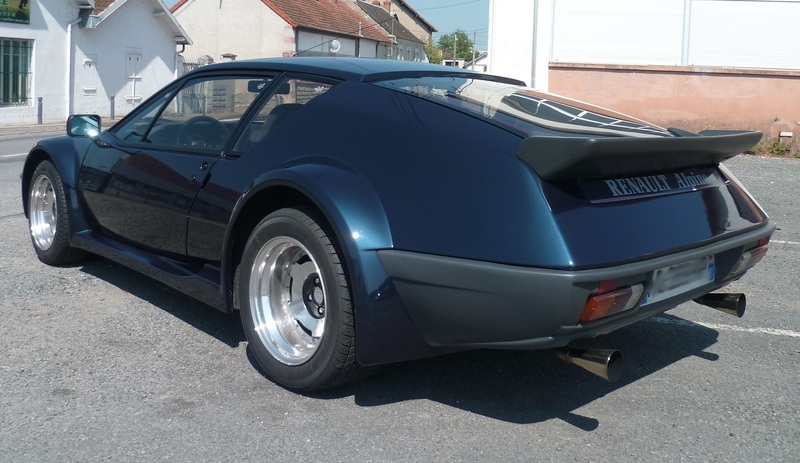 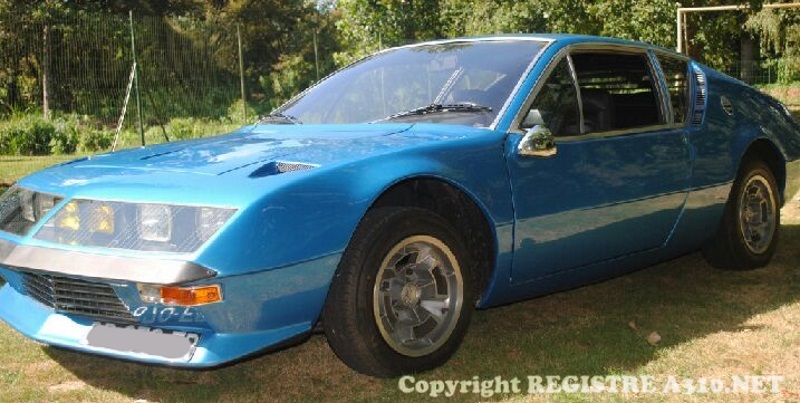 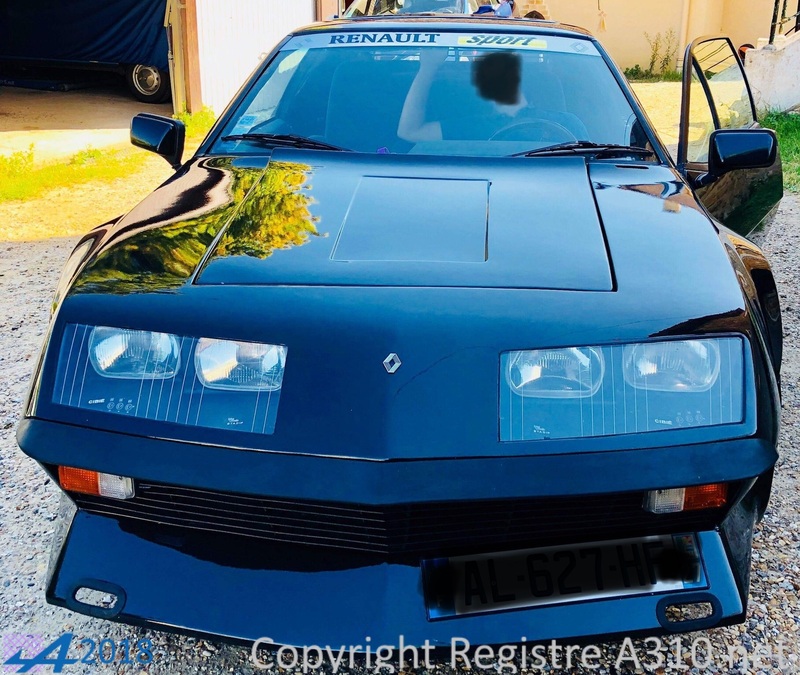 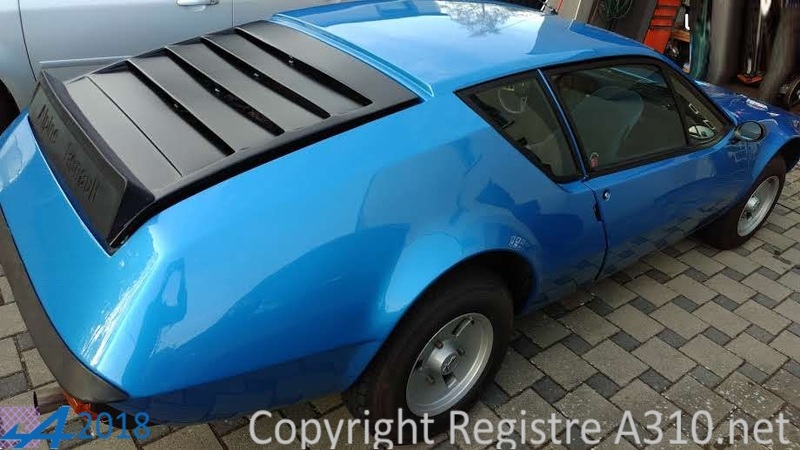 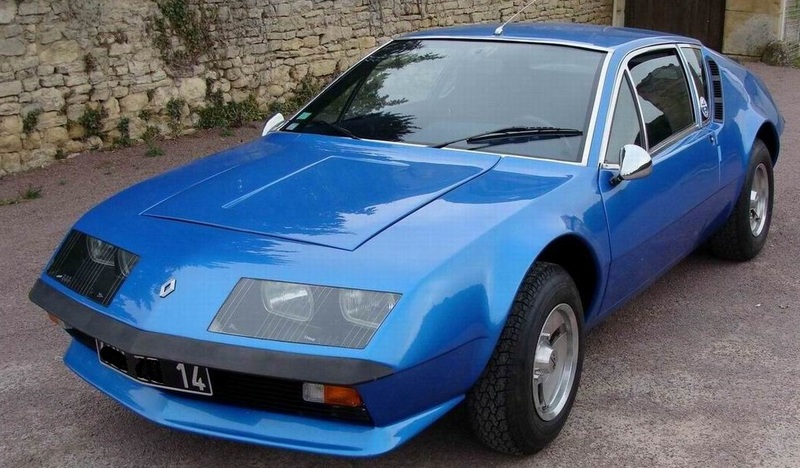 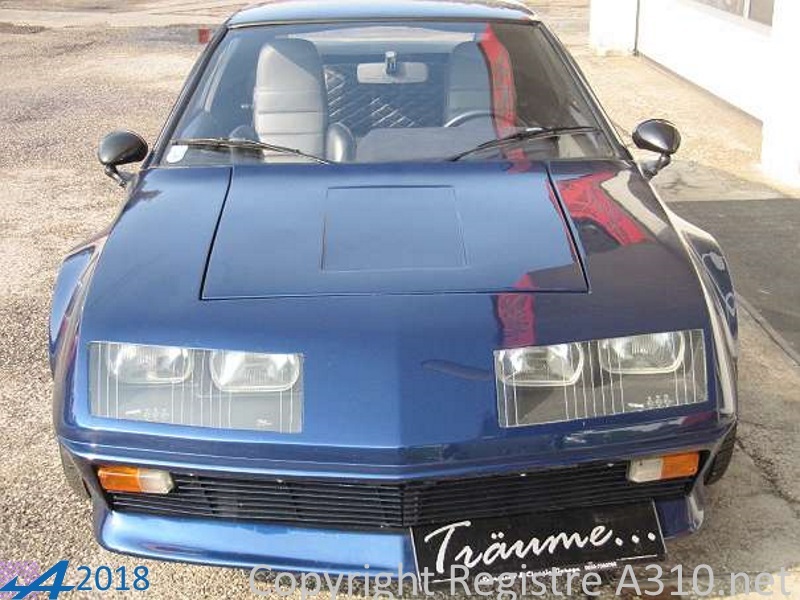 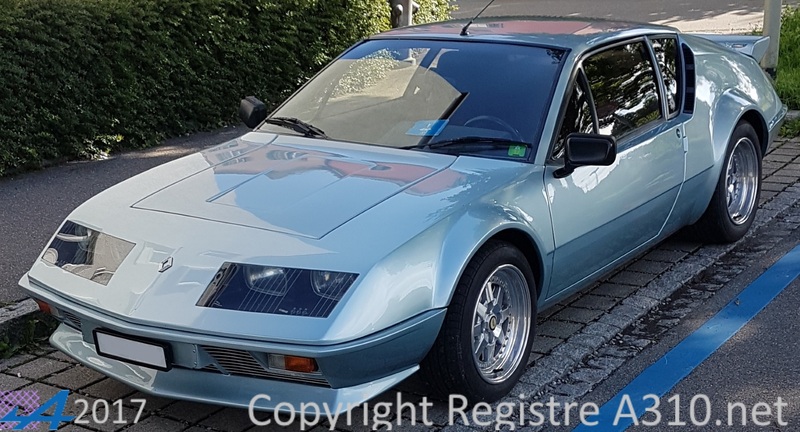 44508 2700VA 01.07.1978 460 Blue foncé New owner since 2018. 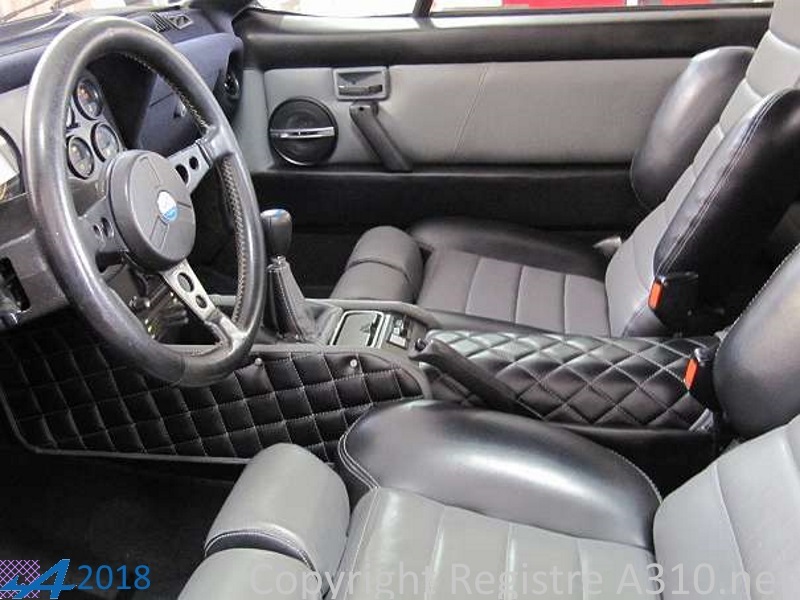 44693 2700VA ? 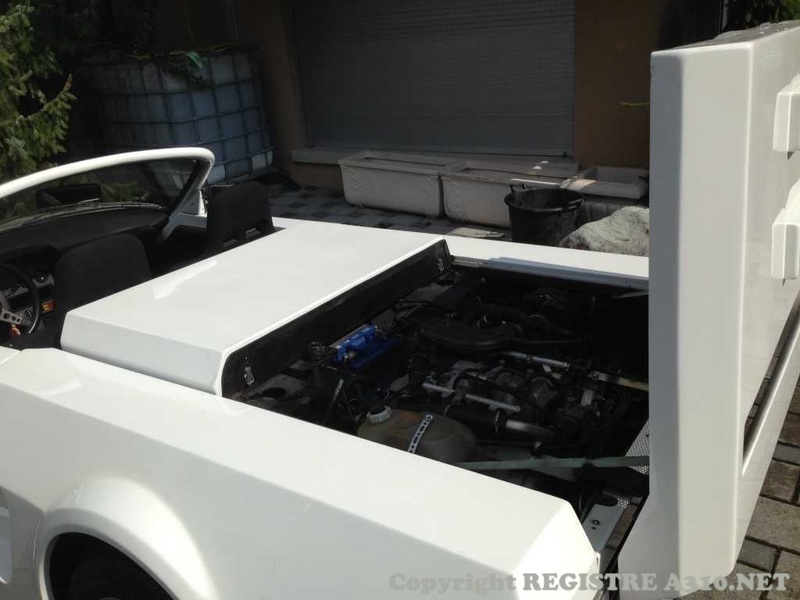 ?.06.1978 White In restoration. 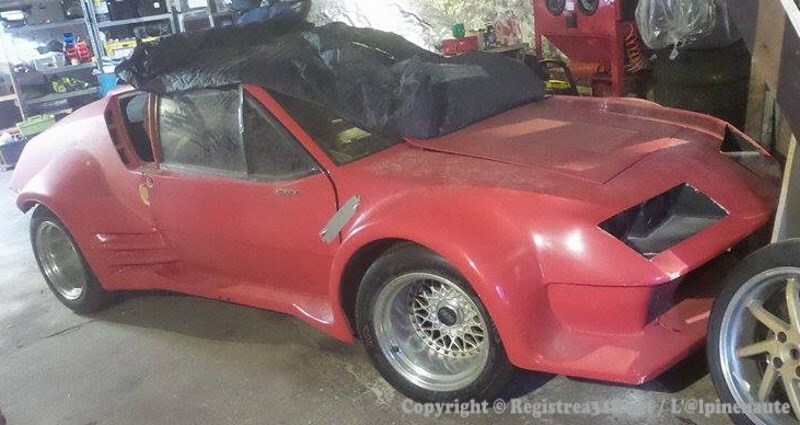 Only frame and body available. 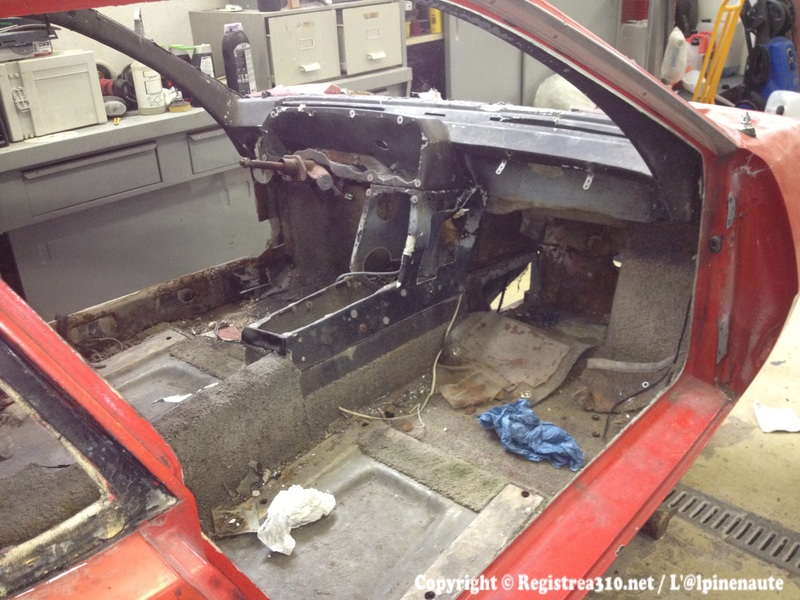 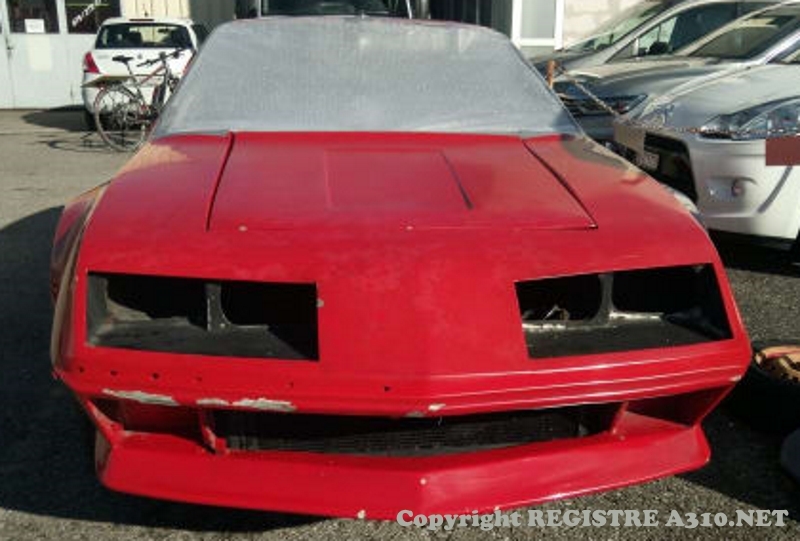 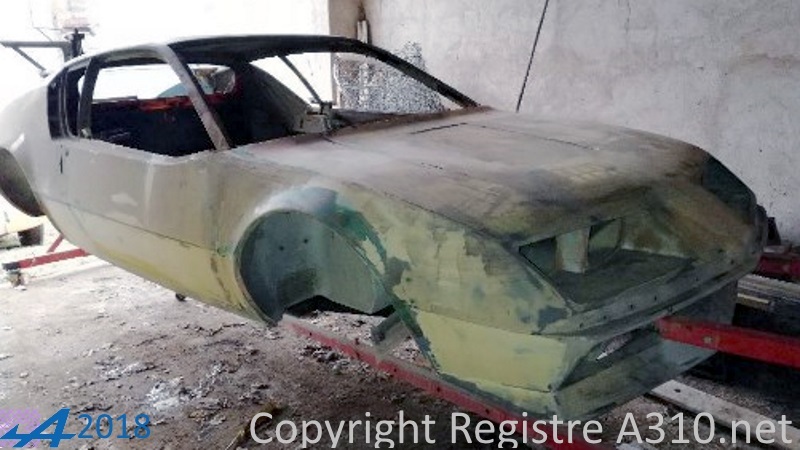 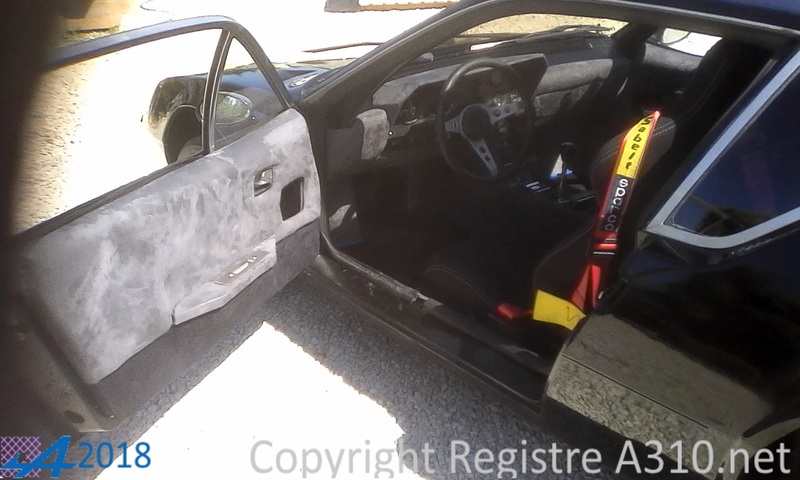 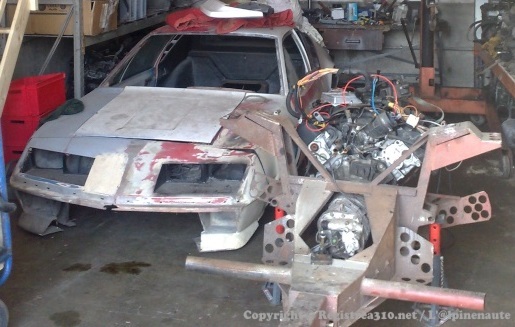 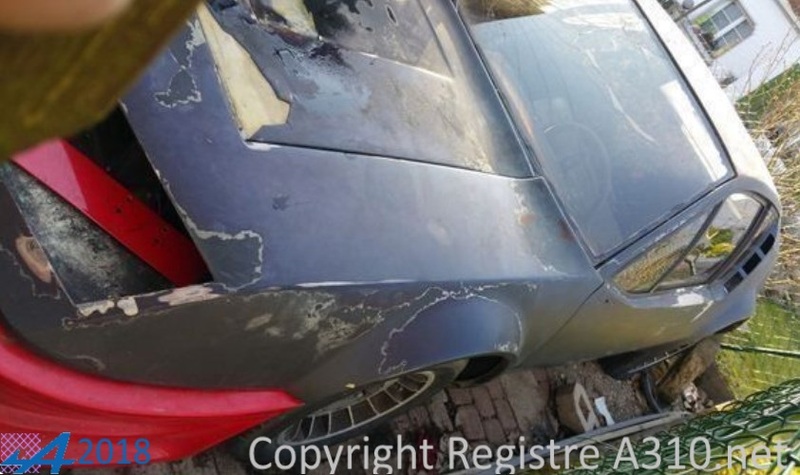 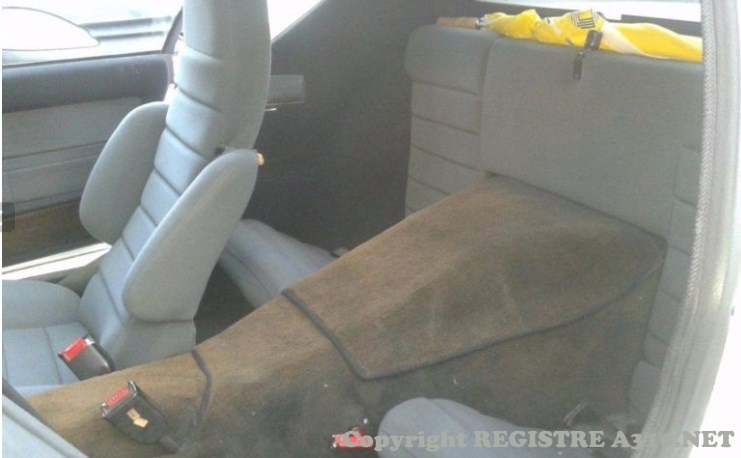 Owner looks for missing parts or sells body and frame. 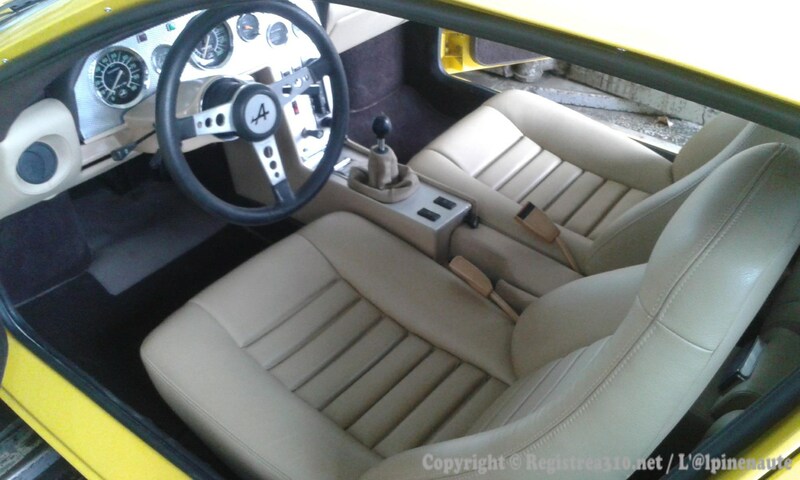 44748 2700VA ??.? 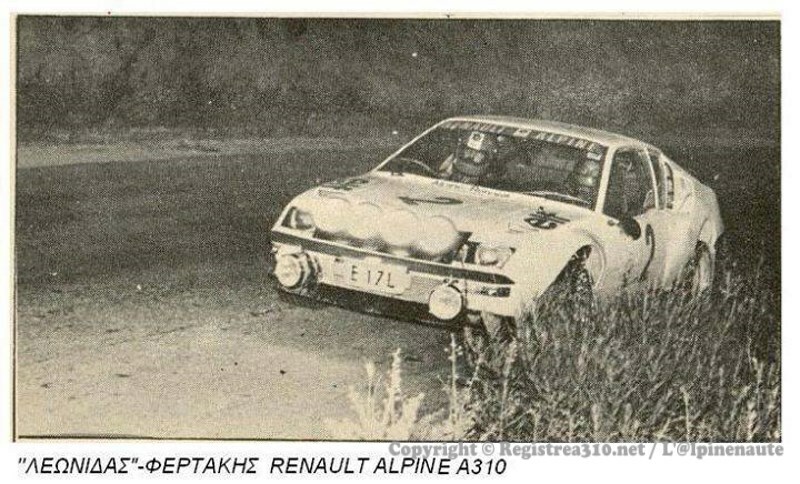 ?.1978 -- Source @lpinenaute. 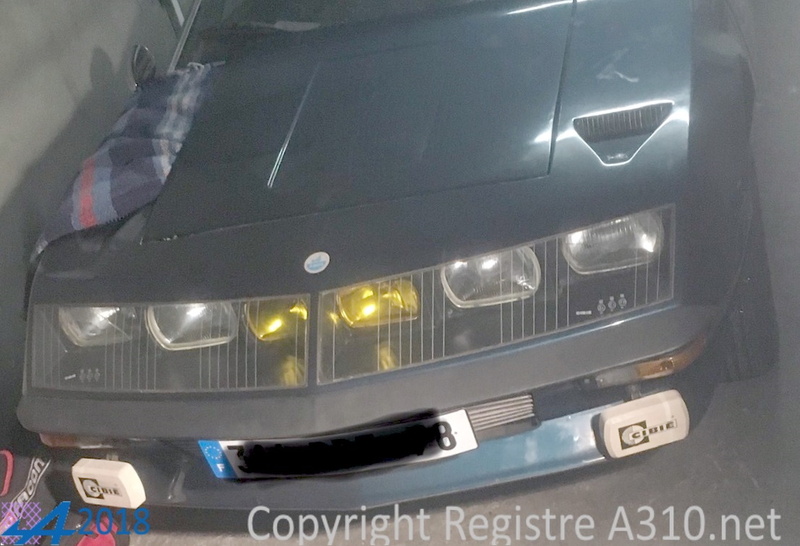 The son of the ex-owner looking A310 of his father. 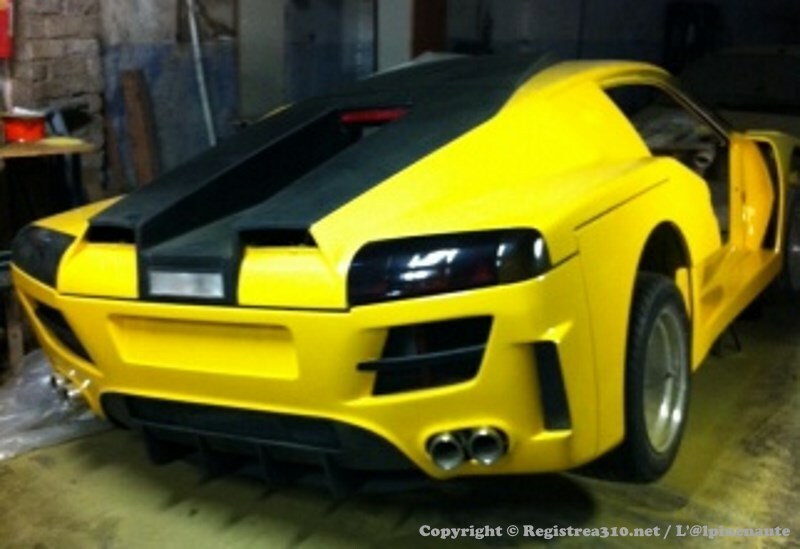 48000 Km - 2015 De carbon-specific chassis. 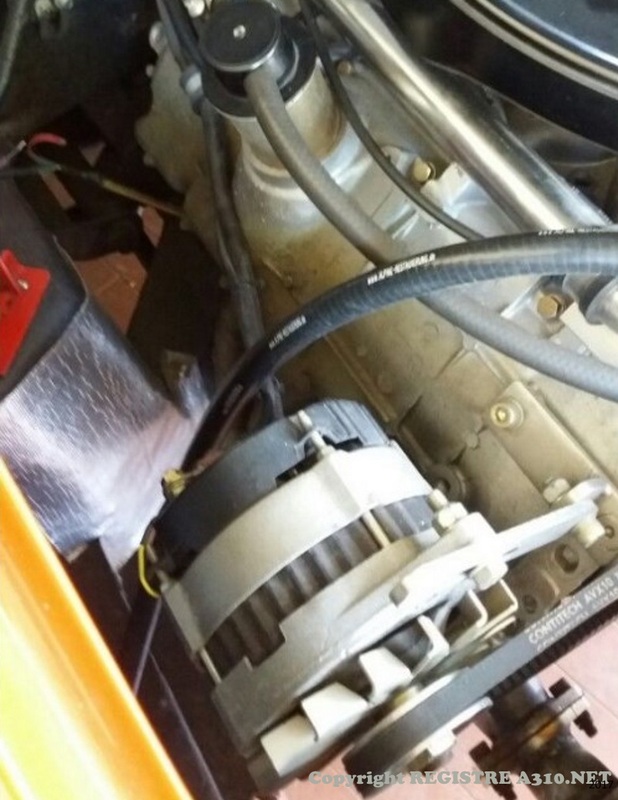 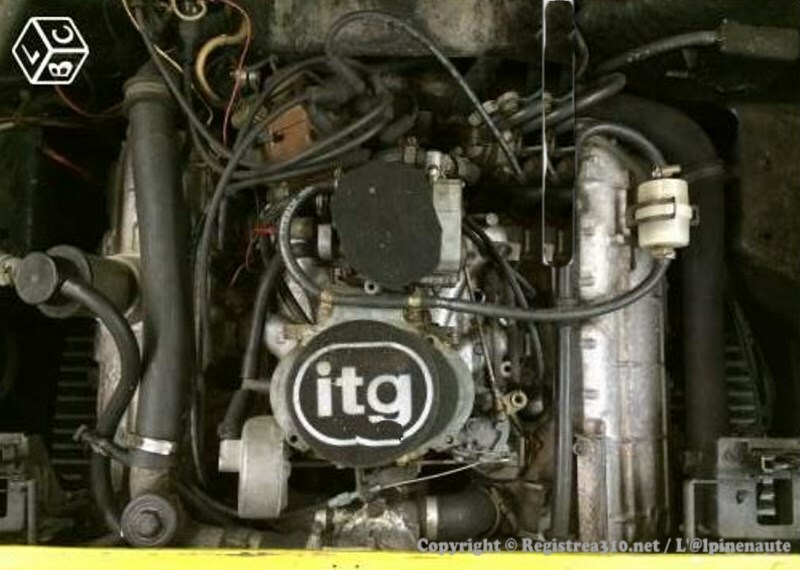 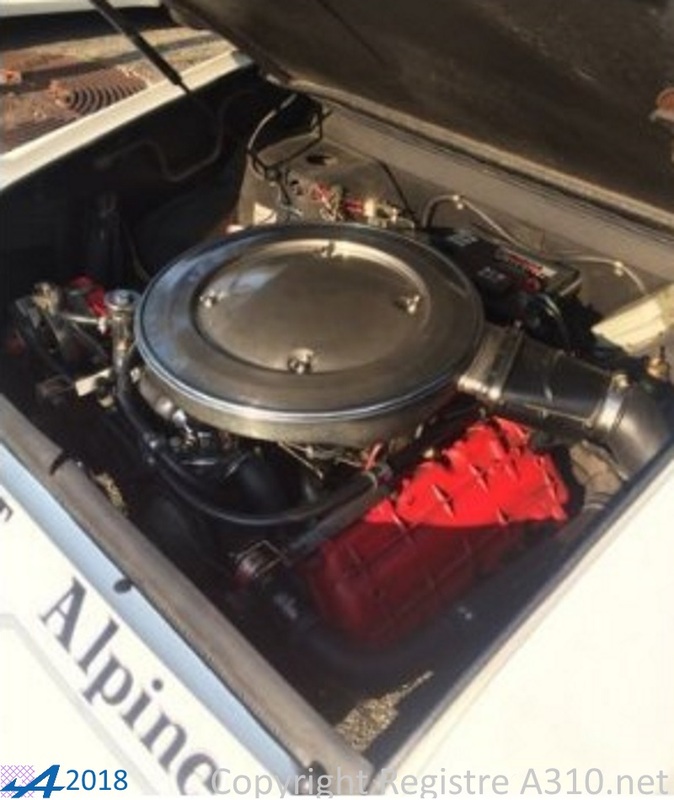 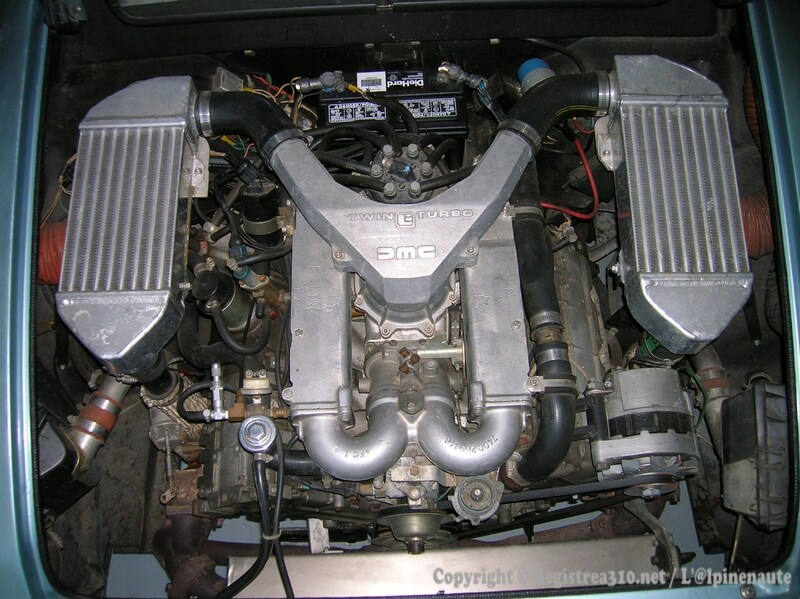 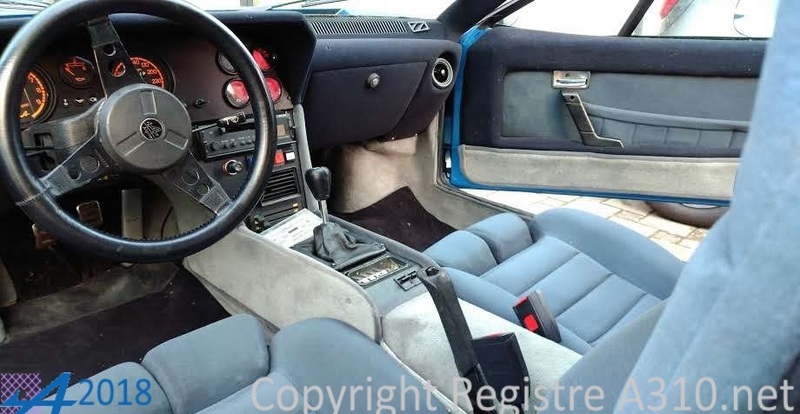 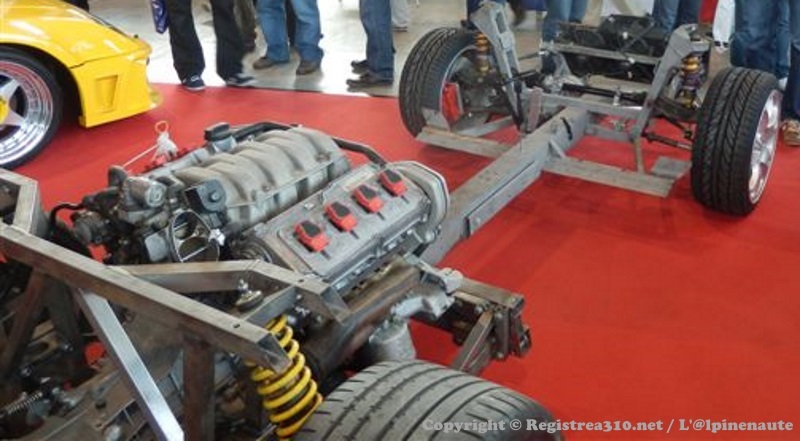 for the DeLorean Changes: Twin Turbo 2.8 liter DeLorean spec motor. 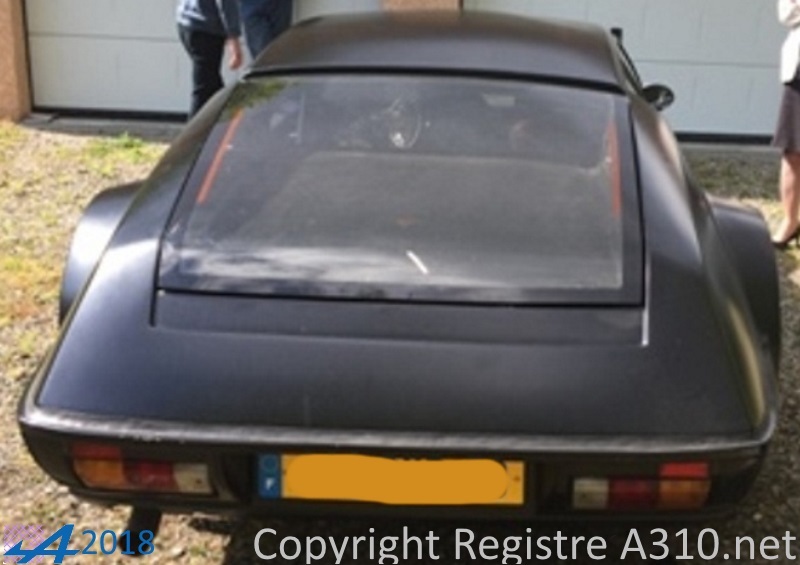 45287 2700VA 03.10.1978 metallic gray The car has been sold for the German market in 1978 but in 1990 it was imported in Italy. 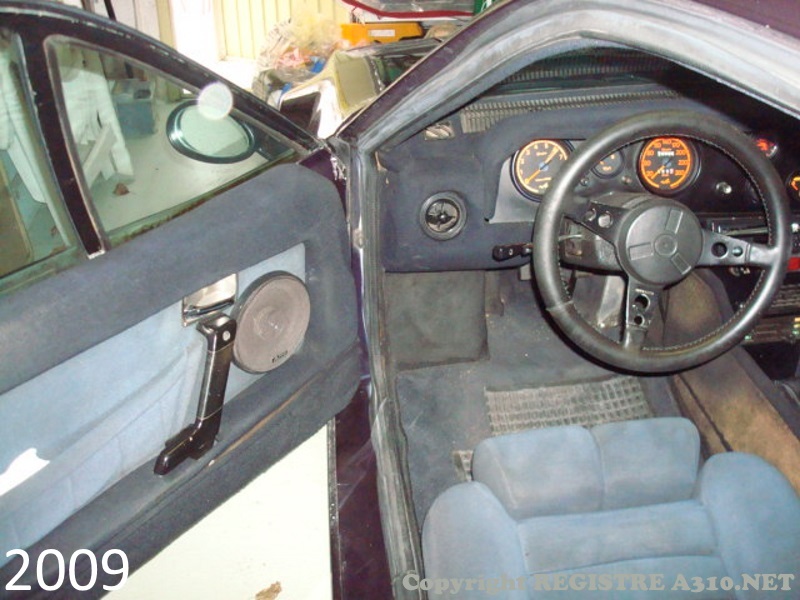 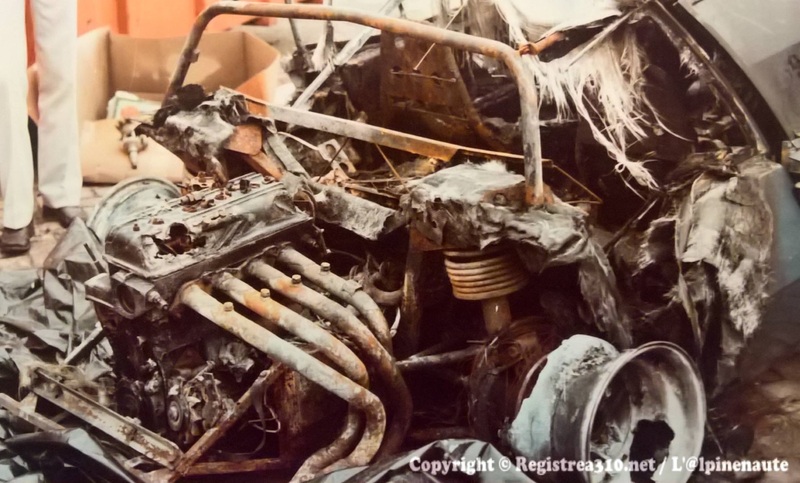 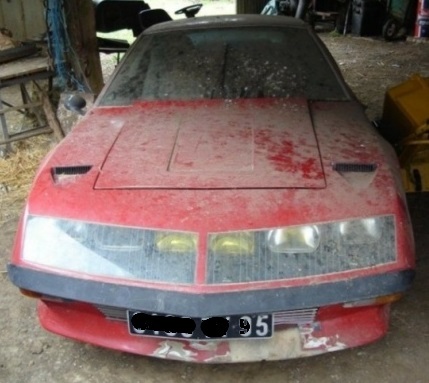 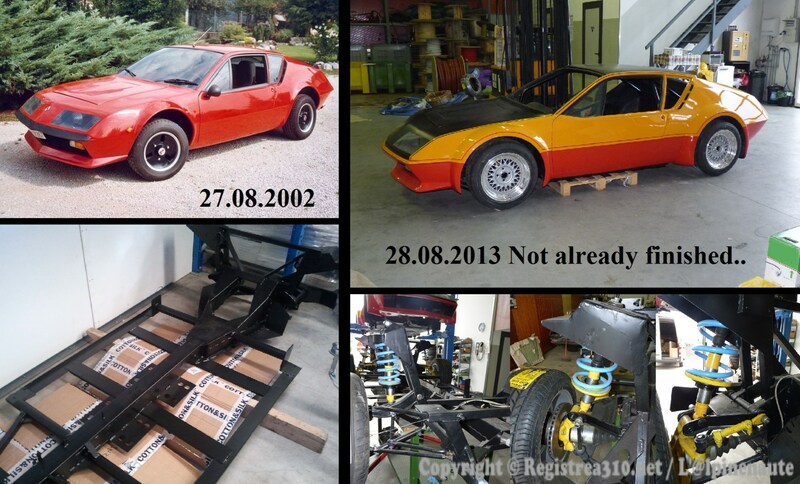 It was stopped since 1992 in a garage near Milan (in Varese town). 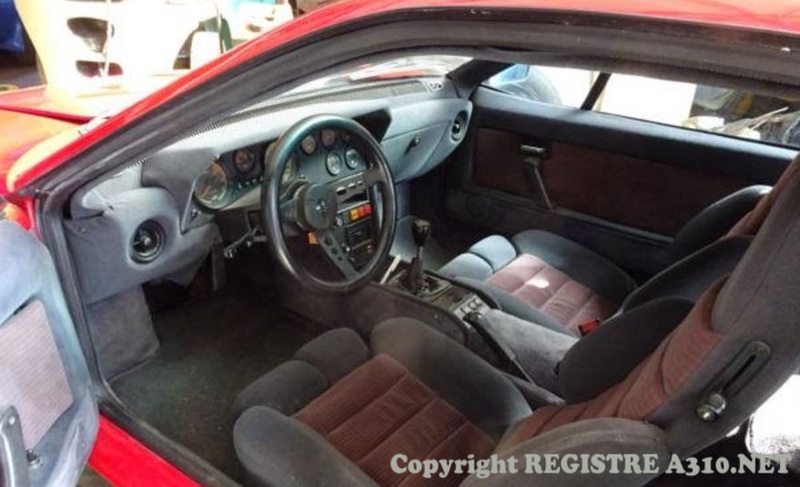 I bought it in 2002 and it was red. 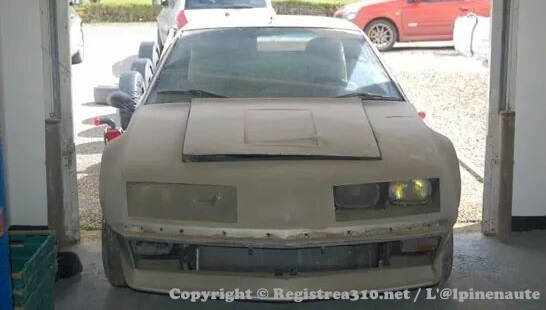 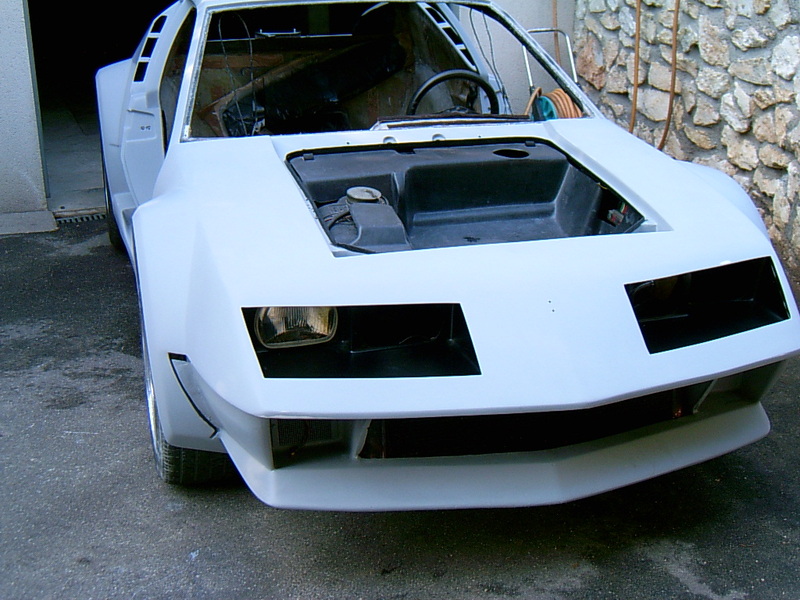 After a bad flood, i decide to restore completely the car and prepare for the race. 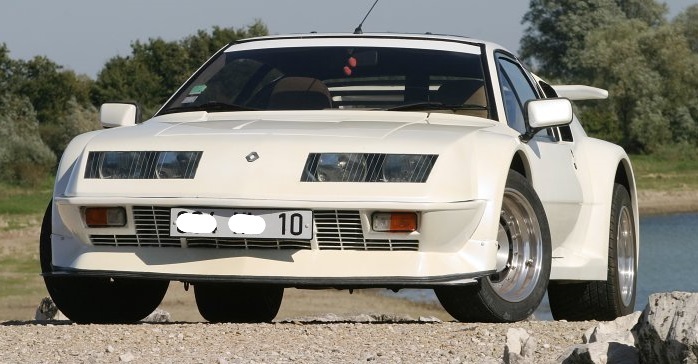 I transform it in a Group IV. 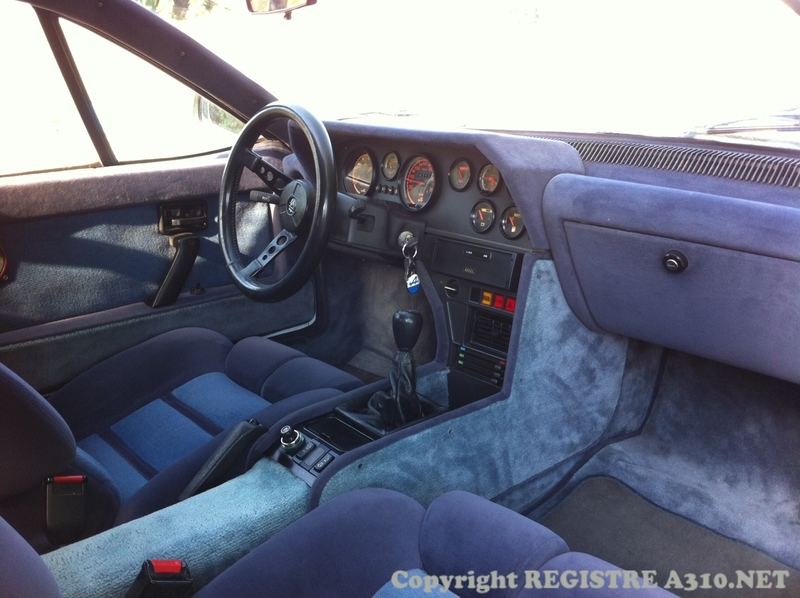 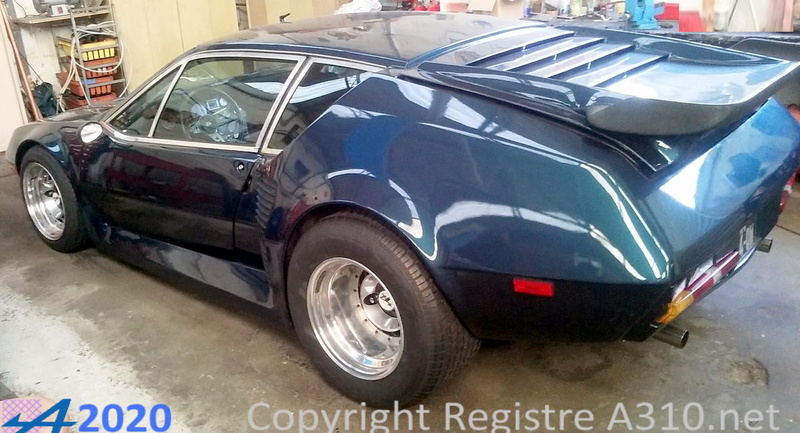 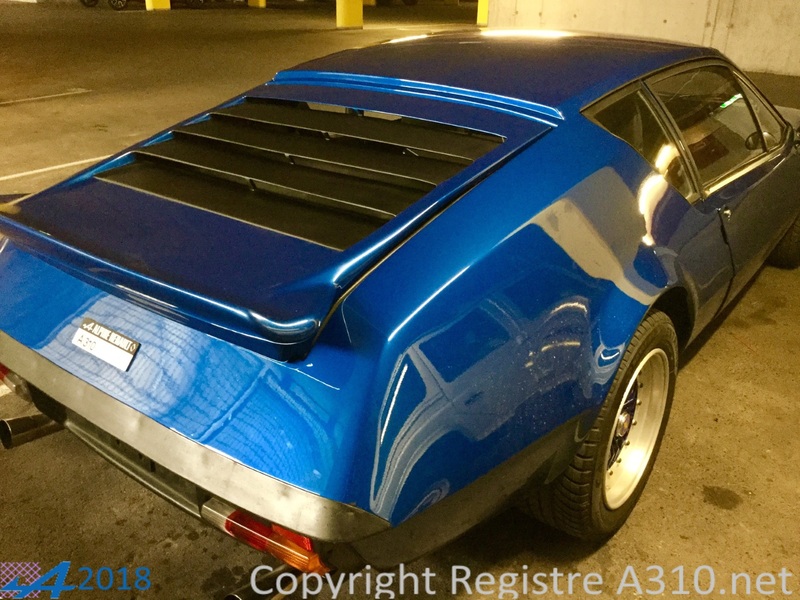 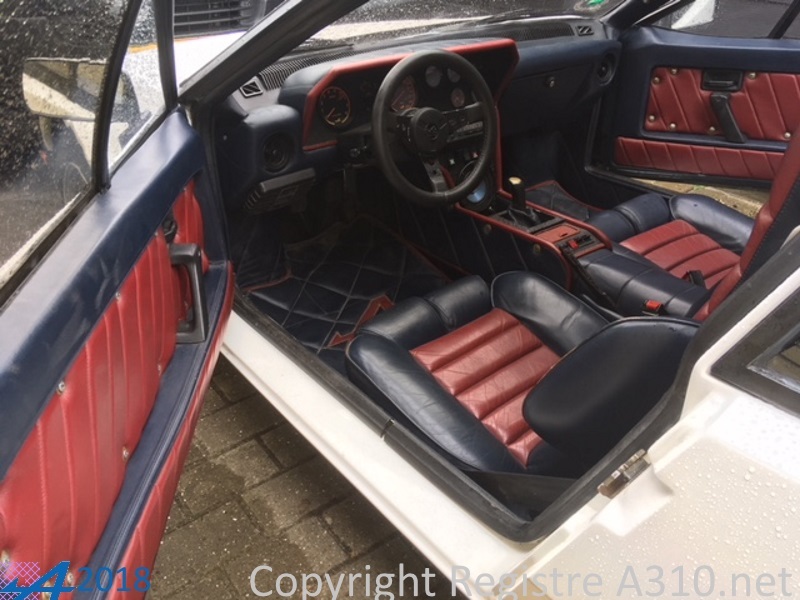 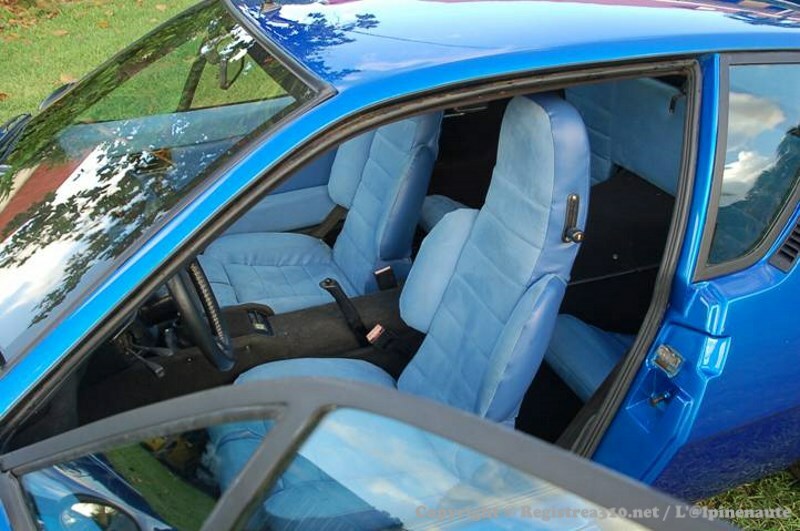 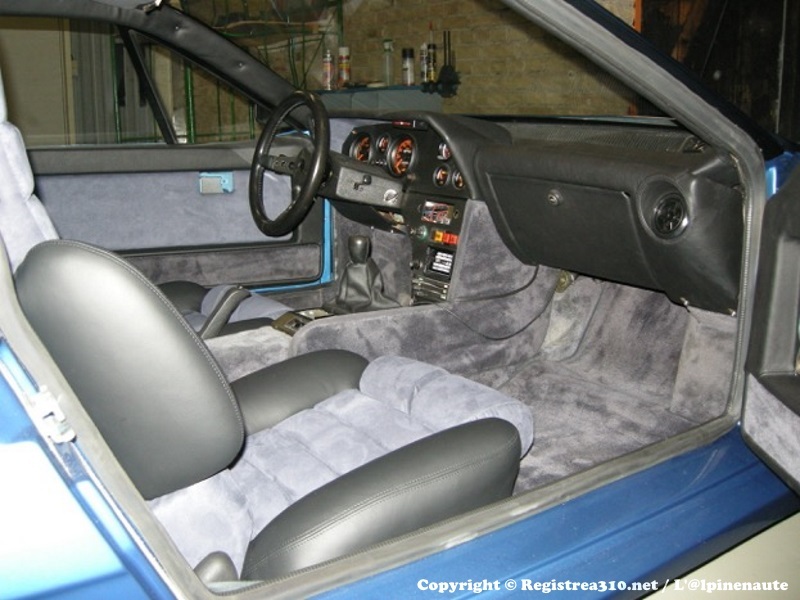 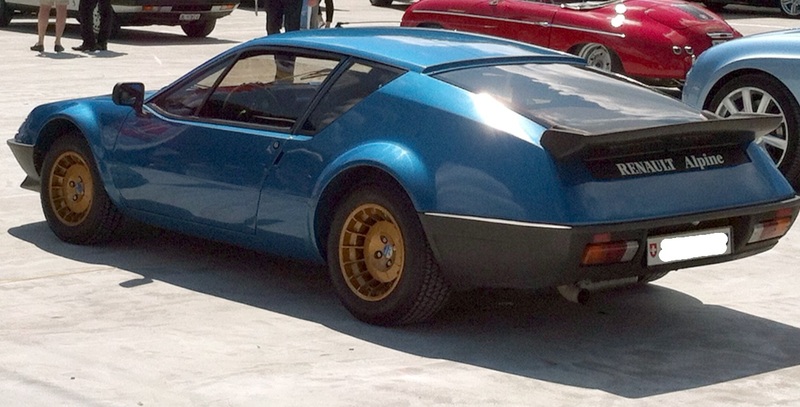 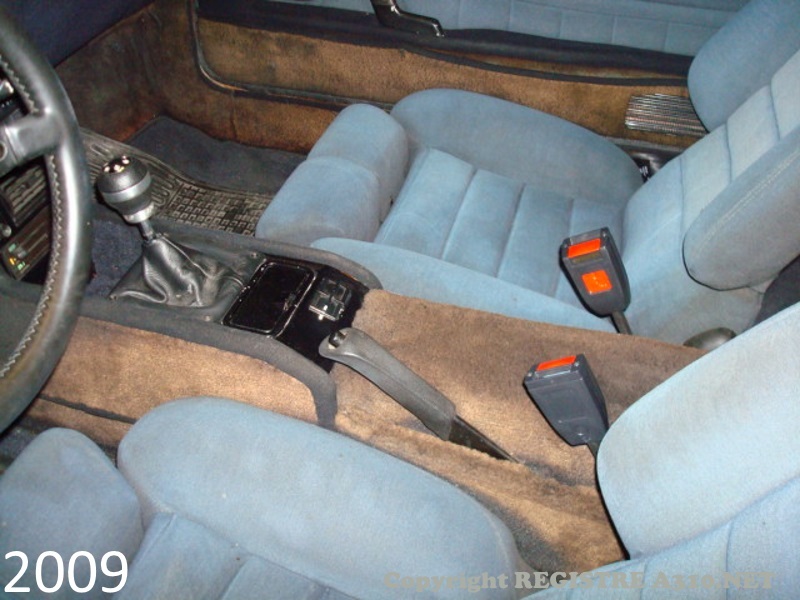 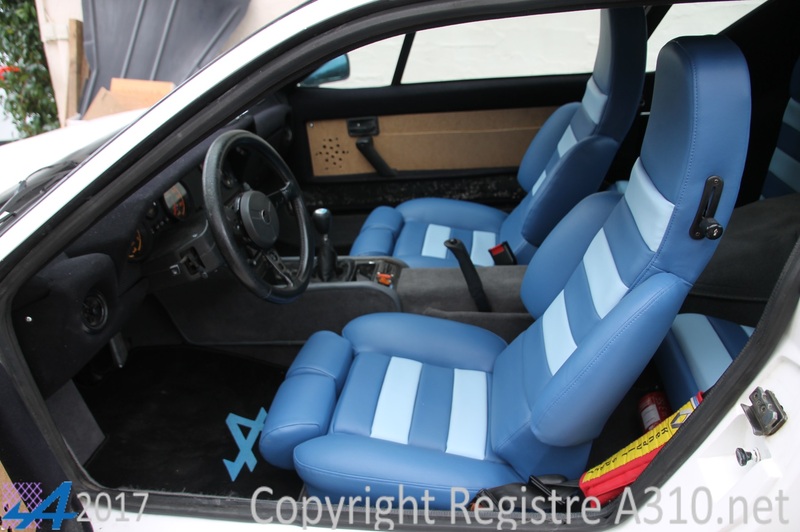 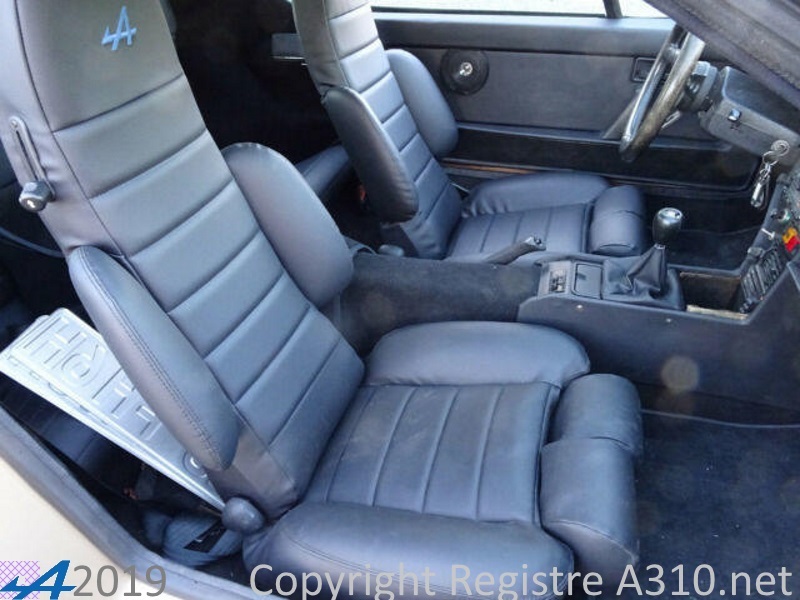 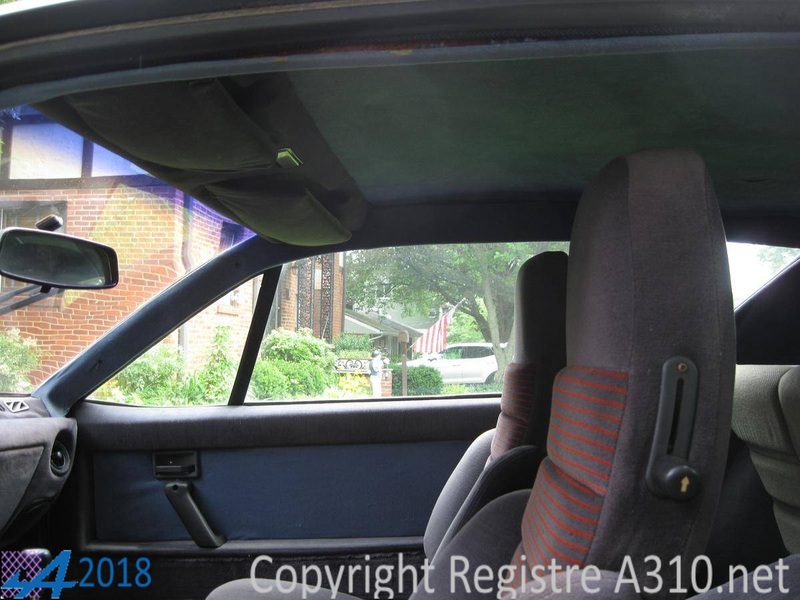 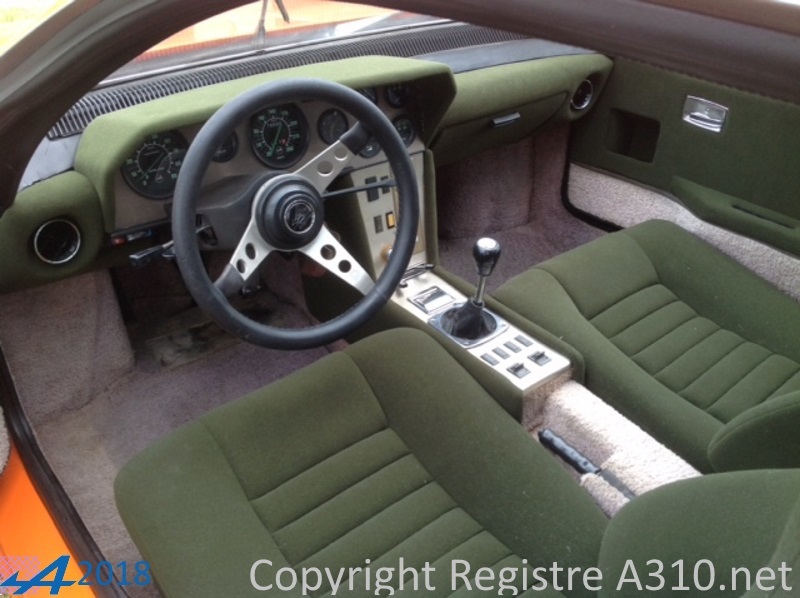 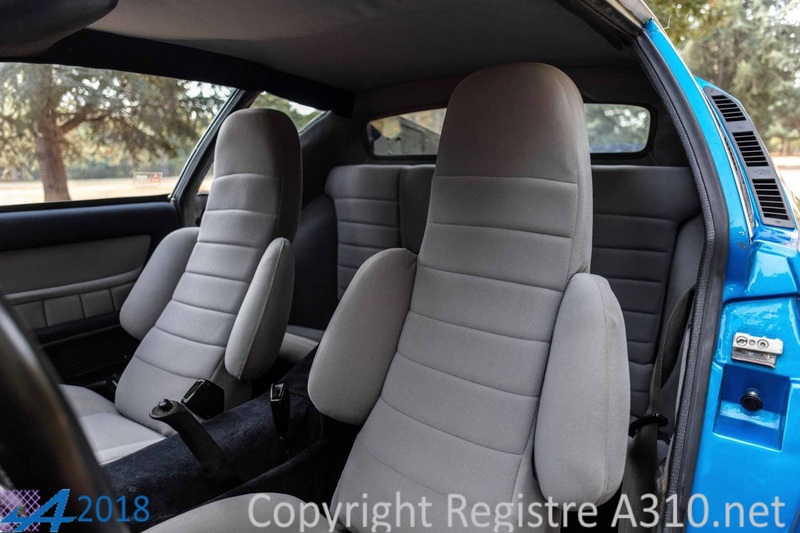 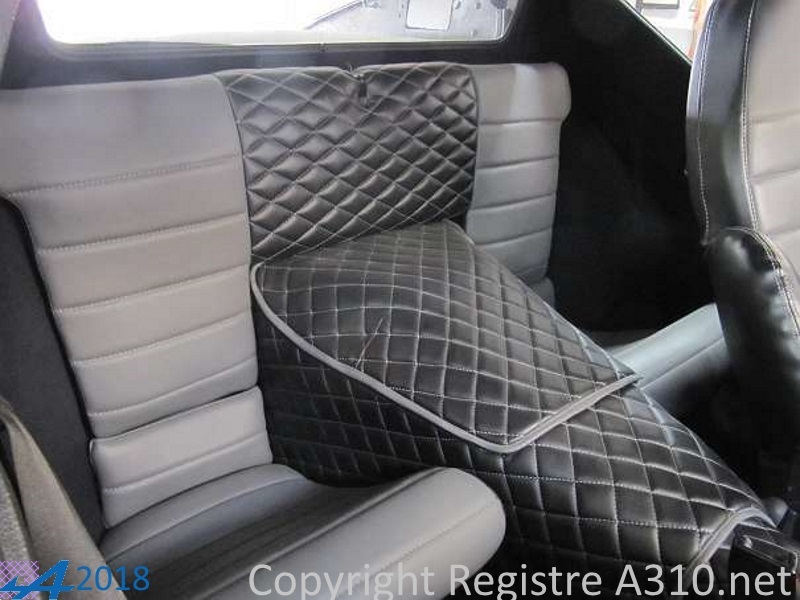 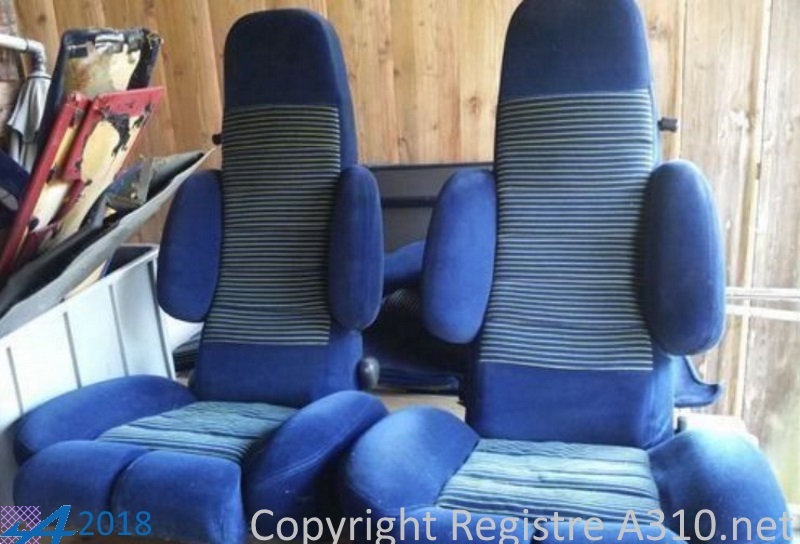 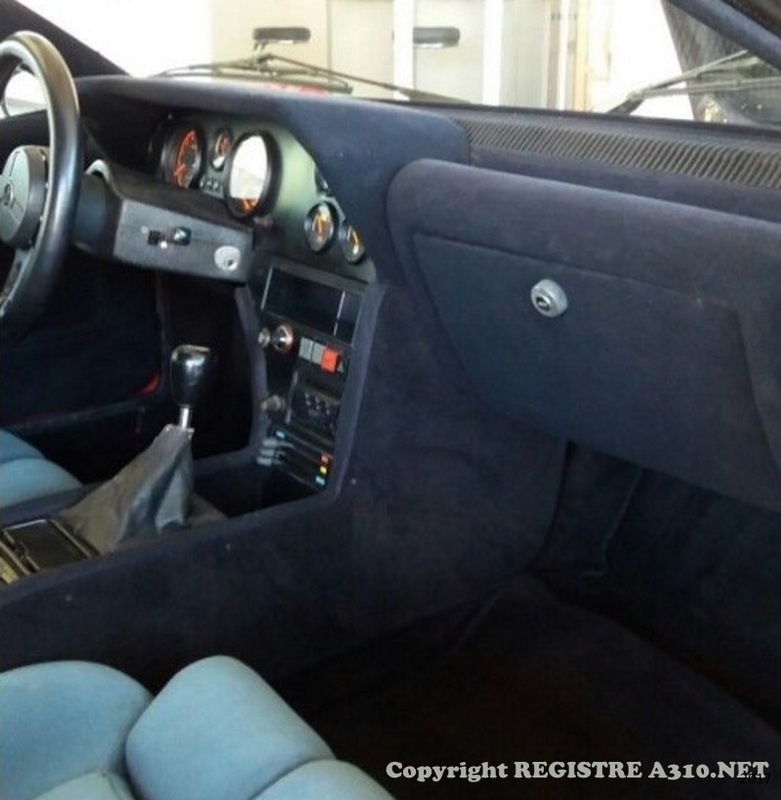 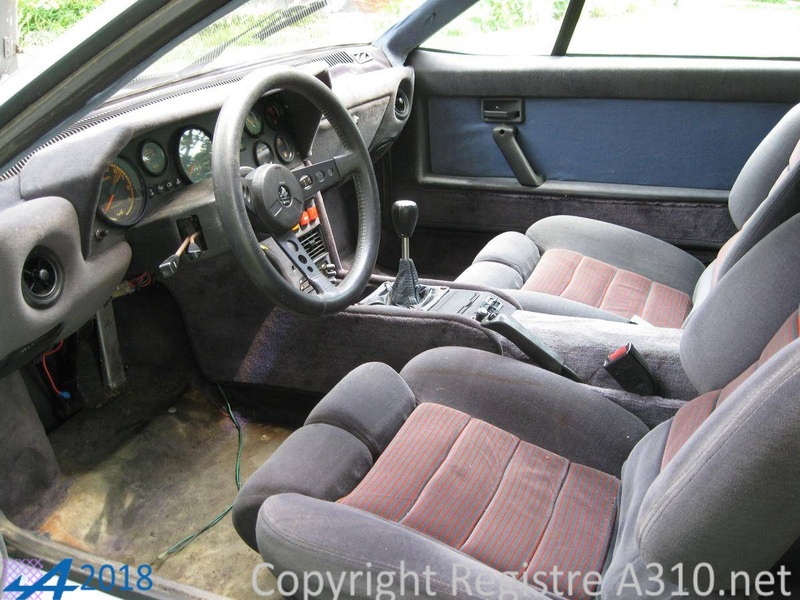 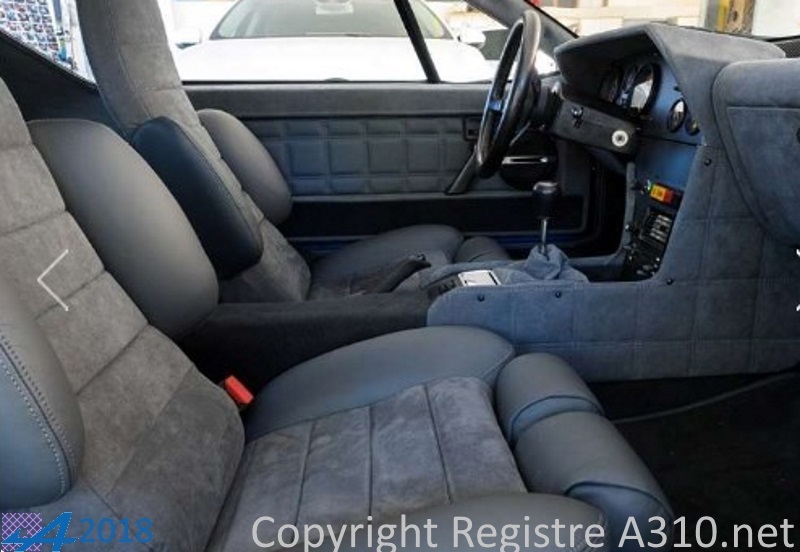 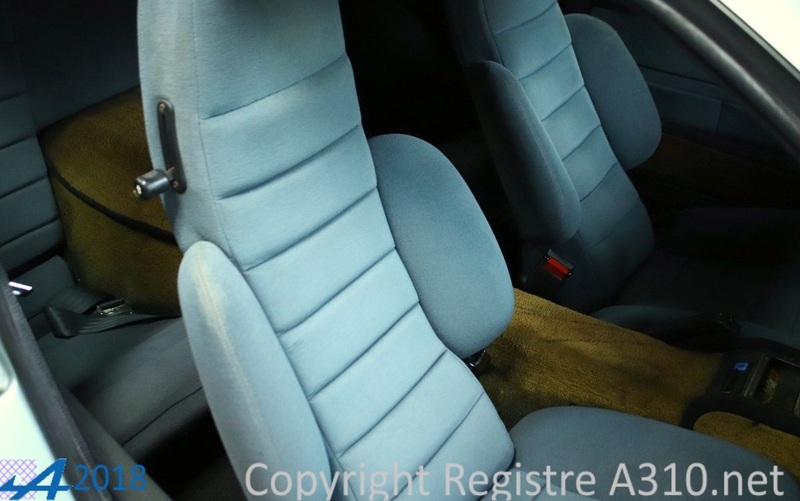 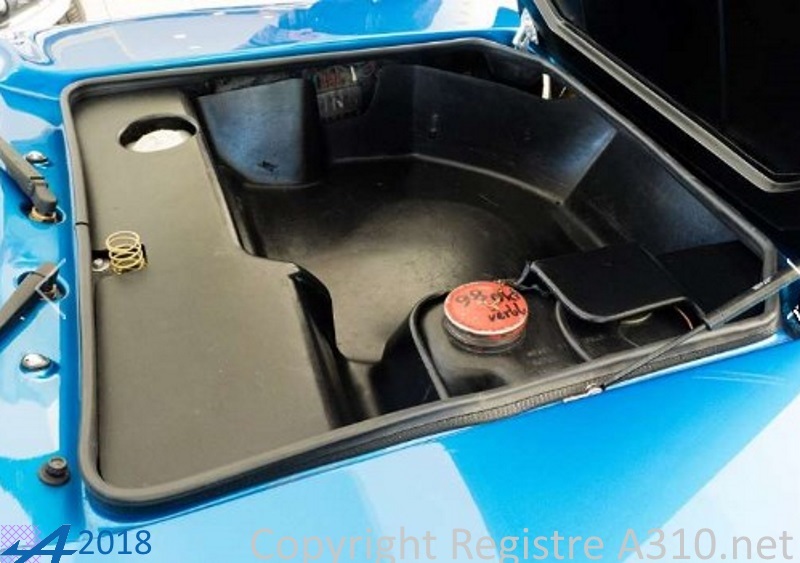 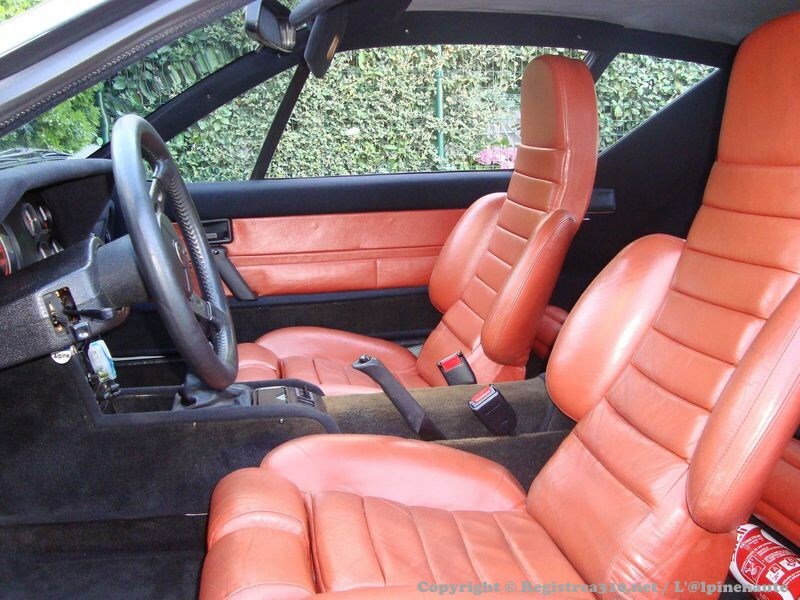 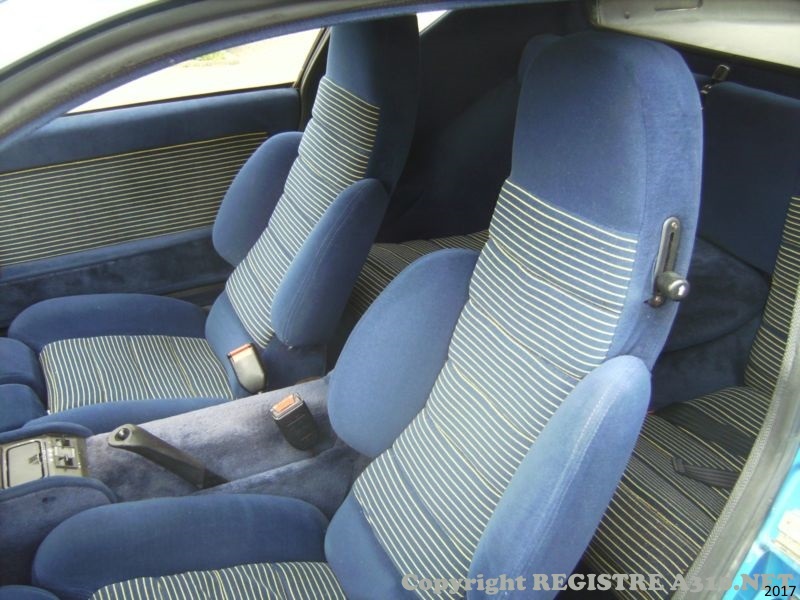 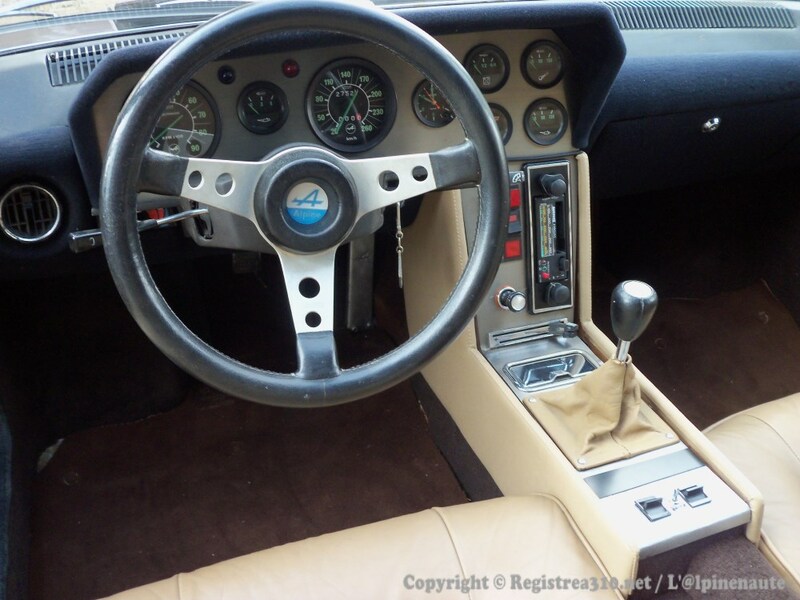 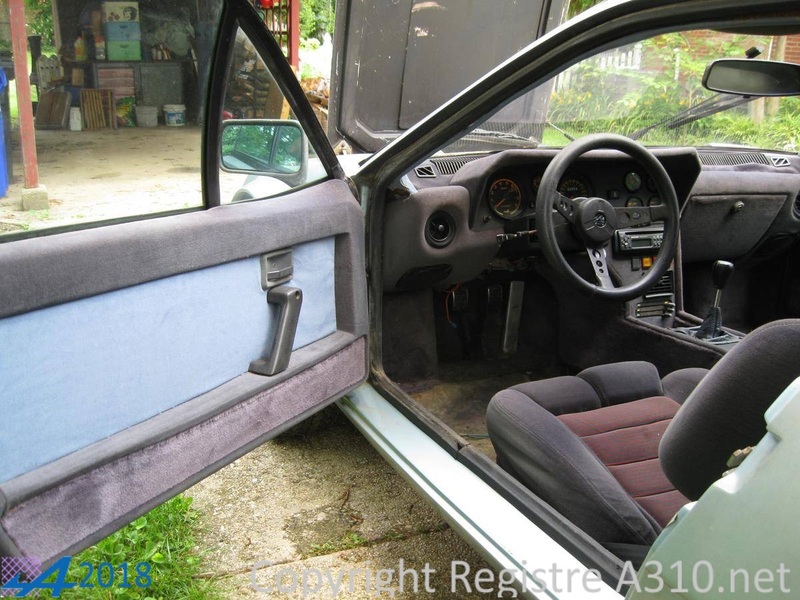 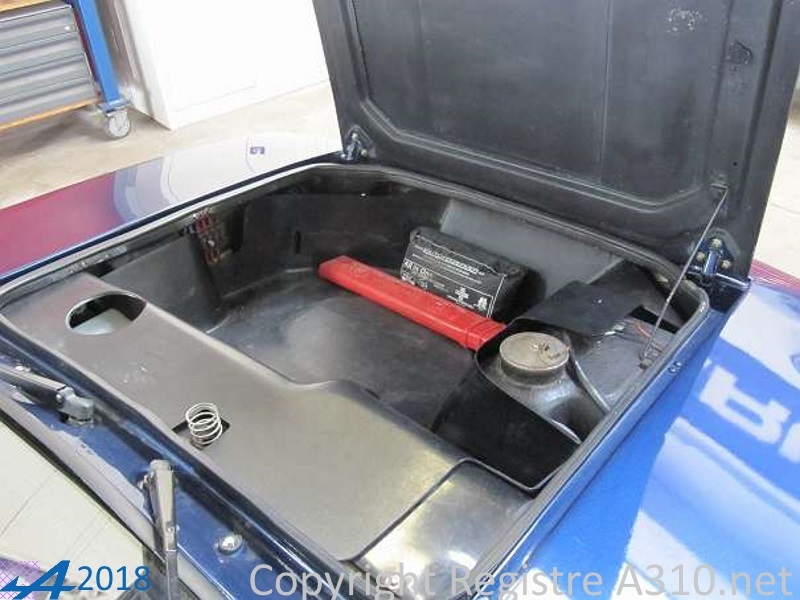 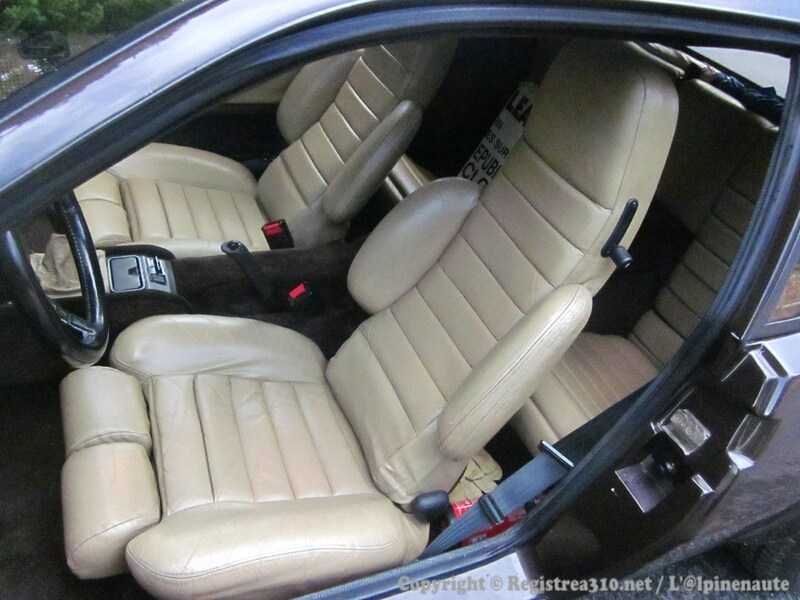 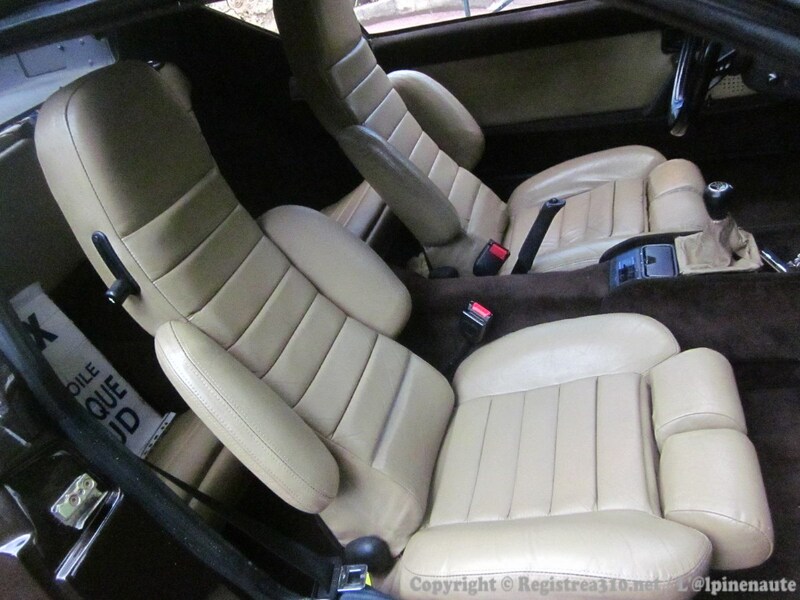 current color Royal Blue, black leather upholstery Inspiration GROUP IV, changed three to four holes, spacing 1600. 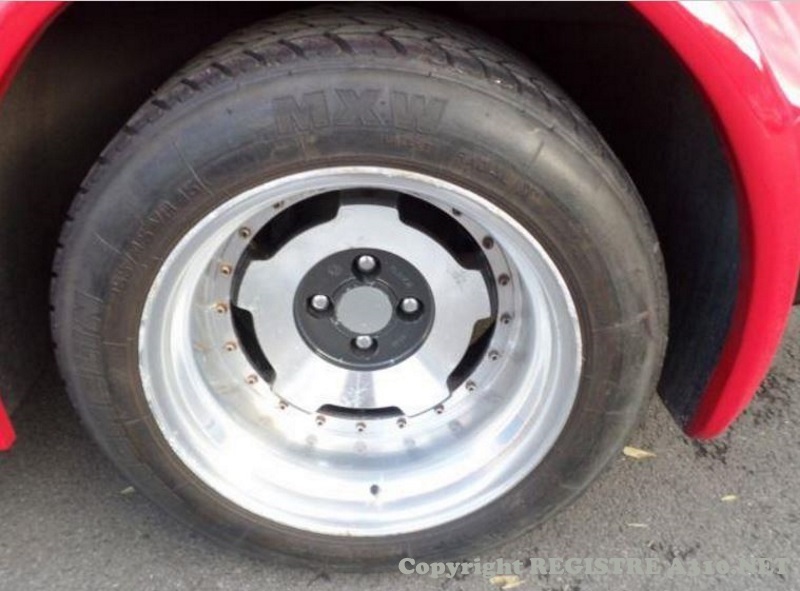 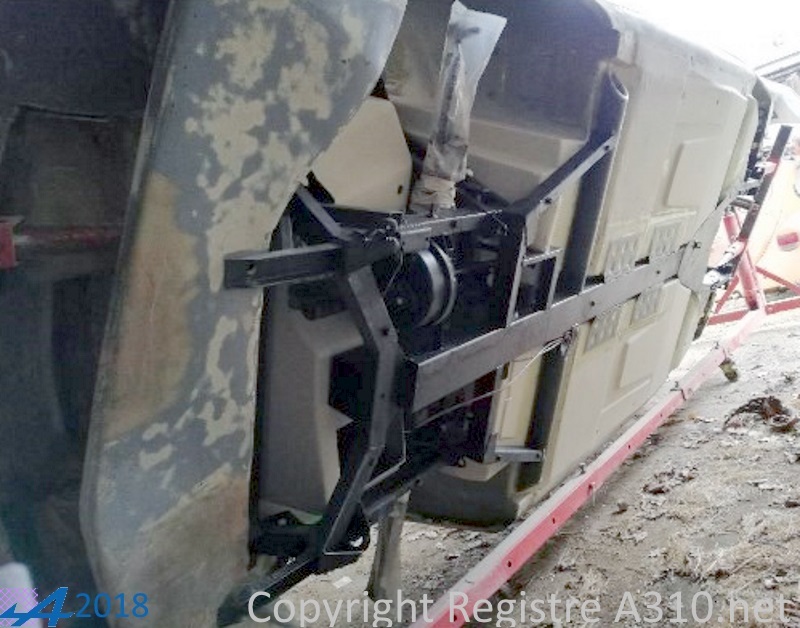 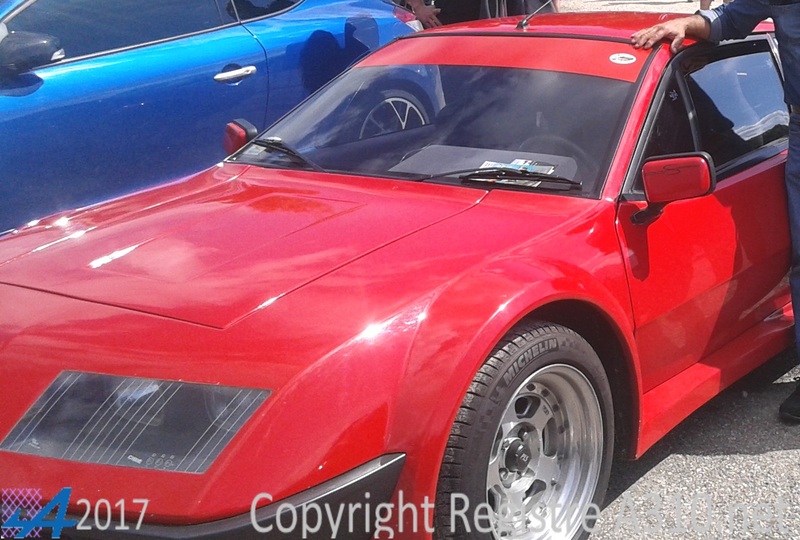 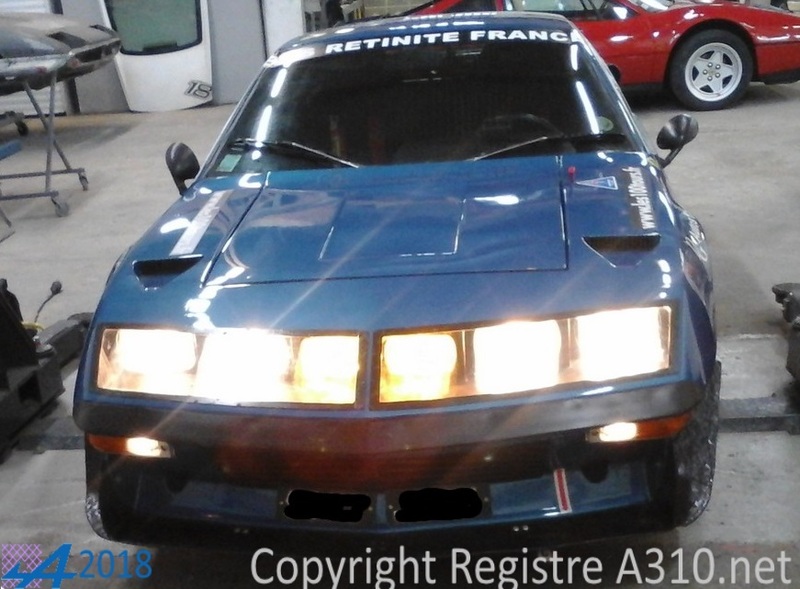 Restoring fnished in 2018 Rims PLS 15"
This vehicle was reduced from Paris to Guadeloupe, where he underwent a complete restoration. 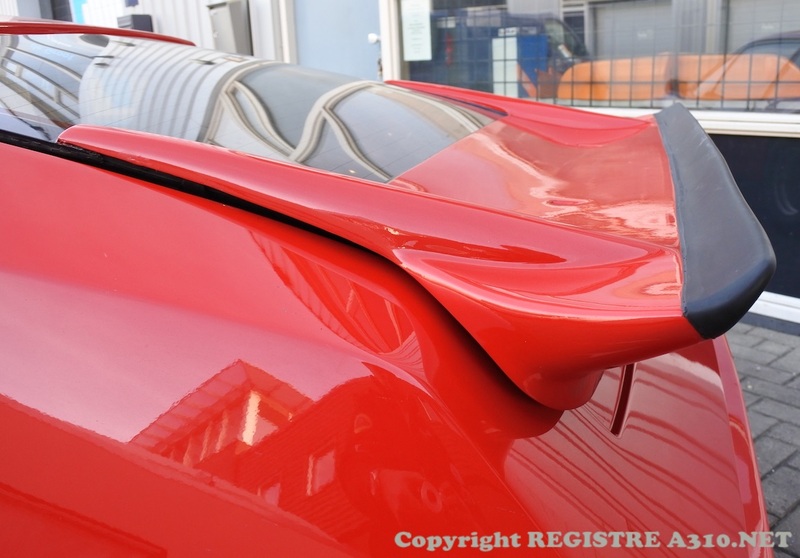 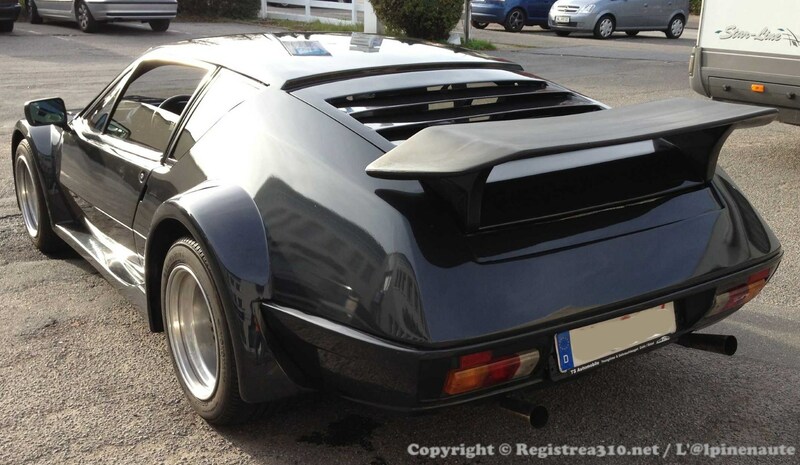 Lamborghini type spoiler and spoiler posed by the former owner and I left in place. 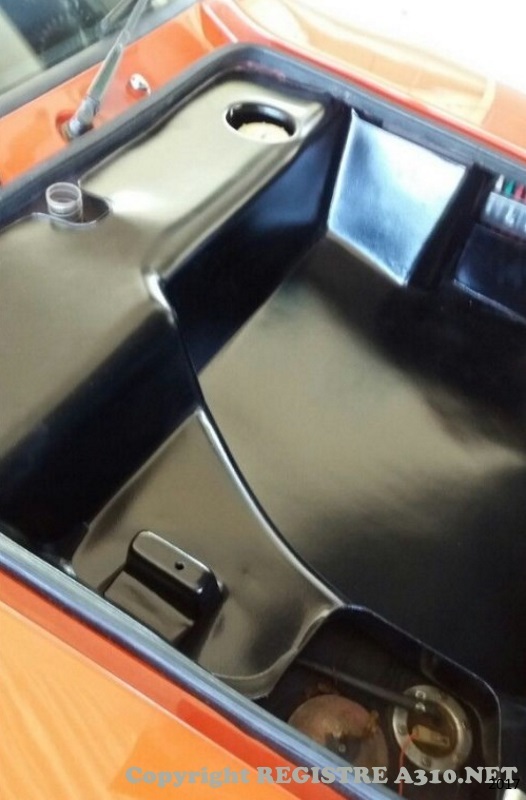 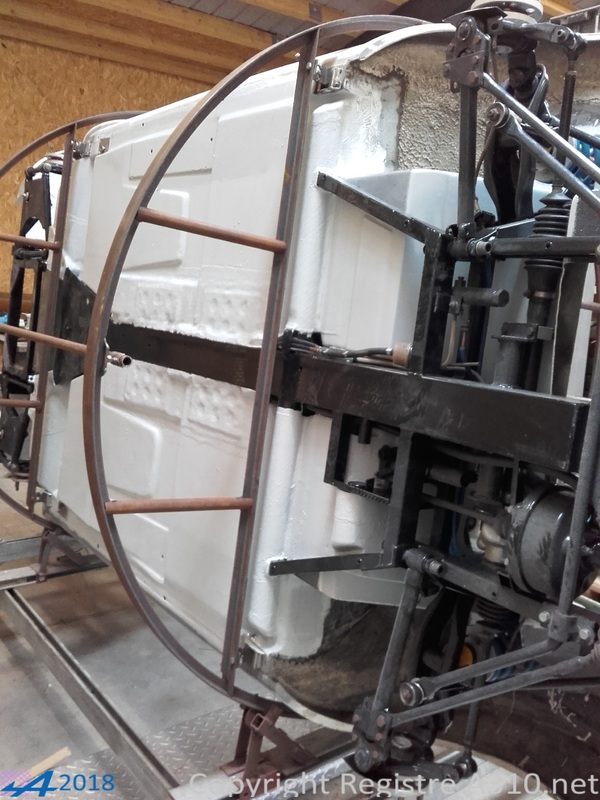 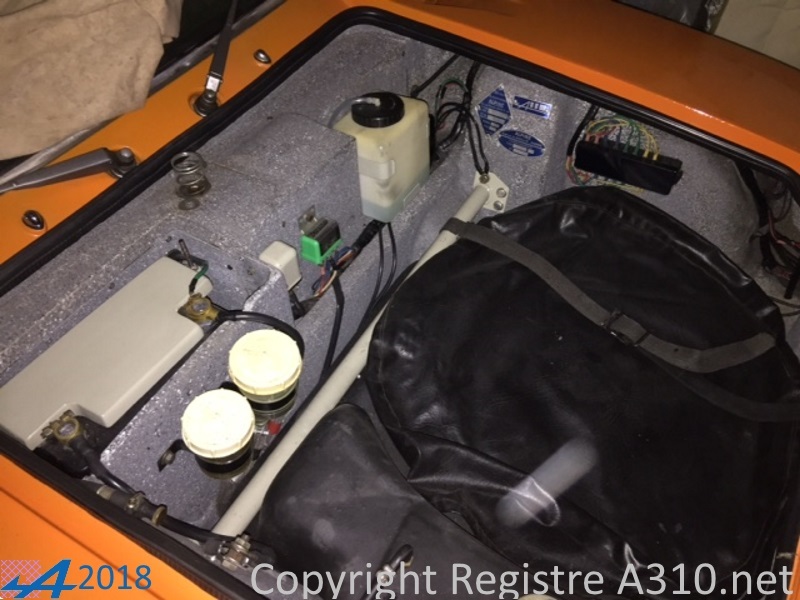 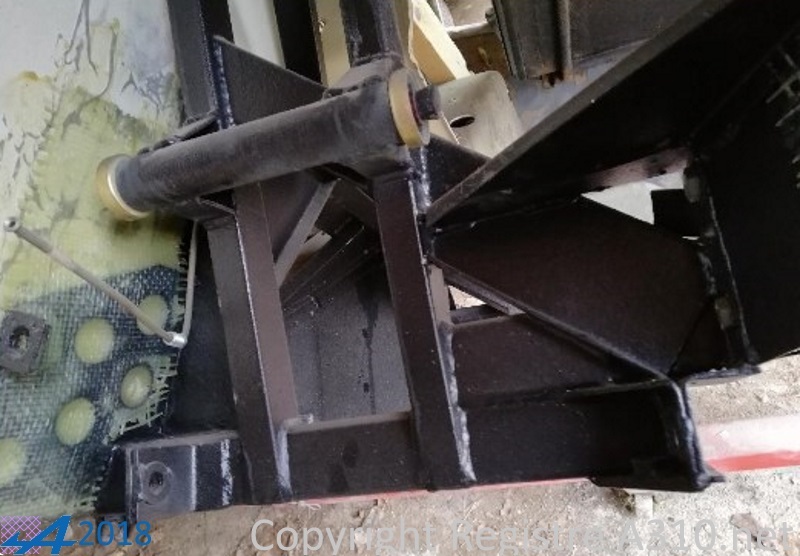 Sanded chassis, refurbished and repainted phosphate then with the paint for marine buoys. 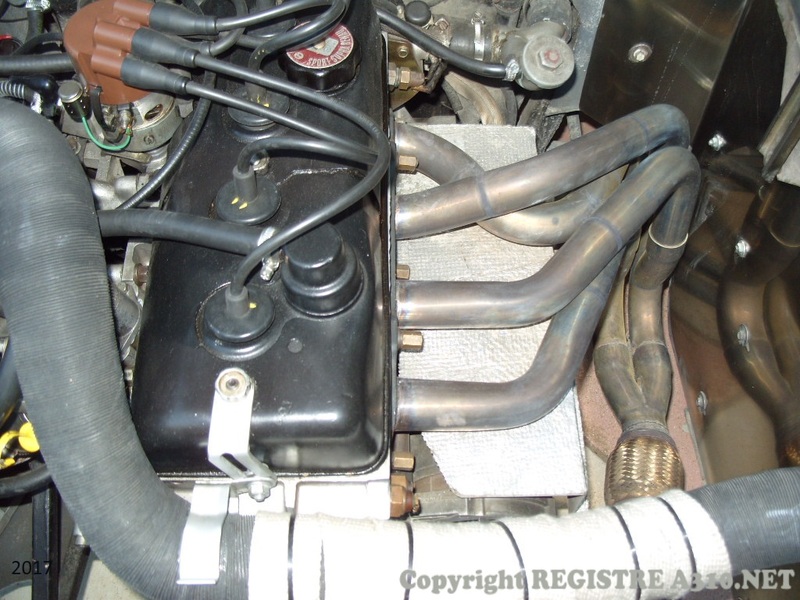 Cooling pipes redone in stainless steel. 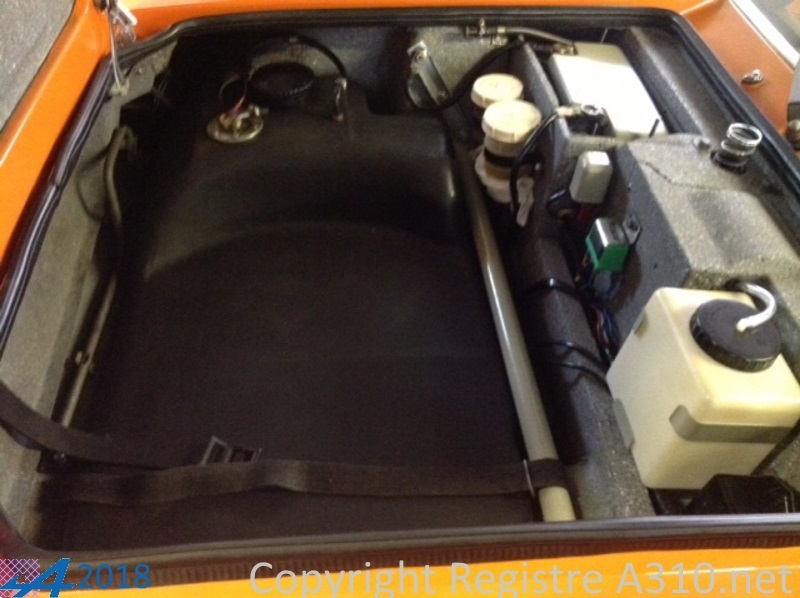 All rooms suspensions brushed, phosphatic and repainted. 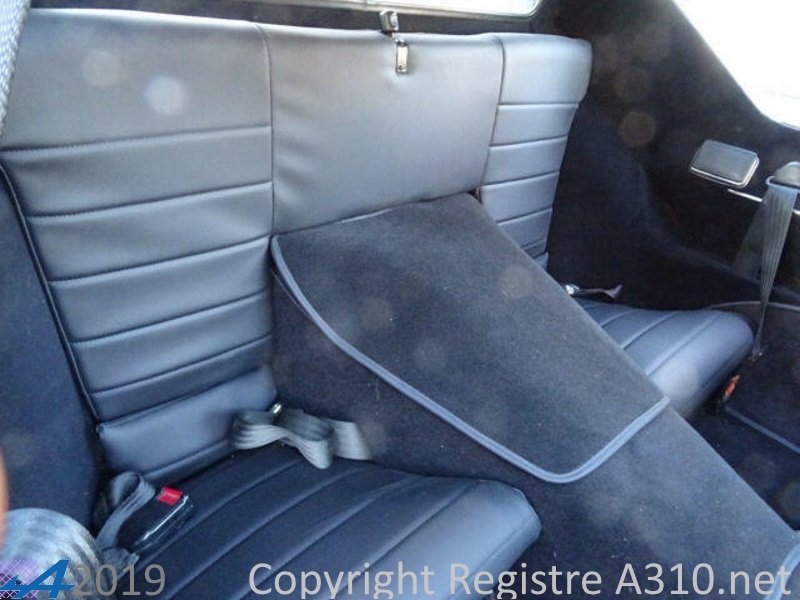 46007 2700VA 03.05.1979 41 Gray galaxie Owner since 2013 Rims Gotti ; Rear spoiler fiber "gt"
46046 2700VA 04.05.1979 41 Gray galaxie Interior (origin): leather seats fawn colors, Box 5 Stainless Valendru complete line, black leather seats with red stitching. 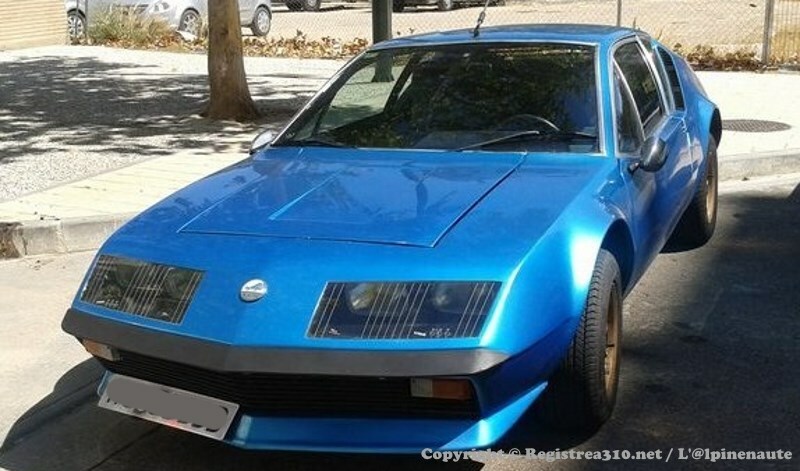 46646 2700VA ? 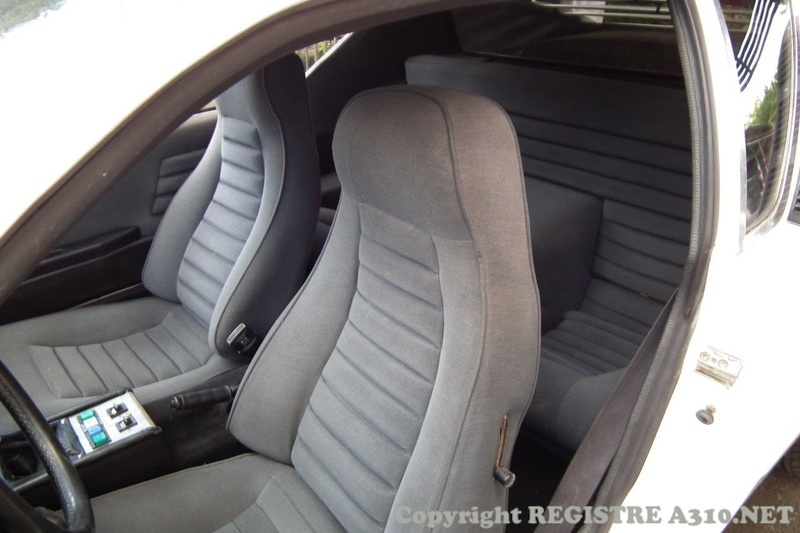 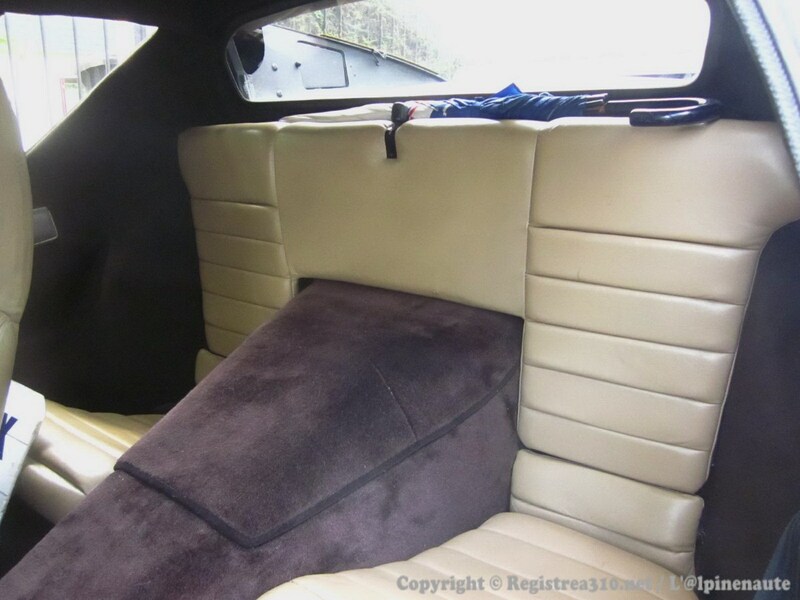 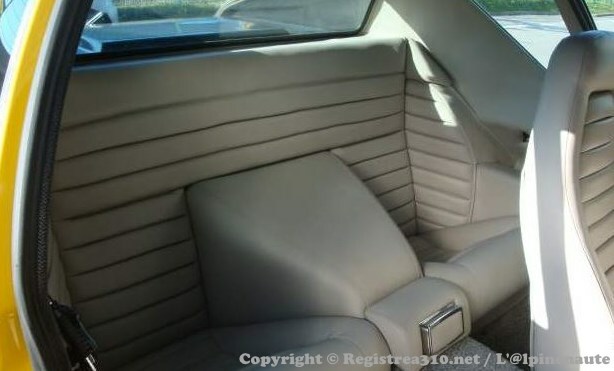 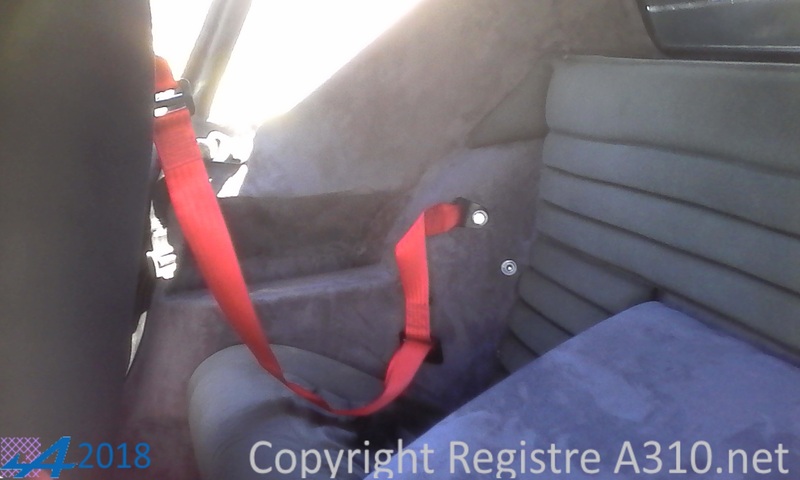 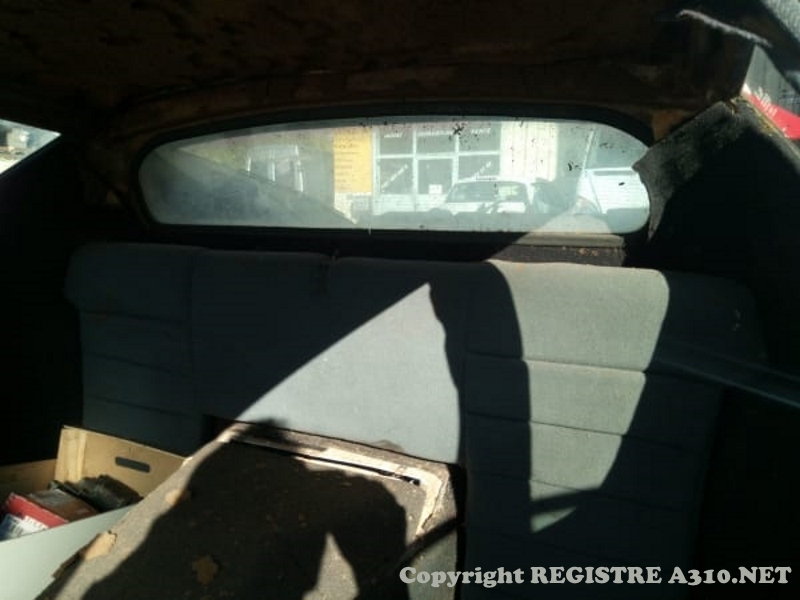 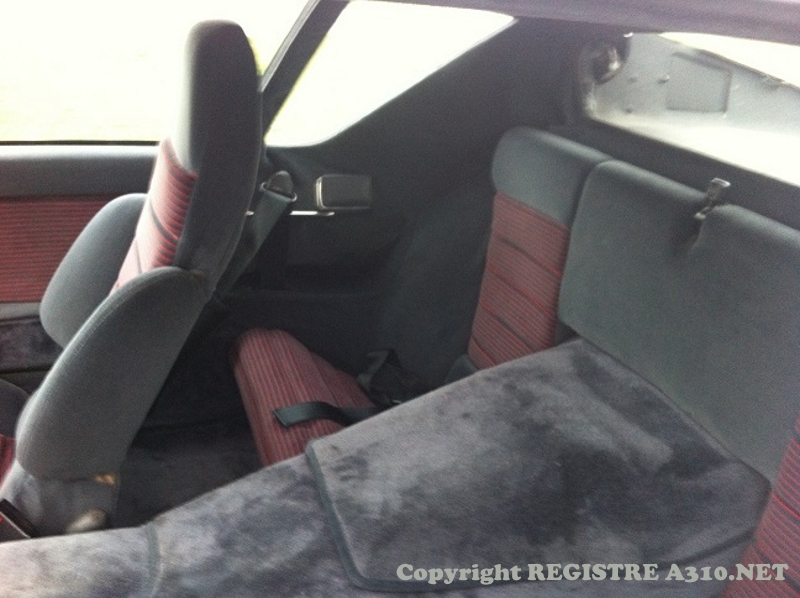 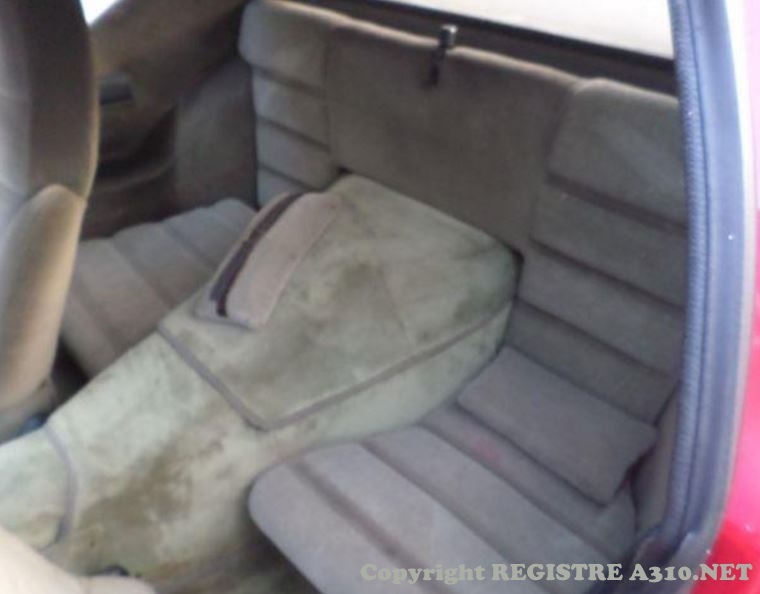 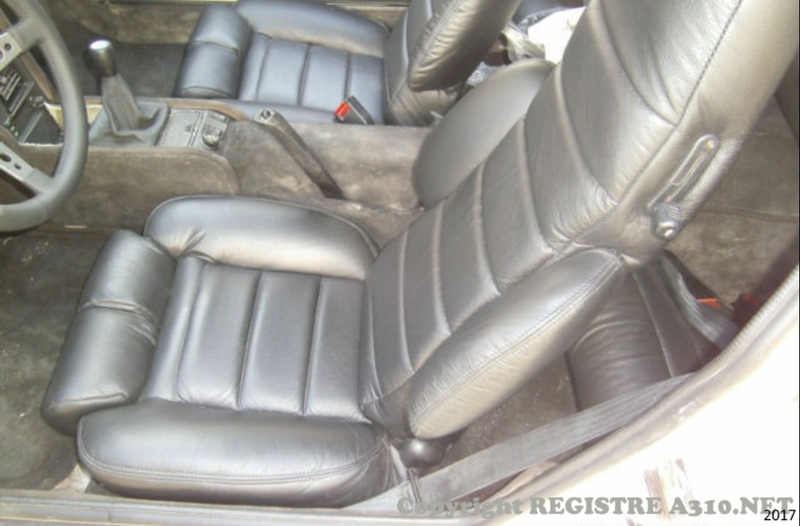 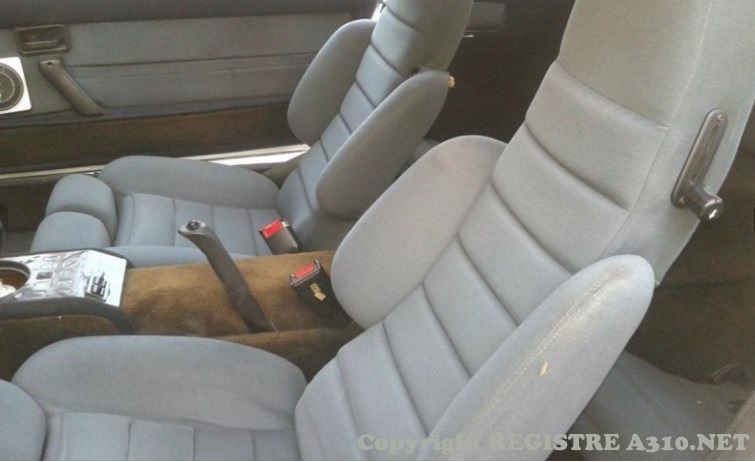 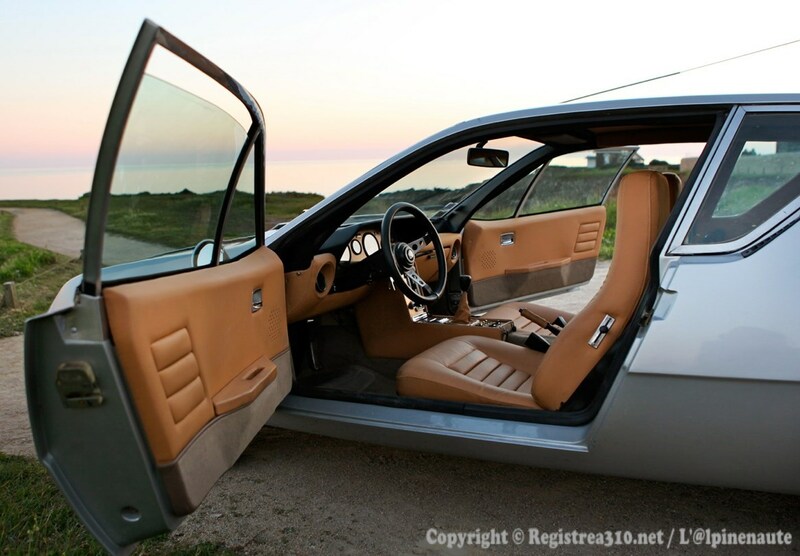 ?.11.1979 625 Gray galaxie Options: savanne leather, green glass shades. 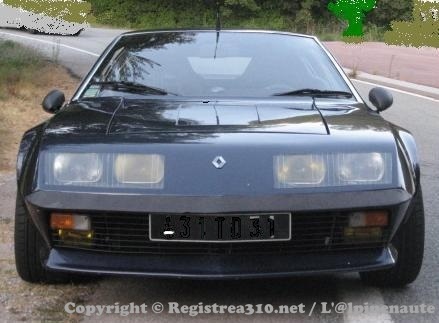 46710 2700VA ??.? 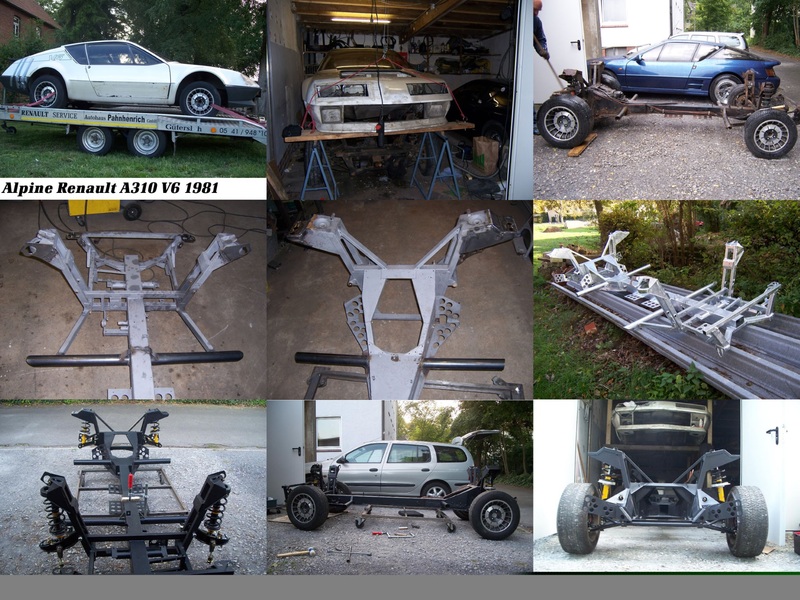 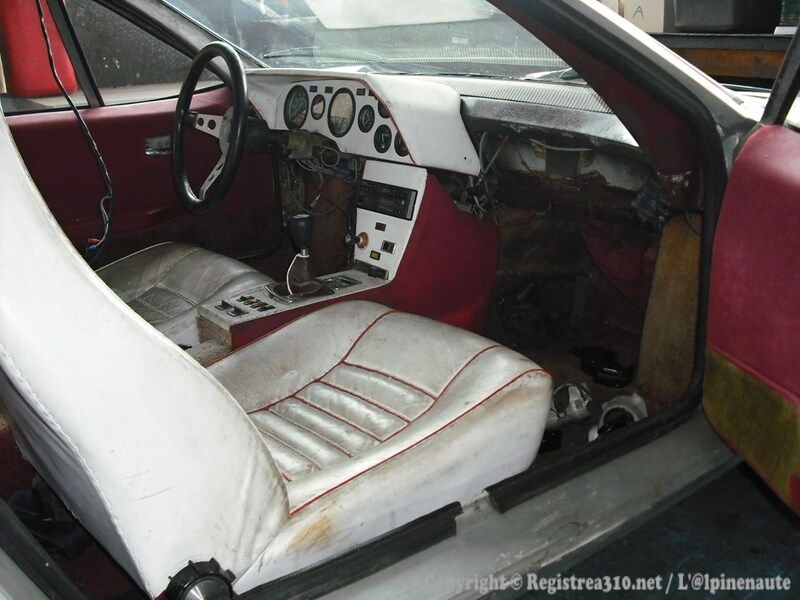 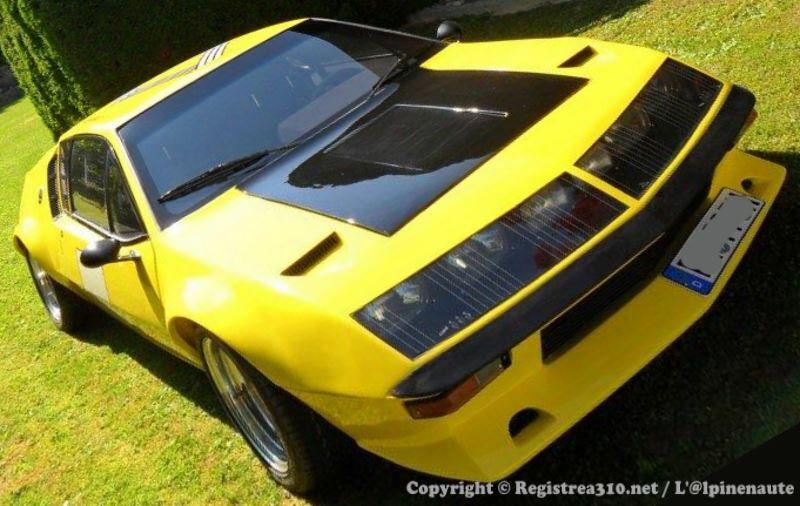 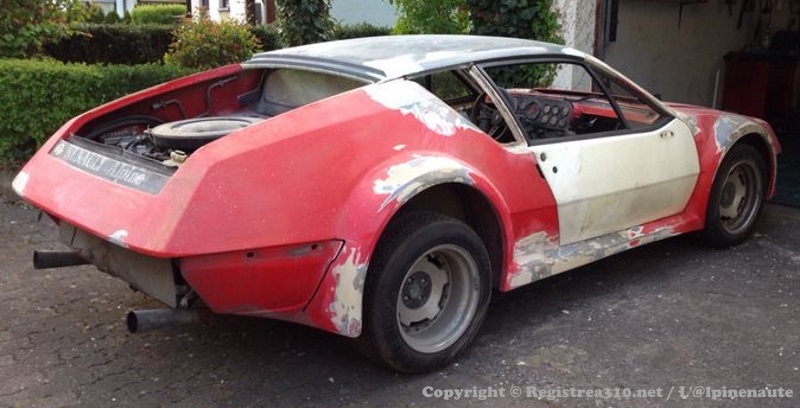 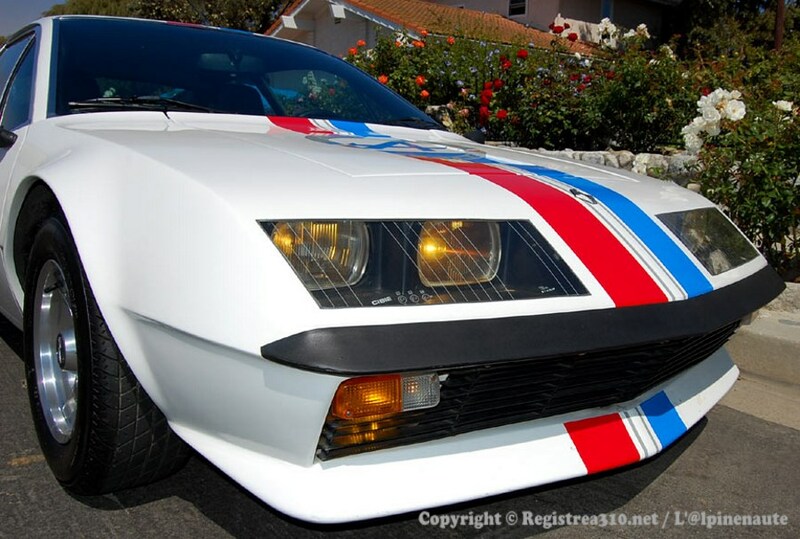 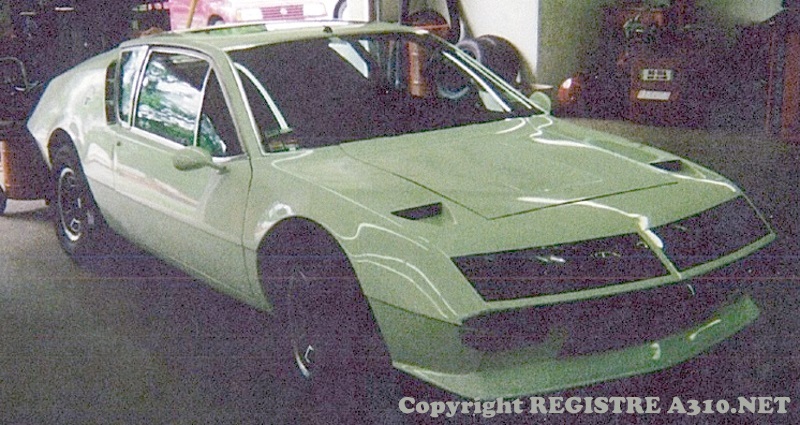 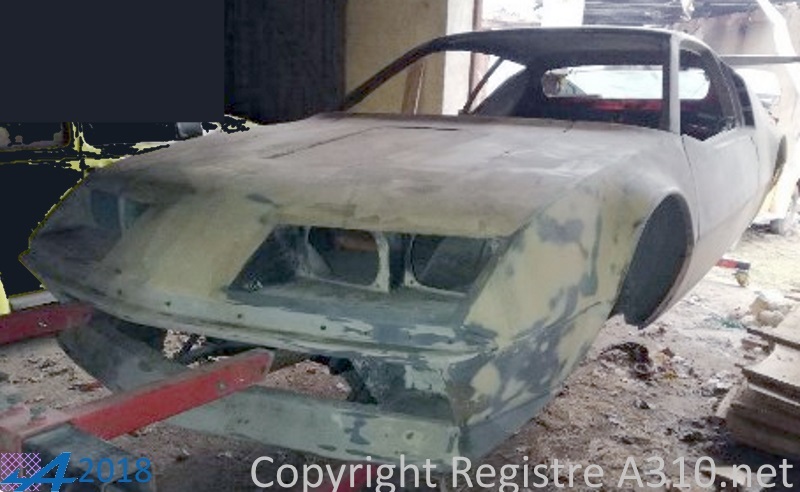 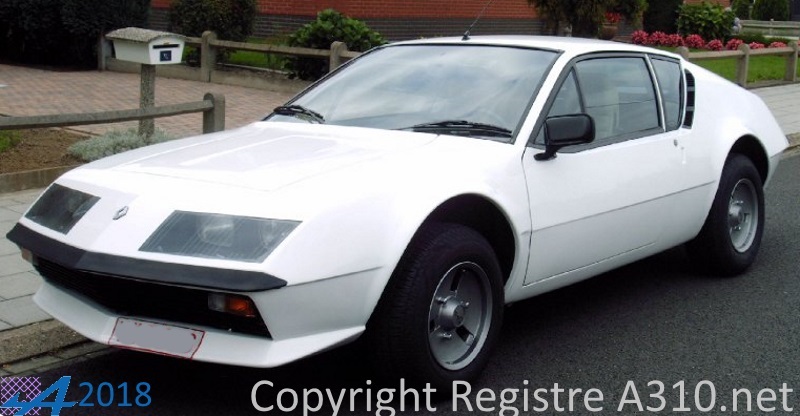 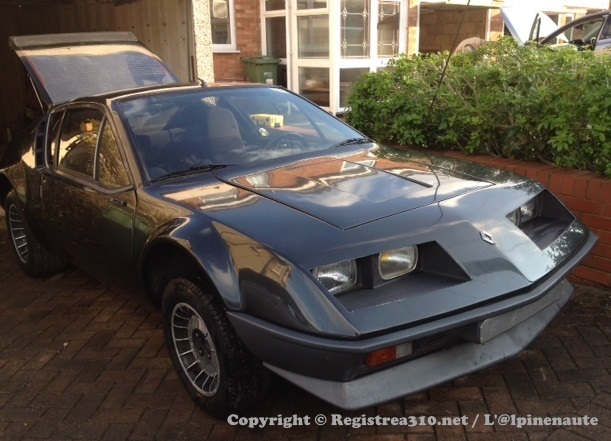 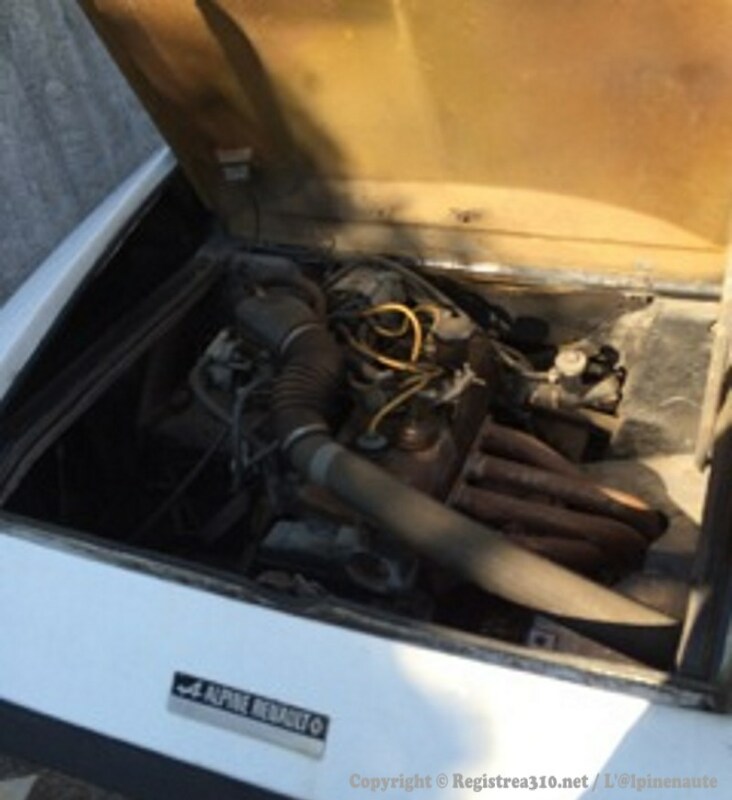 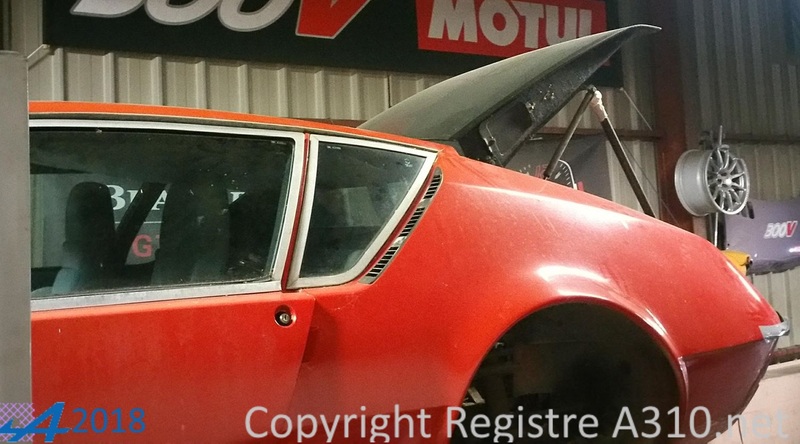 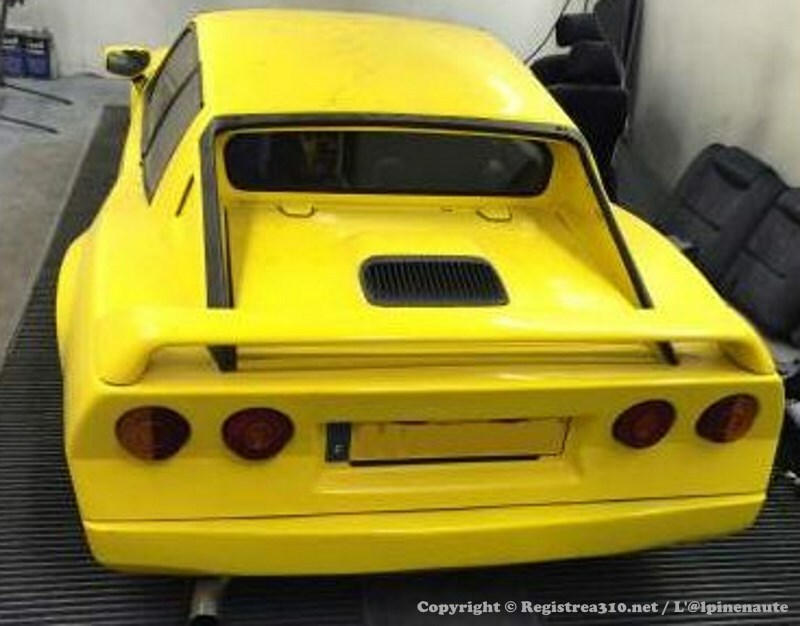 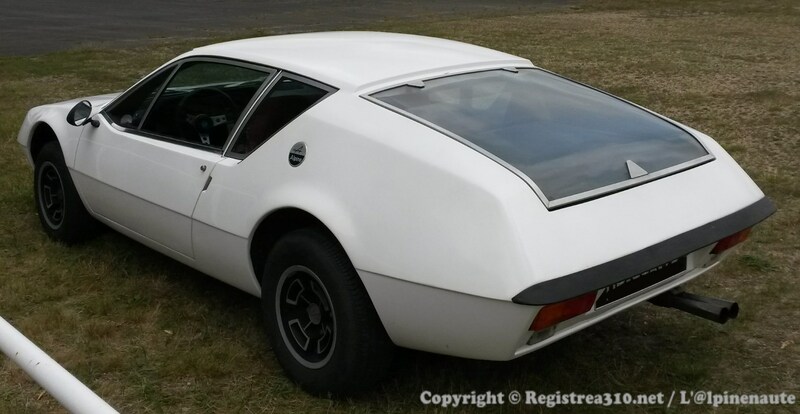 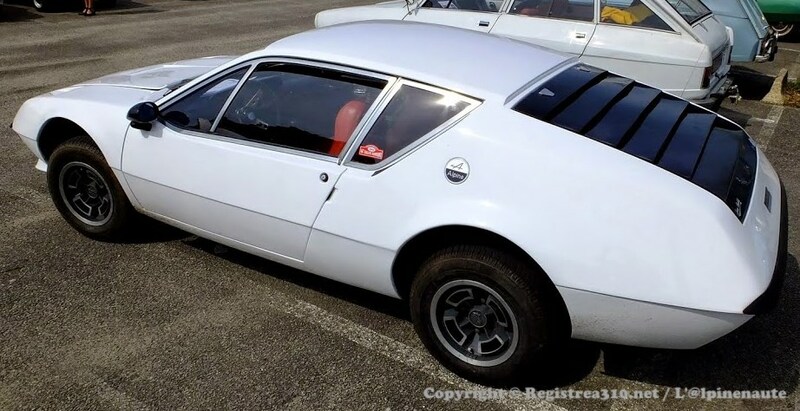 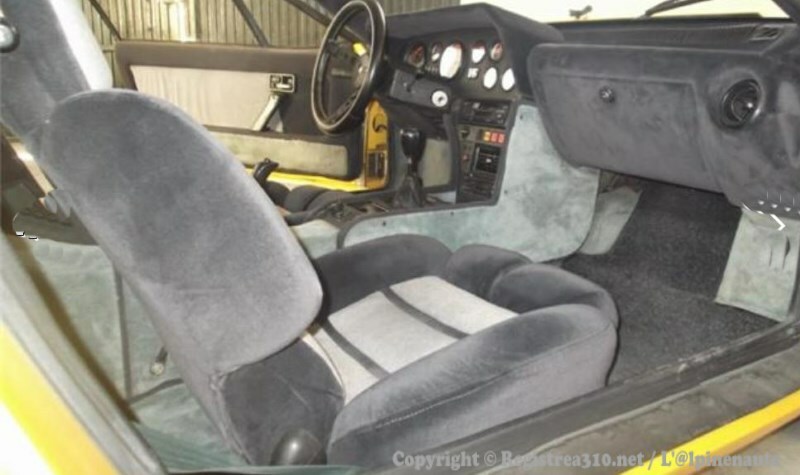 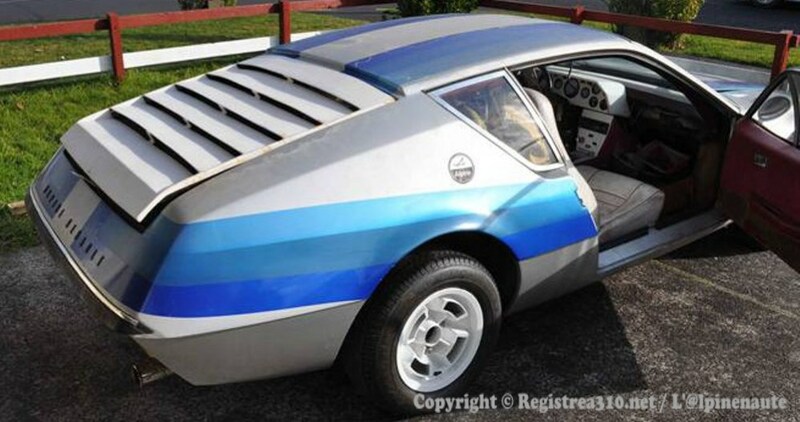 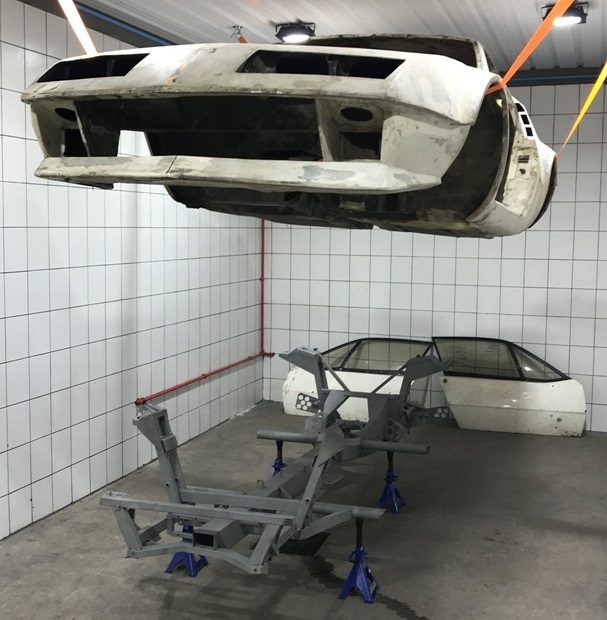 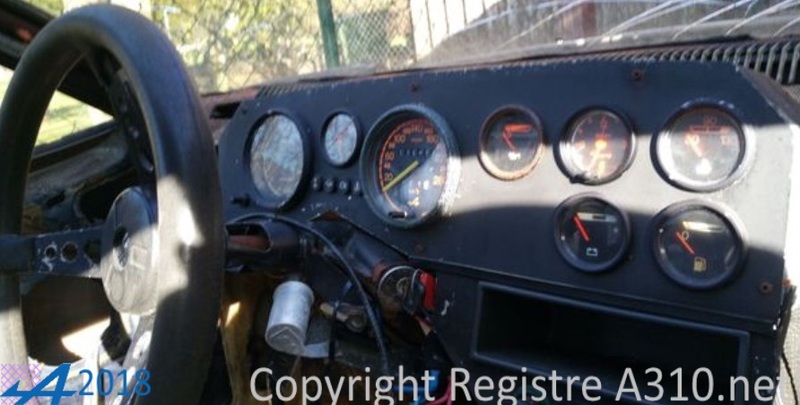 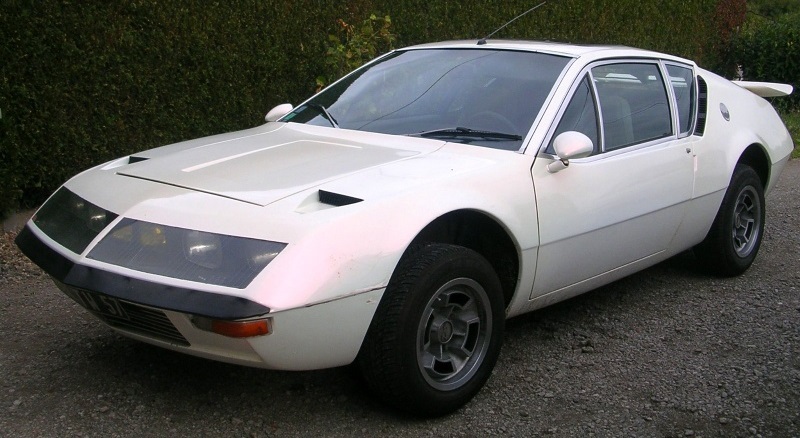 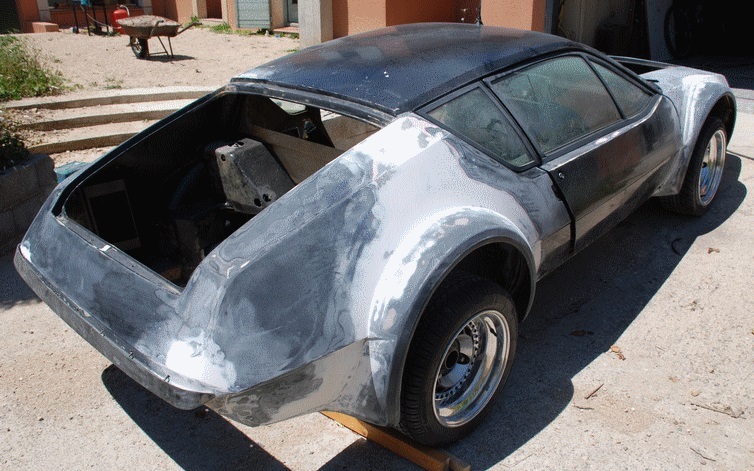 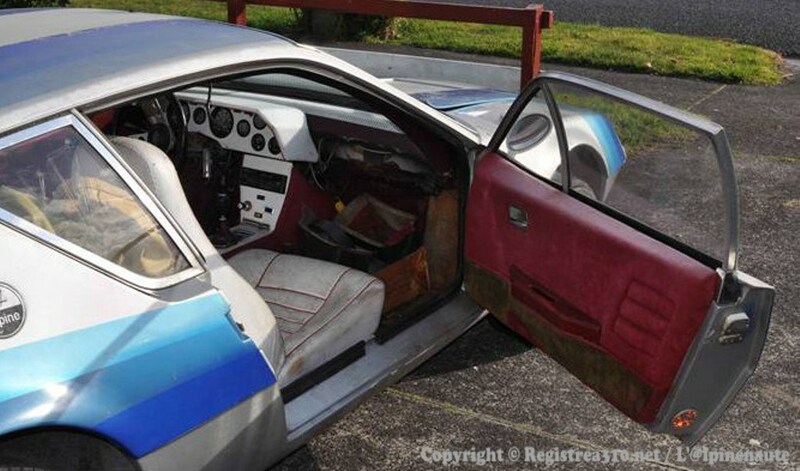 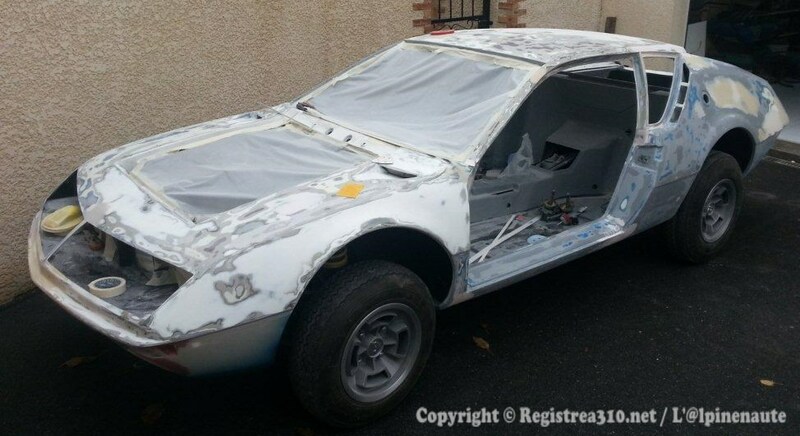 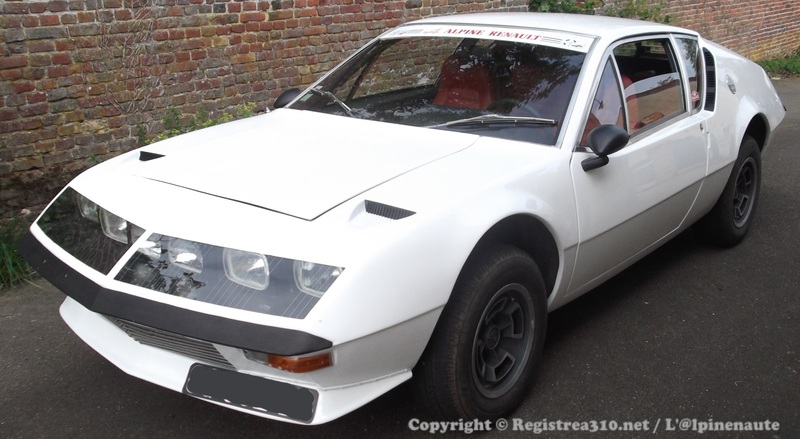 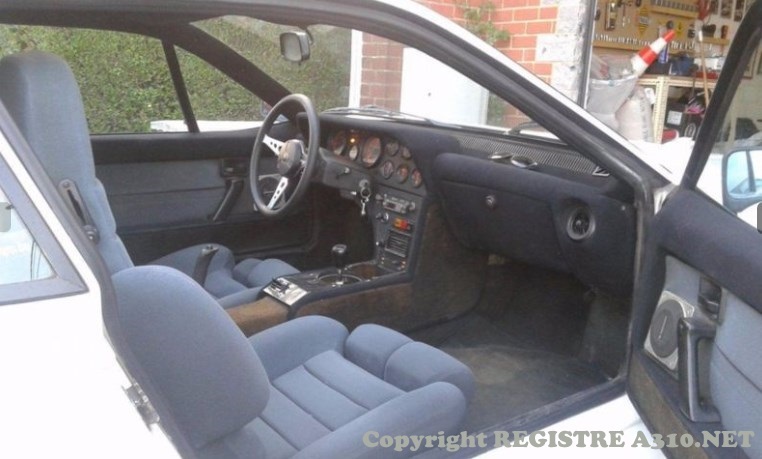 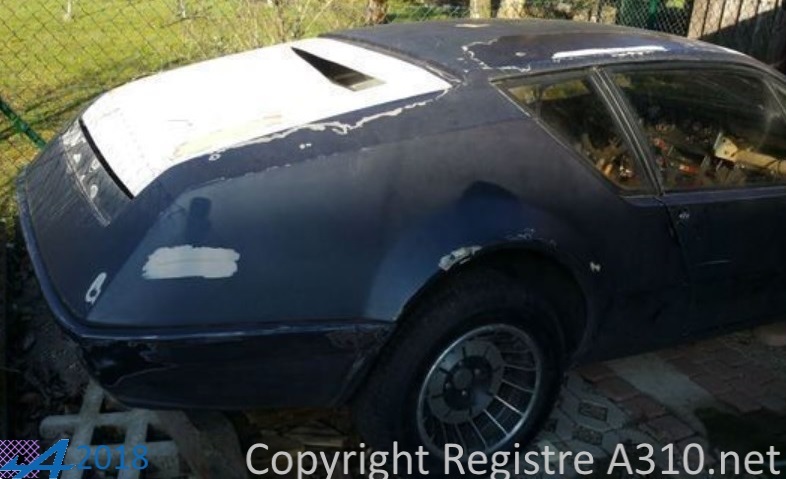 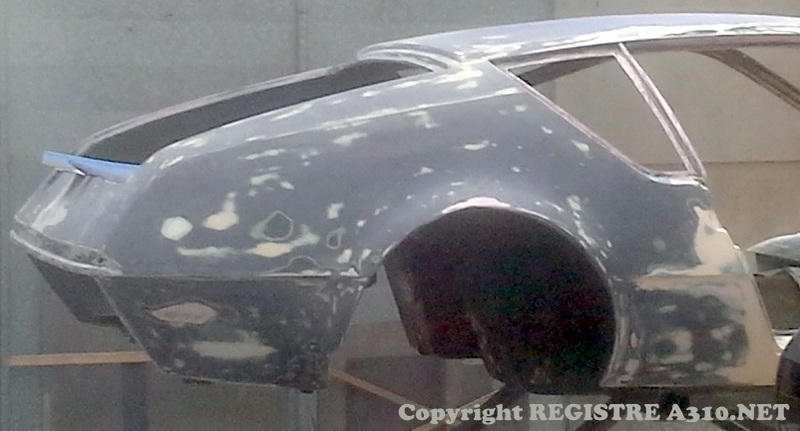 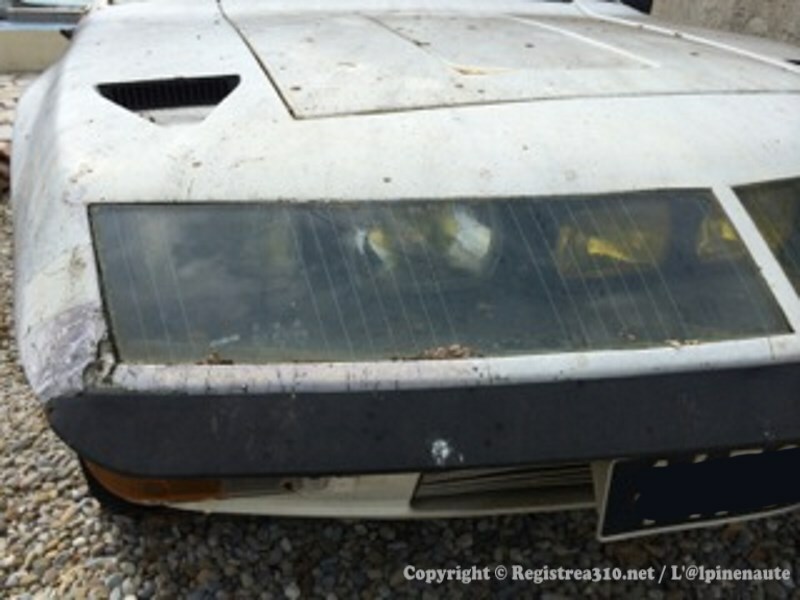 ?.1980 White In England between 1990 and 2009 Preparation according to the Australian Class "Historic Production Sports Car 1972-1977"
To be restored 3 in 1, Devil and Spax. 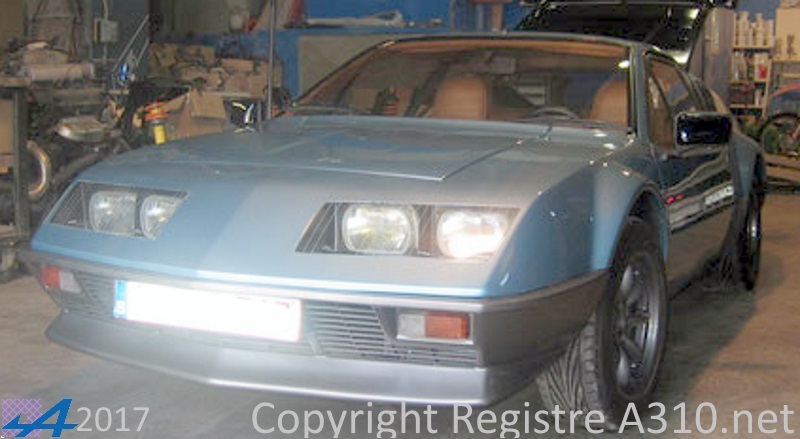 47107 2700VA 13.05.1980 Gray blue 2th owner since 1982. 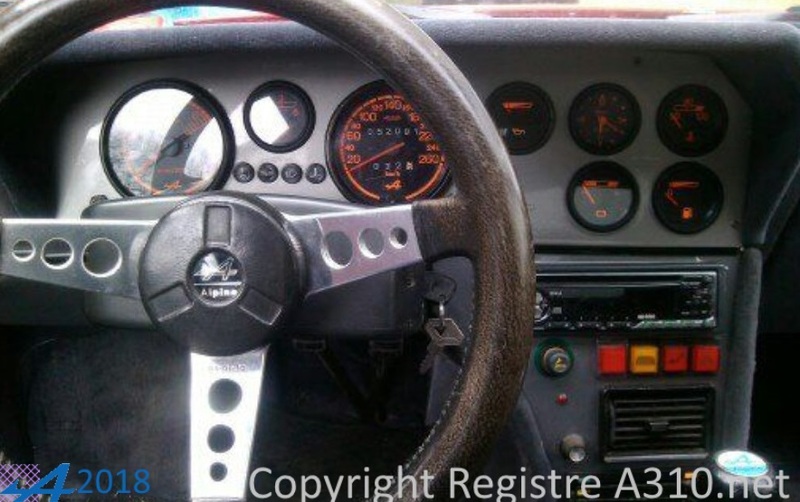 47260 2700VA ??.? 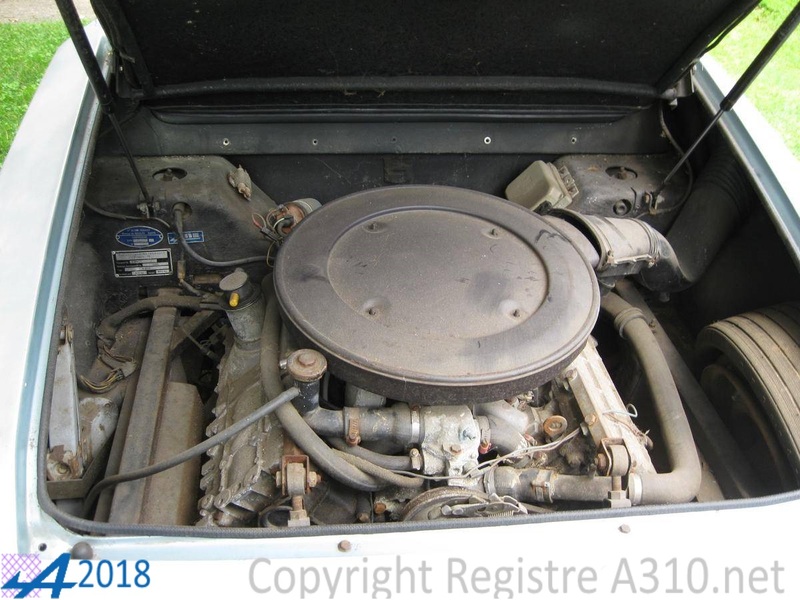 ?.1980 625 Gray galaxie Origine Germany (Code Pays: 120). 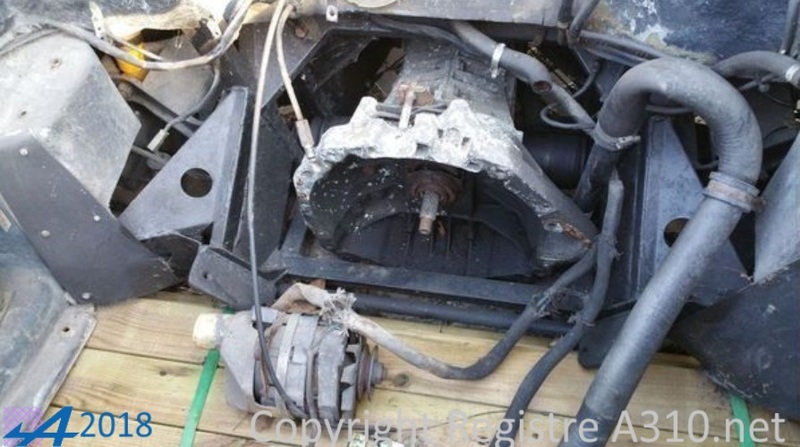 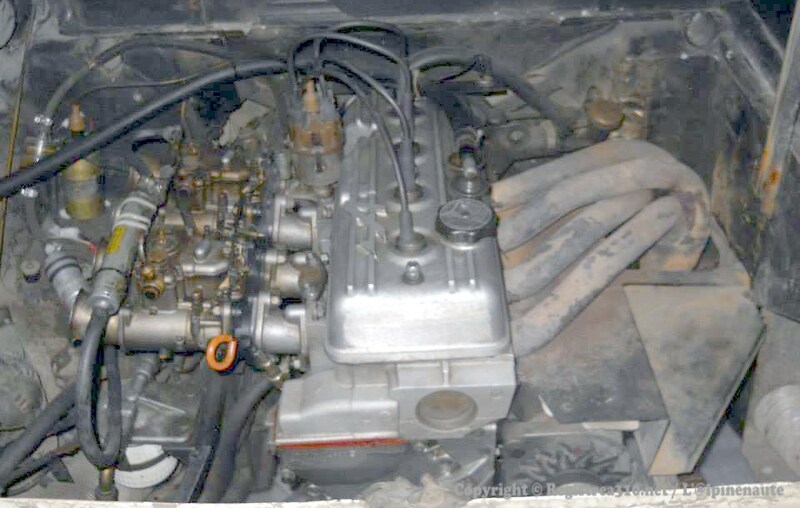 Citroen Engine 2001 Citroen XM V6 24V G-Kat. 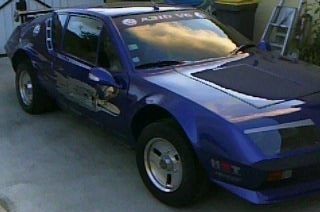 210hp tuned up. 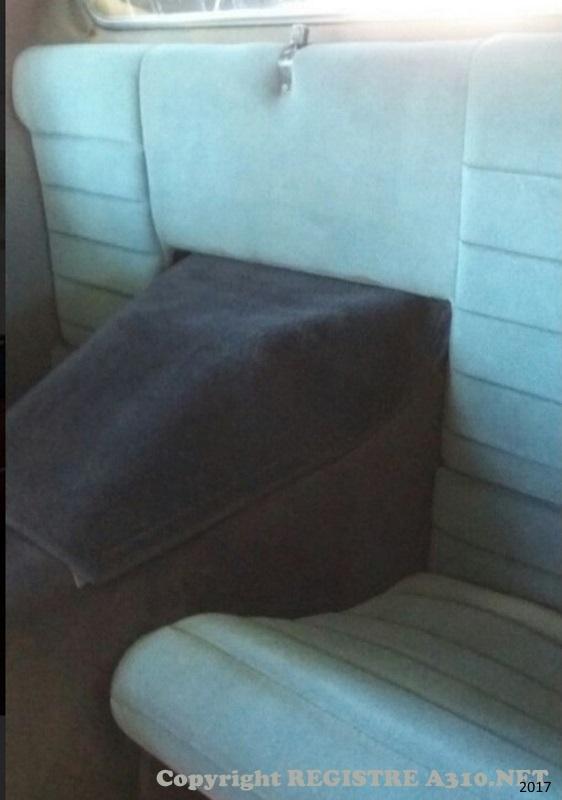 47567 2700VA ??.? 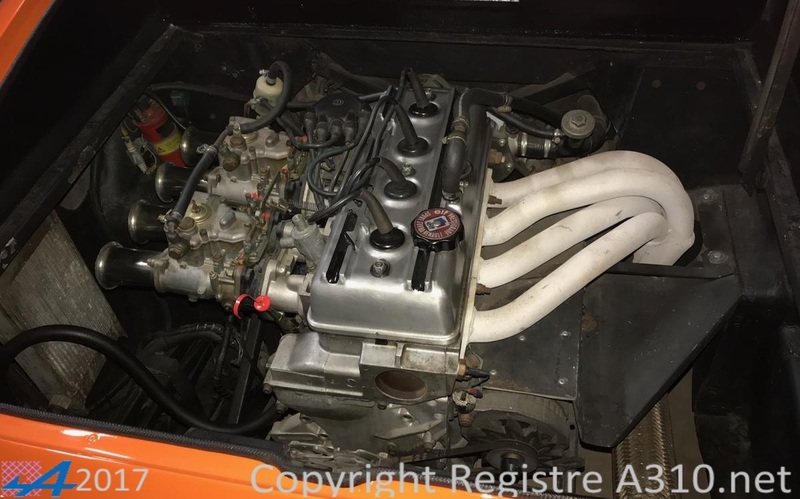 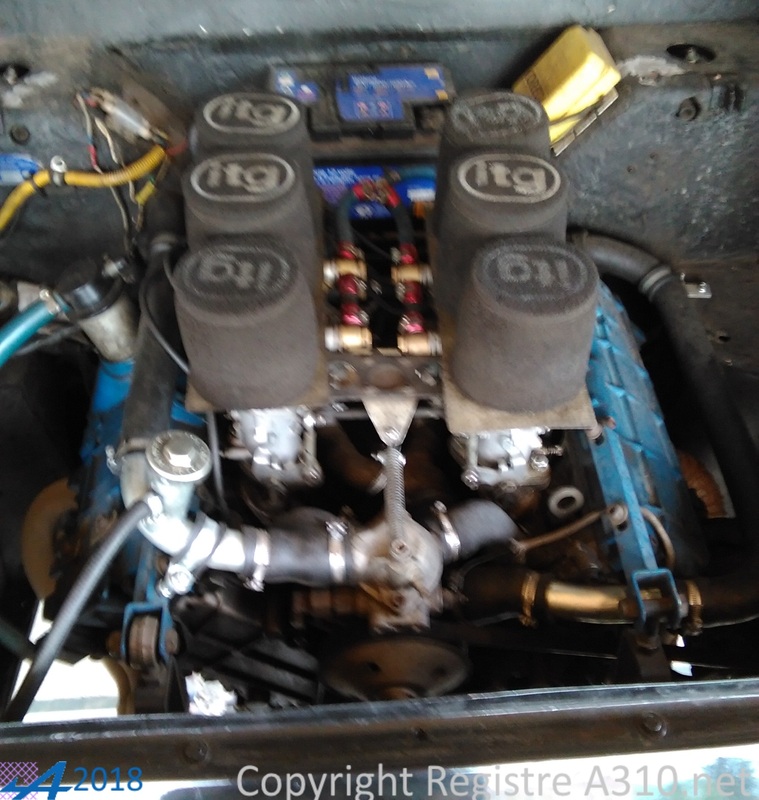 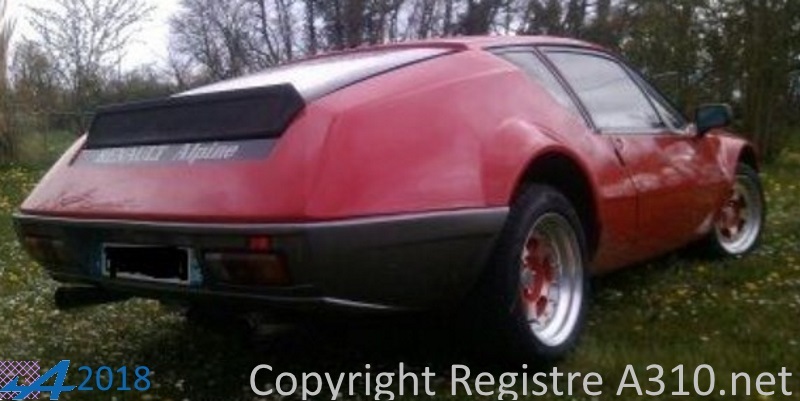 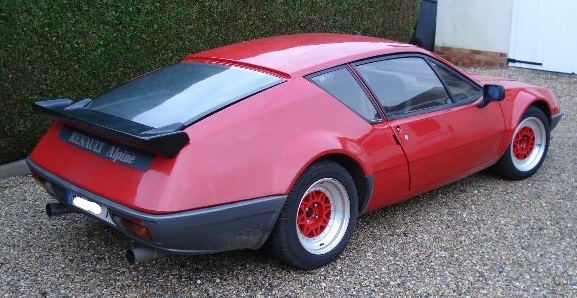 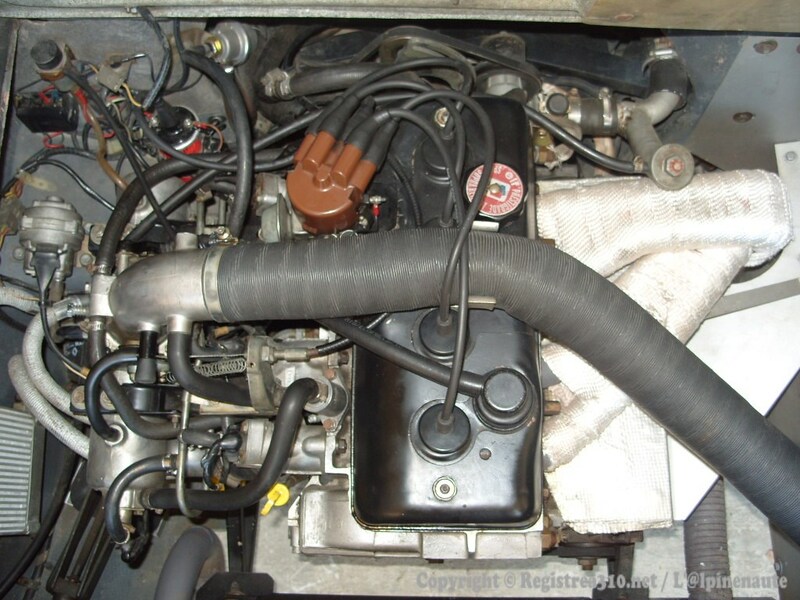 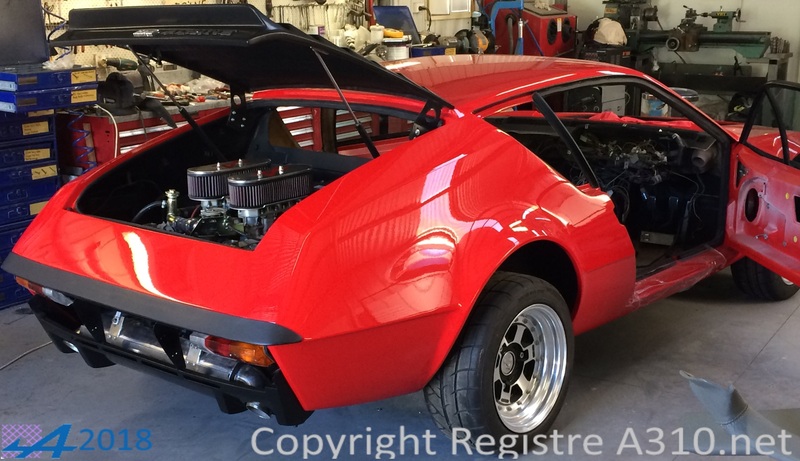 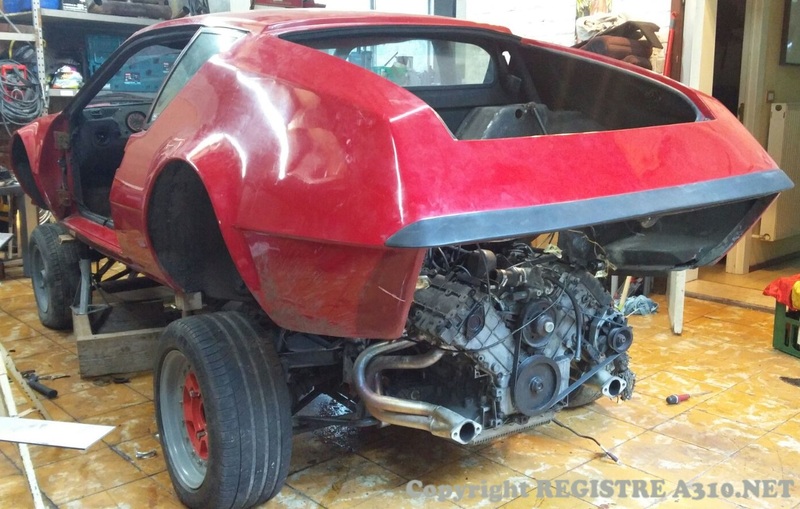 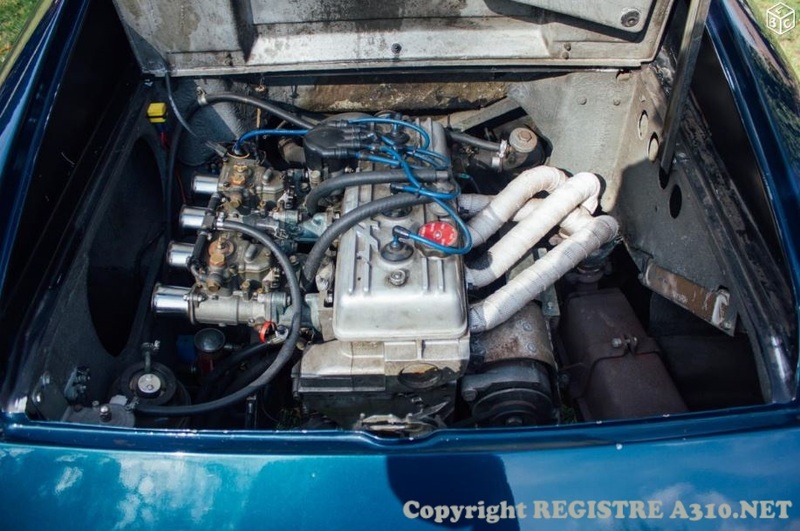 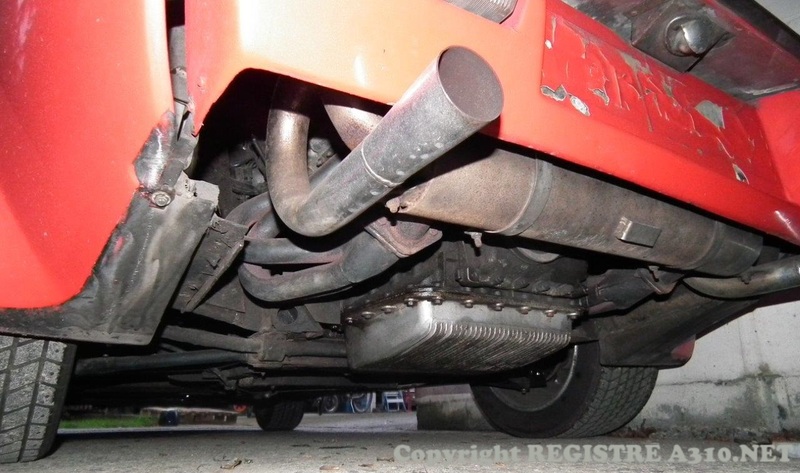 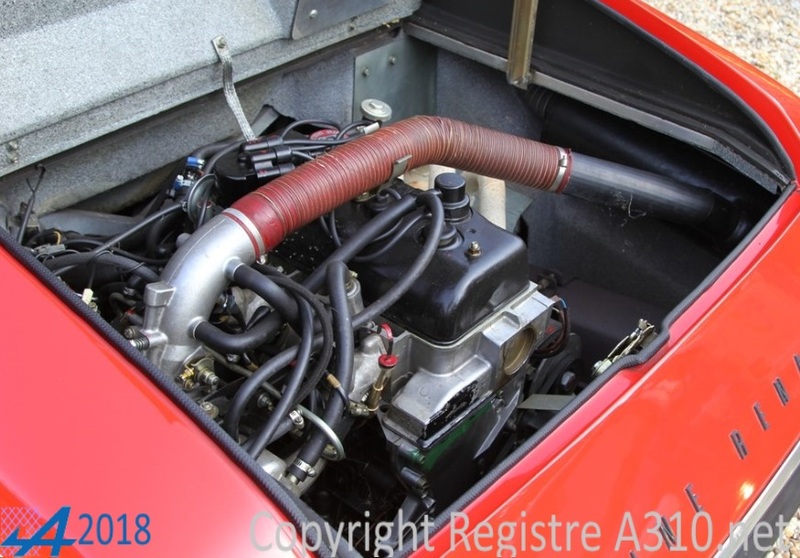 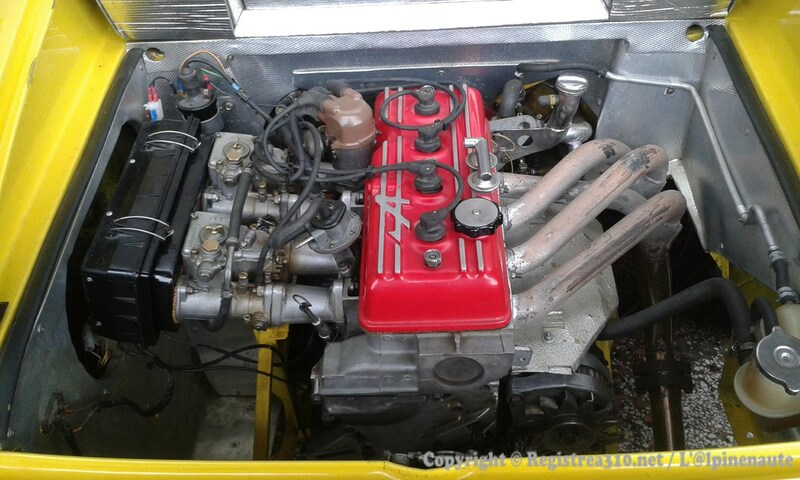 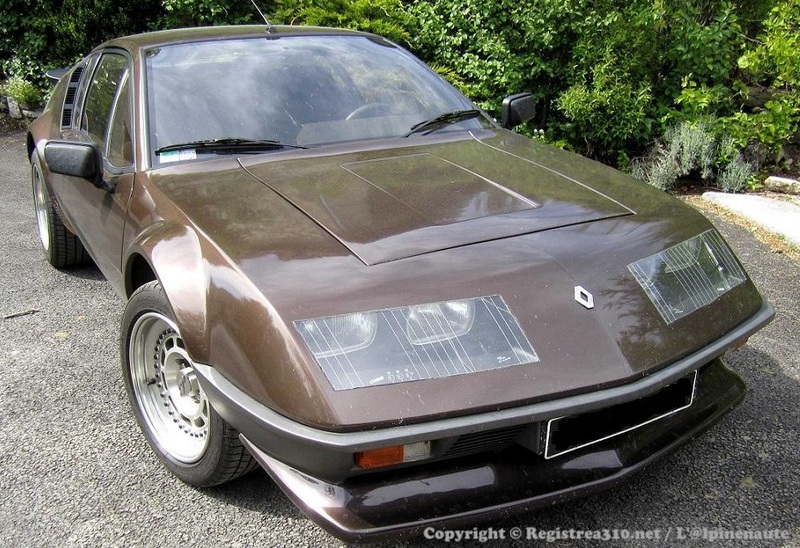 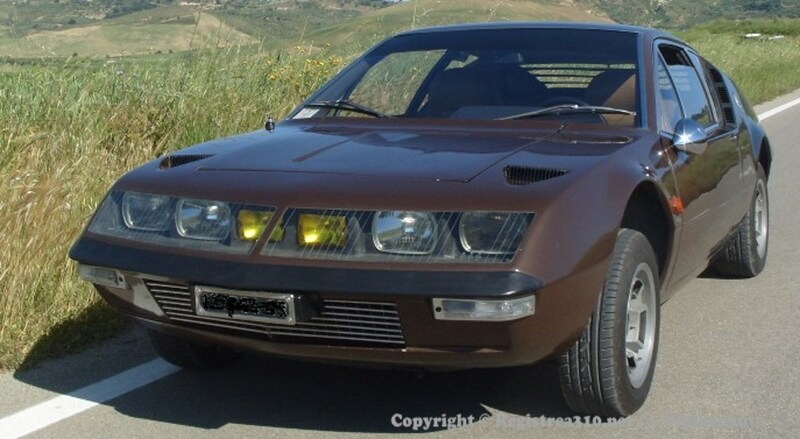 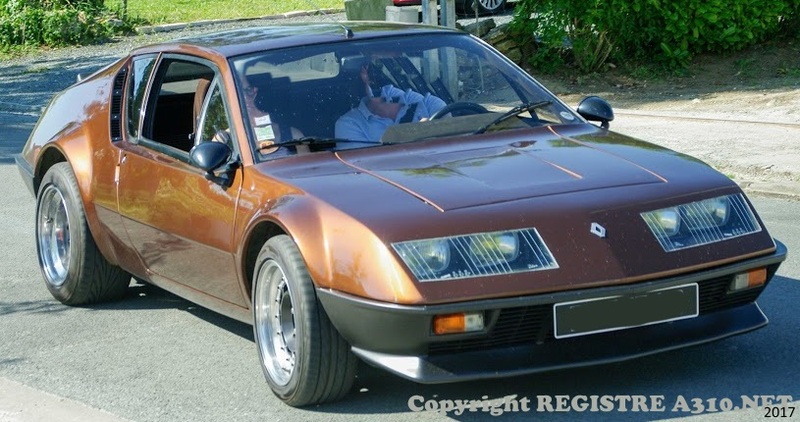 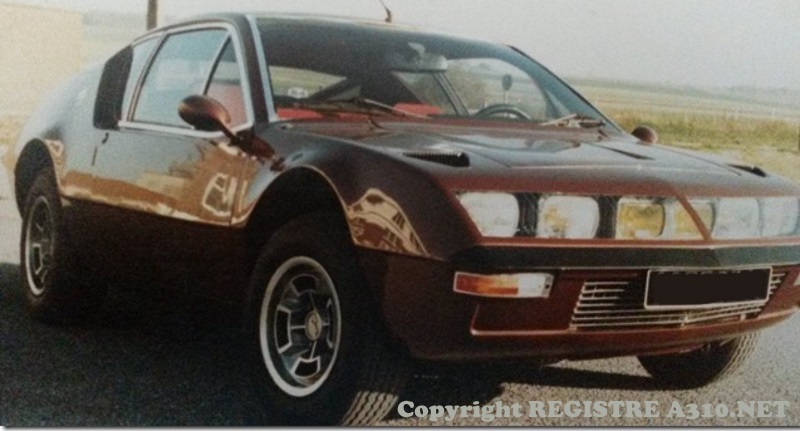 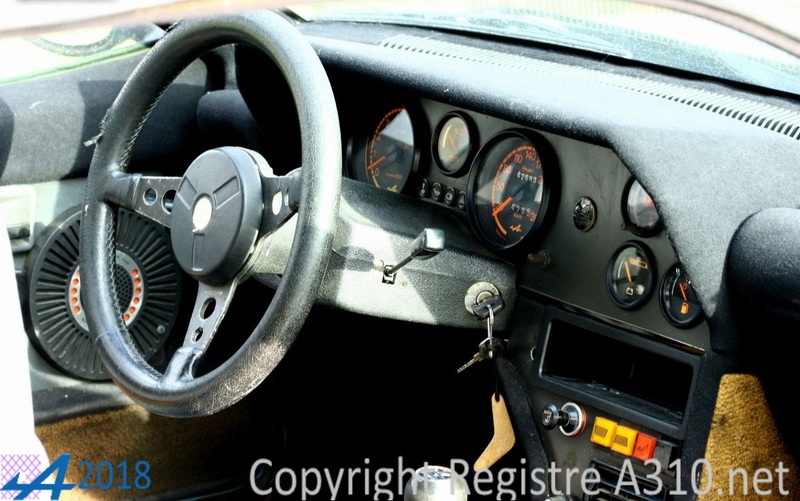 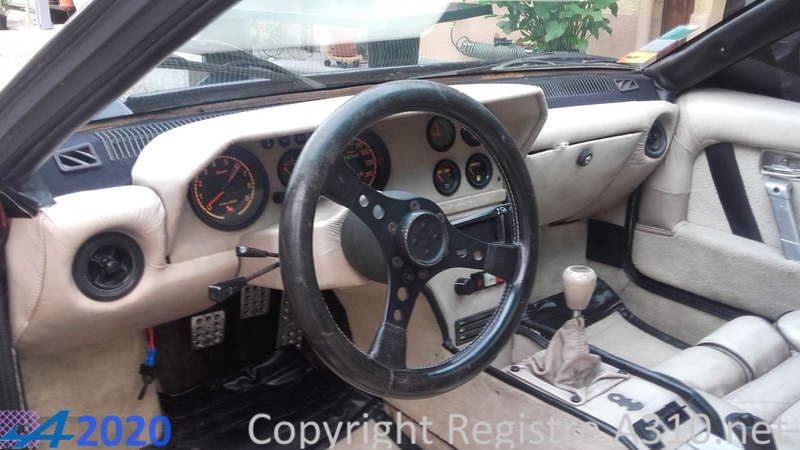 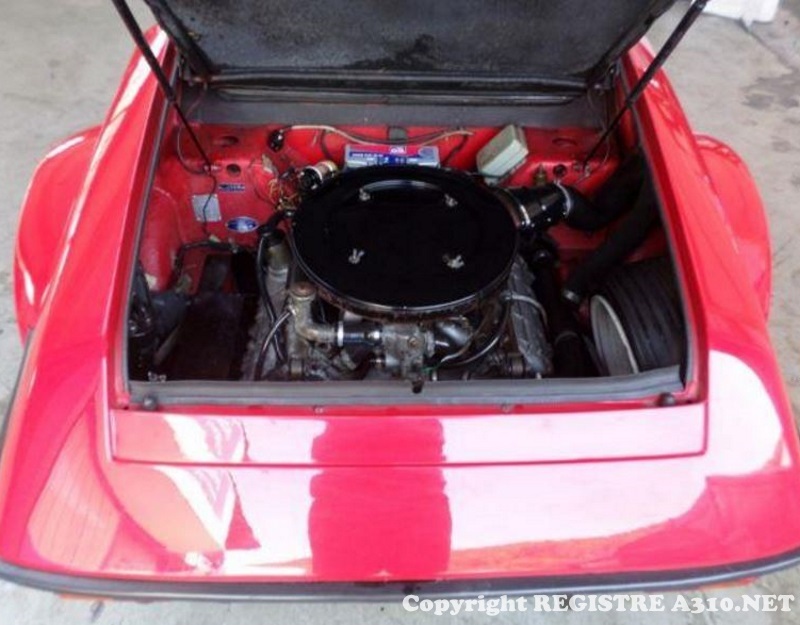 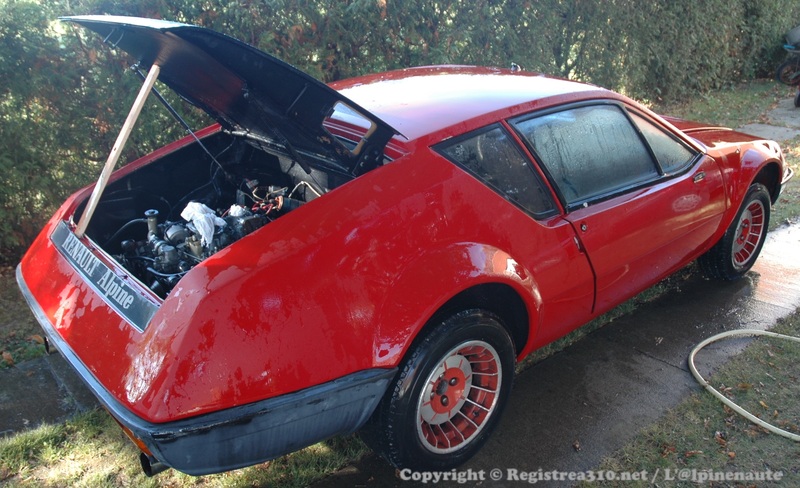 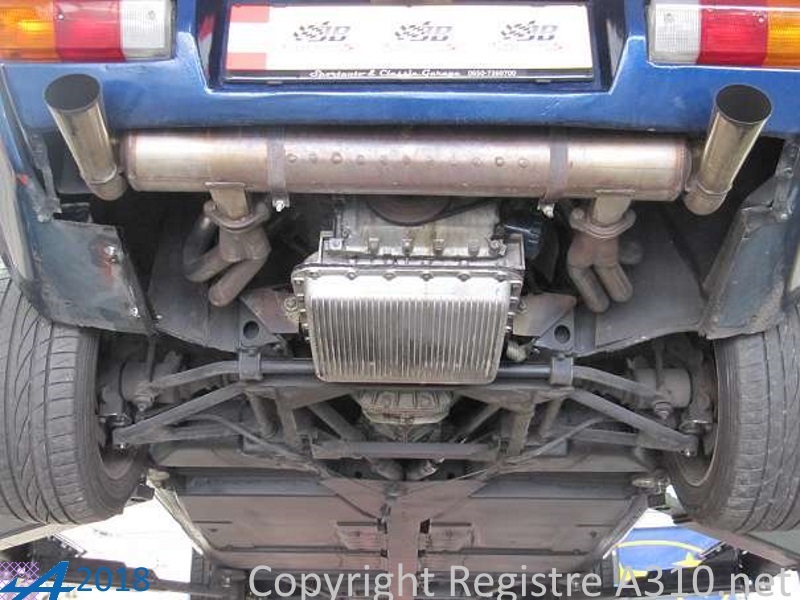 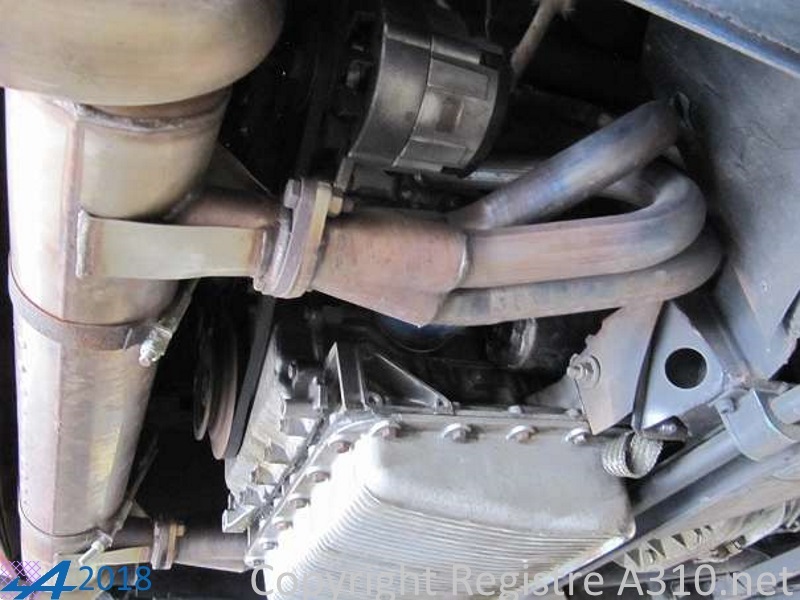 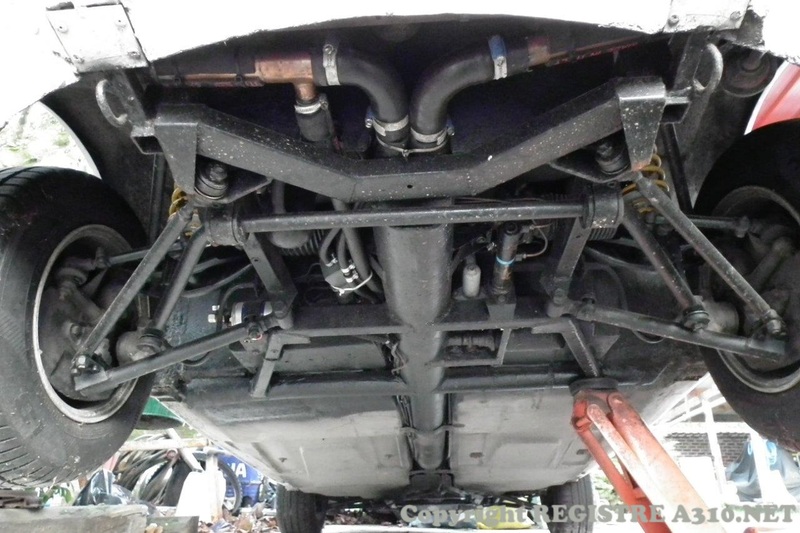 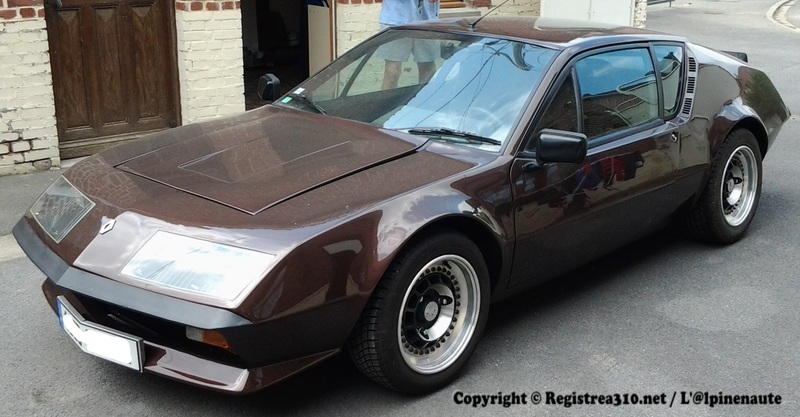 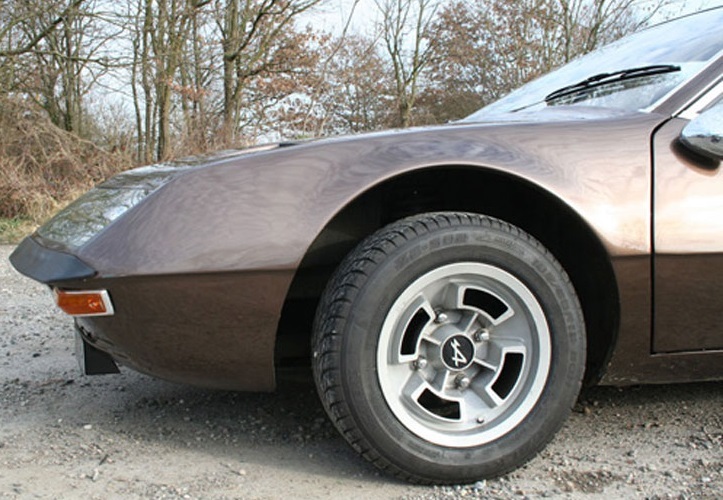 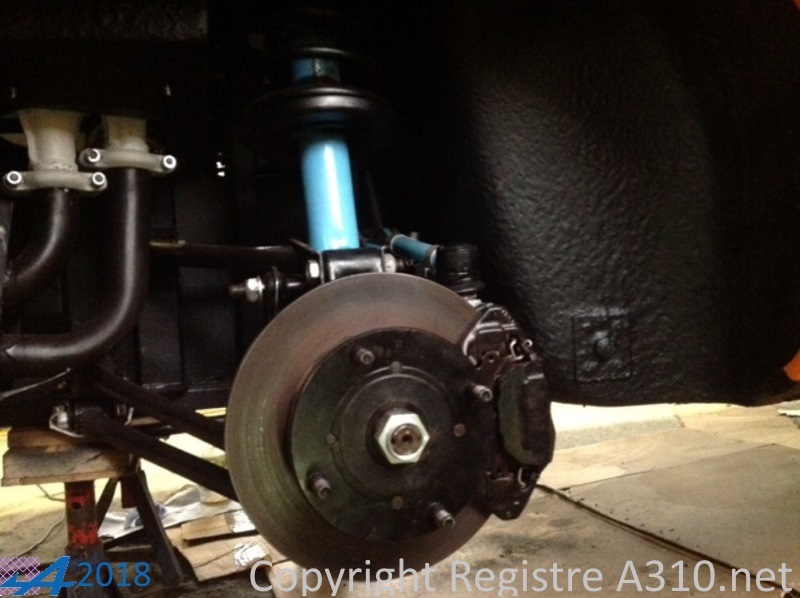 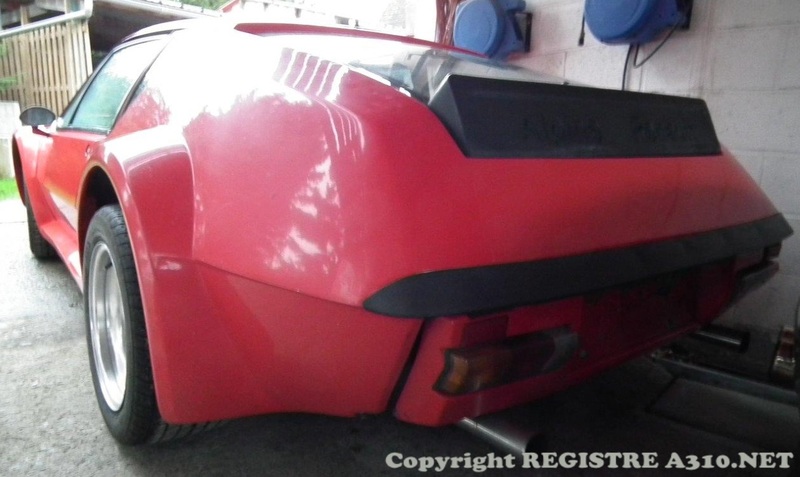 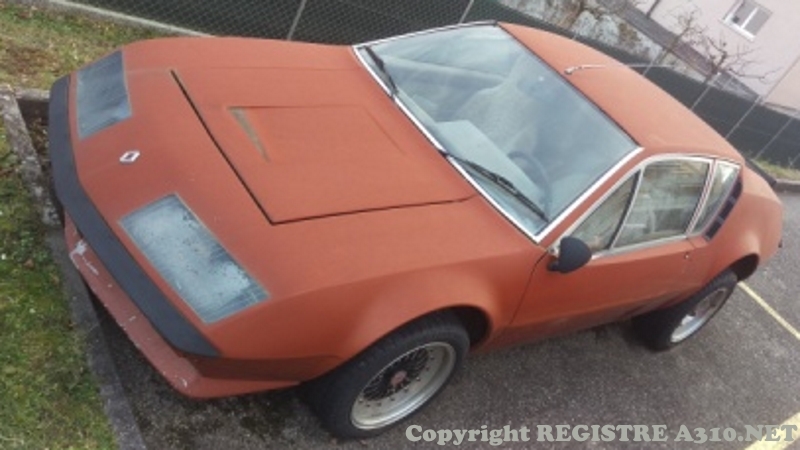 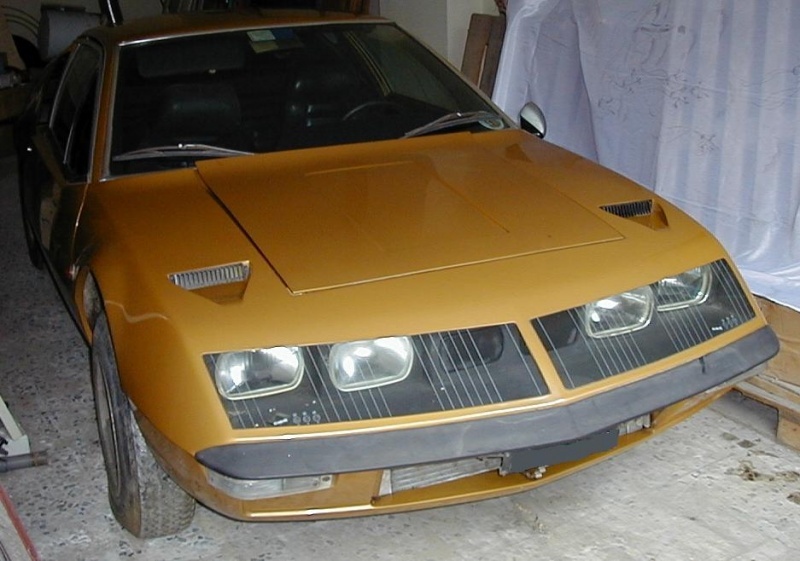 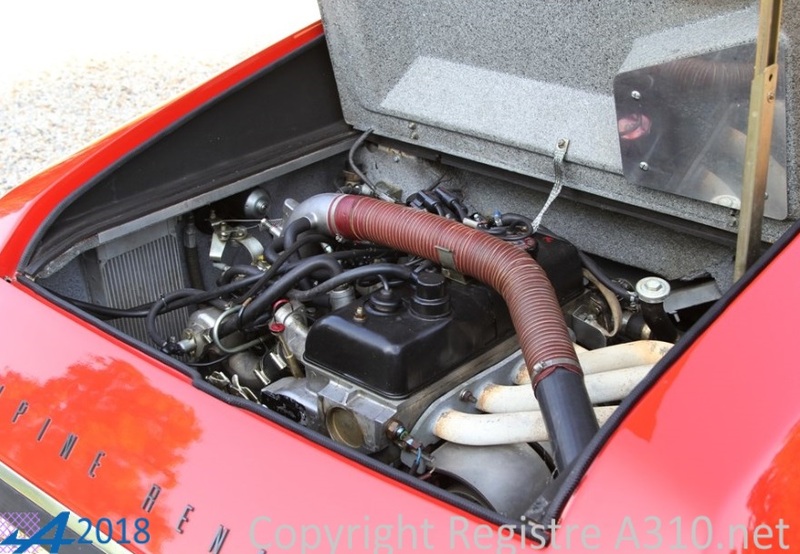 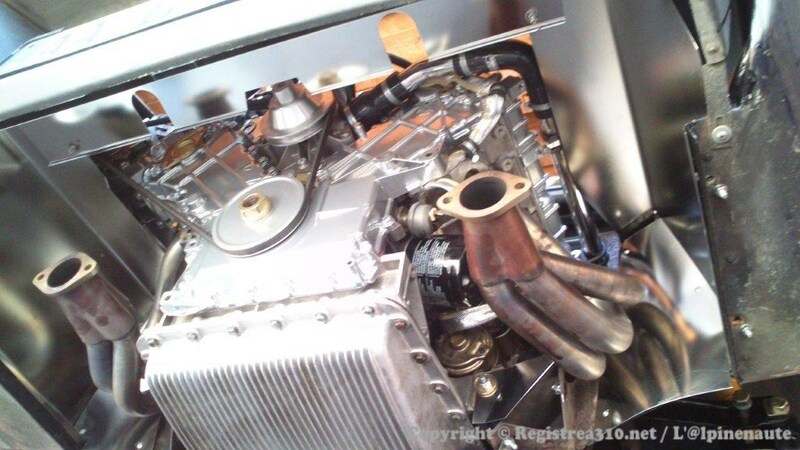 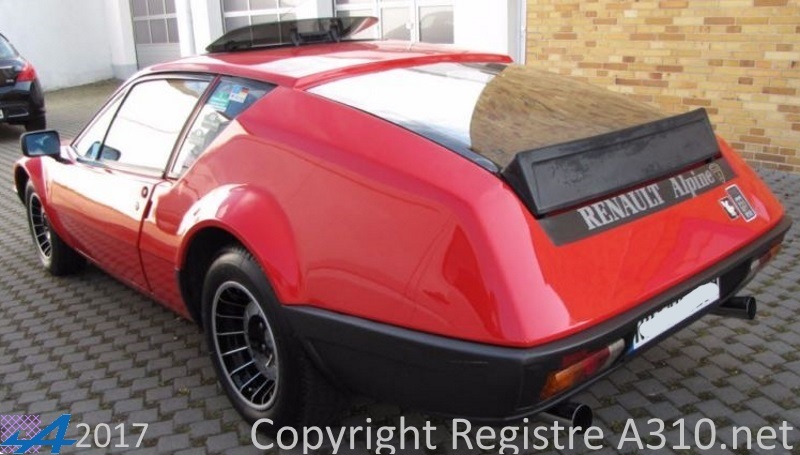 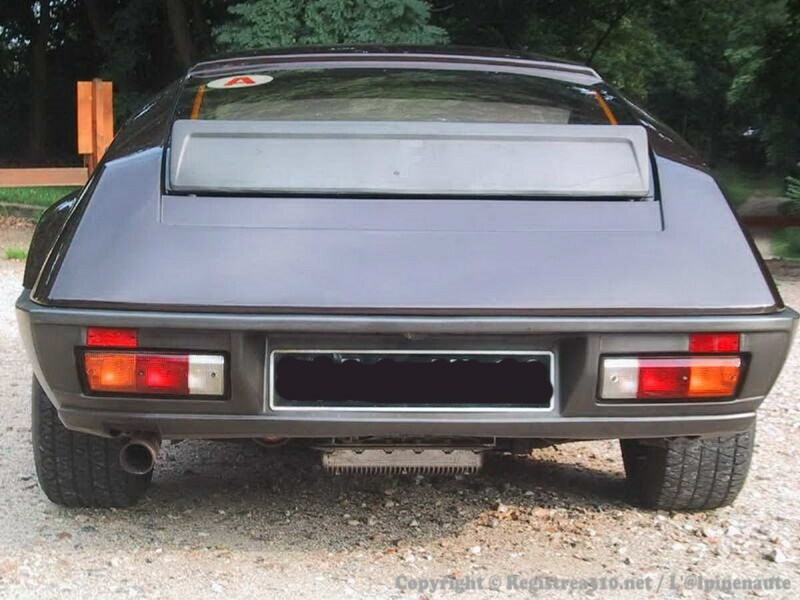 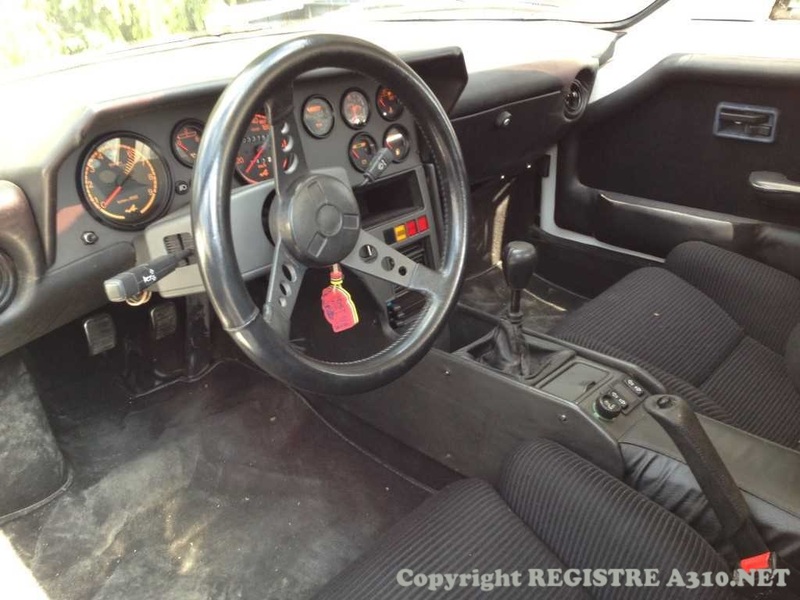 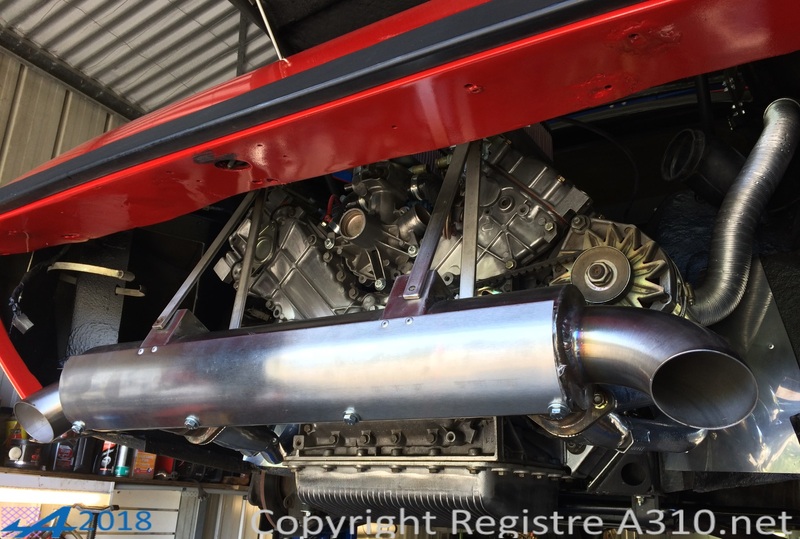 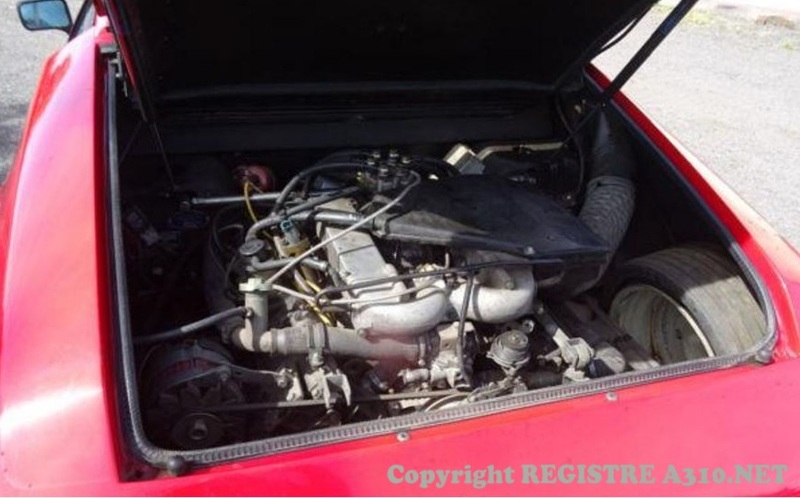 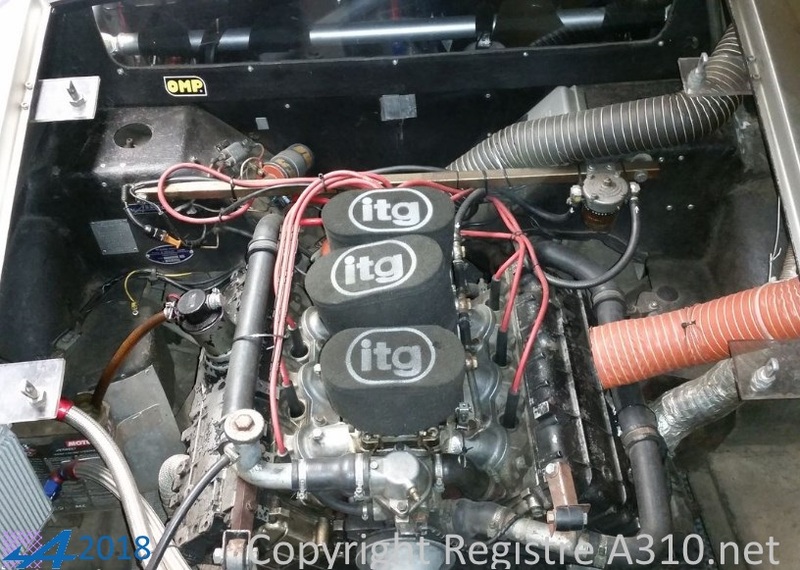 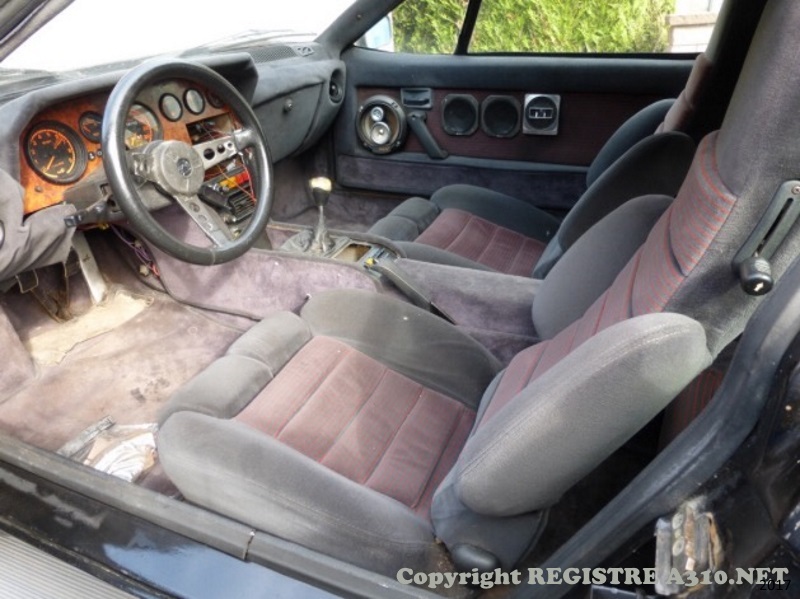 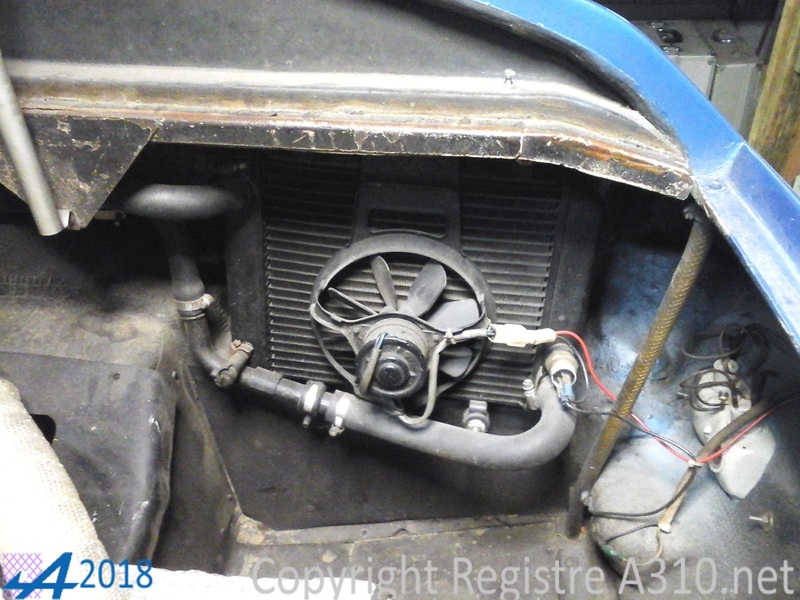 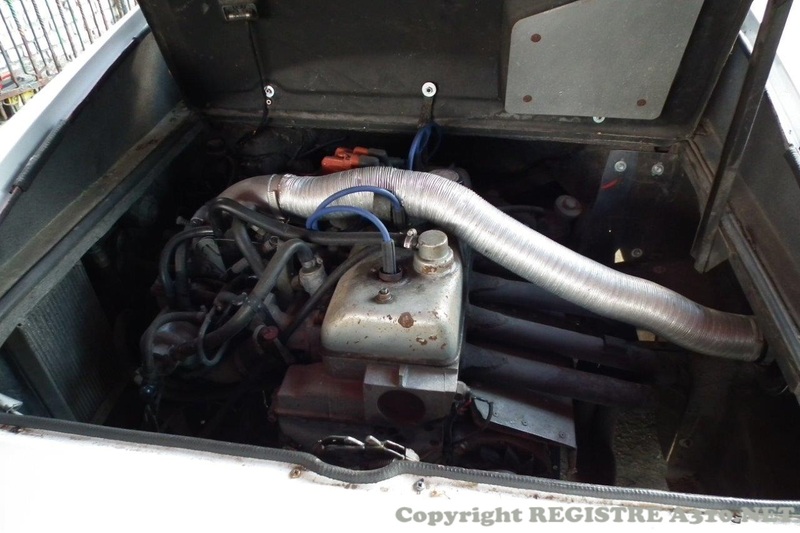 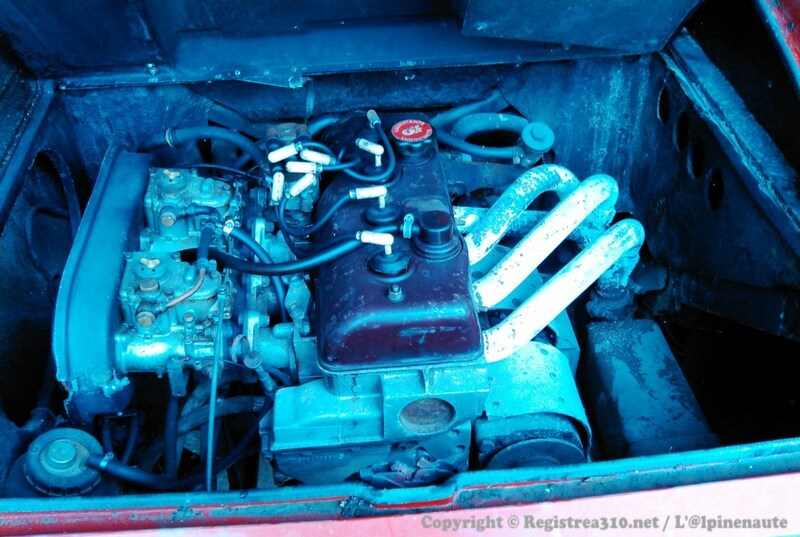 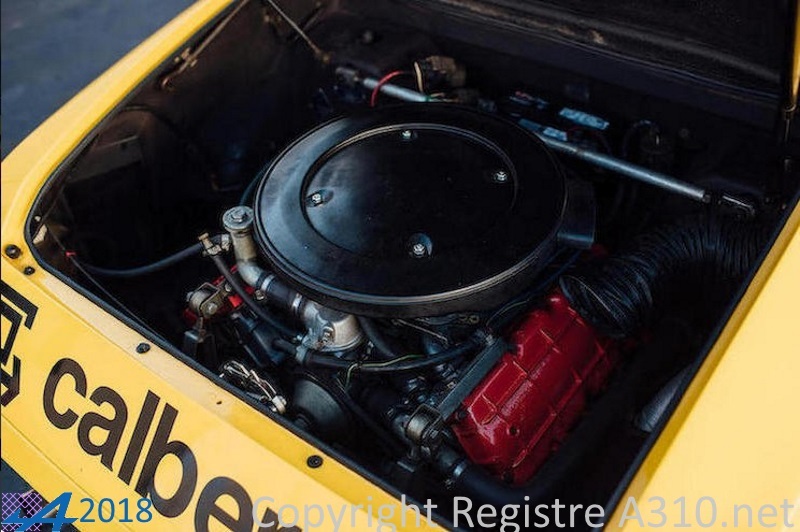 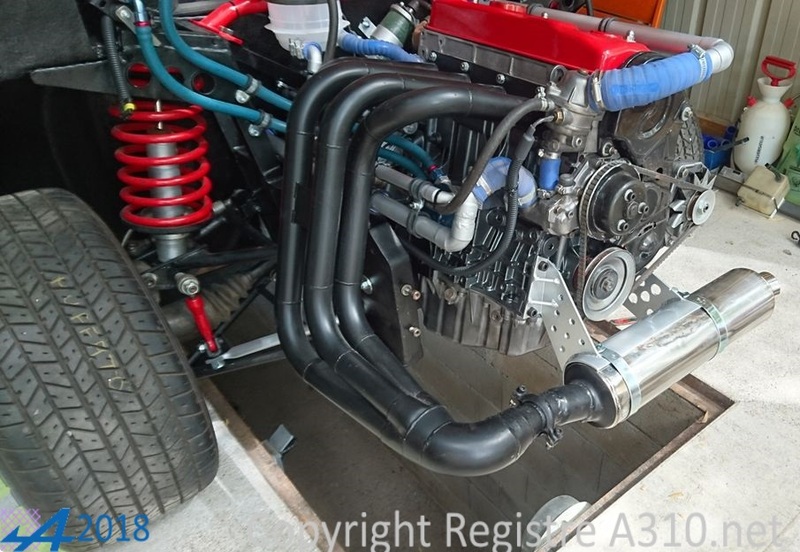 ?.1980 marron irrise (brown) With original engine and exhaust manifold 3 in1 devil Koni damping has the front. 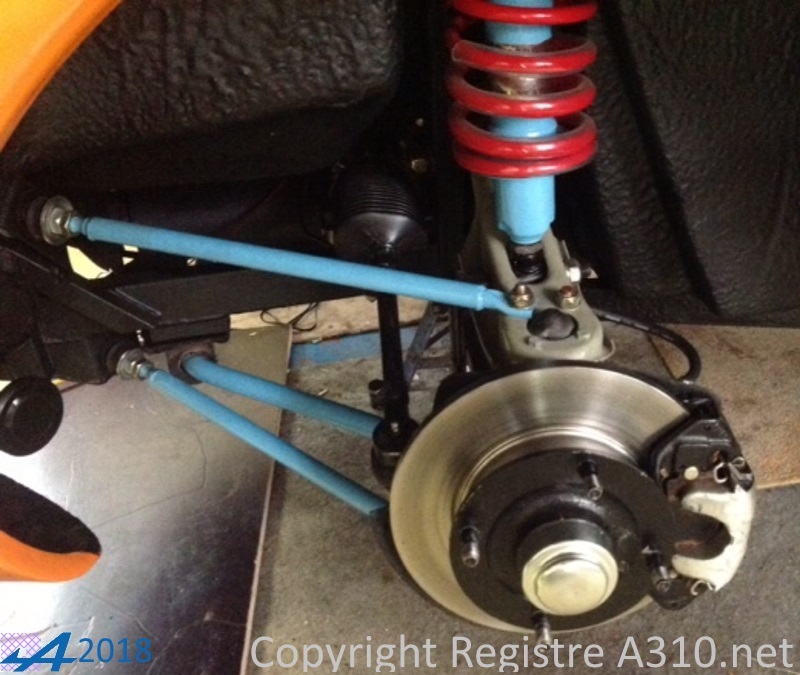 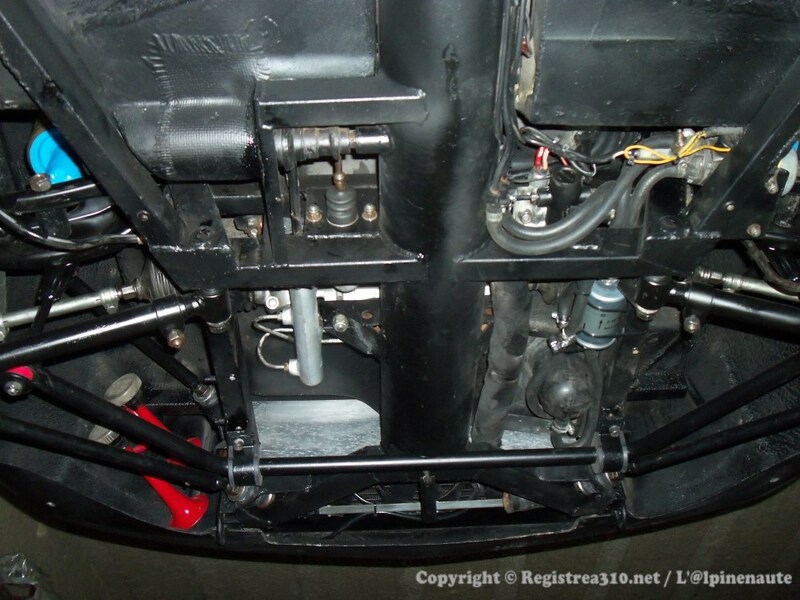 Spax adjustable to the rear with lowering springs. 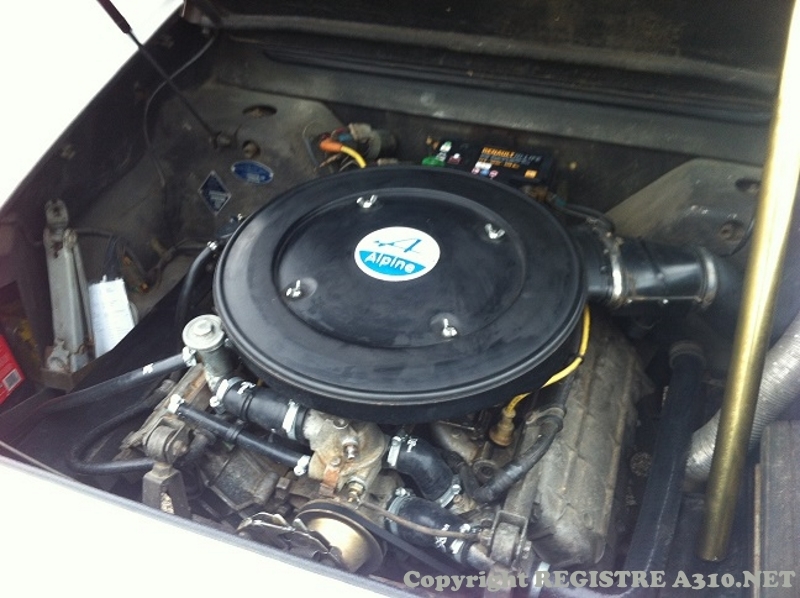 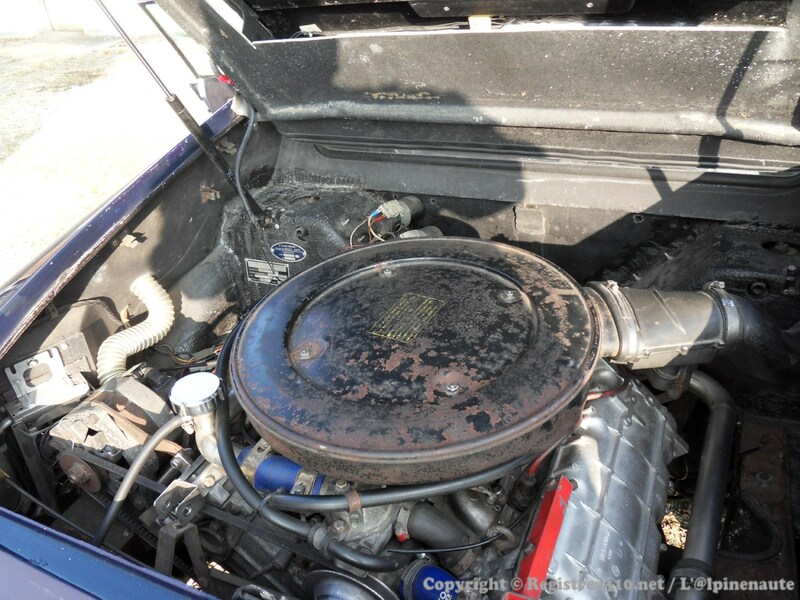 47787 2700VA 21.10.1980 625 Gray galaxie Kilometers 67000 km. 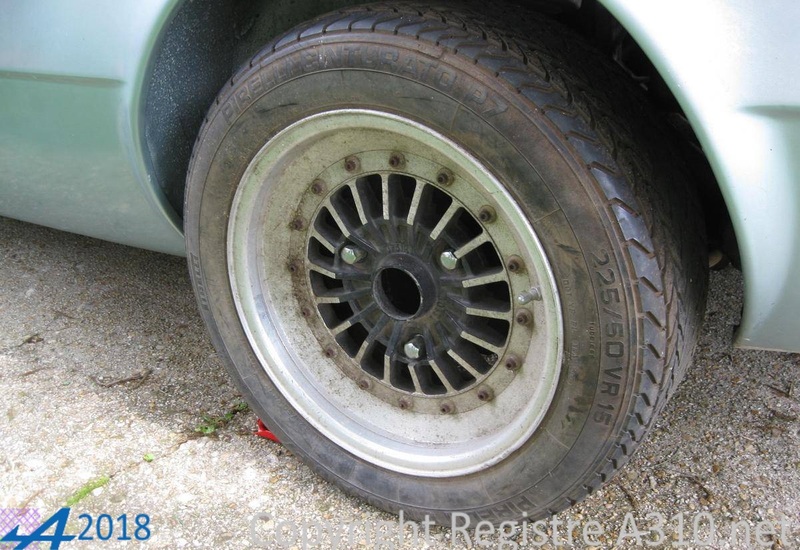 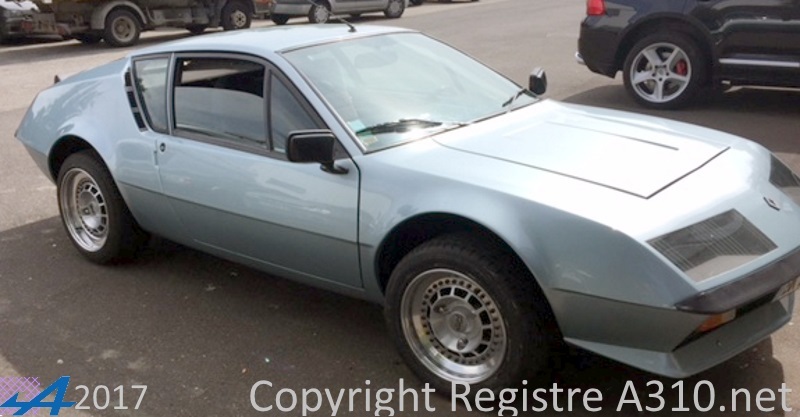 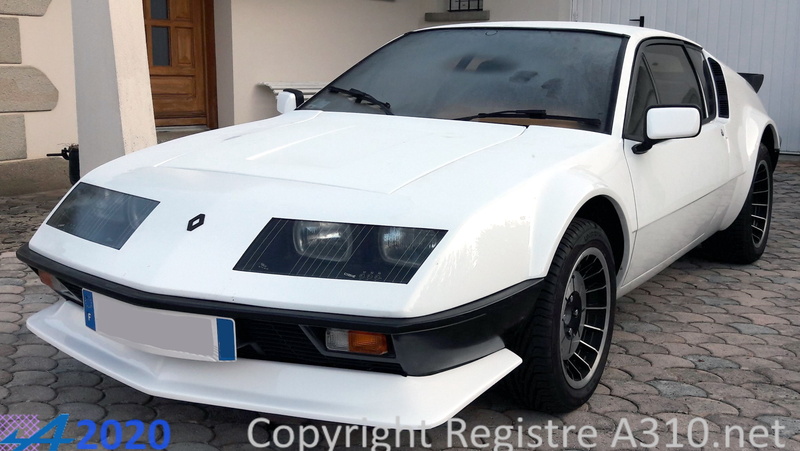 - Rims tramont AV 15 "AR 16"
48151 2700VA 24.02.1981 158 White irisé verni Origine Germany code 120. 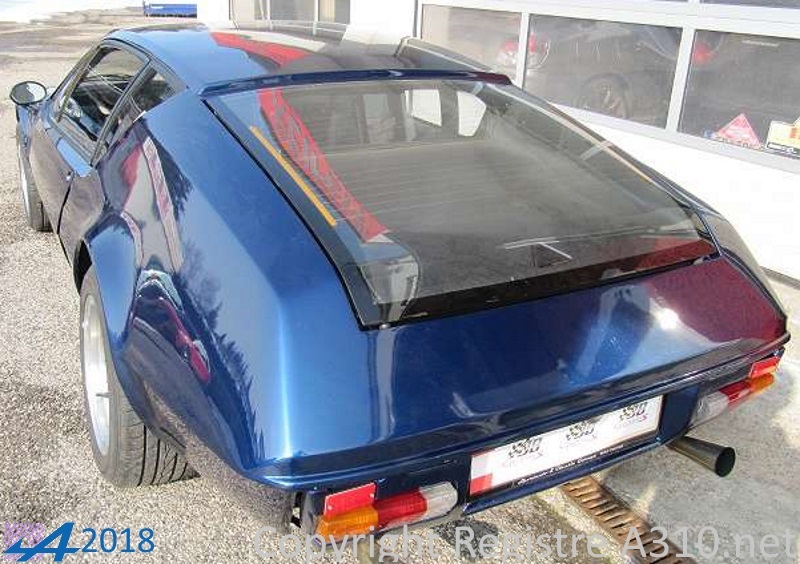 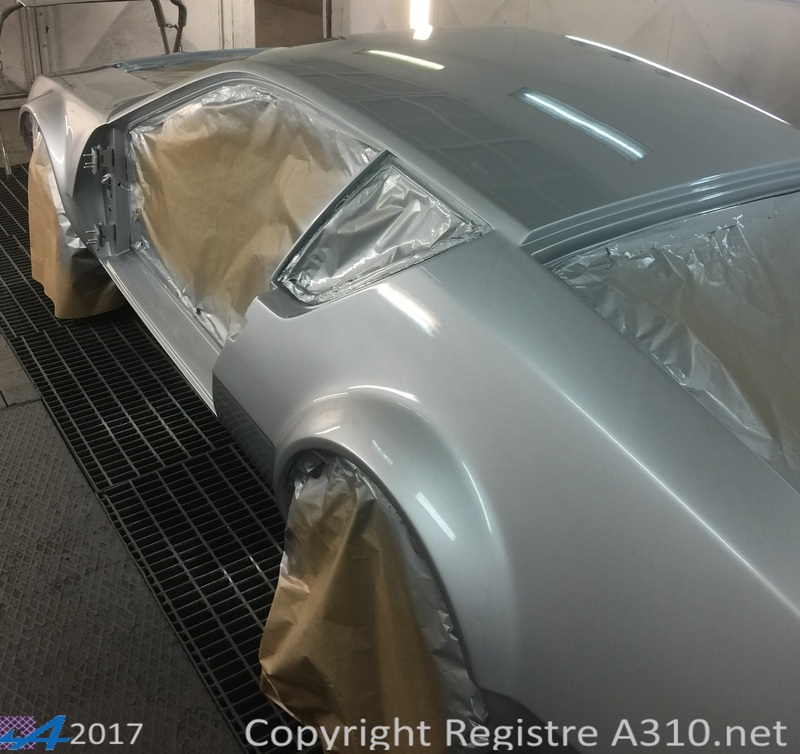 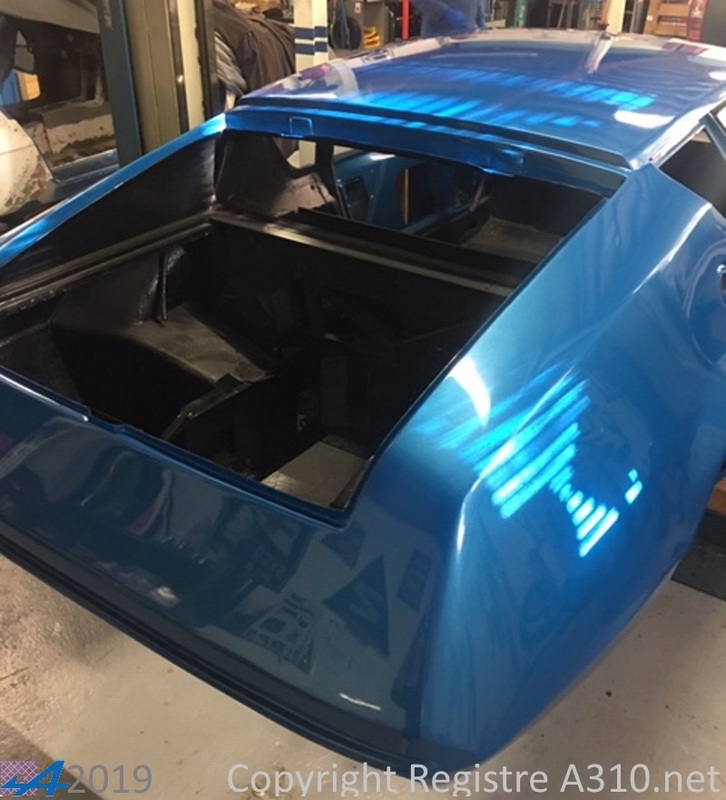 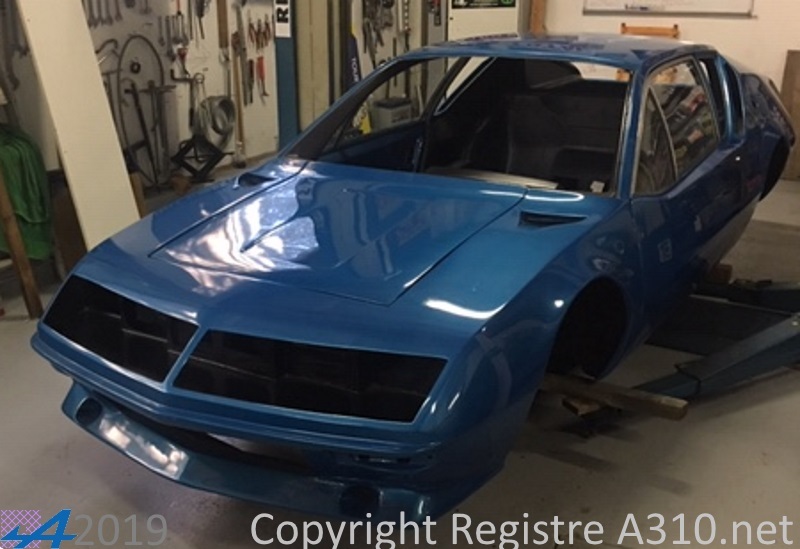 Ongoing restoration Kleinemeier rear spoiler. 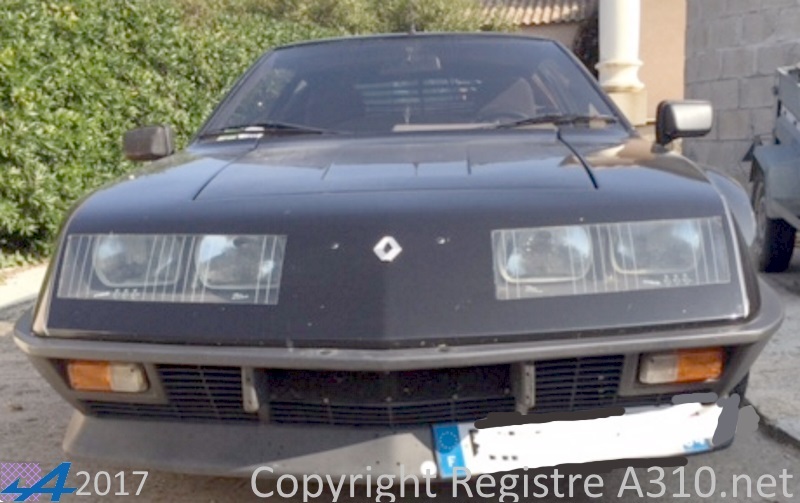 48336 2700VA 02.04.1981 622 Black irisé verni This A310 was imported into the UK by Renault when new and has been here since. 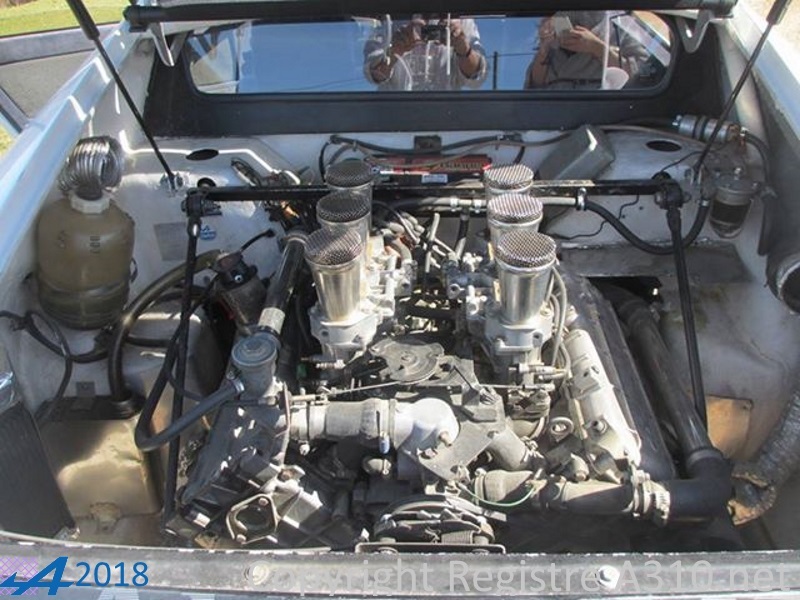 48462 2700VA 01.04.1981 625 Gray galaxie Owner since 2017. 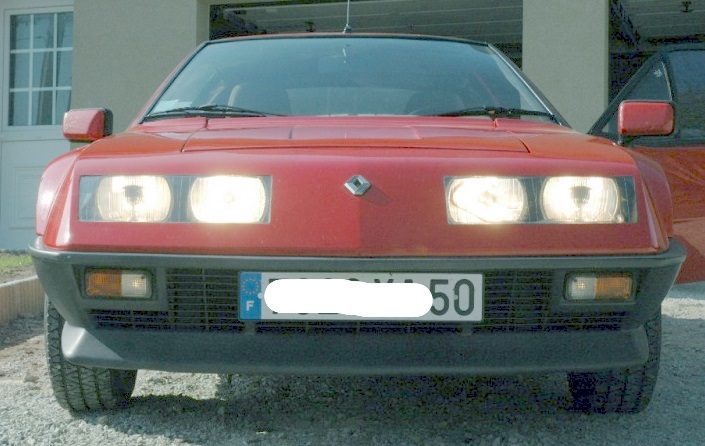 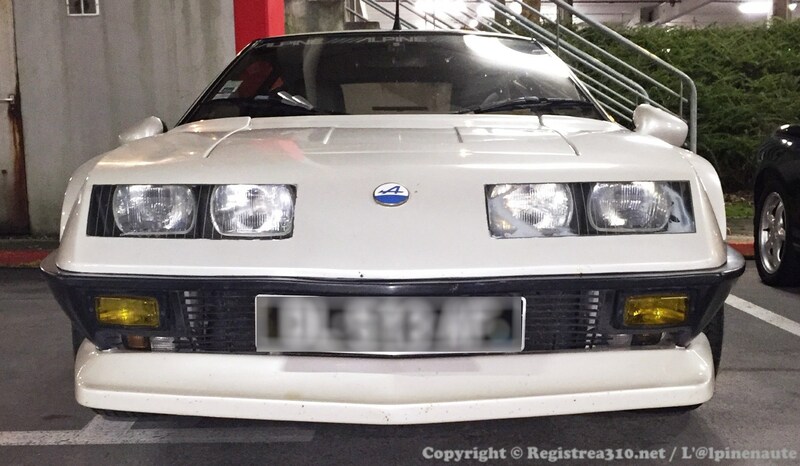 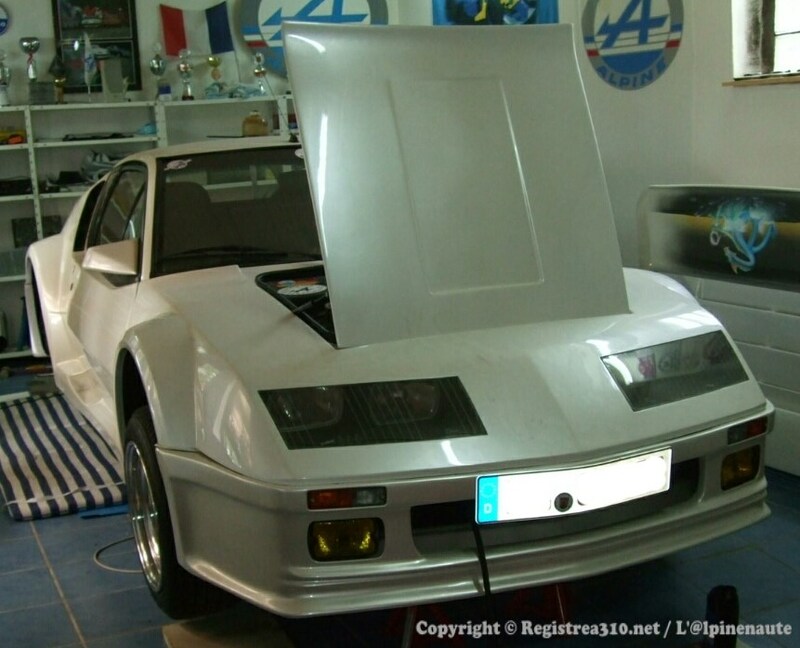 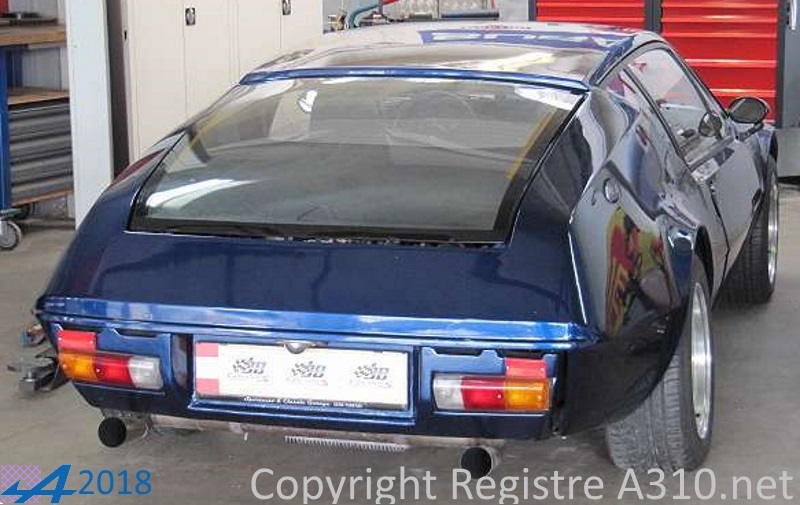 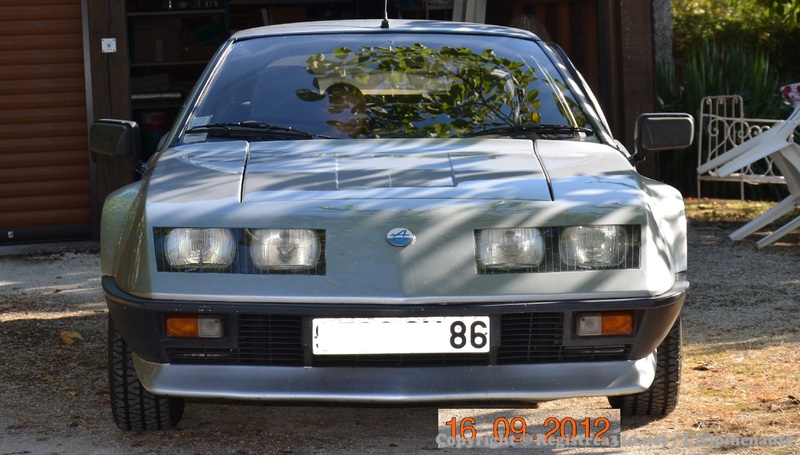 48651 2700VA 27.05.1981 303 White gardénia Restoring complete. 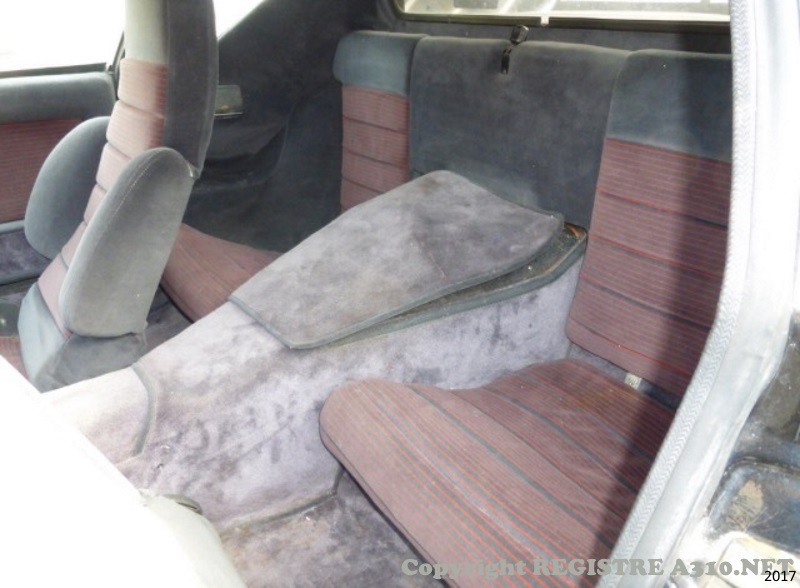 48708 2700VA 14.05.1981 625 Gray galaxie Italian vehicle with tinted windows and radio / cassette player option. 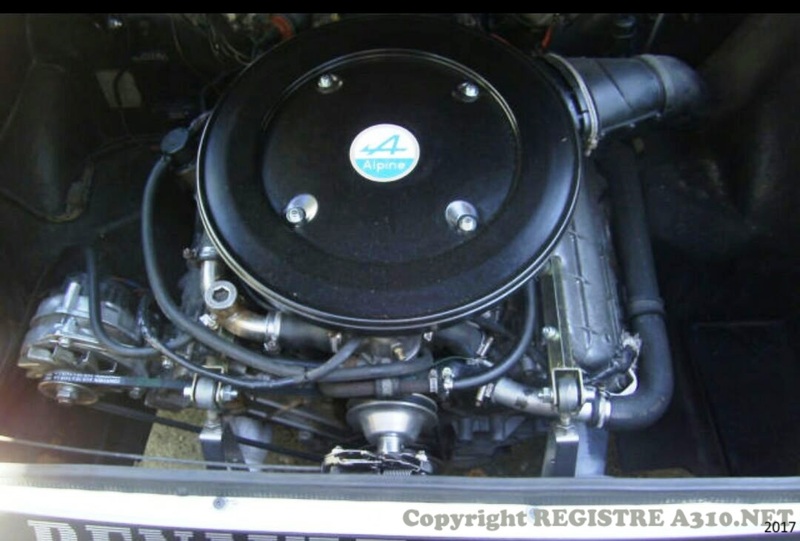 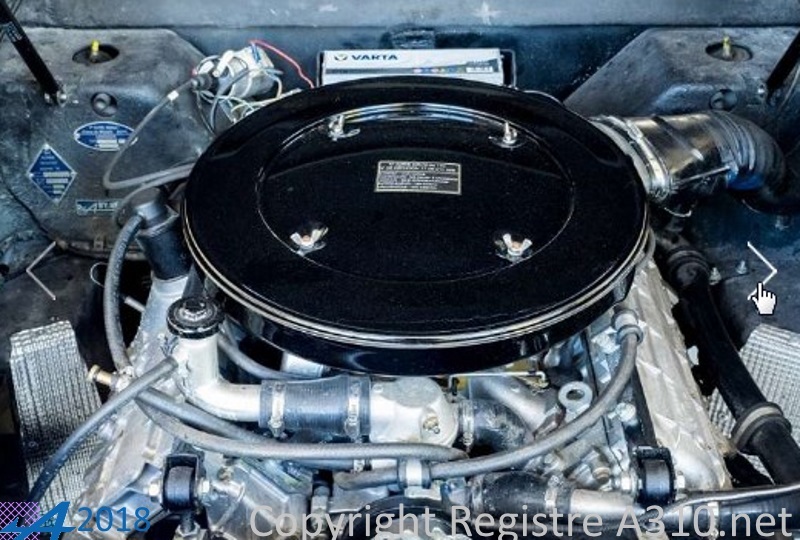 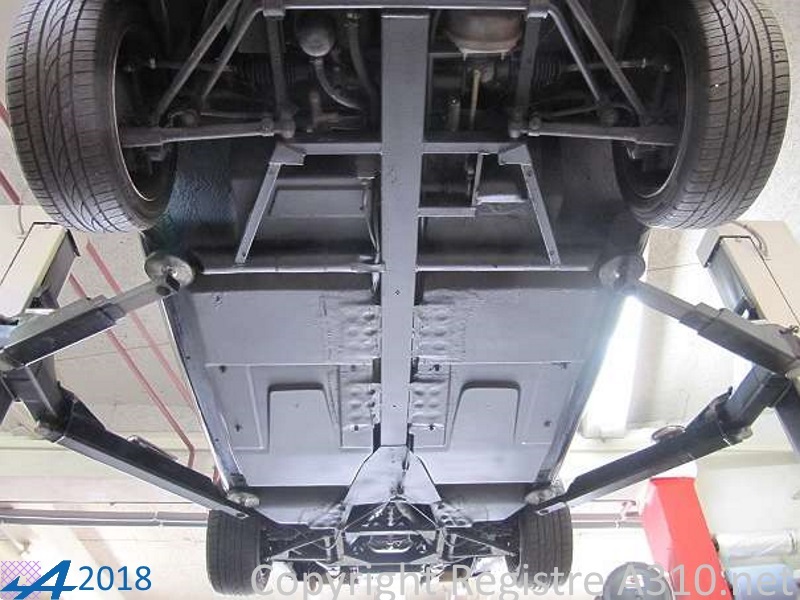 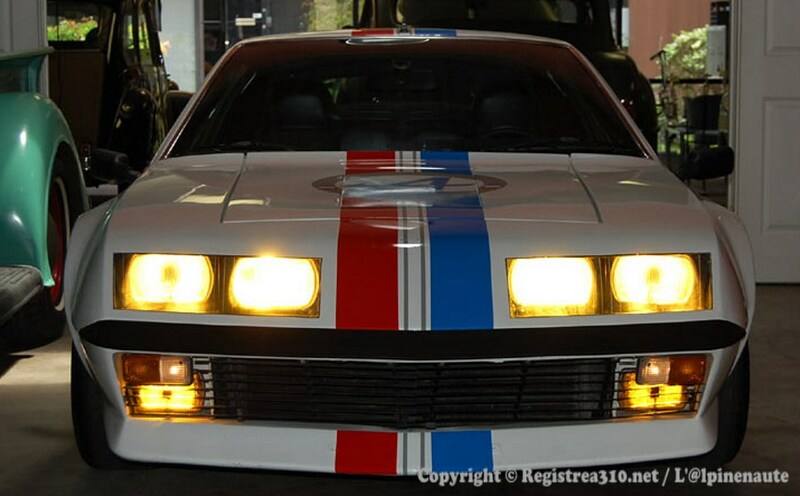 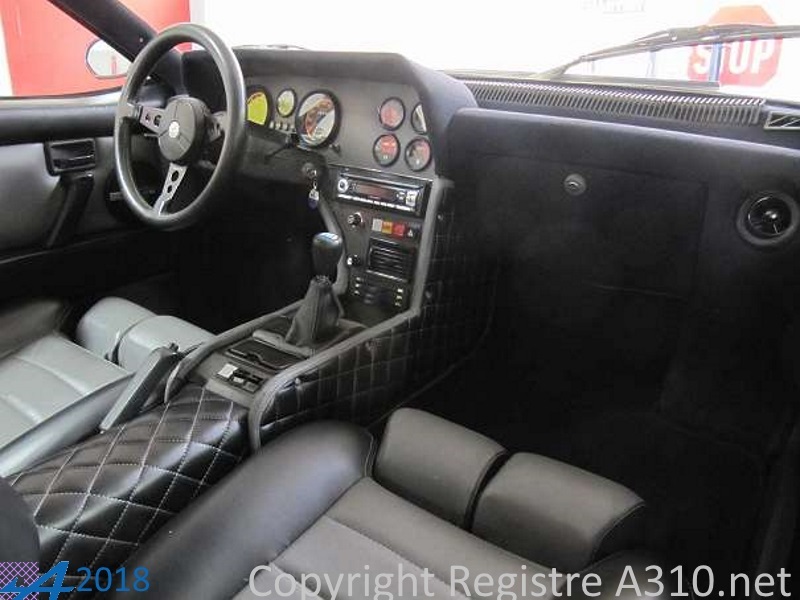 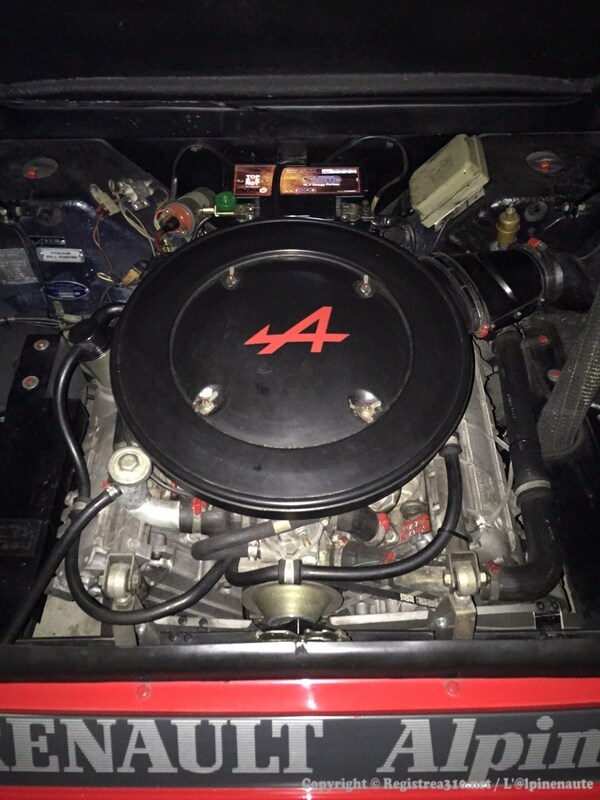 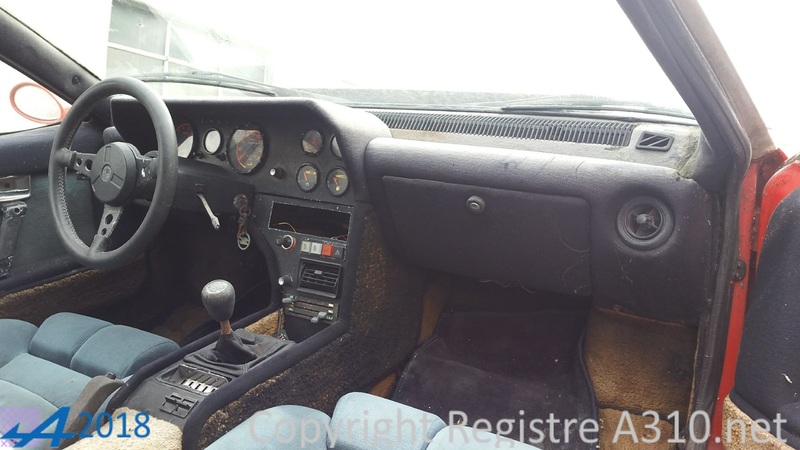 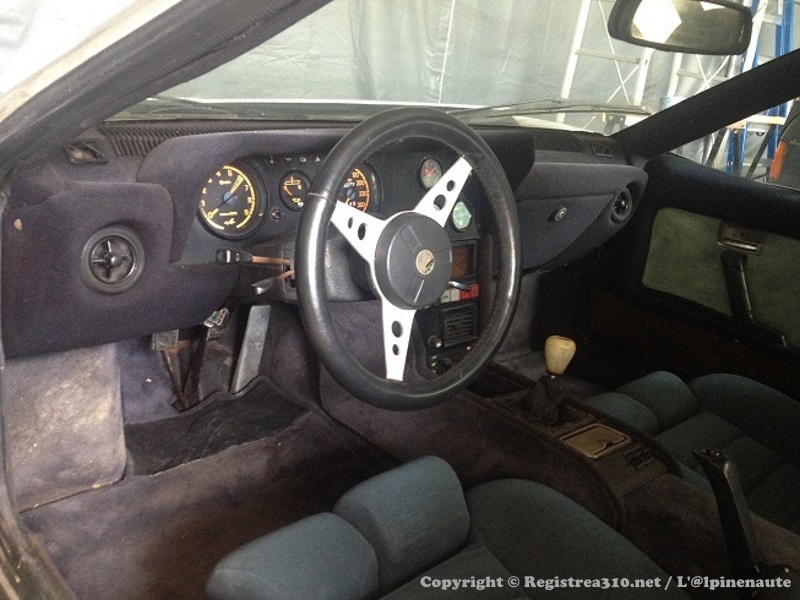 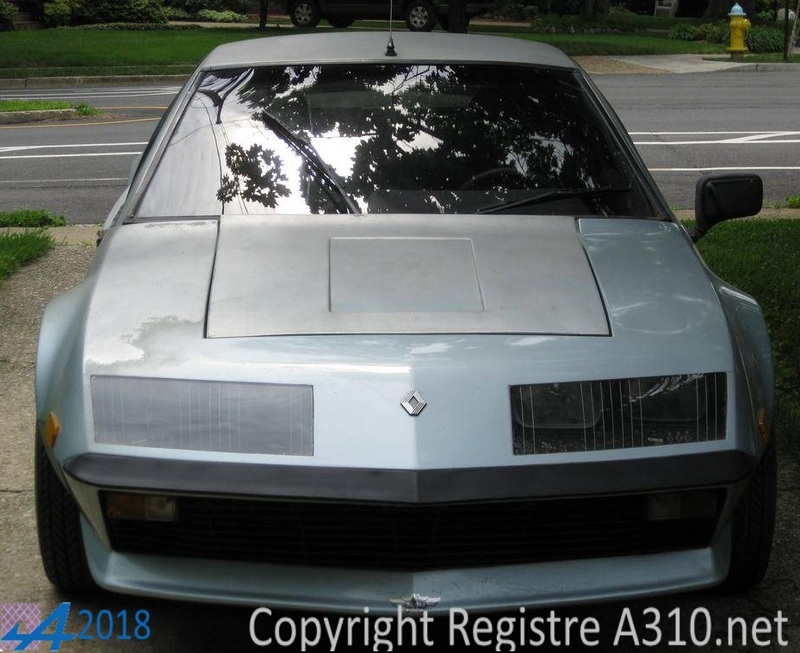 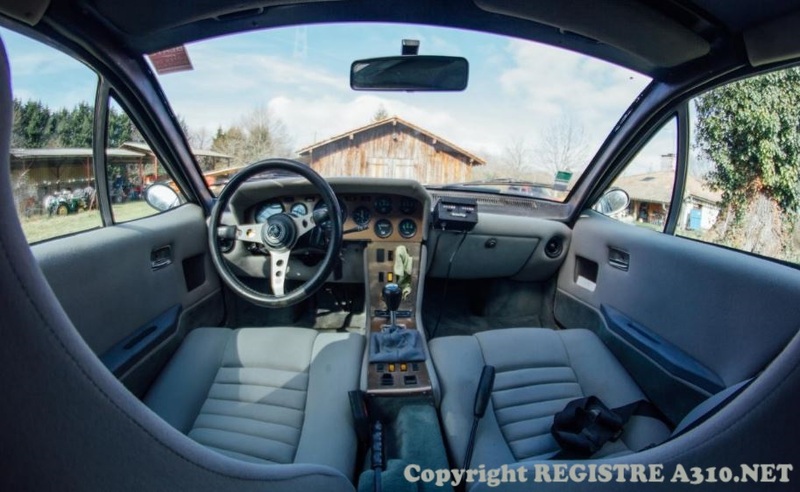 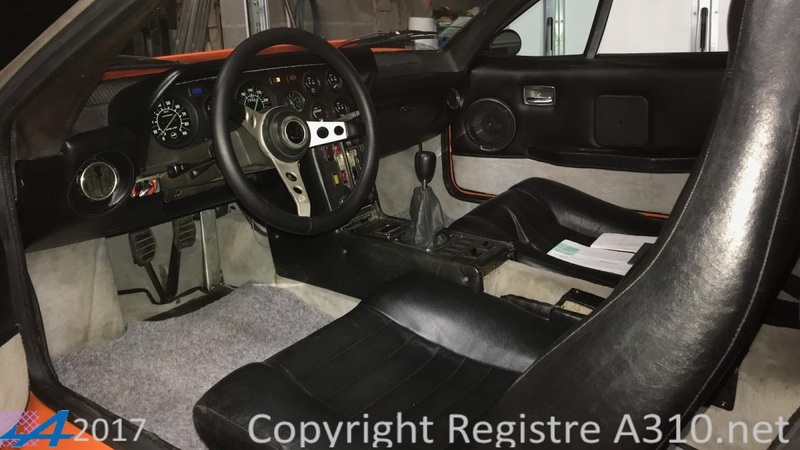 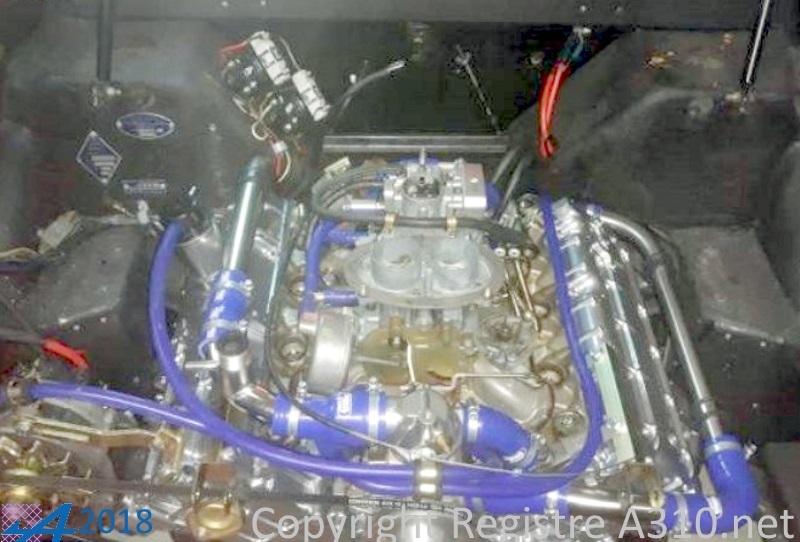 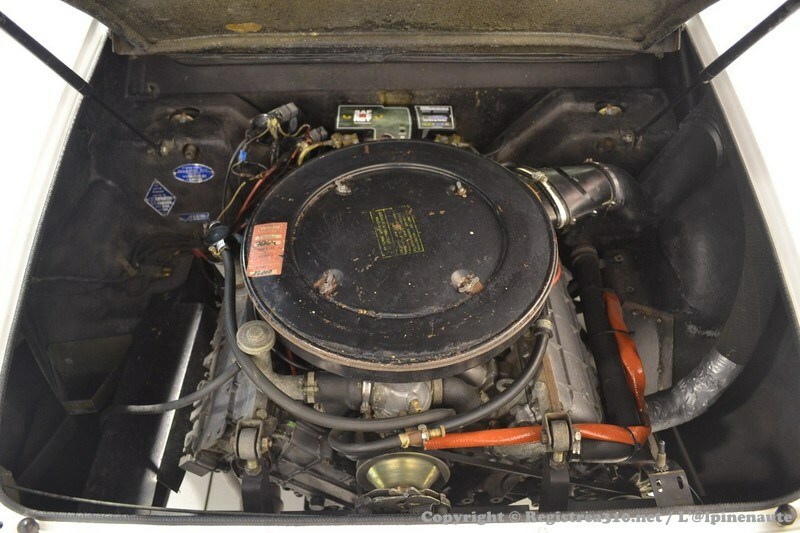 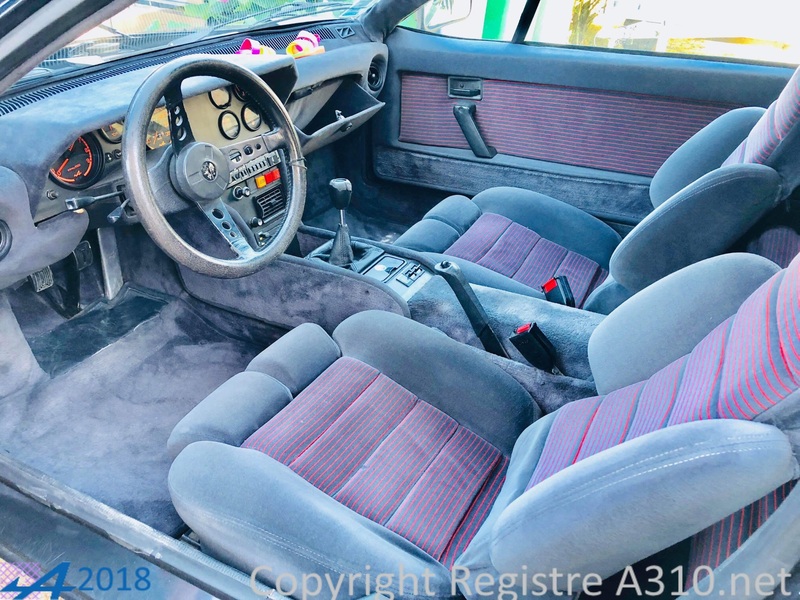 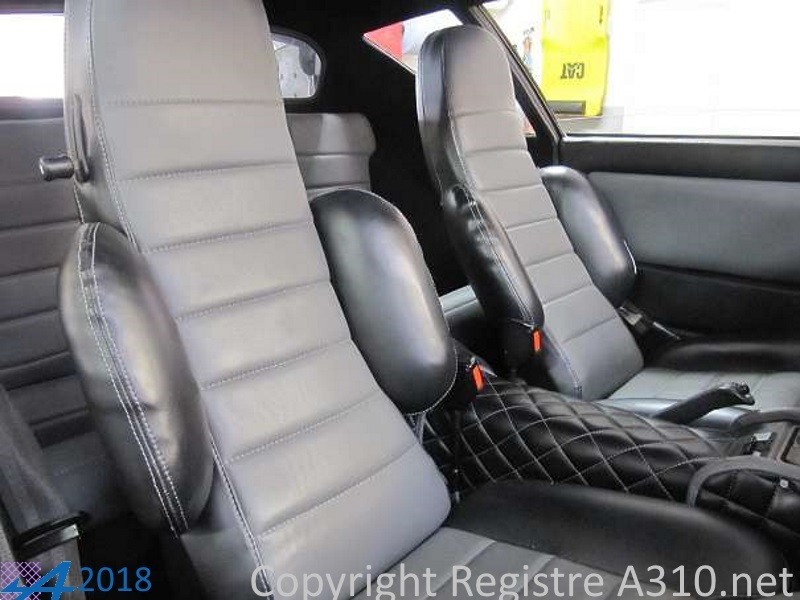 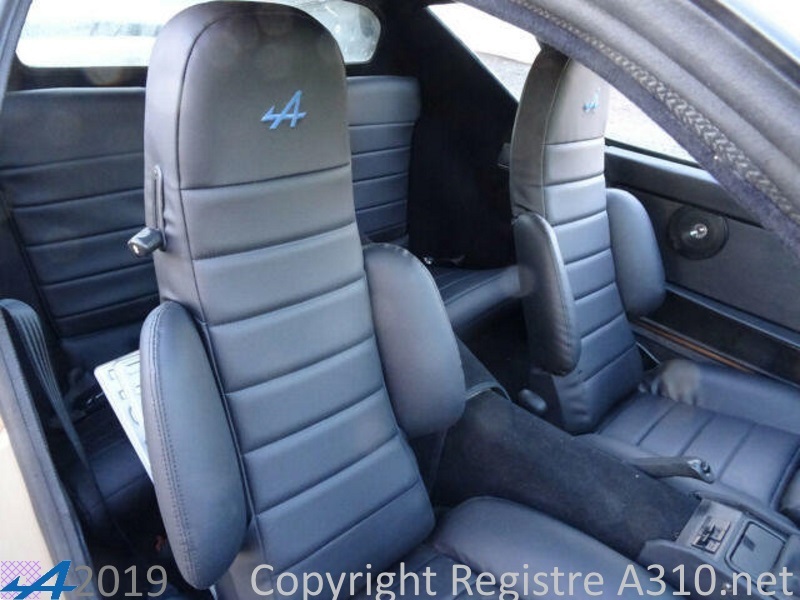 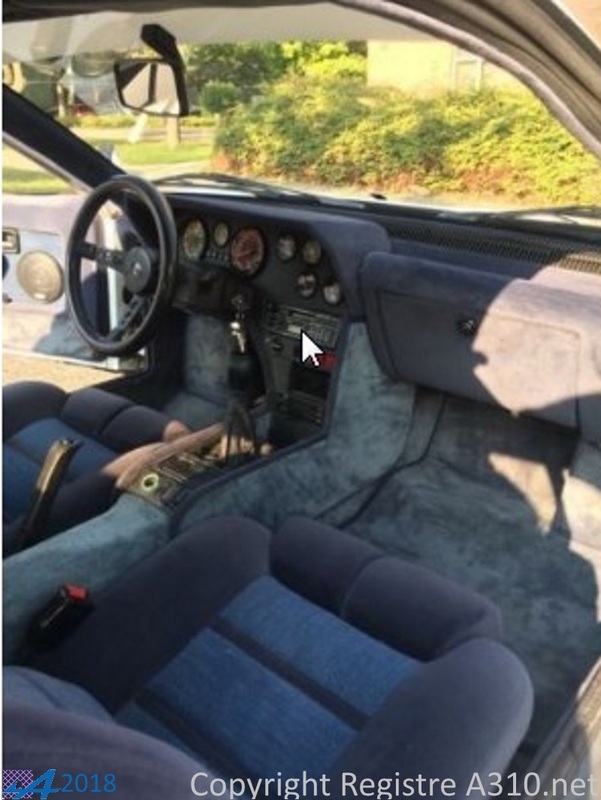 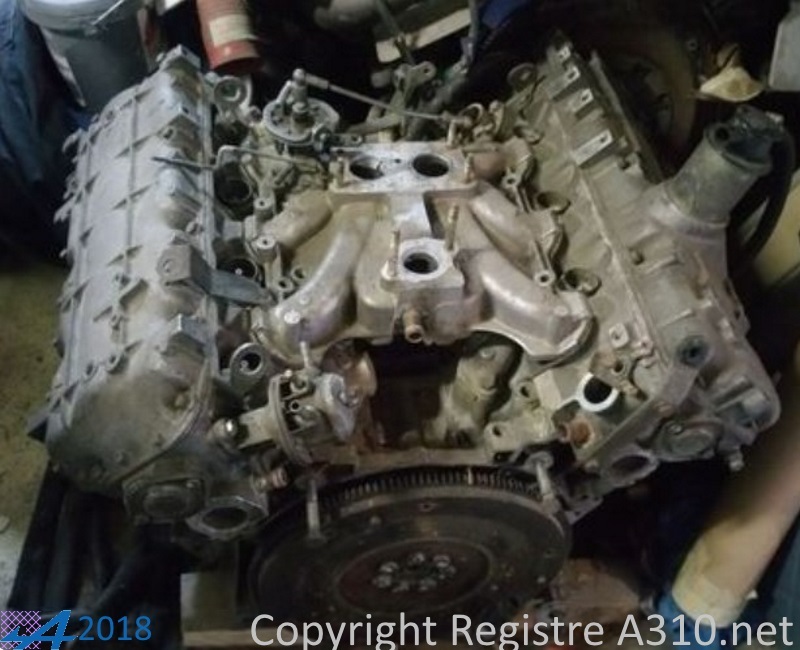 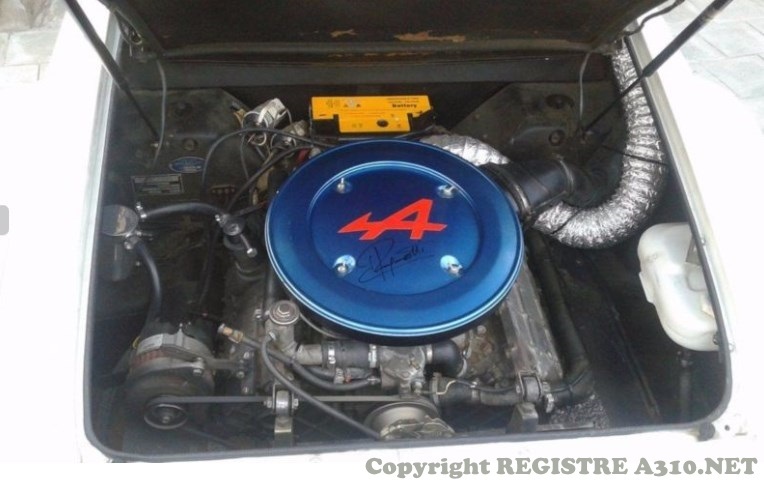 48888 2700VA 21.08.1981 625 Gray galaxie Owner since 1993 Rims PLS le mans, engine 2.8 injection, 3-in-1 manifold, stainless steel engine compartment panels, devil exhaust pipe, aviation brake hoses. 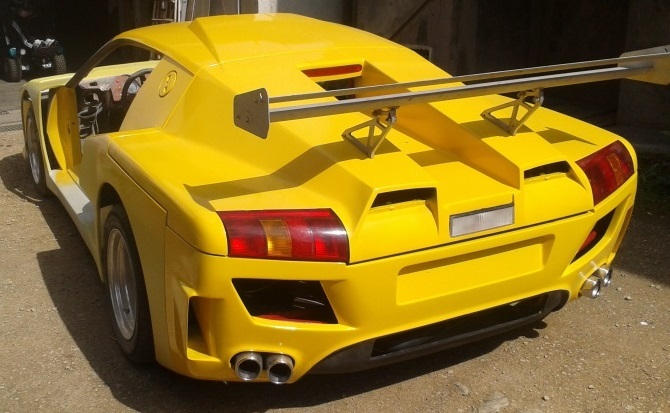 49776 2700VA ??.? 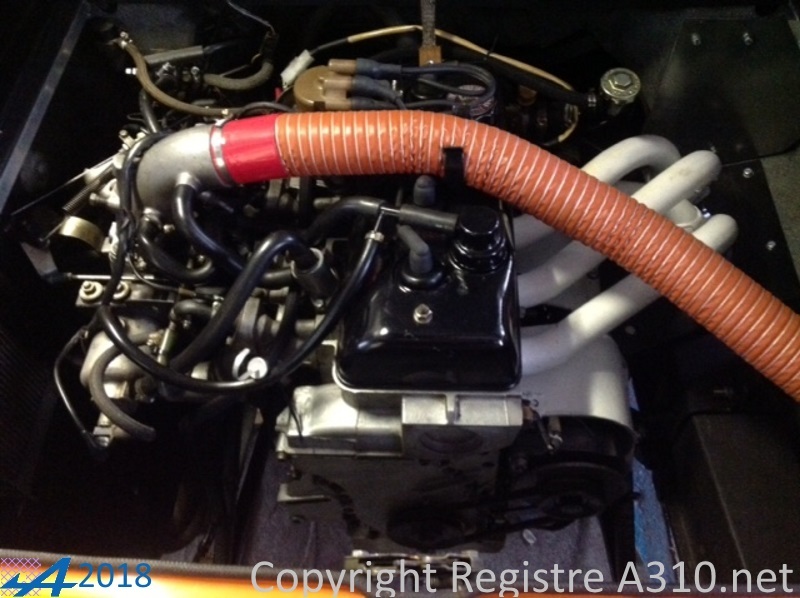 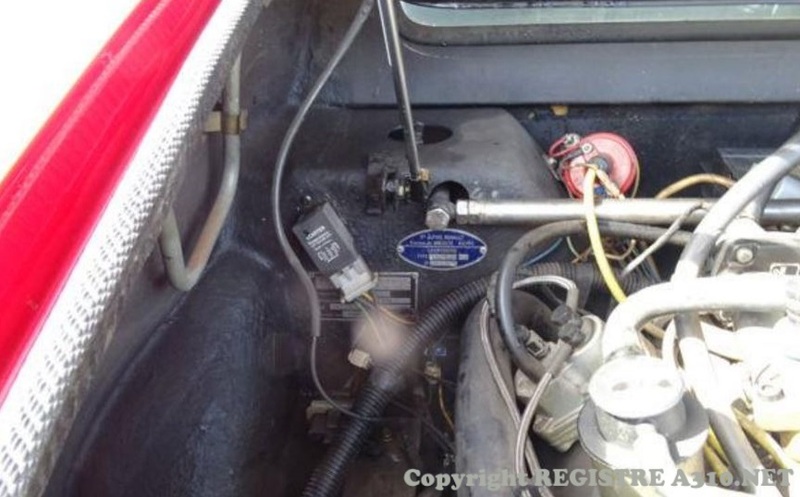 ?.1982 Silver Restored 1995 with engine rebuild and repaint to Renault Kangoo metallic green. 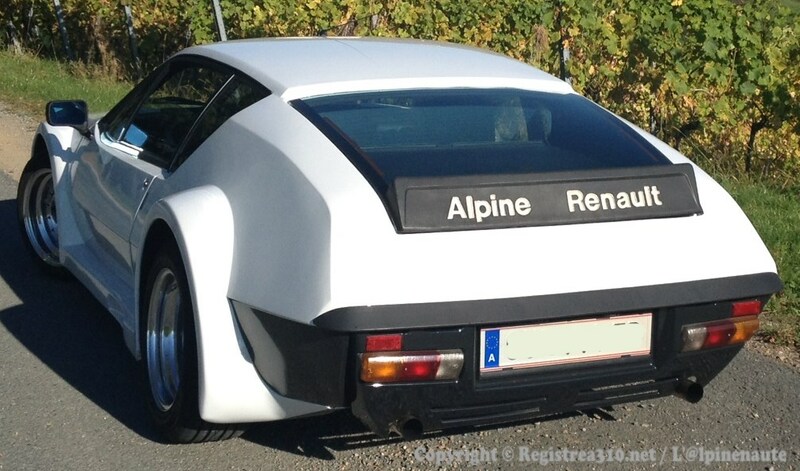 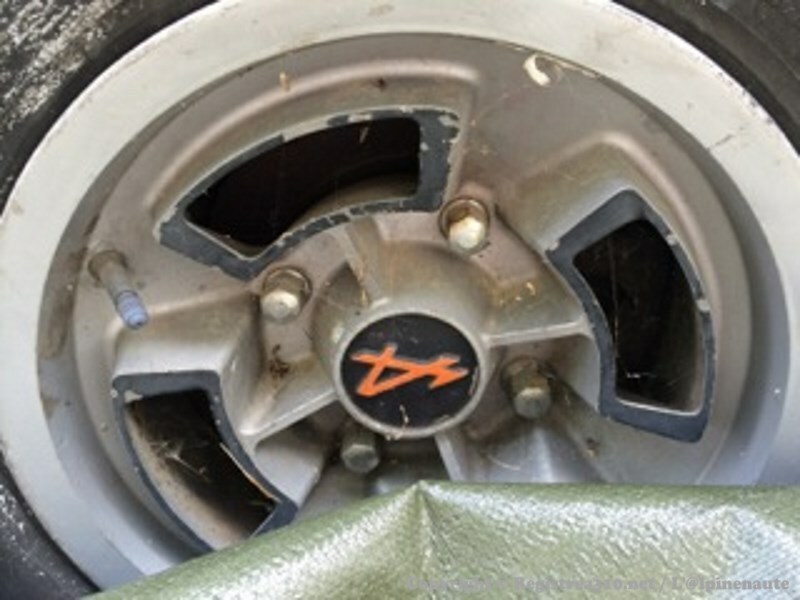 Original Fleischmann/Alpine wheels (made by Tramont). 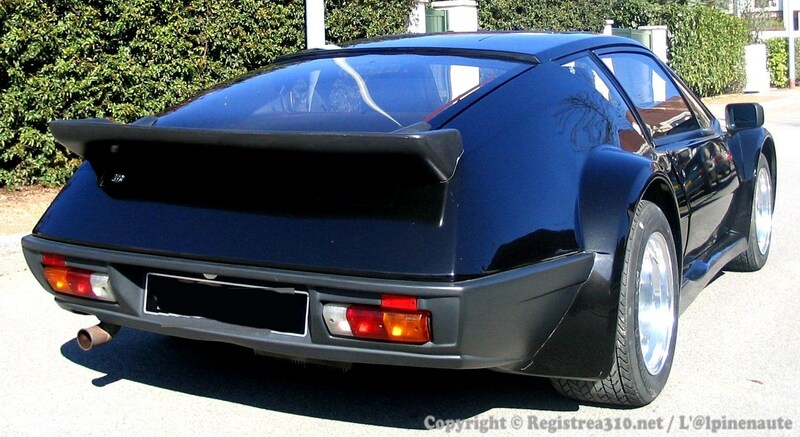 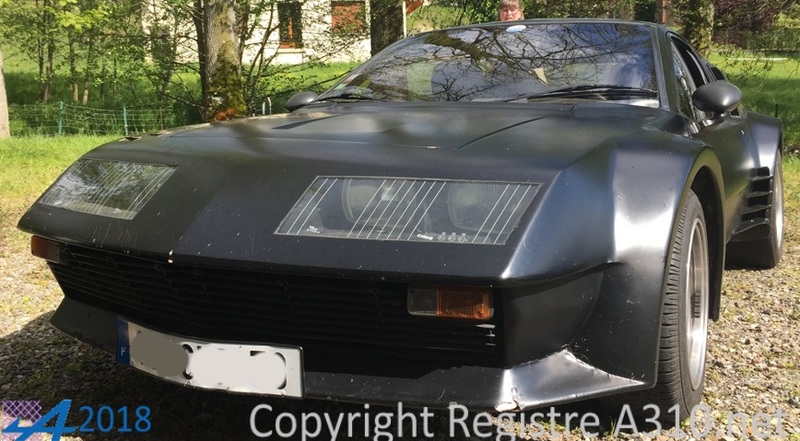 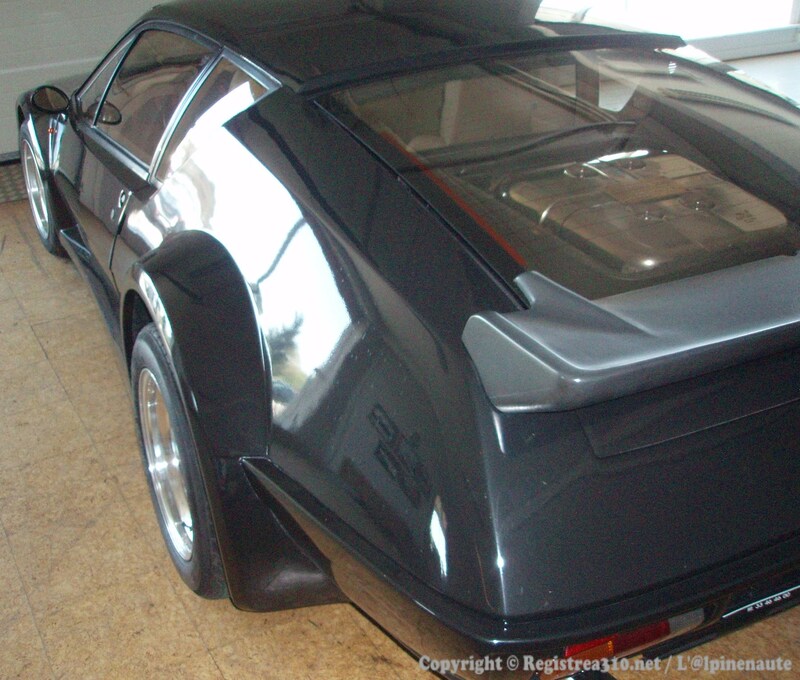 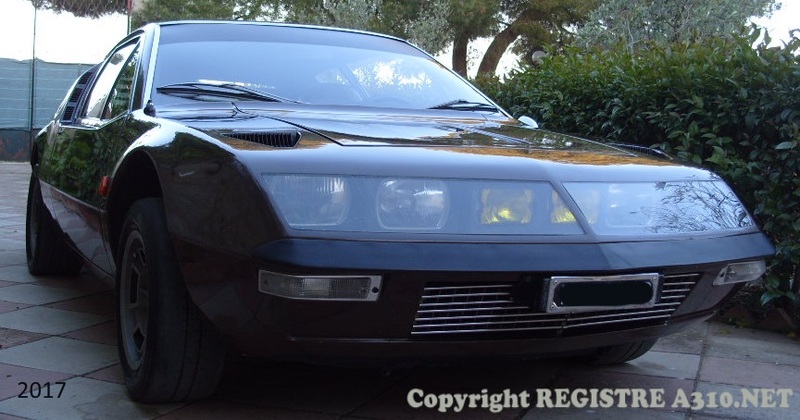 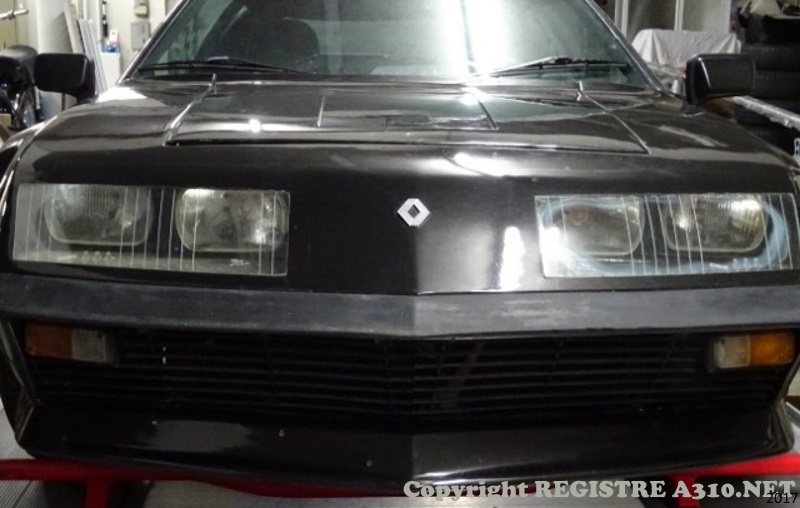 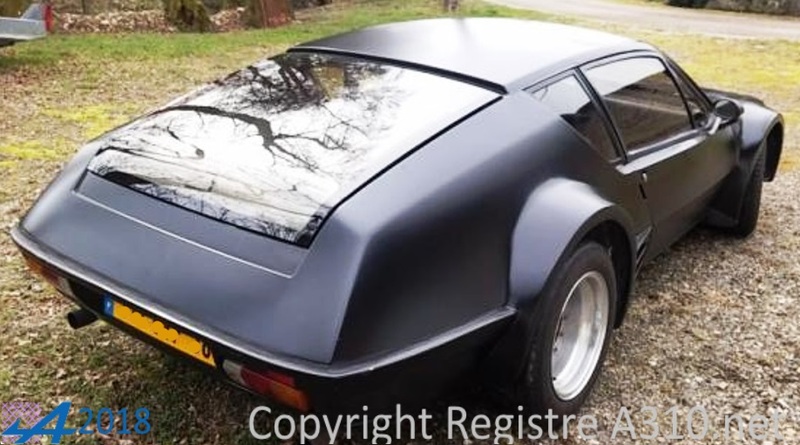 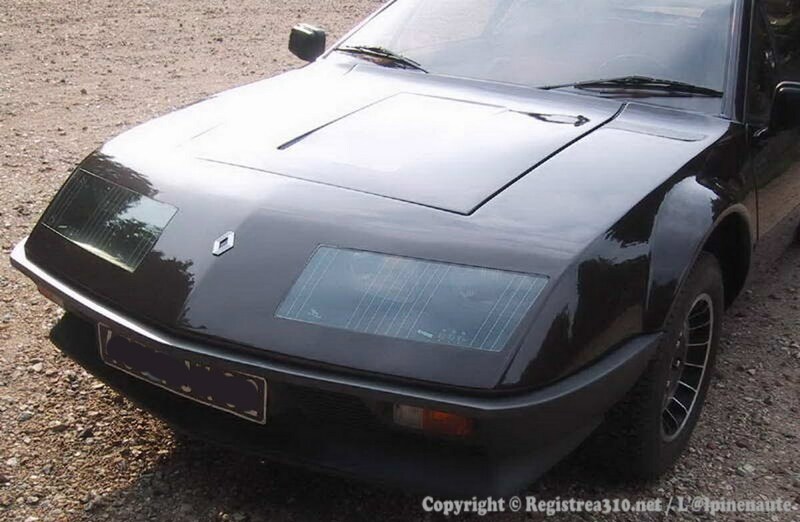 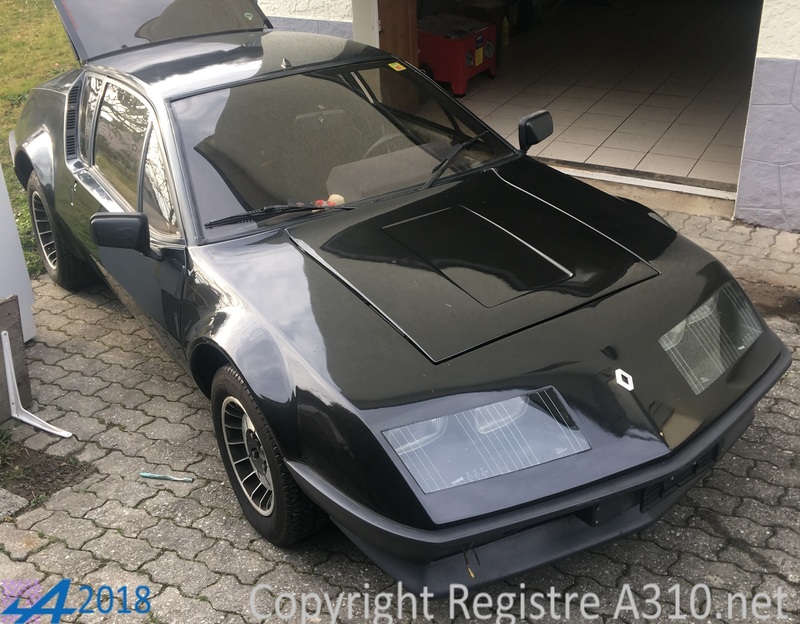 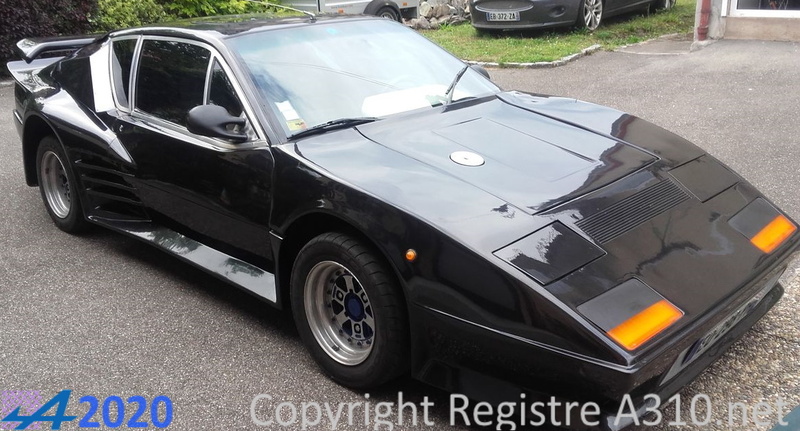 50156 2700VA 02.11.1982 662 Black irisé 2th owner. 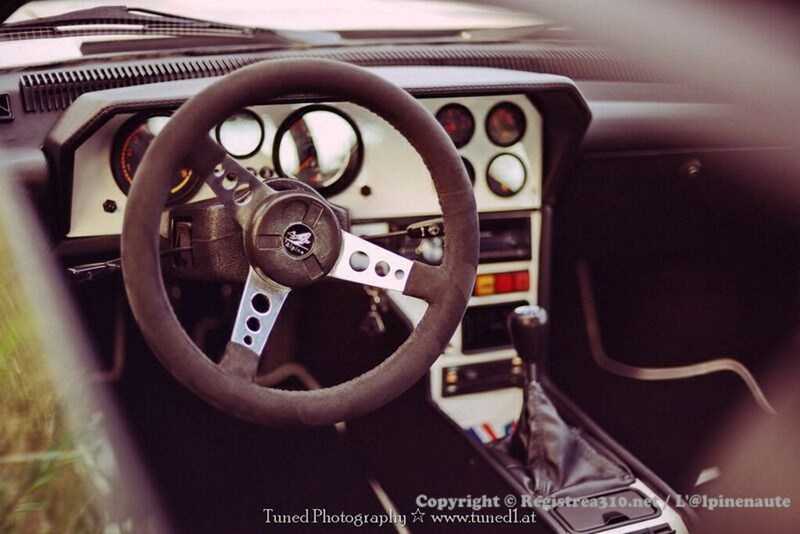 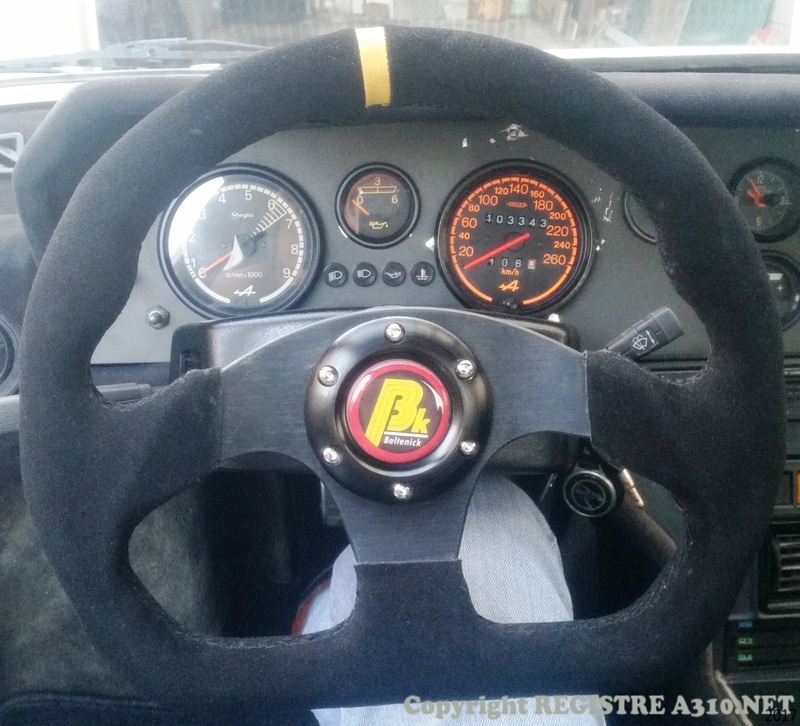 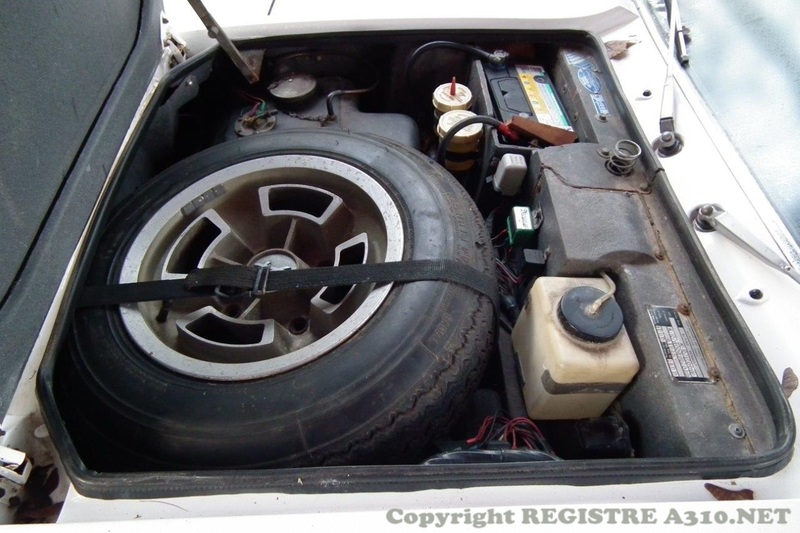 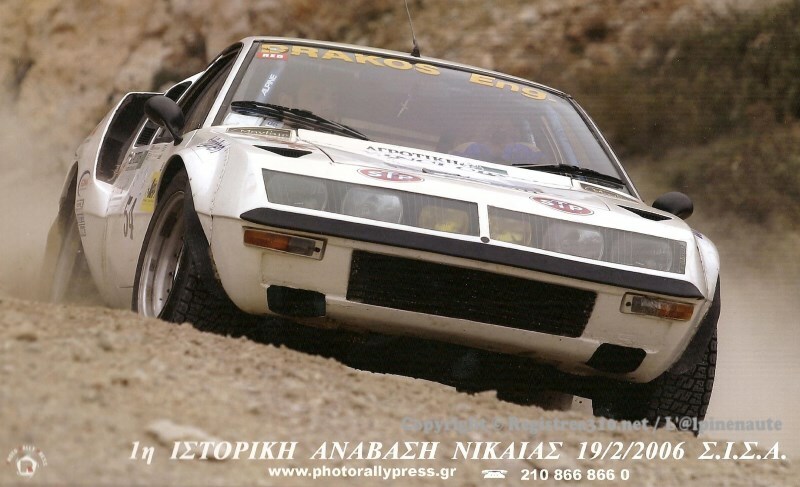 50334 2700VA 09.12.1982 white nacré Pack GT factory. 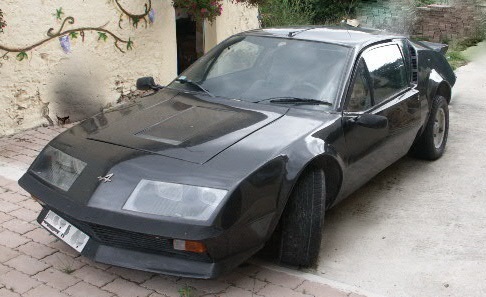 Owner since December 2010. 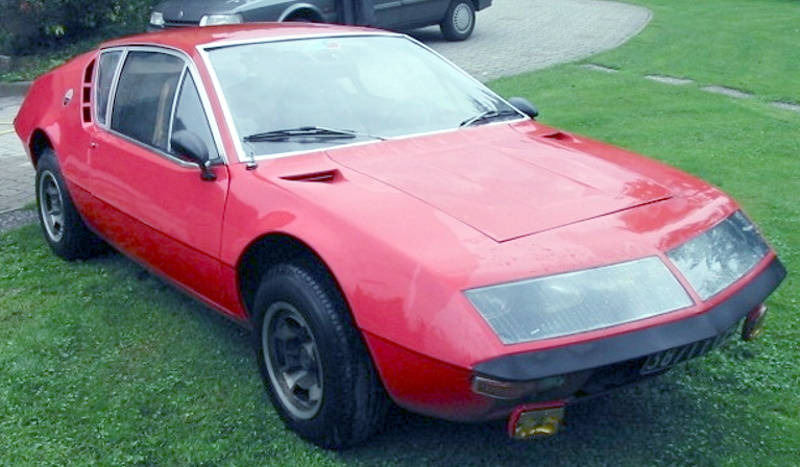 Current color red. 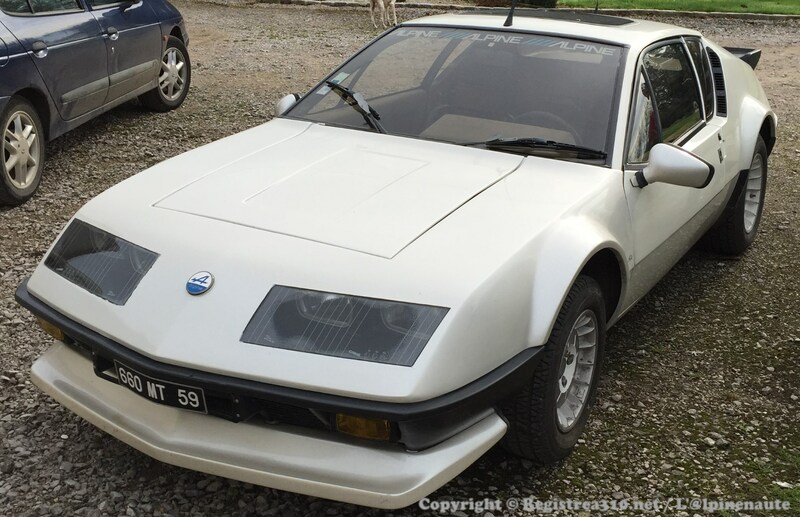 50685 2700VAA 07.03.1983 White Gardenia VERSION PACK GRAND TOURISME. 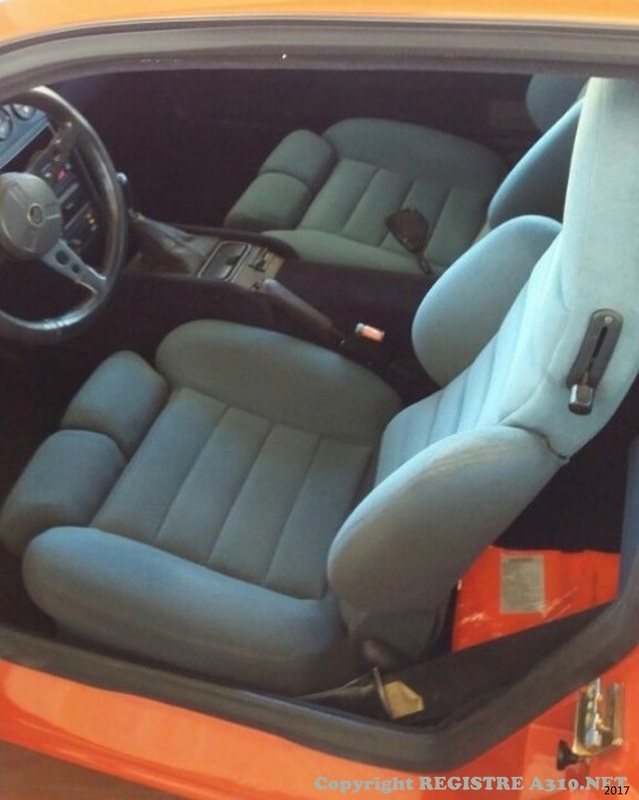 50694 2700VA ??.? 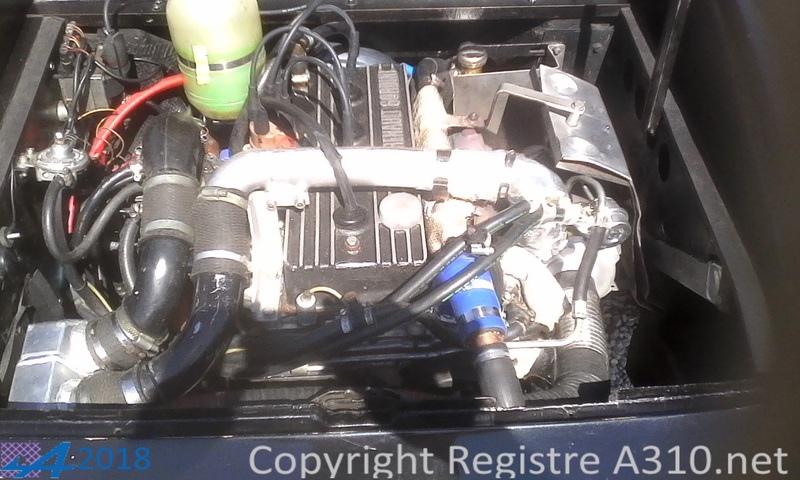 ?.1983 White nacré Restoring in 2014 Paint blue "électrique"
Modifications: Piston Mahle, Camshafts, Carburettor 2x Triple Weaver. 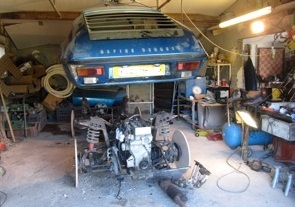 Technology, engine, cables etc everything new or worked up. 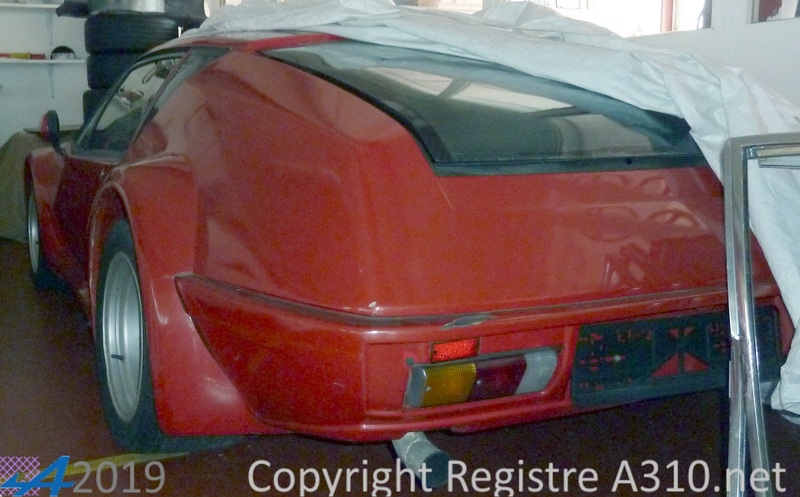 52042 2700VAA 10.05.1983 Red Ongoing restoring (2015). 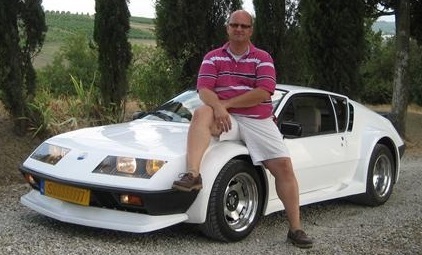 Shut down since 1993. 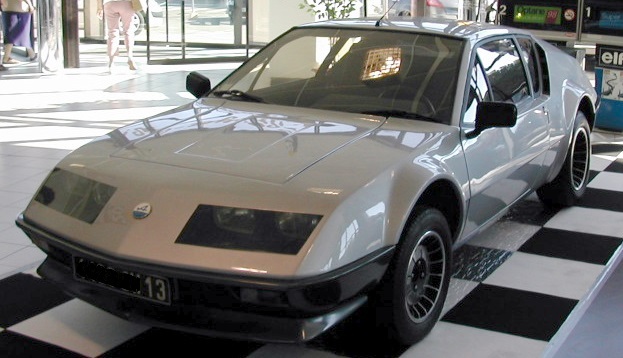 VAE0000316 2700VA 13.04.1984 631 Silver métallisé Was for a few years in Belgium. 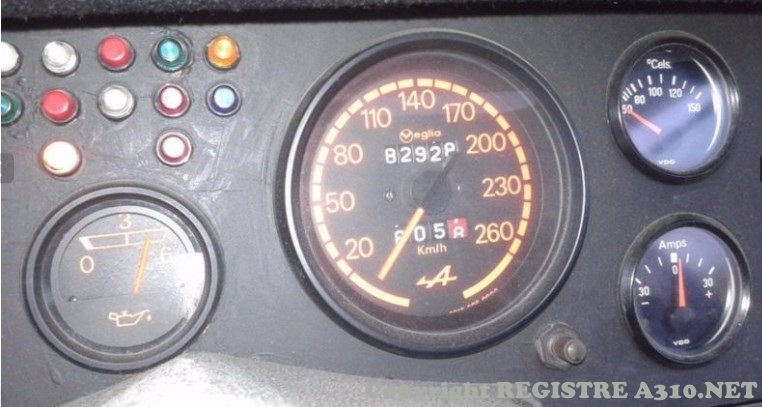 VAE0000577 2700VAA ? 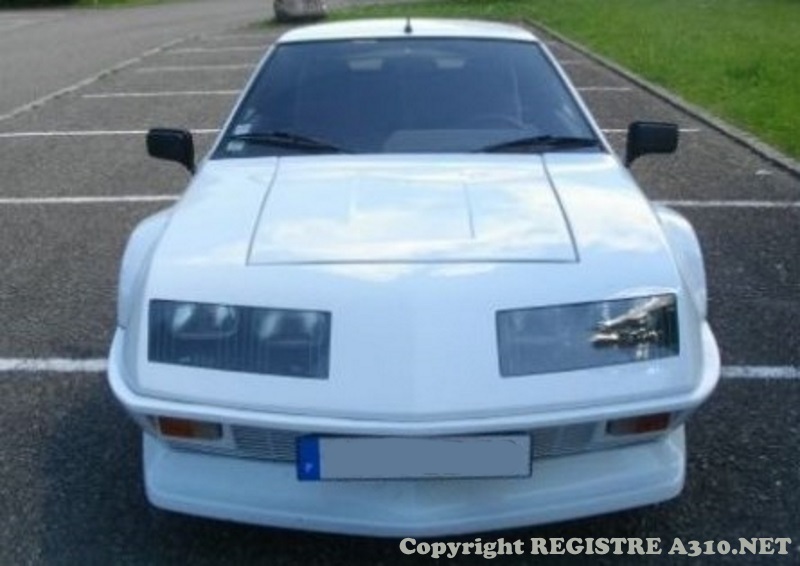 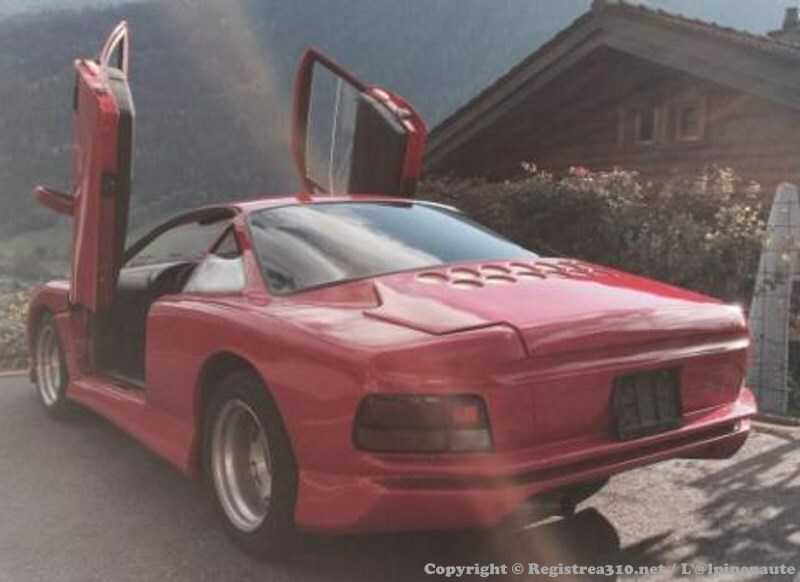 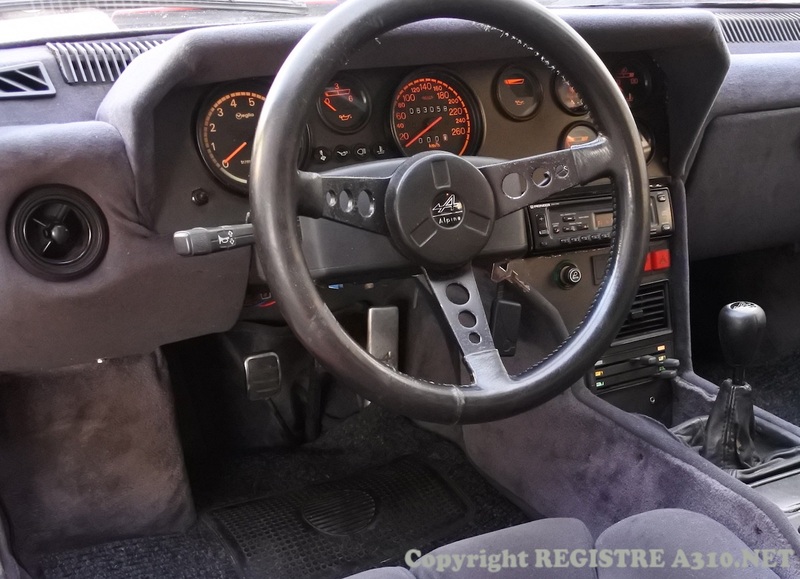 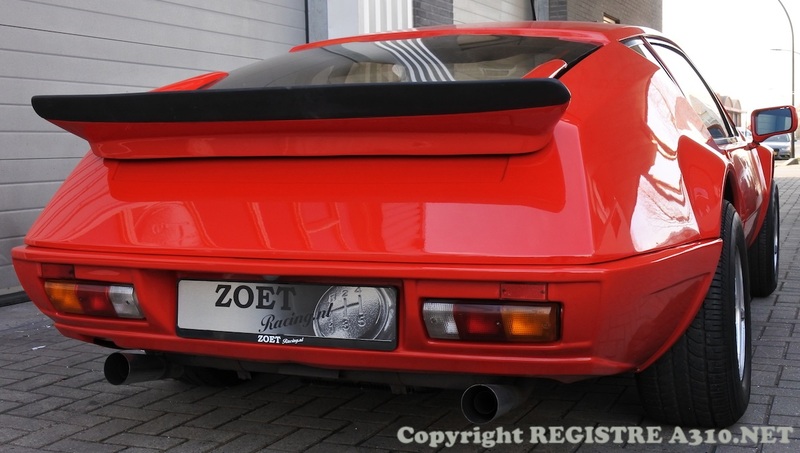 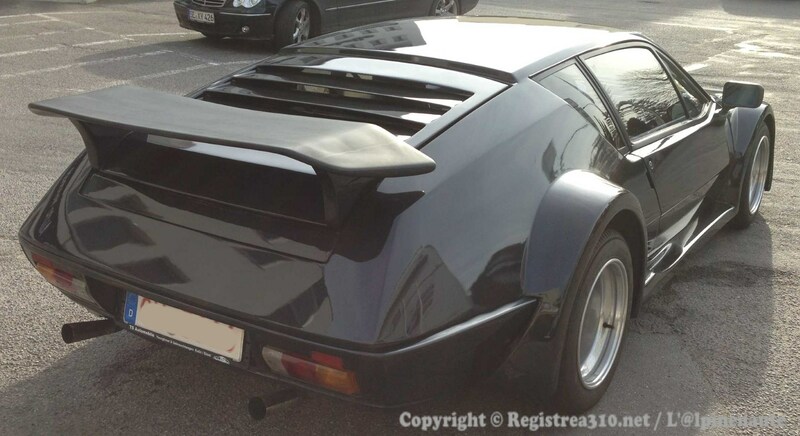 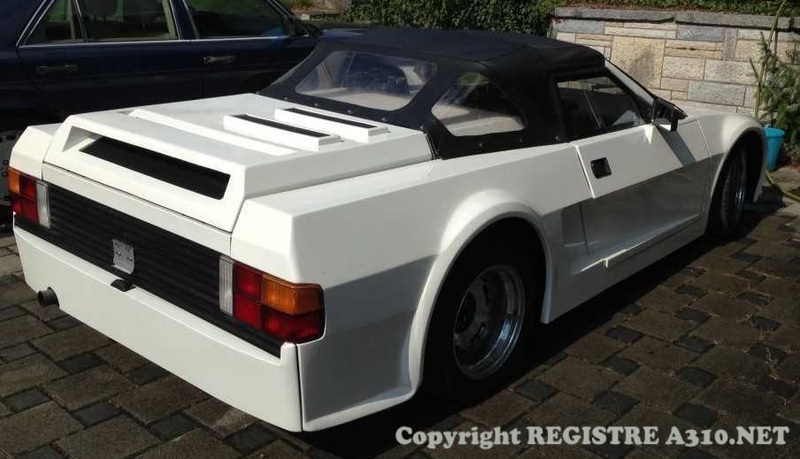 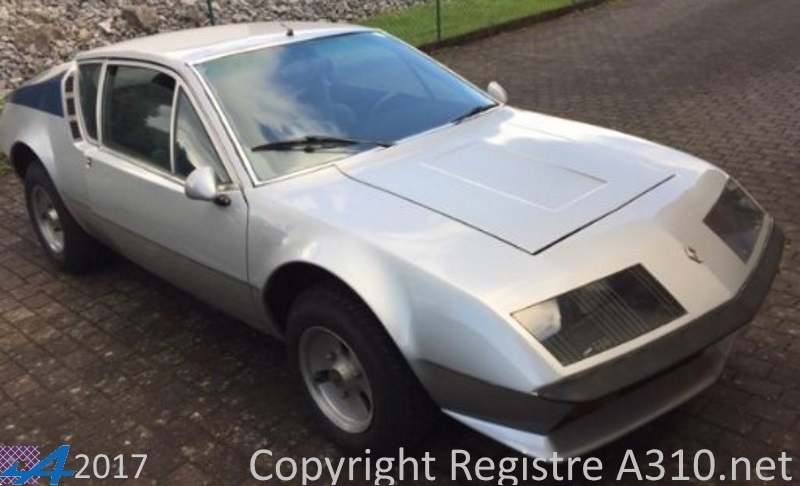 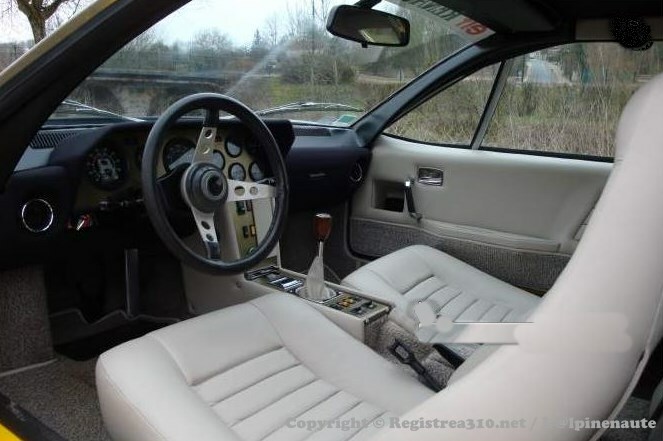 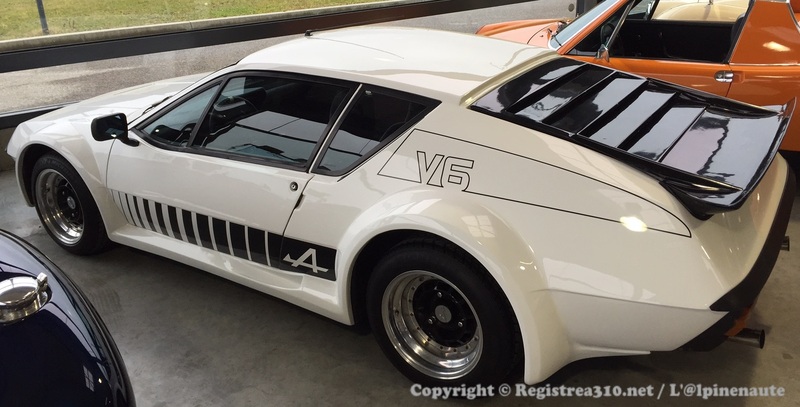 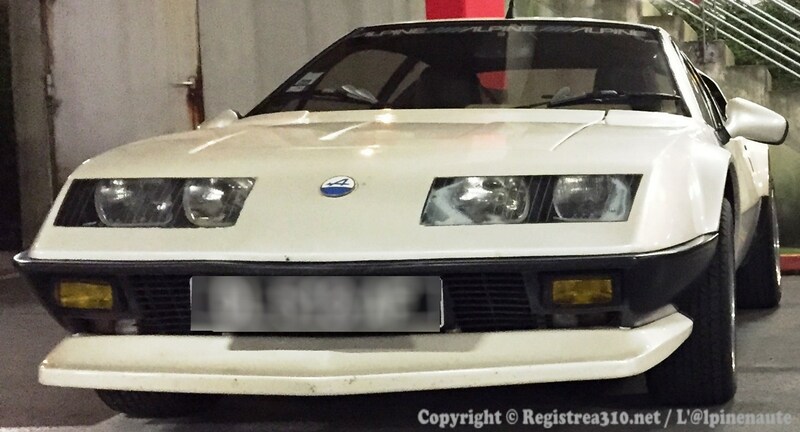 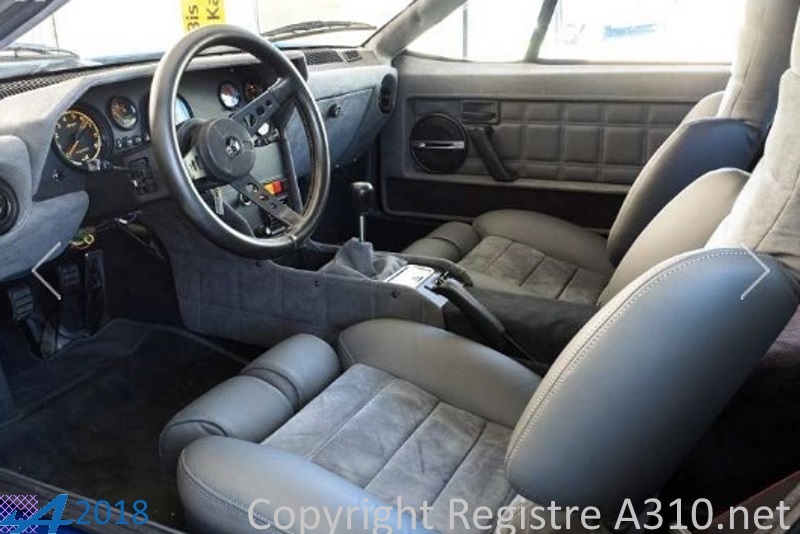 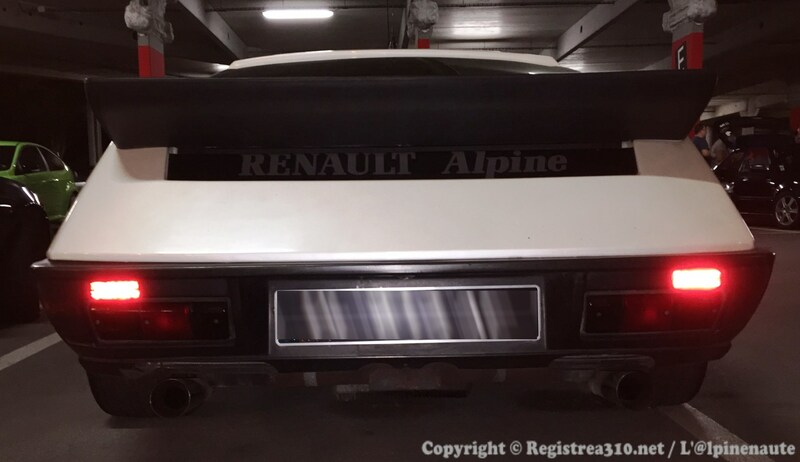 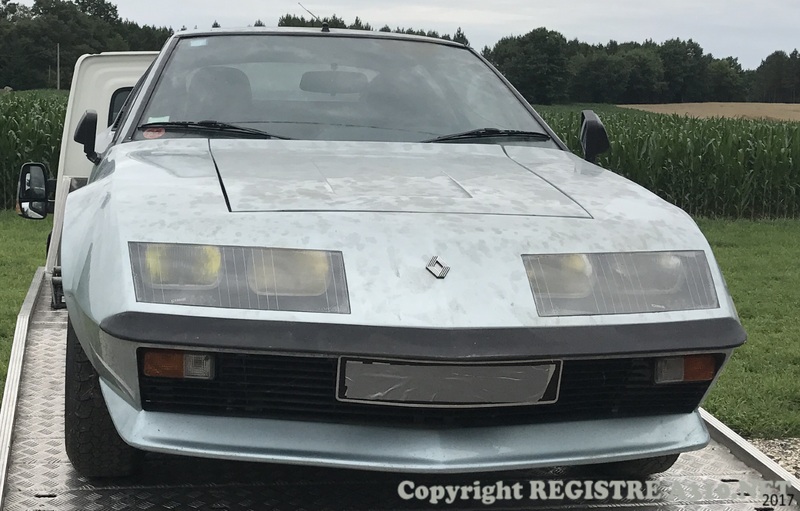 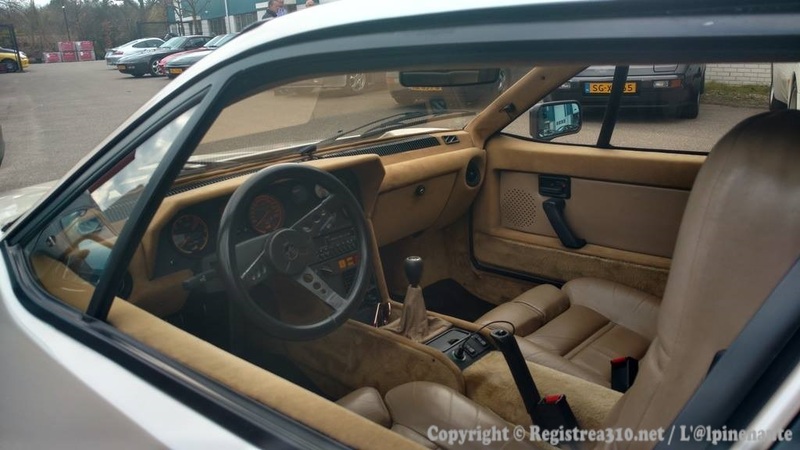 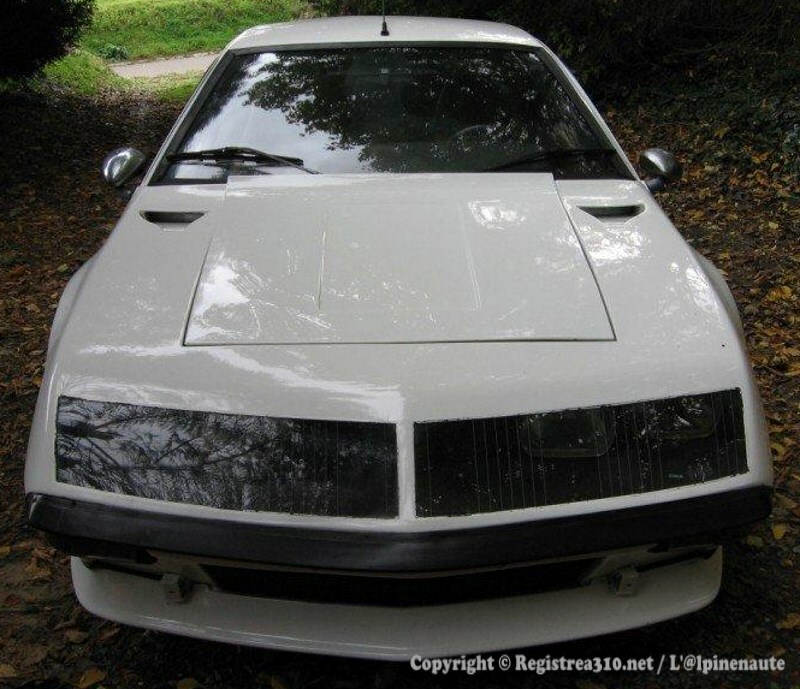 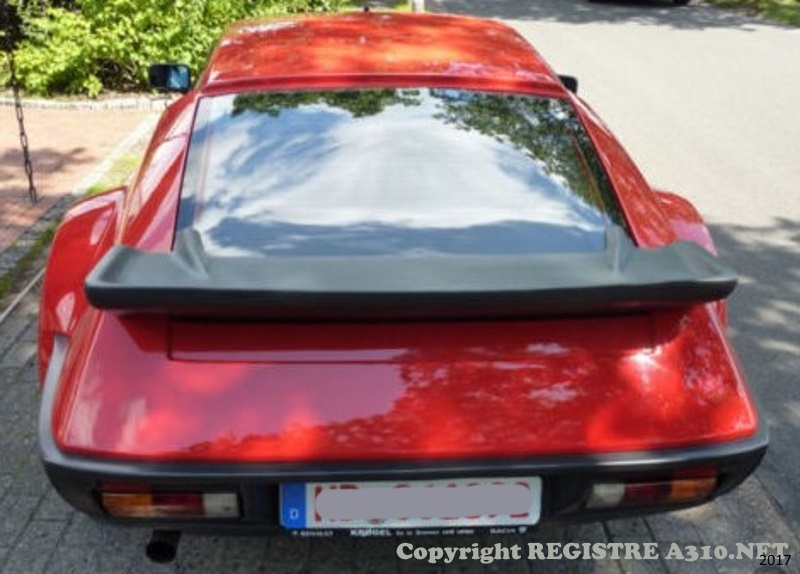 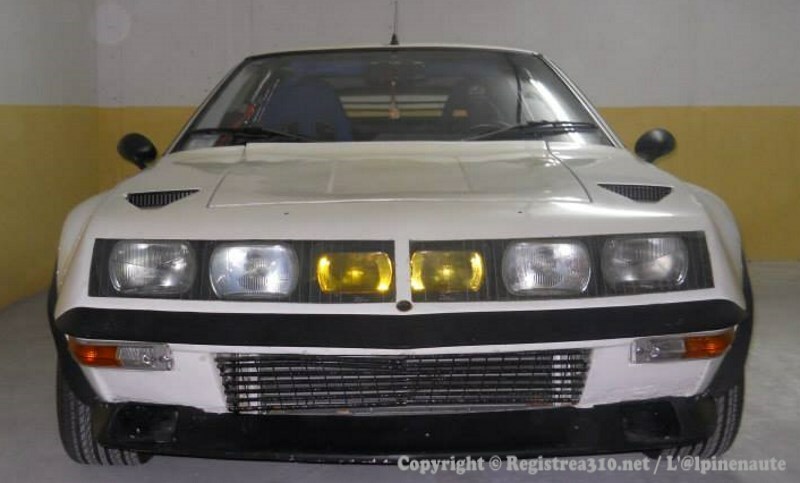 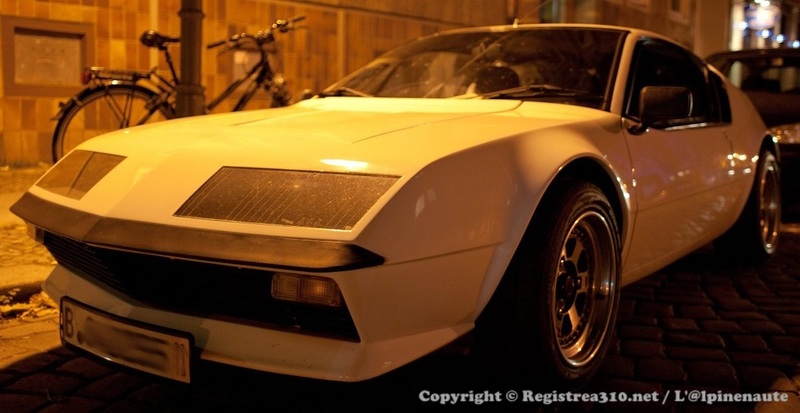 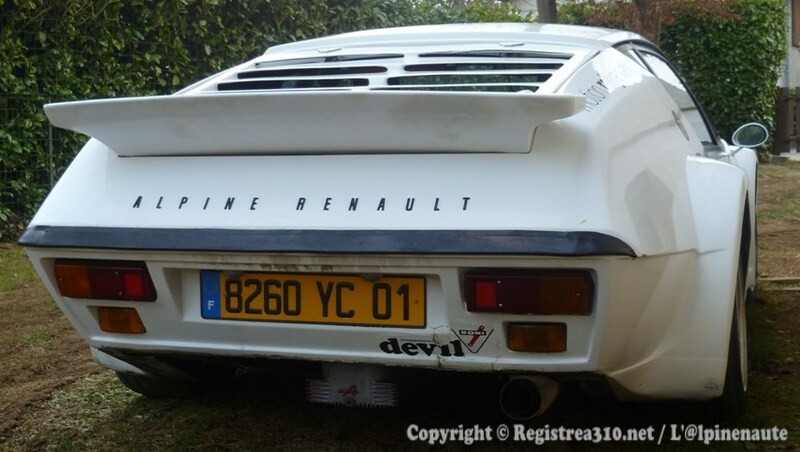 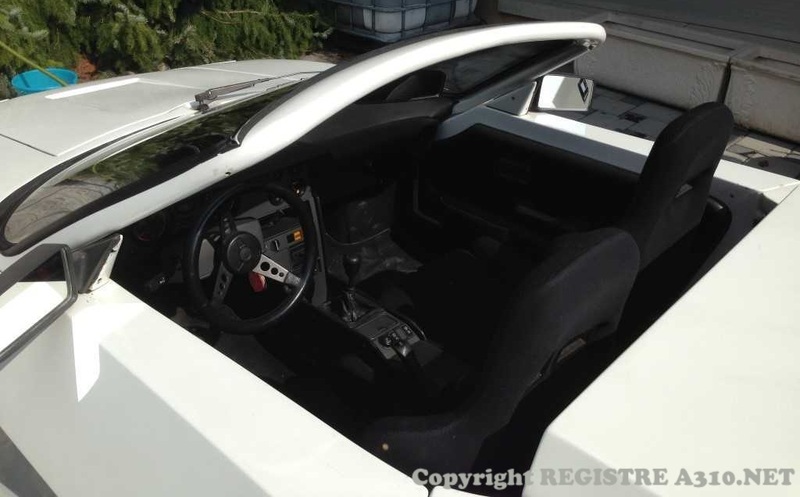 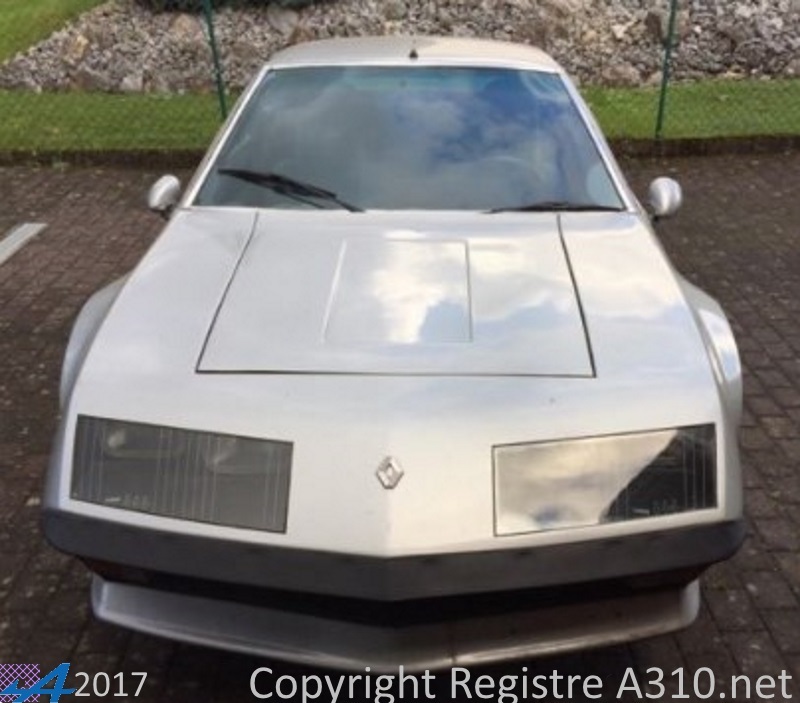 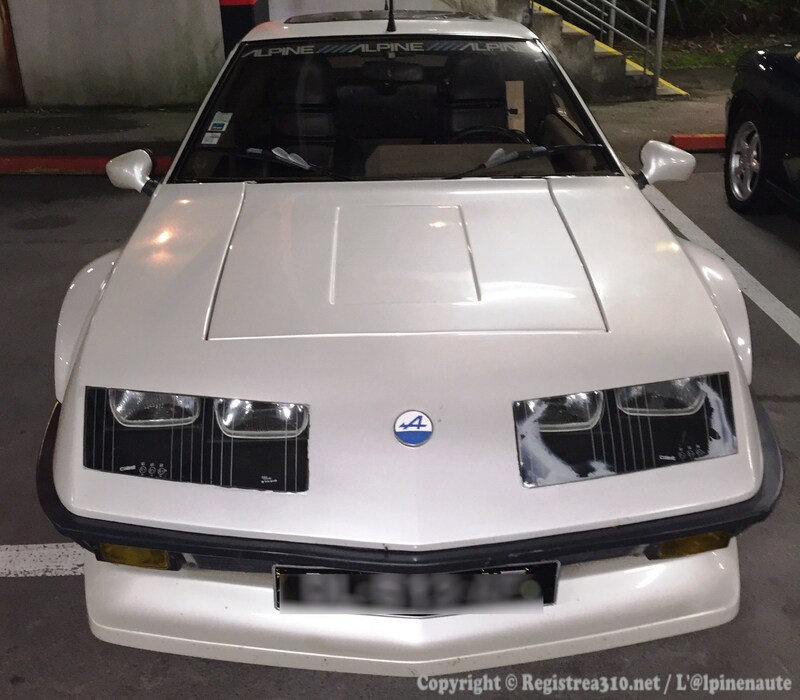 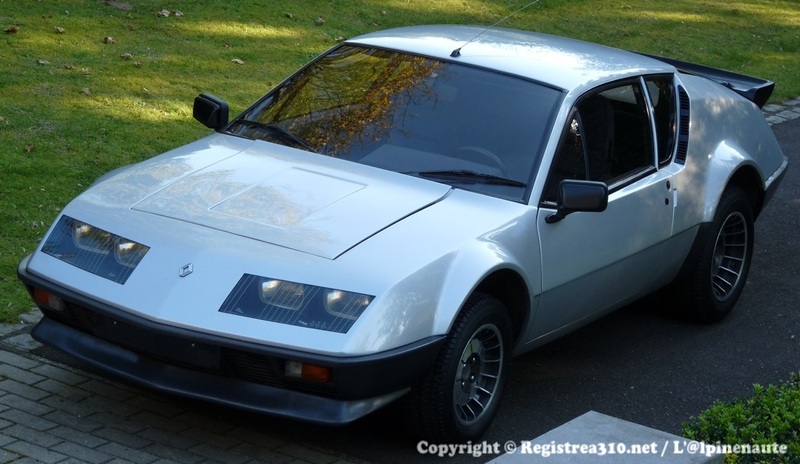 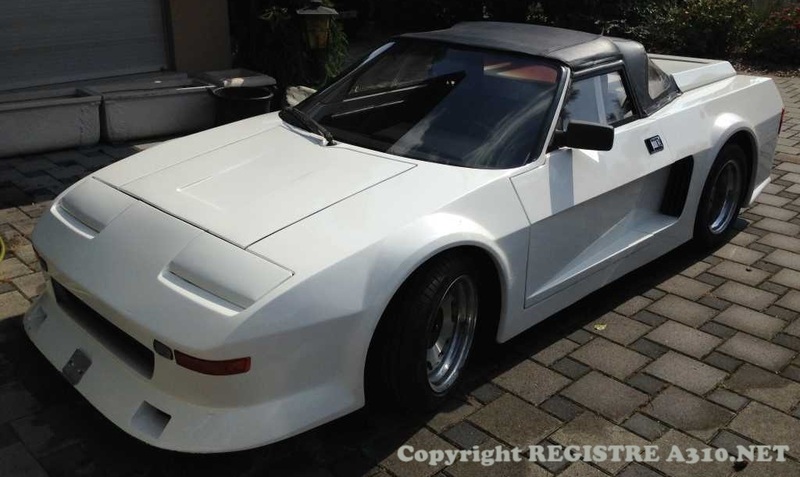 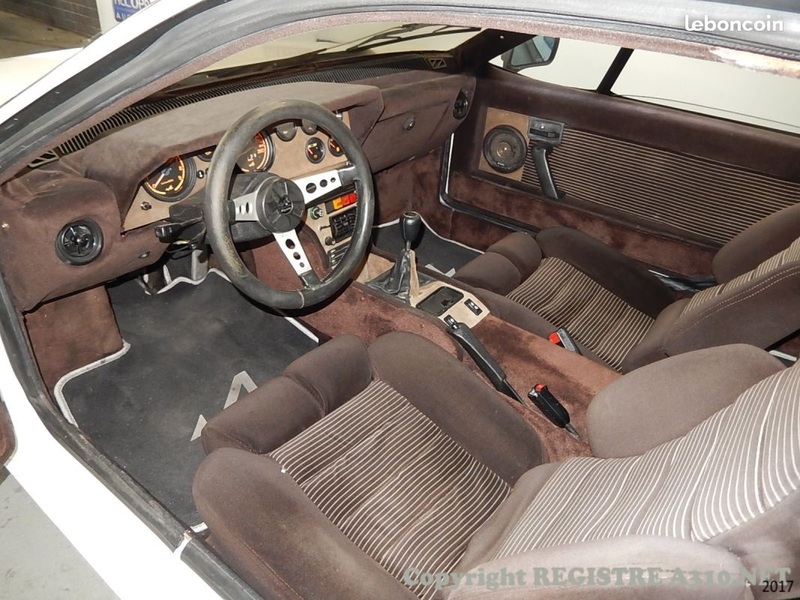 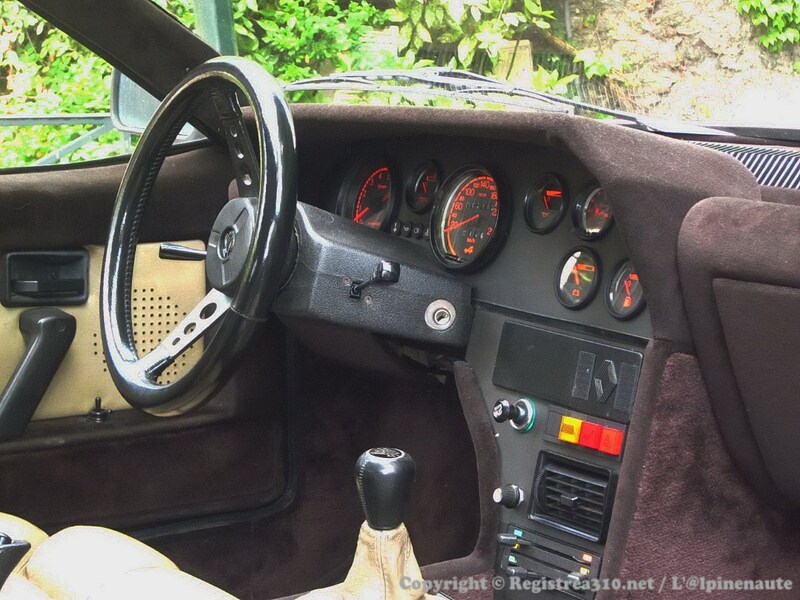 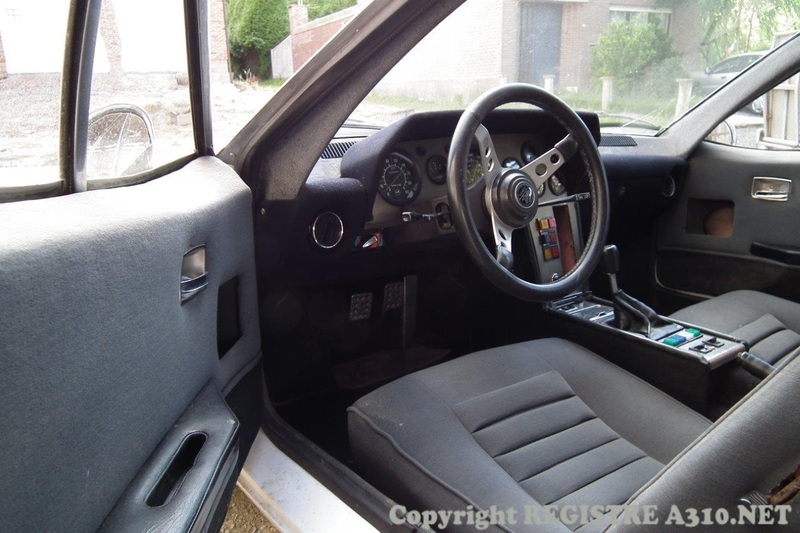 ?.10.1983 White (nacré) certified pack gt certificate Belgian origin. 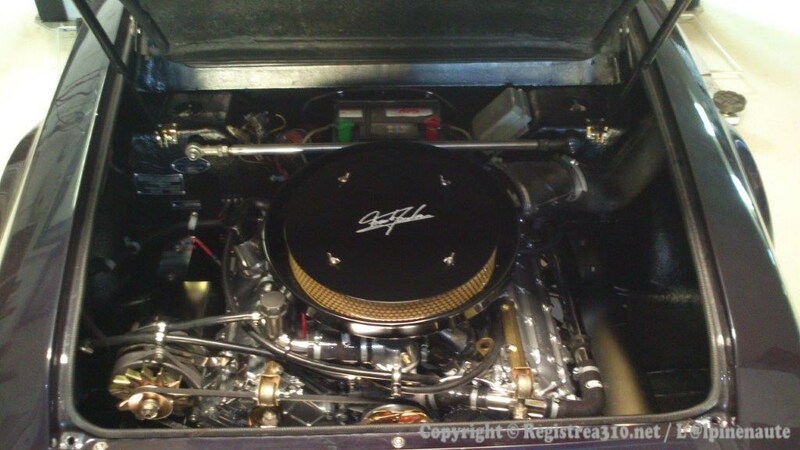 Strictly original stainless steel pot. 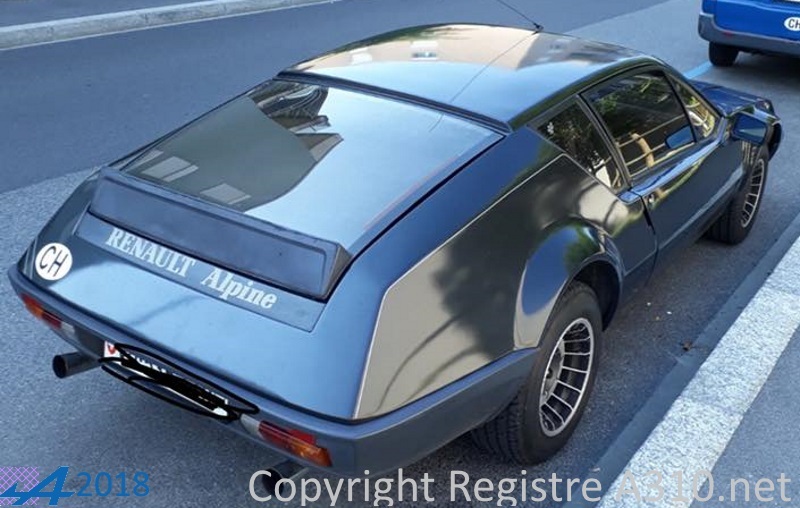 VAE0000731 2700VAA 17.04.1984 631 Silver métallisé Pack GT usine, HRC certified pot Exhaust dual output. 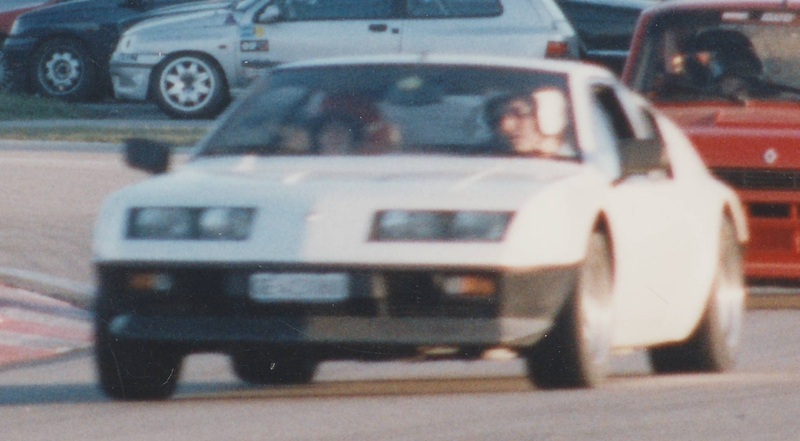 VAE0001075 2700VAA 18.06.1985 White Irisé Pack GT factory. 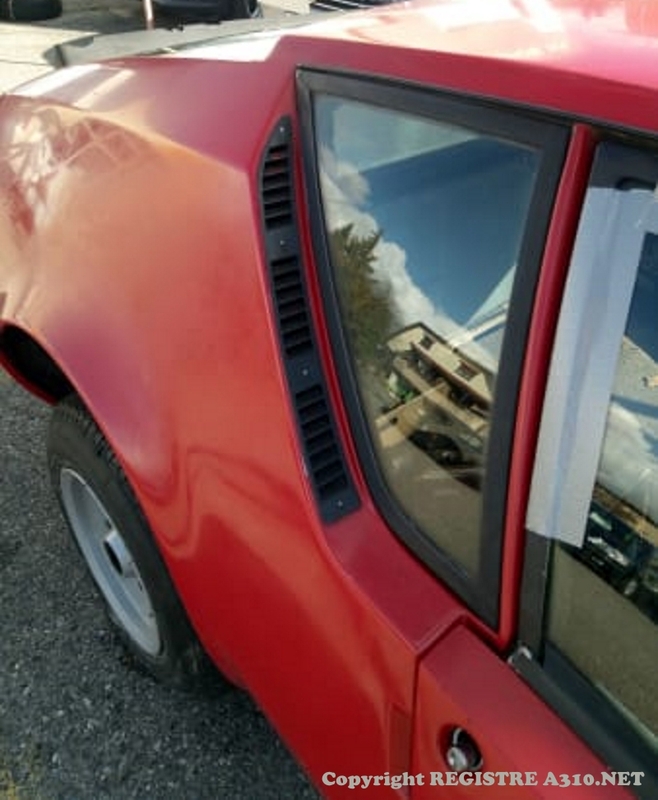 Will be returned in original condition. 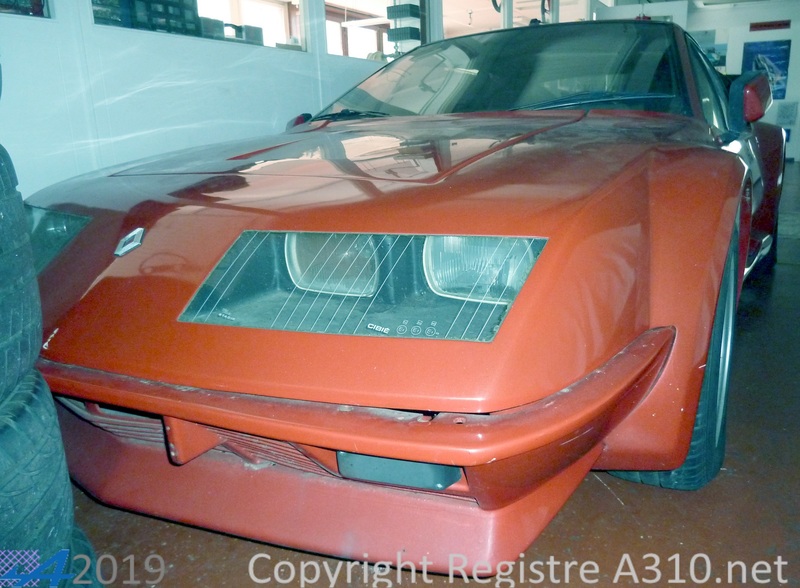 Factory outgoing 31/01/1984. 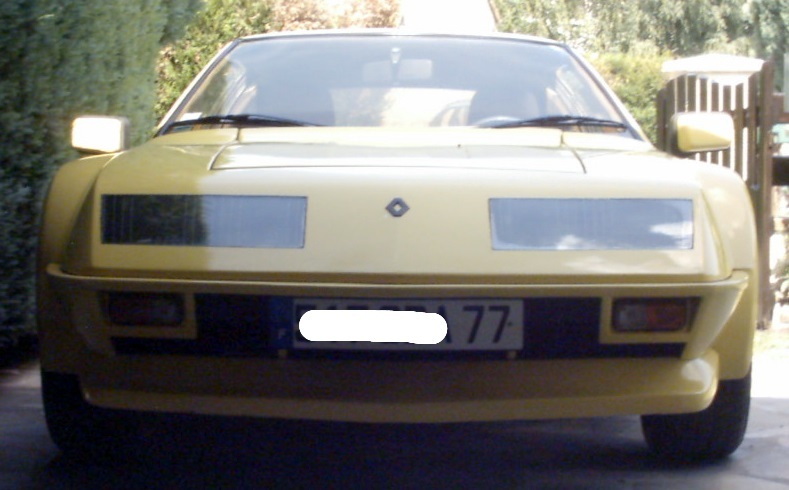 Front bumper. 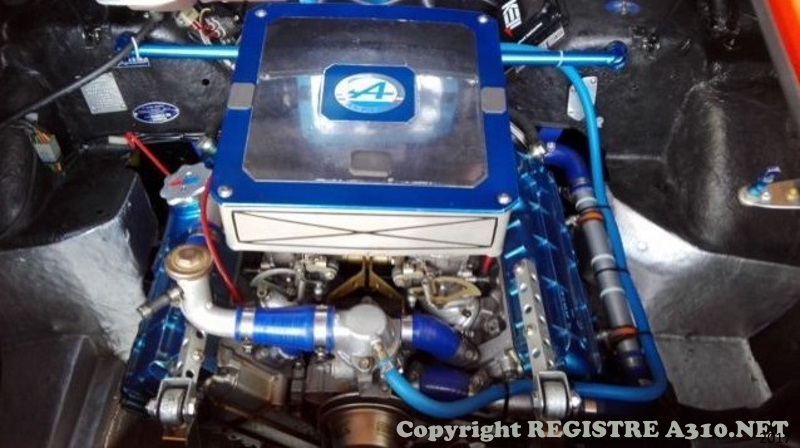 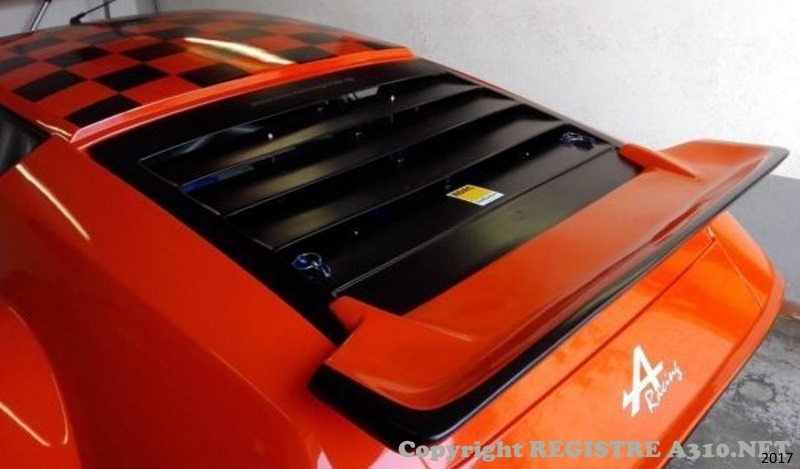 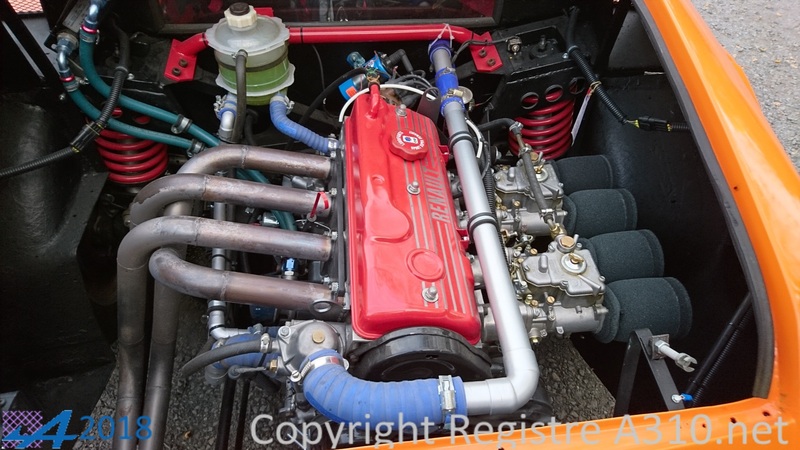 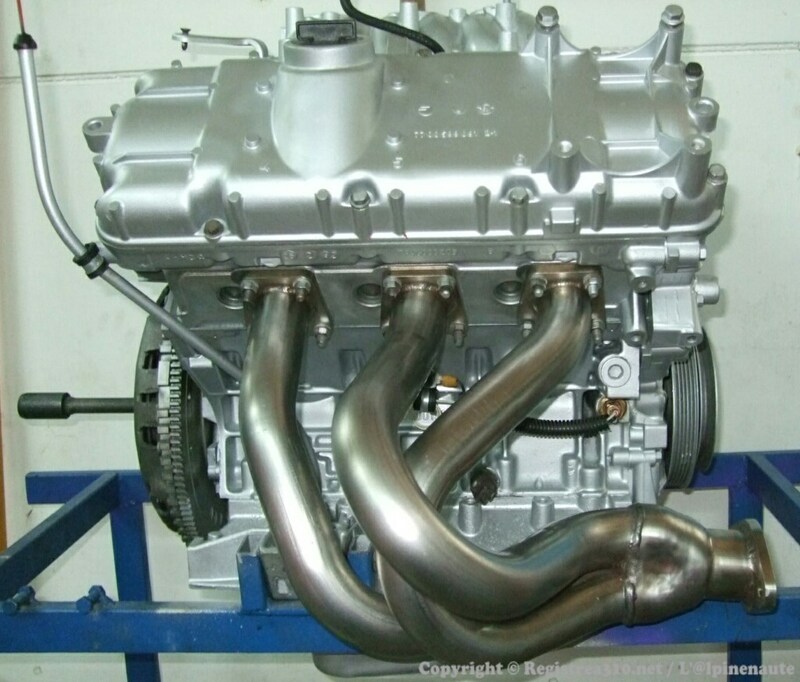 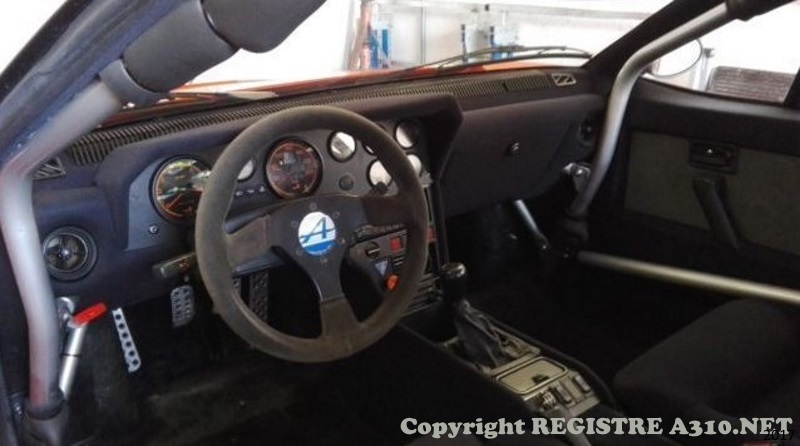 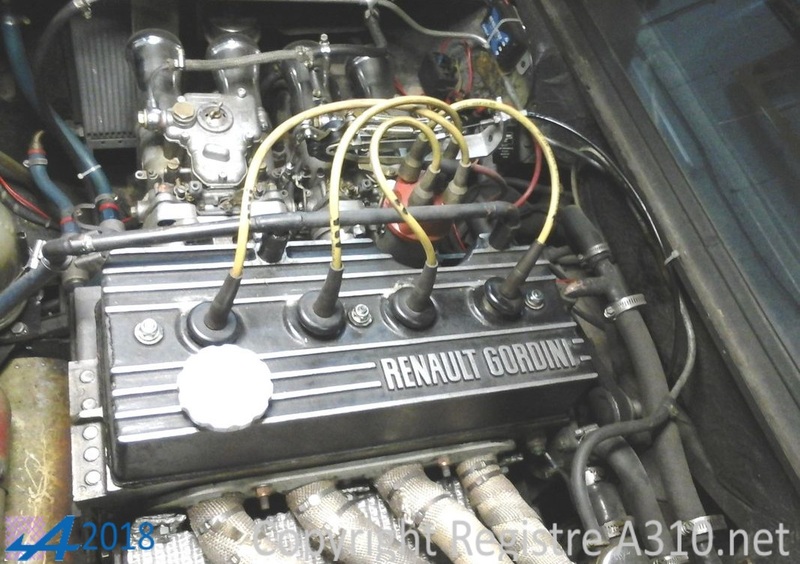 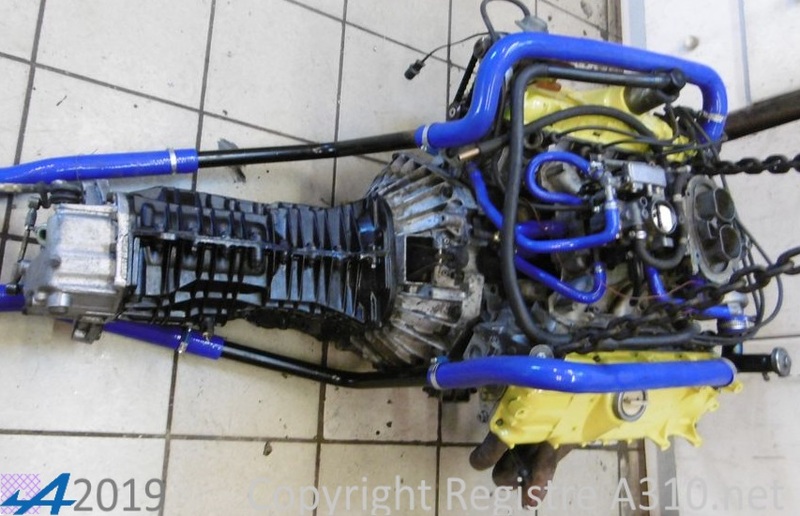 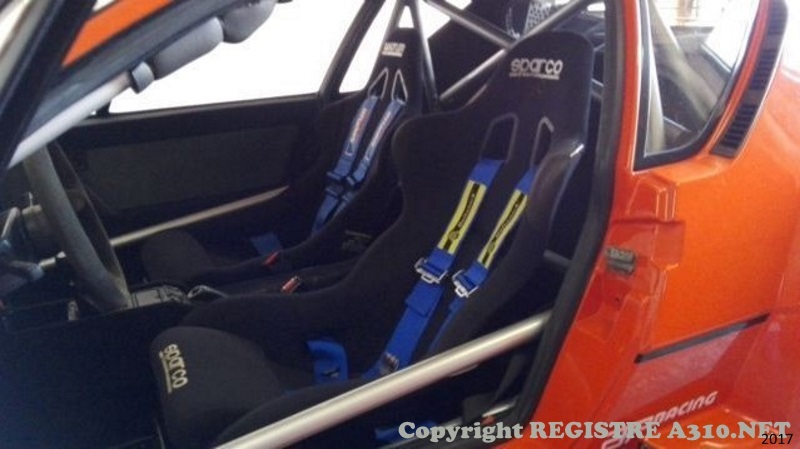 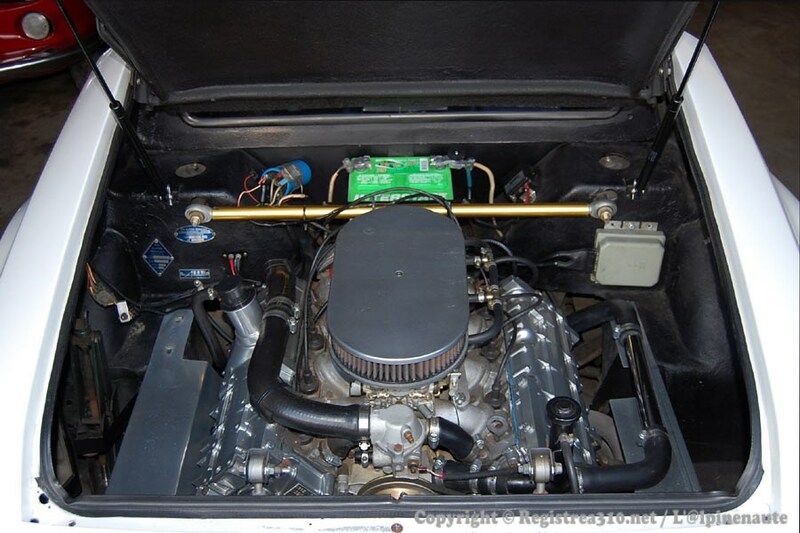 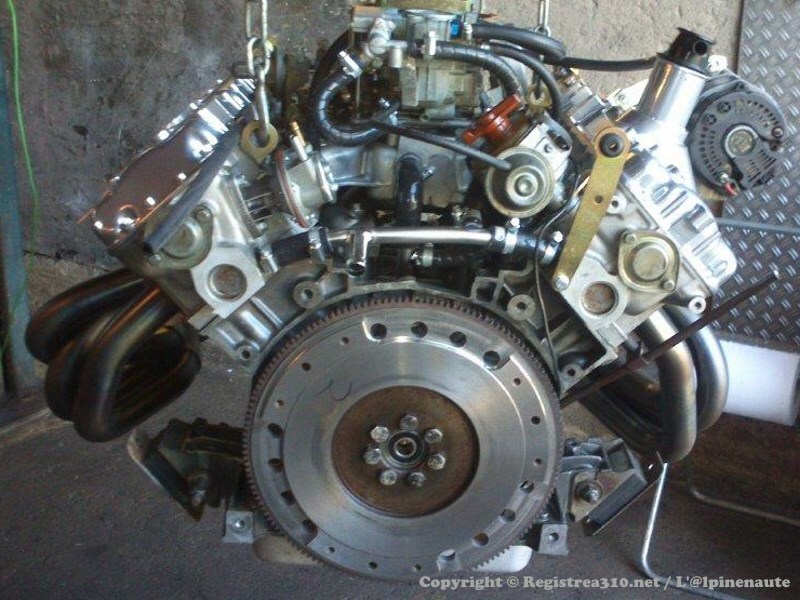 -Engine: V6 2849 cm3 from a 505V6 198 hp at 5900 rev / min and 275 Nm at 4500 r / min. 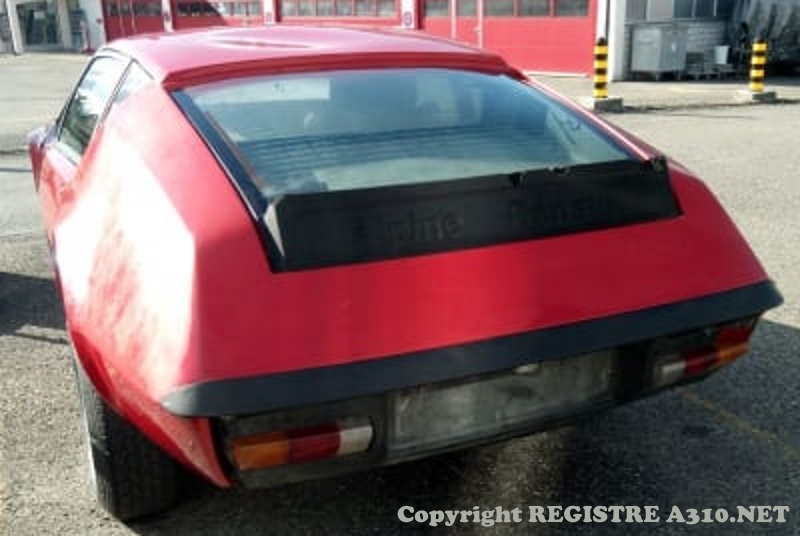 VAE0001722 2700VAA 25.04.1984 723 Red Tolède Origin Germany. 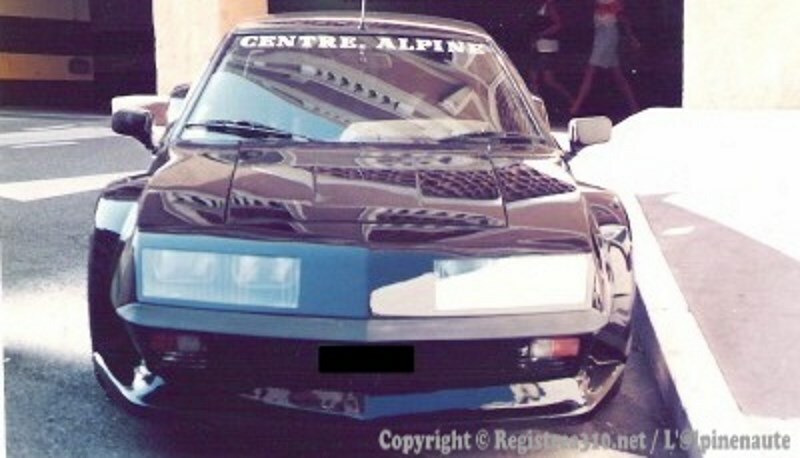 Back in France in the 90s. 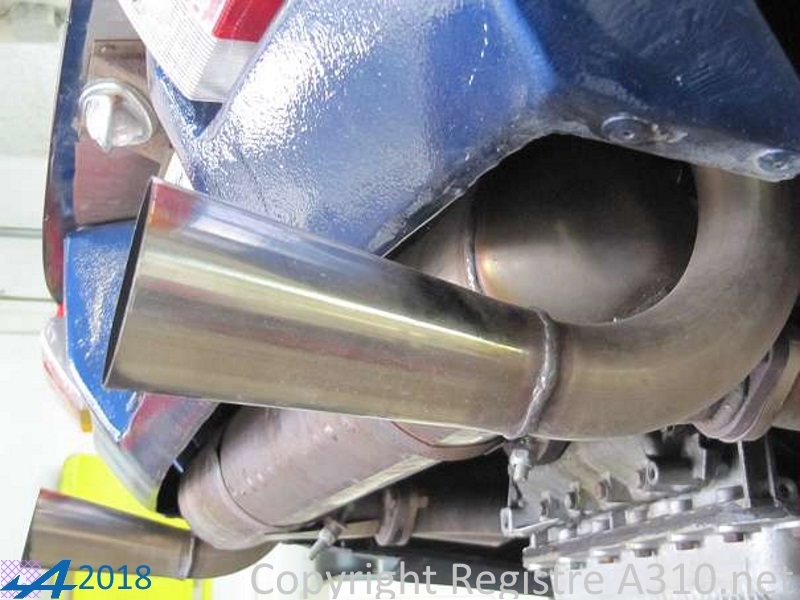 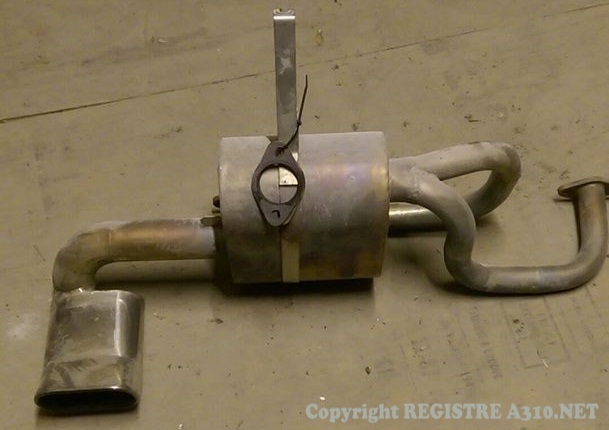 Stainless muffler "Valendru"
VAF0000368 2700VA ??.? 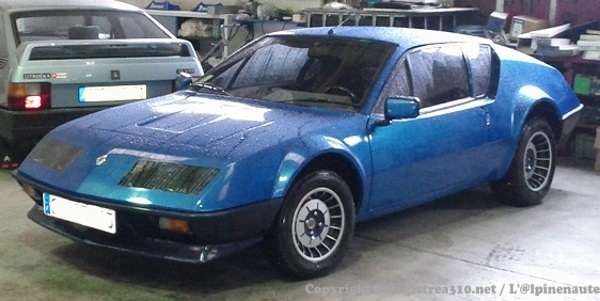 ?.1985 Silver Factory Air Conditioning, Tinted Windows. 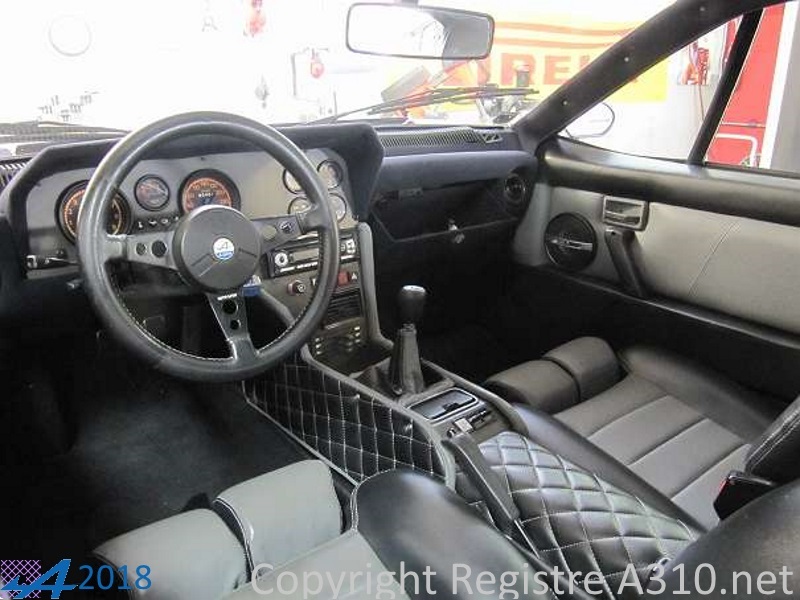 Delivered from new with a dealer specific ‘sport’ option (PLS Le Mans wheels and deck spoiler) and a black leather interior as a change to the factory interior. 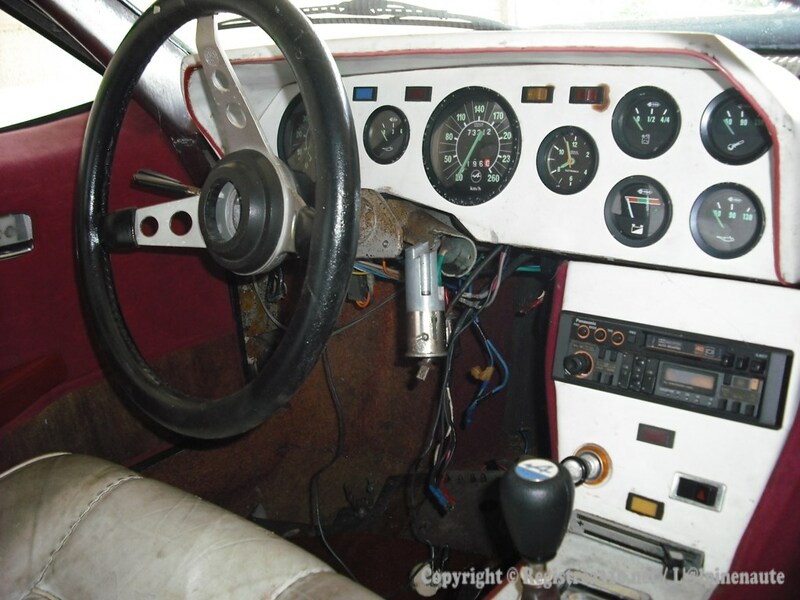 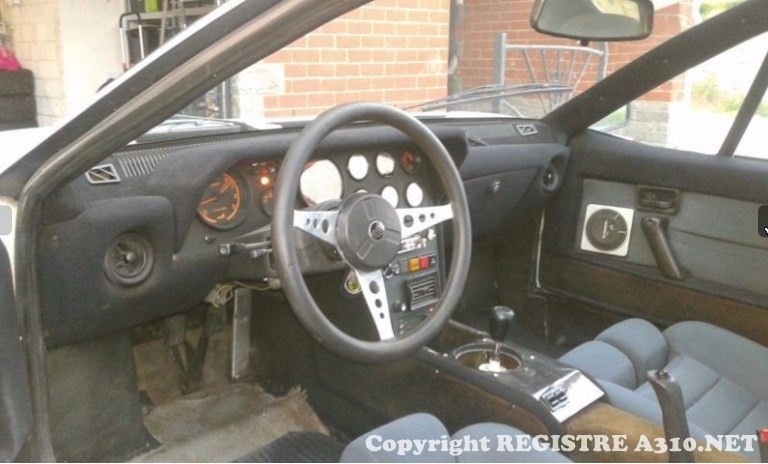 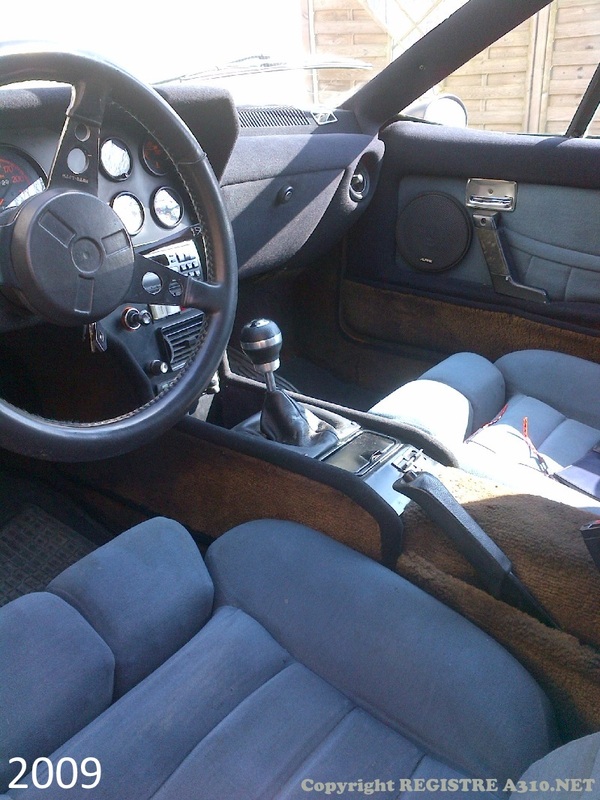 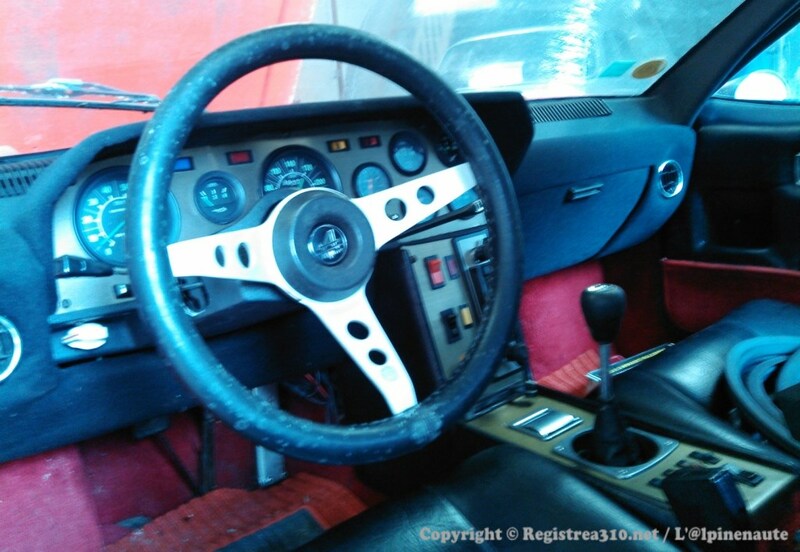 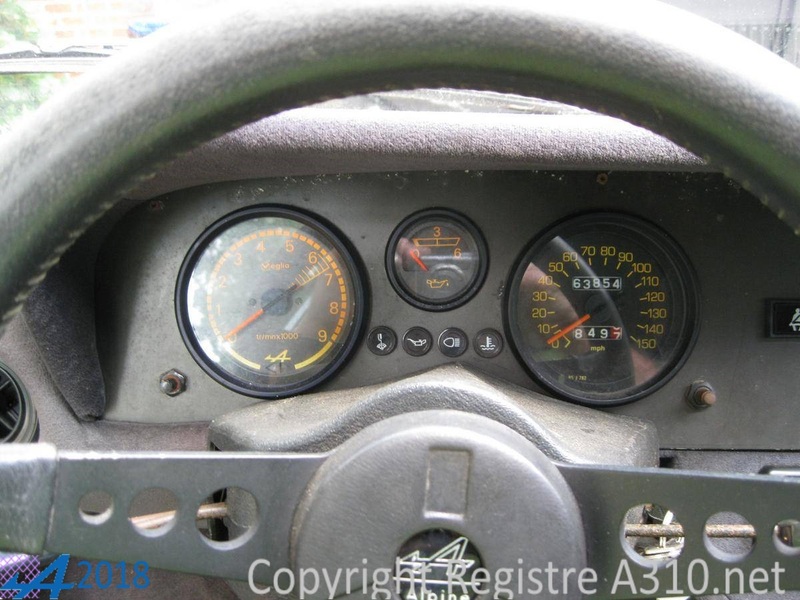 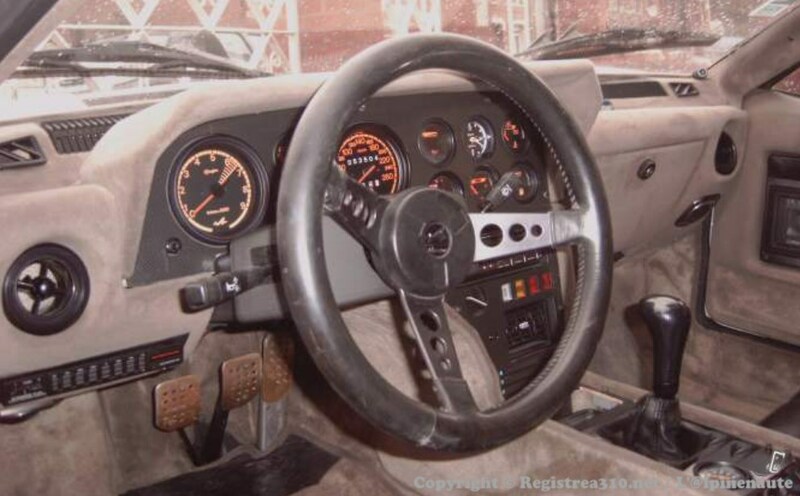 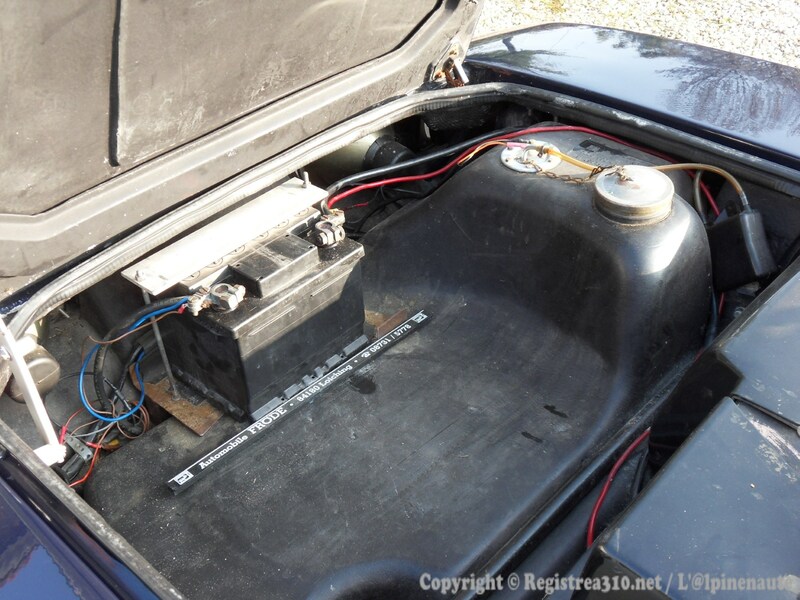 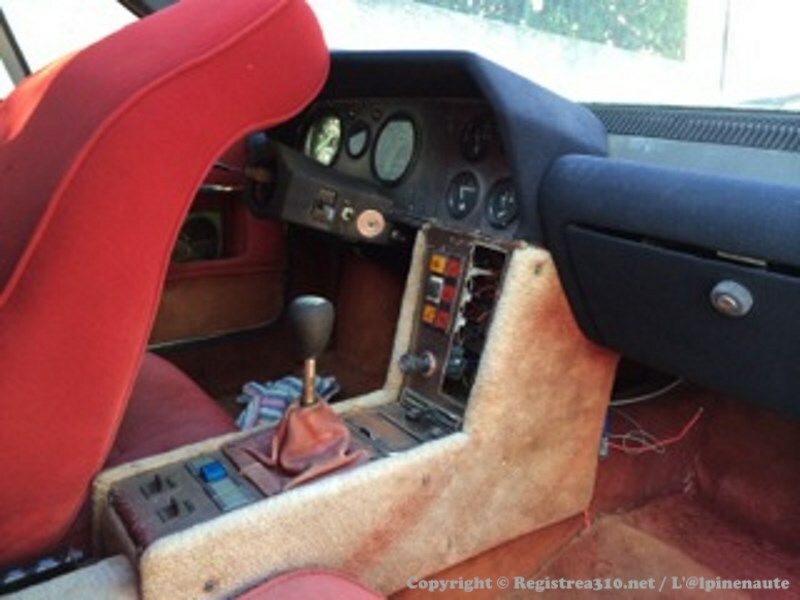 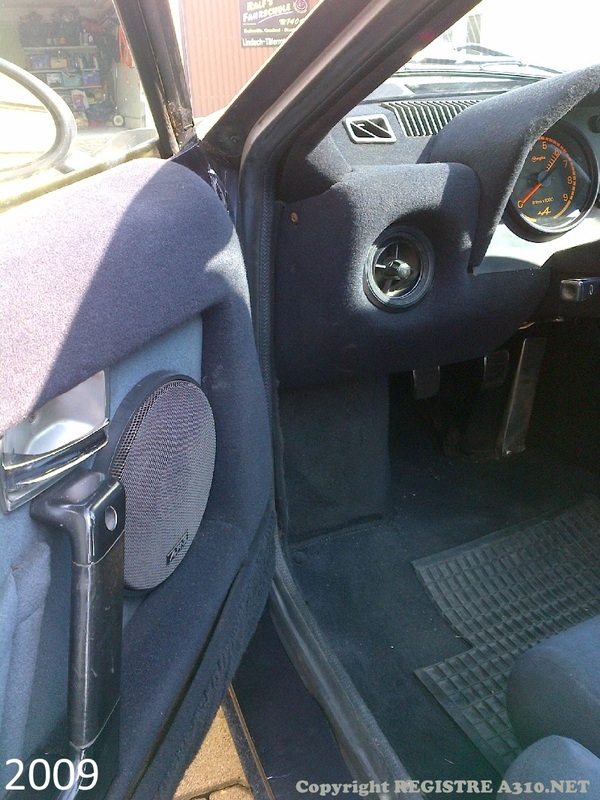 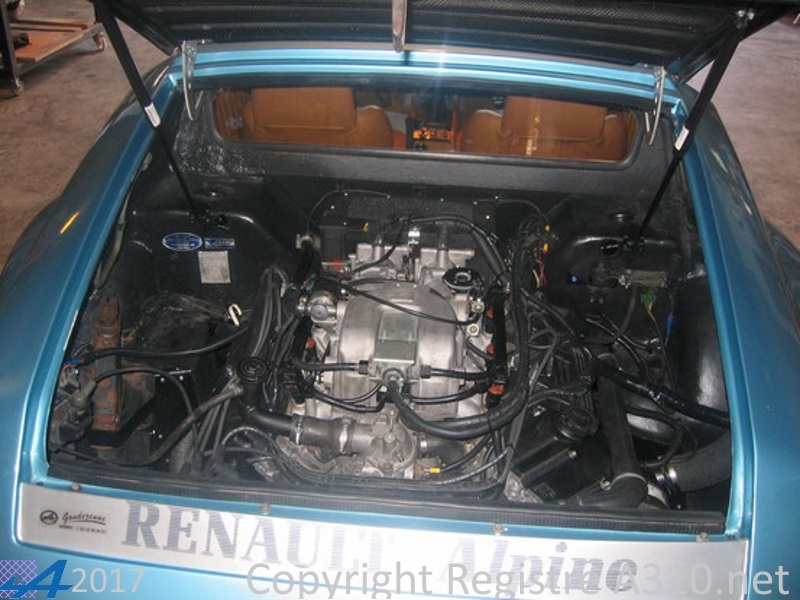 Car was fully restored in 2012 after standing for many years, only 66000km since new. 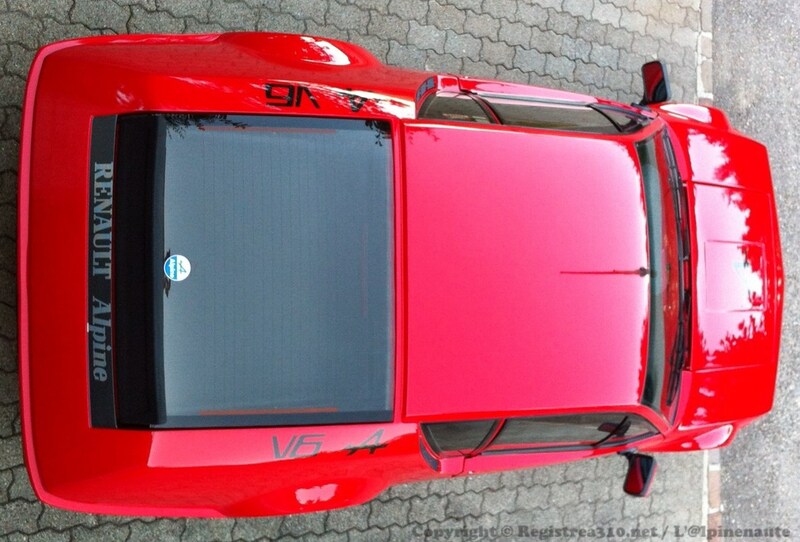 Fitted standard Pack GT rear window and spoiler. 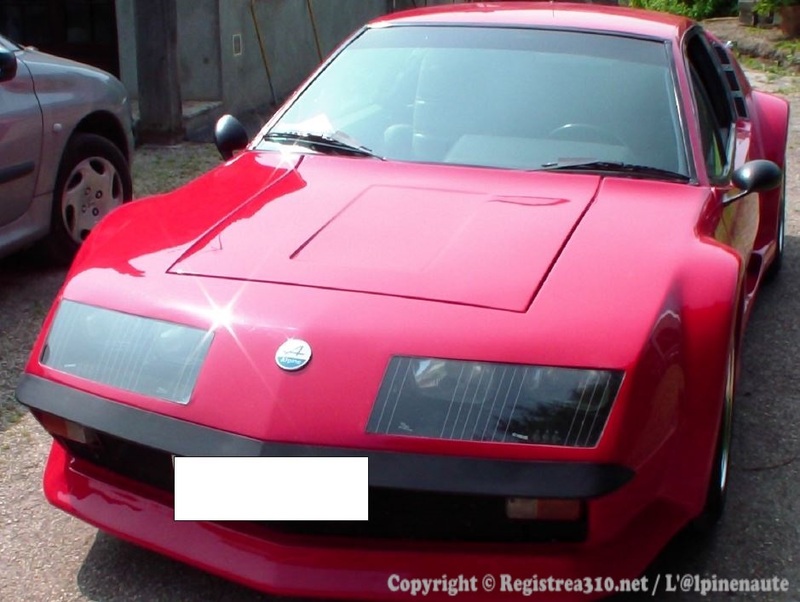 The photos on this site belong to their respective authors, any reproduction without permission is prohibited.